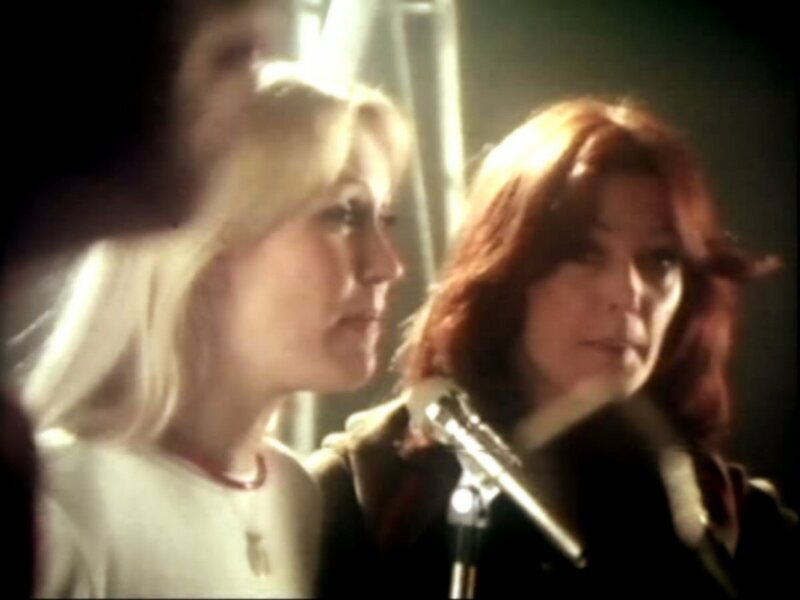 ABBA went to Great Britain on January 11th, and made an appearance in the most important pop show in Britain "Top of The Pops". 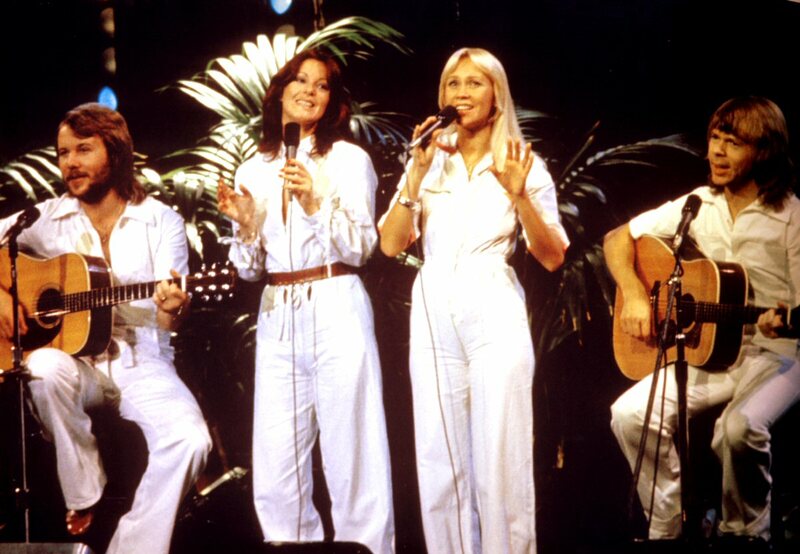 The group performed "Mamma Mia" live. 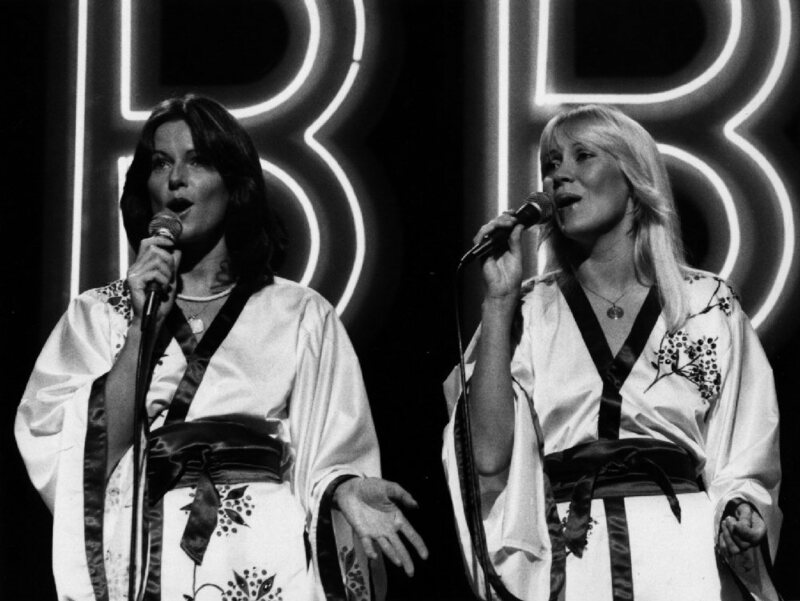 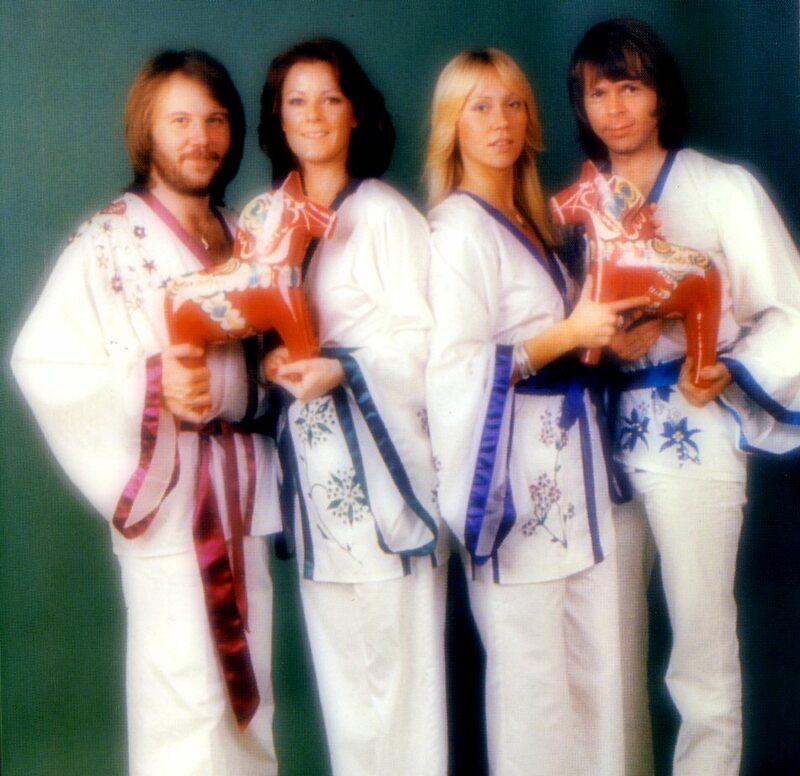 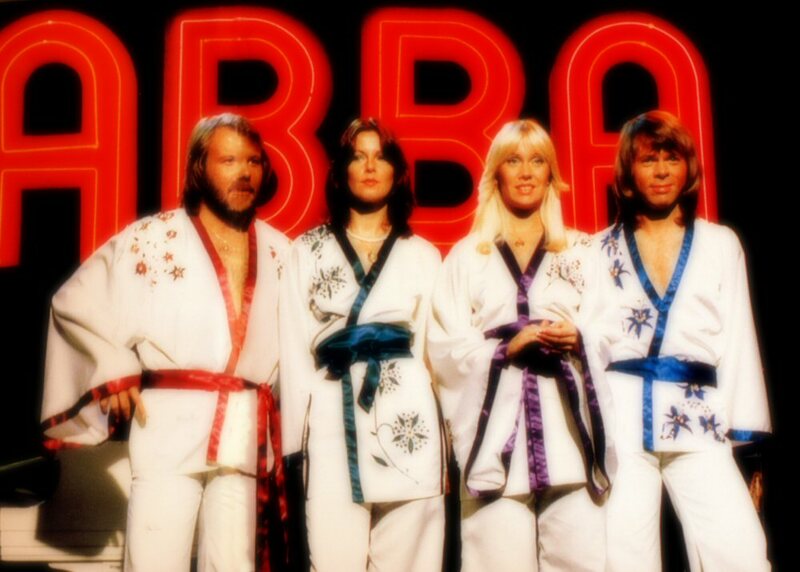 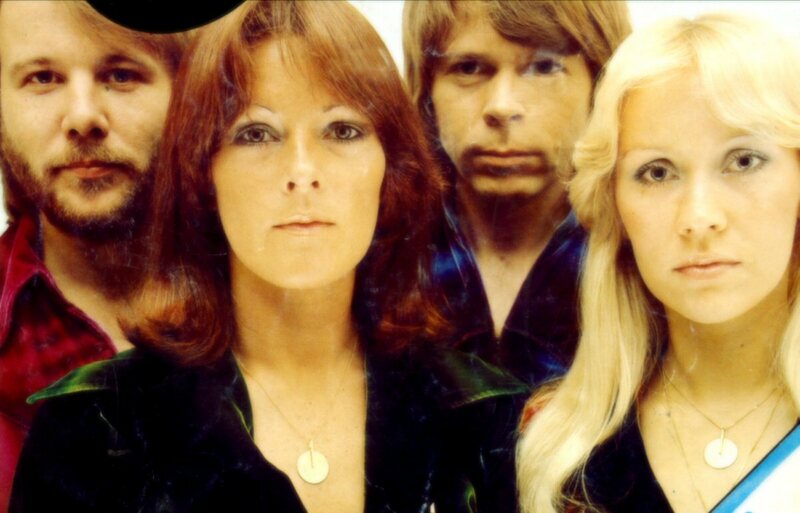 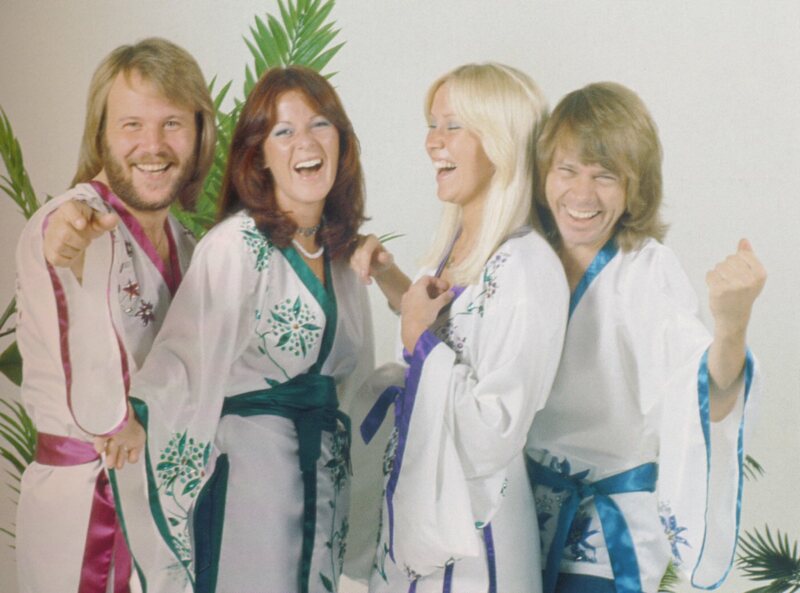 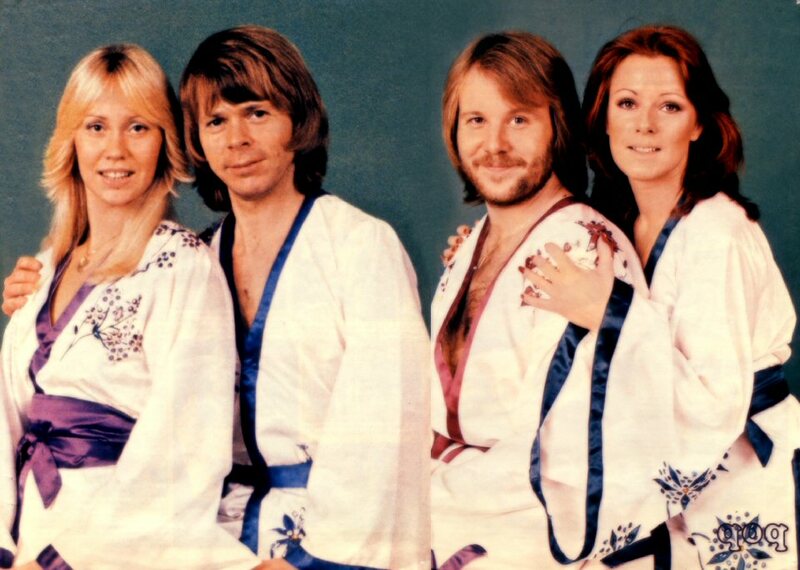 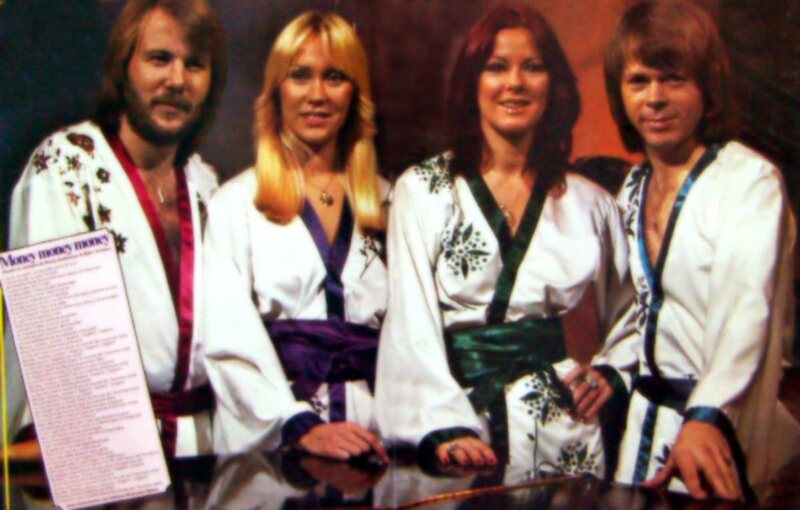 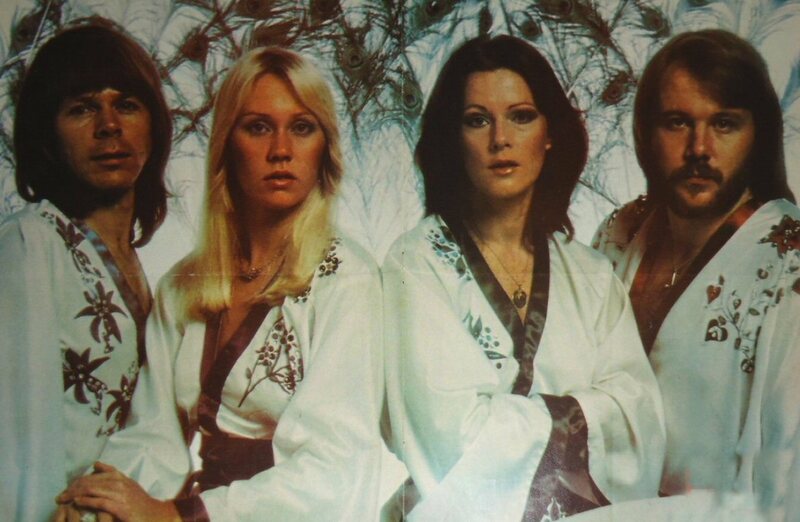 The "Discomate" label managed to help ABBA get right to the top in Japan. 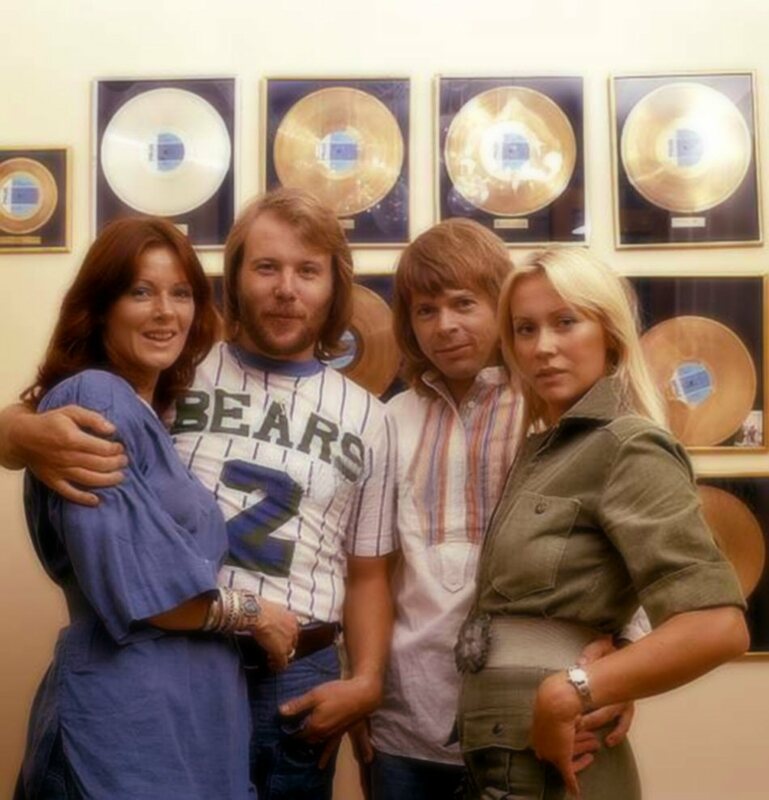 In fact Discomate didn't release ABBA's records until they were already fairly well known as another company in Japan was first to have the rights. 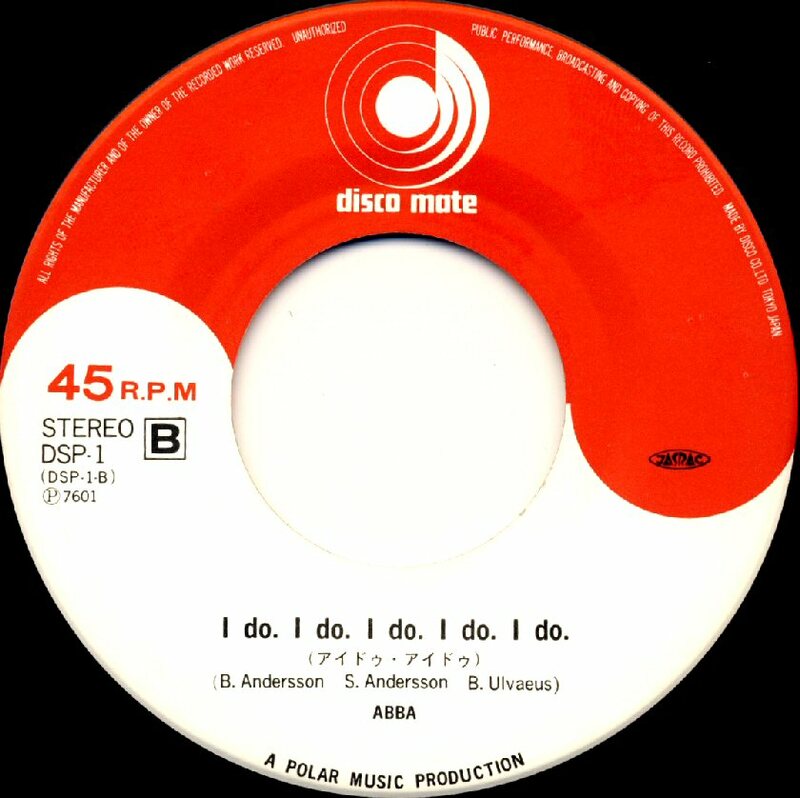 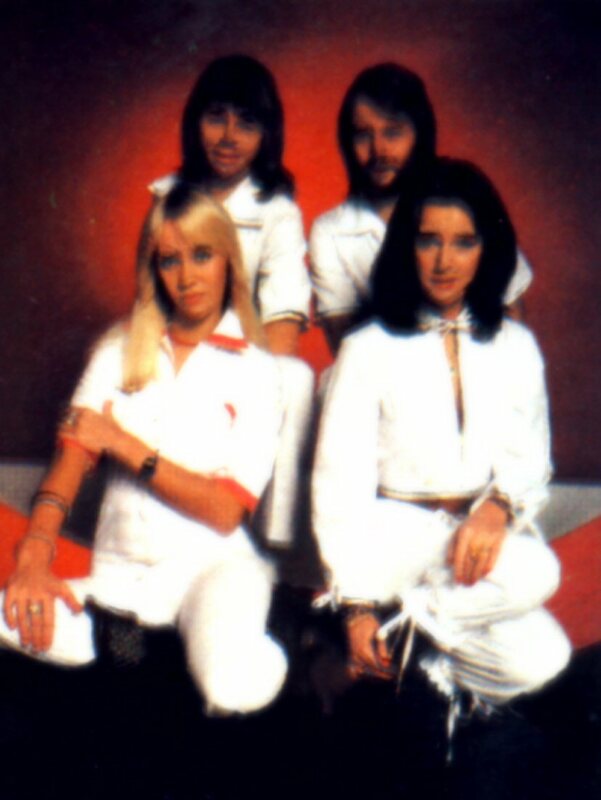 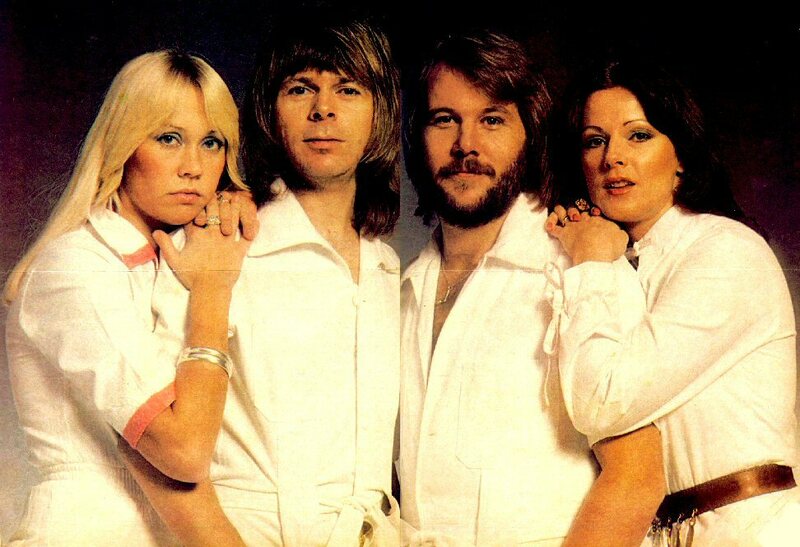 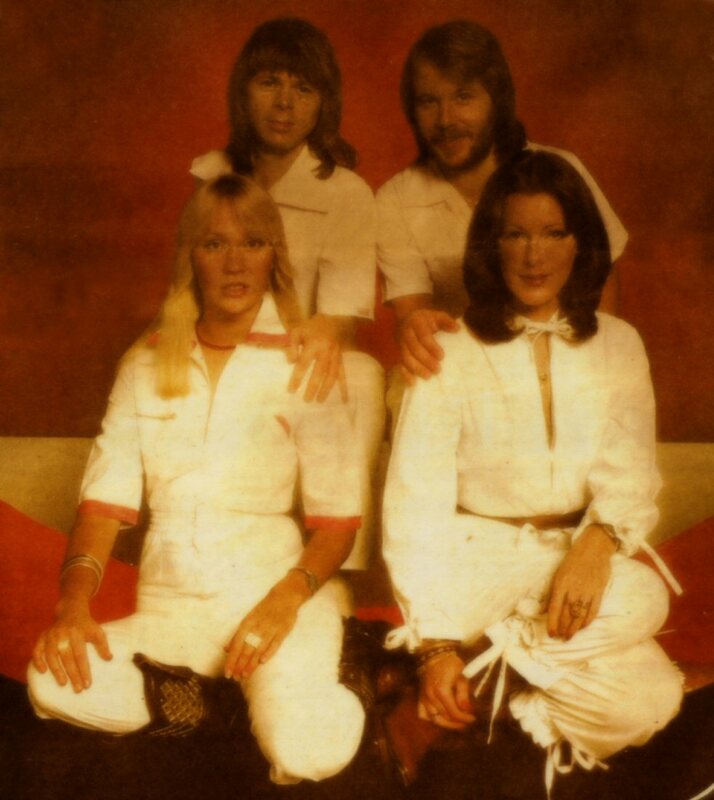 The very first ABBA single released by Discomate was "SOS" b/w "I Do I Do I Do I Do I Do" in January 1976. 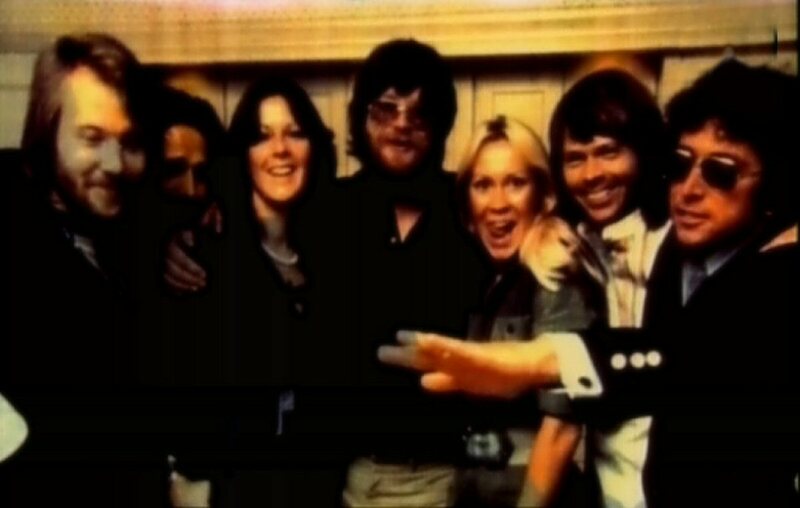 This session was taken either at the end of 1975 or at the beginning of 1976. 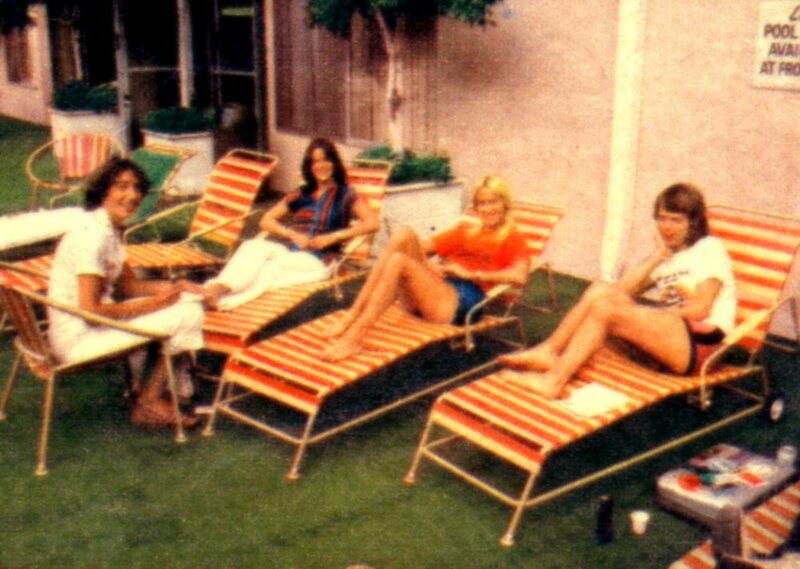 Very nice and calm session in non-dominating yellowish colors. 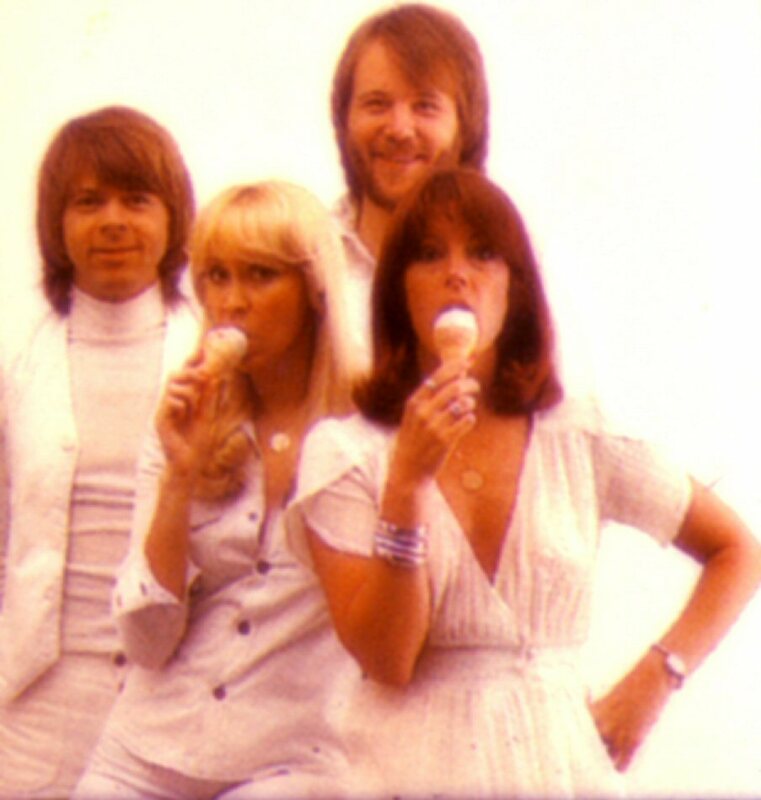 Alternative takes featured Agnetha and Frida with ice-cream. 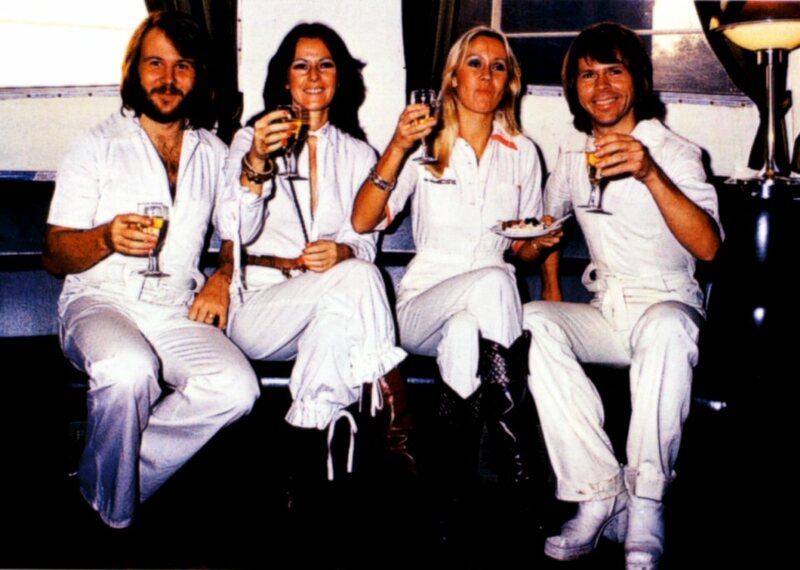 At the end of January ABBA went to Bremen in West Germany where they recorded a TV show called simply "The best of ABBA". 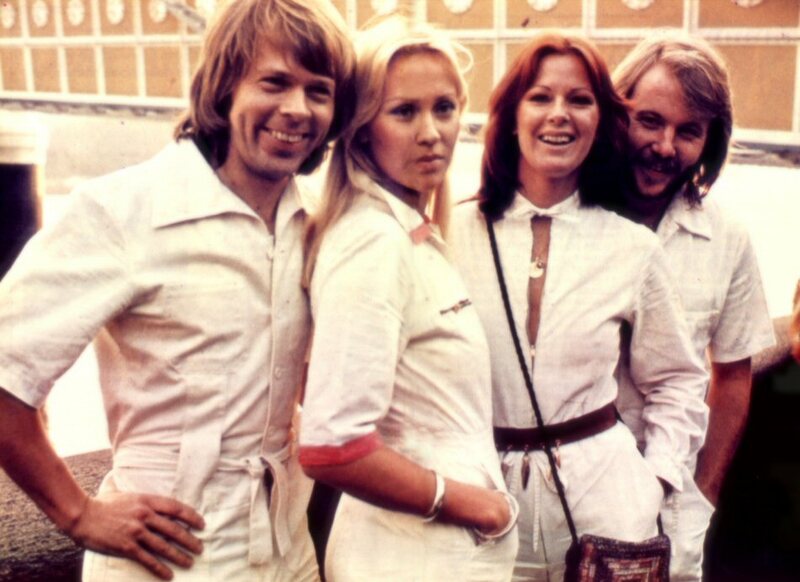 ABBA performed: Waterloo, Mamma Mia, Fernando as well as some songs from their LP "ABBA" like Tropical Loveland and I've Been Waiting For You. 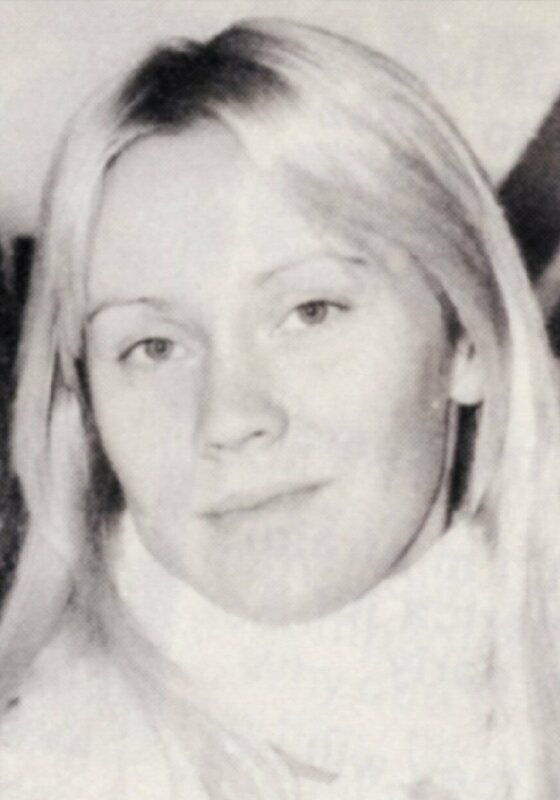 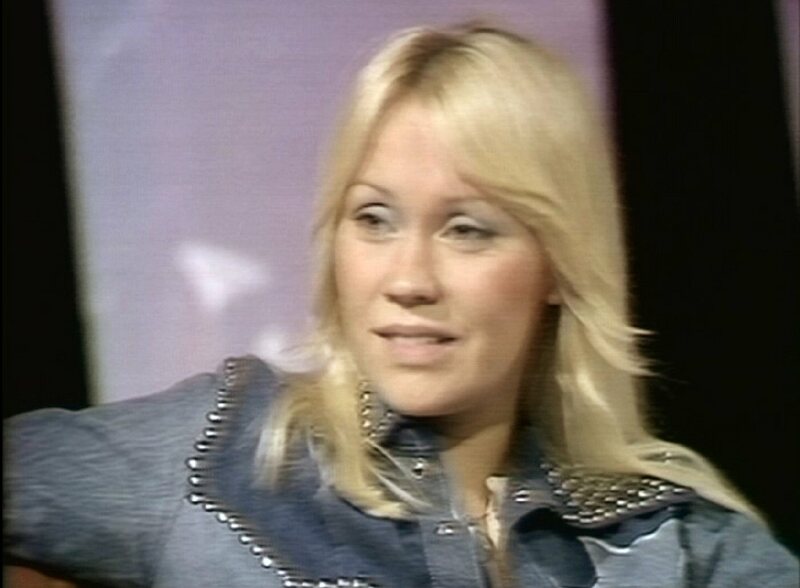 In the interview Frida said that she enjoyed being on stage, Agnetha was more fond of being in the studio and "sometimes on stage". 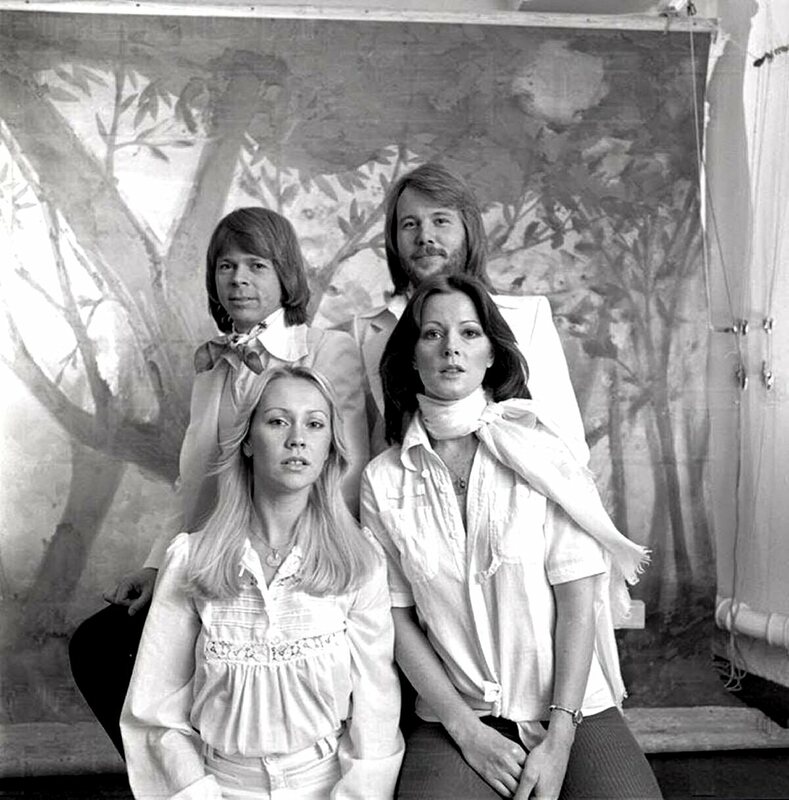 During the recording of the show ABBA posed for photographers. 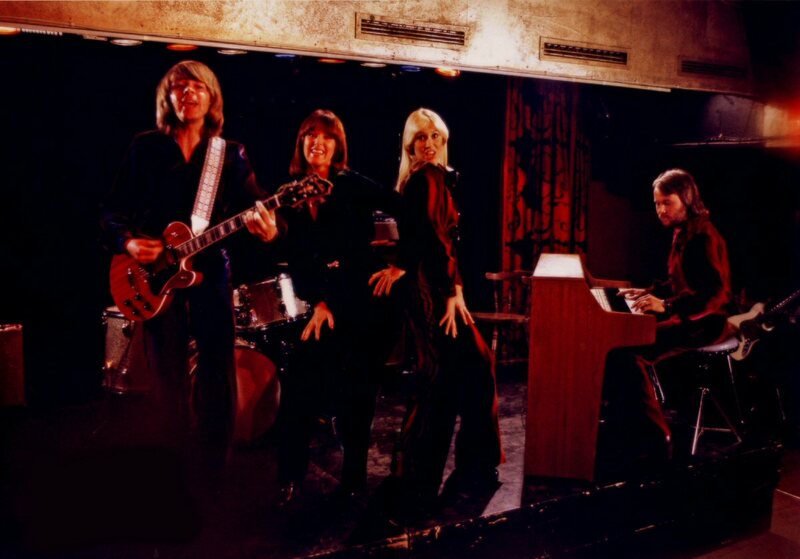 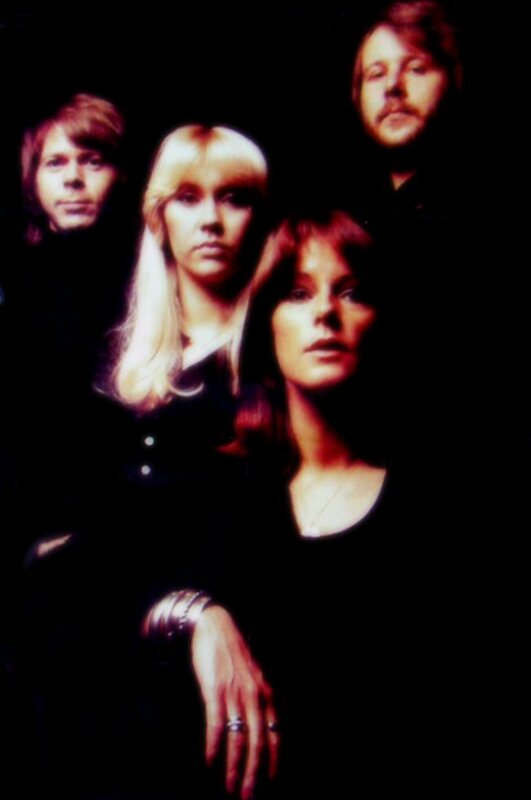 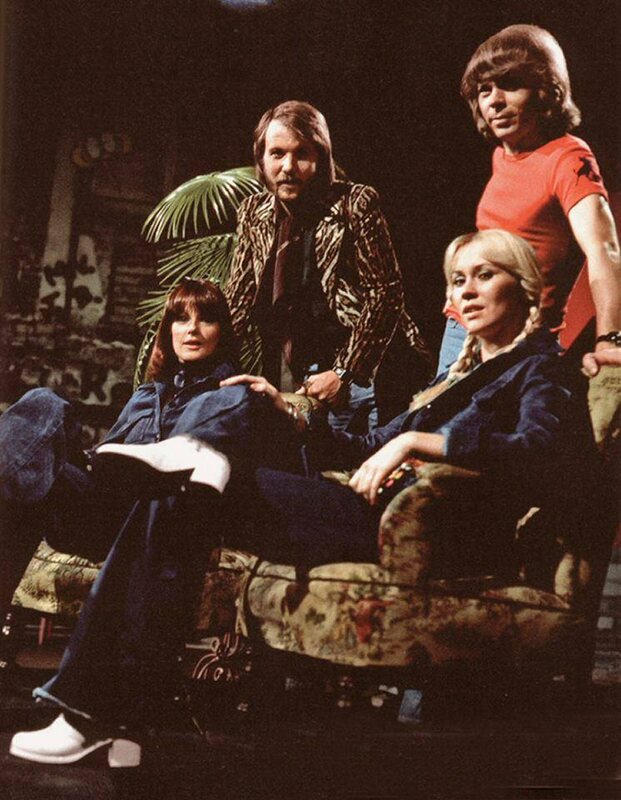 A shot from the session below was used on the cover of the German compilation LP "16 ABBA Hits". 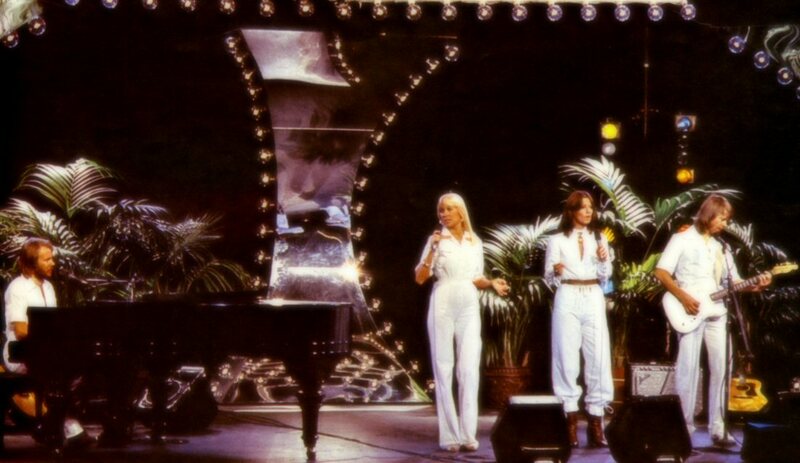 At the beginning of February video clips for "Fernando" and "Dancing Queen" were filmed. 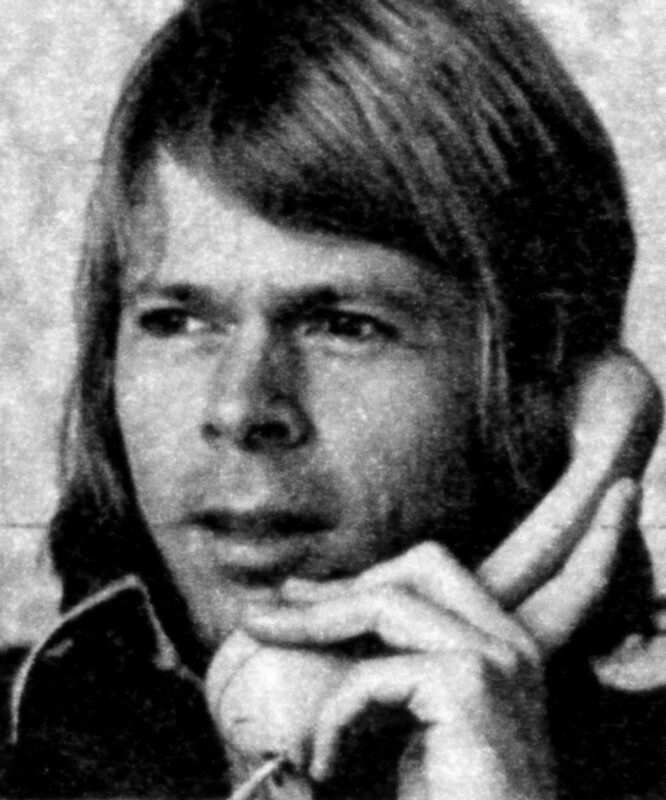 The director was as usual Lasse Hallström. 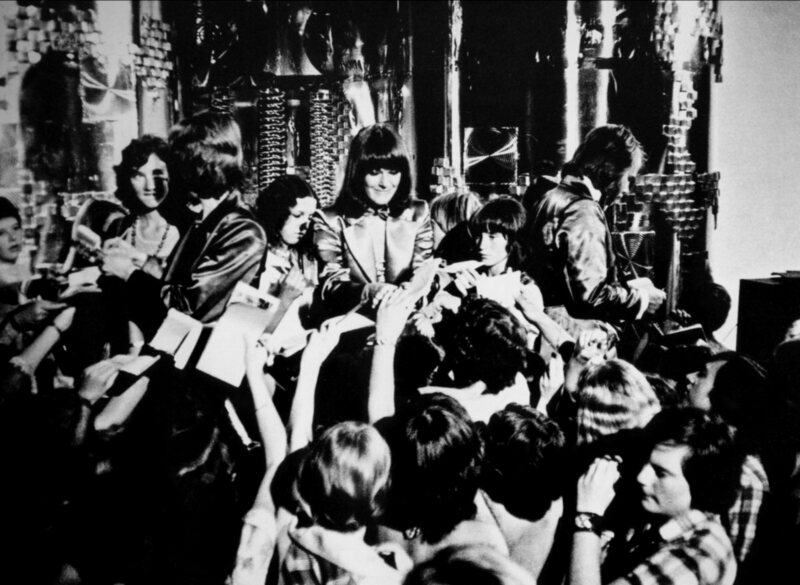 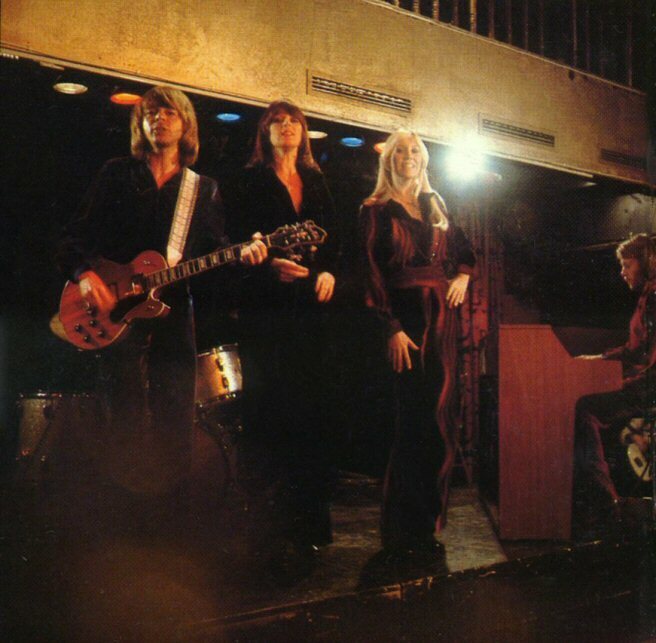 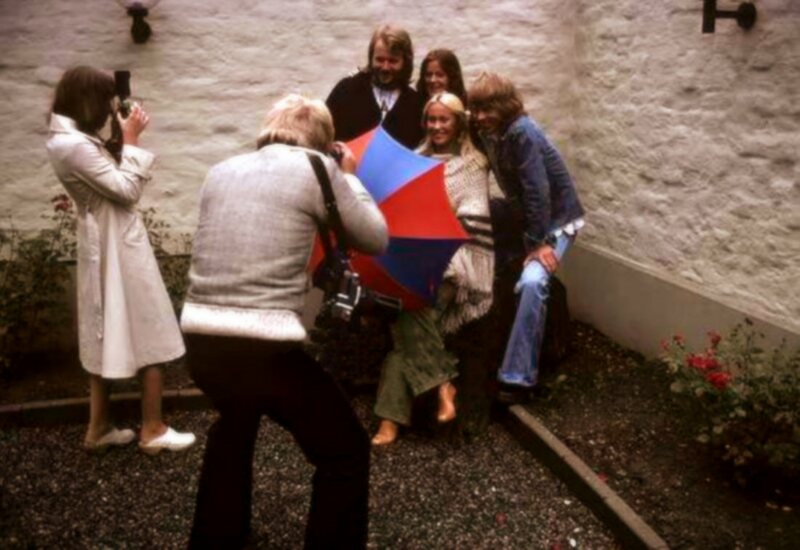 Even a photo session was arranged during the filming of the videos, the photos would be used for promotion of the group during the first part of 1976. 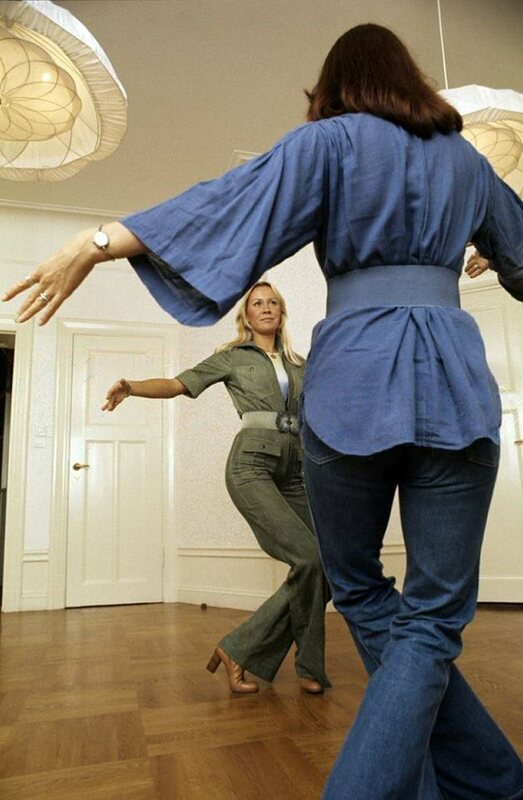 The "Dancing Queen" photo session was shot at about the same time. 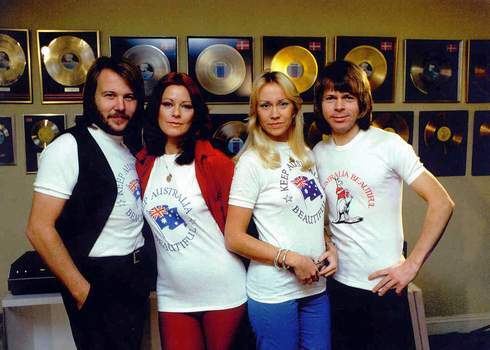 Björn, Benny and Frida were interviewed by the Australian TV for the programme "Countdown" shortly before the release of the single "Fernando" in Australia. 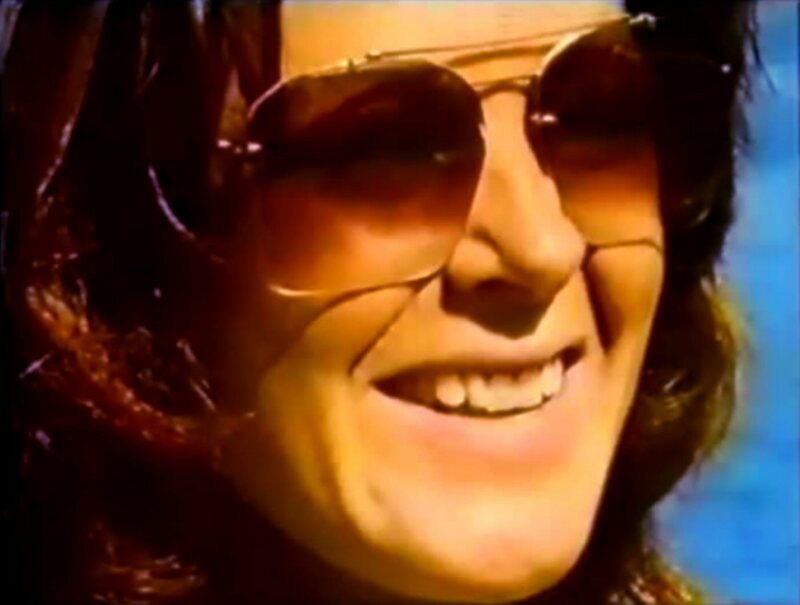 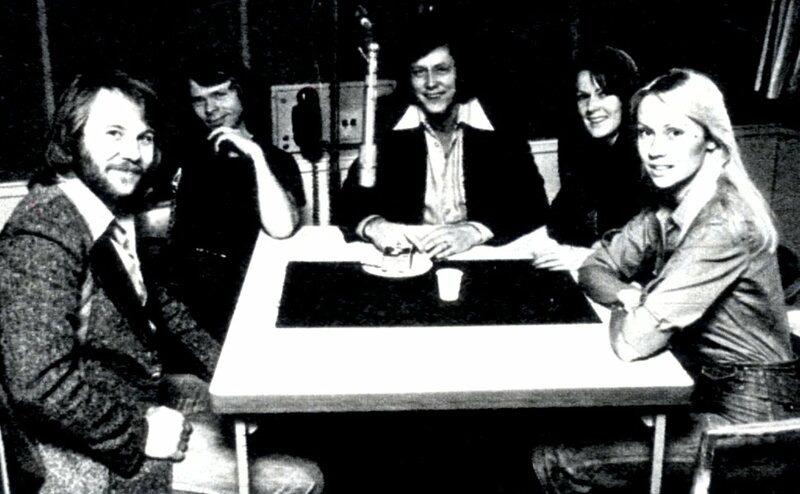 The interview was made about 3 pm on Monday February 2nd, 1976. 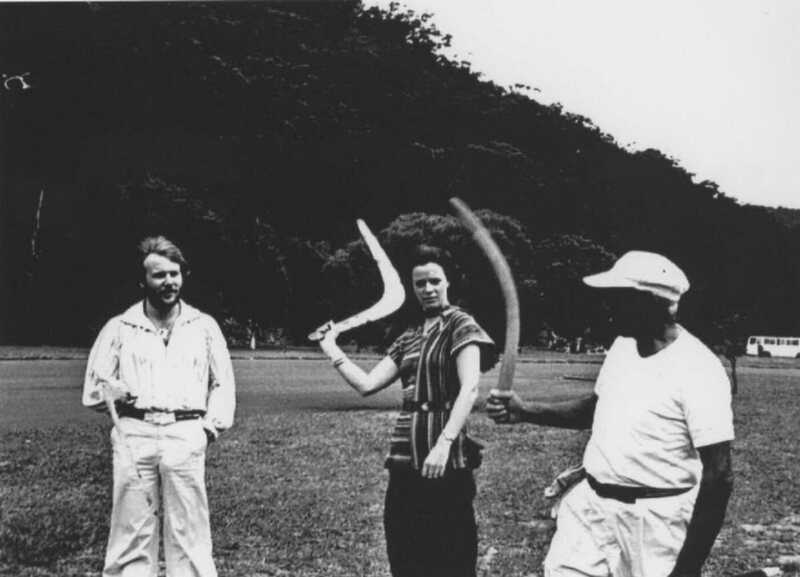 Frida was interrupted by alarm sirens. 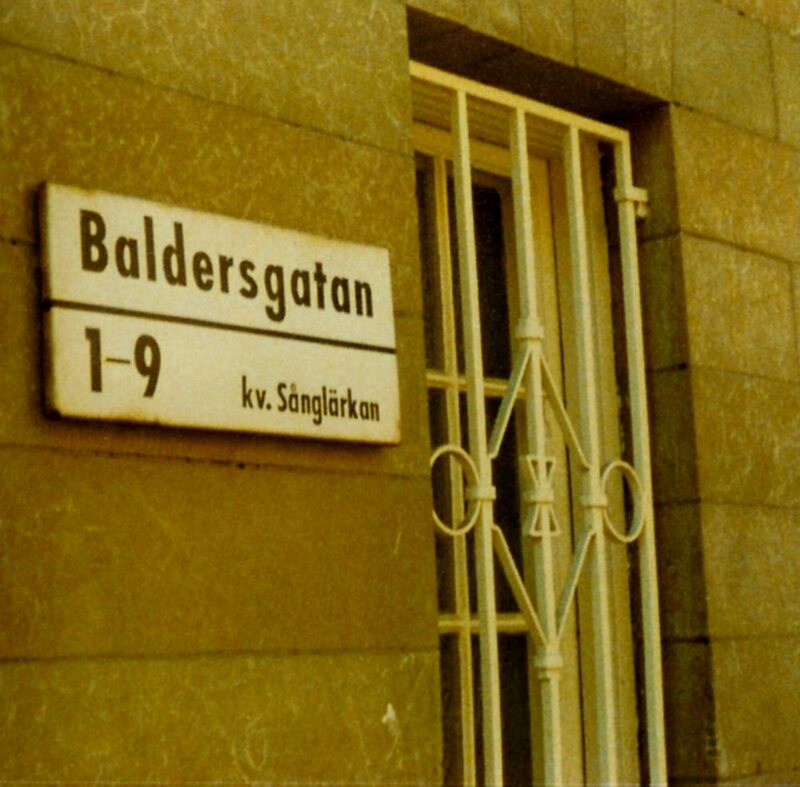 Such tests are made in Sweden the first Monday every month at 3 pm. 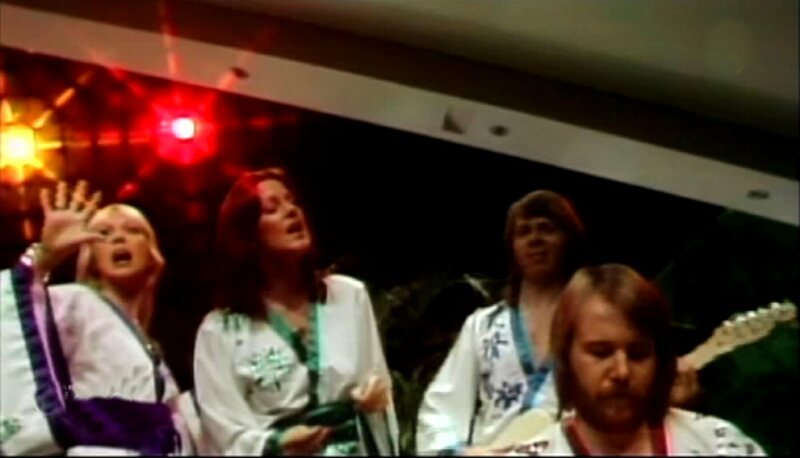 In France ABBA performed live in the show "Systeme 2" broadcasted from Monte Carlo on February 22nd, 1976. 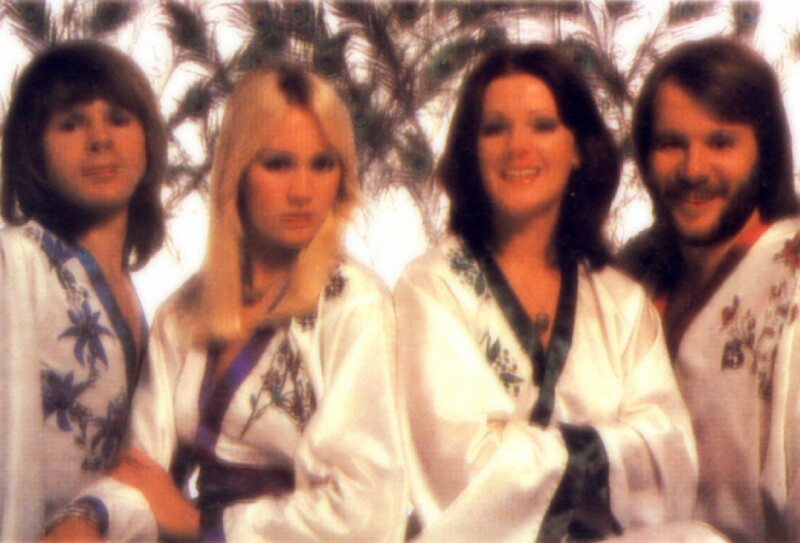 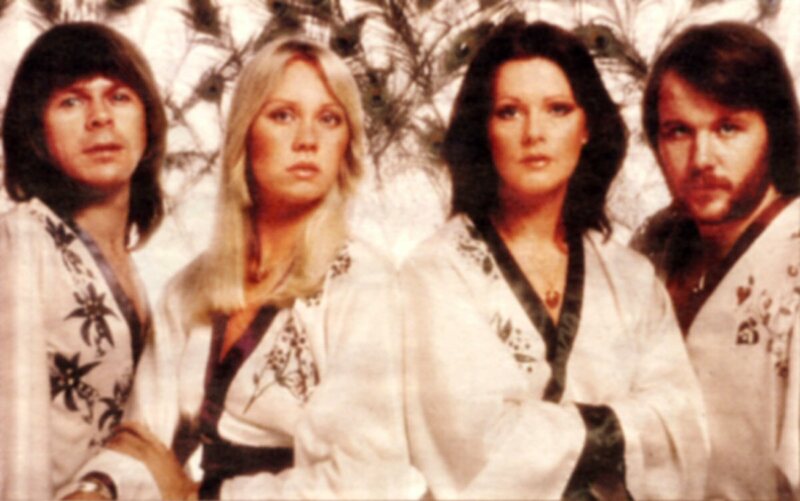 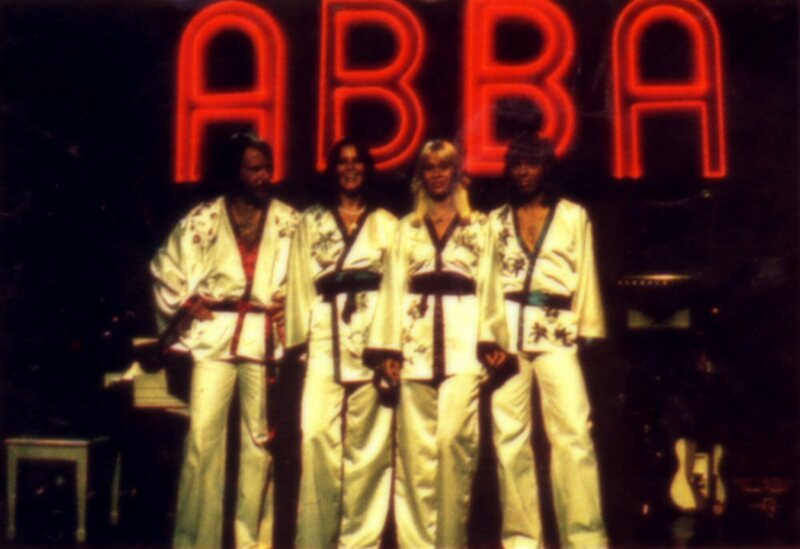 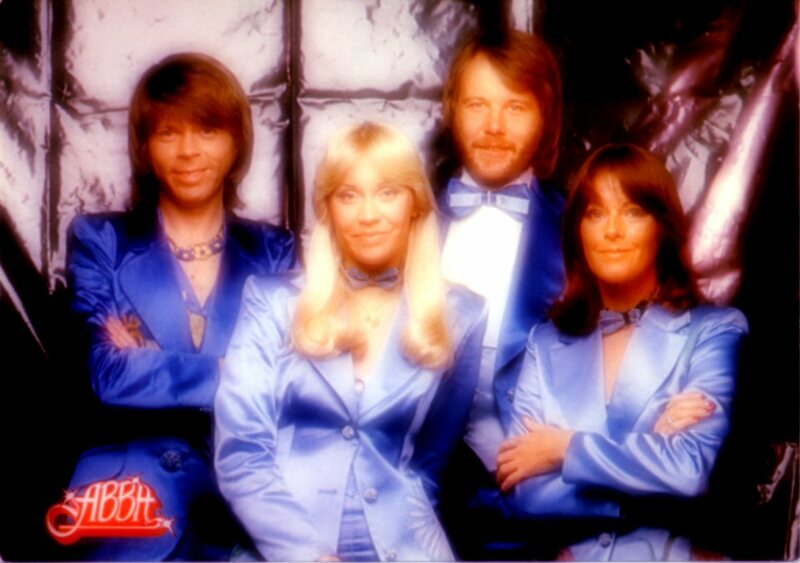 ABBA appeared even in the show "Midi-Premiere" which was recorded on February 24th, 1976. 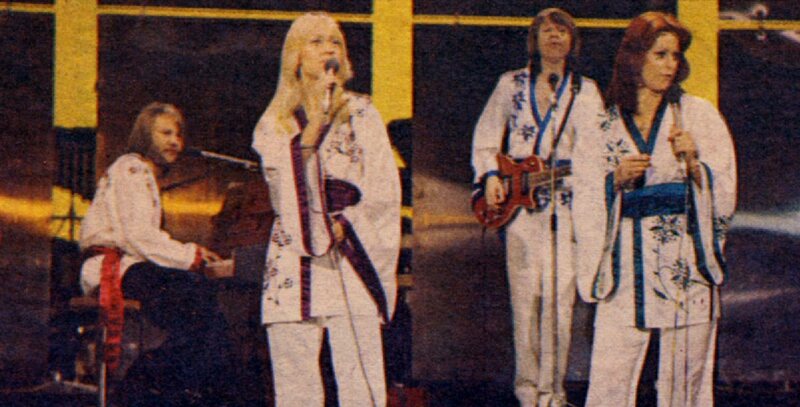 ABBA performed "Mamma Mia" in German TV special "Disco" on February 28th, 1976. 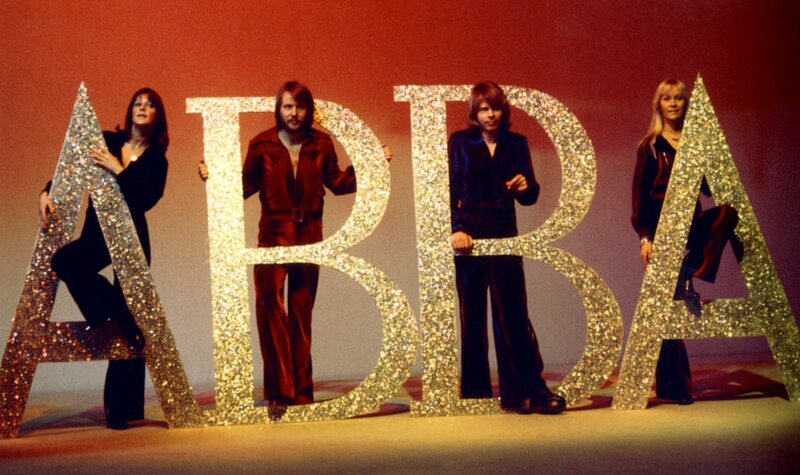 During the photo session arranged by German photographer Bubbi Heilemann on February 28th, the group was playing with the letters of their name and Benny swung his B through 180 degrees. 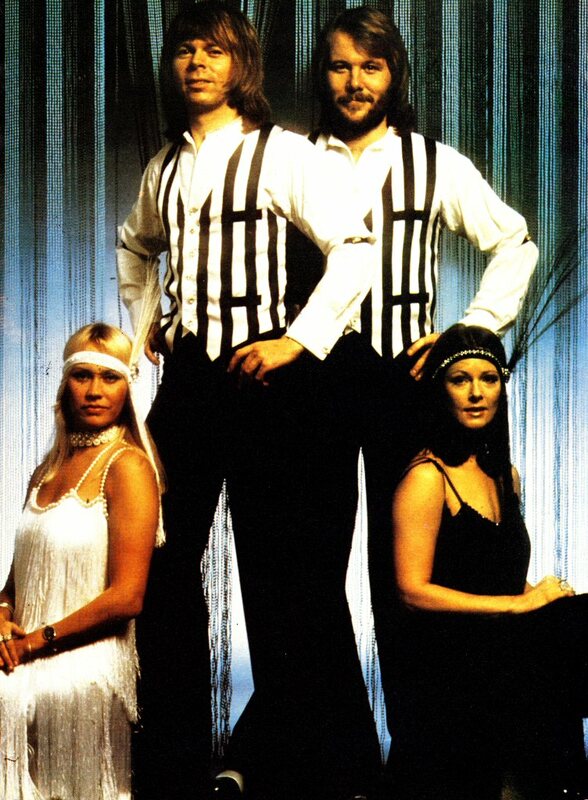 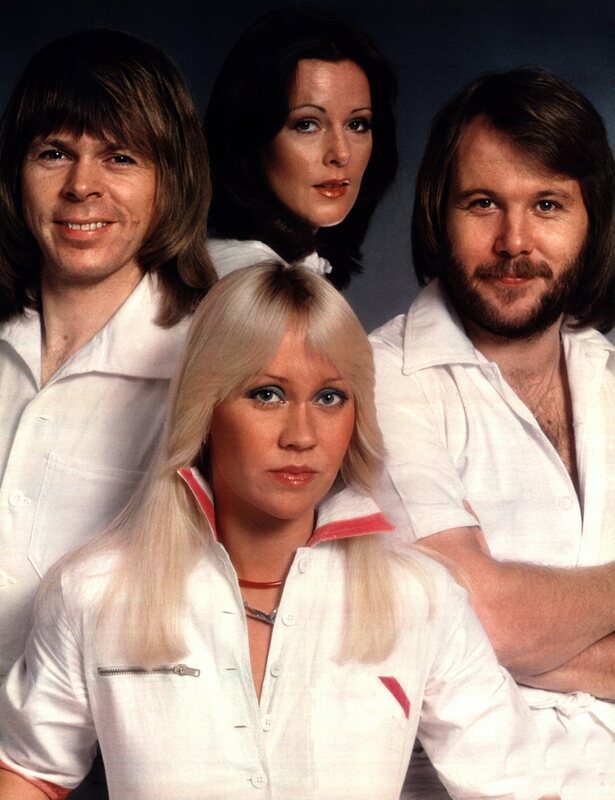 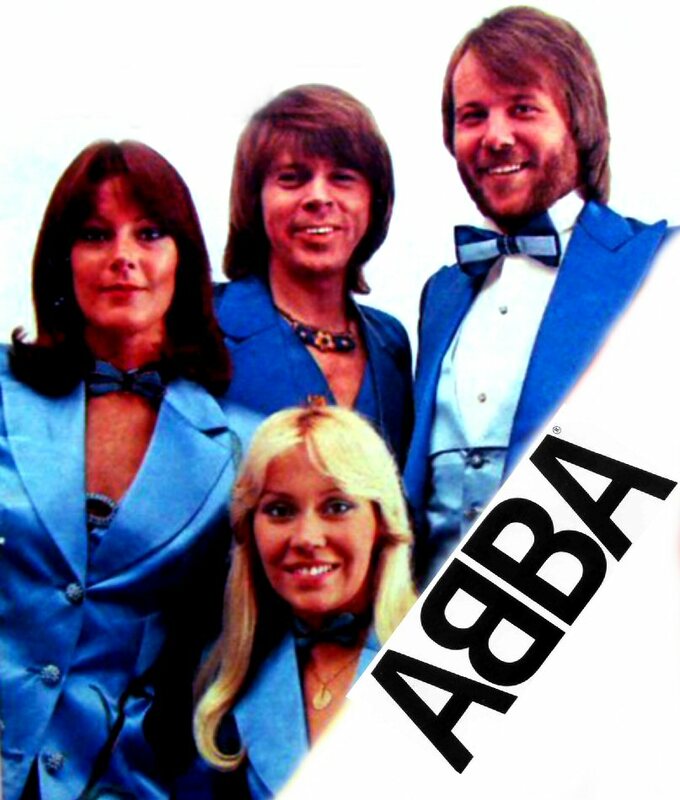 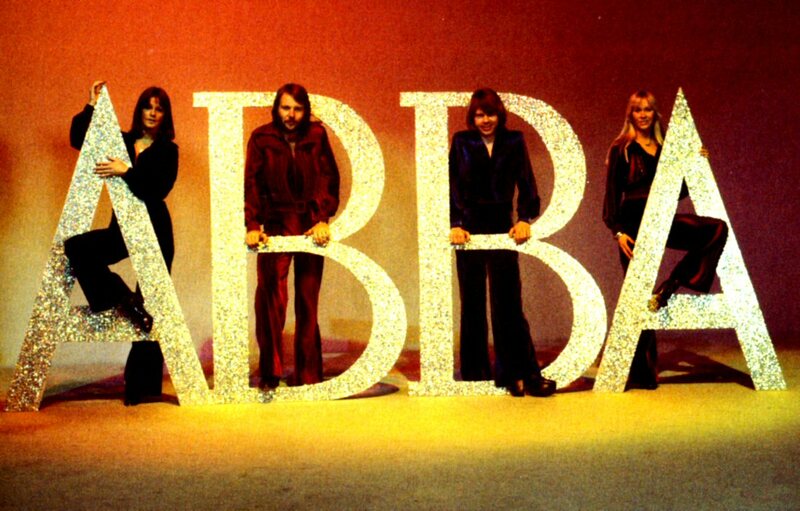 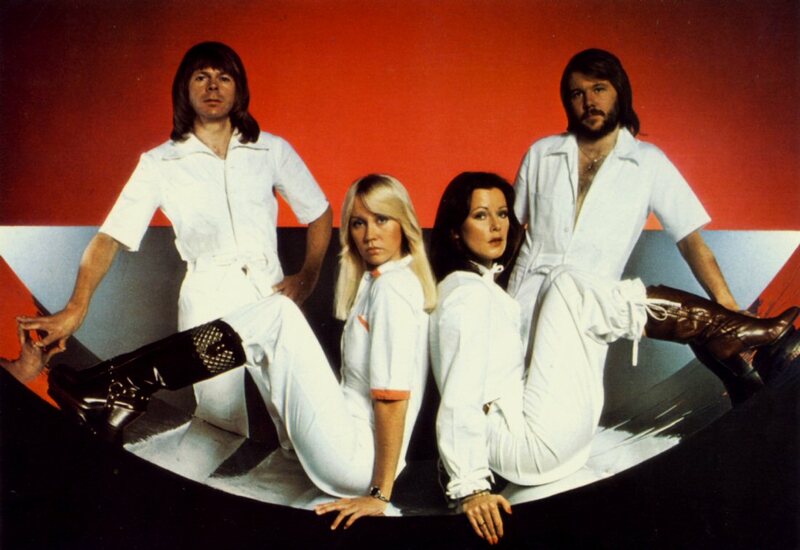 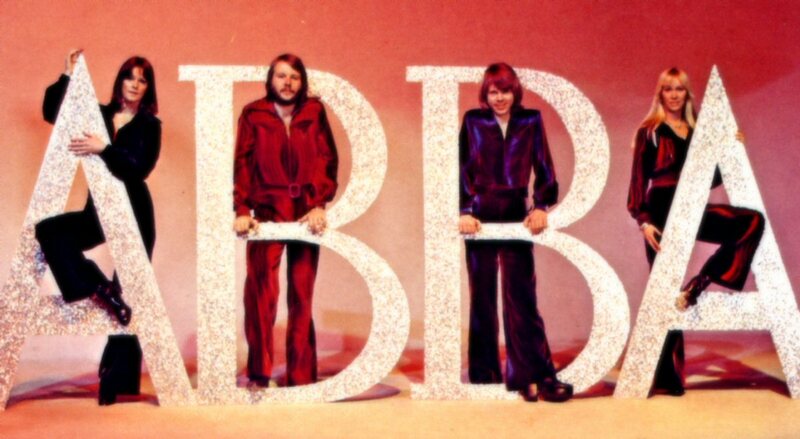 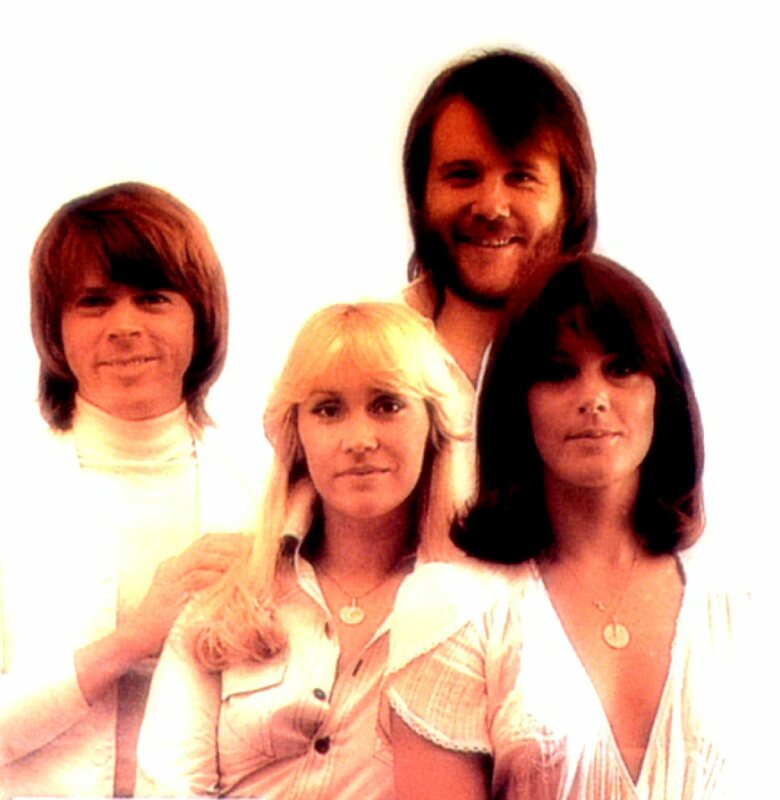 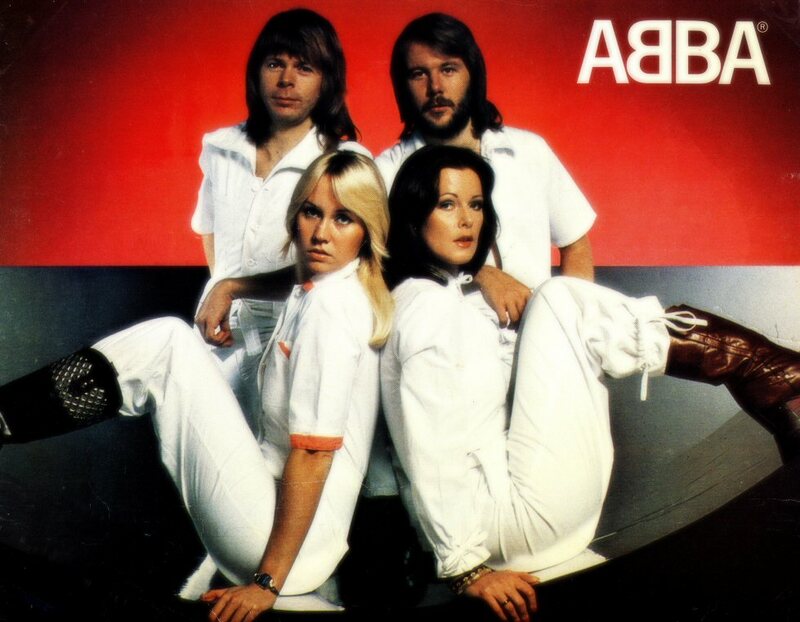 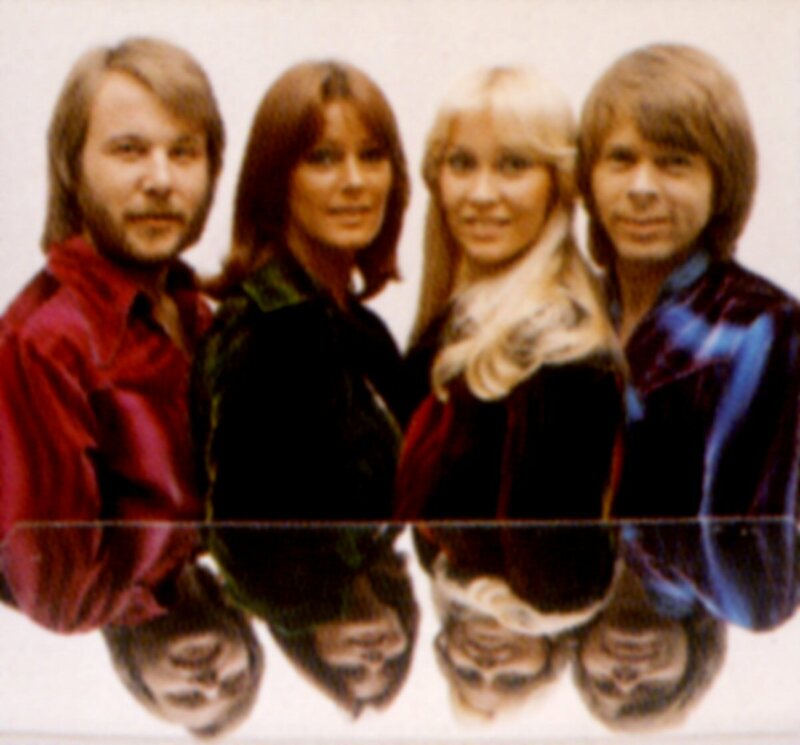 The official ABBA logo med inverted B was created in July 1976 Rune Söderqvist. 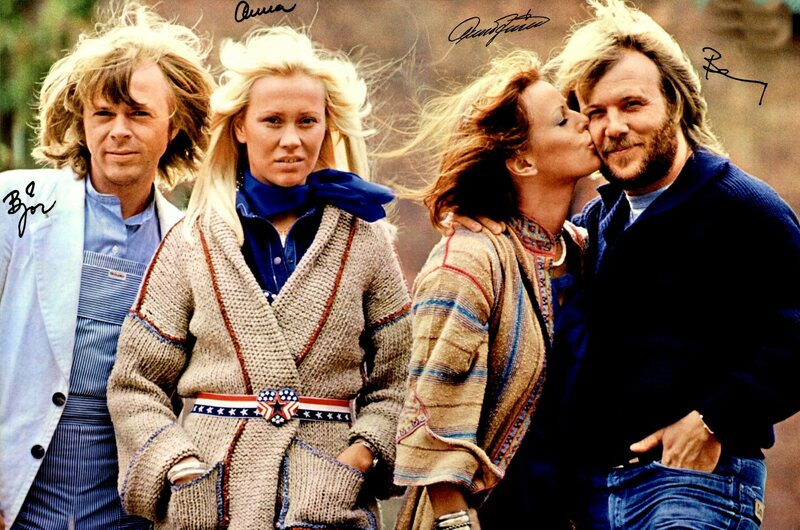 Due to the big success of ABBA Polar re-released their second album in Denmark in 1976. 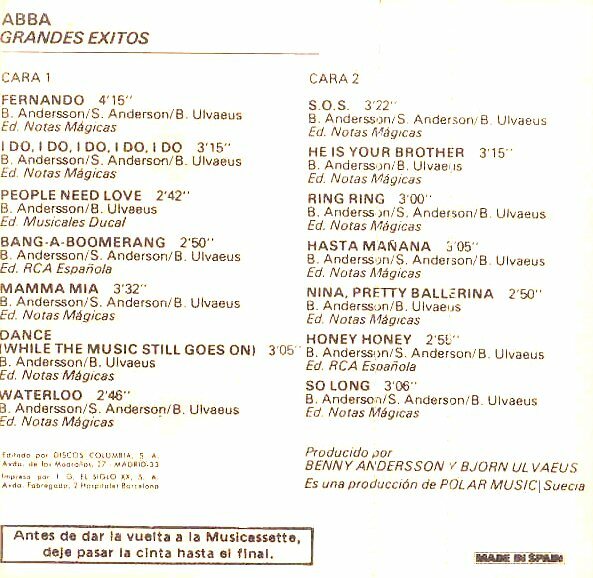 The front cover was slightly changed and featured printed box with information that the LP contained a o "Honey Honey", "Hasta Mañana" and "Dance". 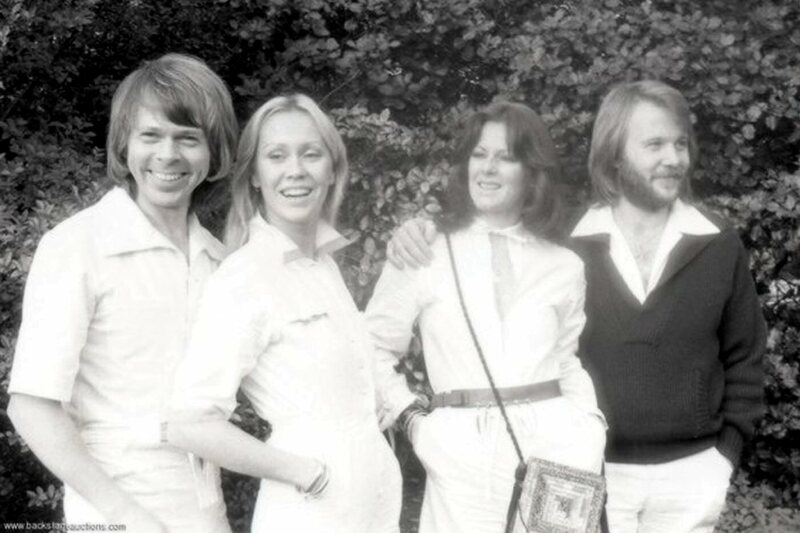 A new Danish compilation album in the series "For fuld musik" released at the beginning of 1976 featured ABBA's "SOS" and "Moviestar" performed by Harpo with Frida on backing vocals. 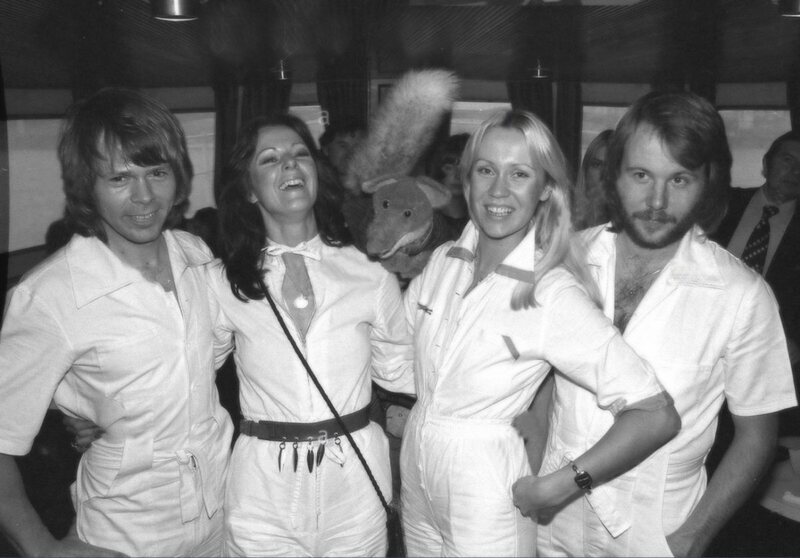 Frida and Benny attended the premiere of the first Swedish own drag show performed by the group "After Dark" at the night club Alexandra. 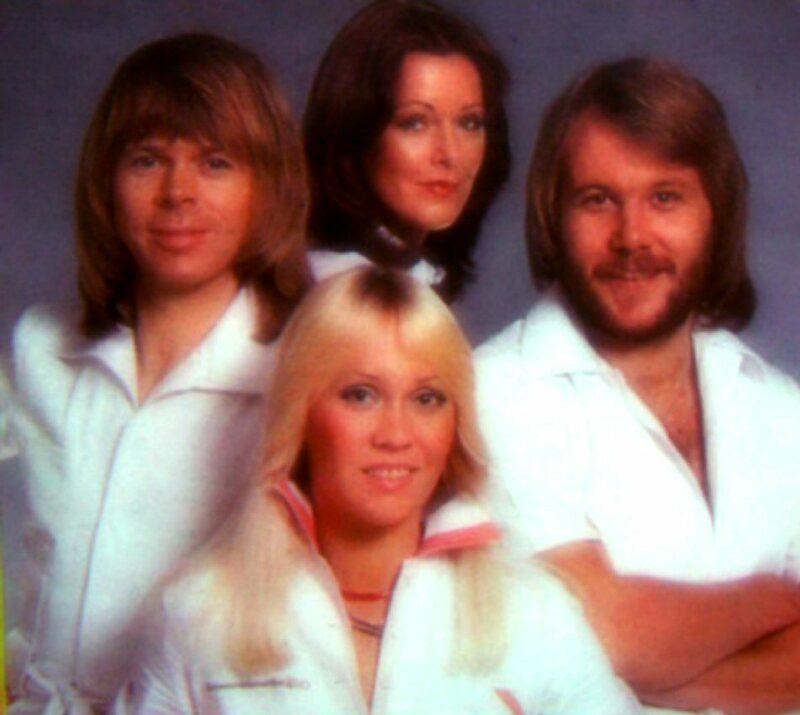 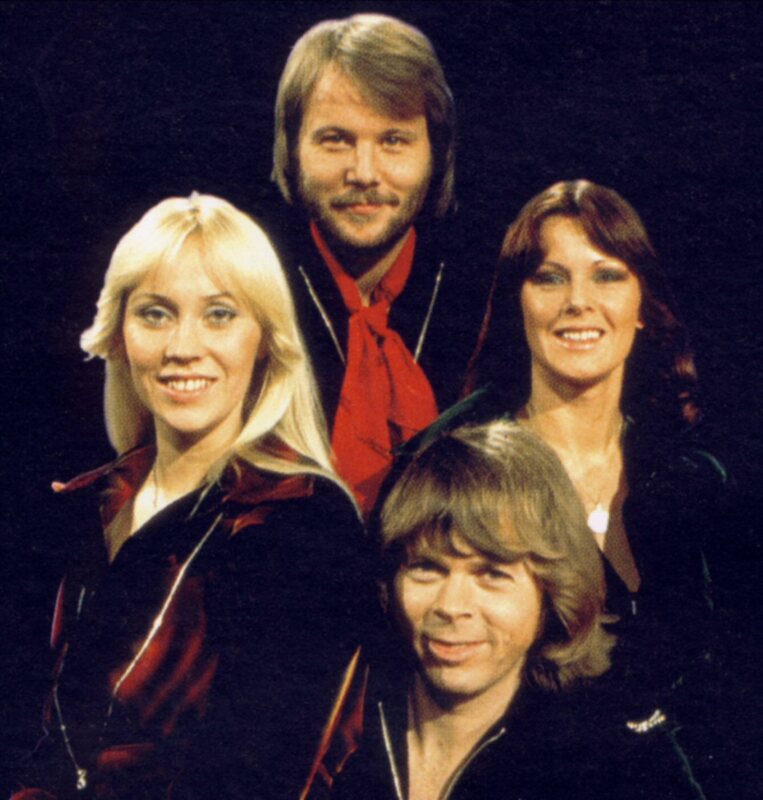 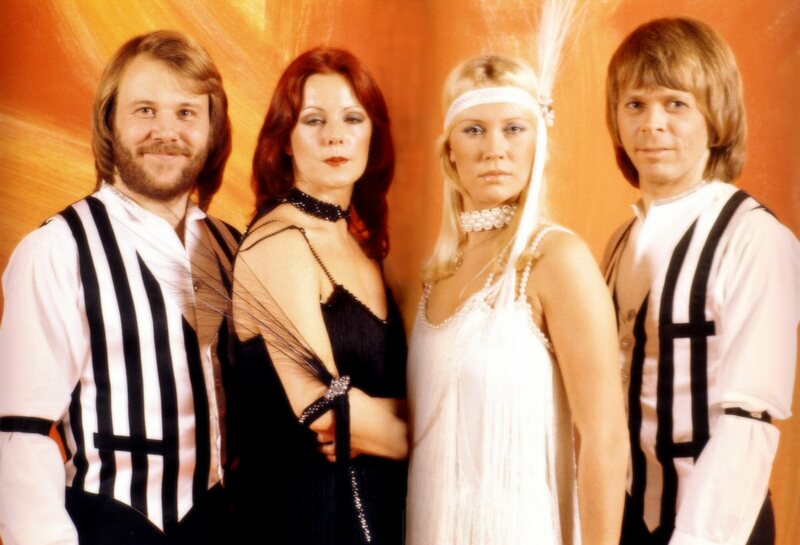 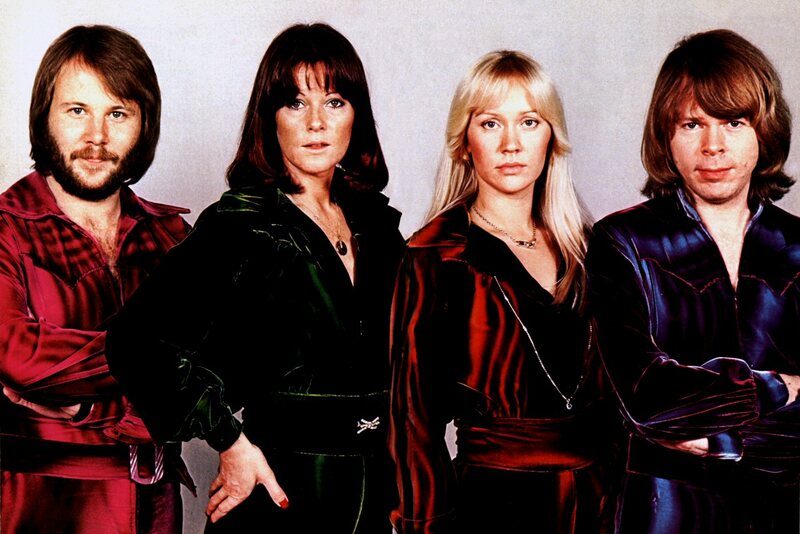 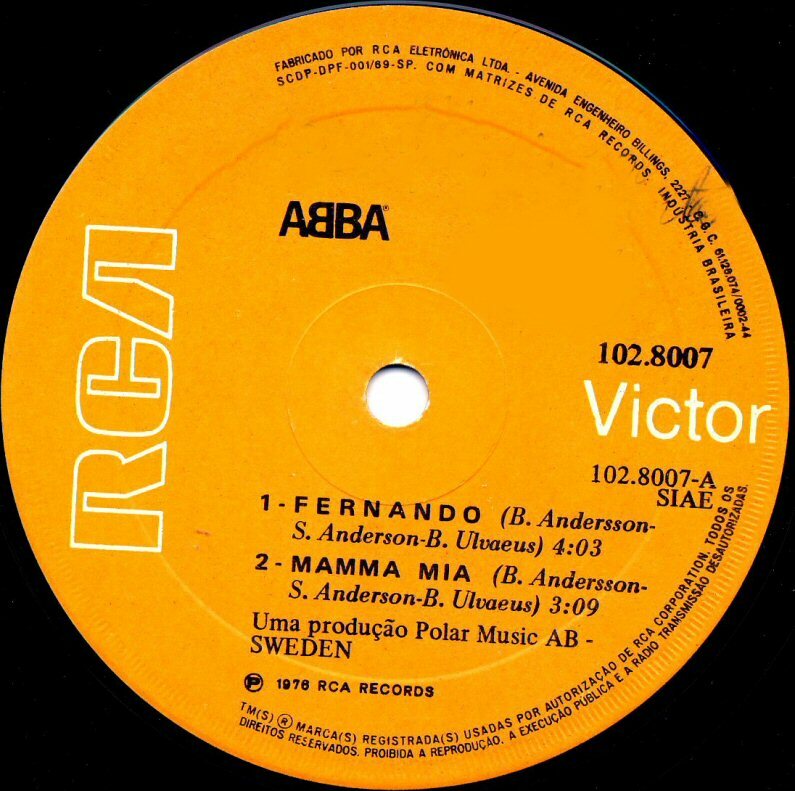 "Fernando" became one of the biggest ABBA hits ever. 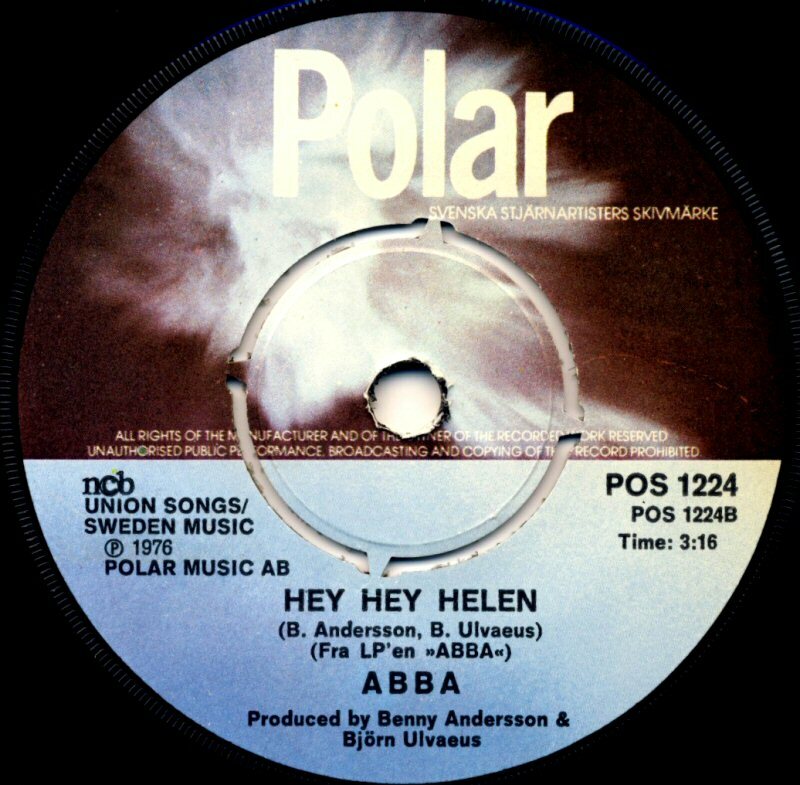 "Hey Hey Helen" was chosen in most countries for the B-side of the single. 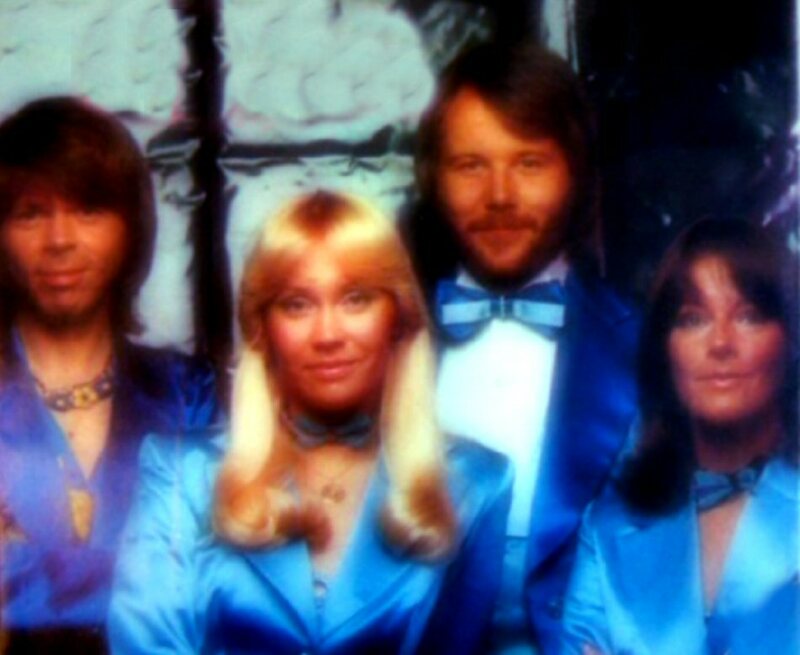 The cover picture had been taken during filming of the video for the song. It was the group's first non-album single and was released in March 1976 through Polar Music. 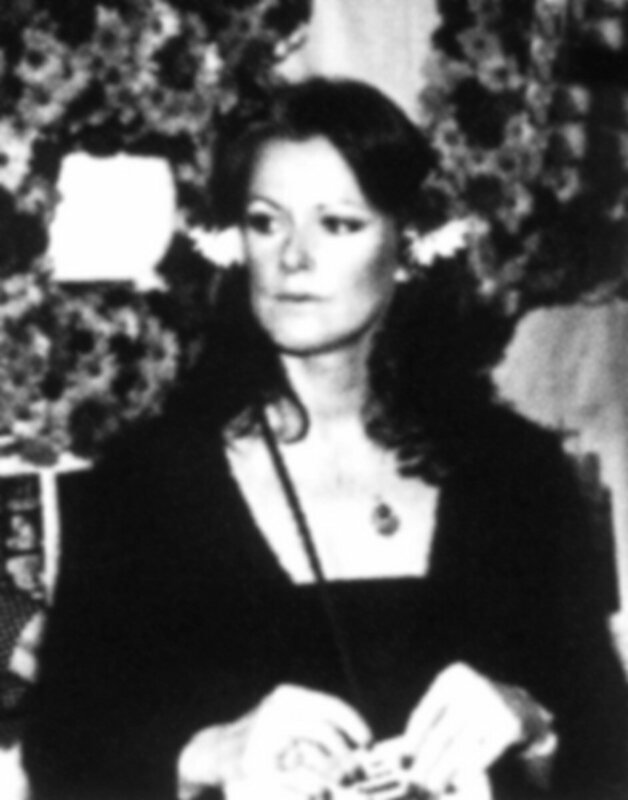 Solo parts were sung by Frida. 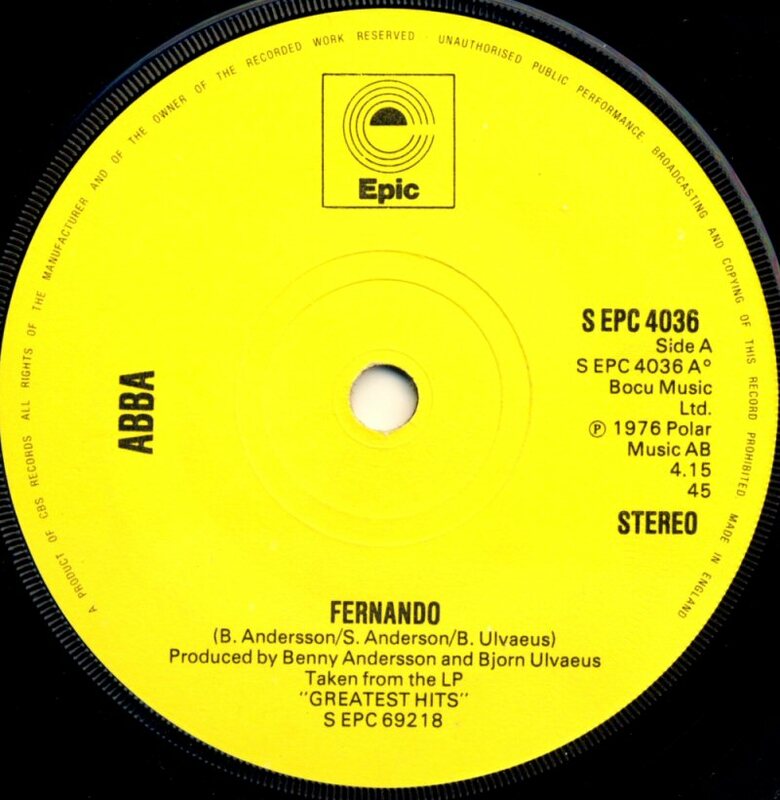 The track was featured on the 1976 compilation album Greatest Hits in some countries, although in Australia and New Zealand, "Fernando" was included on the group's fourth studio album Arrival. 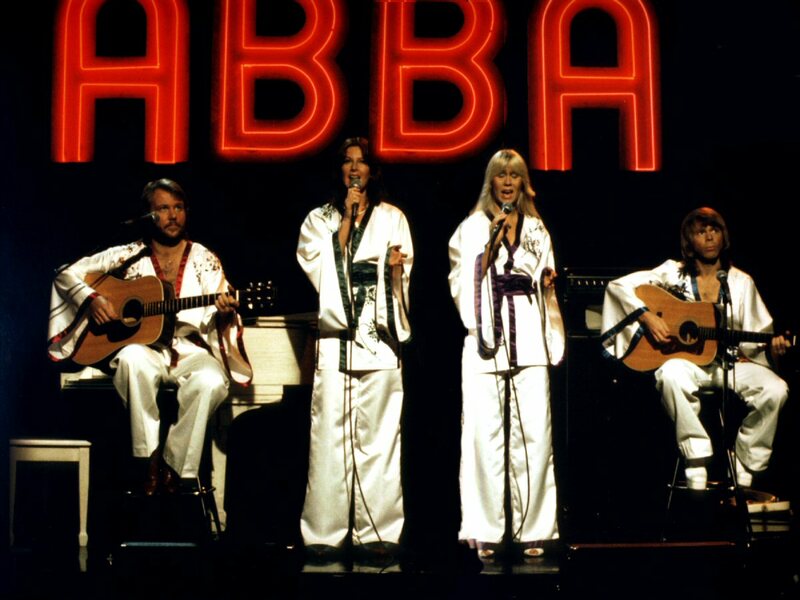 The song was to become ABBA's best-selling single of all time, with 6,000,000 copies sold in 1976 alone. 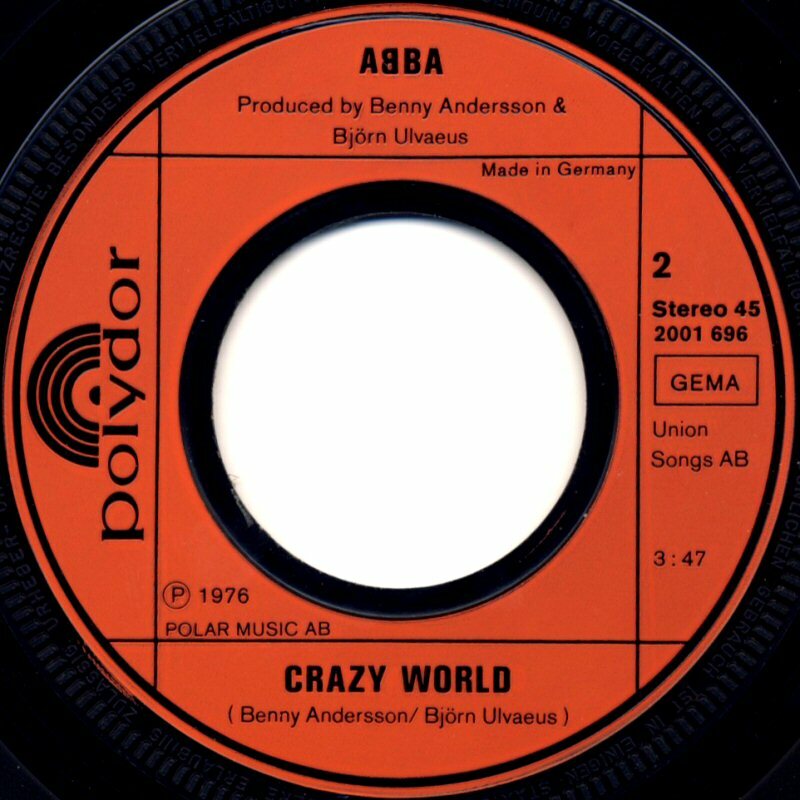 The single was released in Sweden in March 1976 and it stayed on the chart "Topplistan" for 11 weeks peaking at #2 in April. 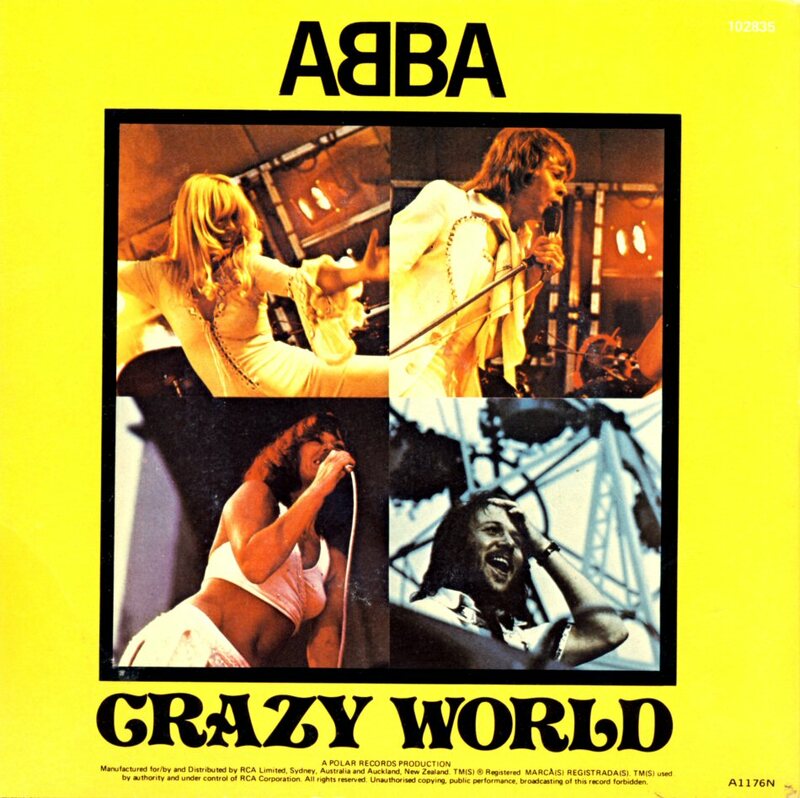 In Norway the single stayed for 21 weeks peaking at #2. 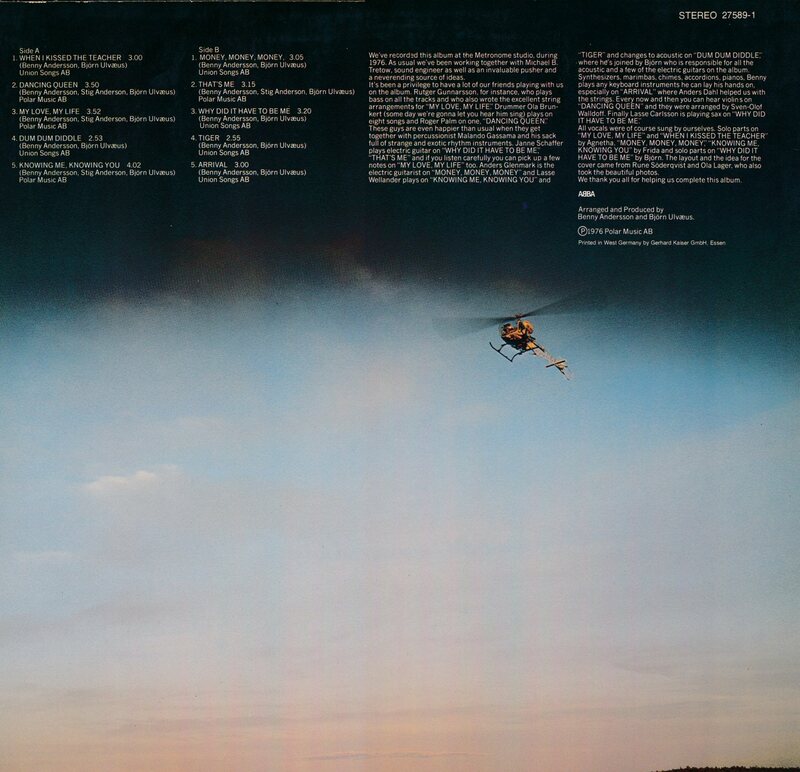 The cover featured slightly different lay-out. 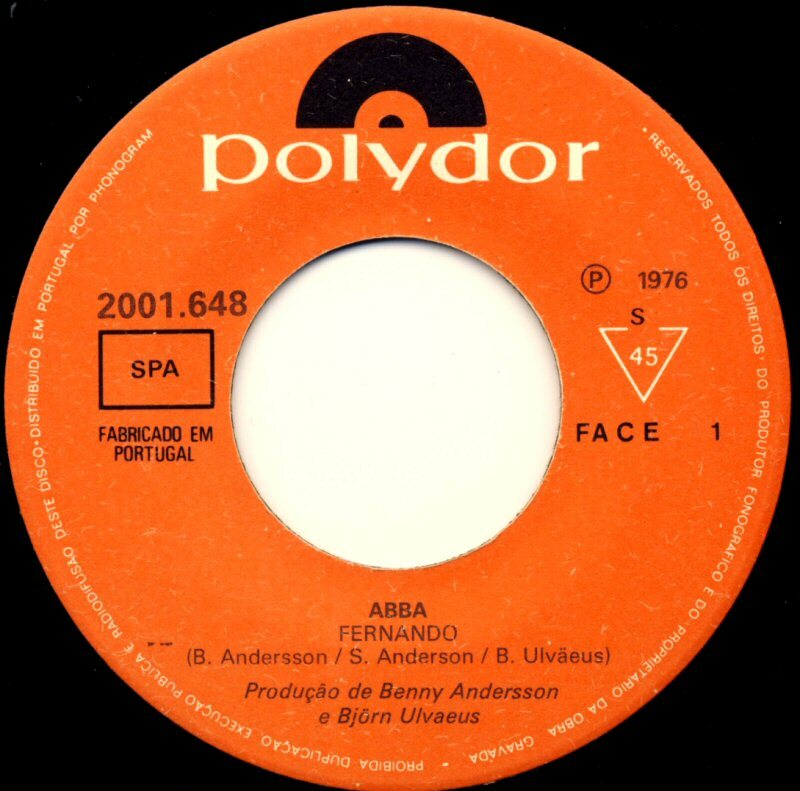 In France the single "Fernando" was released already on February 20, 1976. 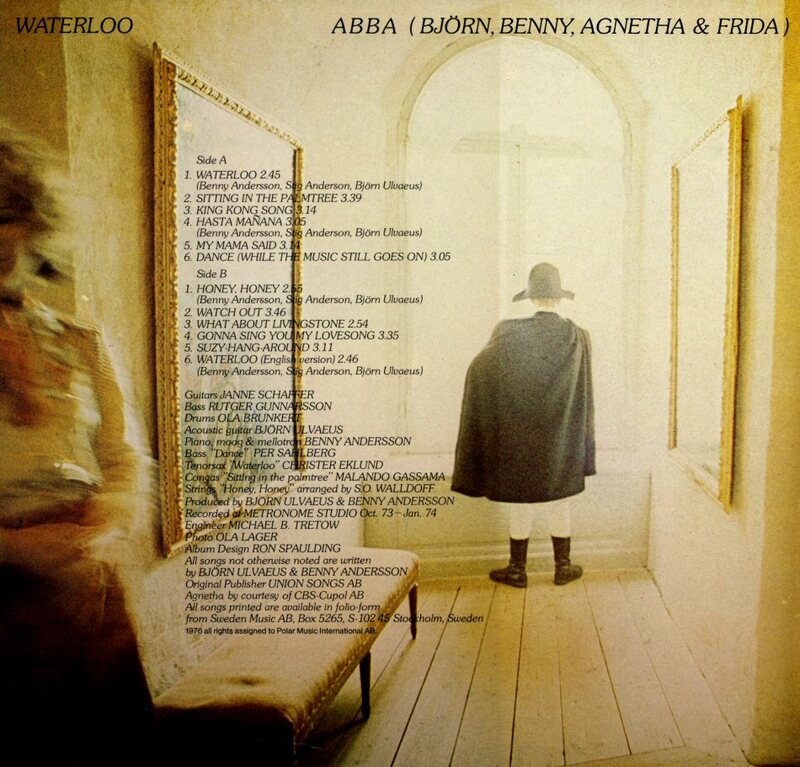 The song on the B-side on the French release was "Dance (While the Music Still Goes On)" taken from the album "Waterloo". 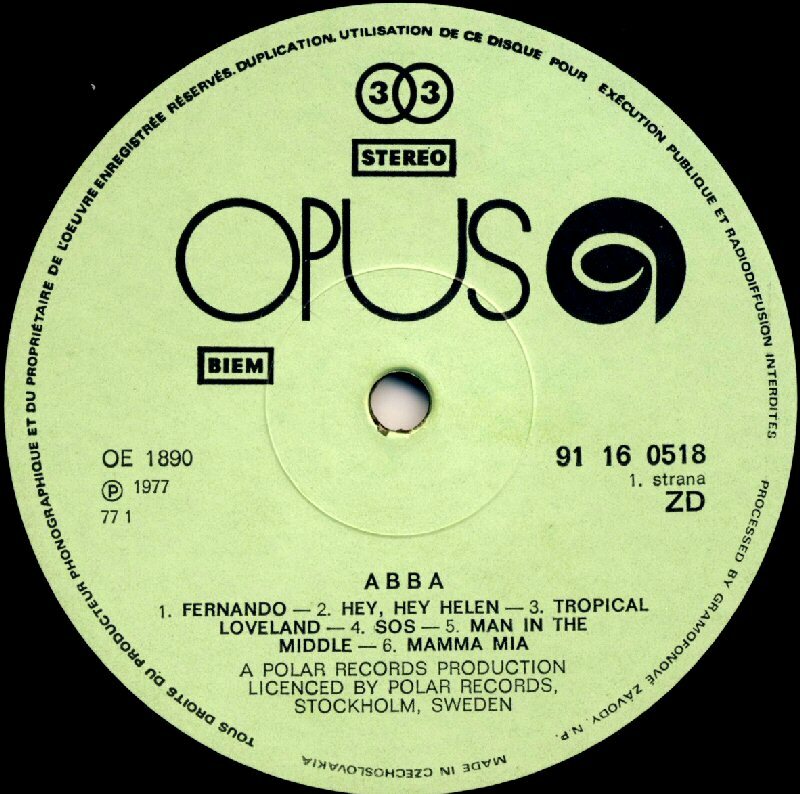 "Fernando" entered the French chart first in April and stayed there for 13 weeks peaking at #1 (for 3 weeks). 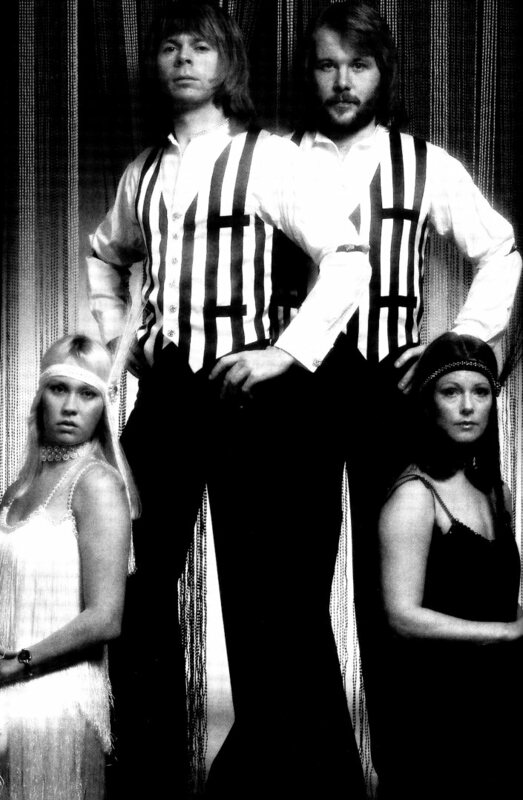 The cover picture on the French release featured an alternative shot from the photo session. 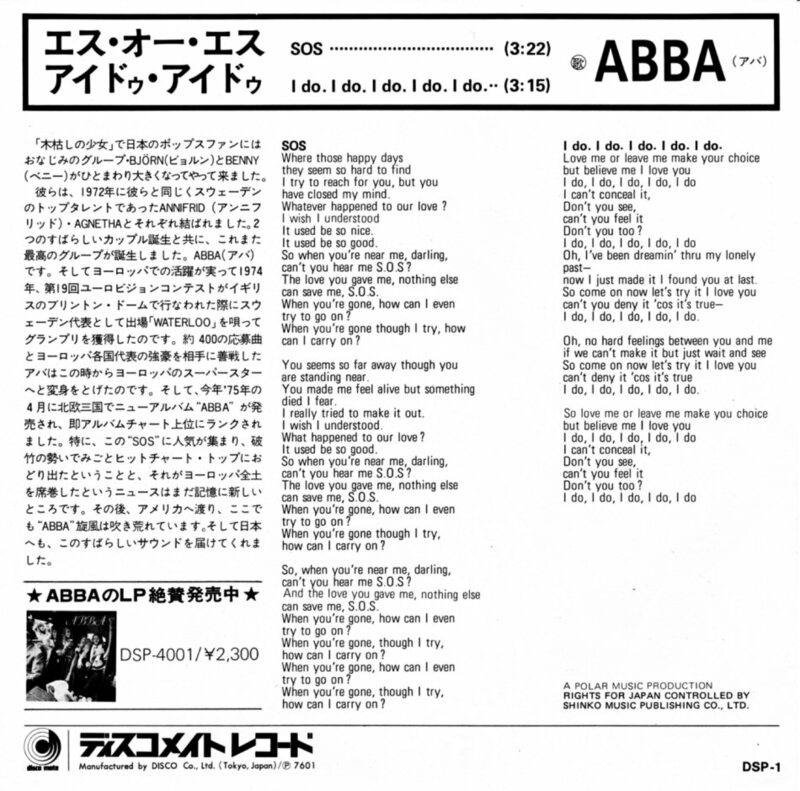 The single was released on both Melba label and Vogue label. 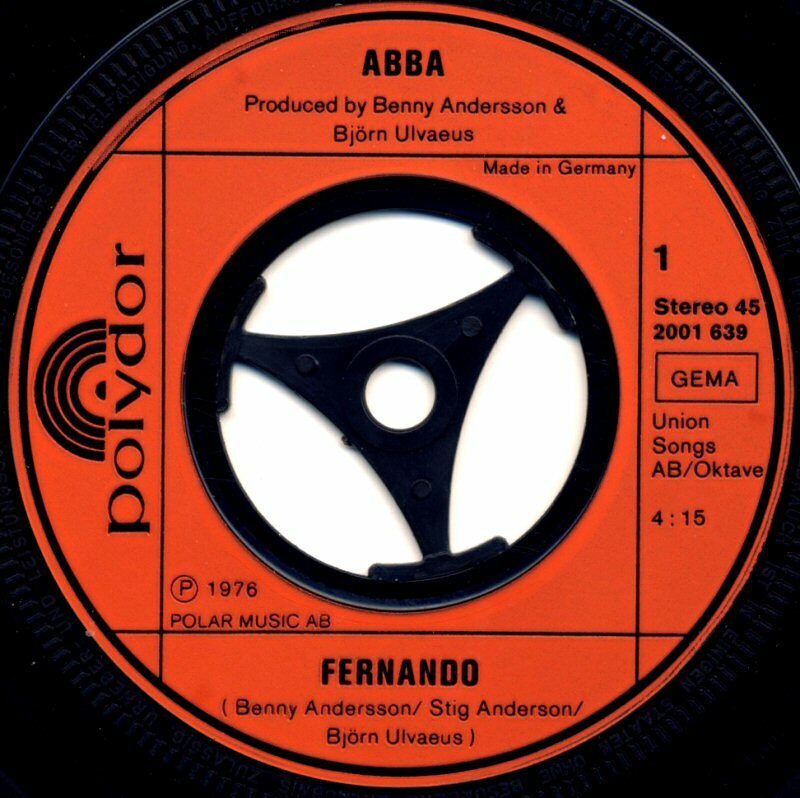 In the United Kingdom "Fernando" entered the chart on March 27 where it stayed for 15 weeks reaching the top on May 8th (4 weeks). 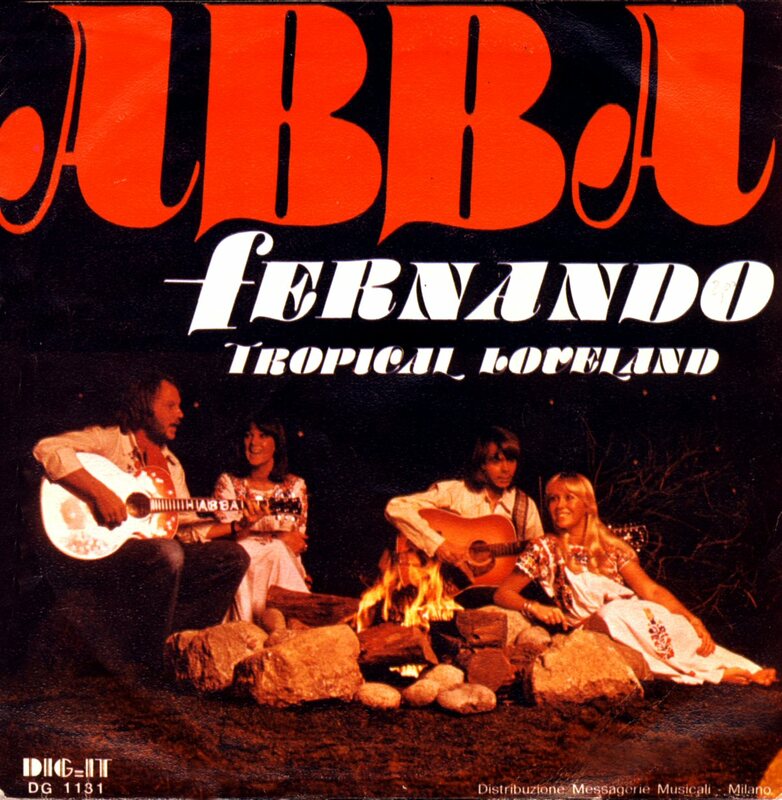 In West Germany "Fernando" b/w "Tropical Loveland" entered the hit single list on March 29th and on May 8th it became #1 for 7 weeks. 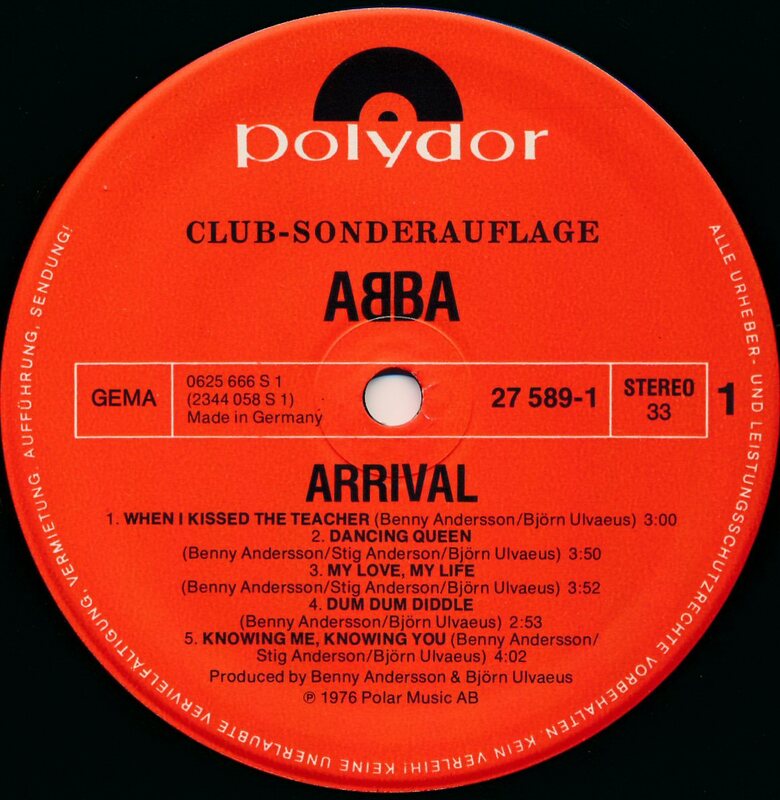 The single stayed on the German chart for 26 weeks. 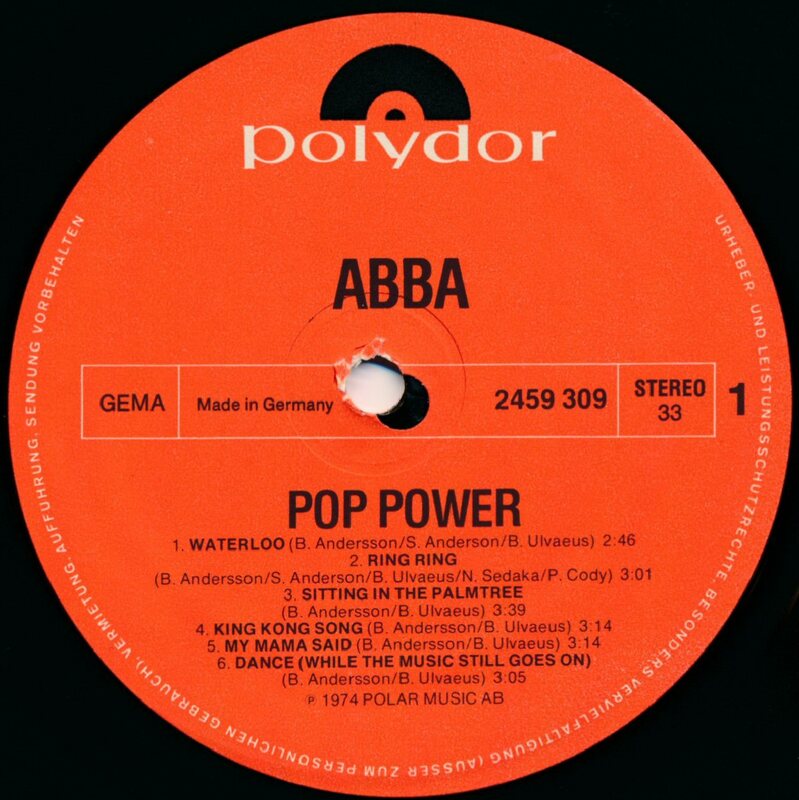 There were two slightly different versions of the single available in West Germany. 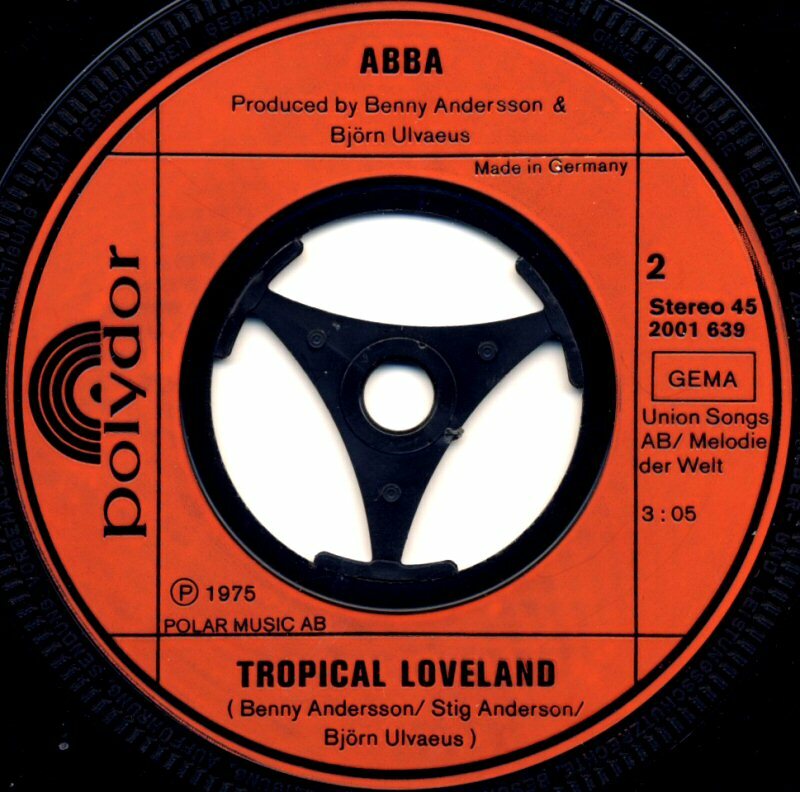 The Austrian release of the single featured slightly different cover and like in West Germany "Tropical Loveland" on the B side. 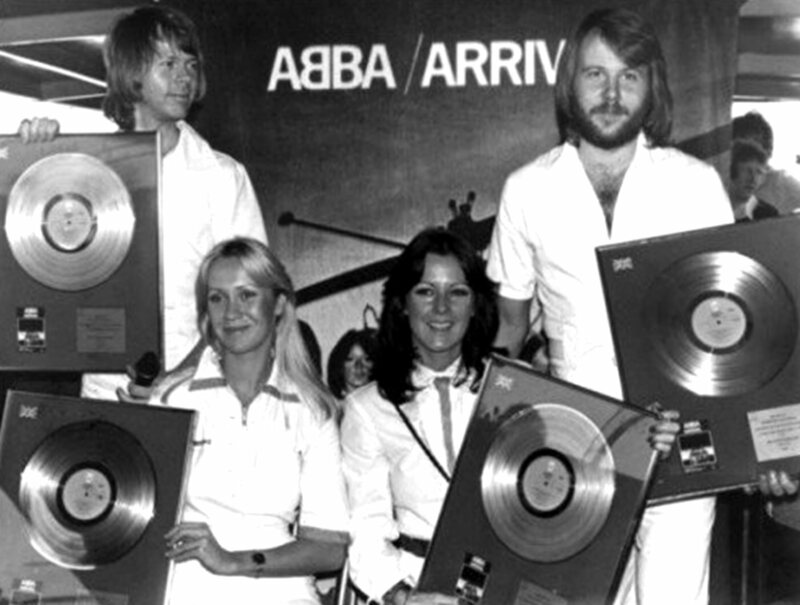 It entered the chart on April 15th and stayed there for 24 weeks reaching #1. 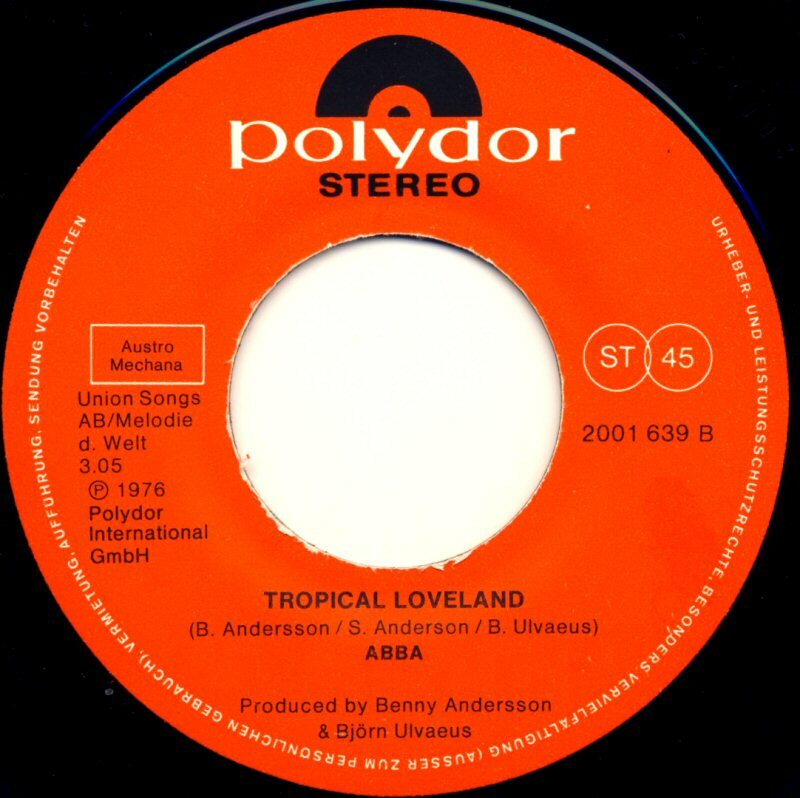 Even the Dutch single had "Tropical Loveland" on the B-side. 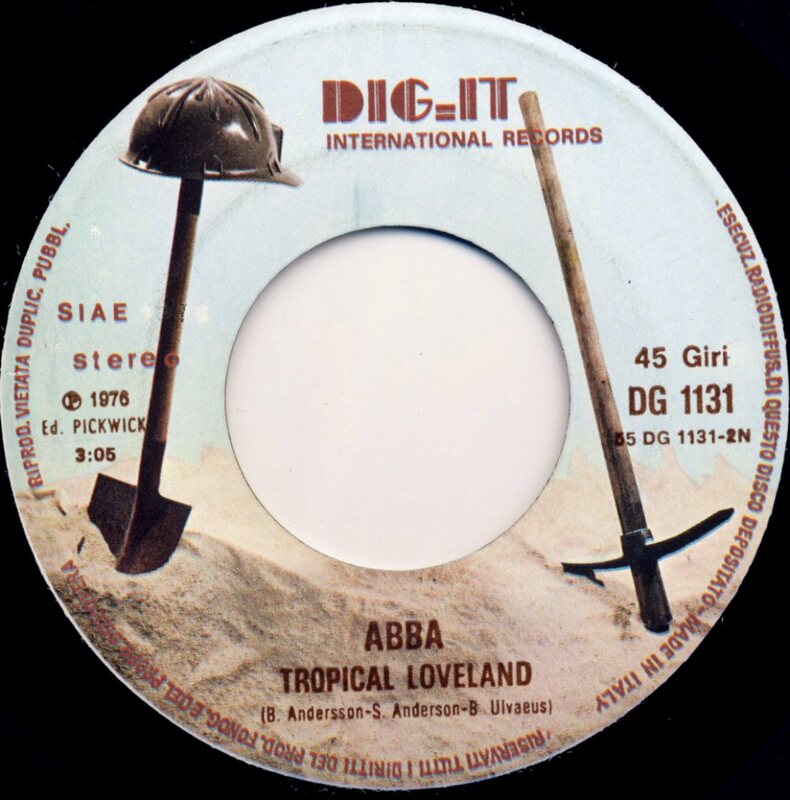 It entered the single chart in Holland on March 20th and stayed there for 12 weeks peaking at #1 (for 3 weeks). 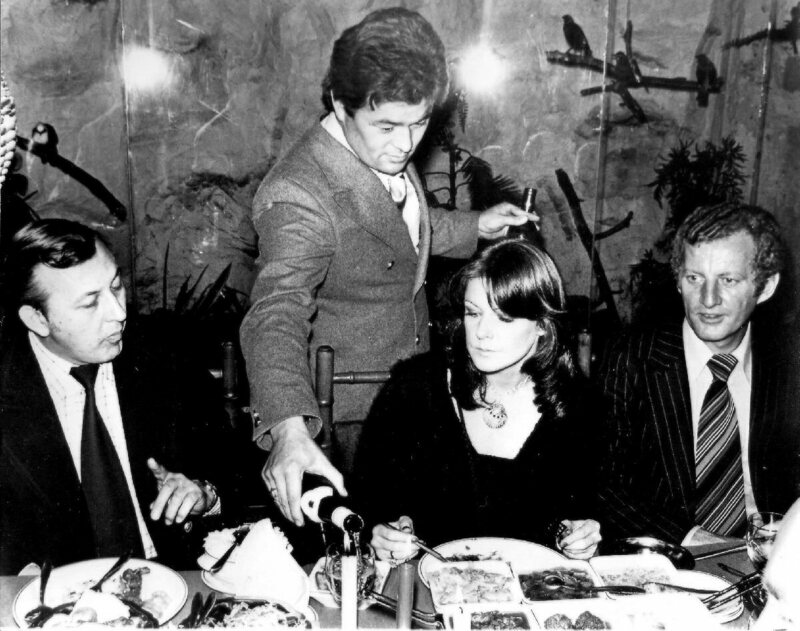 In Spain "Fernando" b/w "Intermezzo No. 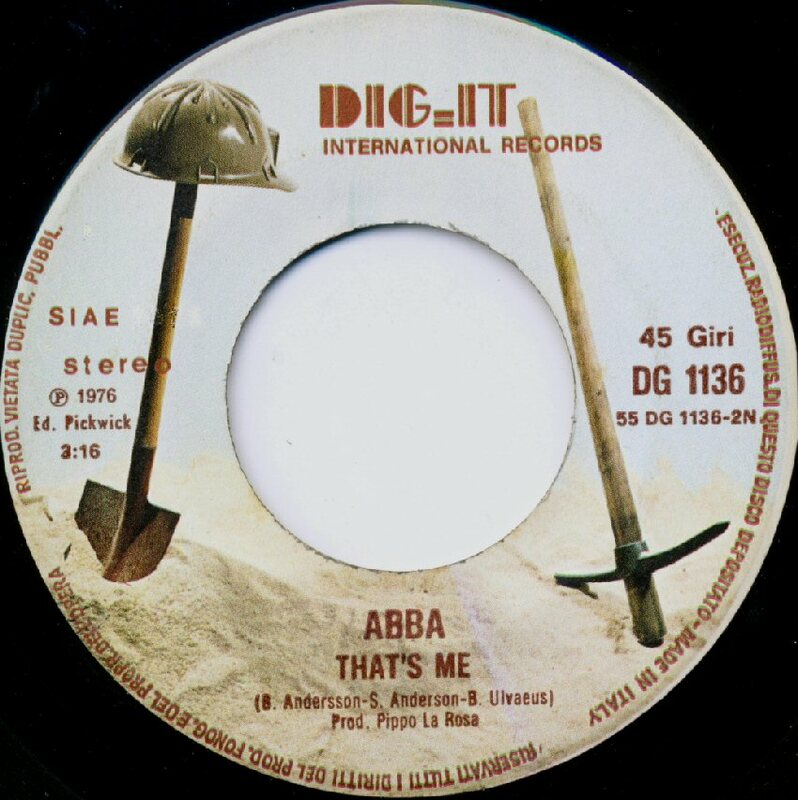 1" entered the chart in March and it stayed there for 24 weeks peaking at #3. 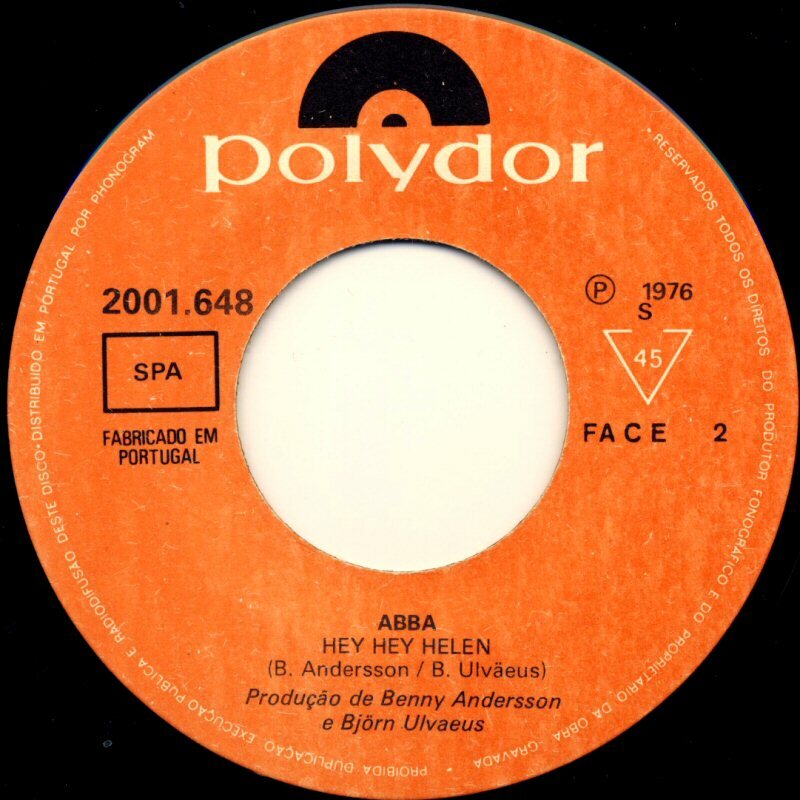 The Polydor release of "Fernando" in Portugal featured "Hey Hey Helen" and the B-side. 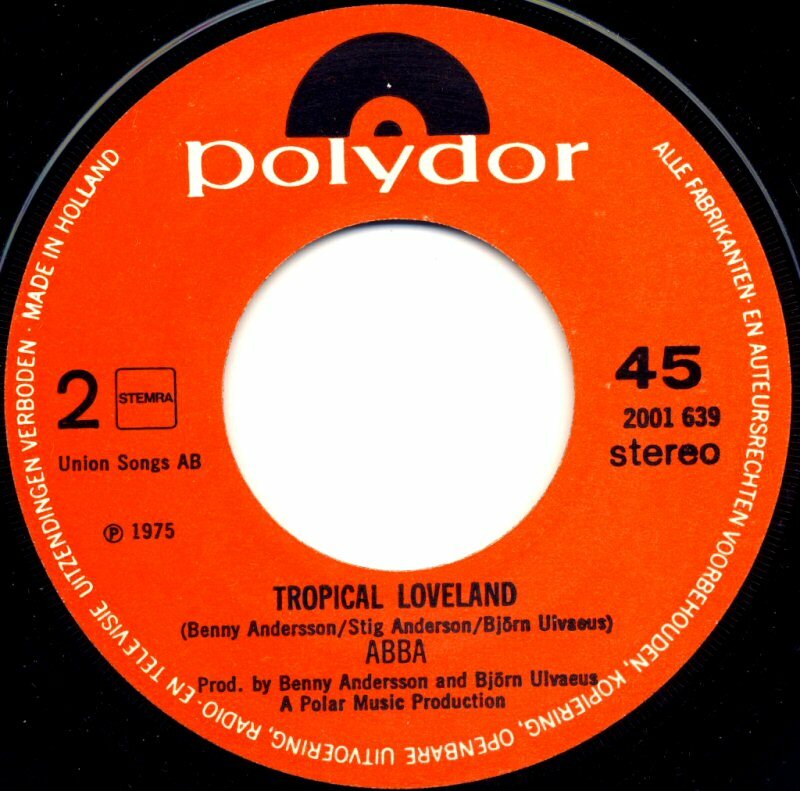 Even the Italian release of the single contained "Tropical Loveland" on the B-side. 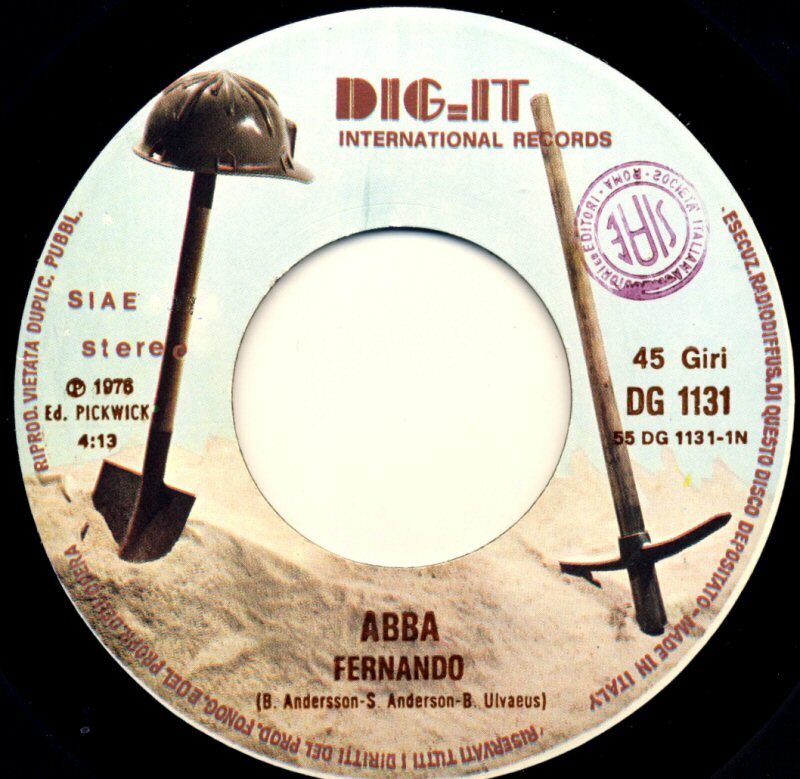 "Fernando" stayed on the Italian single chart for 21 weeks reaching #6. There were two cover versions of the single in Italy. The first one featured only the title "Fernando" on the cover and the logo of the record company "Dig-It" under catalogue number DG 1131 - se below. 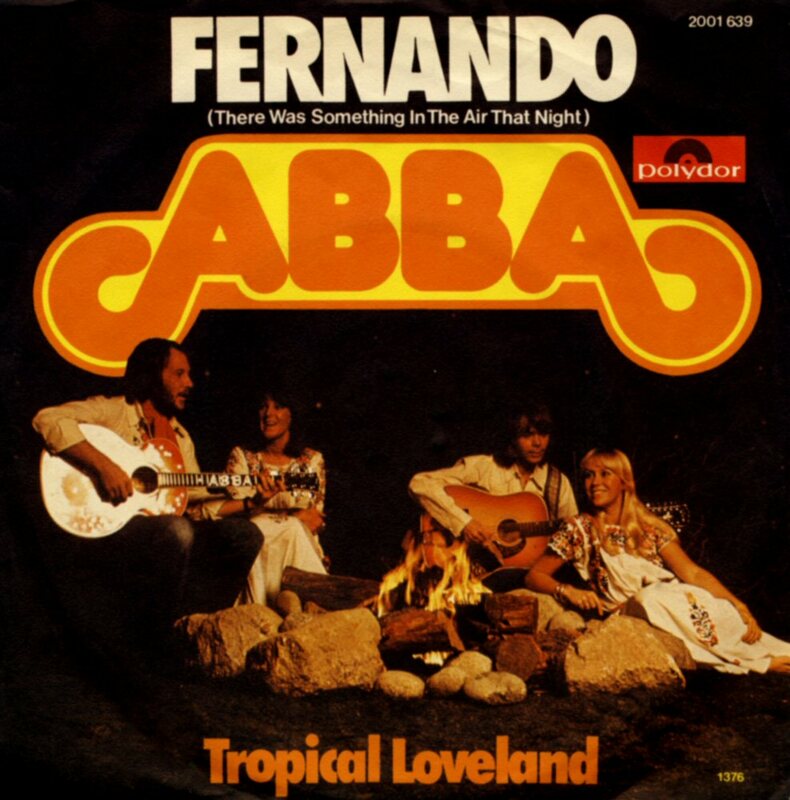 The alternative italian cover featured the title "Fernando" on one side but both "Fernando" and "Tropical Loveland" on the other side. 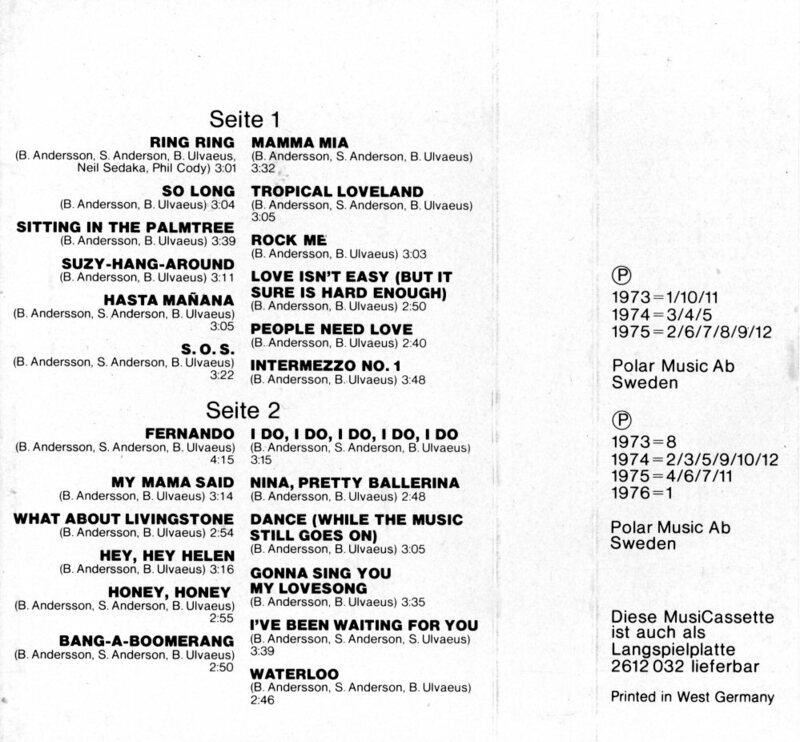 There was even an additional credit printed on the cover that the single was distributed by "Messagene Musicali Milano". 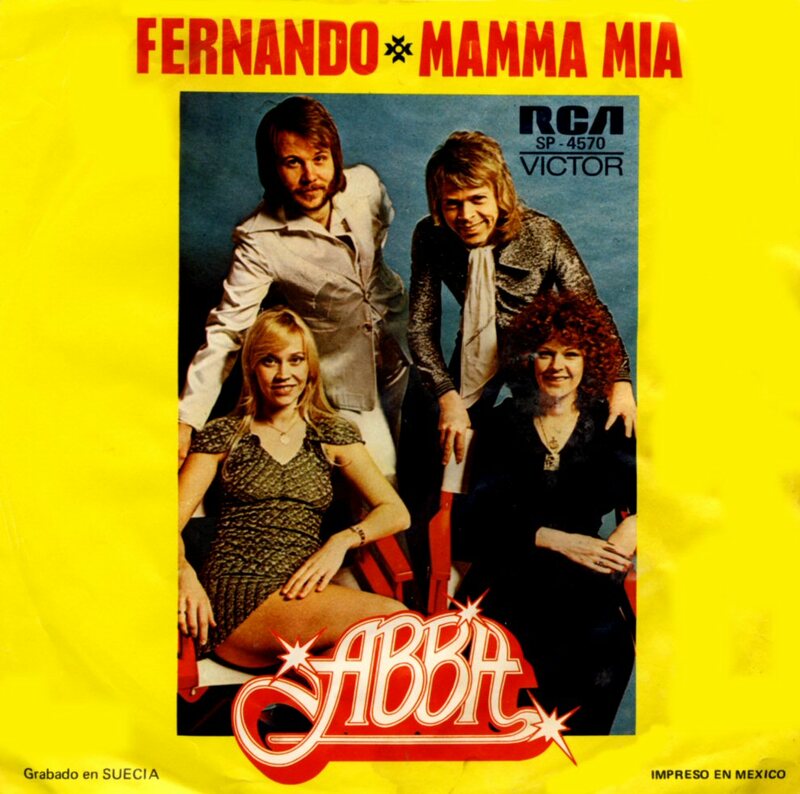 In Mexico "Fernando" b/w "Mamma Mia" entered the hit chart in May 76 and stayed there for 5 reaching #1. 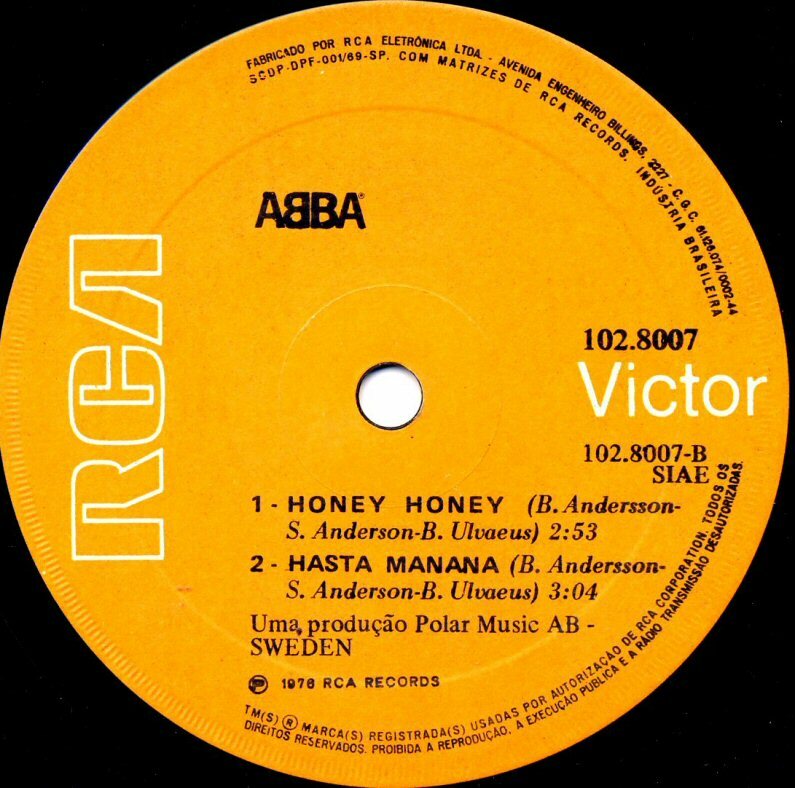 The EP featuring "Fernando" and "Mamma Mia" on side A and "Honey Honey" and "Hasta Mañana" on side B was released in Brazil in 1976. 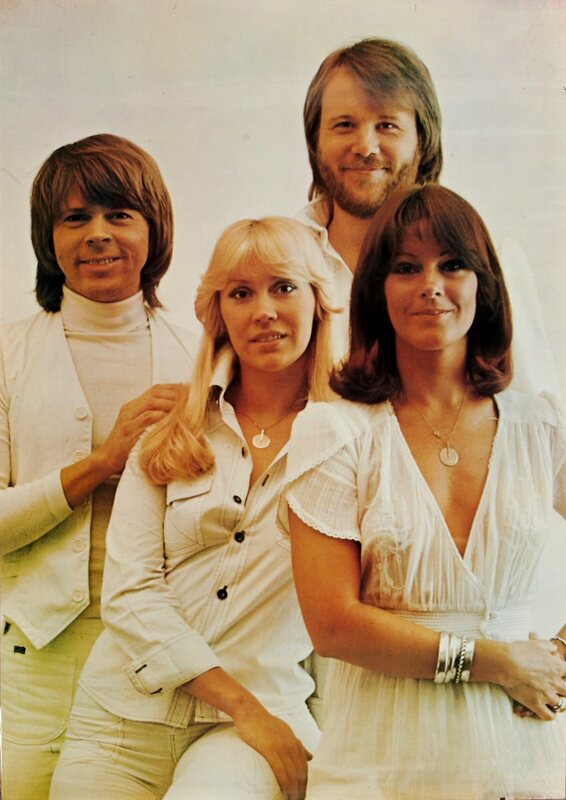 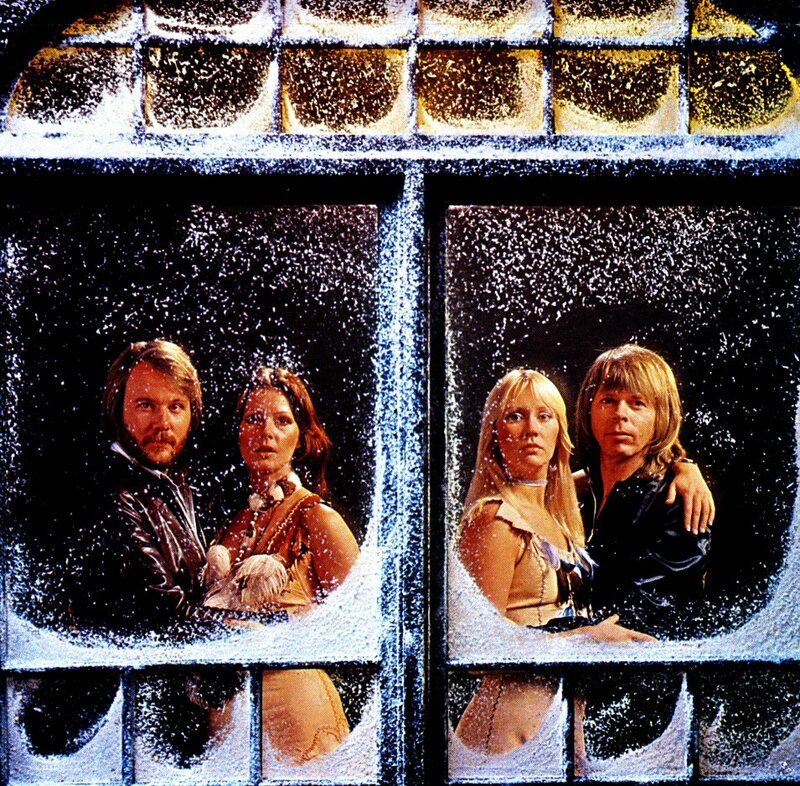 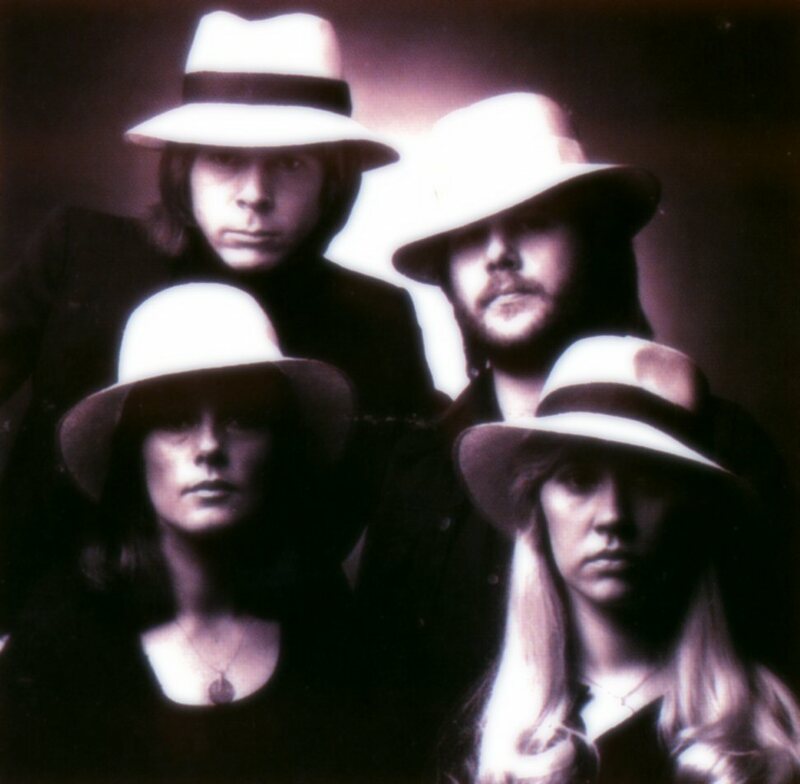 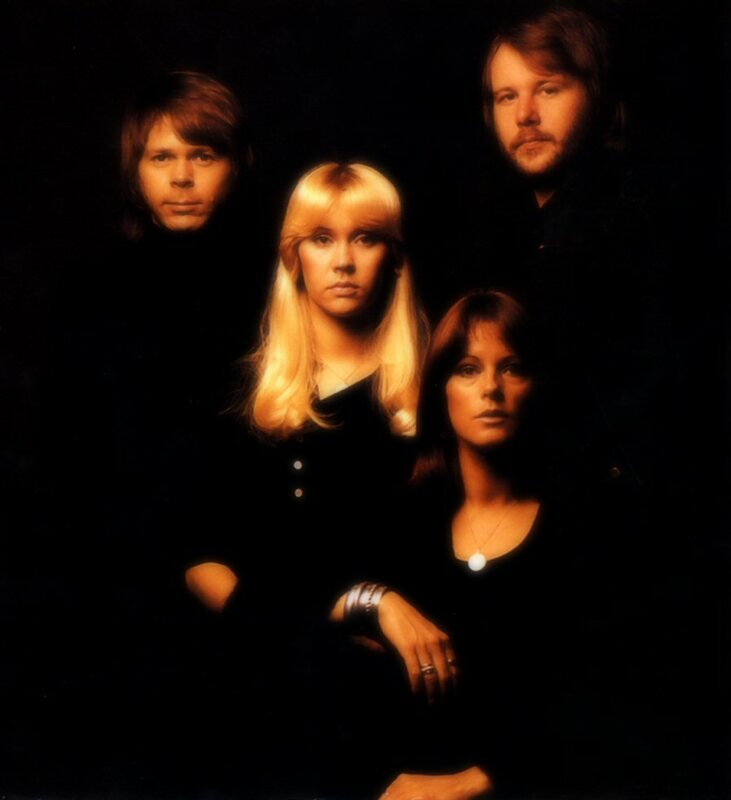 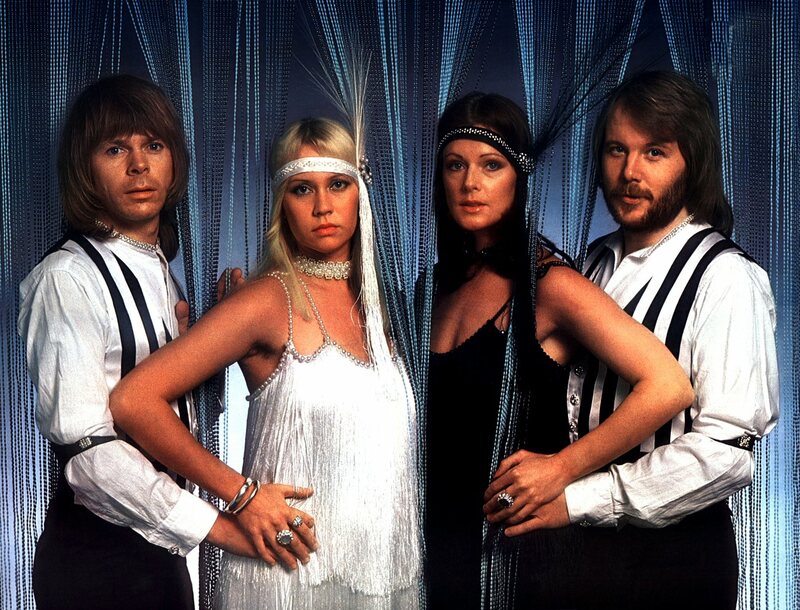 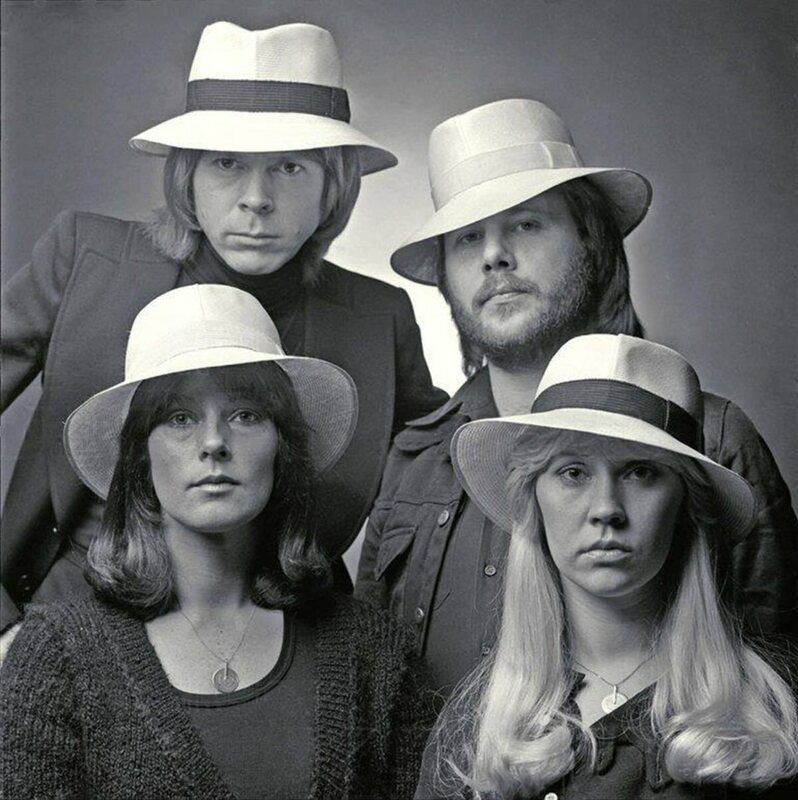 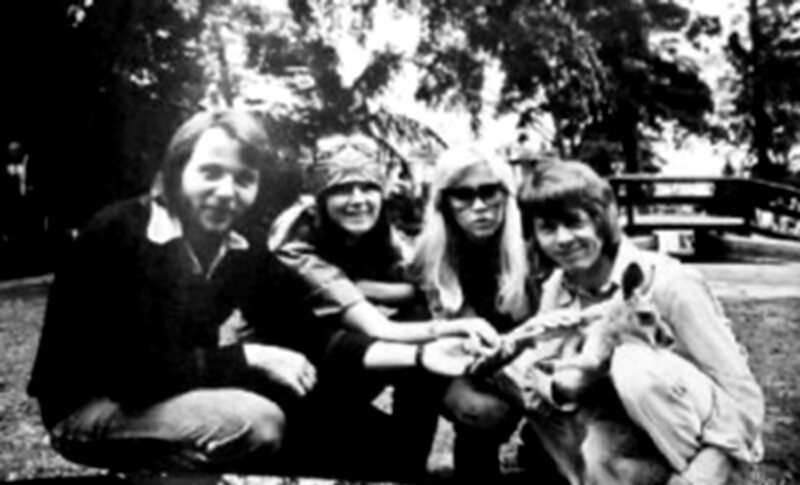 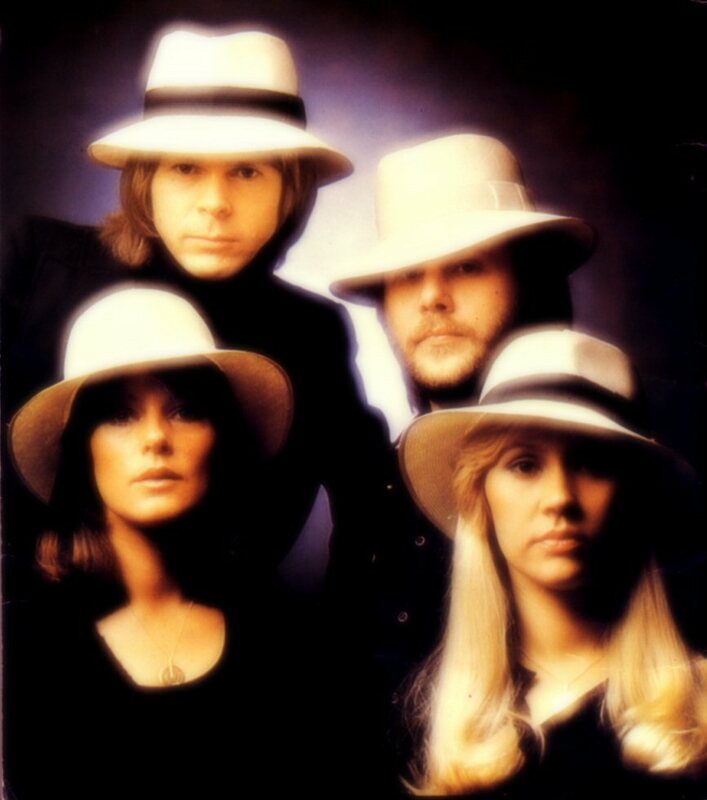 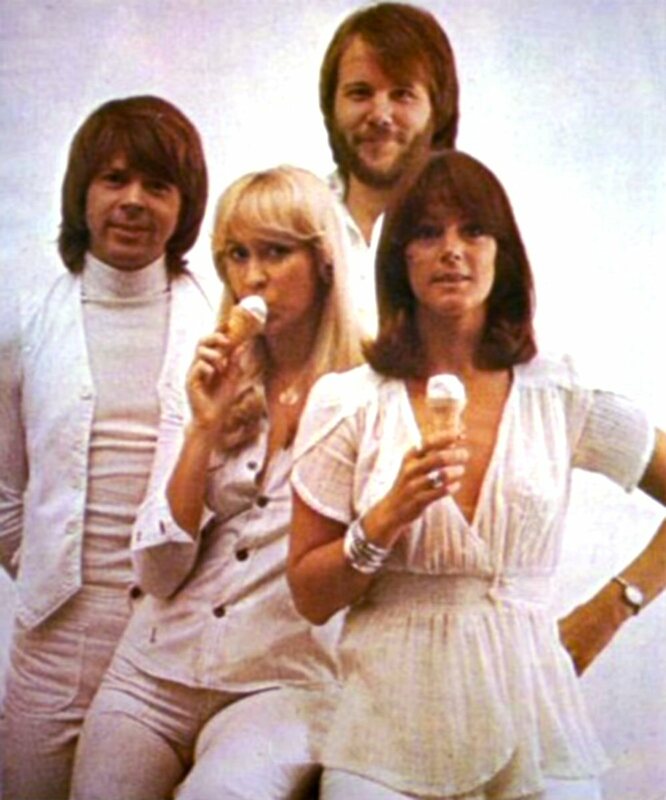 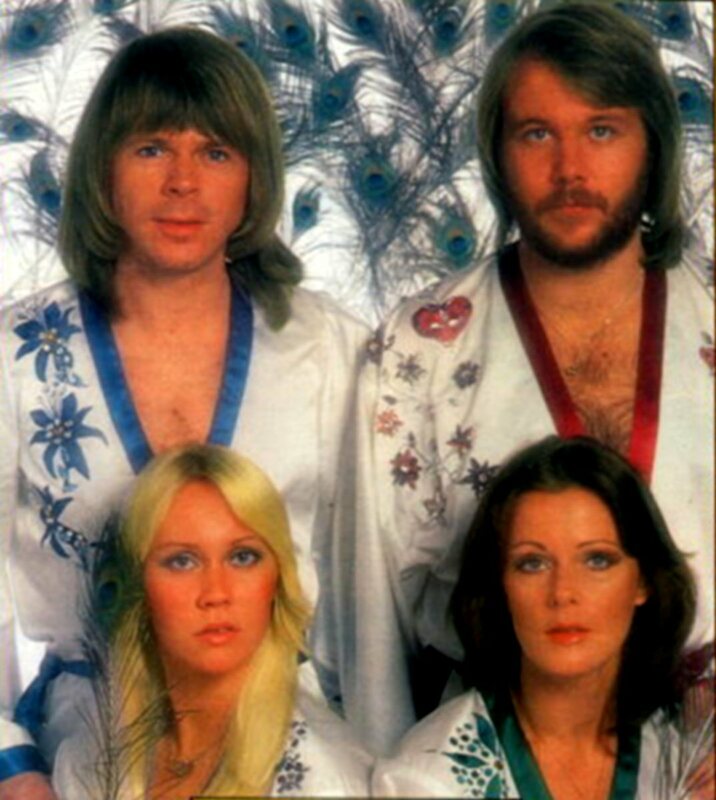 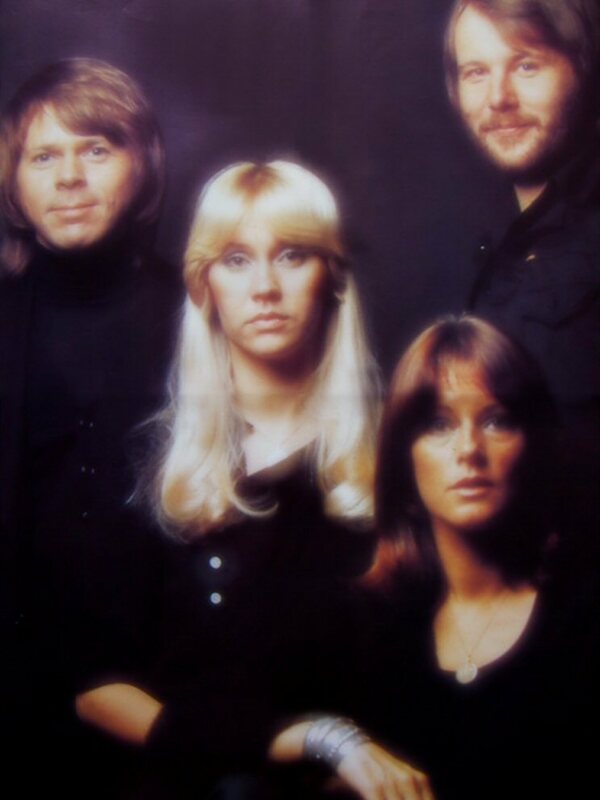 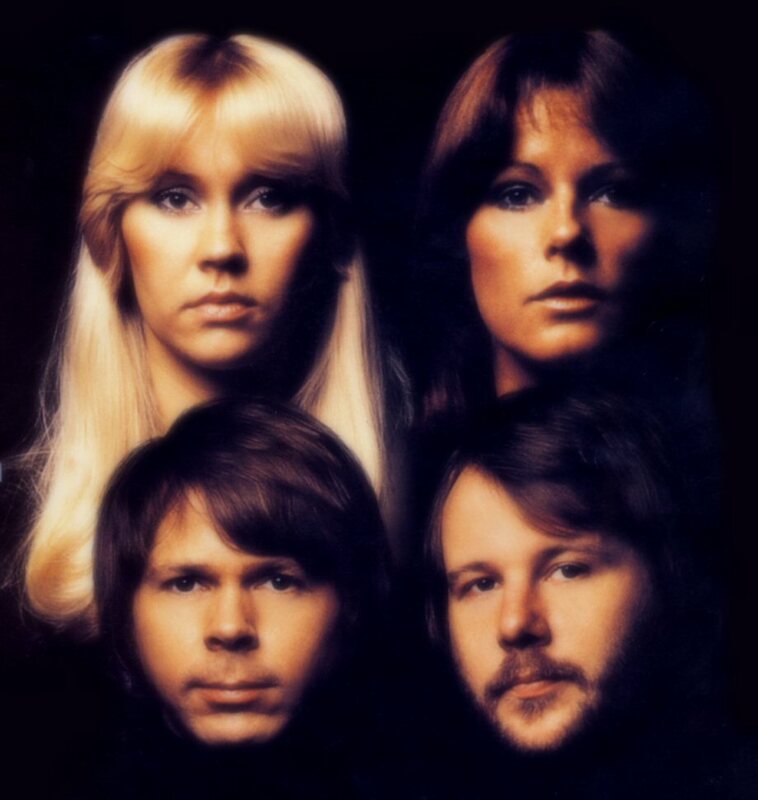 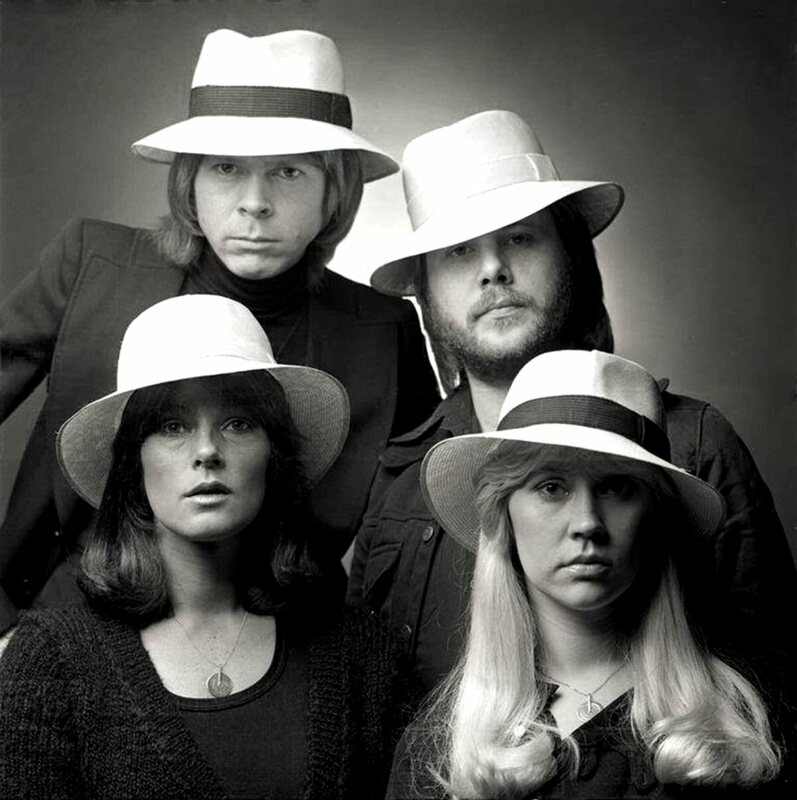 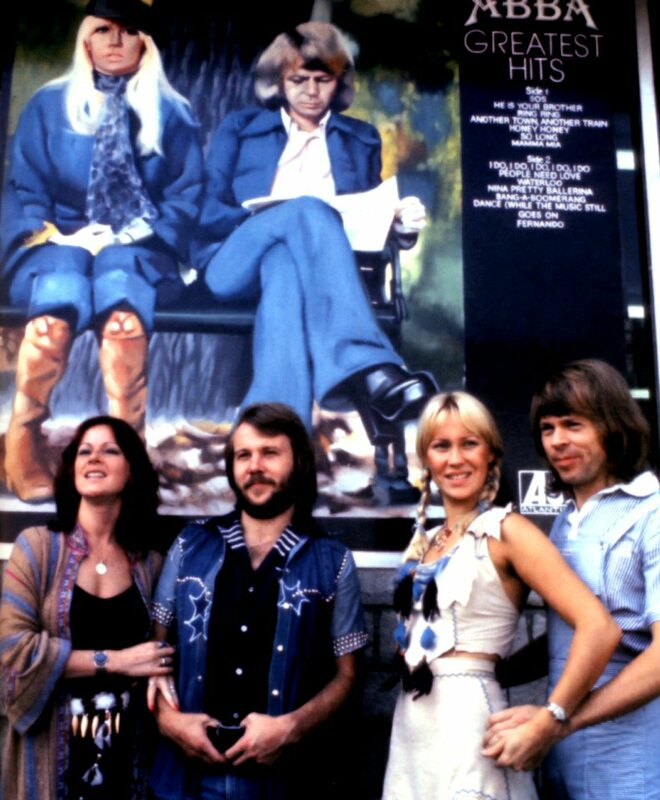 The cover featured ABBA picture taken in the summer 1973. 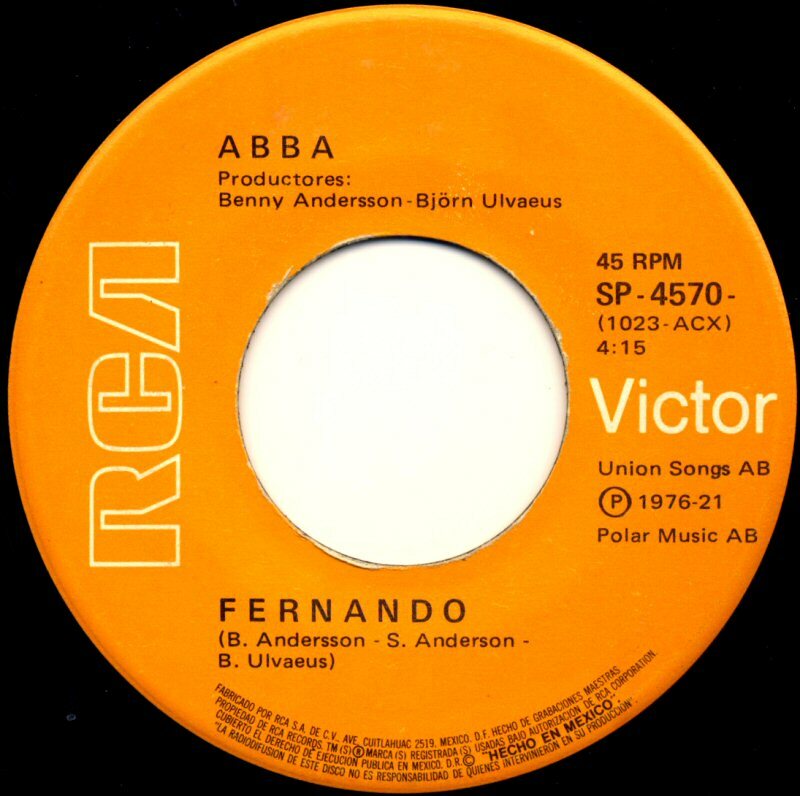 "Fernando" entered the US chart on September 25th, 1976 where it stayed for 11 weeks peaking at #13. 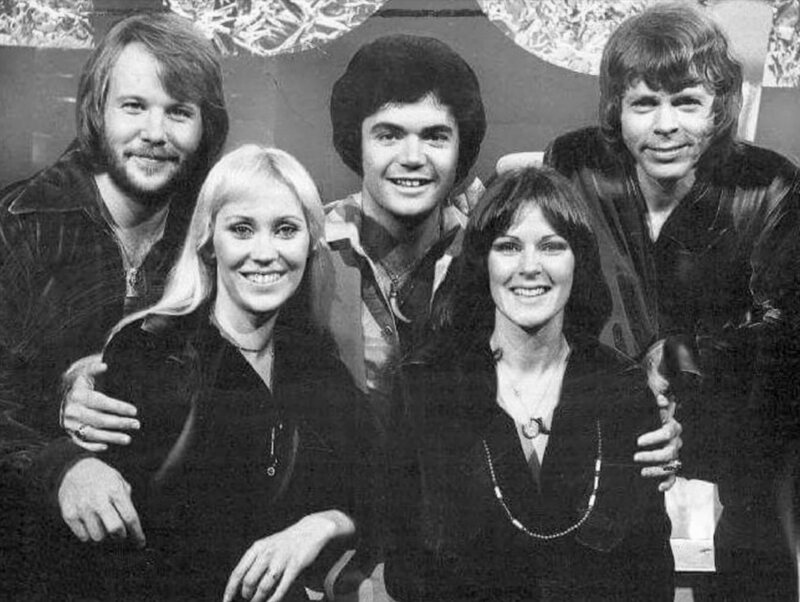 It became though #1 (for 2 weeks) on the Adult Contemporary chart. 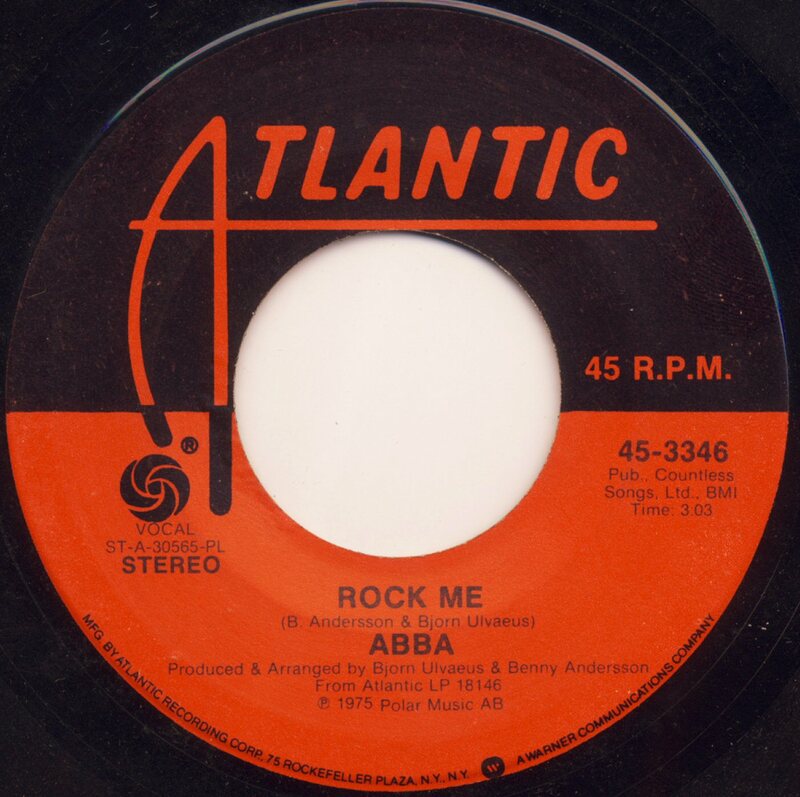 There was "Rock Me" on the side B of the single. 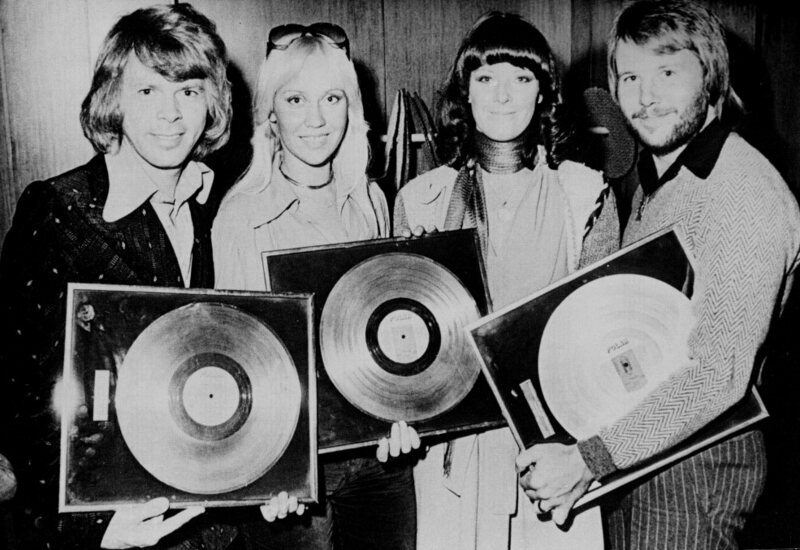 In Canada ABBA received gold record for sales of the single. 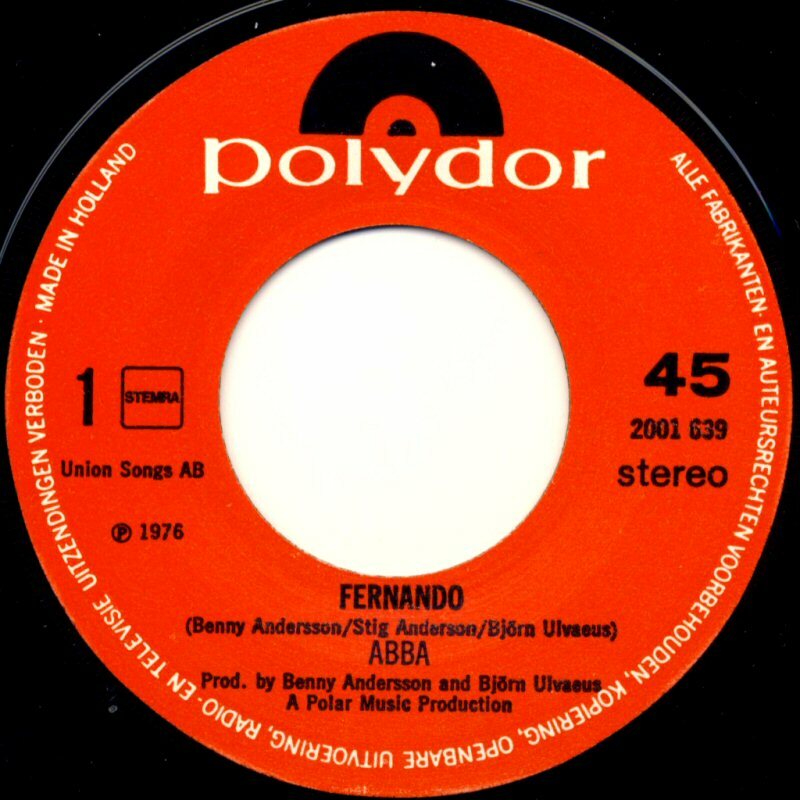 "Fernando" was number 1 hit in Belgium, Ireland, New Zealand, South Africa and Switzerland. In Finland and Norway the single reached #2. 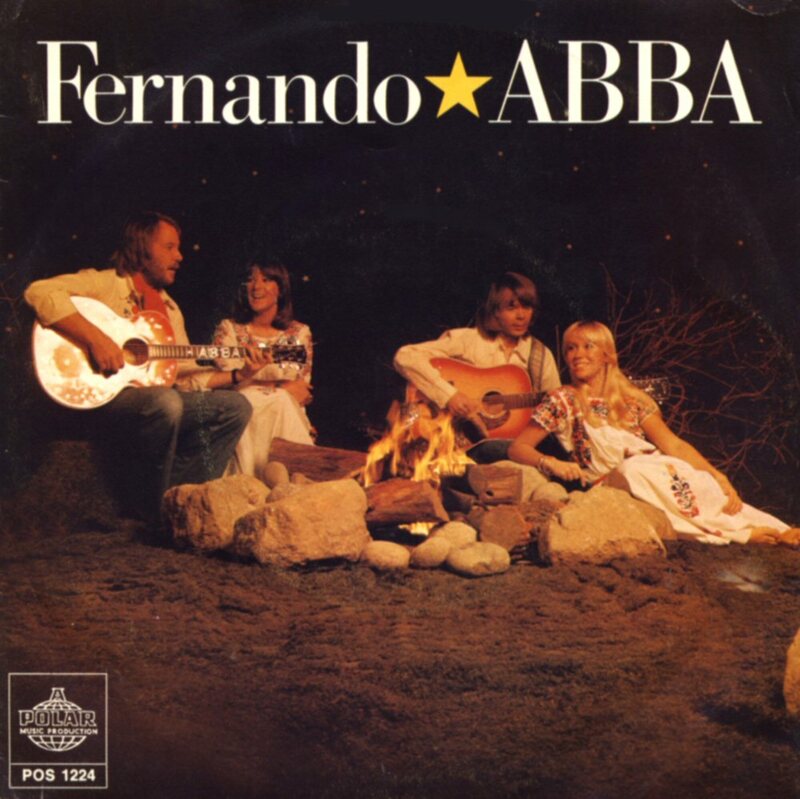 "Fernando" saw its release in Australia on March 18, 1976. 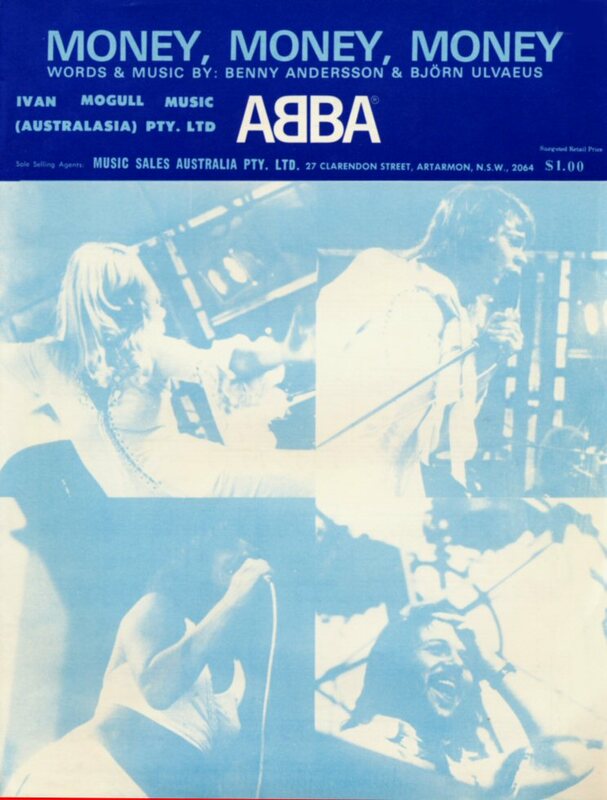 It entered the Australian chart on #16 and stayed there for 33 weeks reaching # 1. 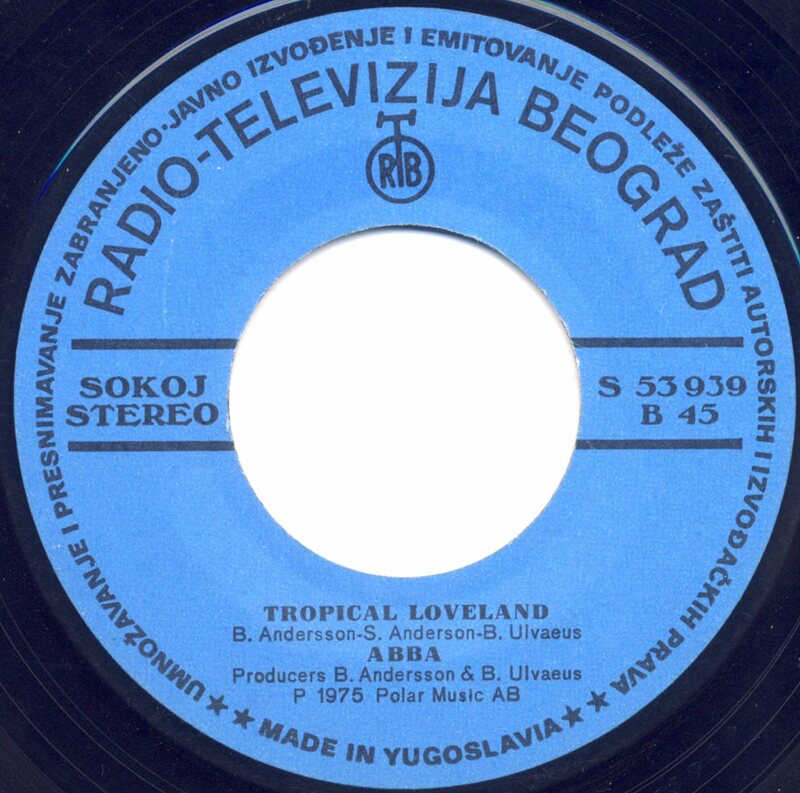 "Fernando" b/w "Tropical Loveland" was released in the former Yugoslavia. 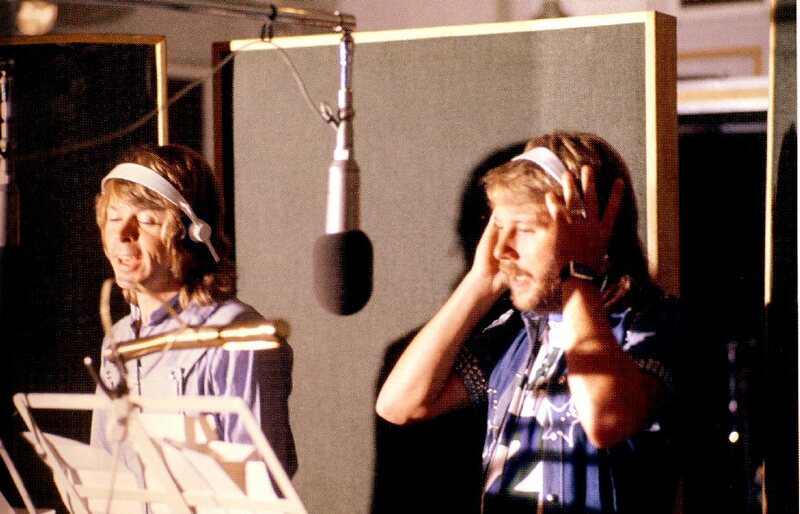 At the same time the group was working in studio with the new album. 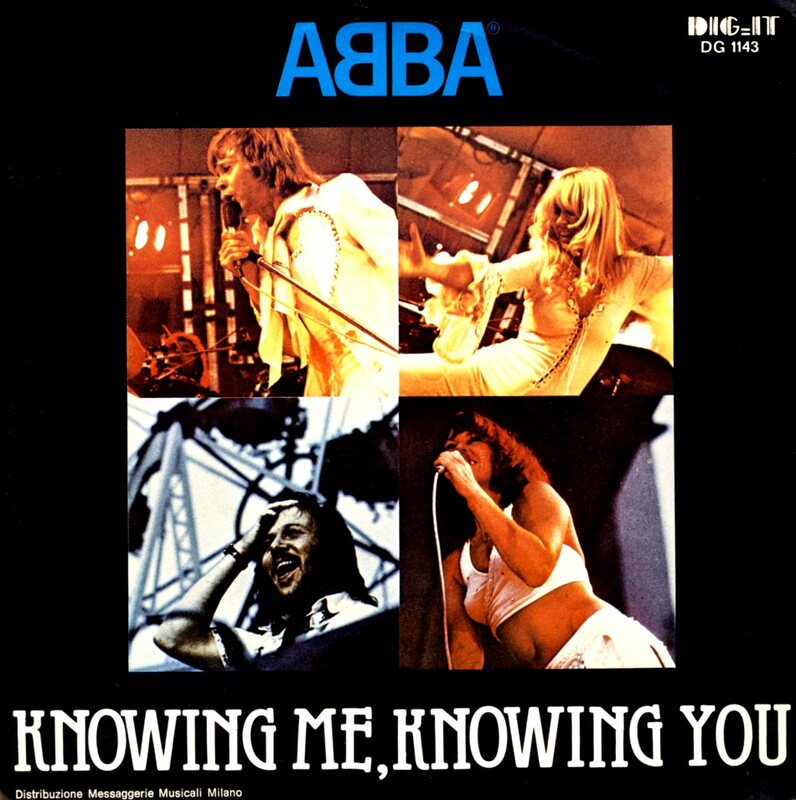 Three new songs: "Knowing Me Knowing You", "That's Me" and "Why Did It Have To Be Me" had been completed in March and April. 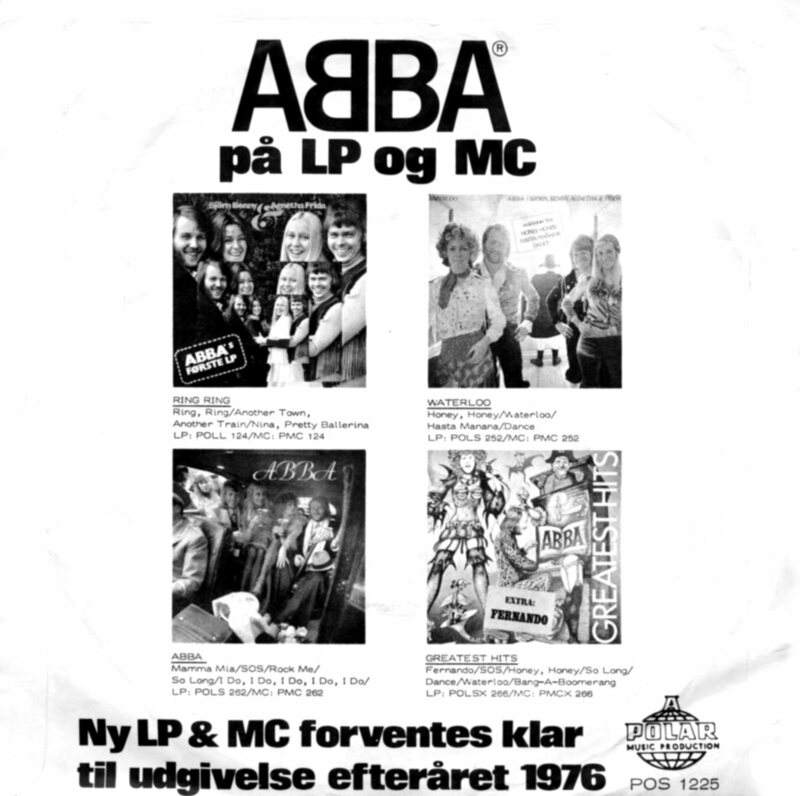 The promo poster was printed in Sweden by the company "Scandecor" in Uppsala. 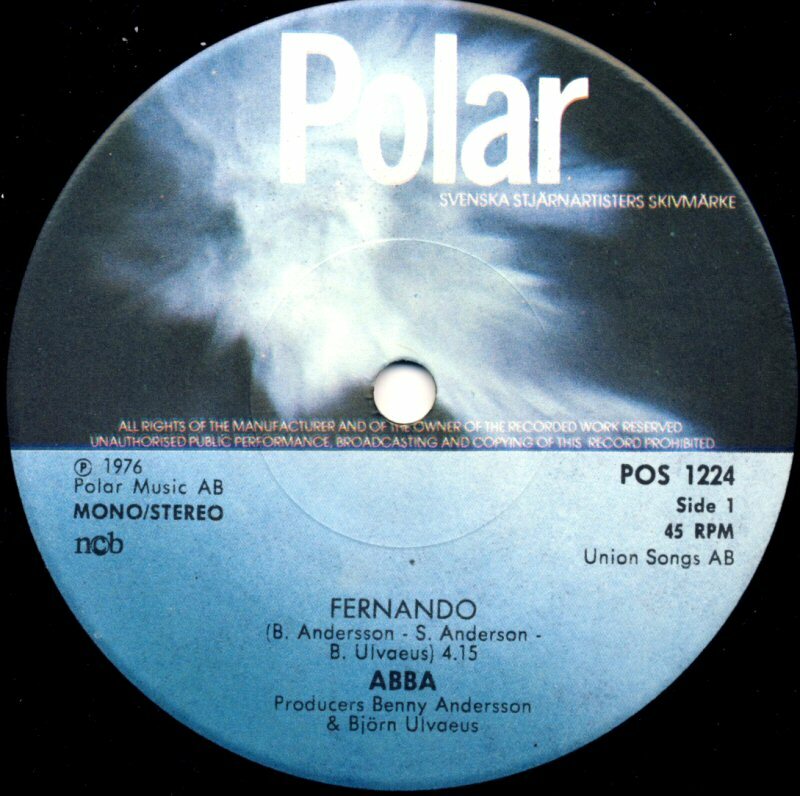 The press release from Polar Music that came out in March 76 informed among others about newly recorded TV shows promoting "Fernando" in Monte Carlo and Paris and ABBA fever in Australia. 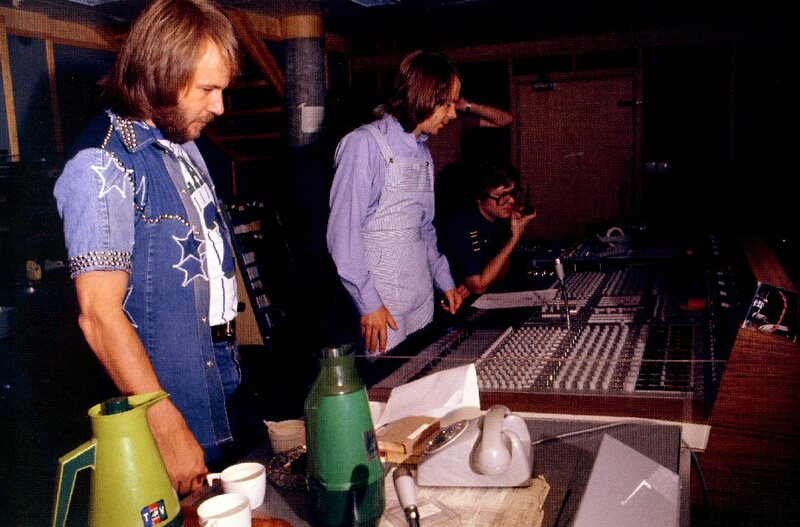 Three recording sessions were planned on 22-24 March and the album release in October 76. 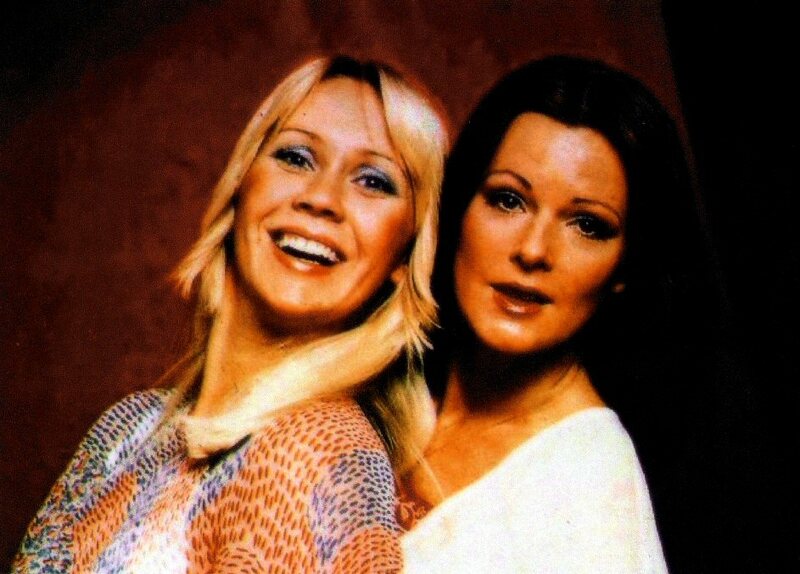 Agnetha and Anni-Frid would have time-off in March. 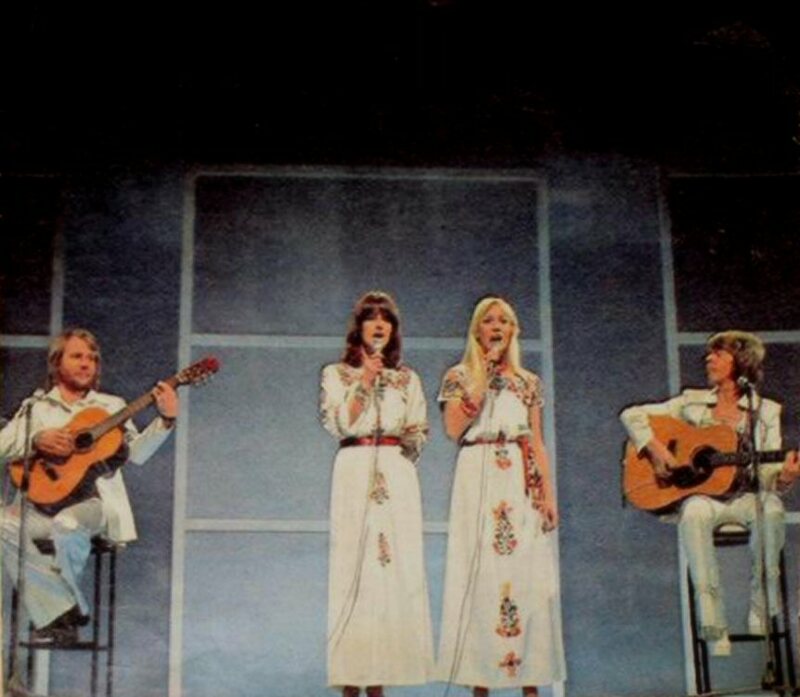 In April ABBA would go to Spain, England and Germany for promotion. 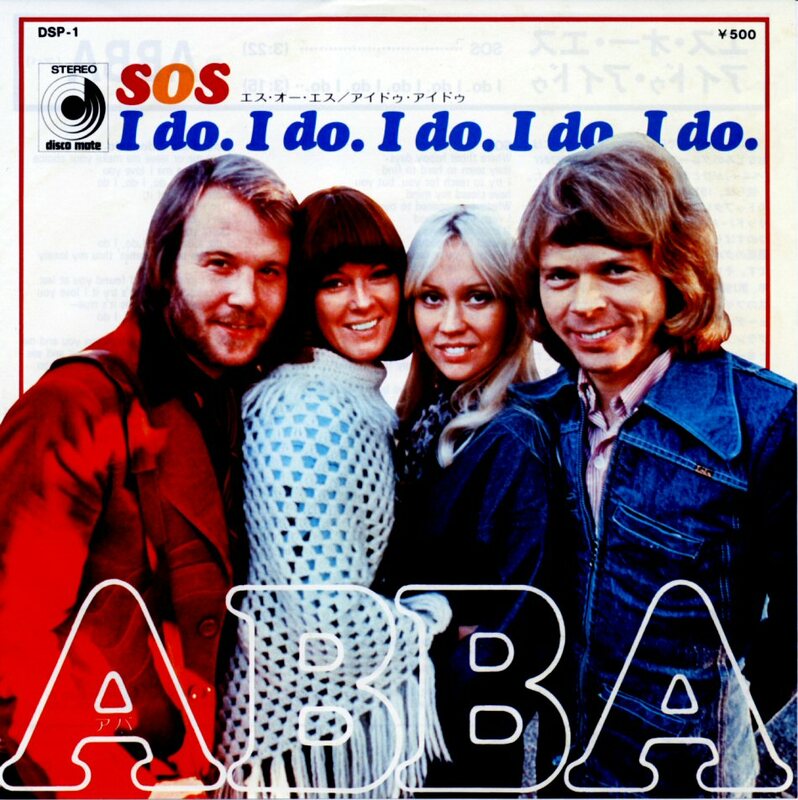 Among the news from hit charts there was information about the success of "I Do I Do" ("I Do" appeared in this version = twice) in USA, Mamma Mia in New Zealand, Germany, Australia, Switzerland, Norway and England. 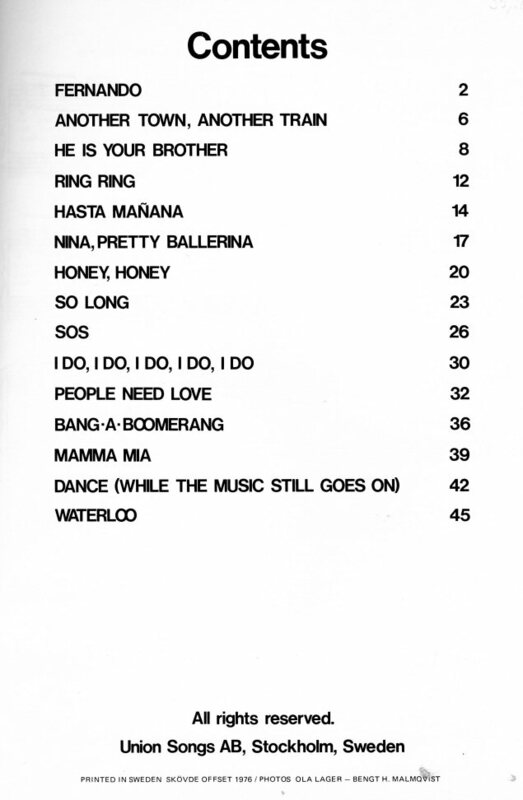 By that time "SOS" was #1 in Turkey, #8 in Italy. 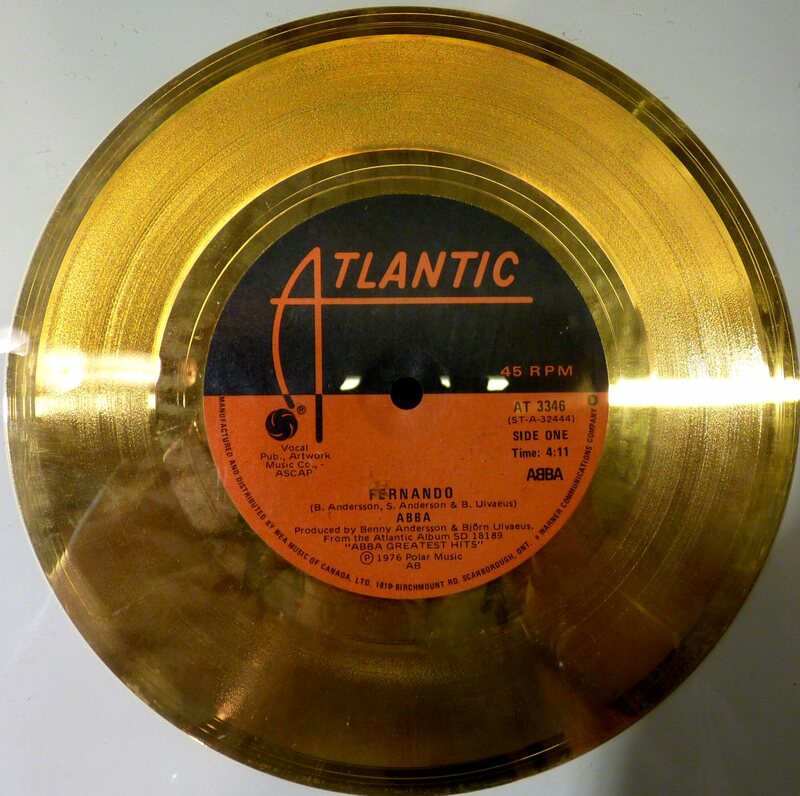 Finally it was announced that France was the first land in the world releasing the single "Fernando" (see above). 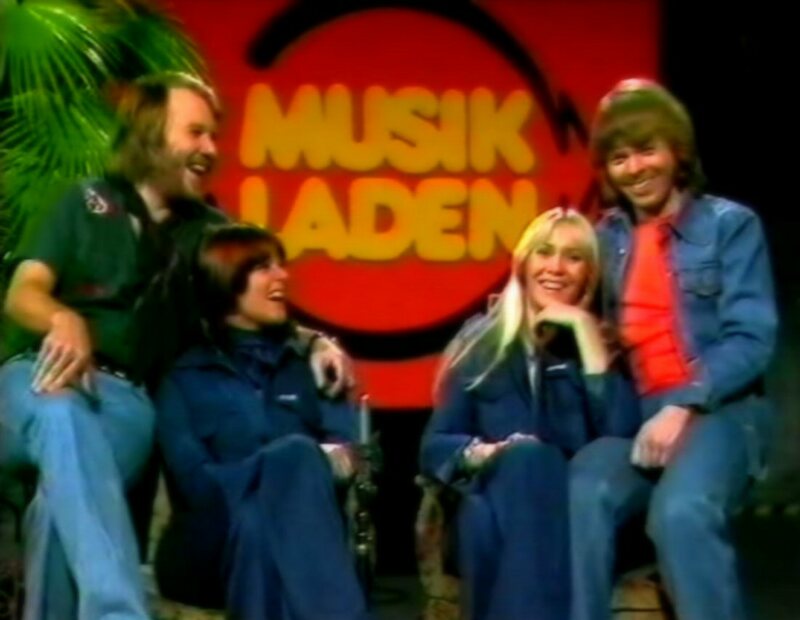 ABBA promoted "Fernando" in "Musikladen" on German TV. 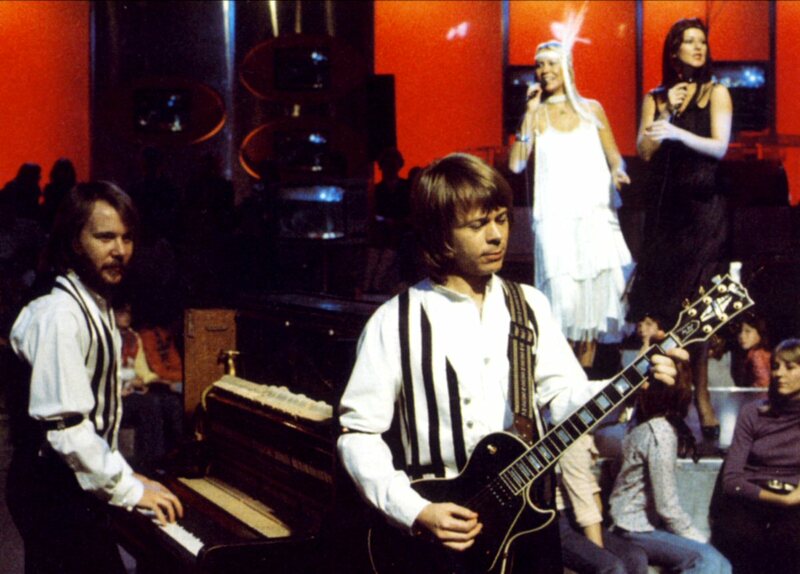 The show was broadcasted in Germany on March 6th, 1976. 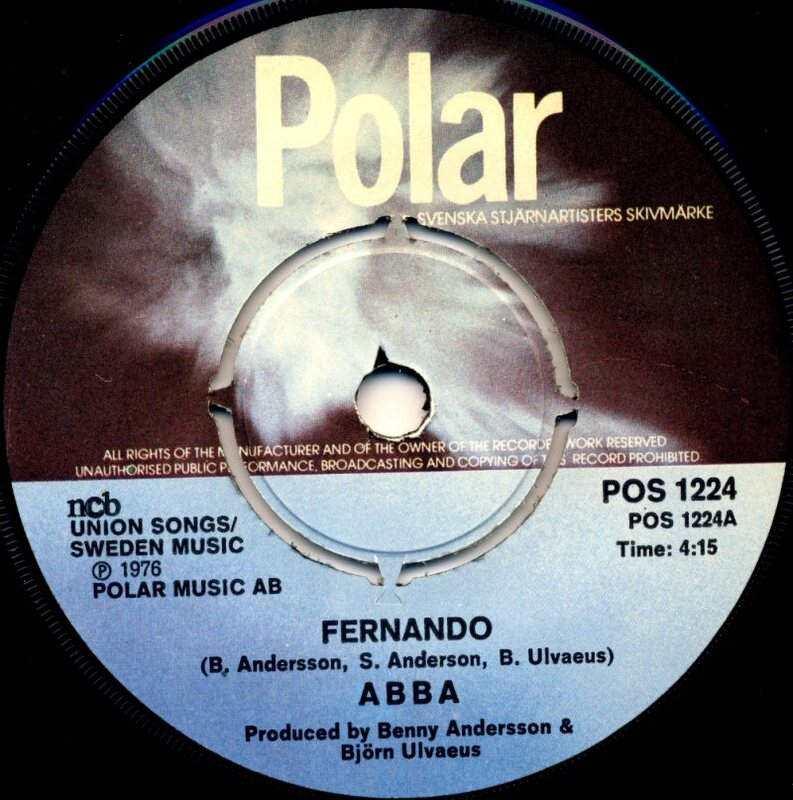 Fernando appeared on the Danish compilation in the series "For fuld musik" among other big hits of 1976. 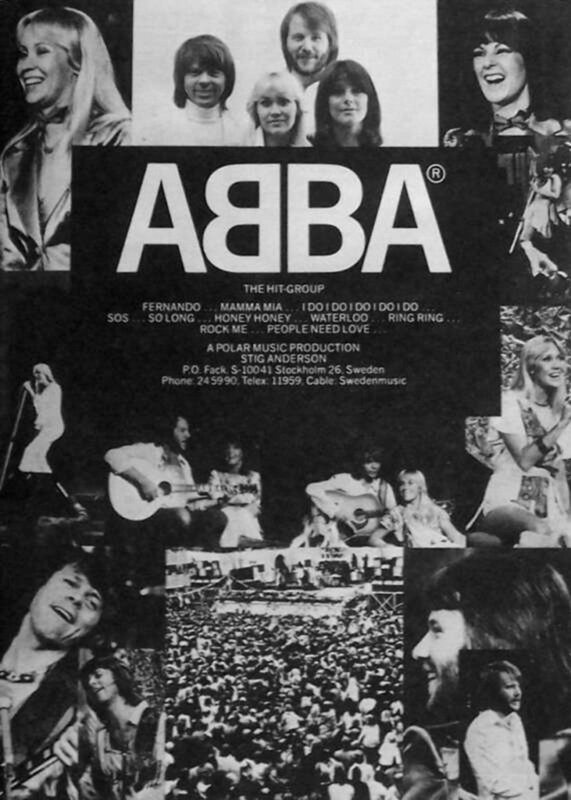 The compilation was released during late autumn 1976. 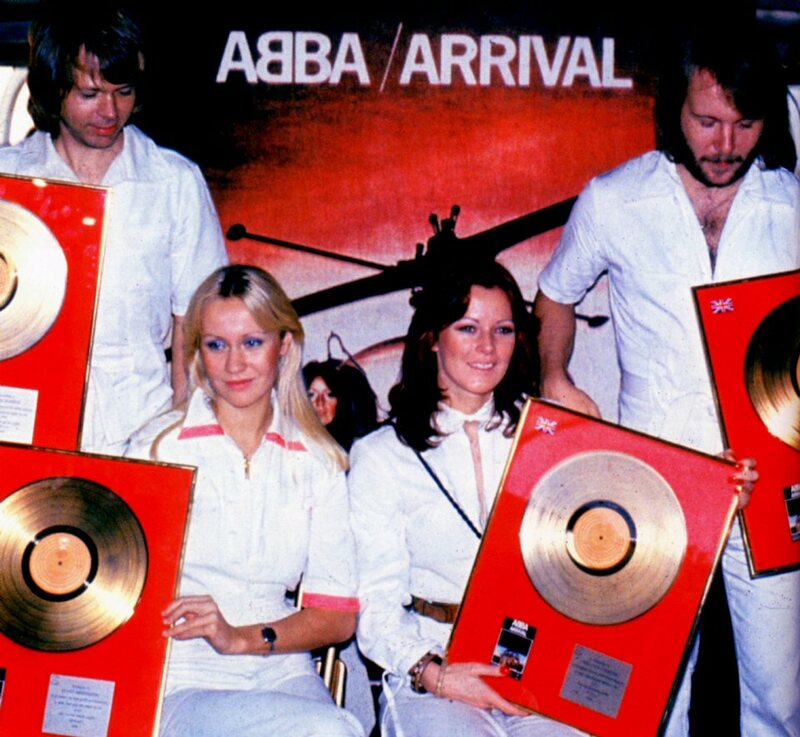 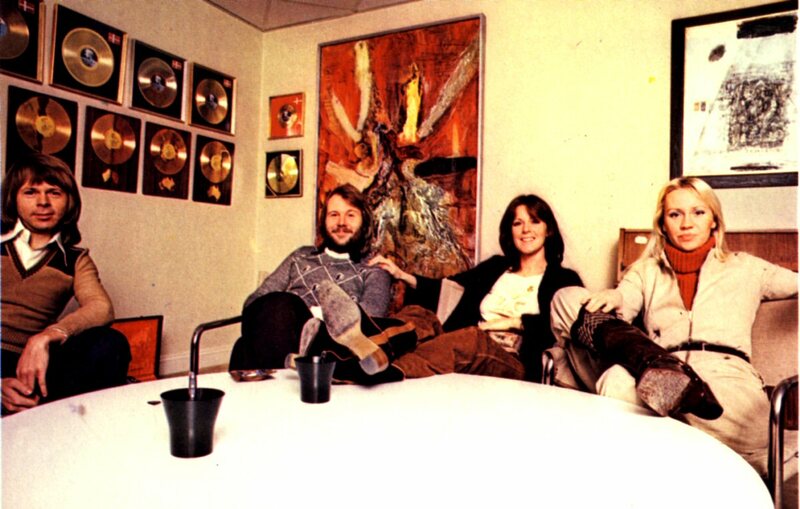 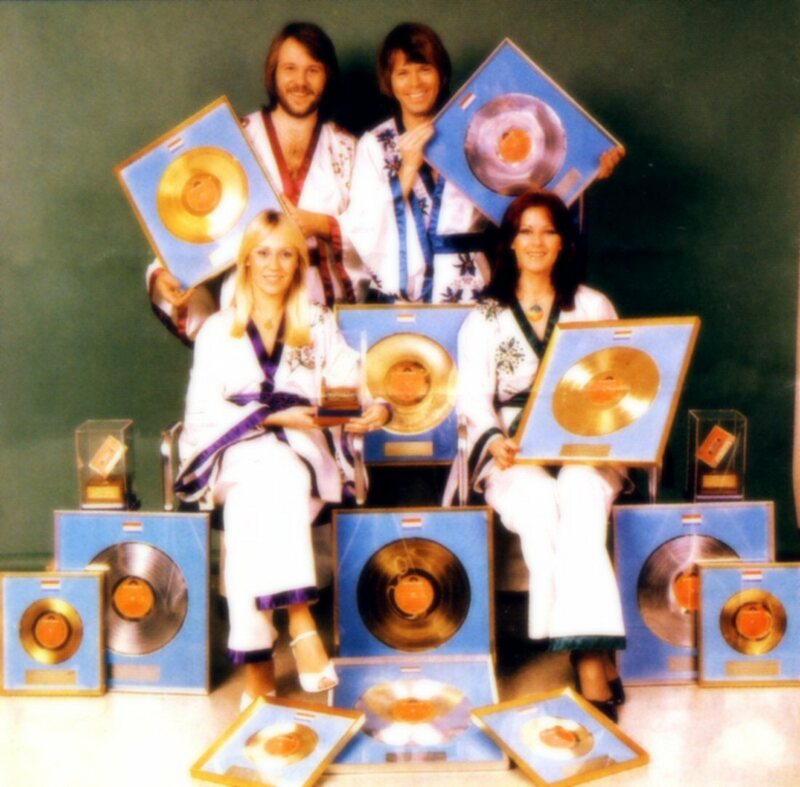 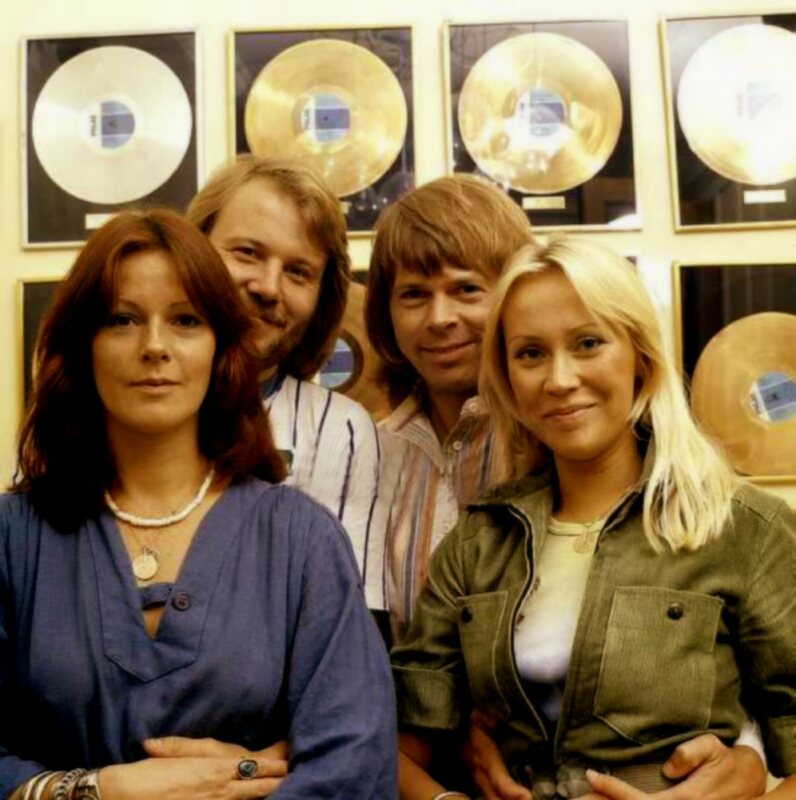 ABBA received gold records for sales of their third studio album "ABBA" in Sweden at the beginning of 1976. 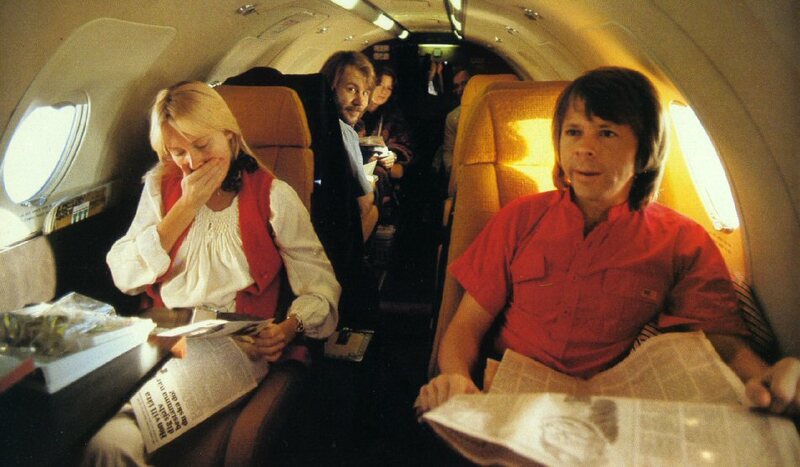 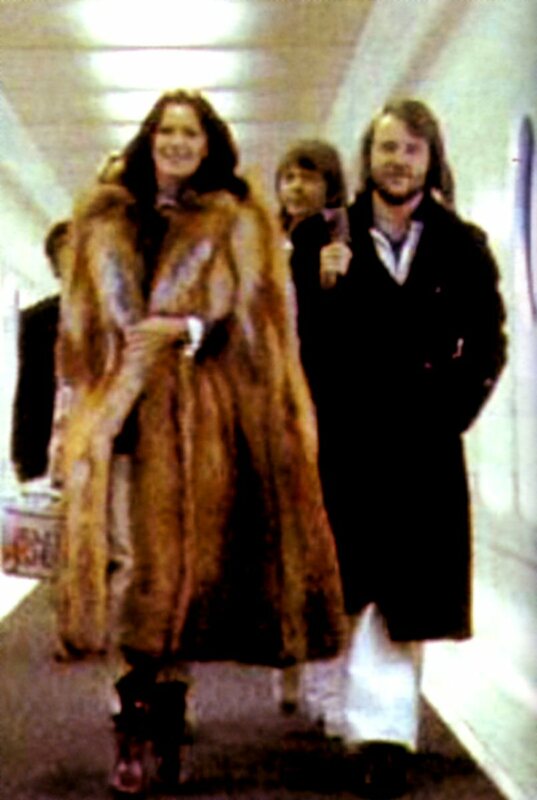 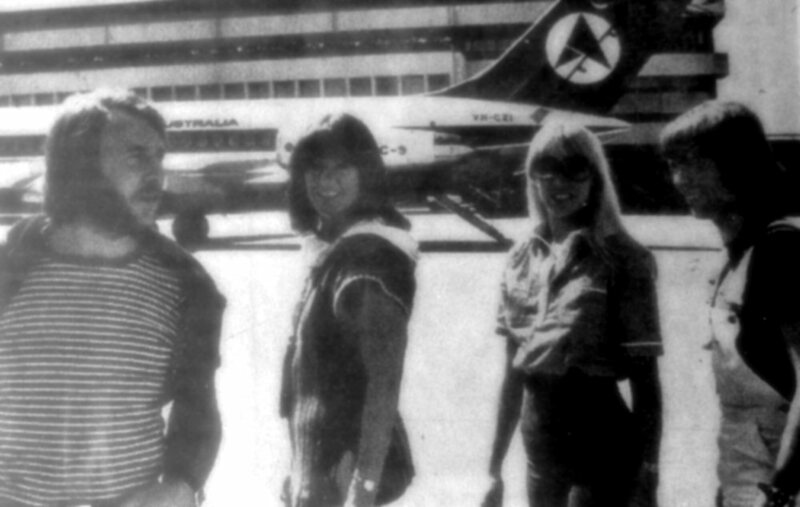 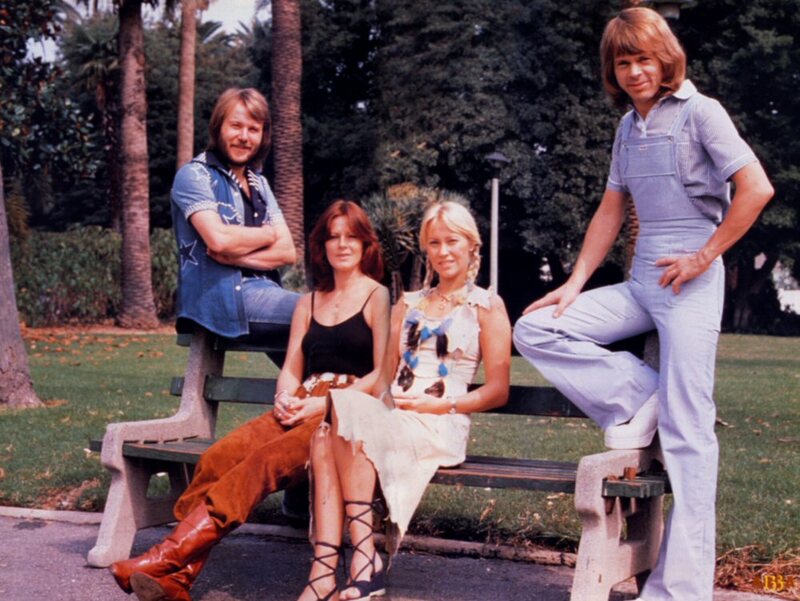 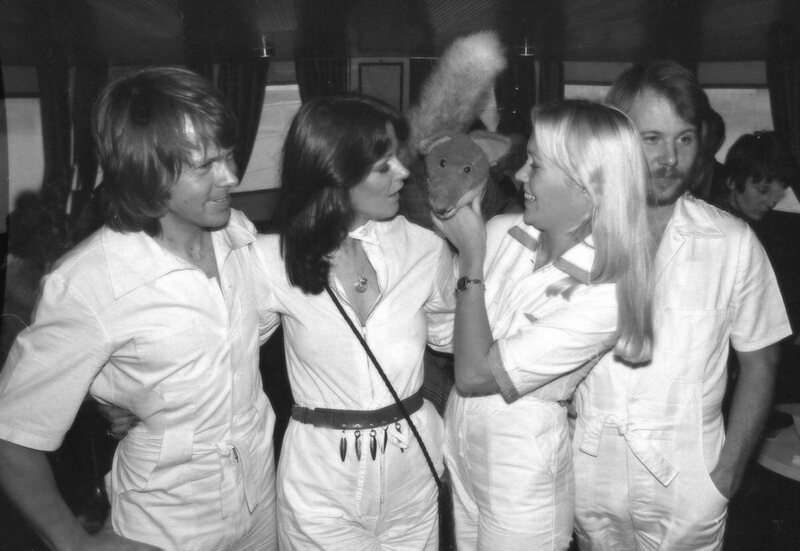 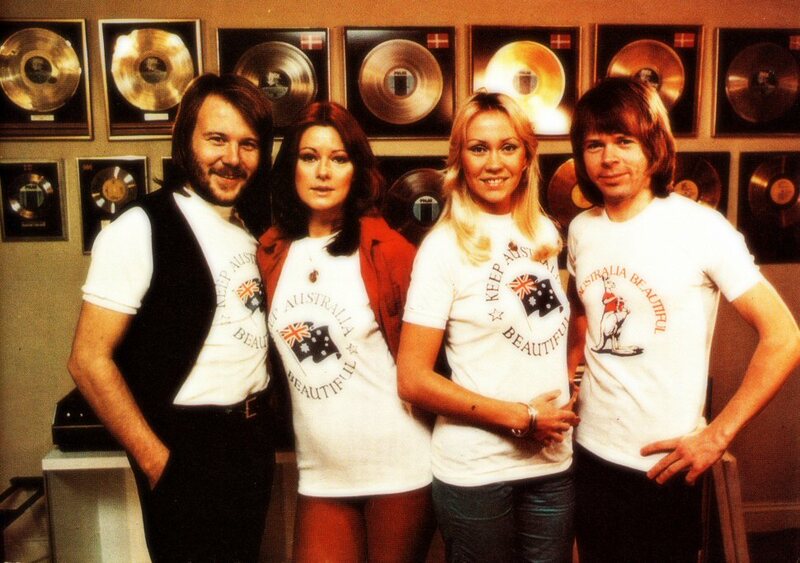 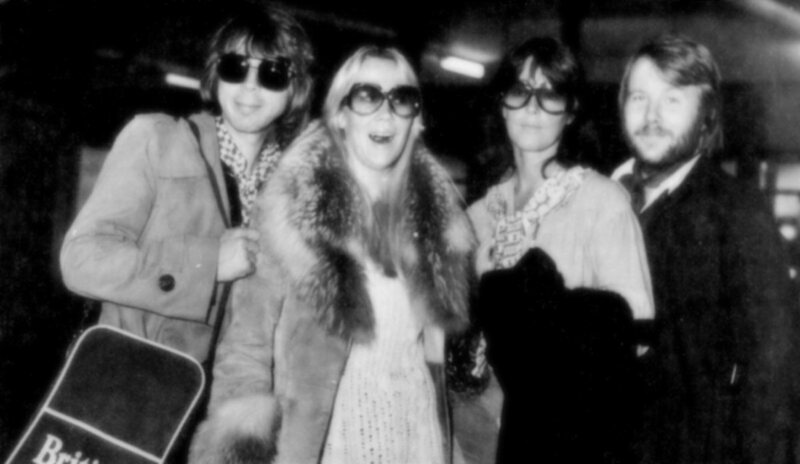 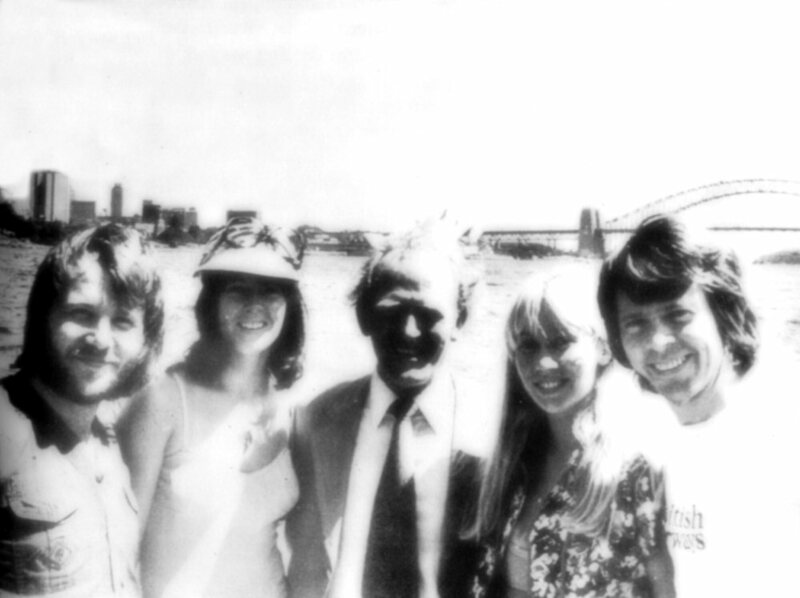 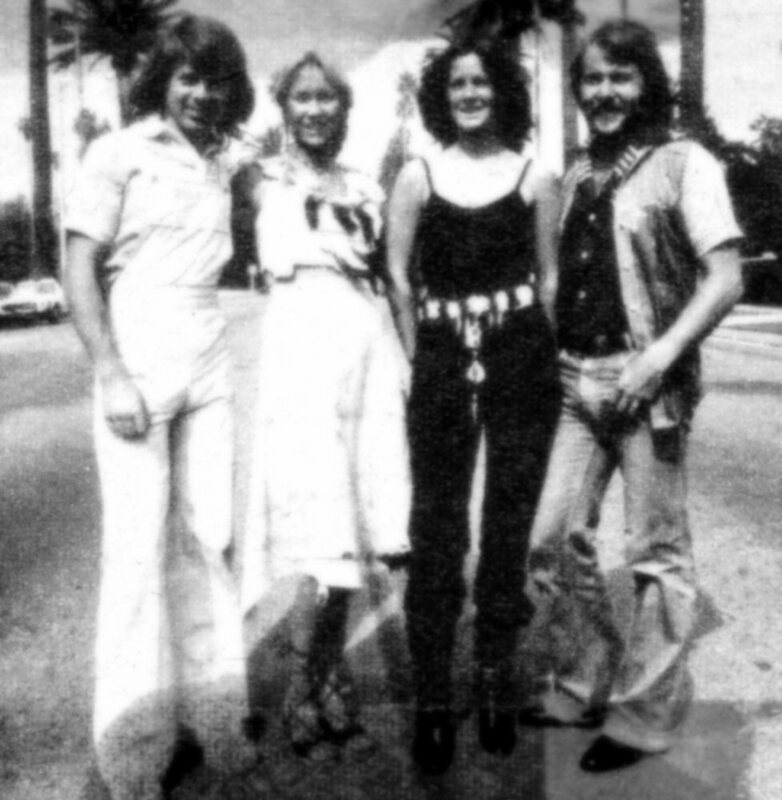 In March ABBA did a short promotional trip to Australia. 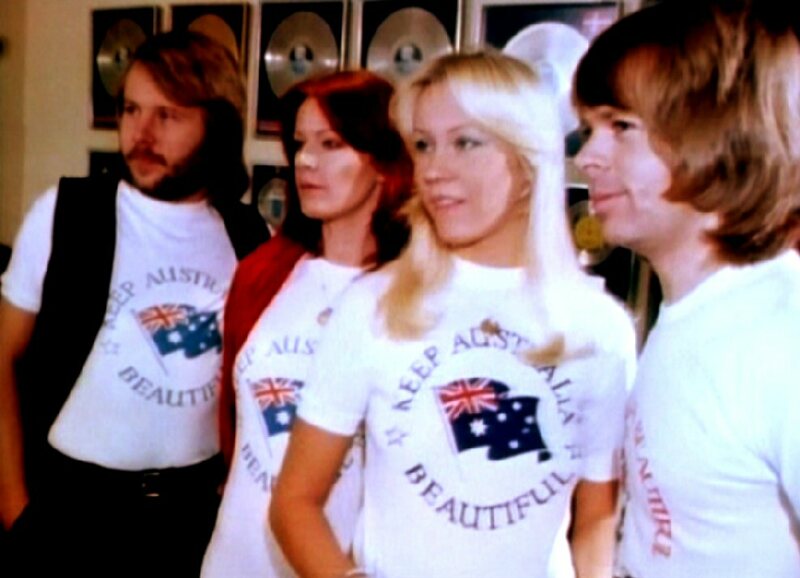 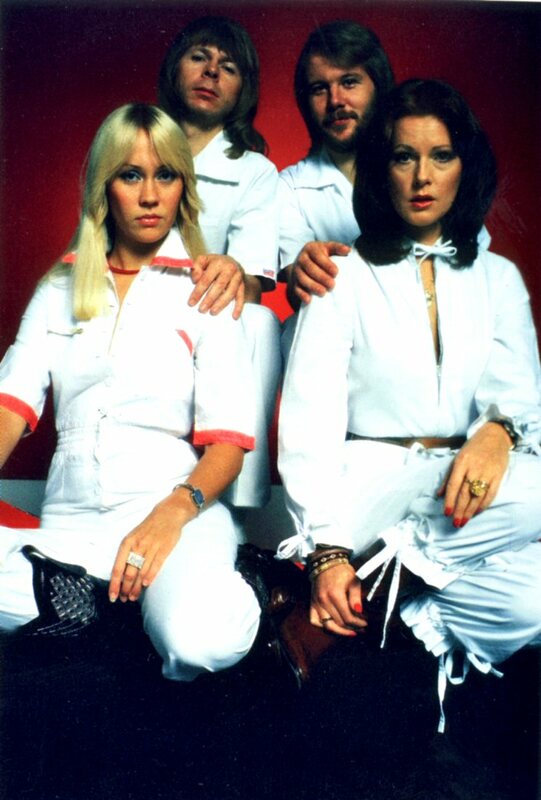 The ABBA fever had started in Australia at the end of 1975 after several hits on Australian charts. 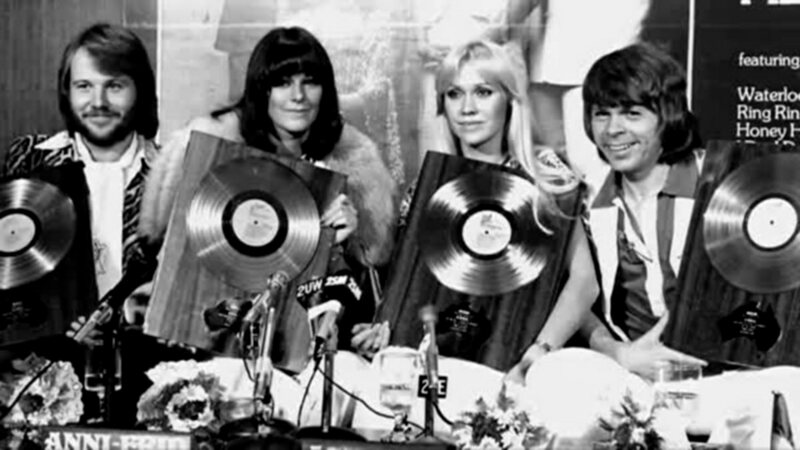 The group participated in several press conferences. 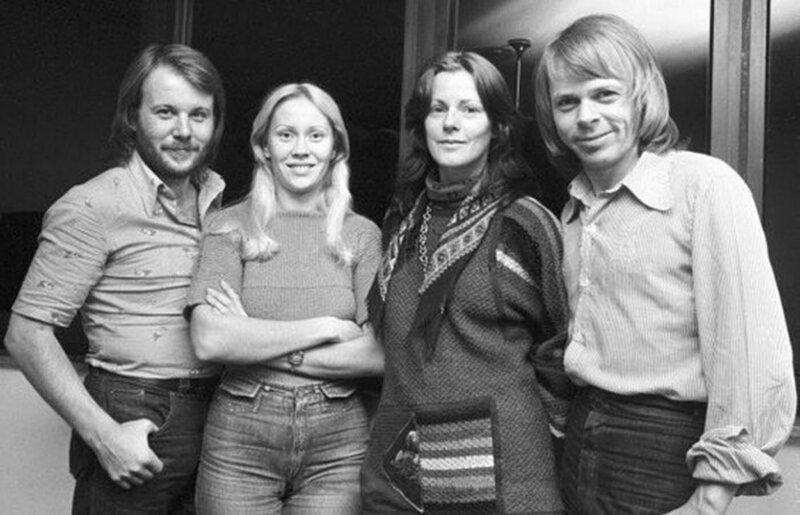 They promoted their latest compilation album "The best of ABBA" which had been released three months earlier, in December 1975. 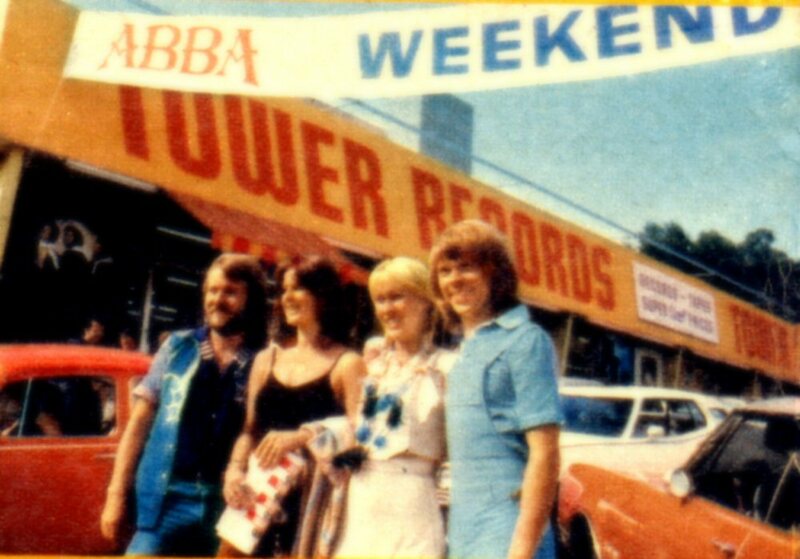 Promotion of "The best of ABBA"
ABBA recorded a 45-minute TV special during their nine-day visit in Sydney and Melbourne. 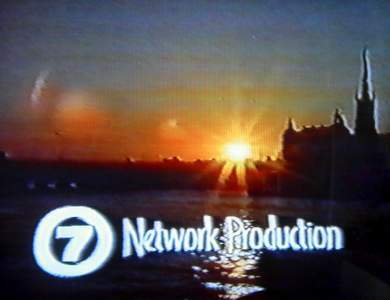 The main filming was made in the TCN9 studios and the group also visited renowned Sydney beauty spots and filmed segments to be made into a show for international release. 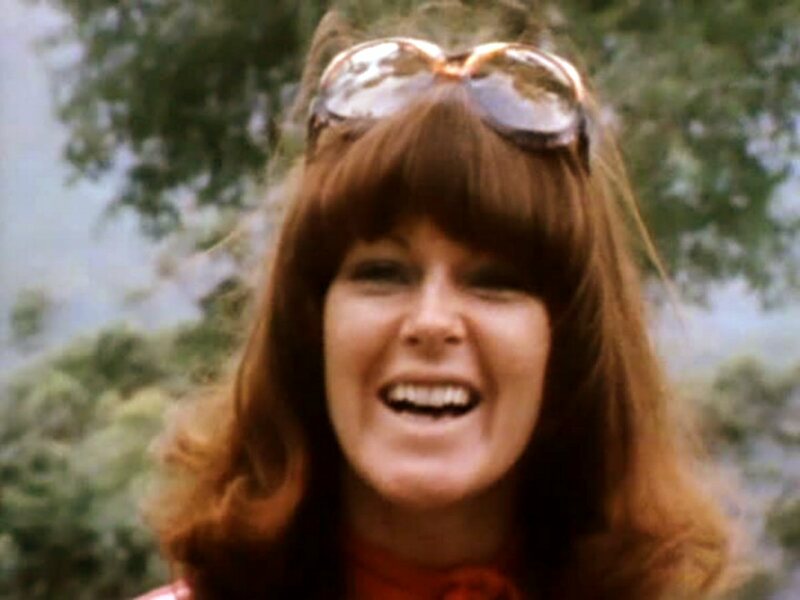 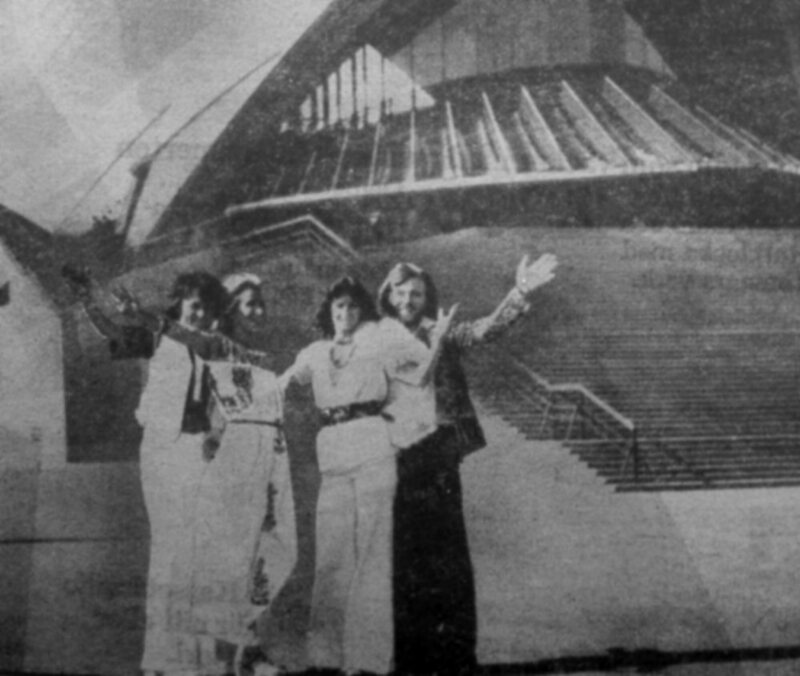 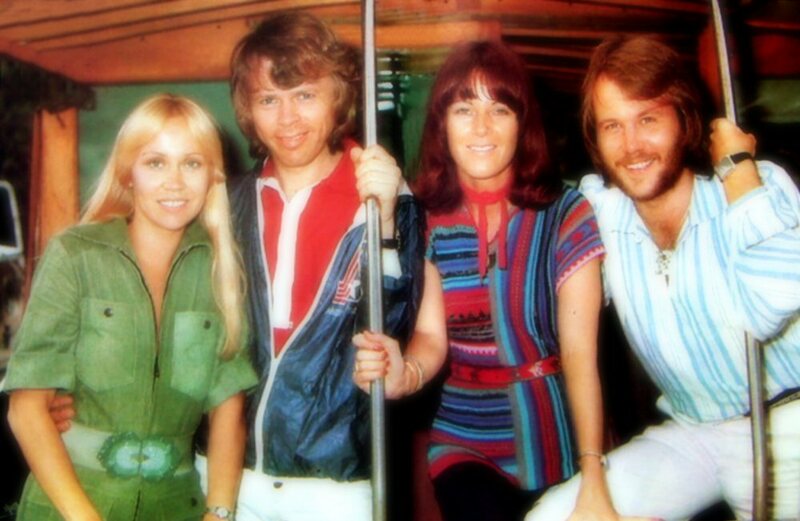 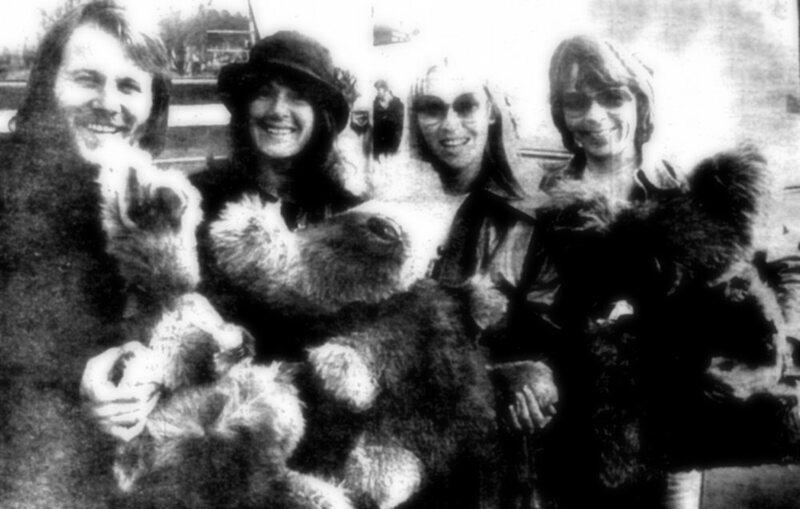 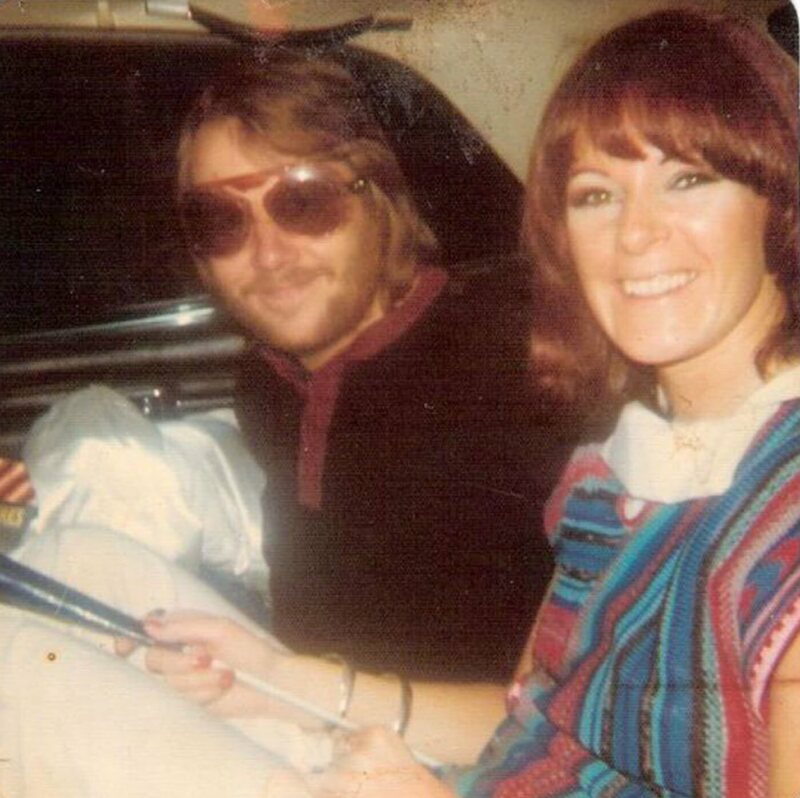 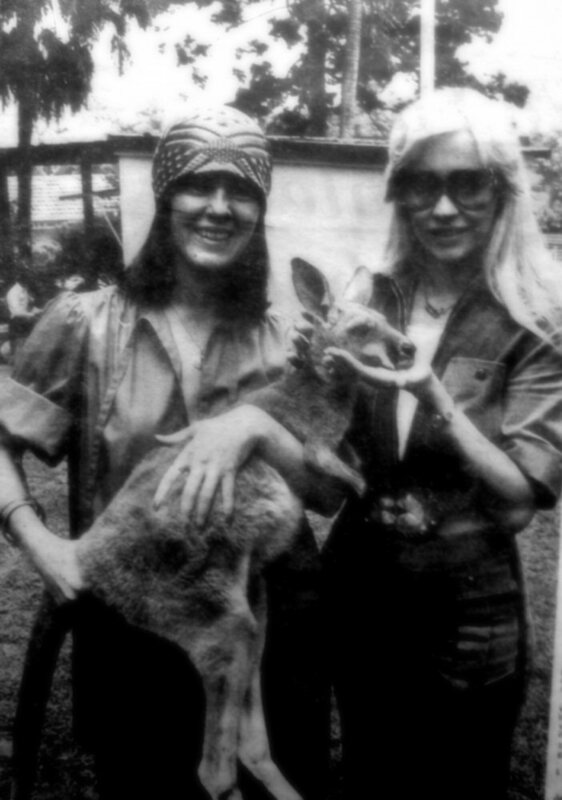 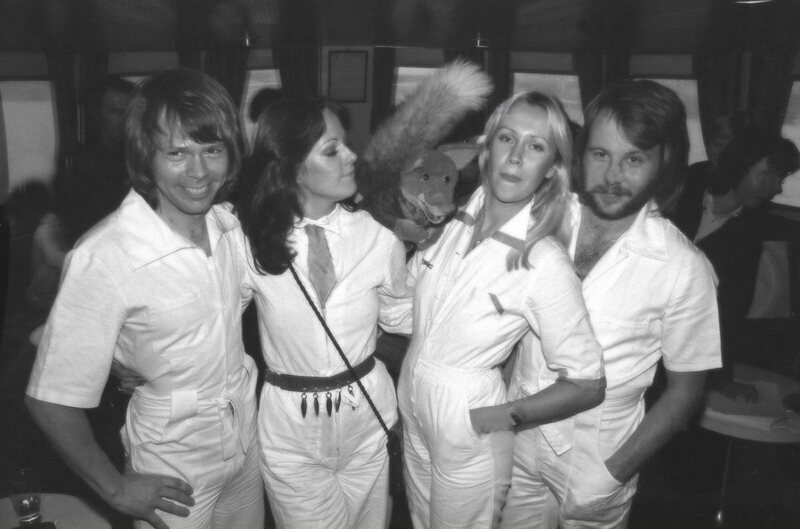 Overseas countries would see ABBA cruising up the Ilawkesbury River, taking a trip on Sydney Harbor, and visiting the koala sanctuary at Bobbin Head. 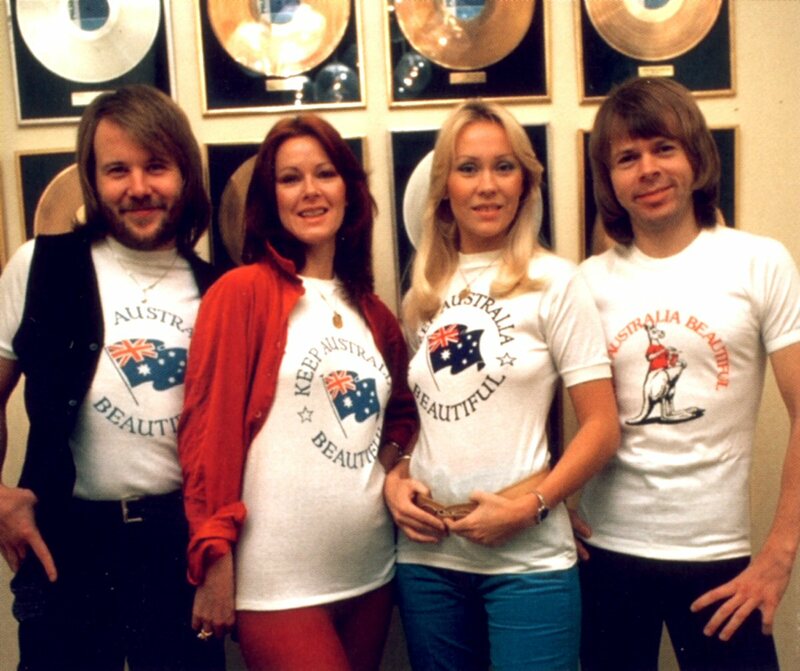 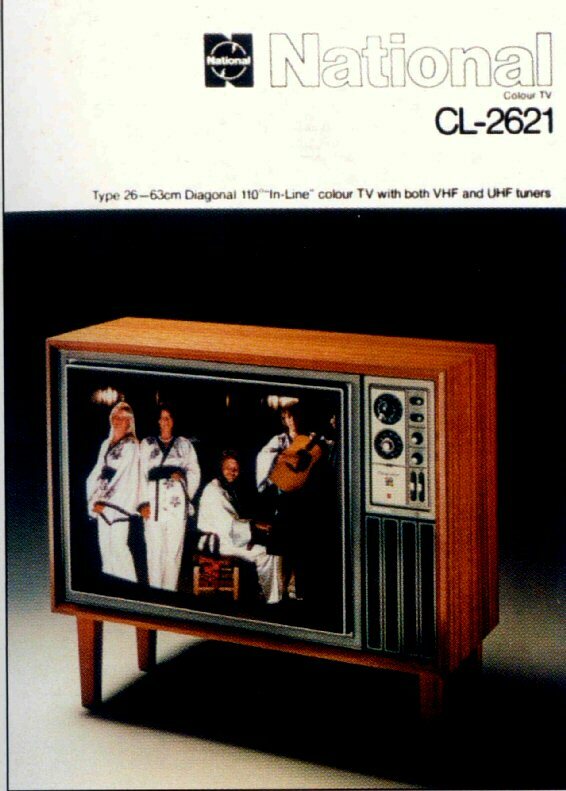 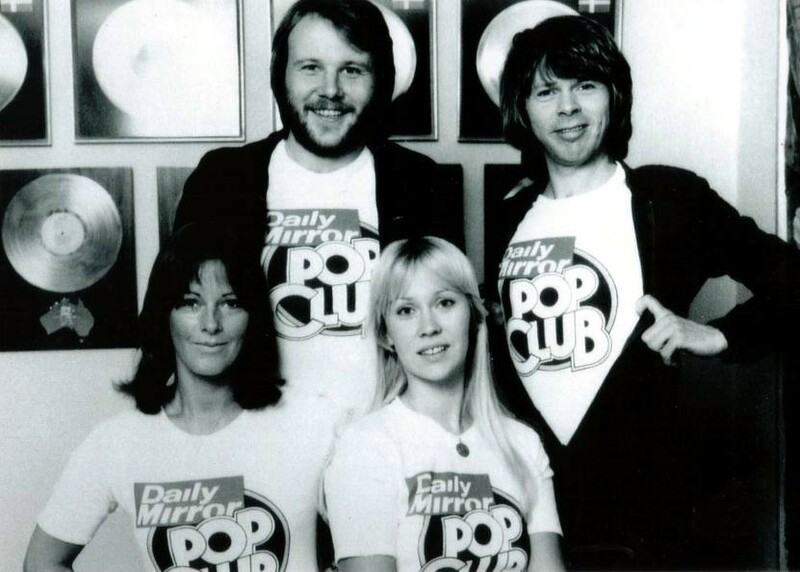 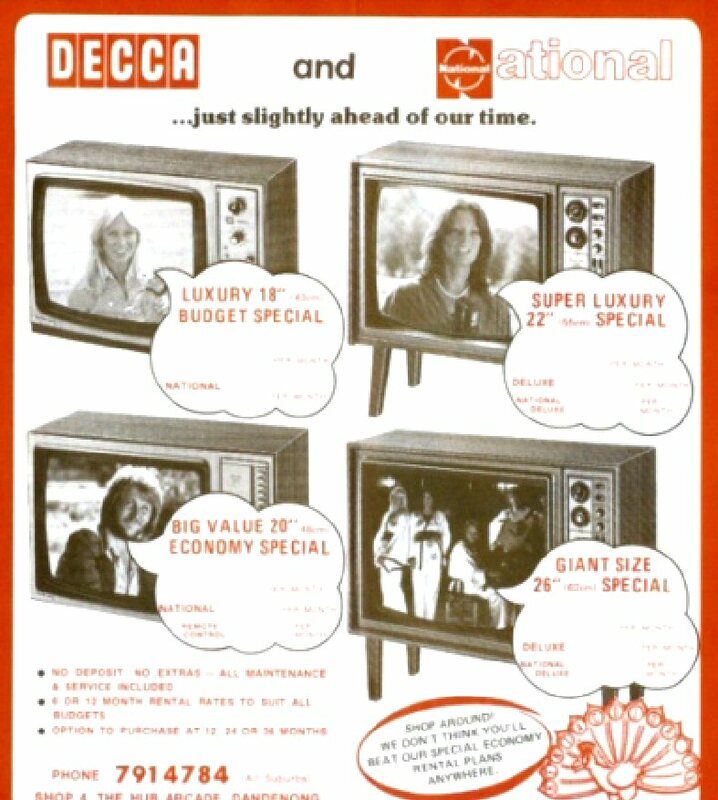 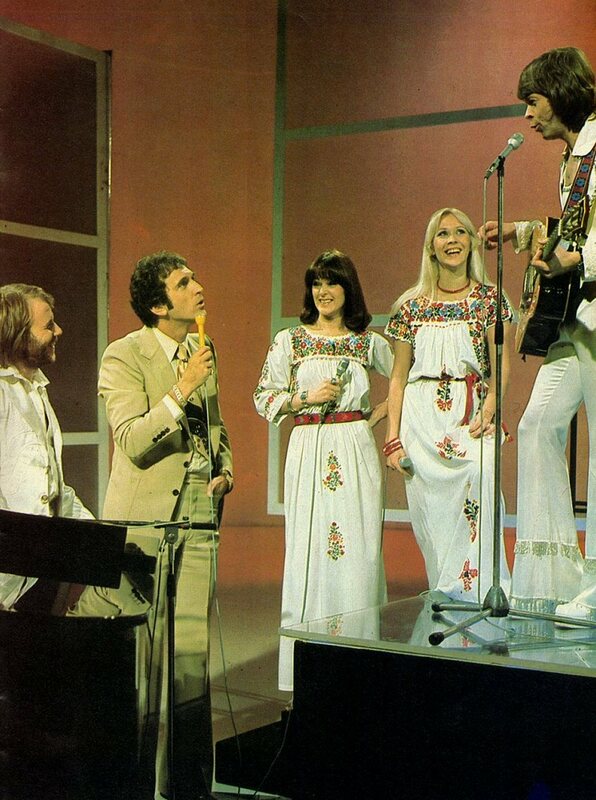 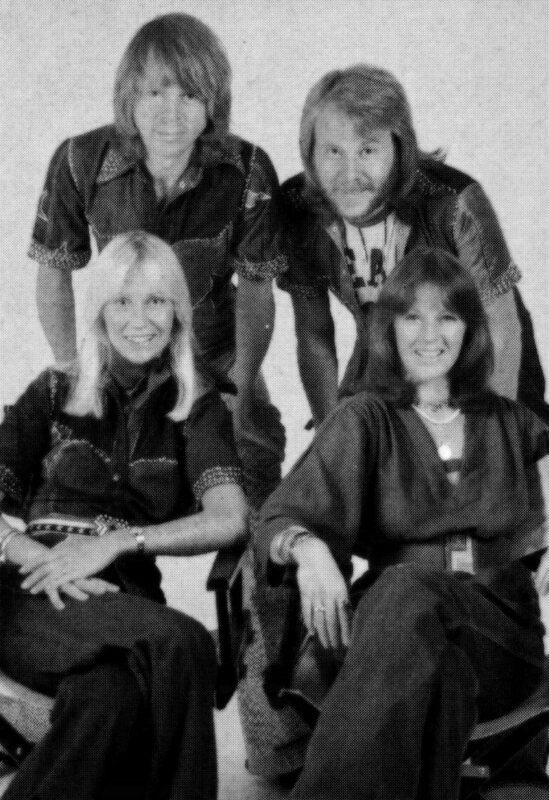 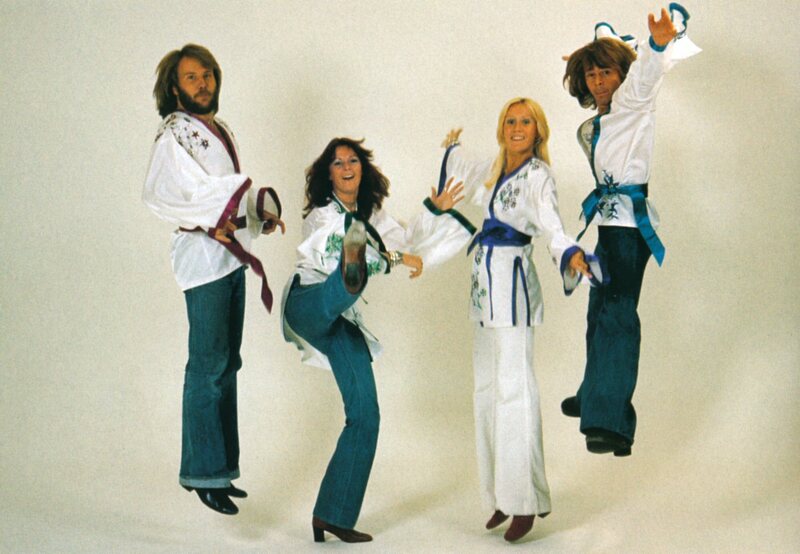 While ABBA were in Australia they also appeared on the Don Lane Show and Celebrity Squares. 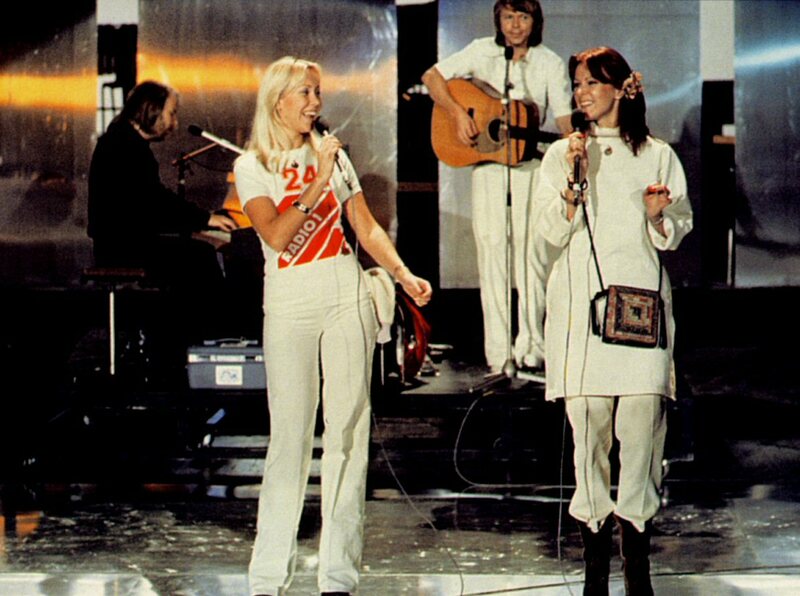 As an extra number ABBA performed "Dancing Queen" for the first time in the TV studio. 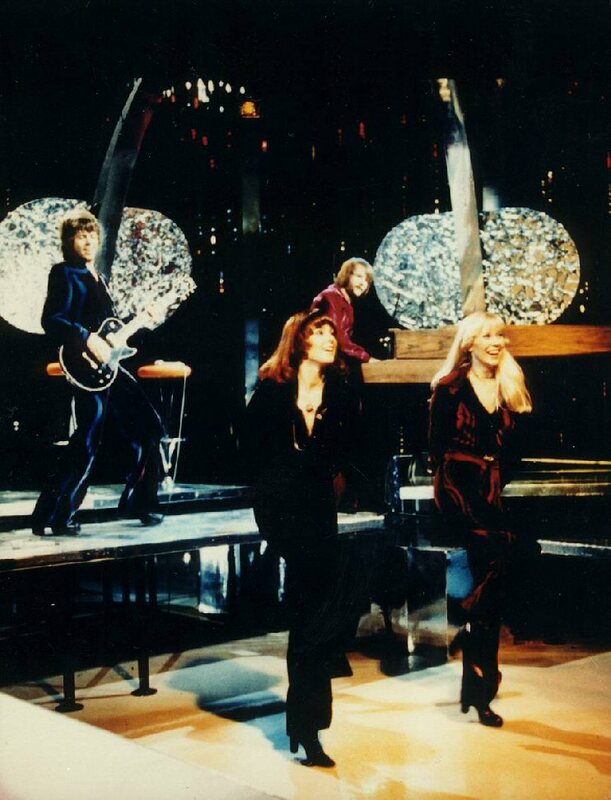 The video was sold to many TV stations all over the world. 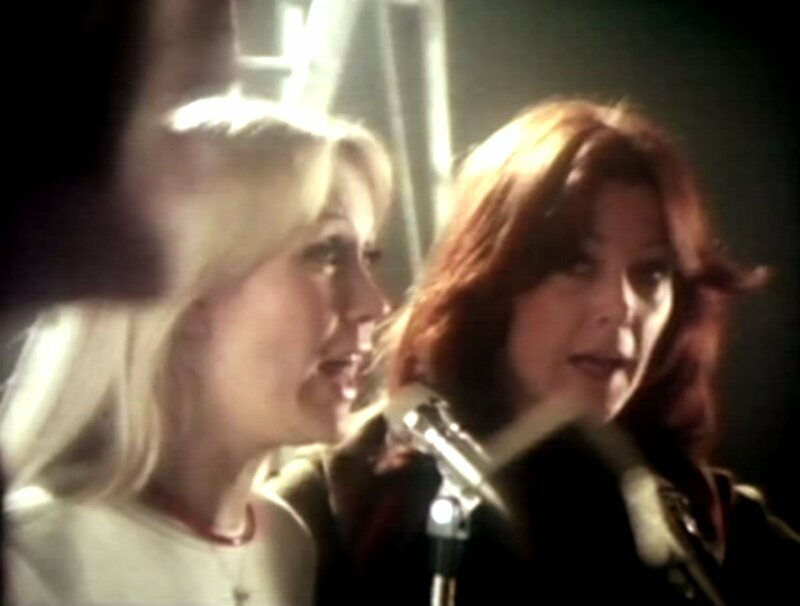 This version of "Dancing Queen" appeared in "Top of the Pops" show on British BBC many times. 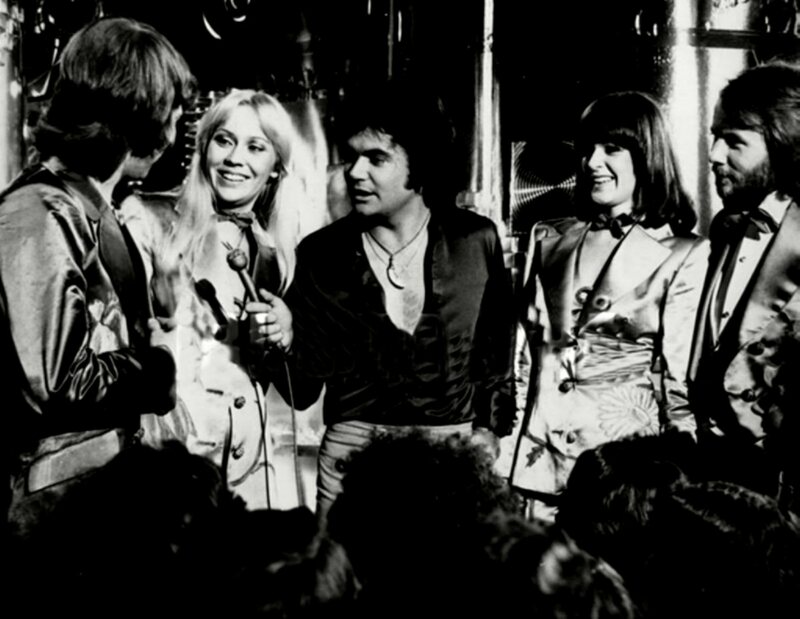 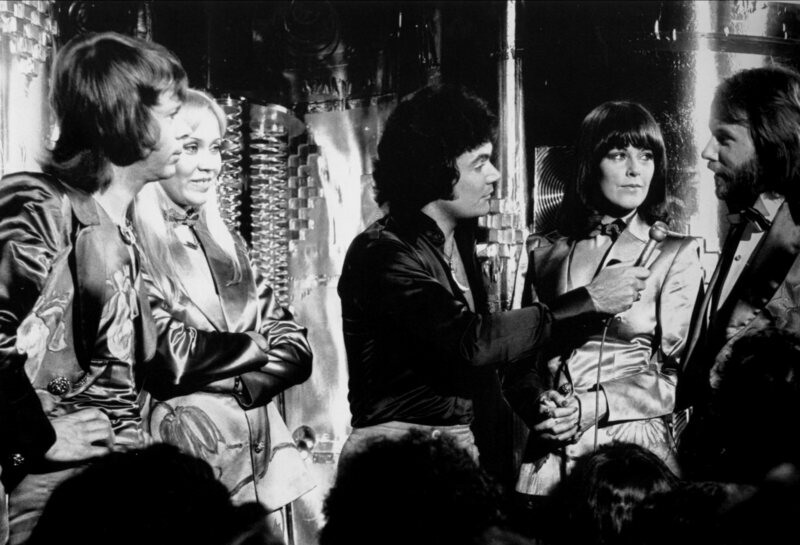 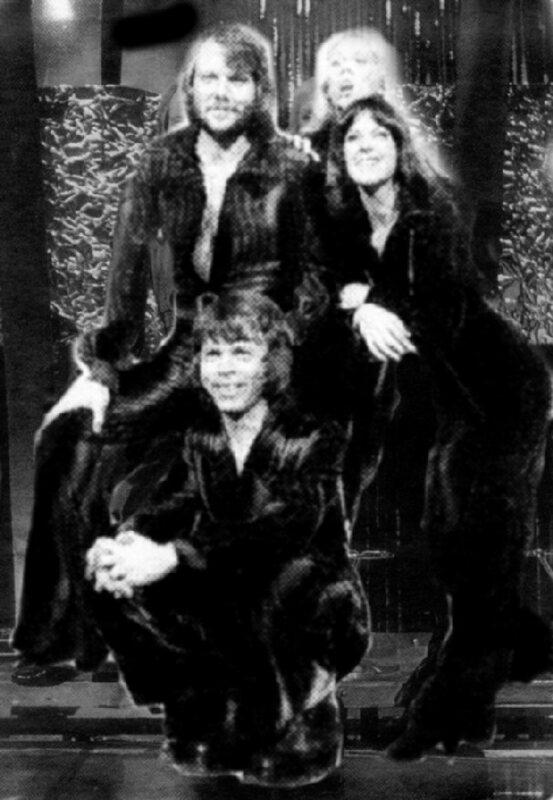 ABBA were interviewed by Daryl Somers in his show "Hey hey it's Saturday" during recording of their Bandstand special for the Nine Network. 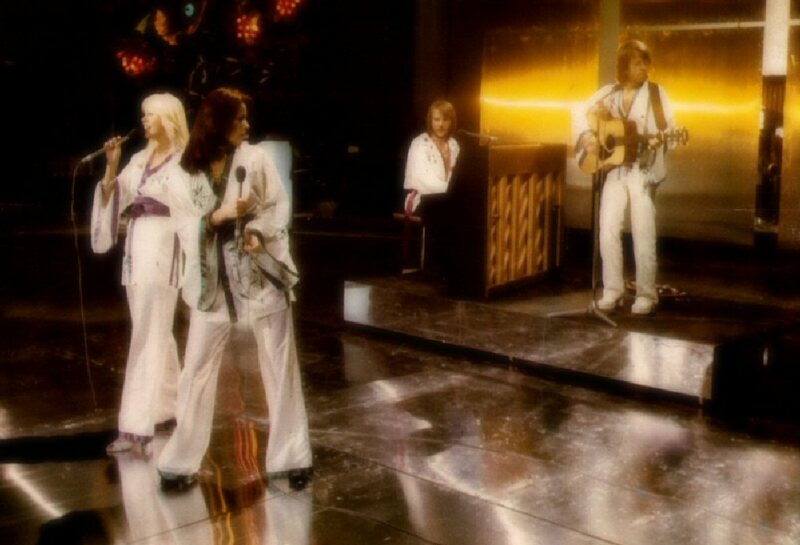 ABBA participated in the "Don Lane Show" broadcasted live on March 8th, 1977 by Channel 9 from Melbourne. 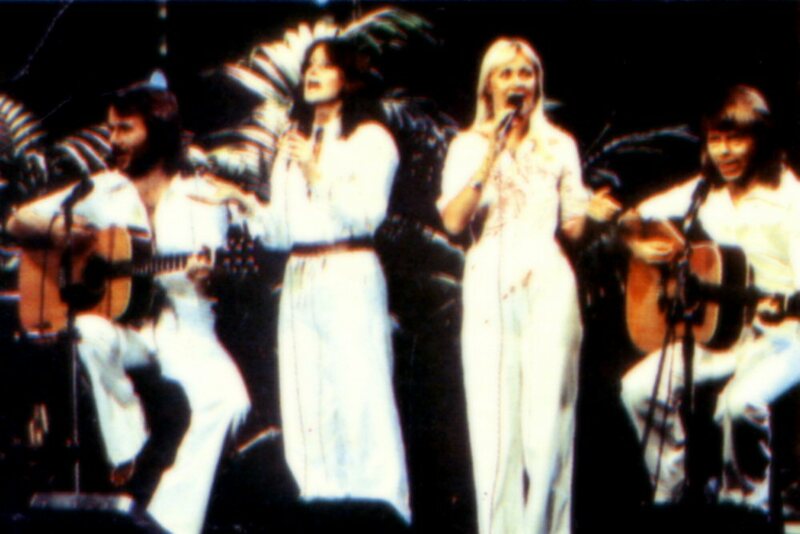 The group performed "SOS" and for the first time "Fernando" from the newly released single. 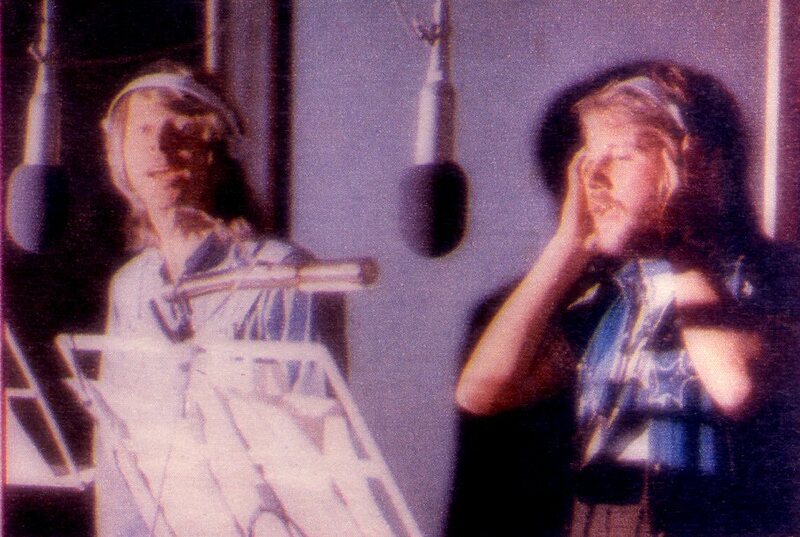 One more photo session was taken in the studio after the performance of "So Long" at the end of the show. 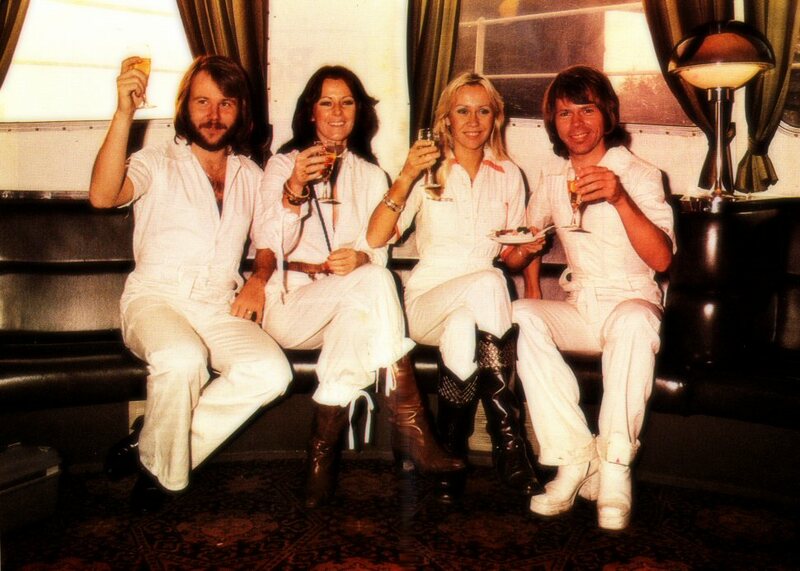 After 10 days in Australia ABBA were back in Stockholm on March 14th. 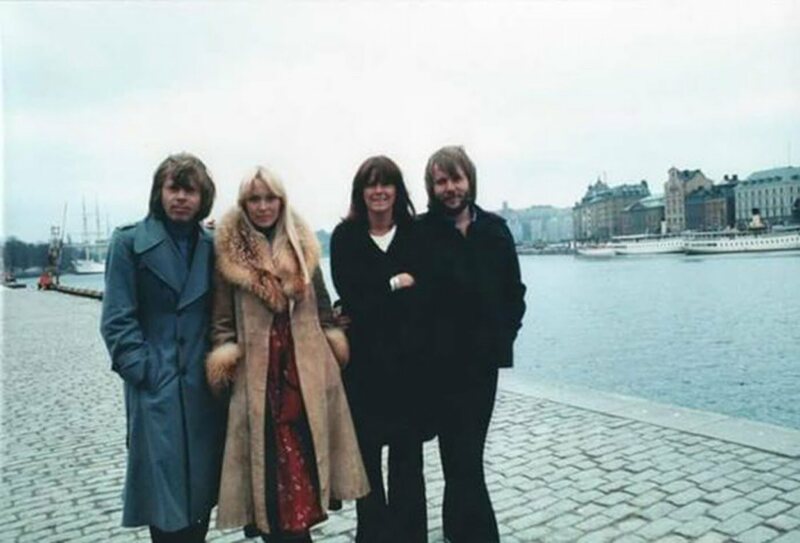 This photo session was taken at the end of March in Stockholm, partly at the group's office and partly outside the Grand Hotel in the part of the city called Östermalm. 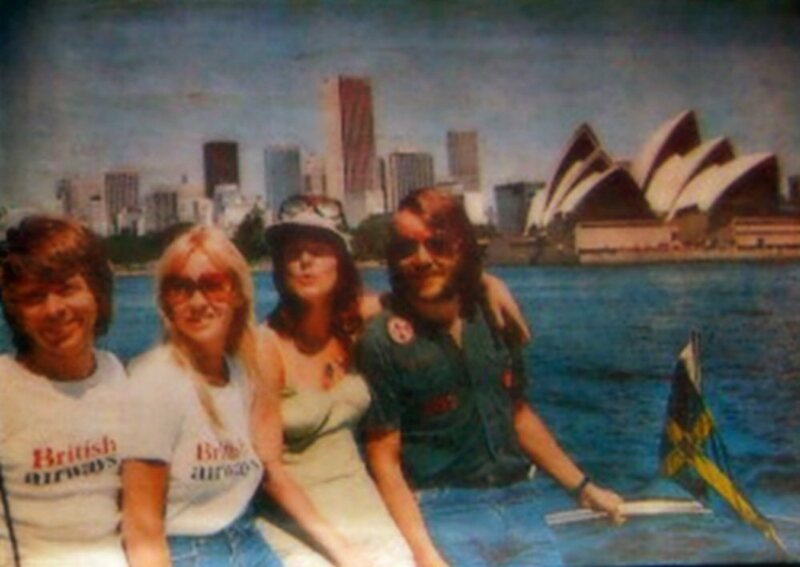 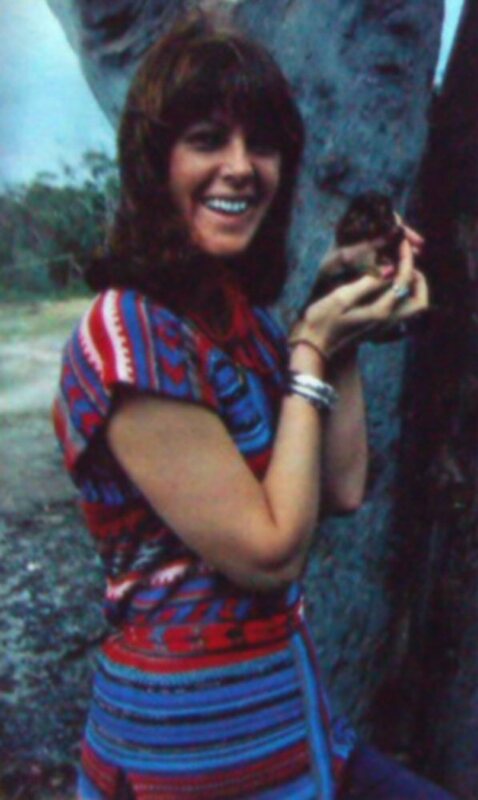 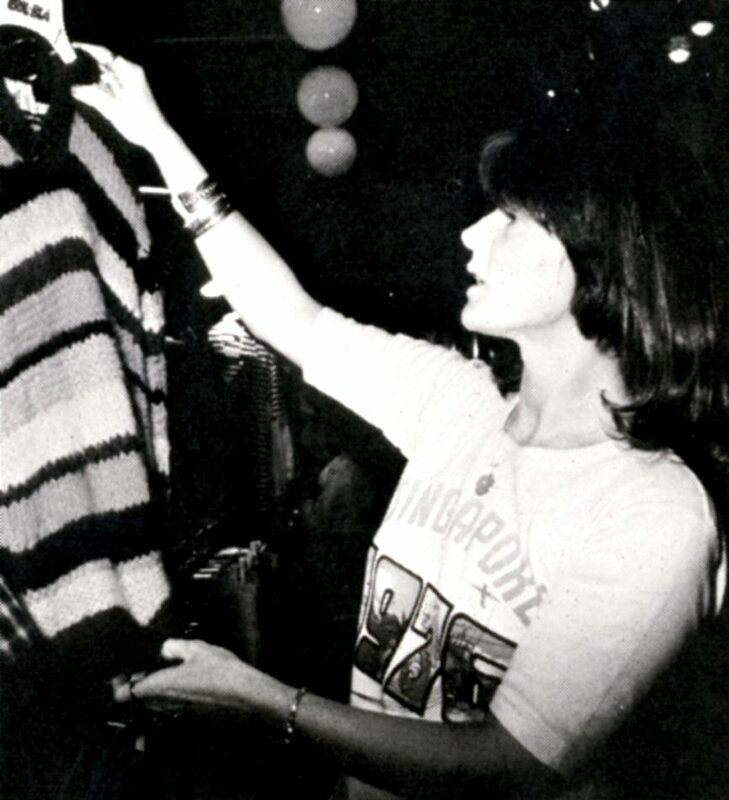 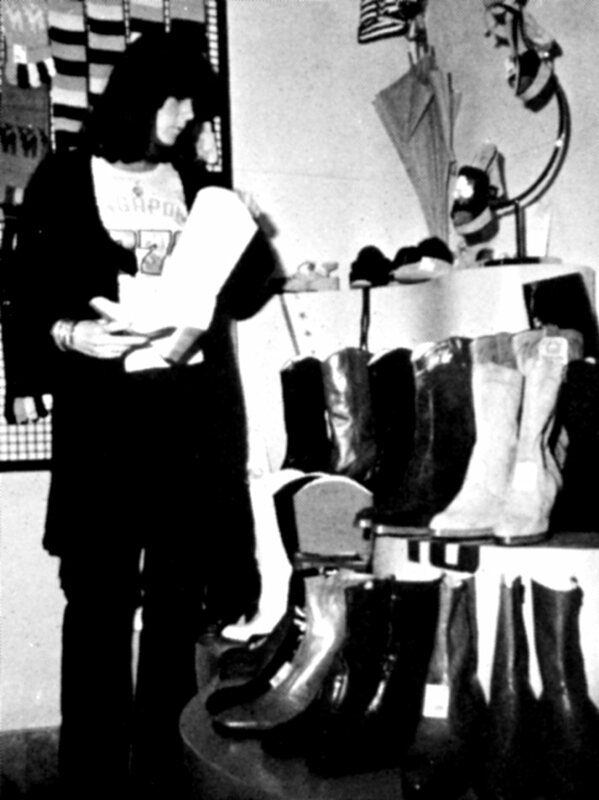 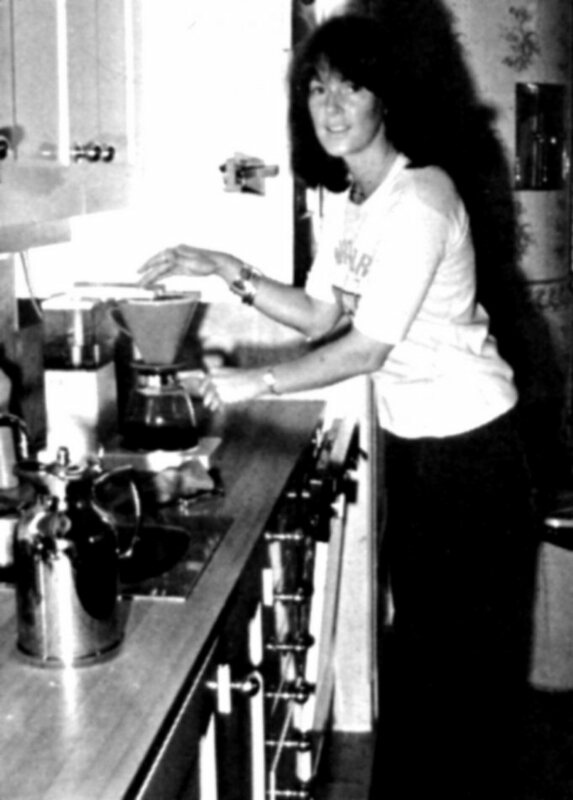 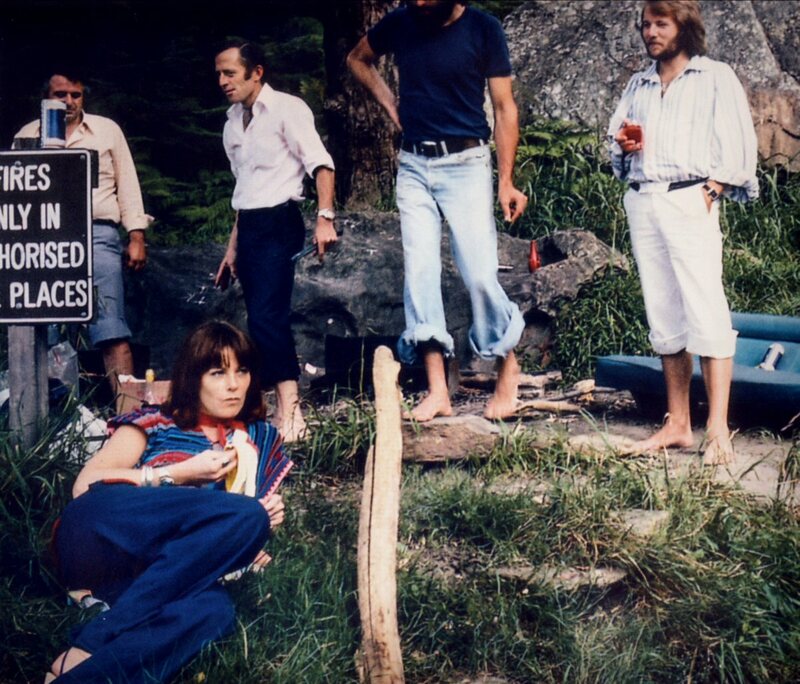 Frida wore T-shirt with text "Singapore 1976" which had been purchased in Singapore while the group changed plane on the way from Australia to Sweden. 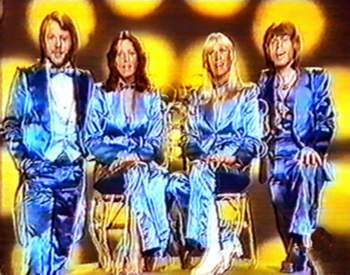 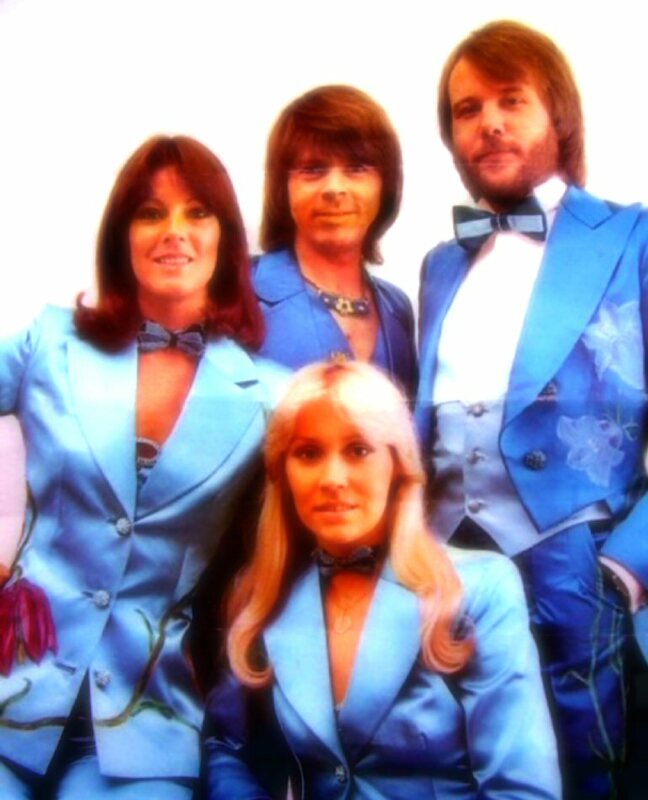 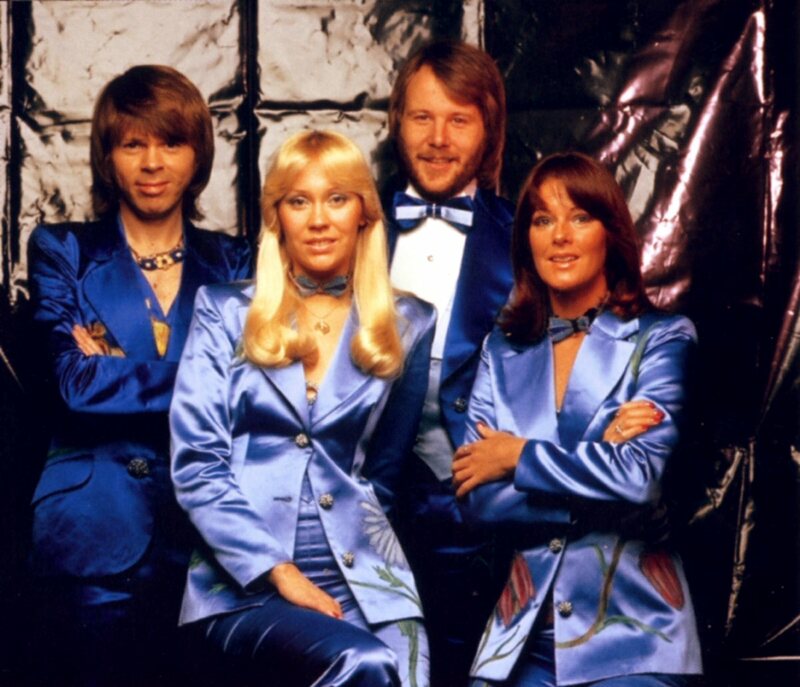 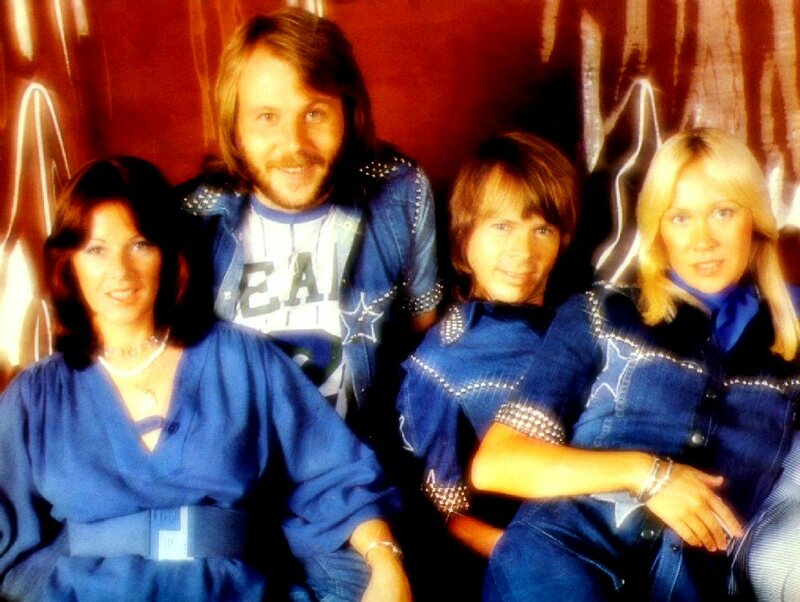 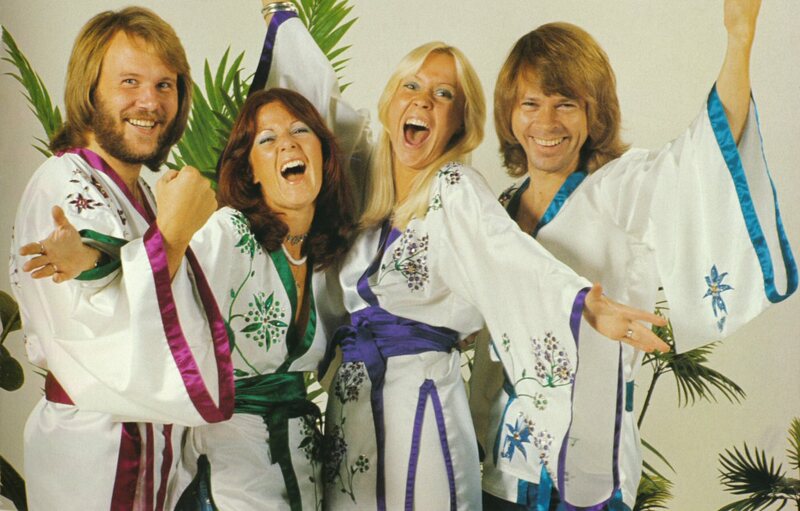 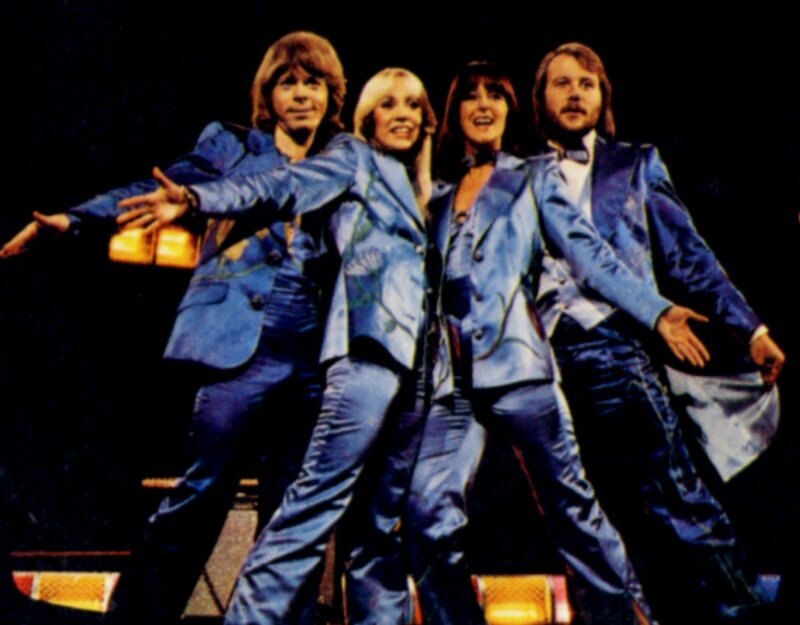 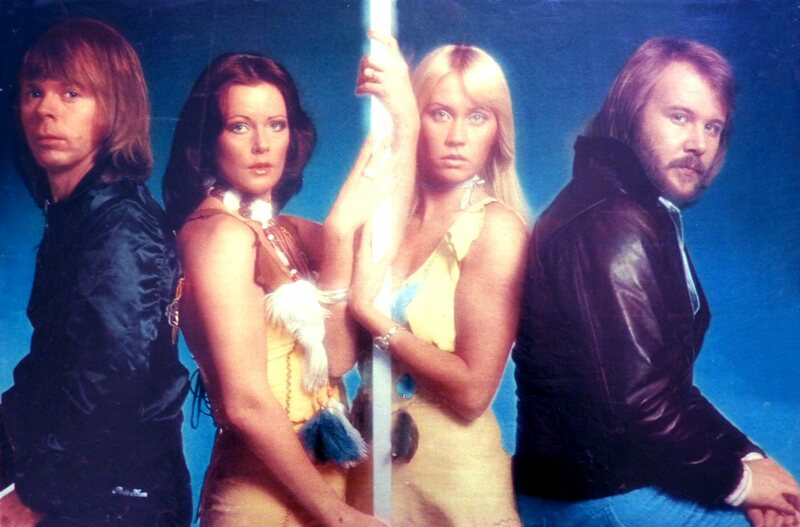 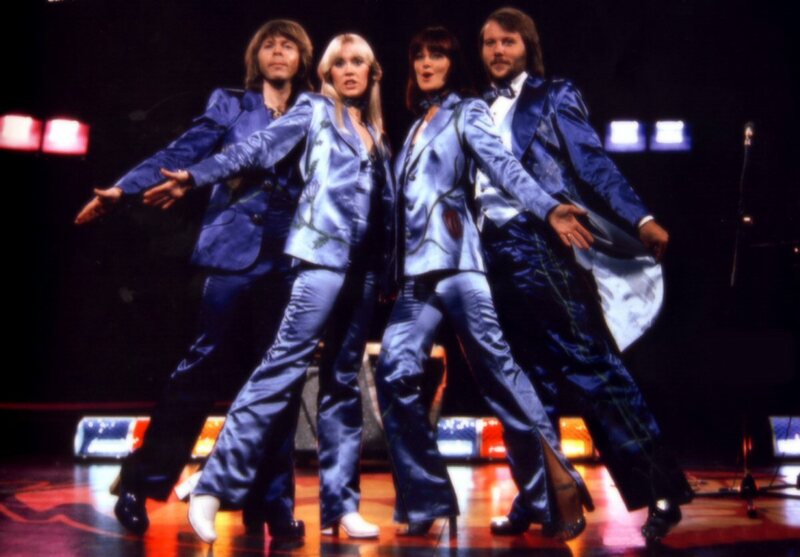 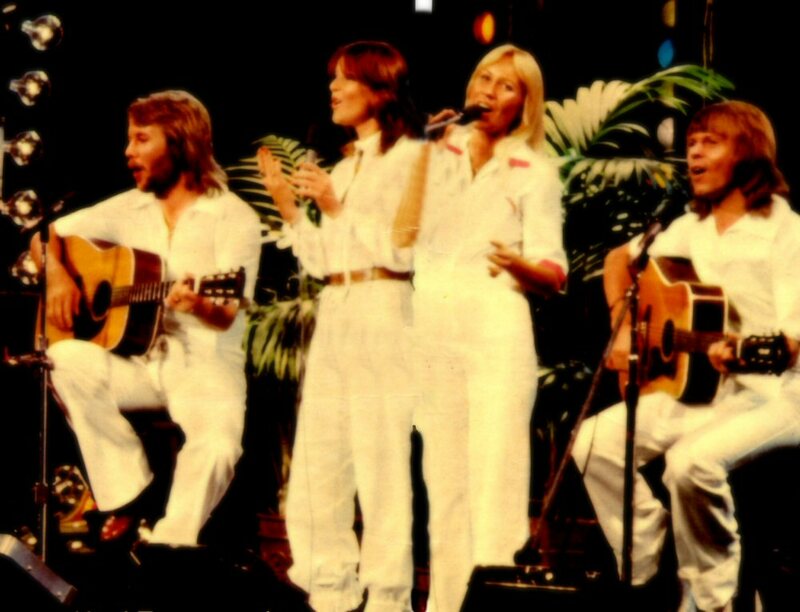 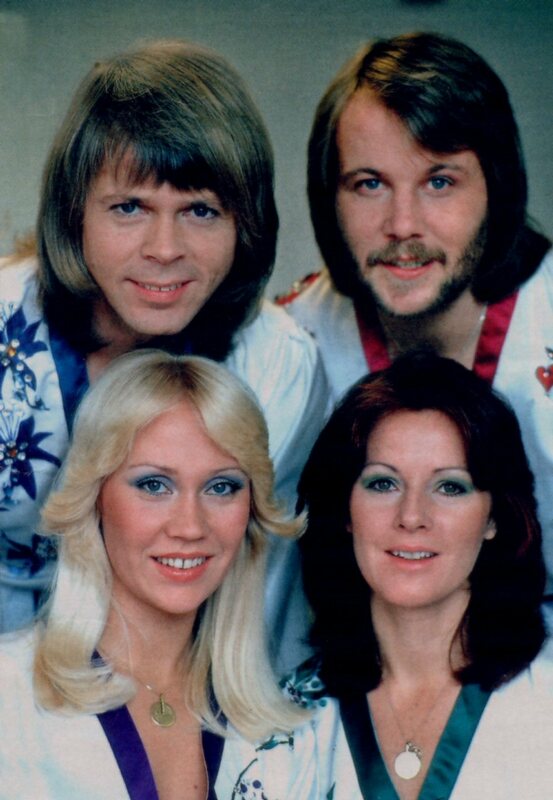 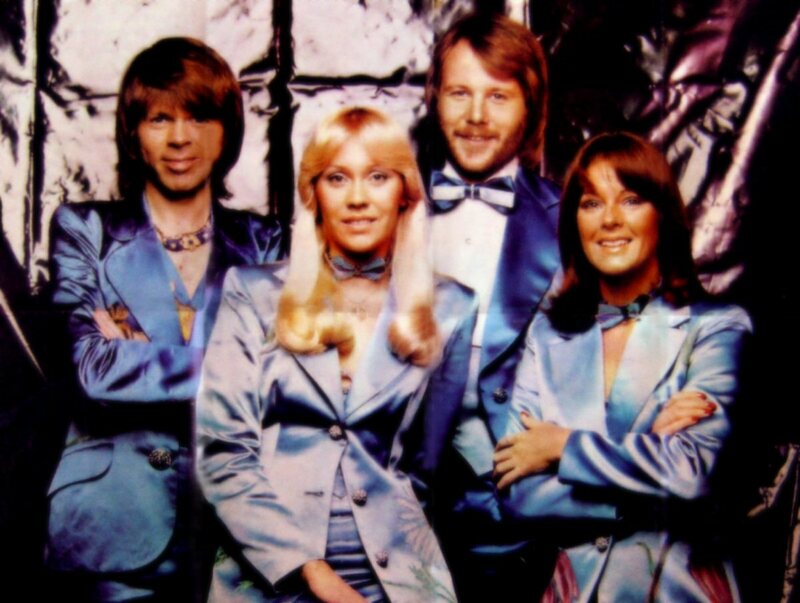 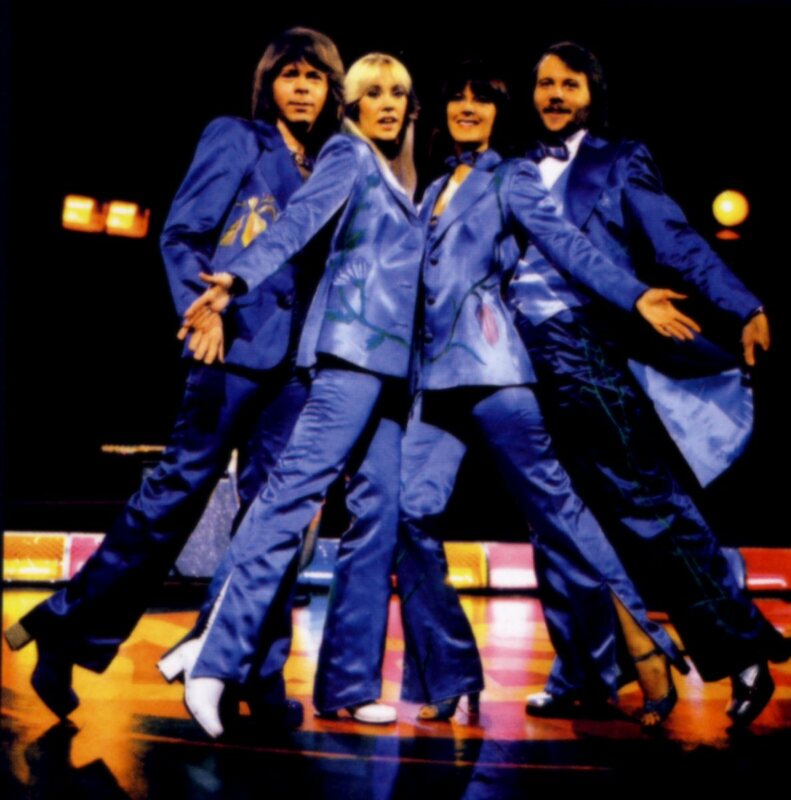 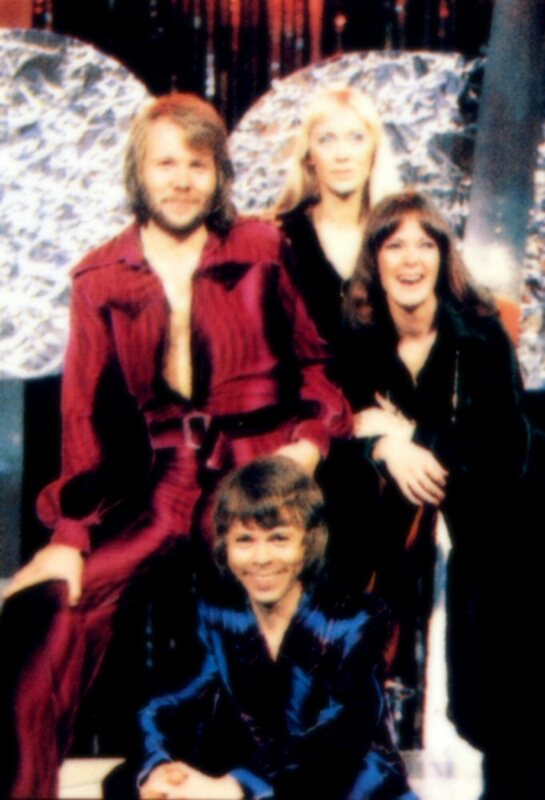 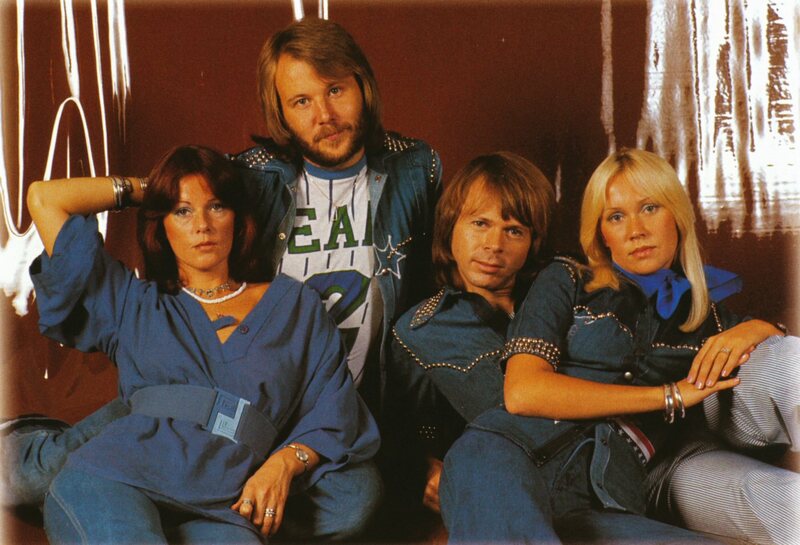 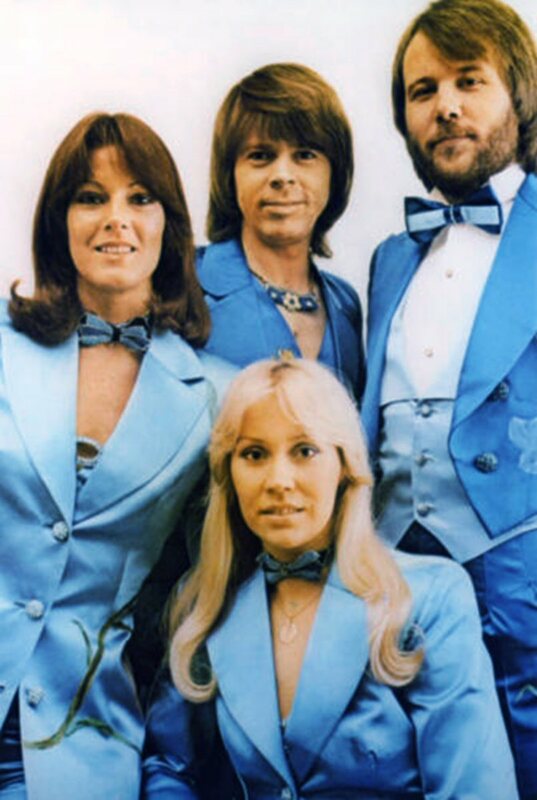 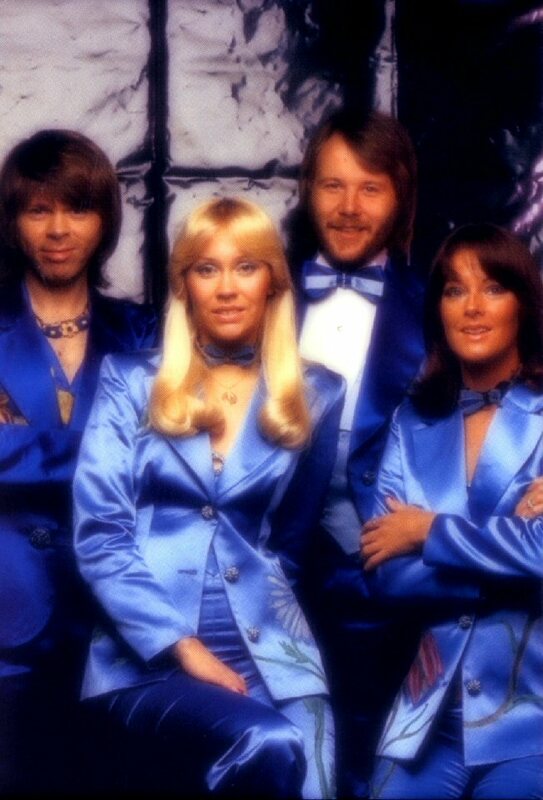 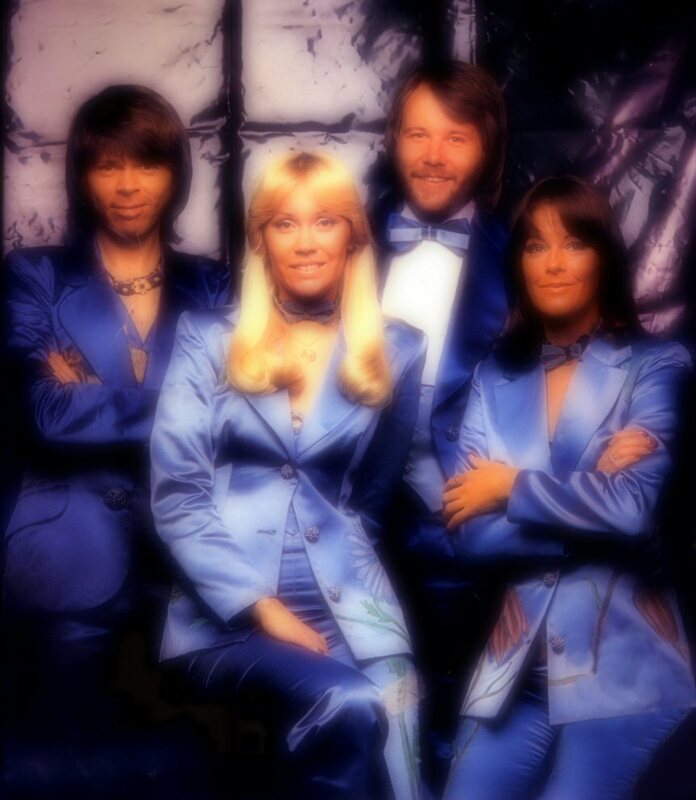 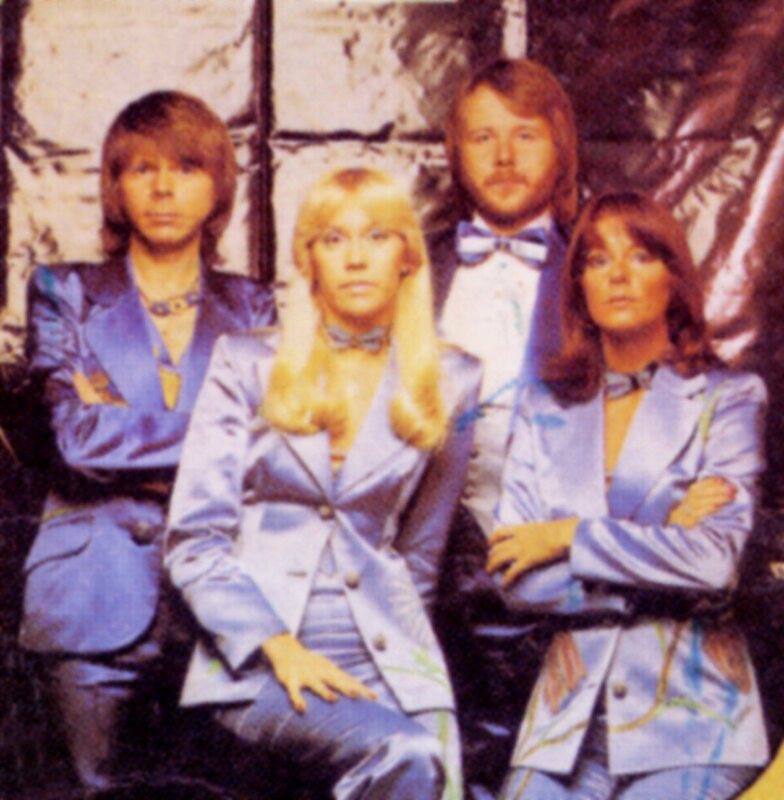 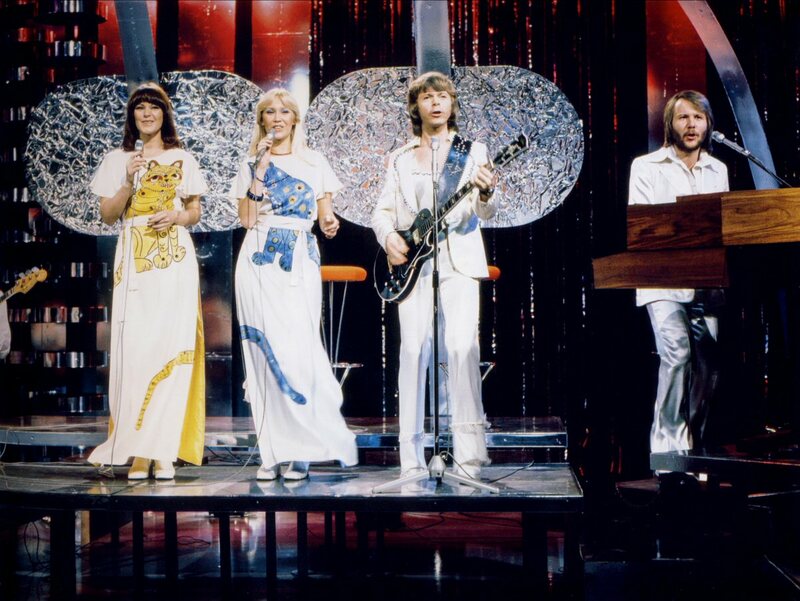 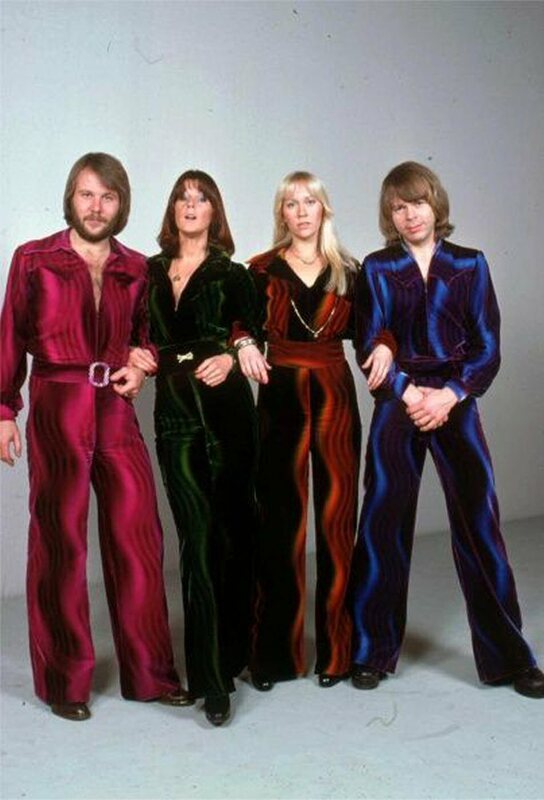 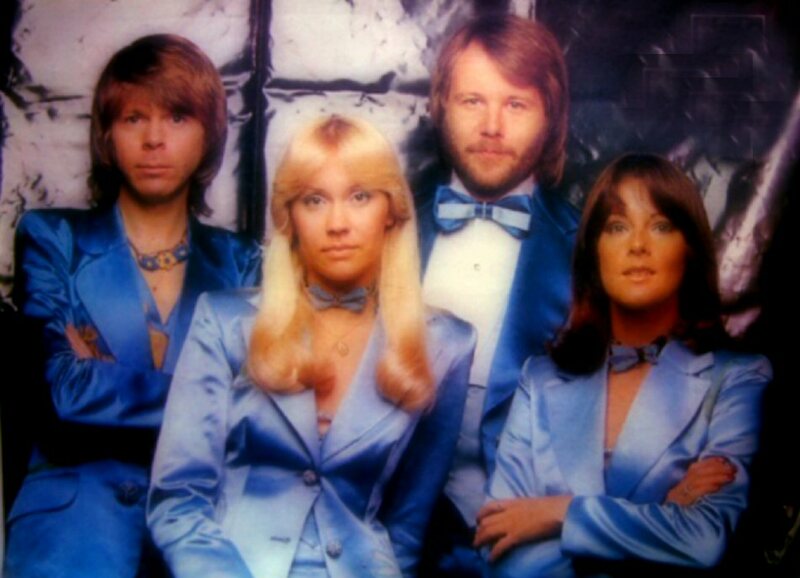 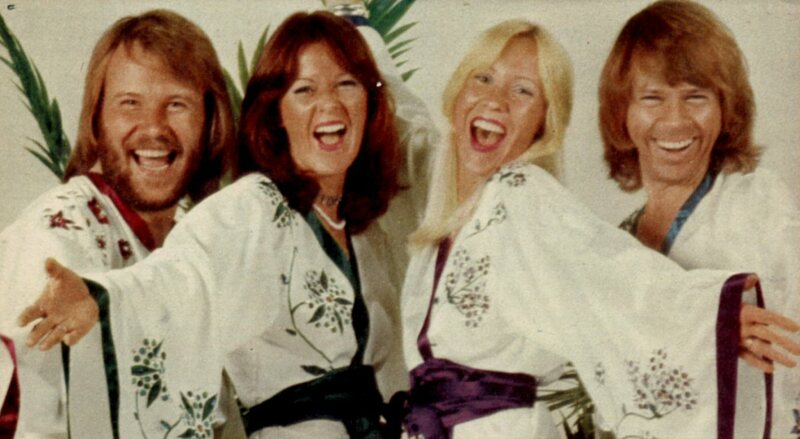 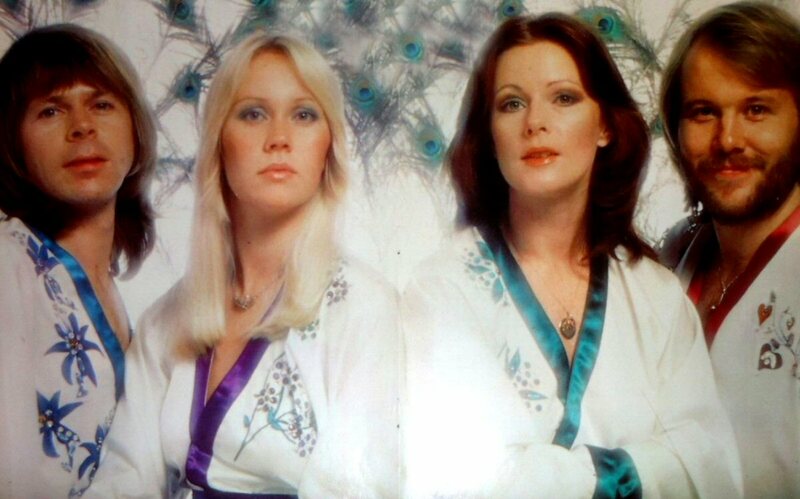 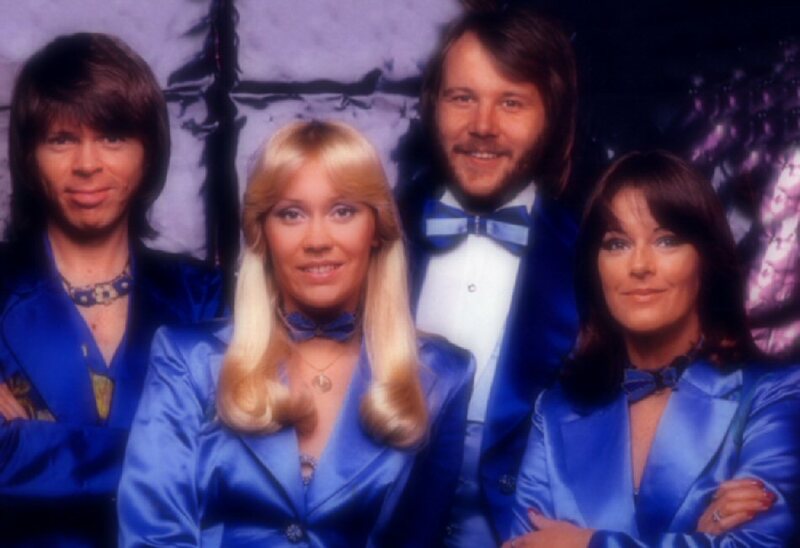 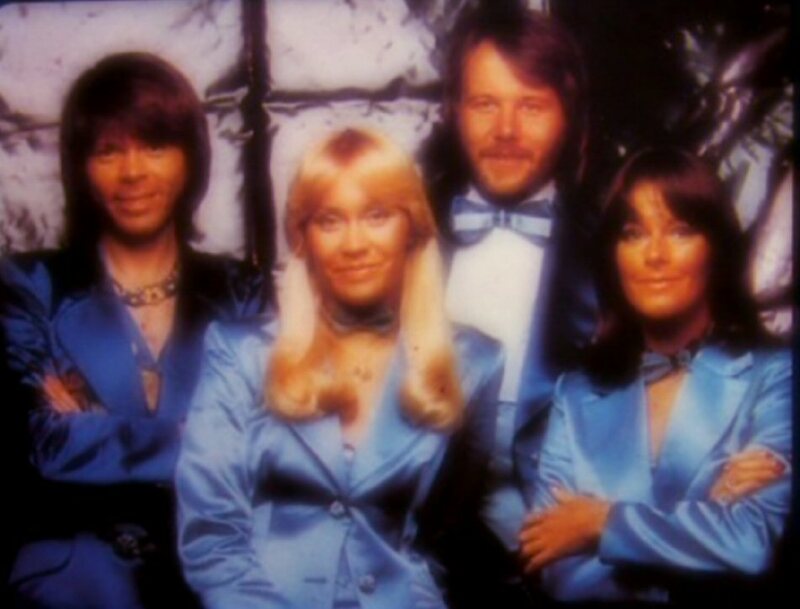 The beginning of 1976 saw ABBA in new blue outfits. 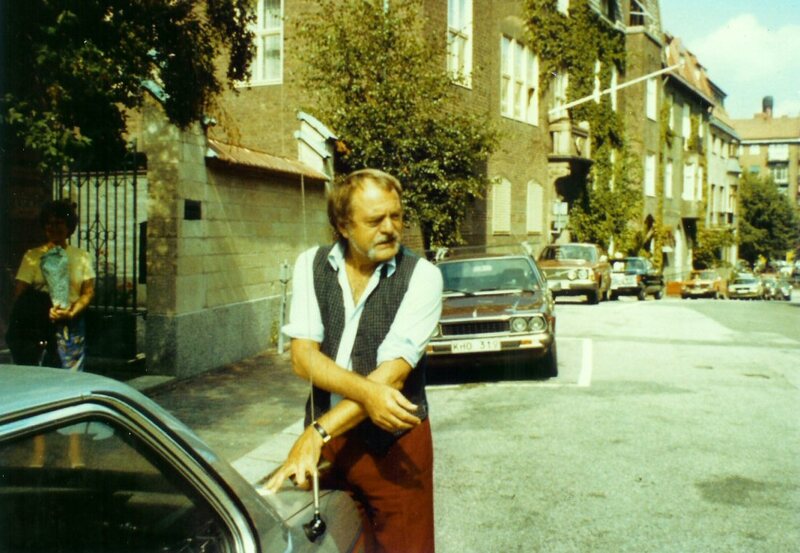 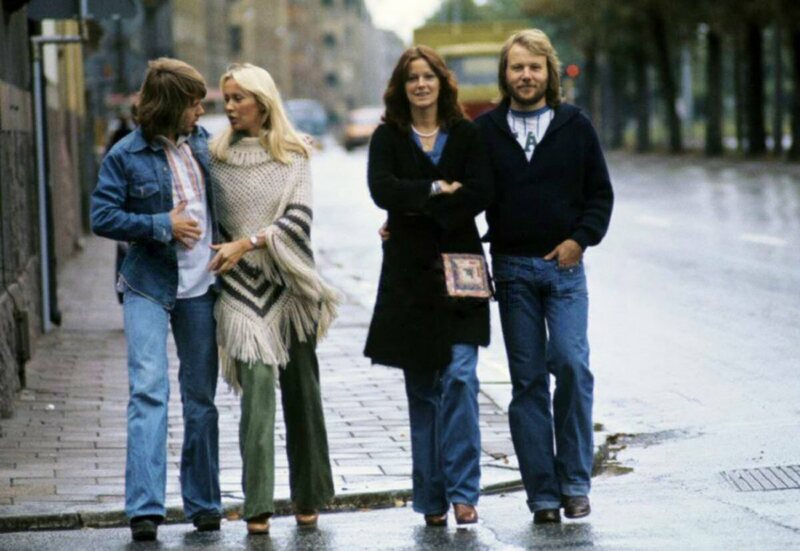 Lots of photo sessions were taken during this period of time but the most known is the one below which was taken someday in the spring of 1976. 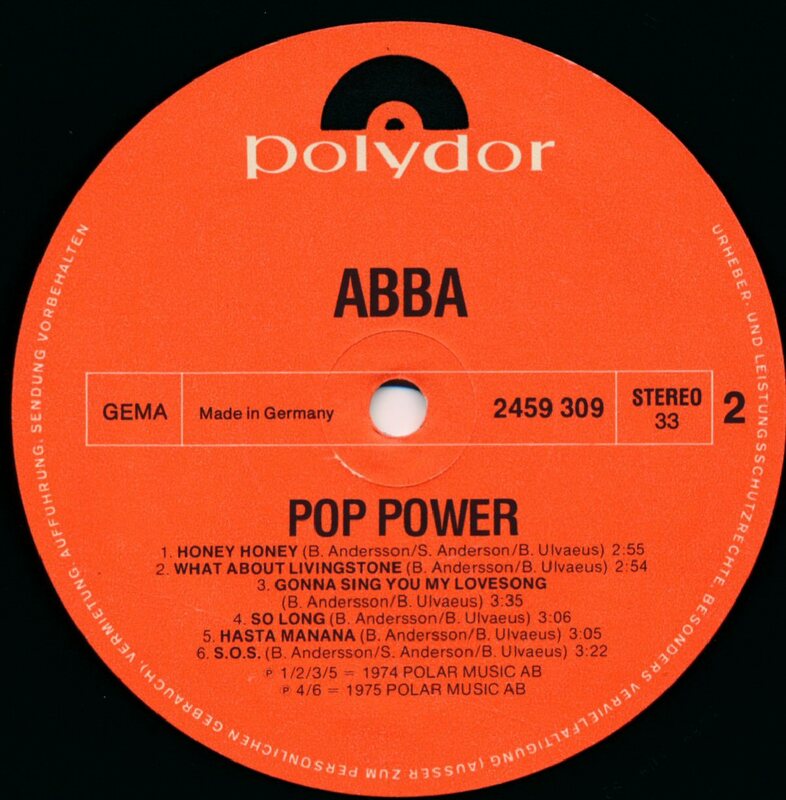 A new compilation was released in the series "Pop Power" in West Germany. 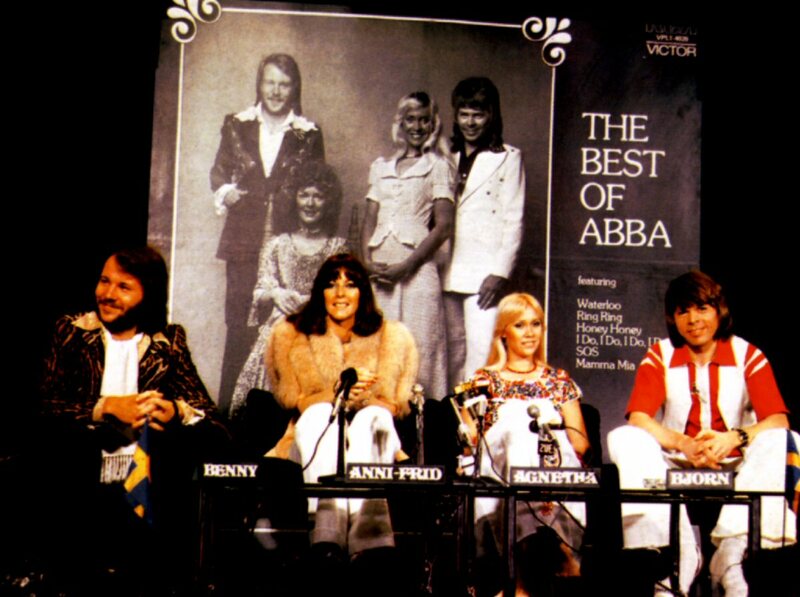 The compilation was entitled "The fantastic ABBA" and it featured a mix of 12 songs. 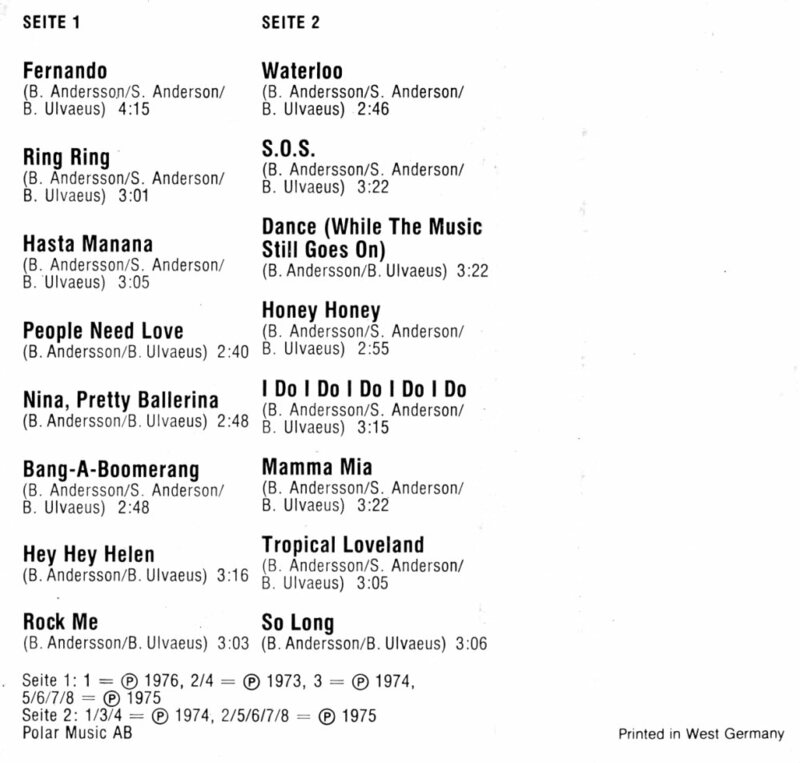 Among the tracks on this LP there were: "Sitting in the Palmtree", "What About Livingstone", "My Mama Said" and "Gonna Sing You My Lovesong". 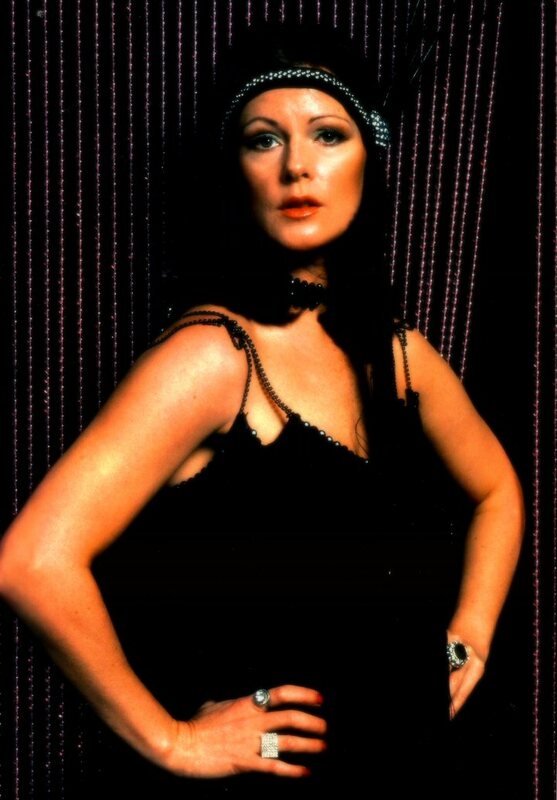 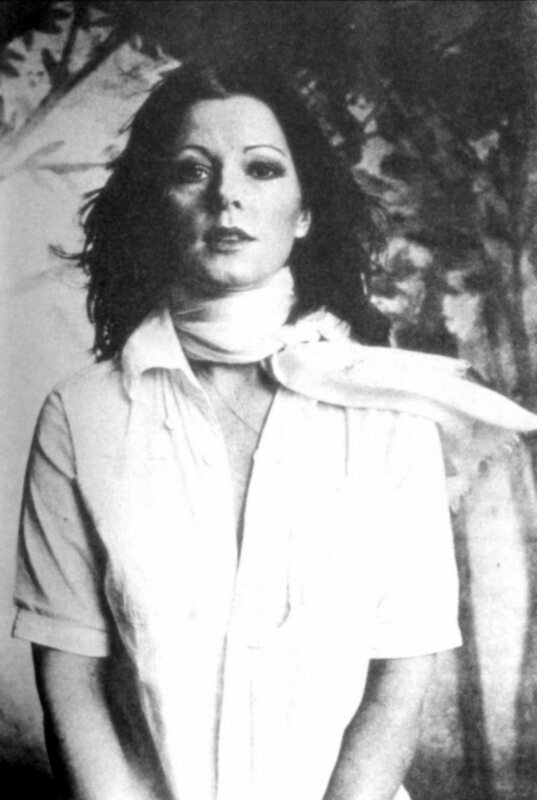 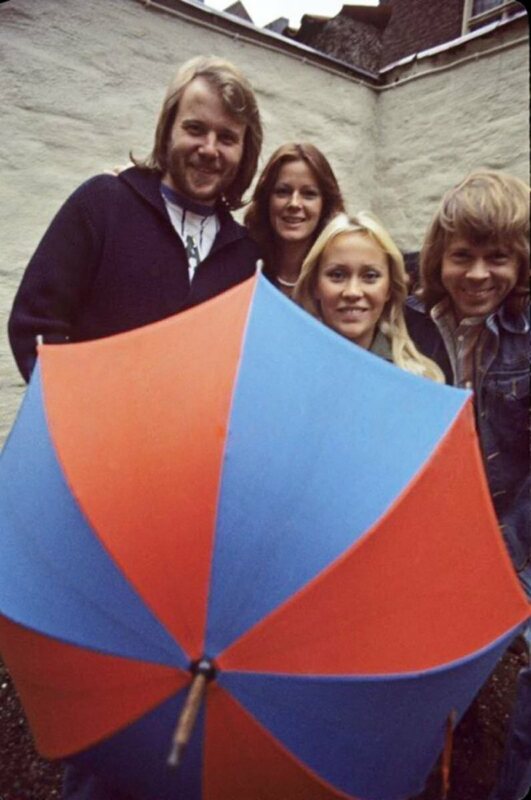 The cover picture had been taken in January 76 during recording of the TV show for "The best of ABBA" for German TV. 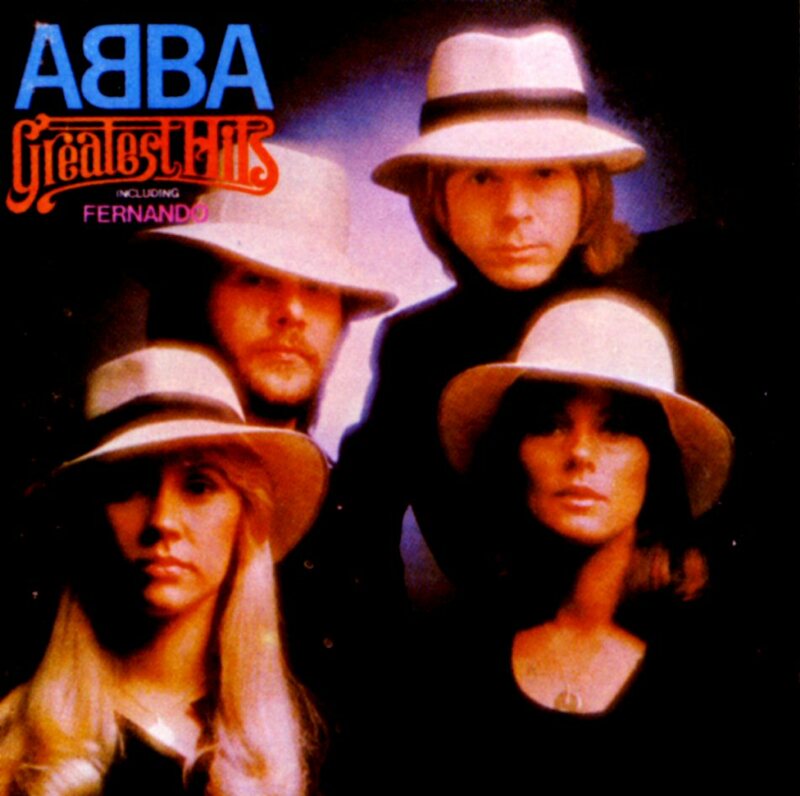 The compilation "Greatest Hits" including Fernando - one of ABBA's greatest hits ever - was released all over the world in the spring 1976. 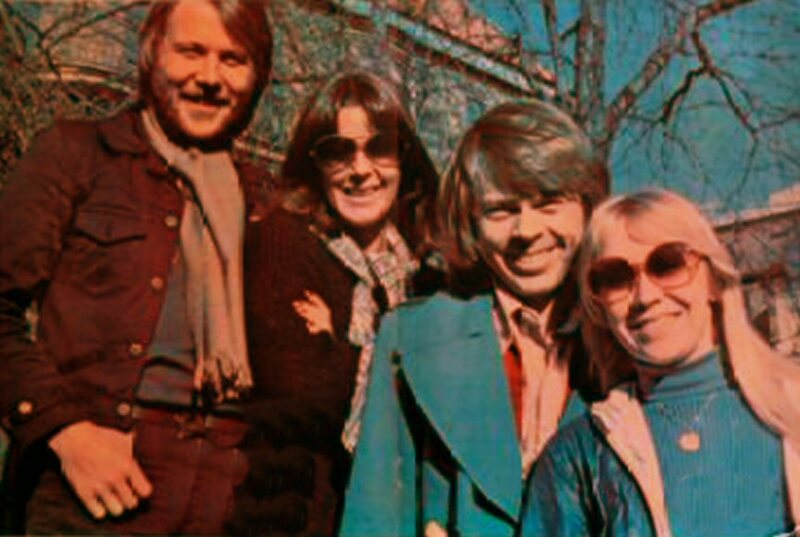 The well-known "bench" photo session was used on most of the covers but even the painting of Hans Arnold featured on the Scandinavian releases was used on some issues mostly in Spanish language territories. 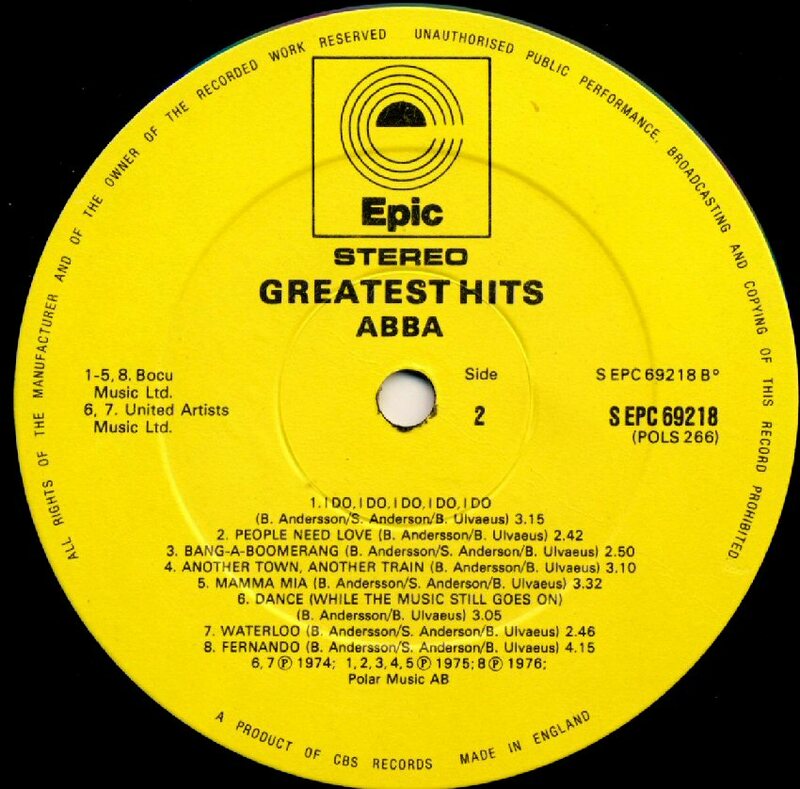 On March 26, 1976 the album "Greatest Hits" was released in the UK. 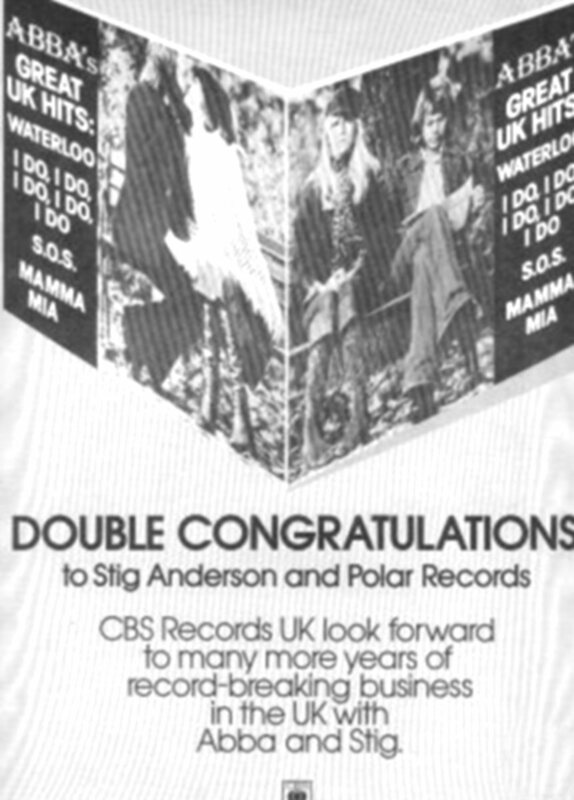 The album was issued in two slightly different versions. 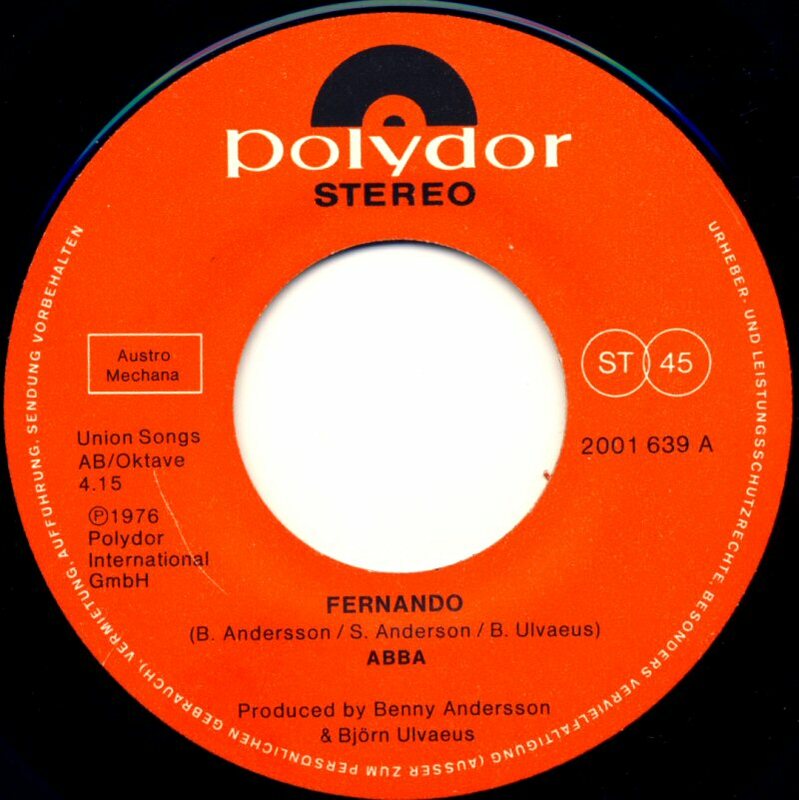 Both included the current hit "Fernando" but the song had not been planned for release on this album from the very beginning as the single "Fernando" was released at the same time as the first pressings of the album cover were ready in the UK. 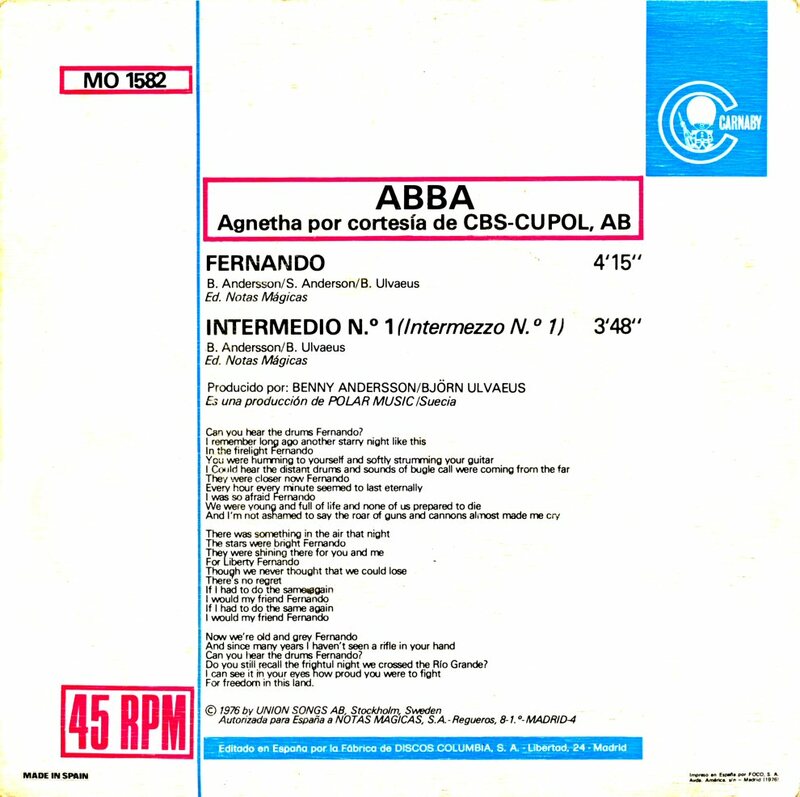 That's why the title "Fernando" did not appear in the track listing on the cover of the first pressing of the album. 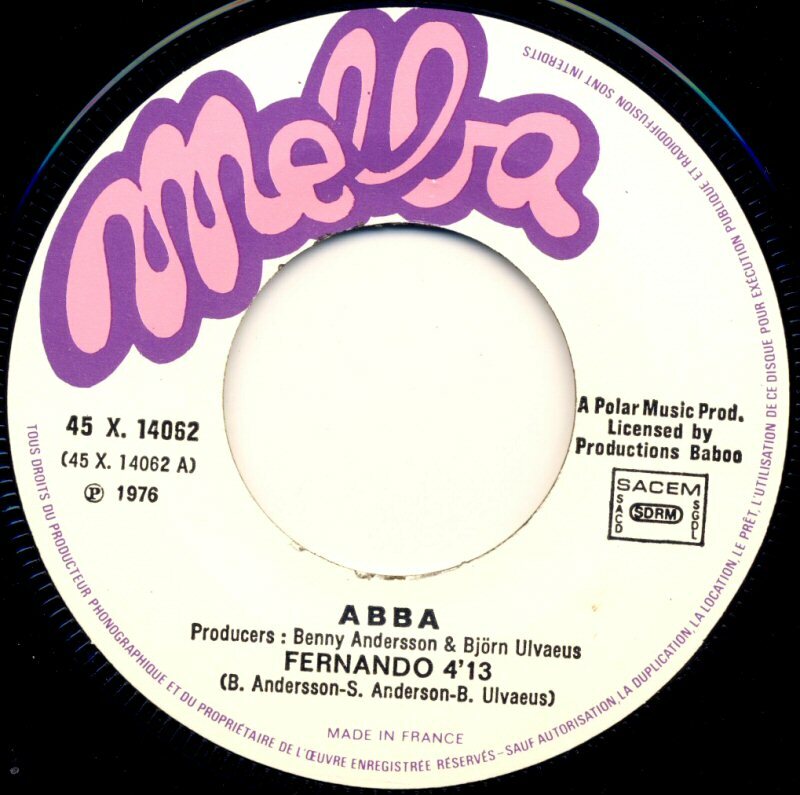 A special sticker telling that the album included "extra track - the hit single Fernando" was taped on all covers. 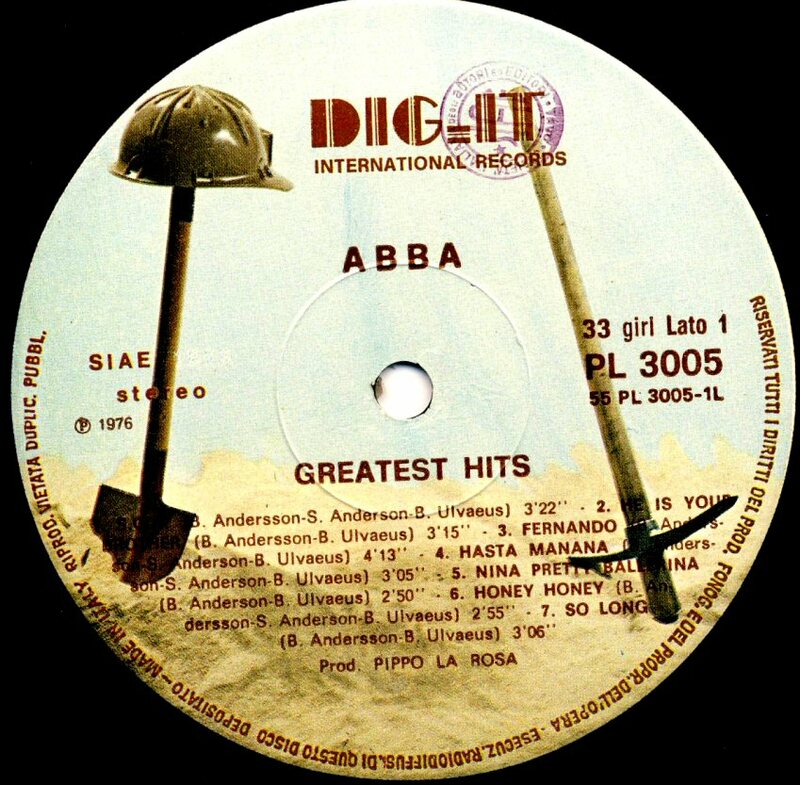 Later re-releases of "Greatest Hits" in the UK featured the new logo with the first B inverted. 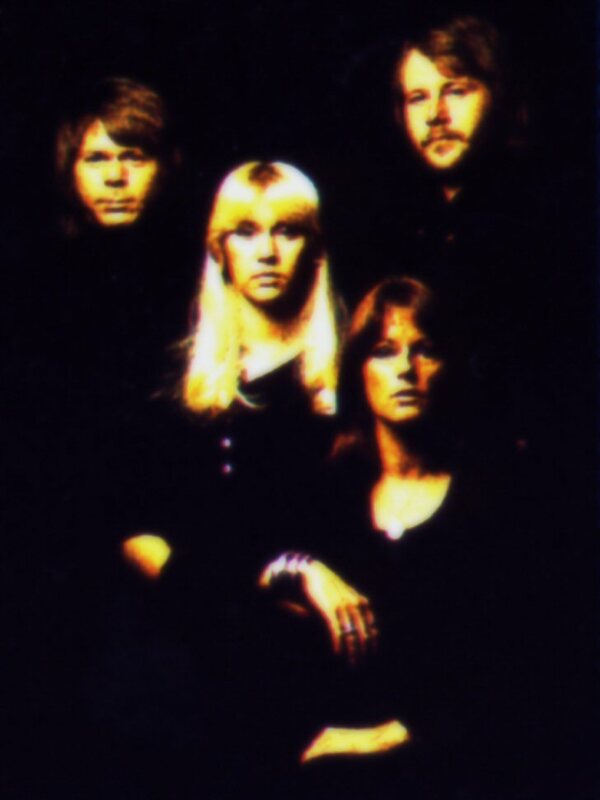 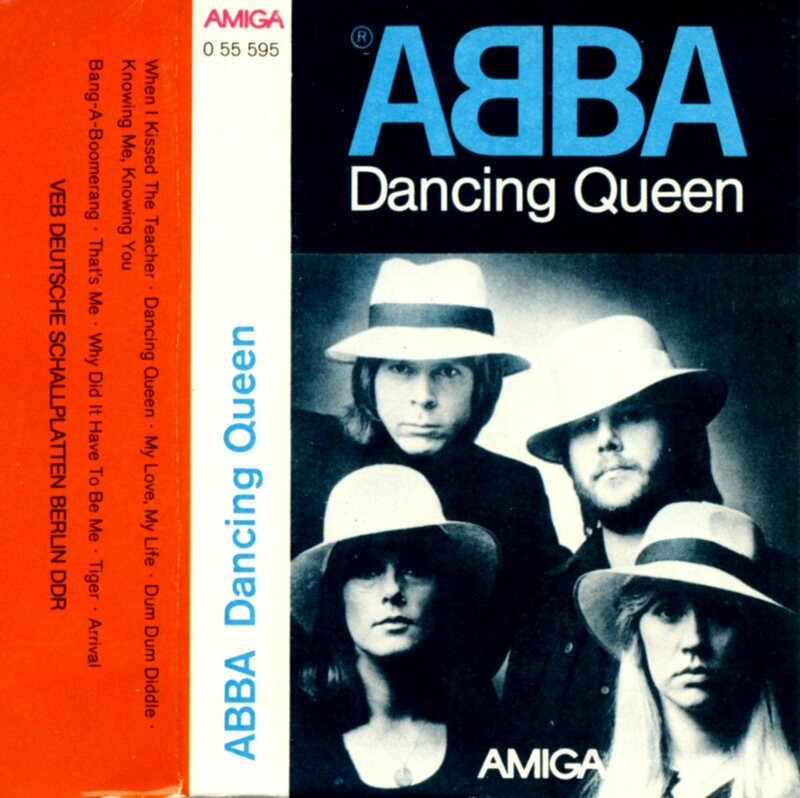 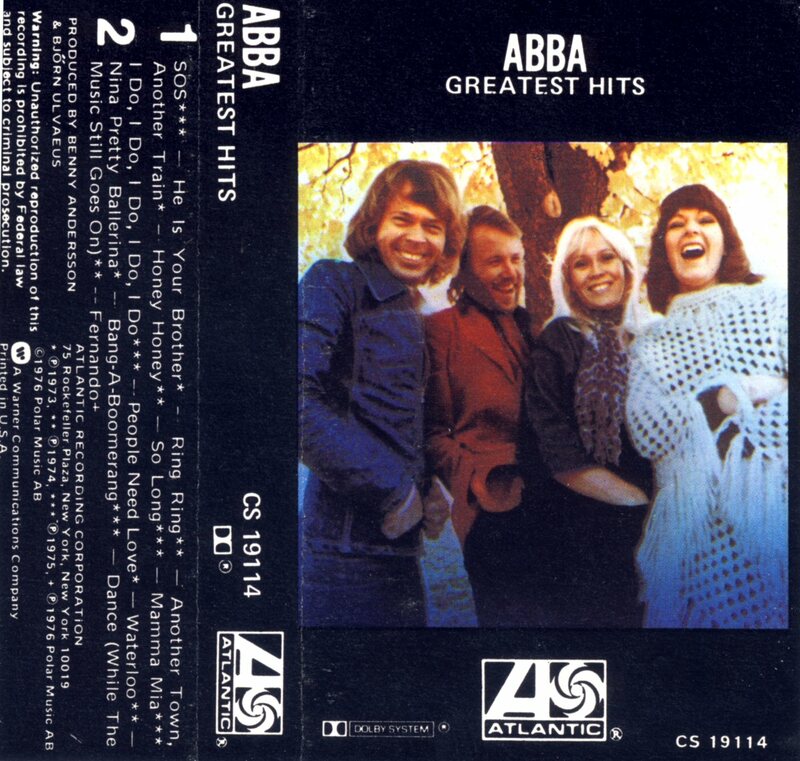 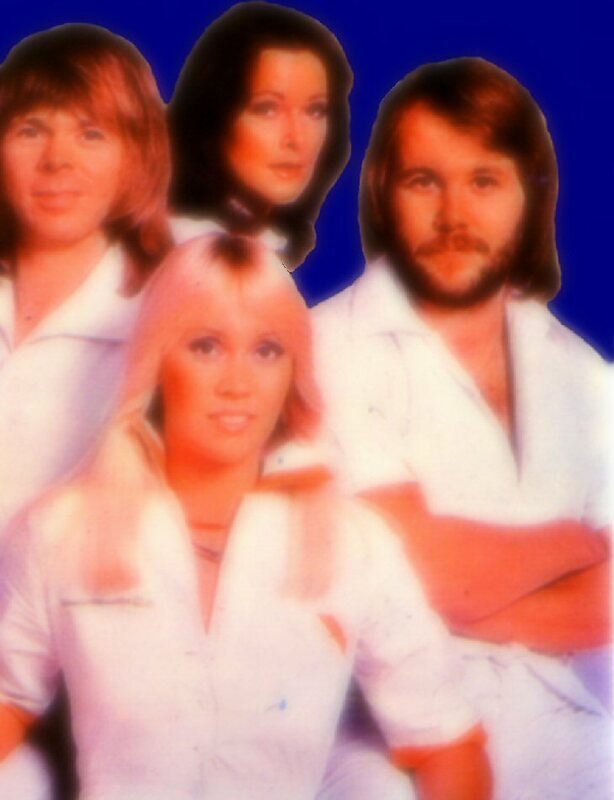 The UK cassette featured only Agnetha and Björn on the cover. 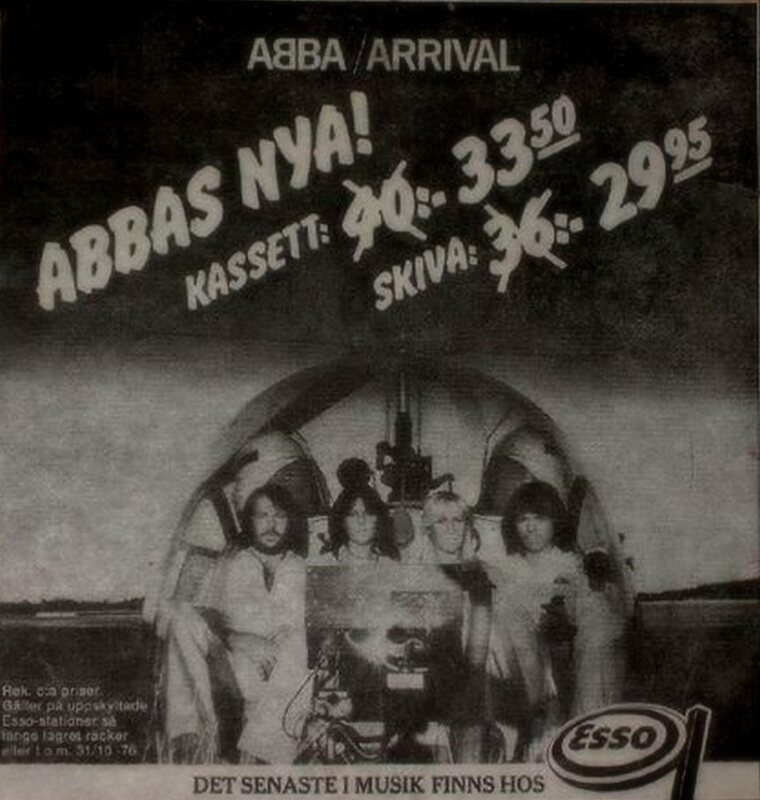 Probably the strangest cover on an ABBA release. 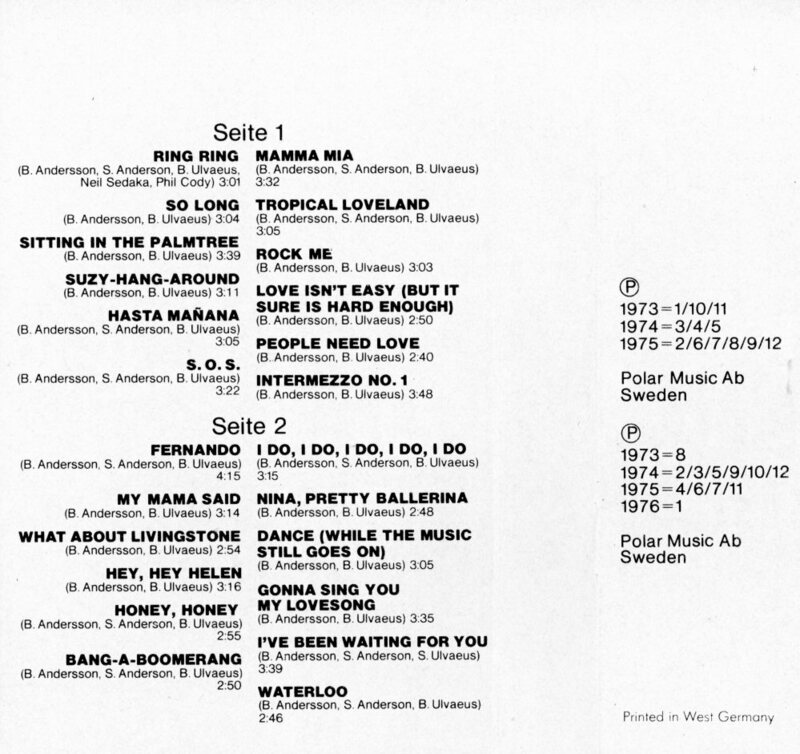 The 1976 issue of "Greatest Hits" in Denmark featured "Fernando" as the opening track and the song title stood in the track listing. 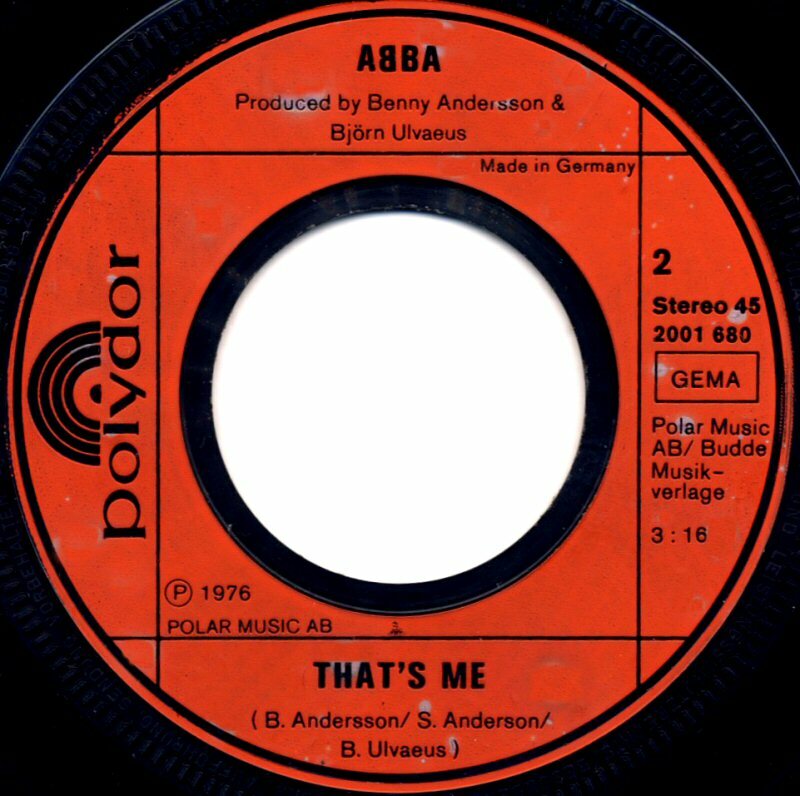 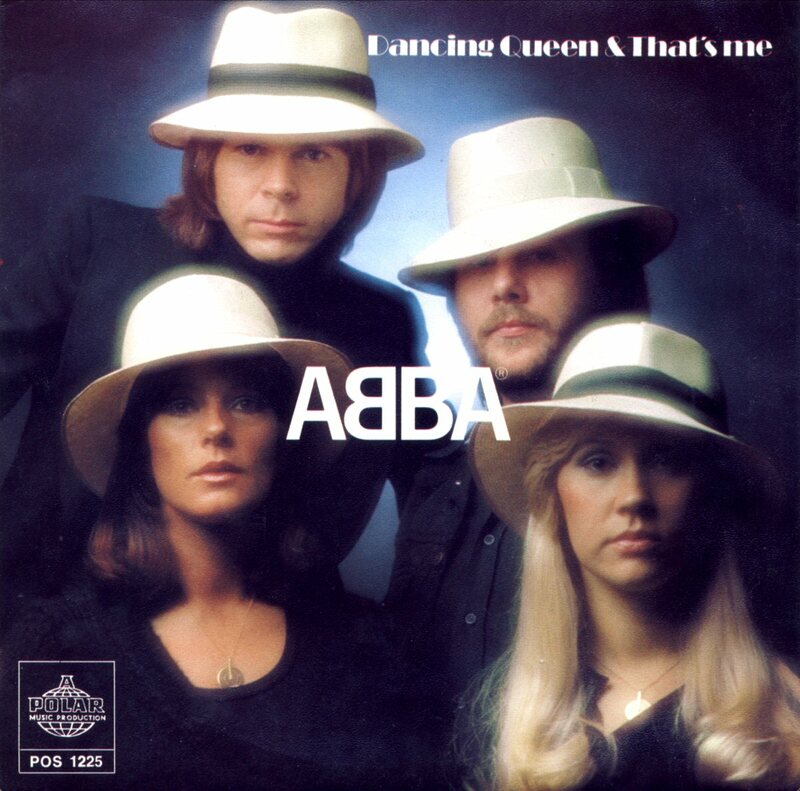 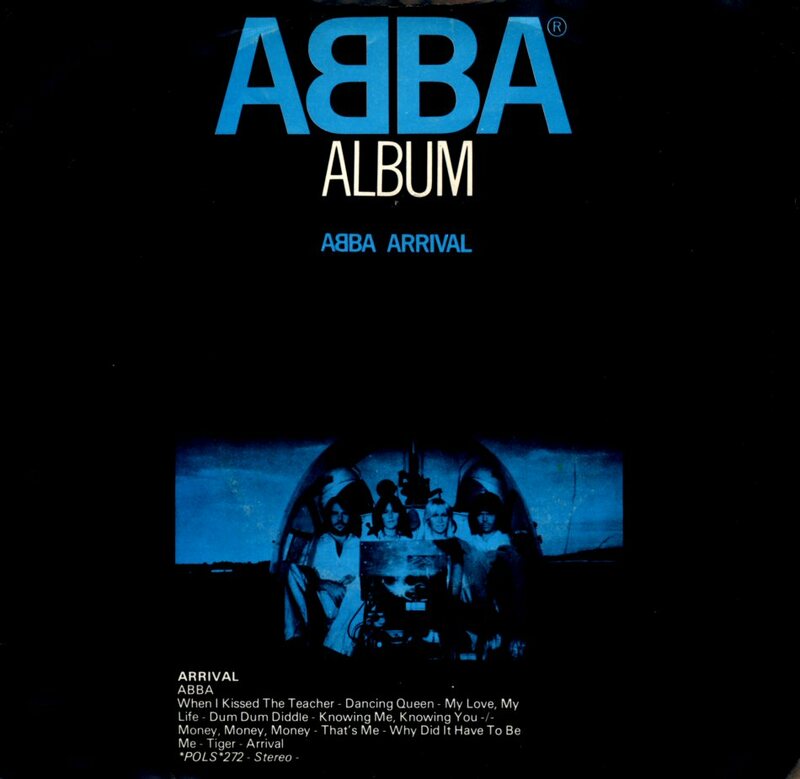 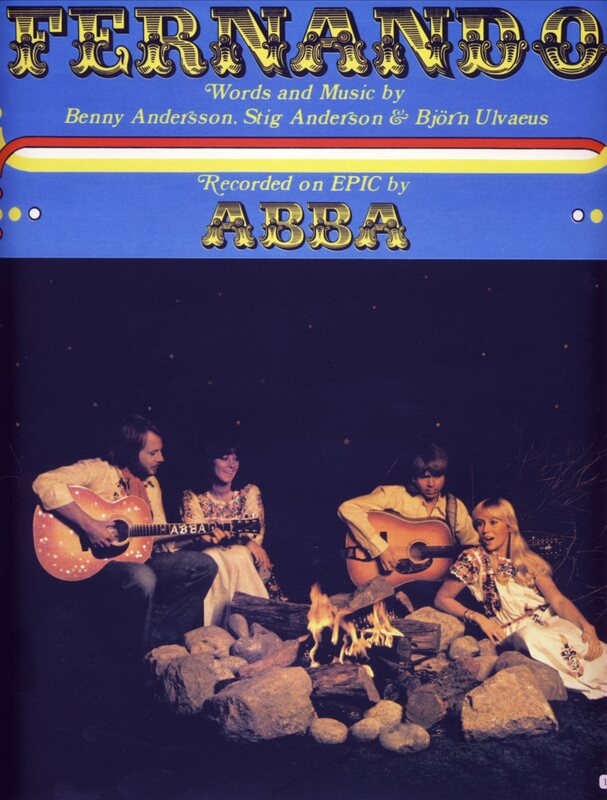 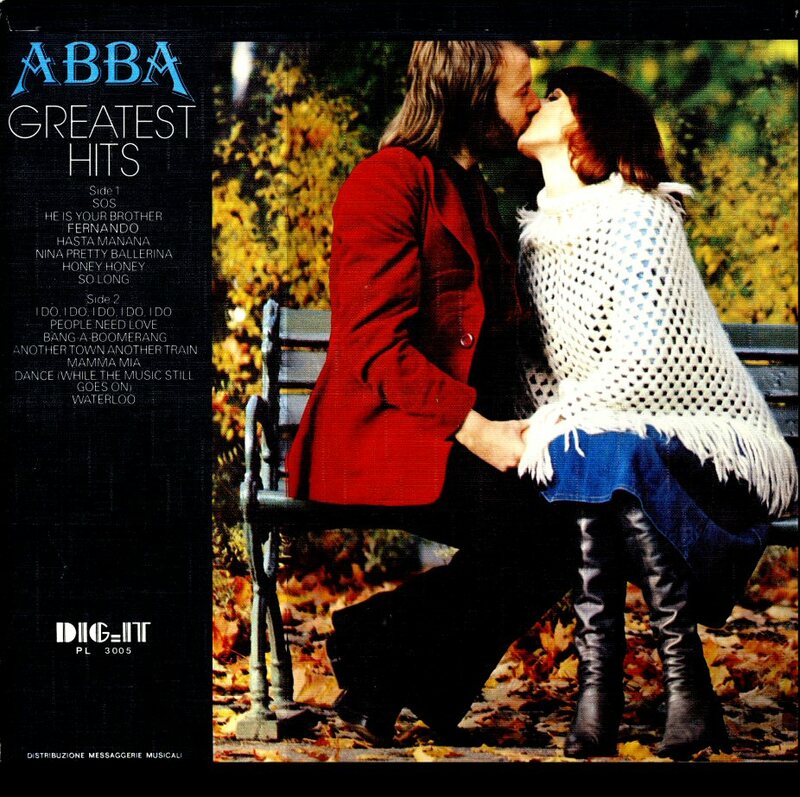 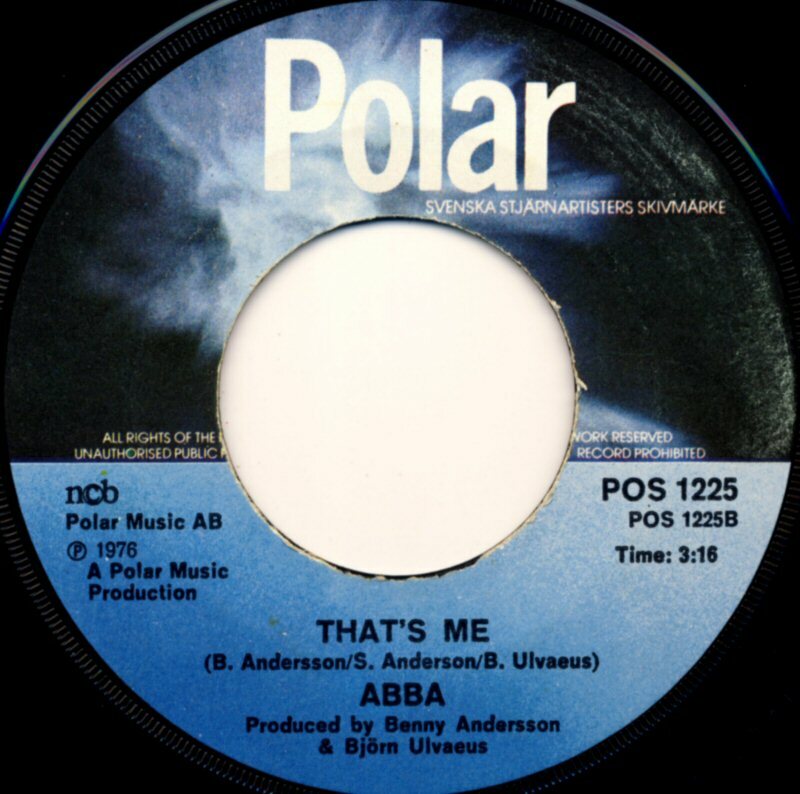 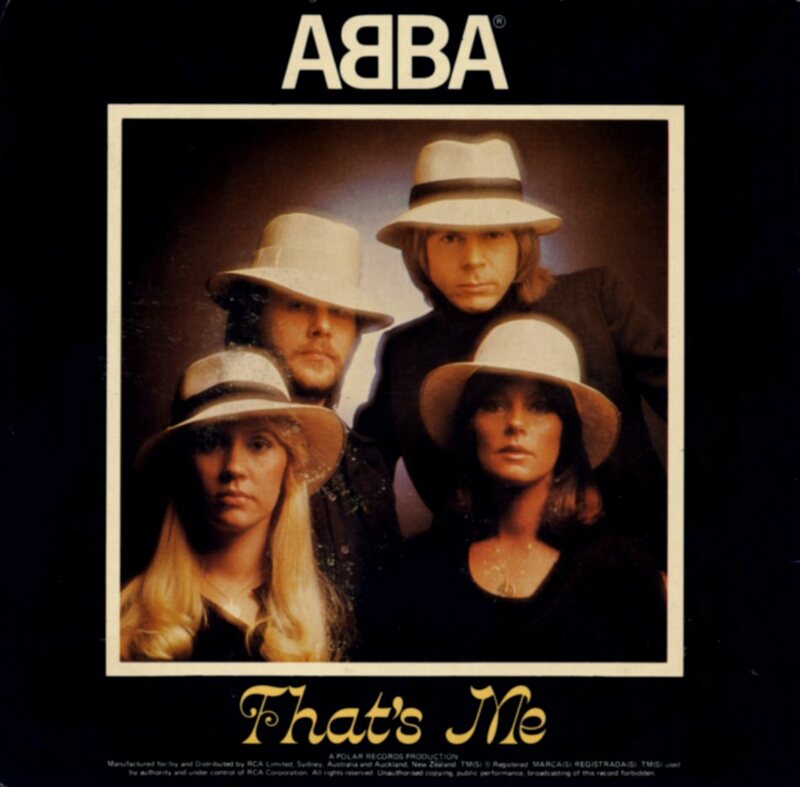 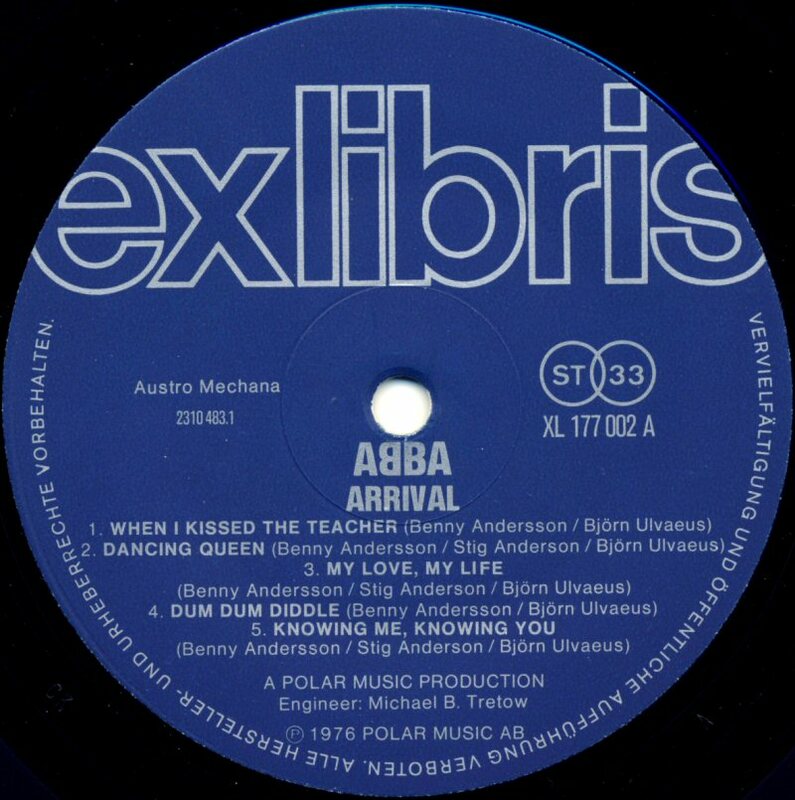 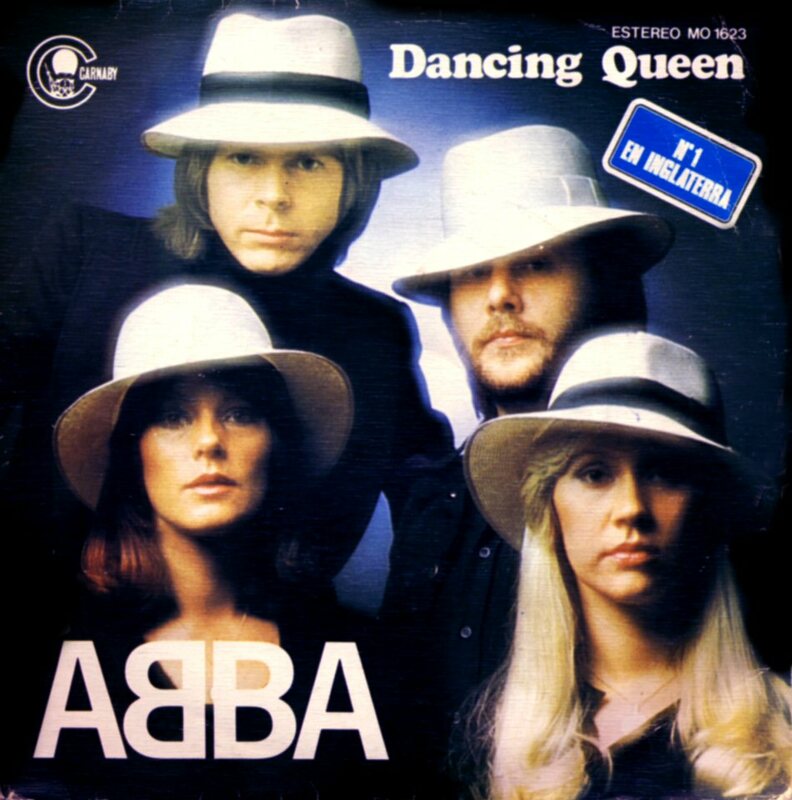 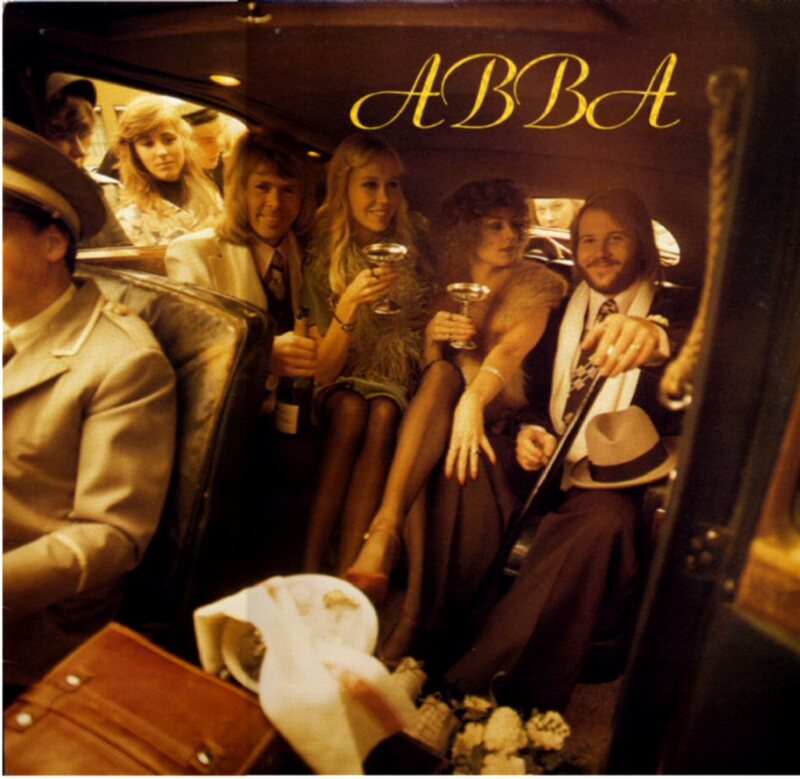 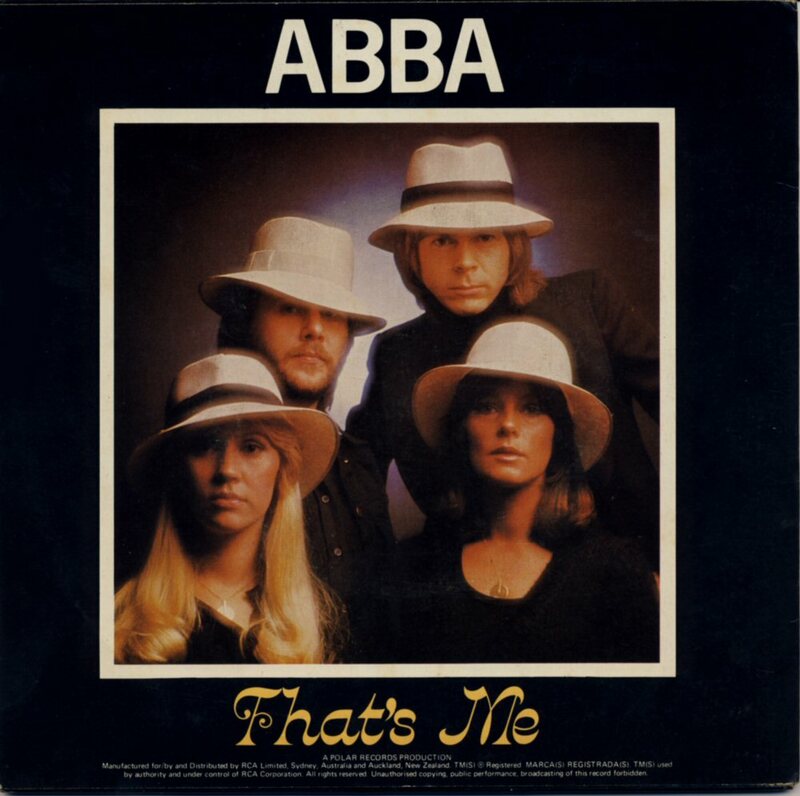 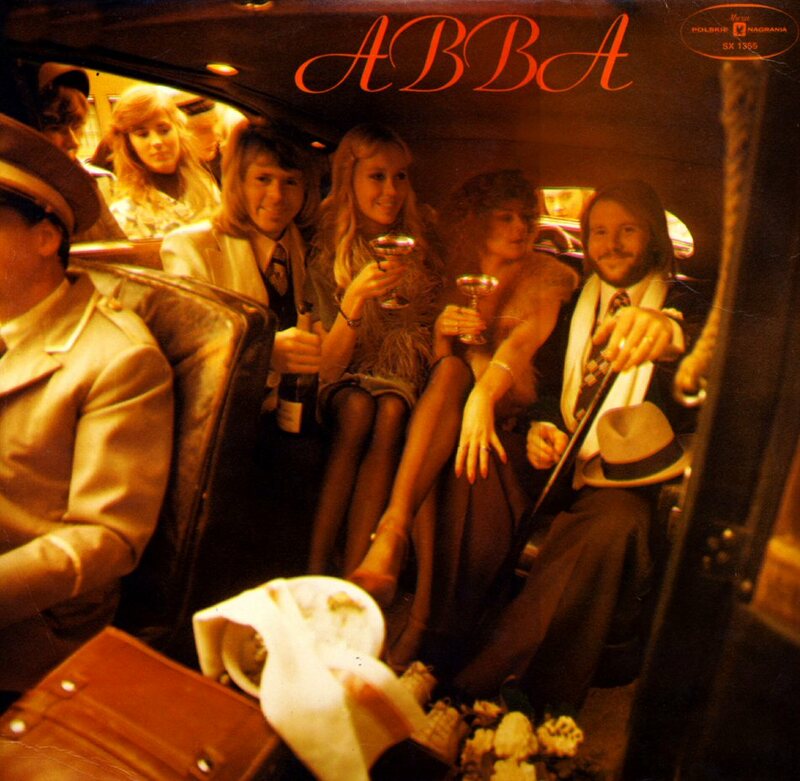 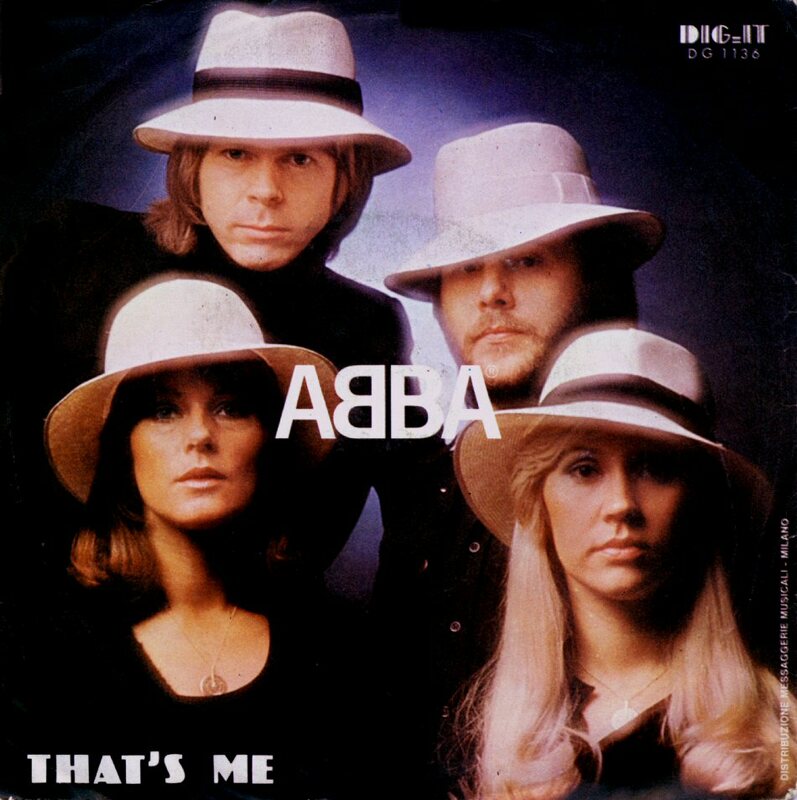 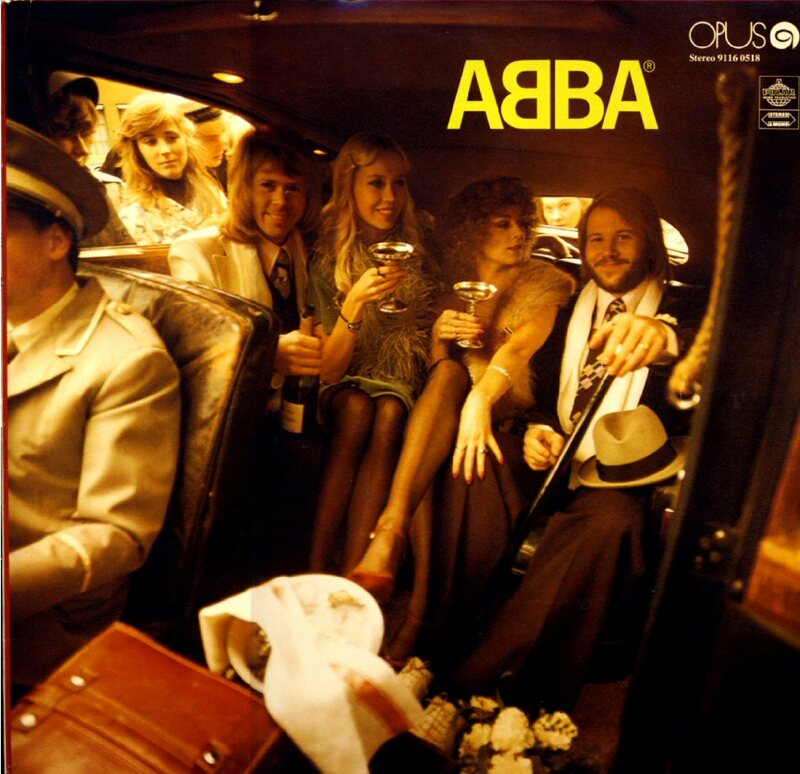 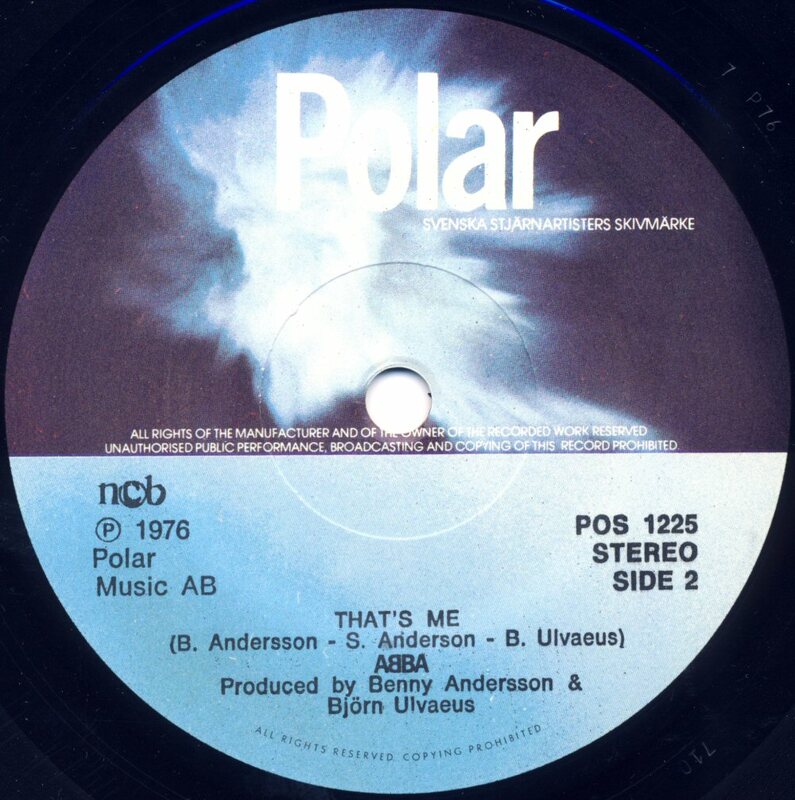 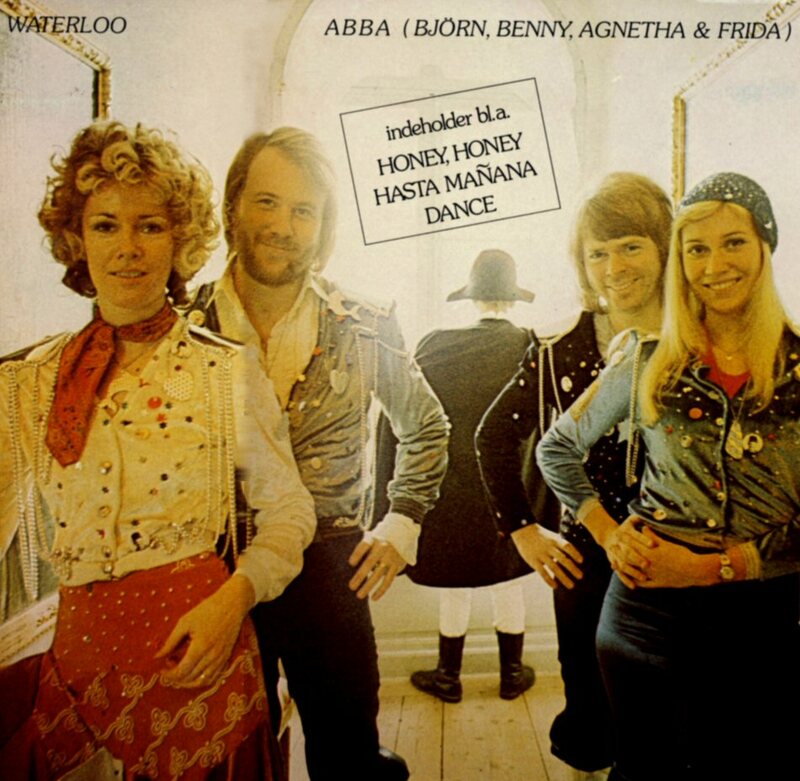 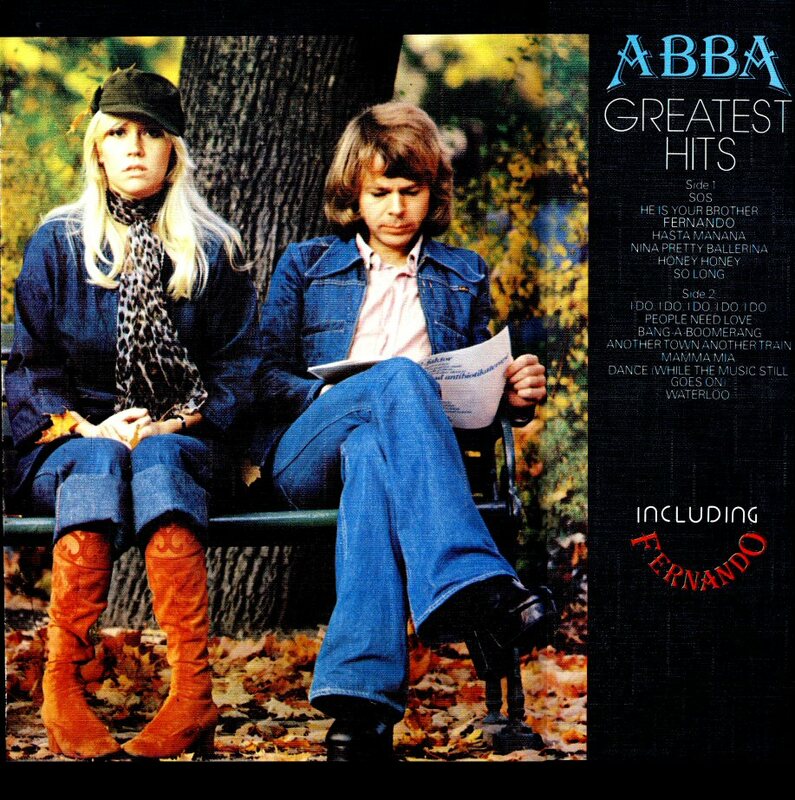 A special sticker on the cover informed that this edition of the album contained ABBA's latest single. 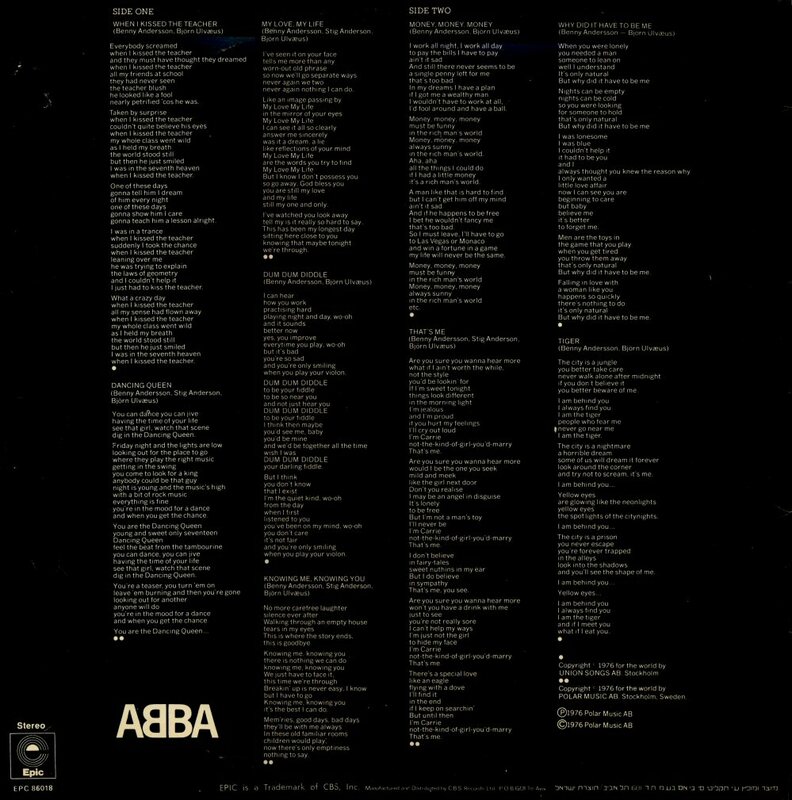 The Italian release of the album featured slightly different track listing comparing to the UK and US editions. "Fernando" appeared as the third track on the side A. 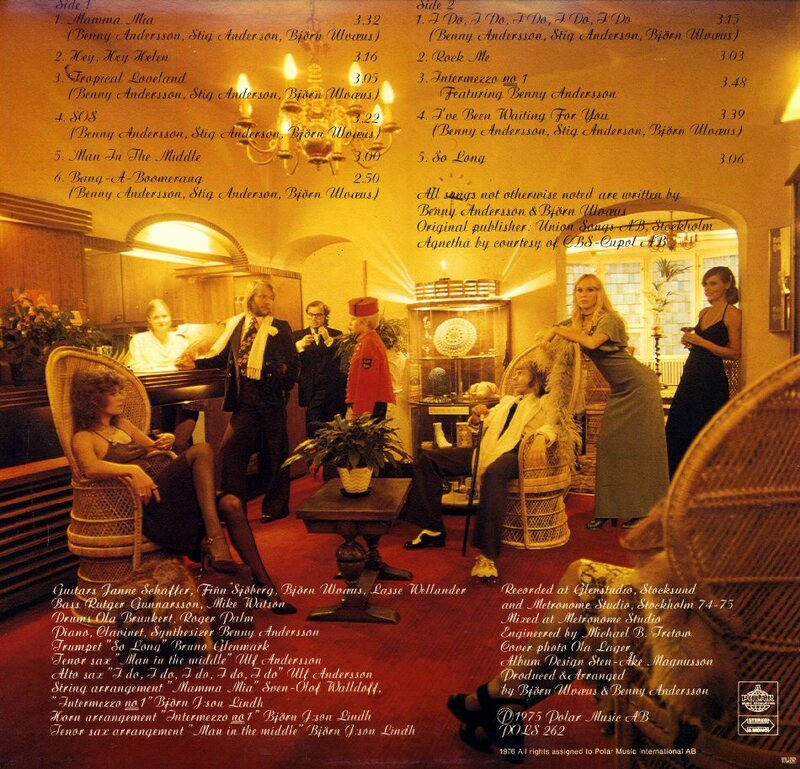 The cover was not gatefold but the cover picture was the same as on most international editions of the album. 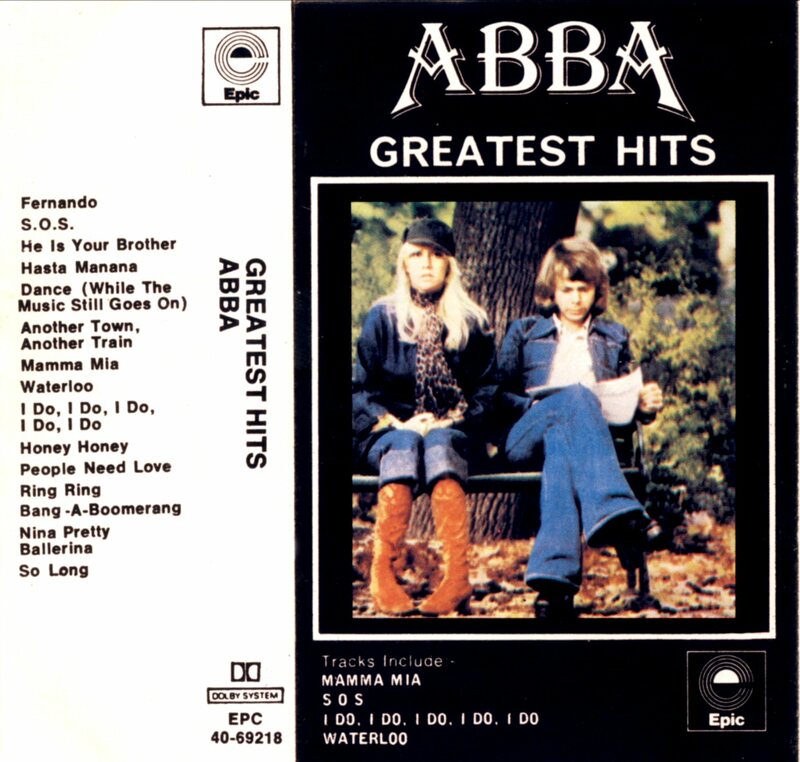 "Greatest Hits" would be re-released in Italy in 1979 with a brand new cover. 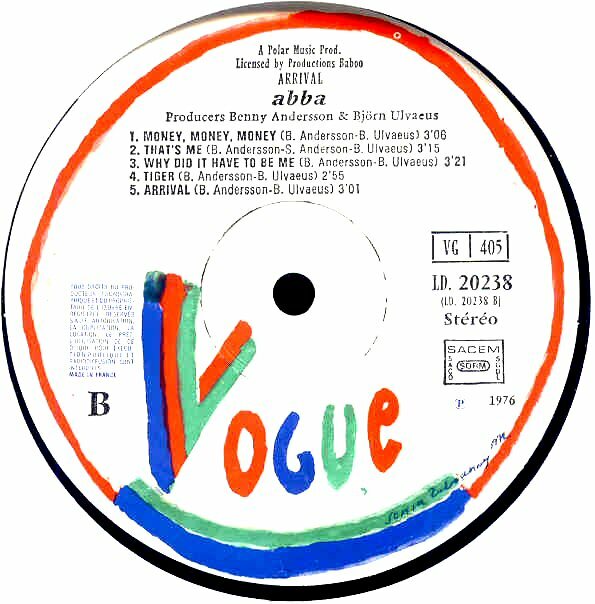 Vogue in France re-issued "Greatest Hits" in 1976. 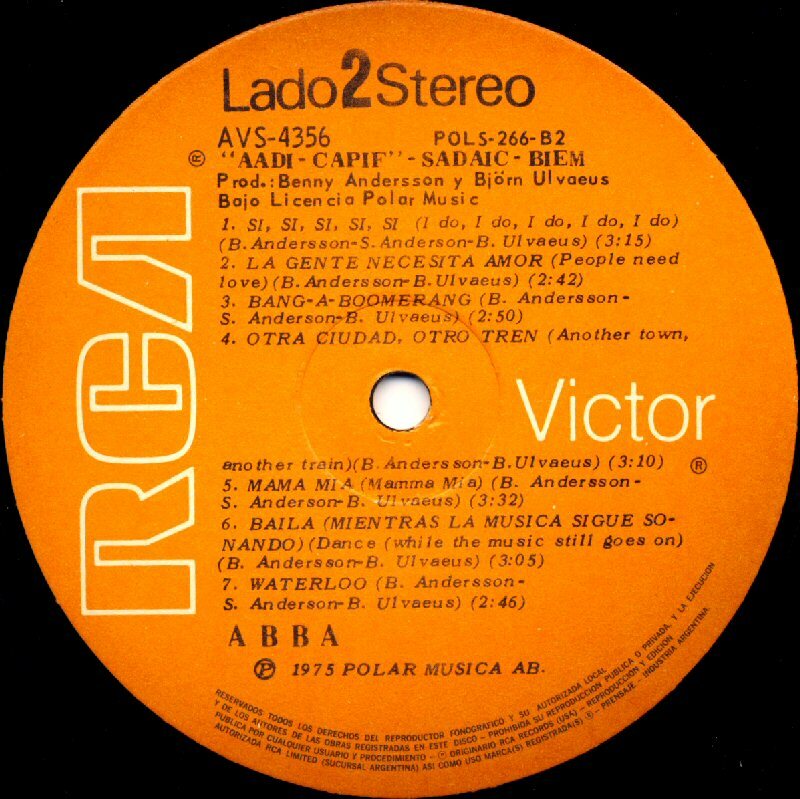 The new version of the album included "Fernando" listing and the cover was partly re-done but the same "cat-and-dog" photo was used even here. 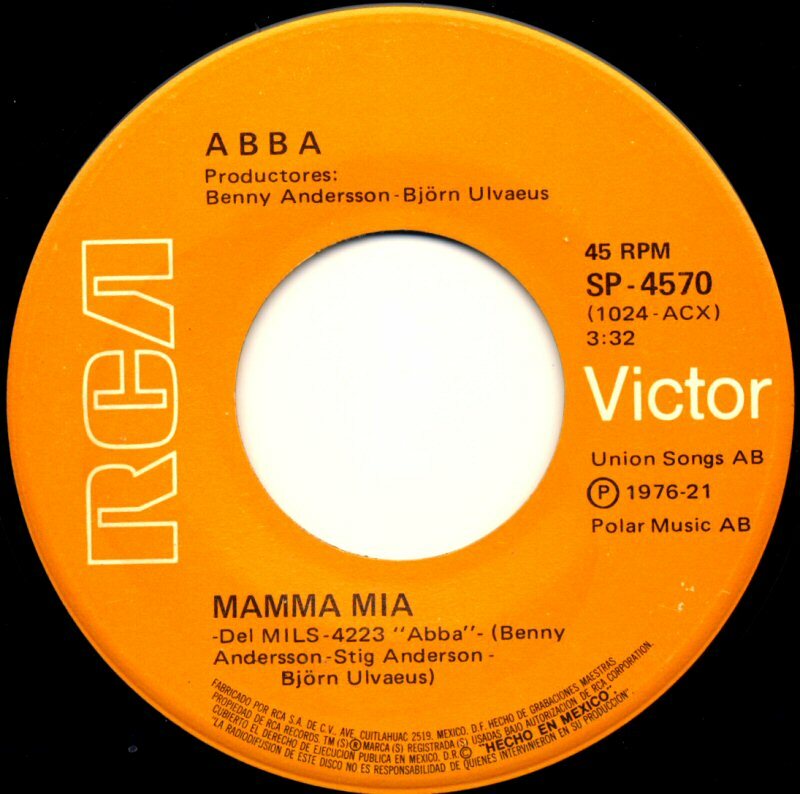 "Mamma Mia" was omitted on the French MC edition of the album. 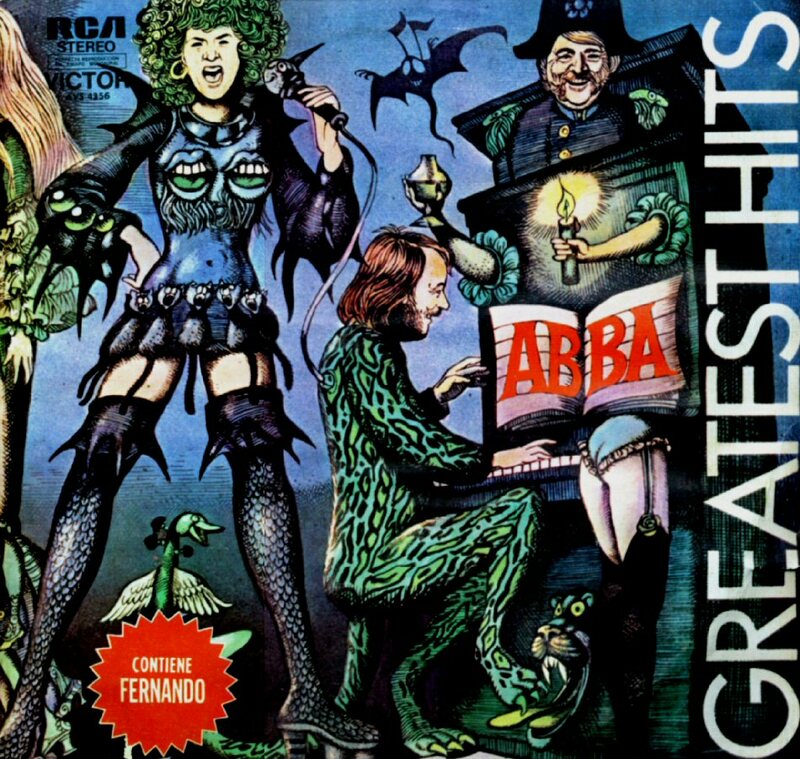 The Argentinian release of "Greatest Hits" featured the painting of Hans Arnold but the cover of the album was not gatefold and the lay-out was slightly changed. 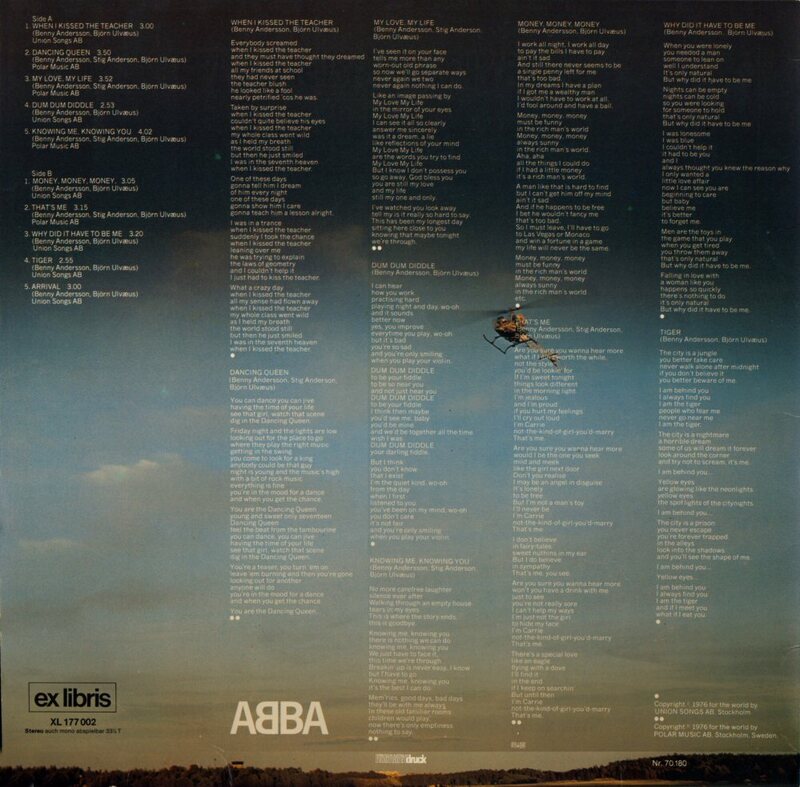 The titles of the songs had been translated to Spanish. 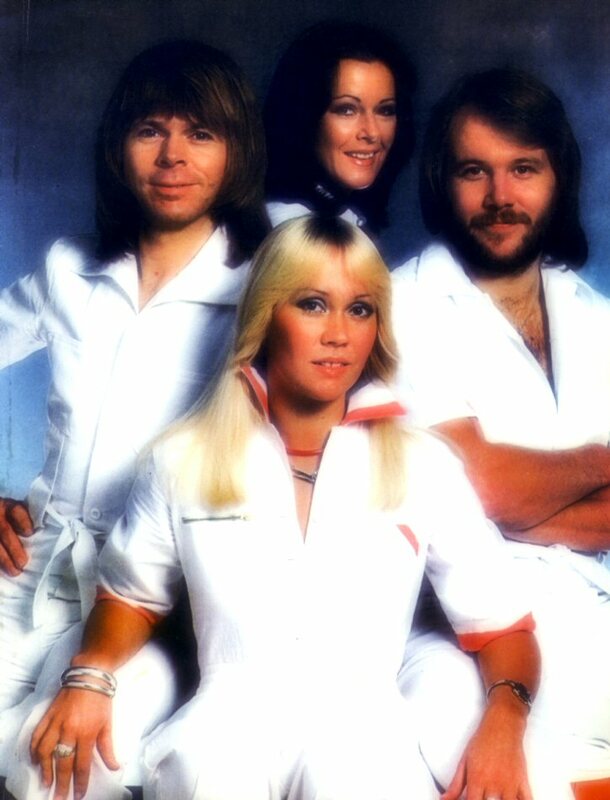 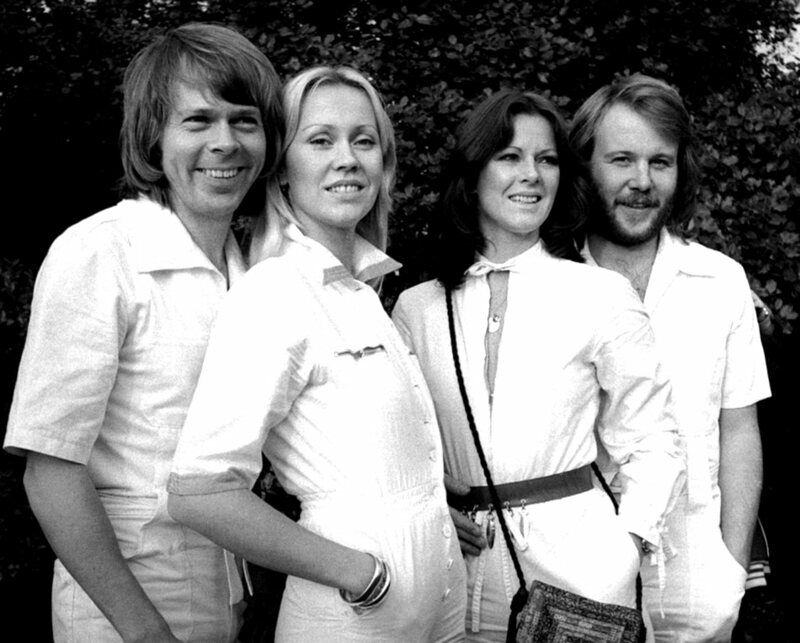 The album contained the latest ABBA hit "Fernando". 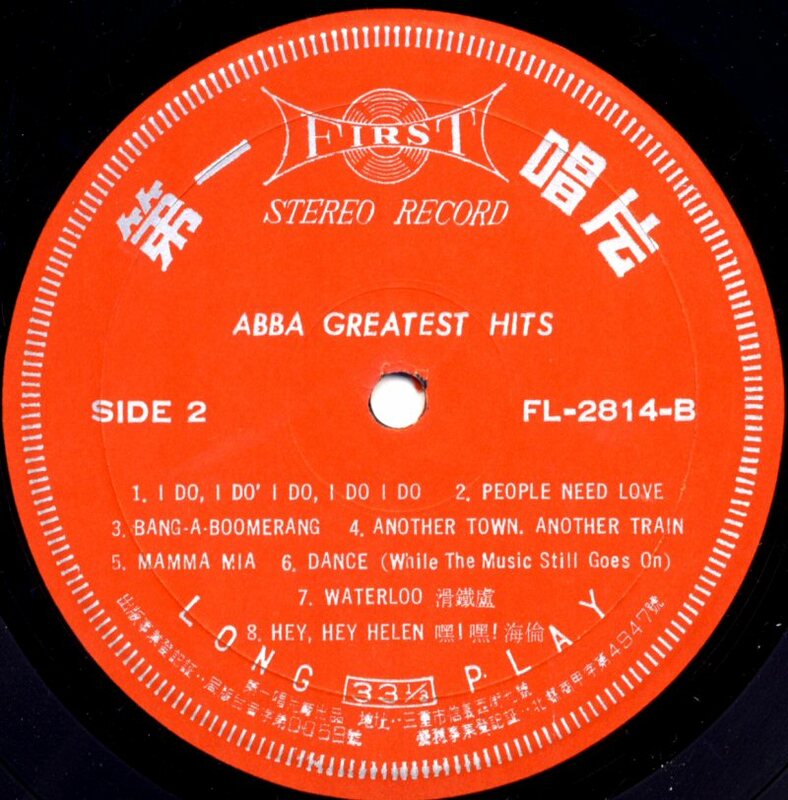 "Greatest Hits" released in Asia and Israel featured different cover and different track listings. 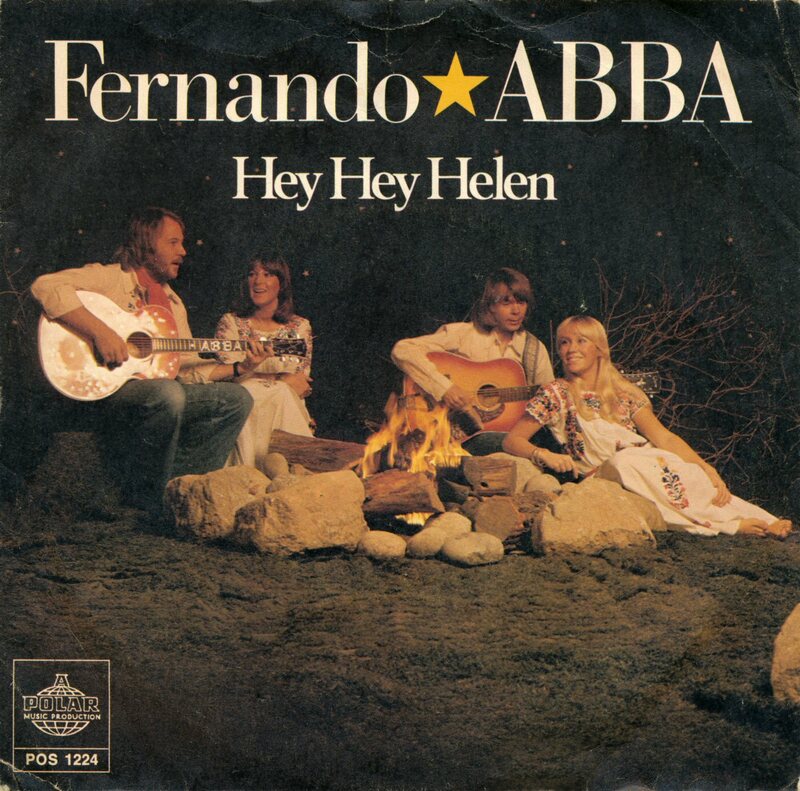 On the cover of the Korean release of the album there was stated that the album contained the hit singles: Fernando, Hasta Manana and Hey, Hey Helen. 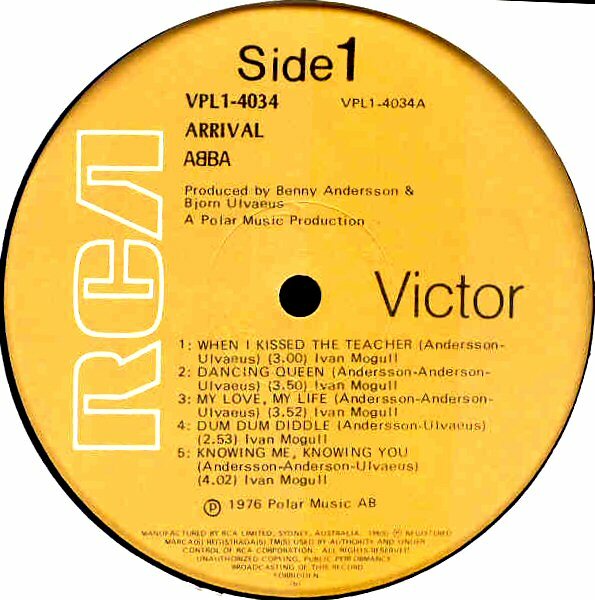 The latter was the closing track on the side B. 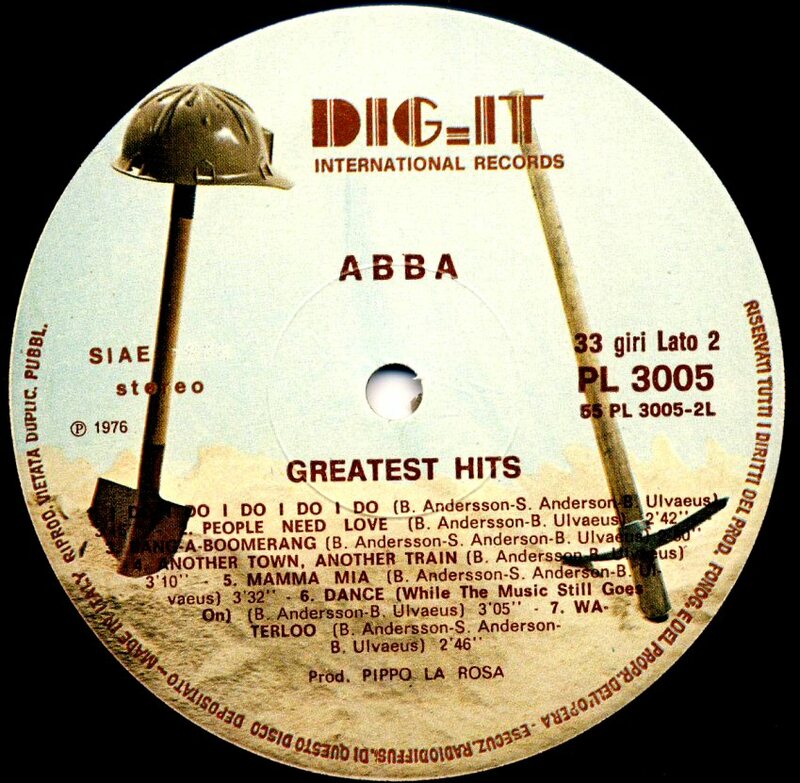 "Greatest Hits" from Israel on Epic label. 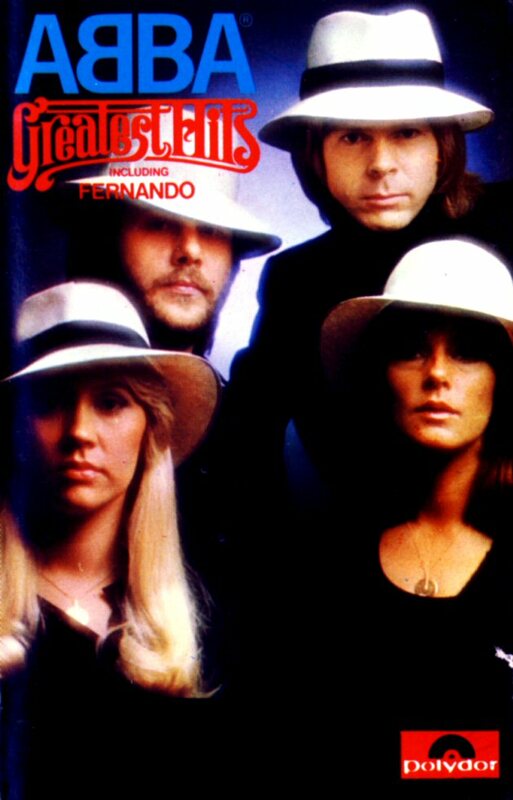 The Mexican version of "Greatest Hits" did not contain the group's smash hit "SOS" which was replaced by "Fernando". 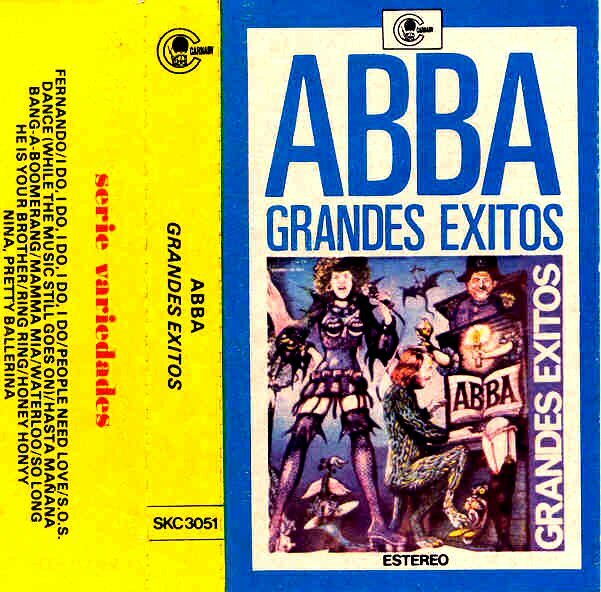 The album was released in Mexico in August 1976. 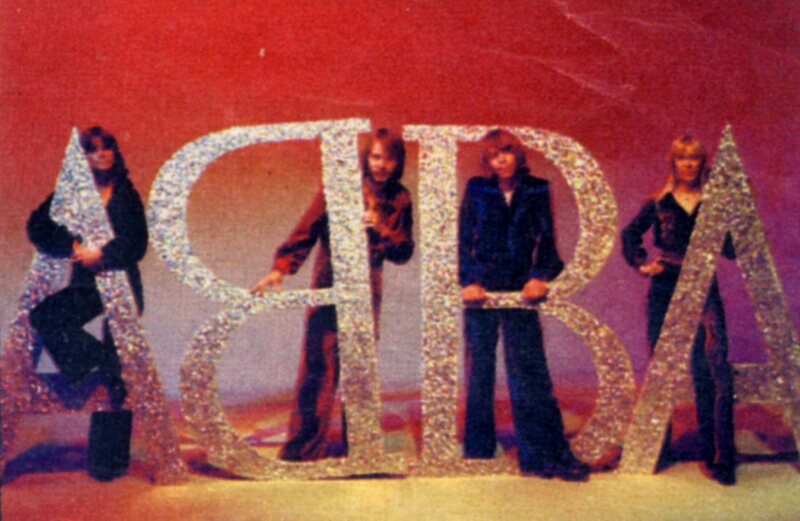 It was the first album cover with the new ABBA logo featuring one B reversed. 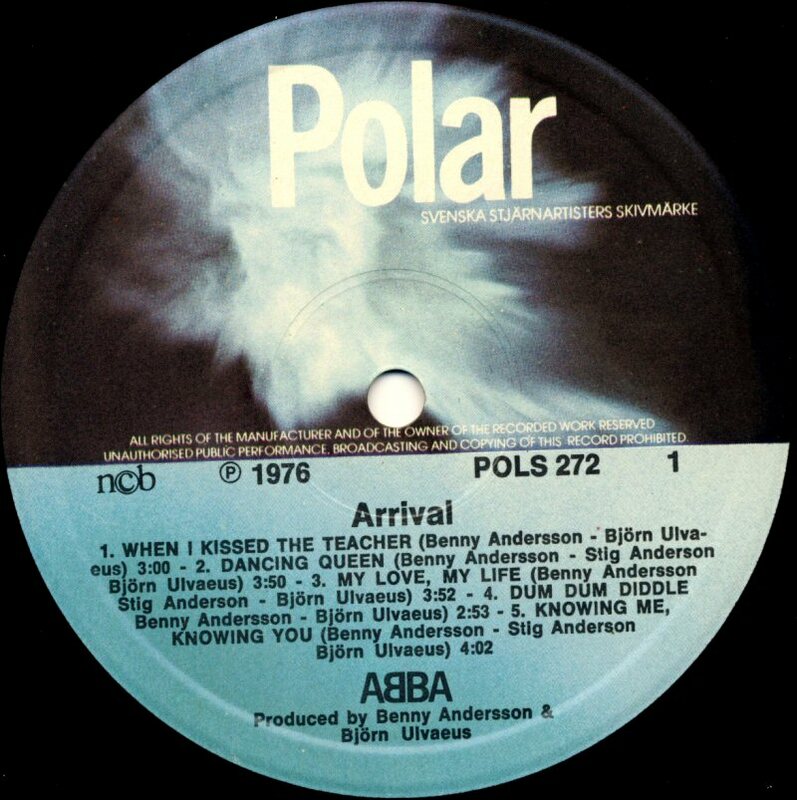 The Yugoslavian edition of the album featured ABBA's new logo on the record label which means that the album saw its release late in 1976 or in 1977. 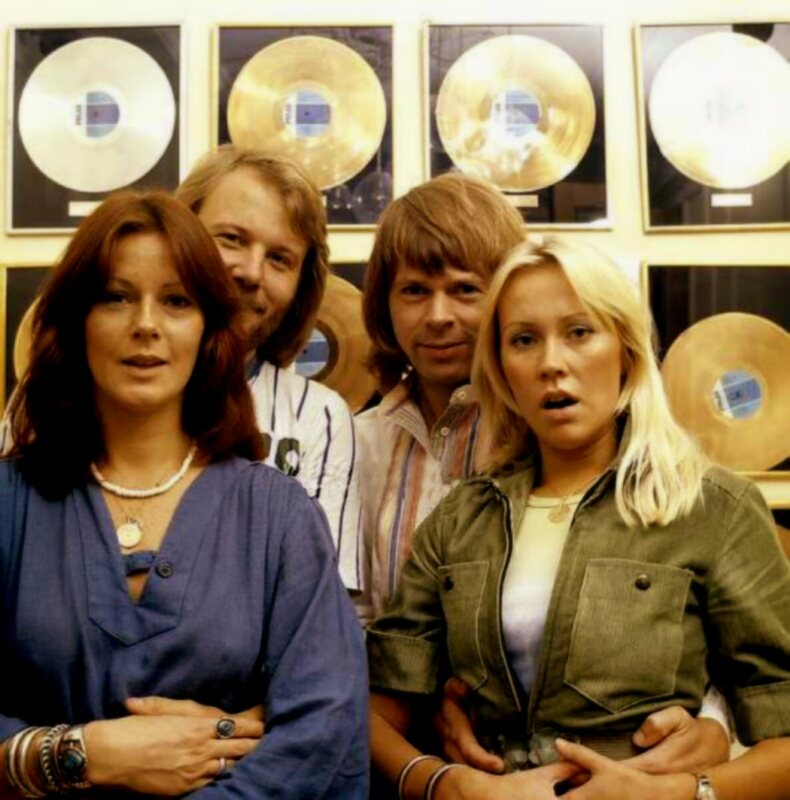 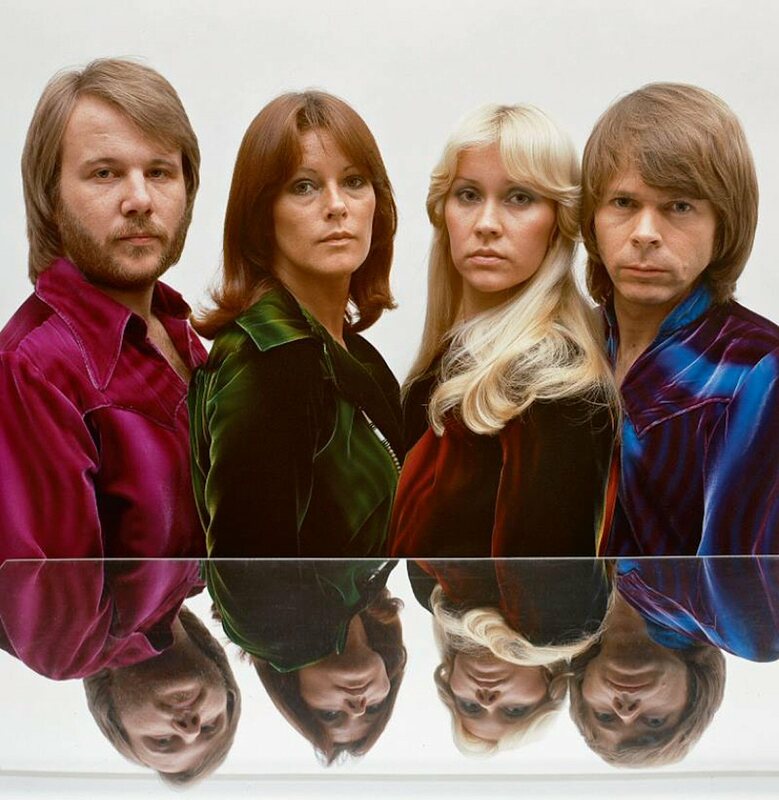 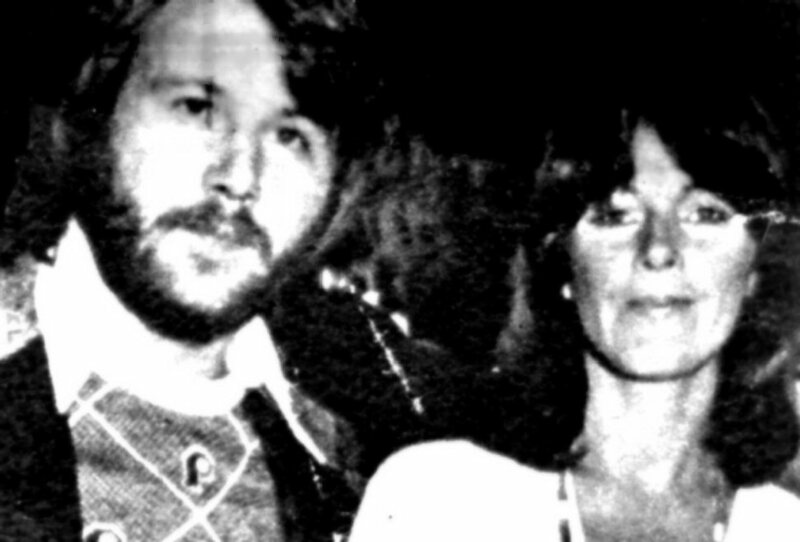 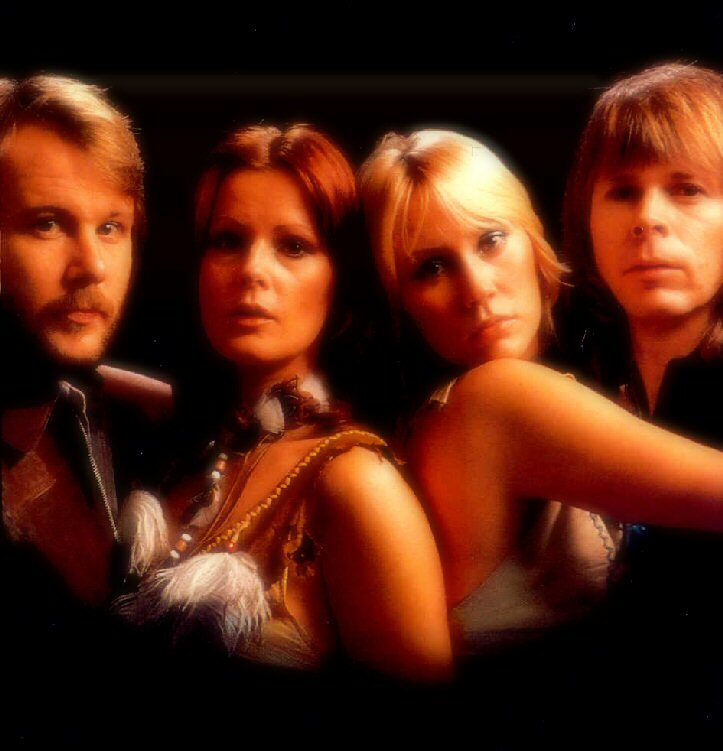 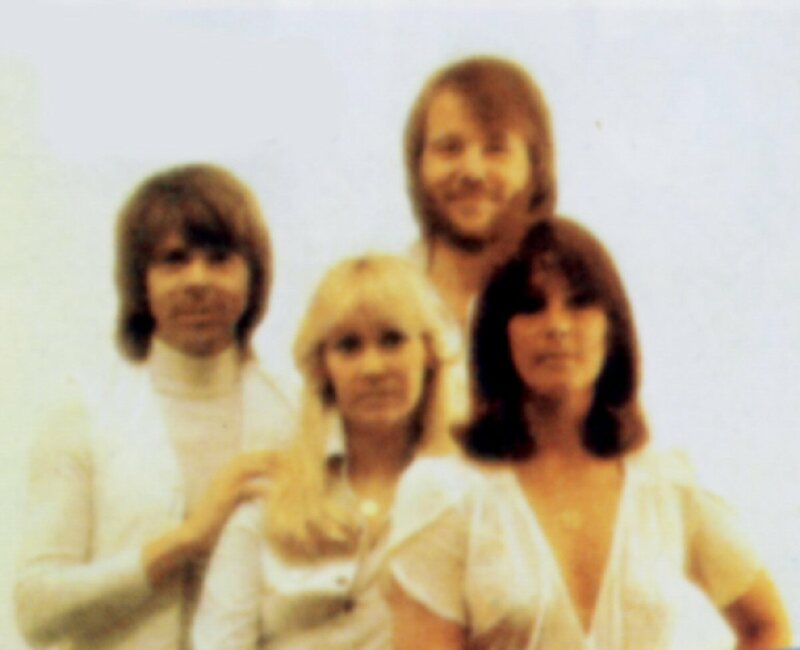 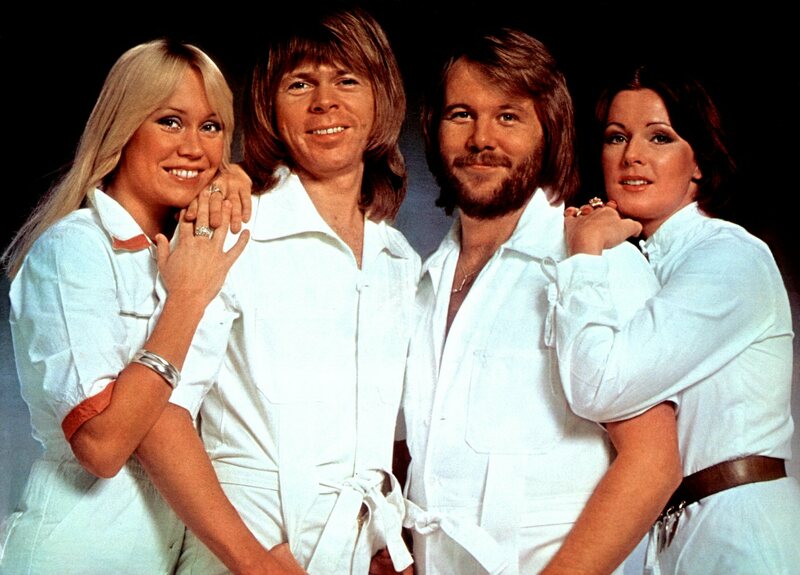 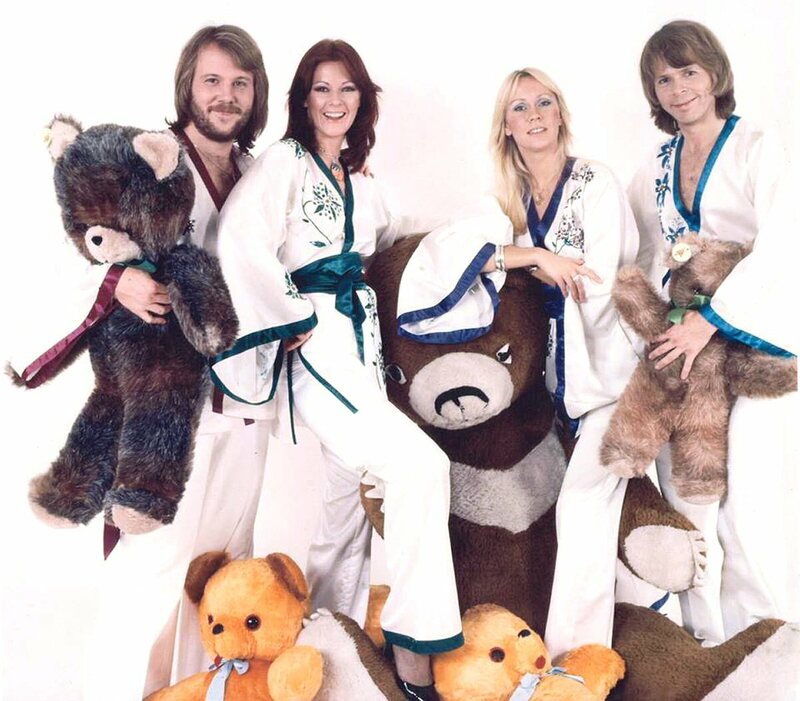 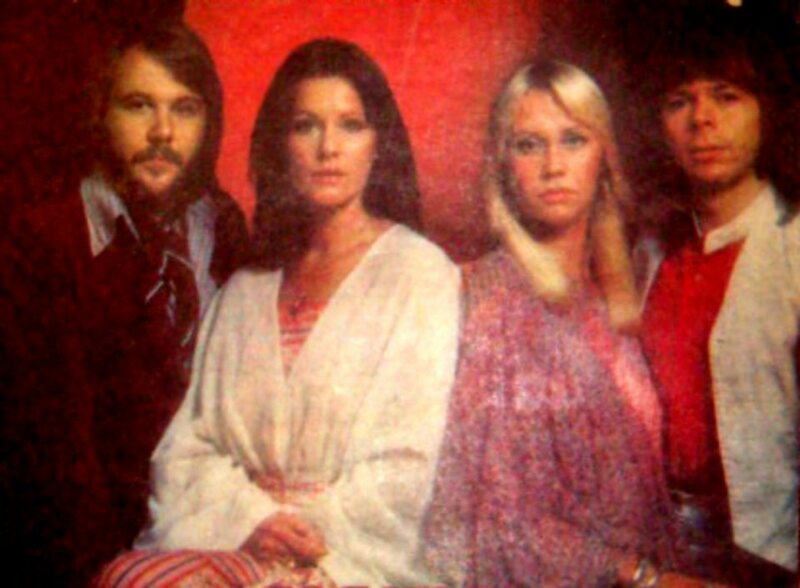 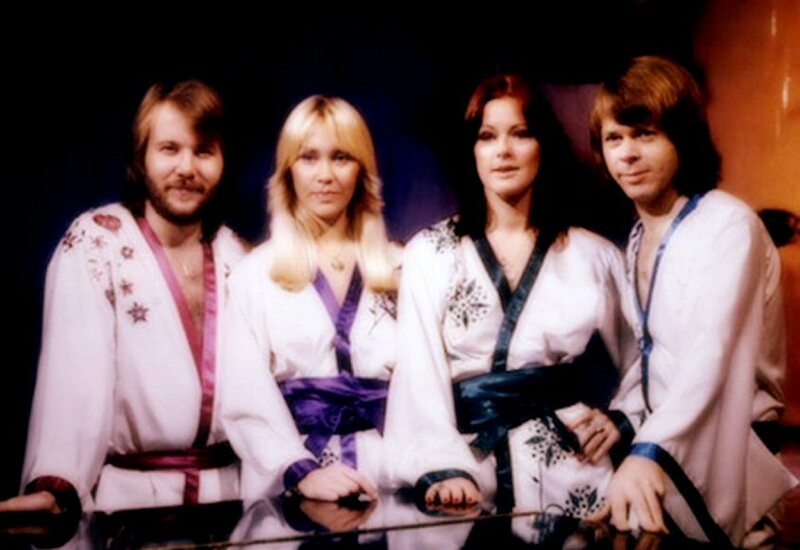 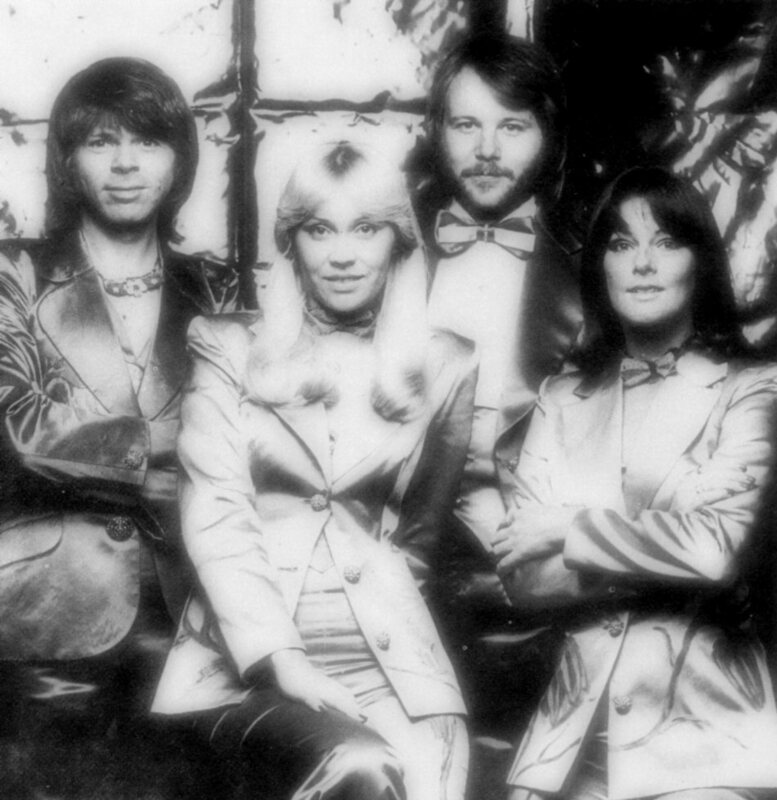 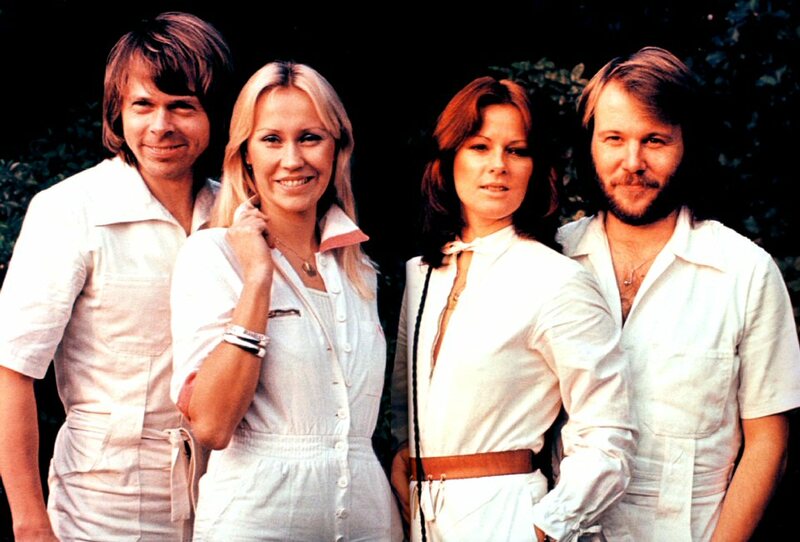 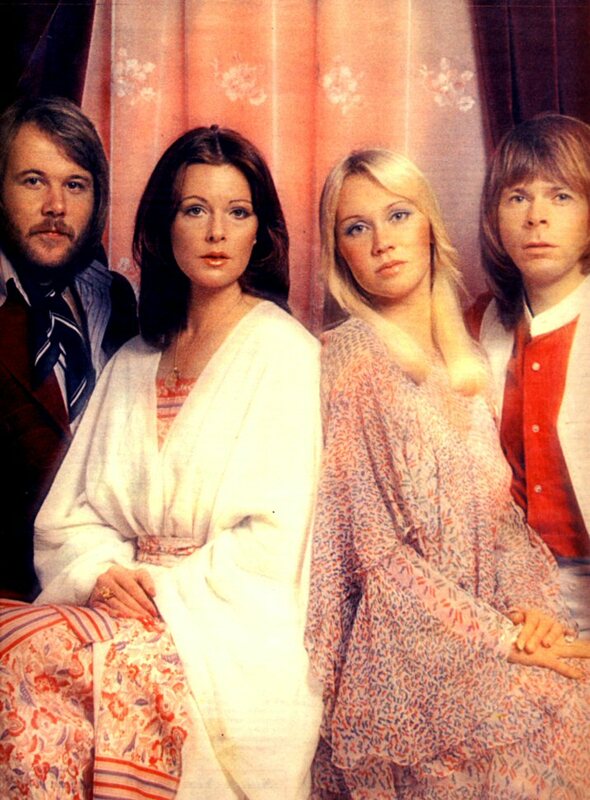 ABBA promoted the international release of "Greatest Hits" with a special video. 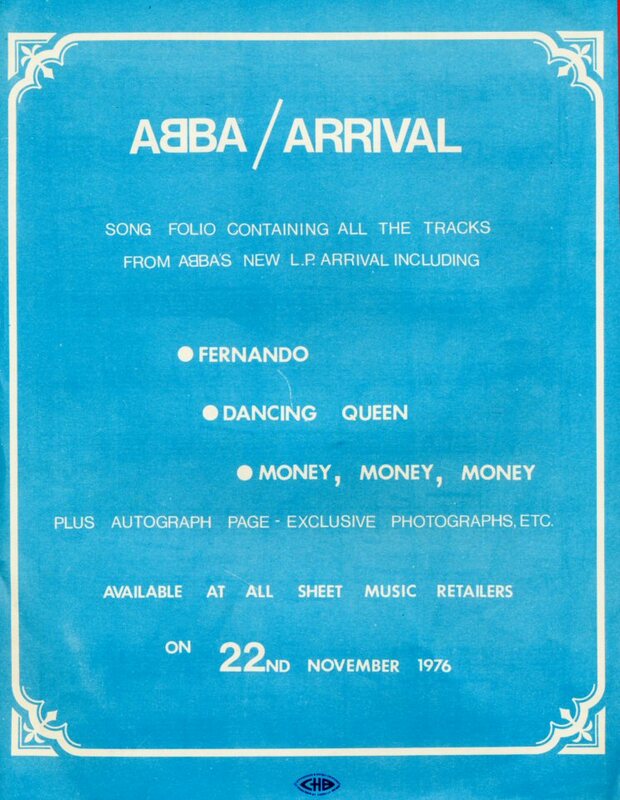 After the tremendous success of "Greatest Hits" in the UK and other countries a special note book was released. 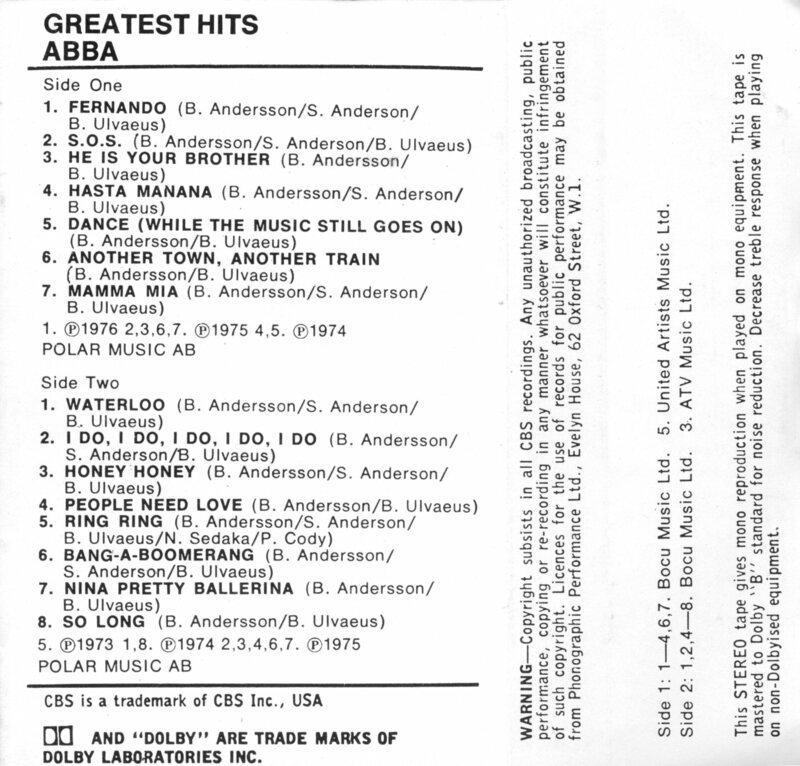 The book featured notes and lyrics to 15 songs from the album featuring the latest single hit "Fernando" which by that time had been added to all new pressings of "Greatest Hits". 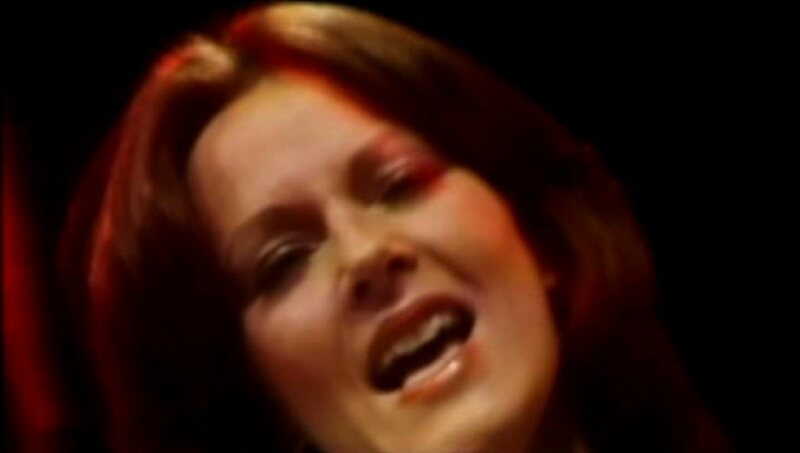 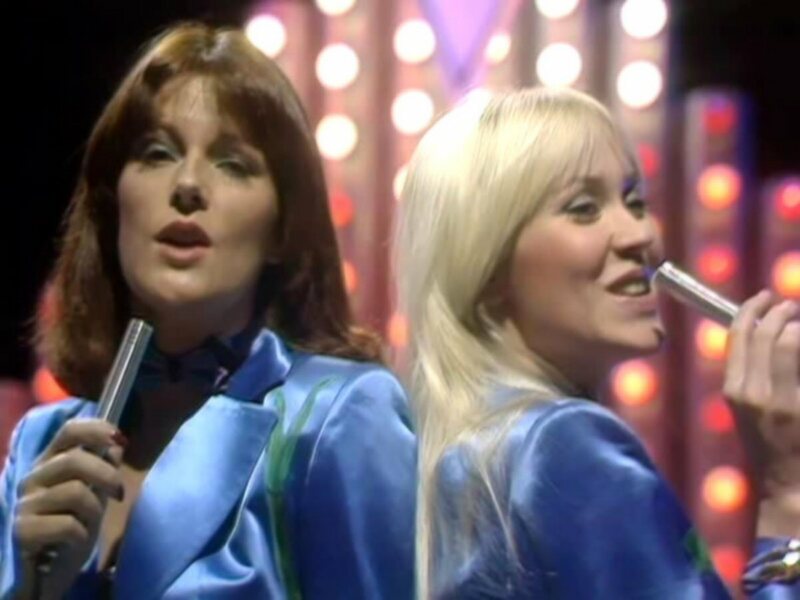 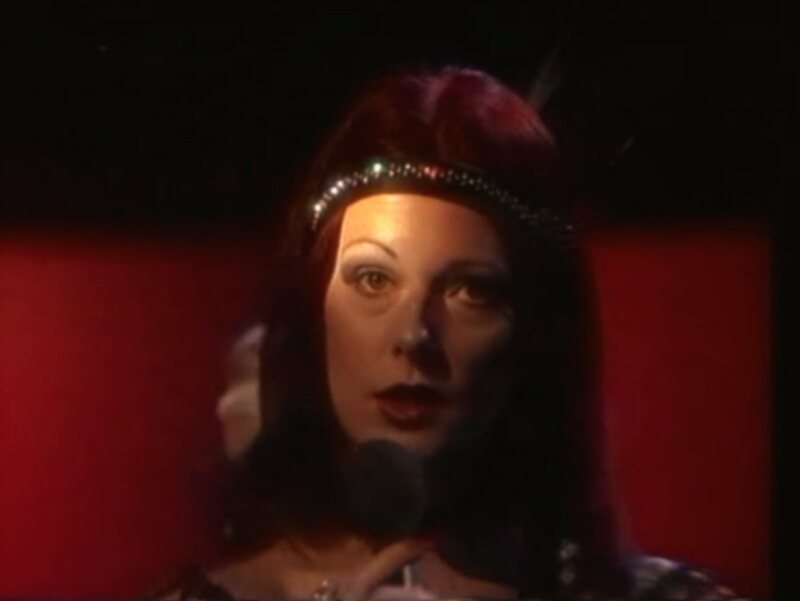 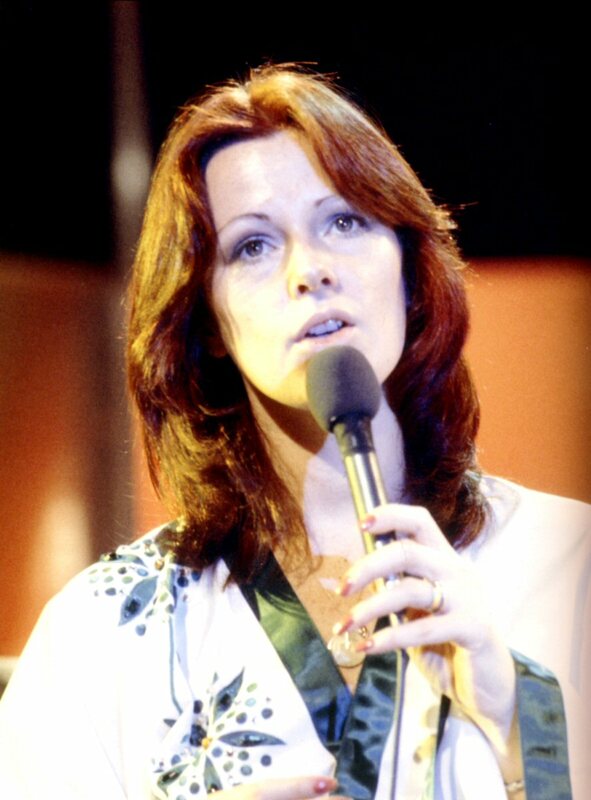 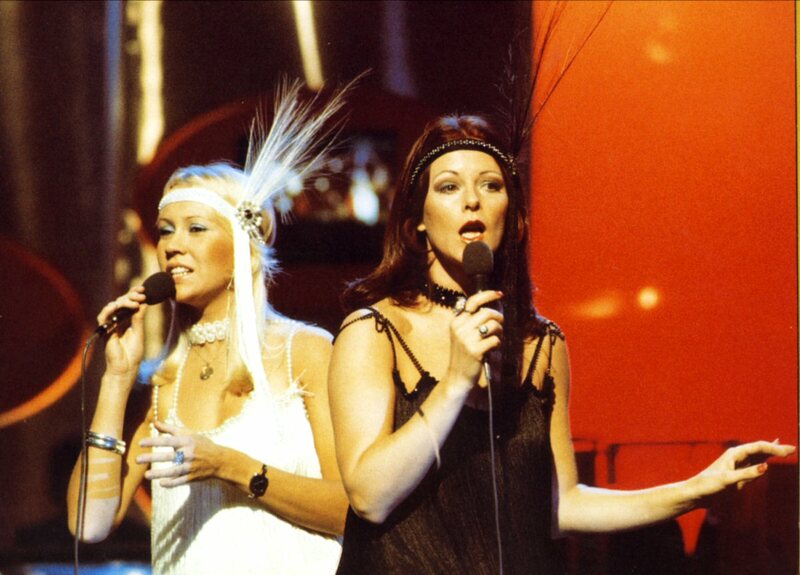 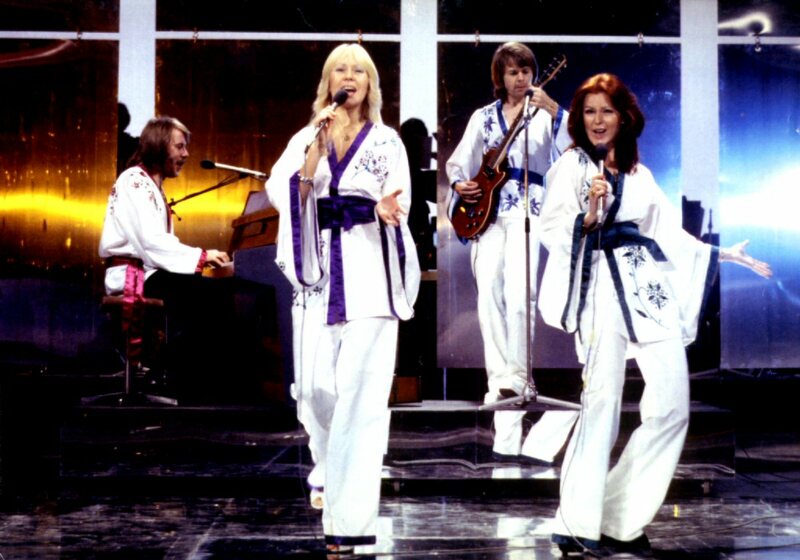 ABBA performed "Fernando" in the BBC special "Top of the Pops" which was aired on 8 April 1976. 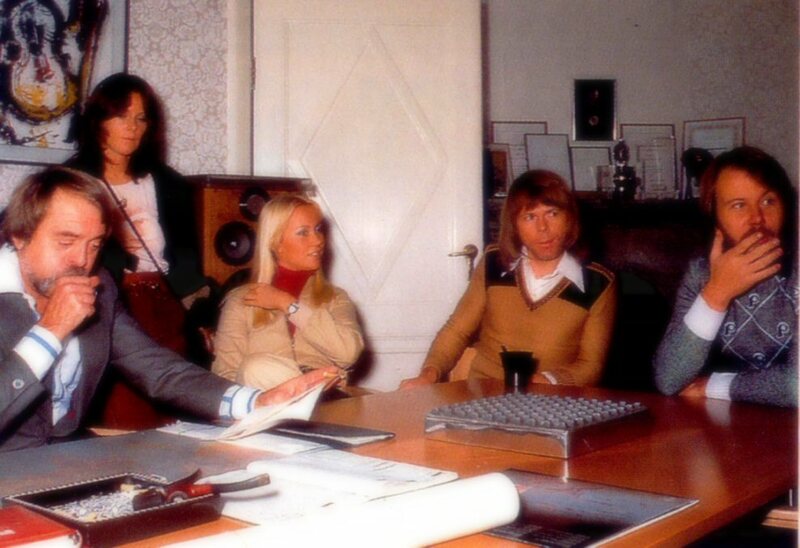 Photo sessions taken at the Polar headquarter in Stockholm at the beginning of 1976. 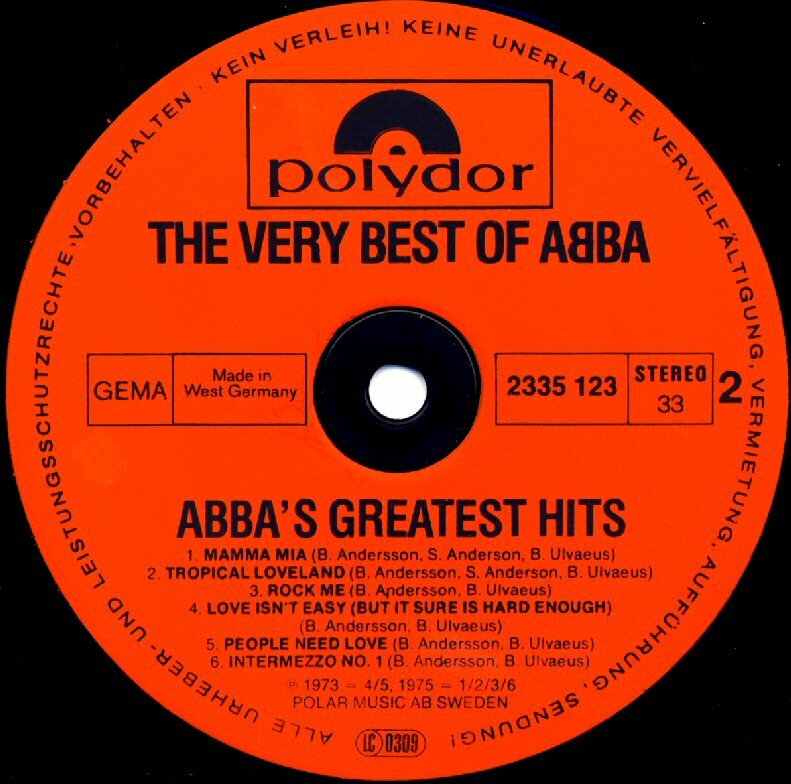 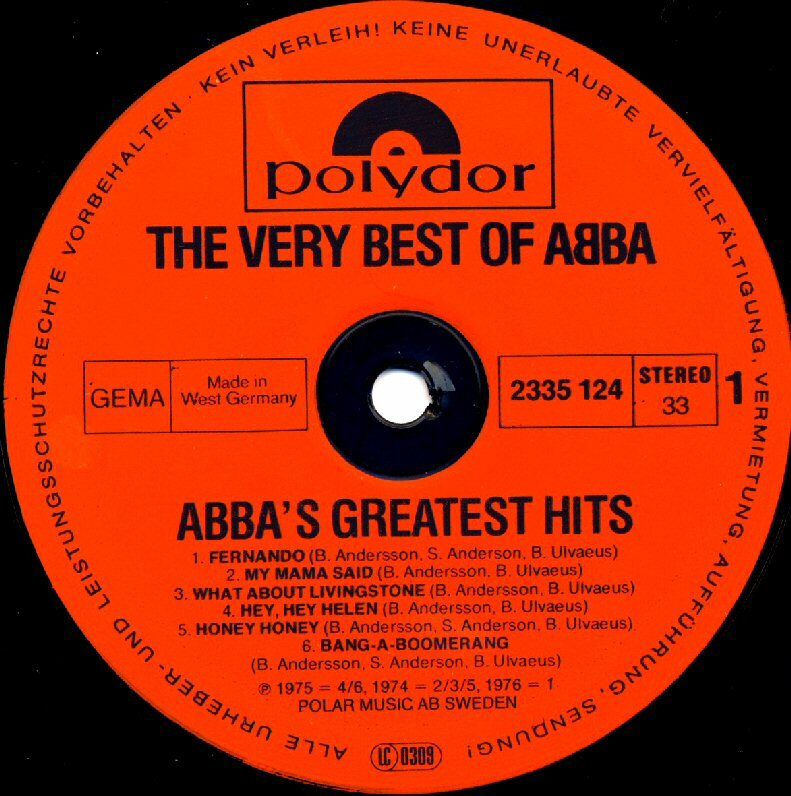 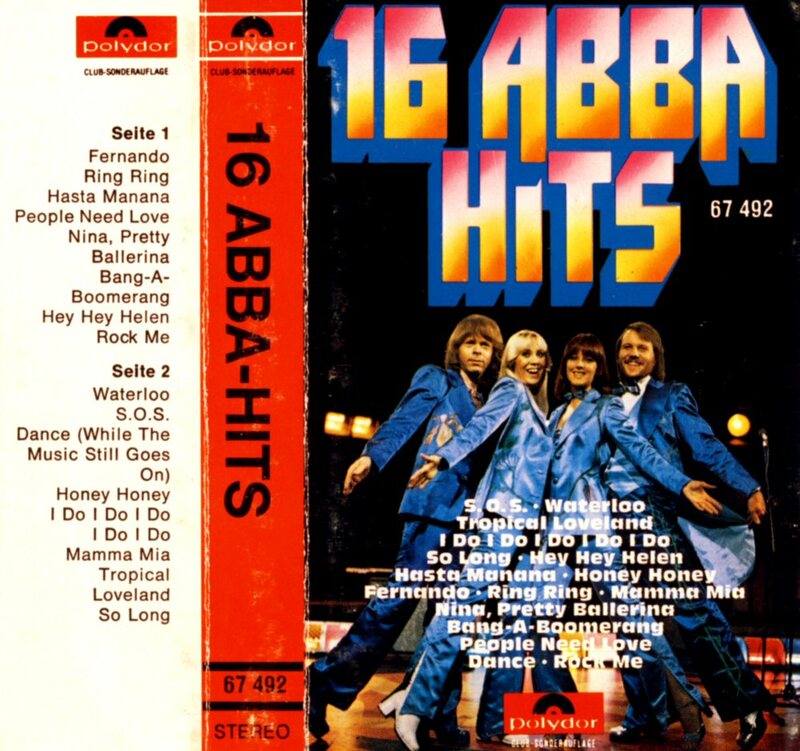 The compilation "16 ABBA Hits" was a special club release in West Germany issued by Polydor. 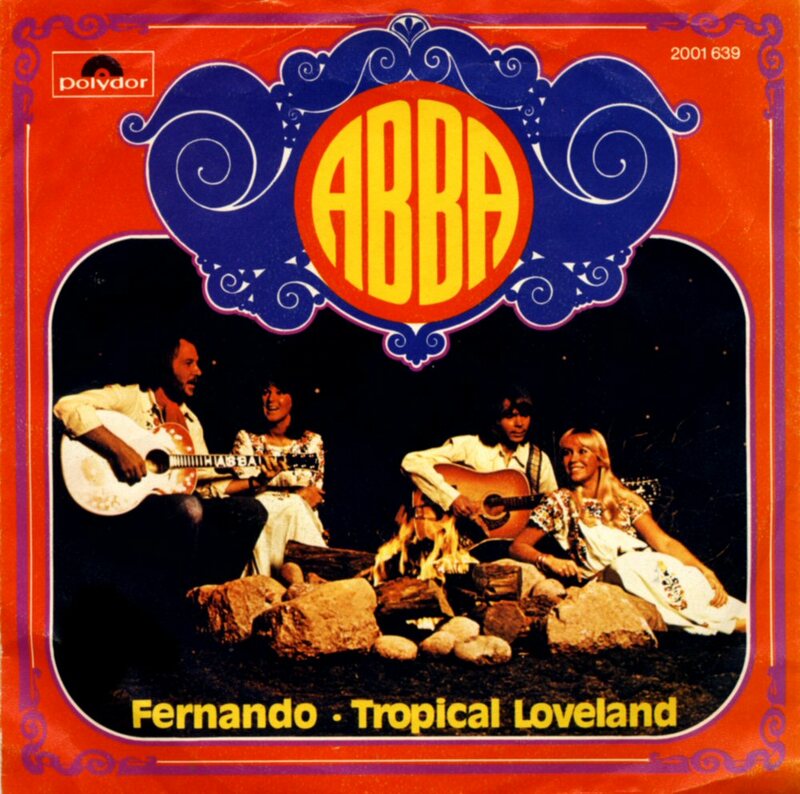 It featured songs recorded between 1973 and 1975 and "Fernando". 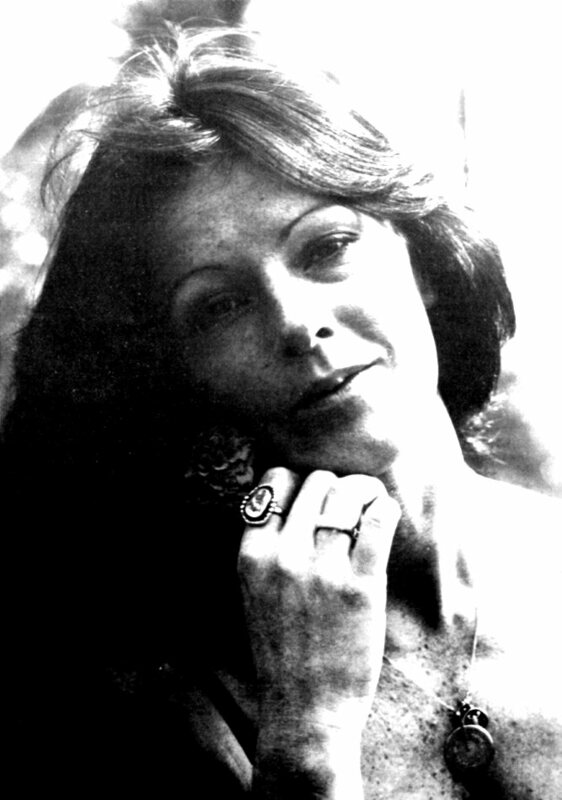 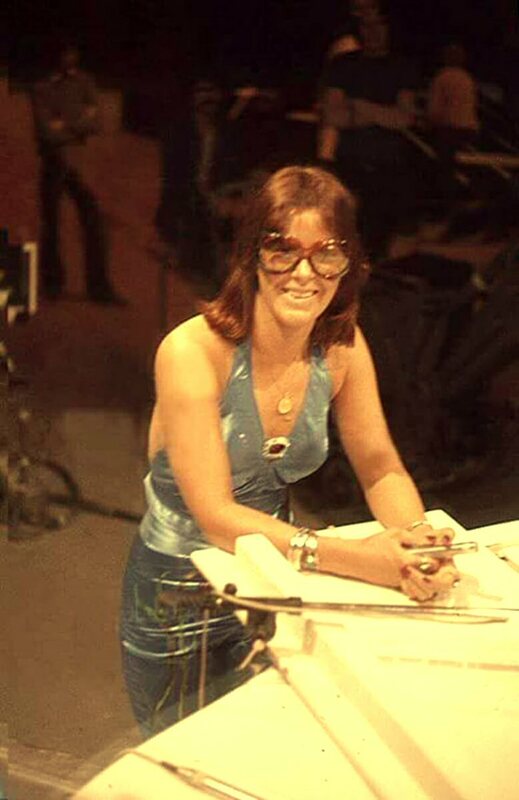 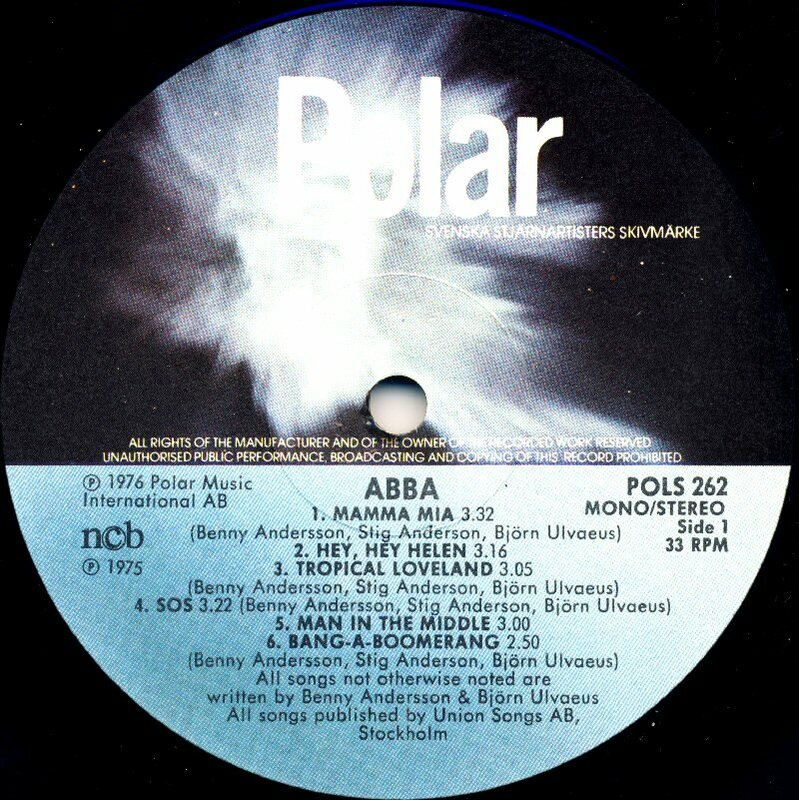 The Polar singer Birgitta Wollgård re-recorded "Mamma Mia" in Swedish in two versions both with the original soundtrack used by ABBA in 1975 and the own soundtrack recorded by her band. 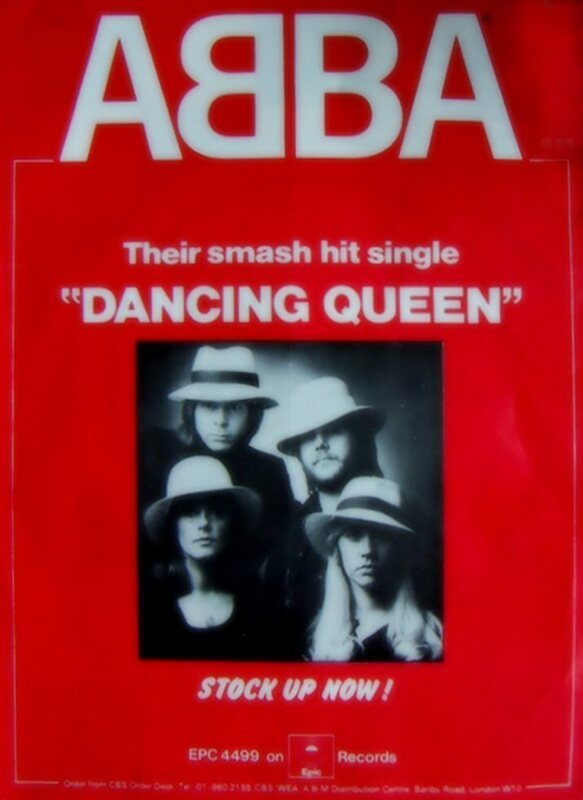 The single was released in May 1976. 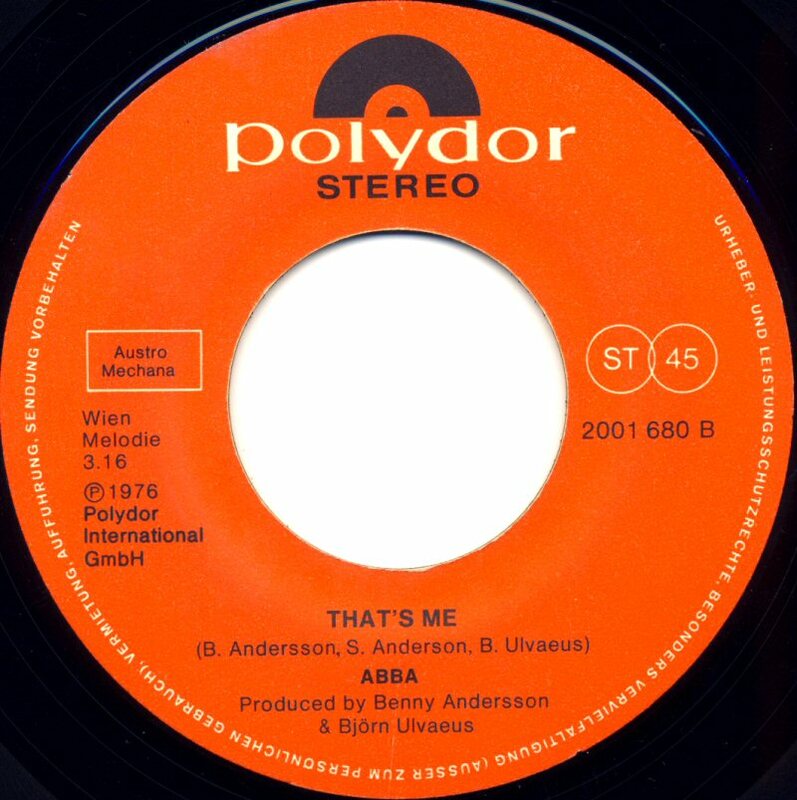 The song entered the Swedish hit list "Svensktoppen" in June where it reached #5. 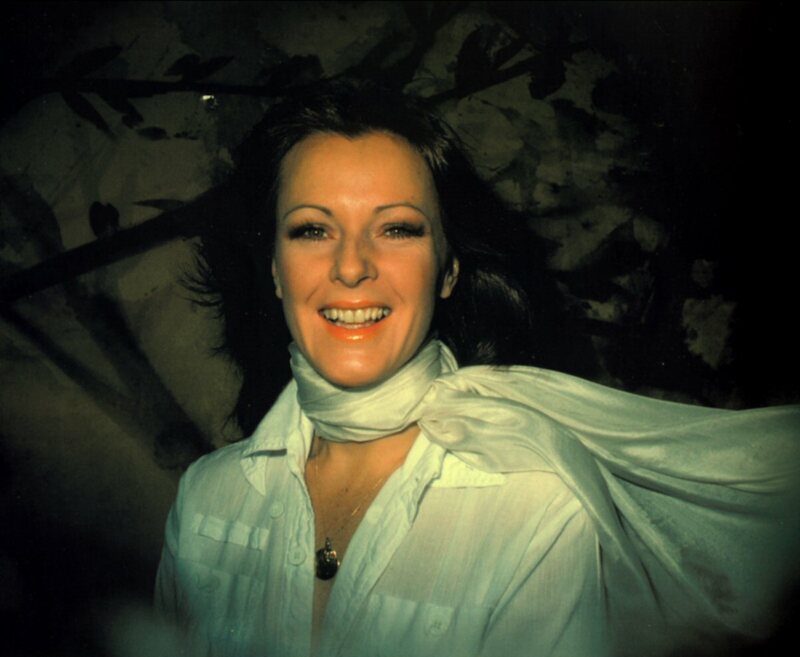 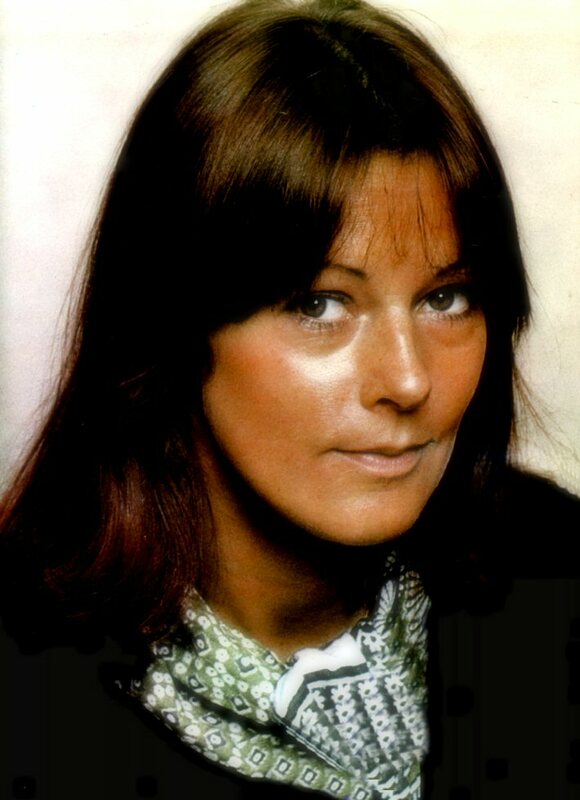 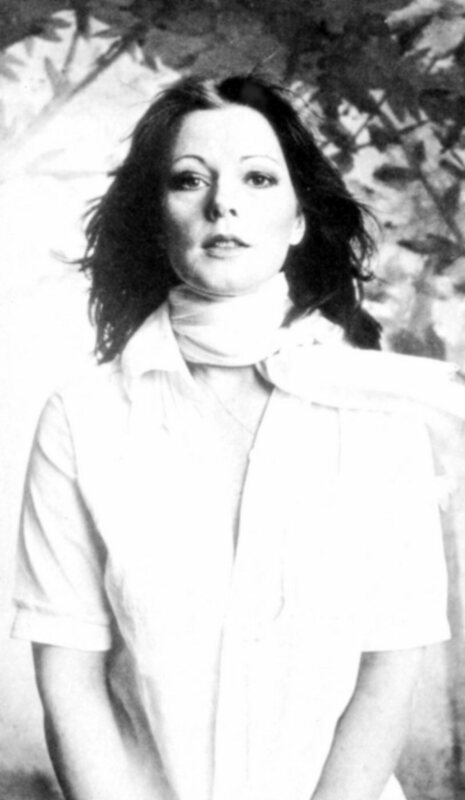 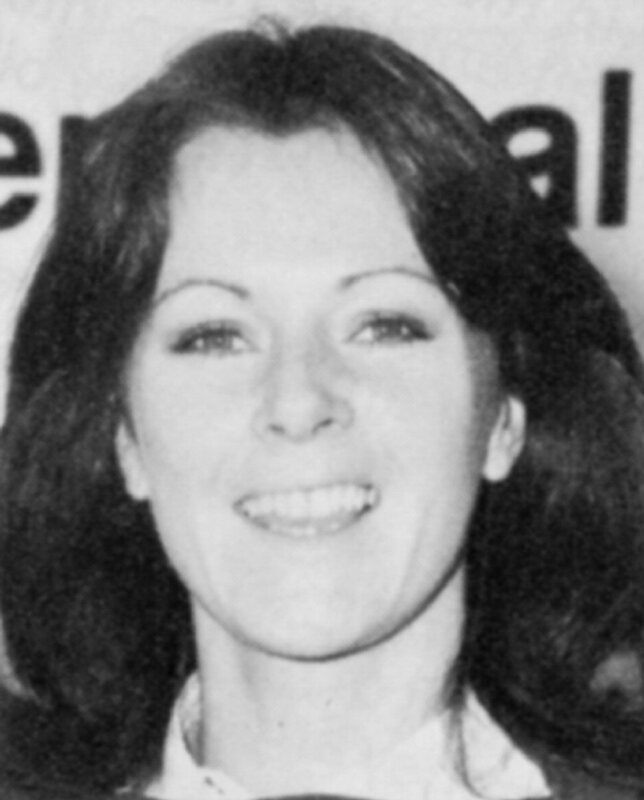 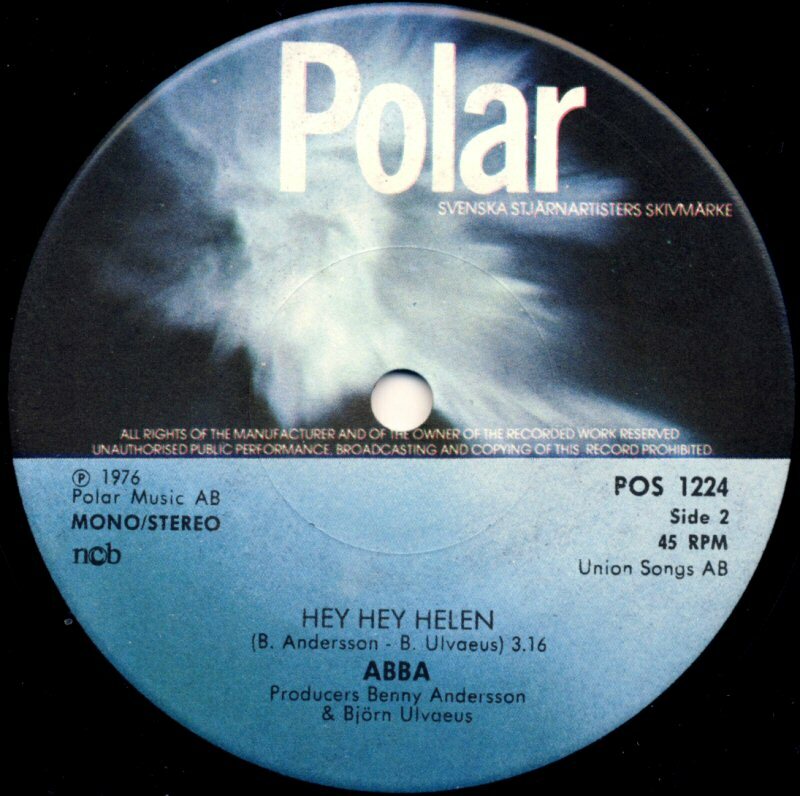 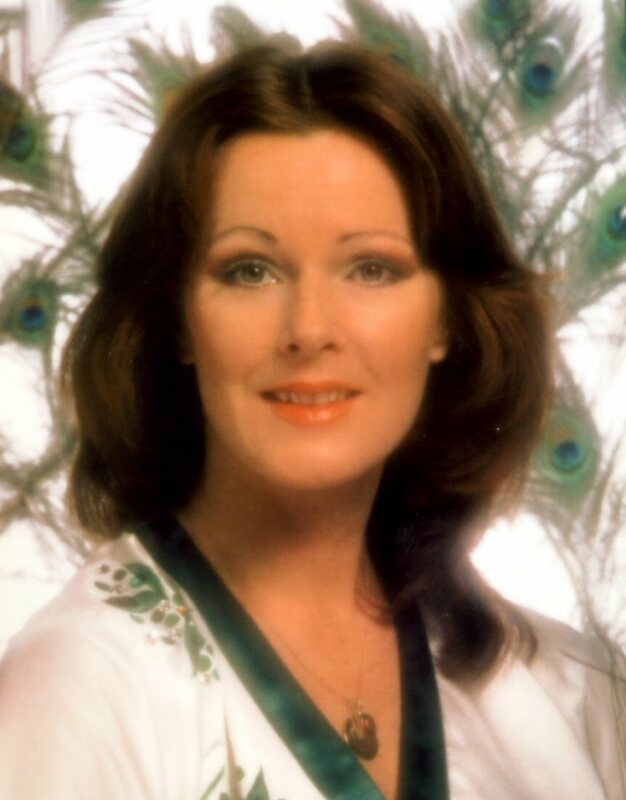 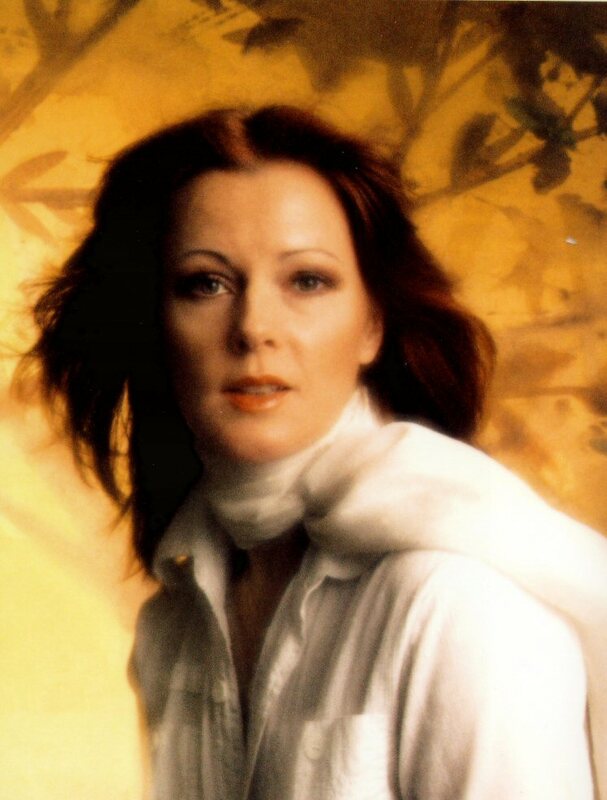 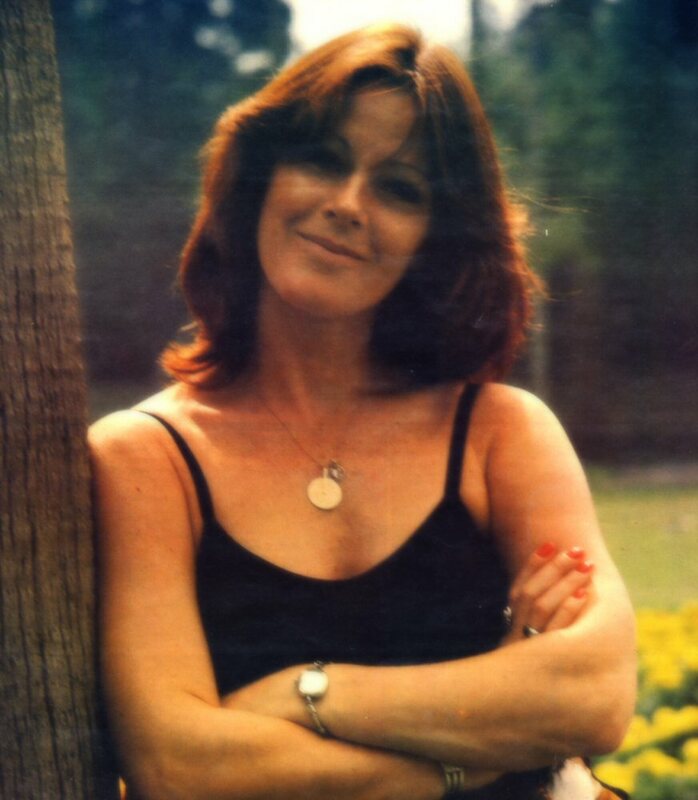 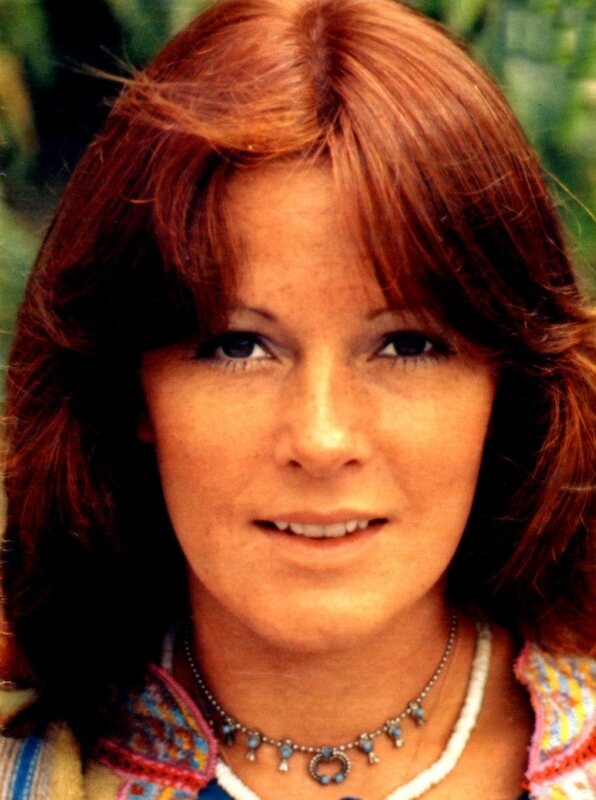 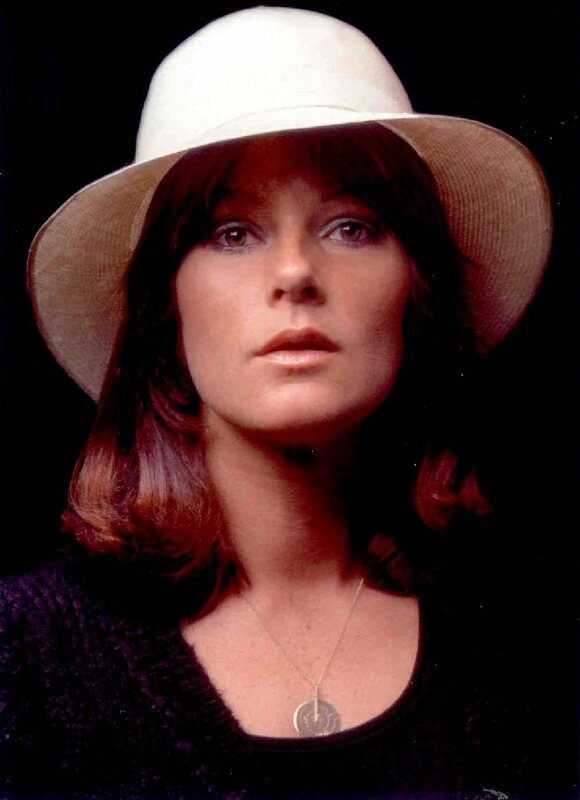 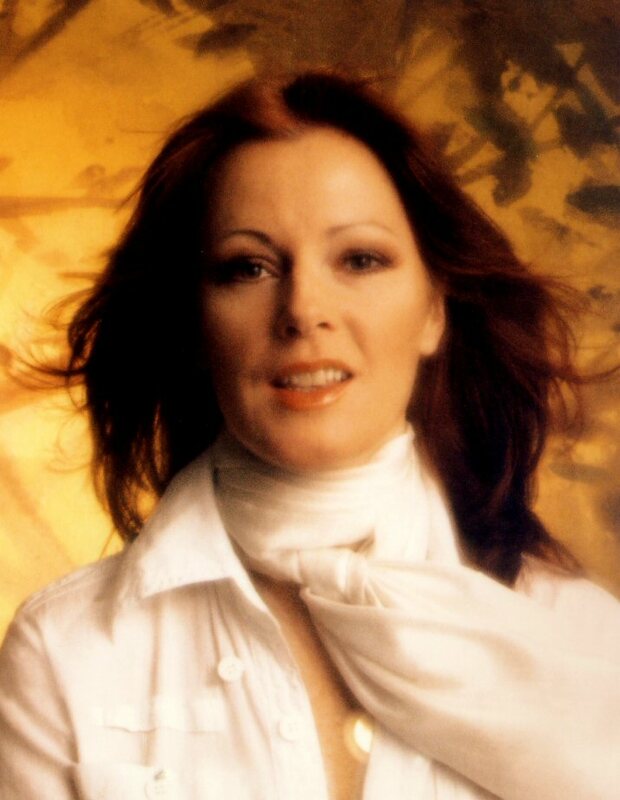 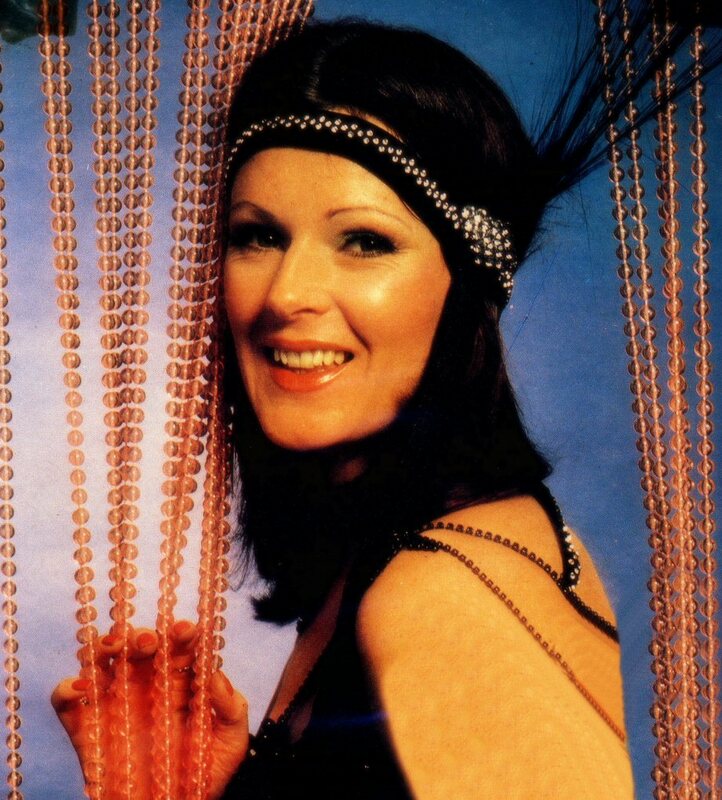 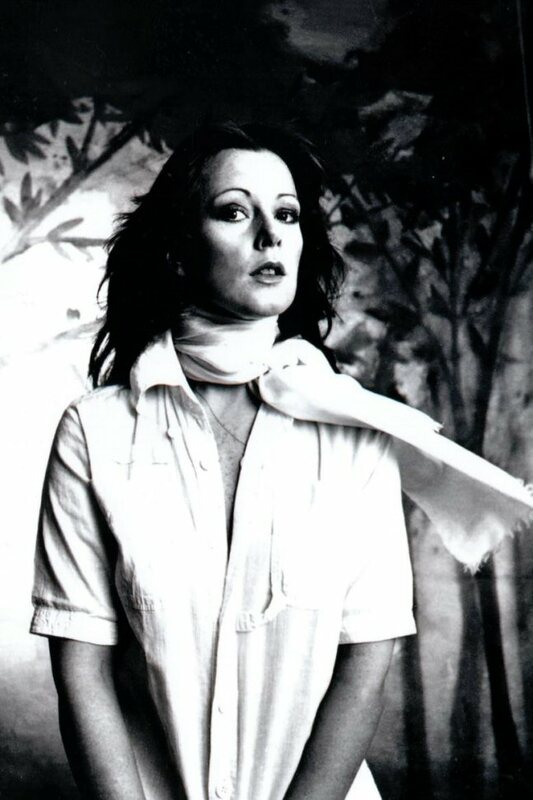 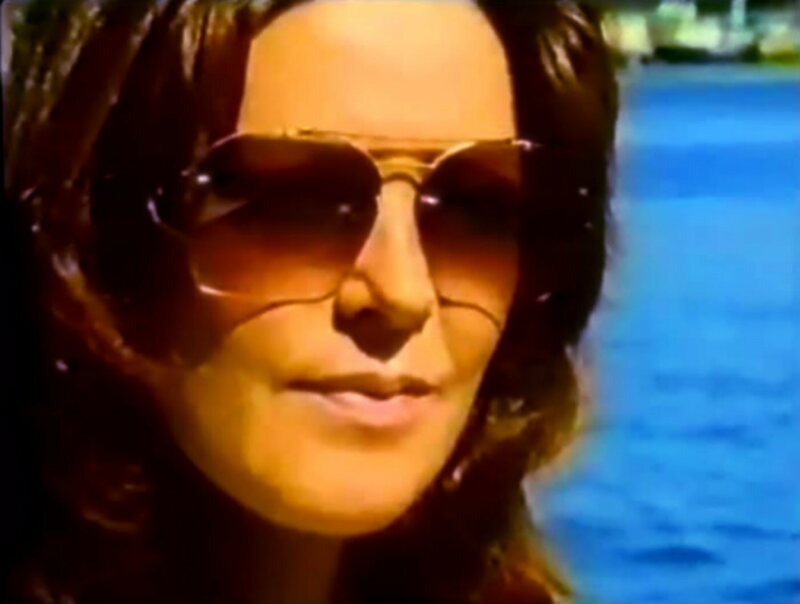 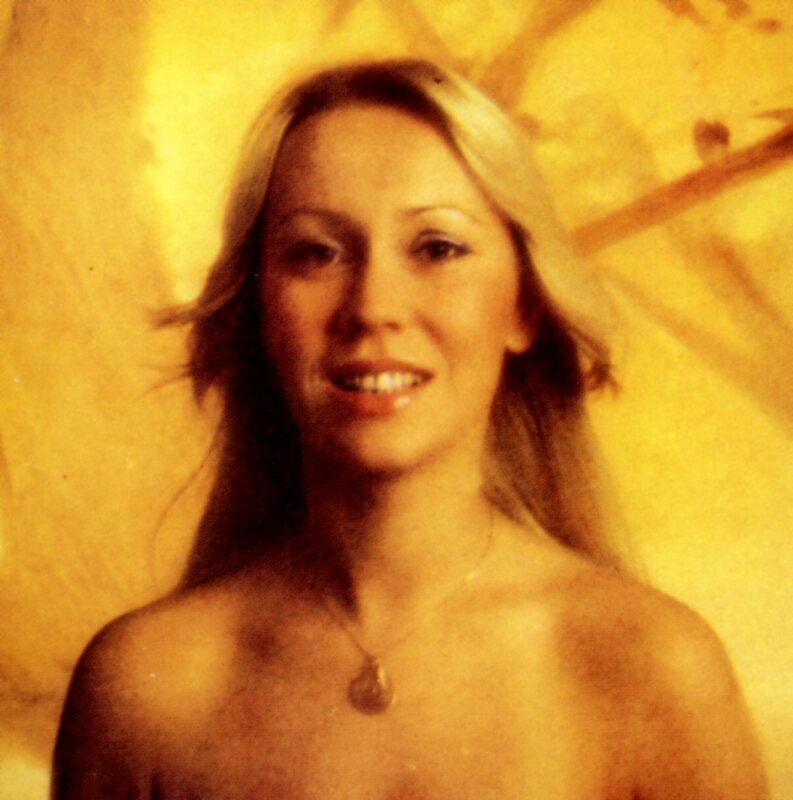 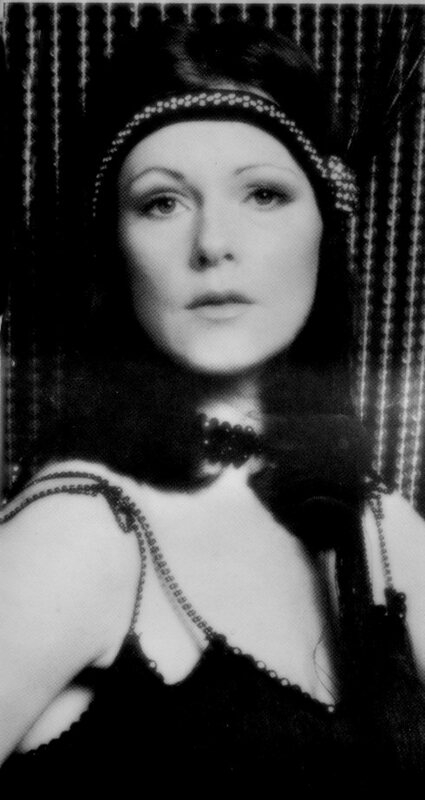 Polar Music tried to promote Swedish singer Lena Andersson in West Germany already in 1975 when her first German language single with two ABBA songs "SOS"/"Hasta Manana" featuring the original ABBA backing tracks. 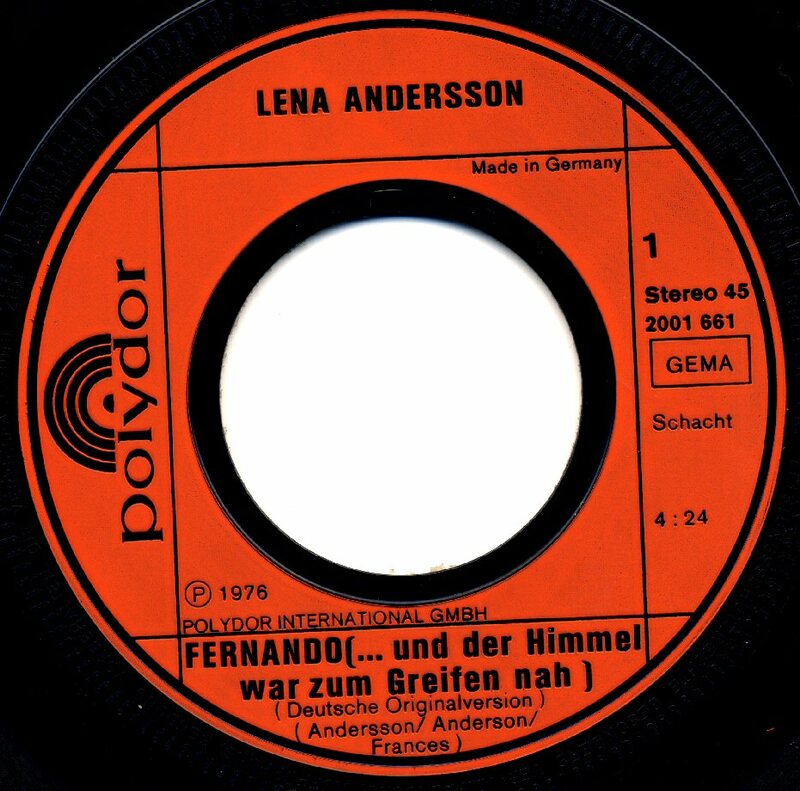 The second attempt to promote Lena in German was a German language version of "Fernando". 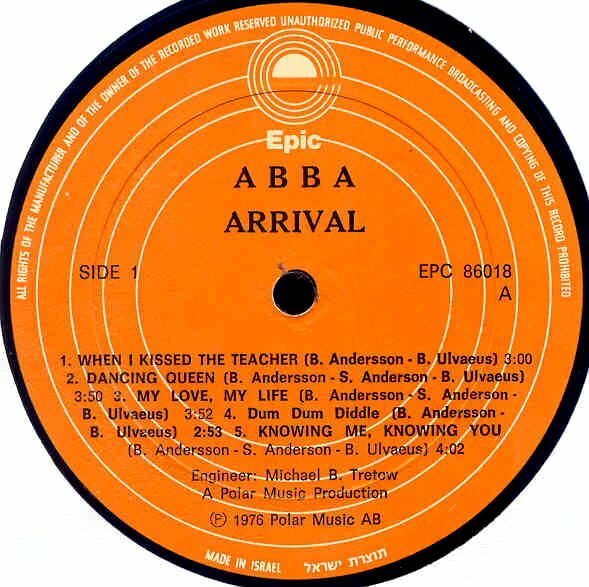 Even this release had the backing track originally recorded by ABBA. 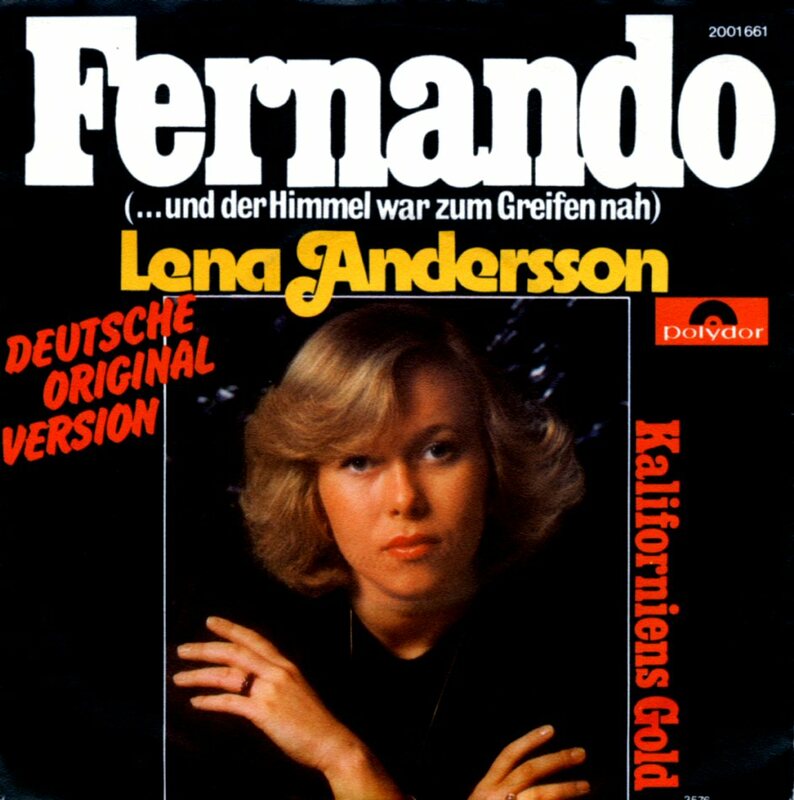 After the tremendous chart success of the ABBA single "Fernando" all over the world Stikkan Anderson hoped that this release would give a kick for Lena's career in West Germany. 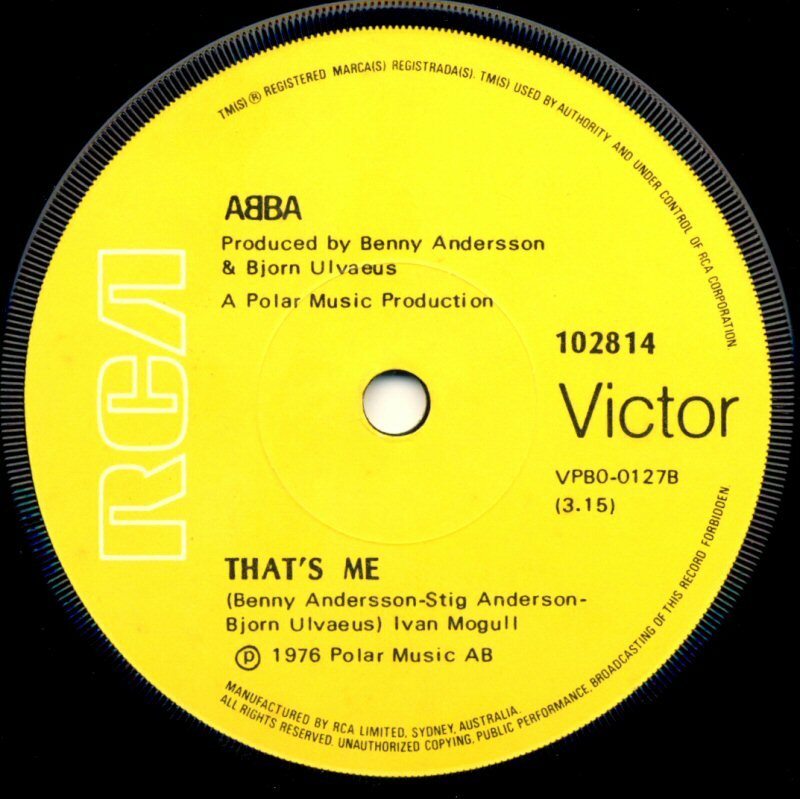 But the single which was released in May 1976 did not enter the chart in West Germany. 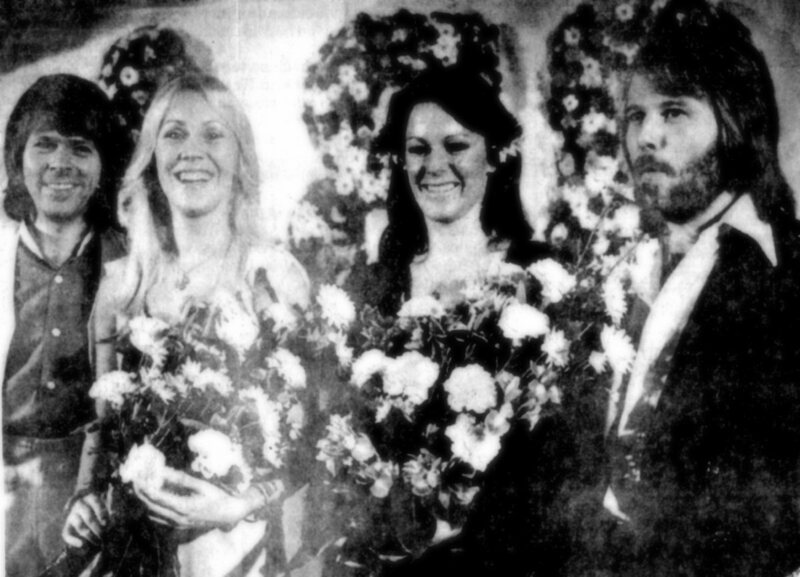 On June 11th Frida and Benny attended the wedding of the Swedish pop star Lars Berghagen at the Tyresö church south of Stockholm. 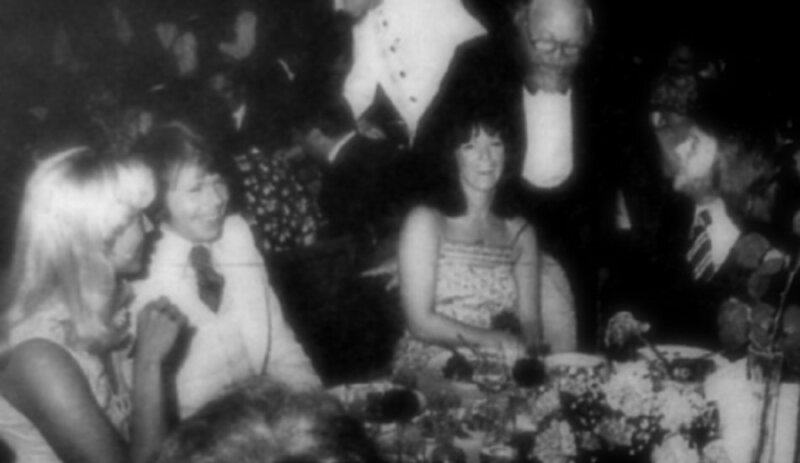 Frida alone attended even a premiere of a opera at the Drottningholm Theatre outside Stockholm. 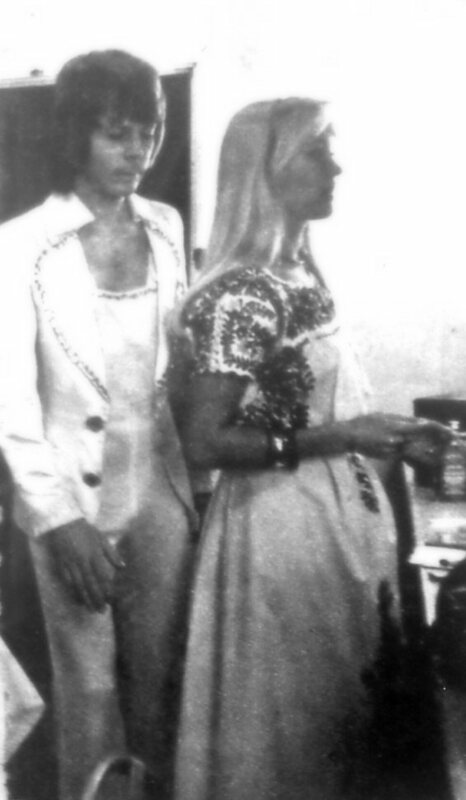 The Royal Gala was held for the King of Sweden and Sylvia Sommerlath who would marry the Swedish King the day after (on June 19th). 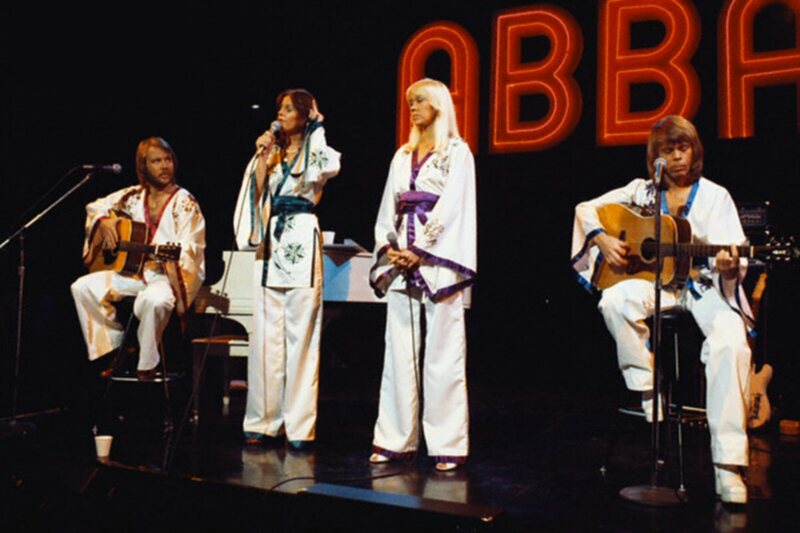 ABBA was the only pop act performing in the show in the Opera house in Stockholm. 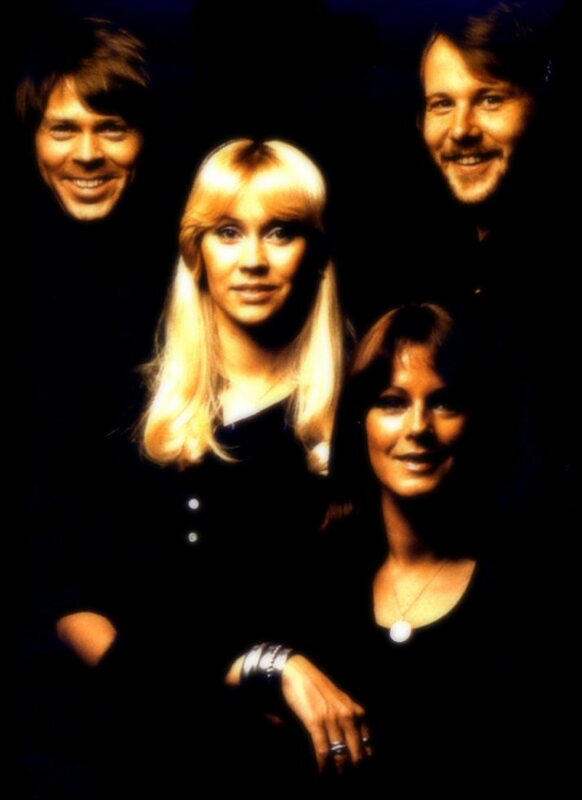 They sang "Dancing Queen" which would be their next single in a couple of weeks, the first SP from their forthcoming album. 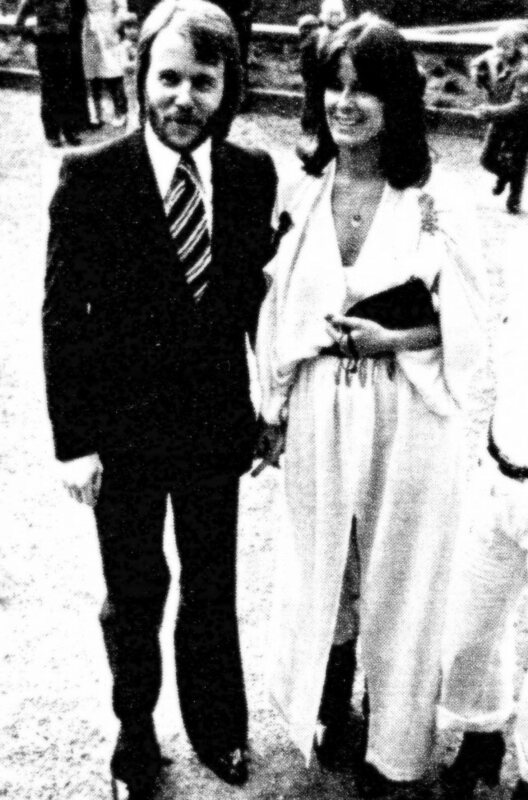 After the show the King and Sylvia went to the Drottningholm Palace outside Stockholm to celebrate with family and friends. 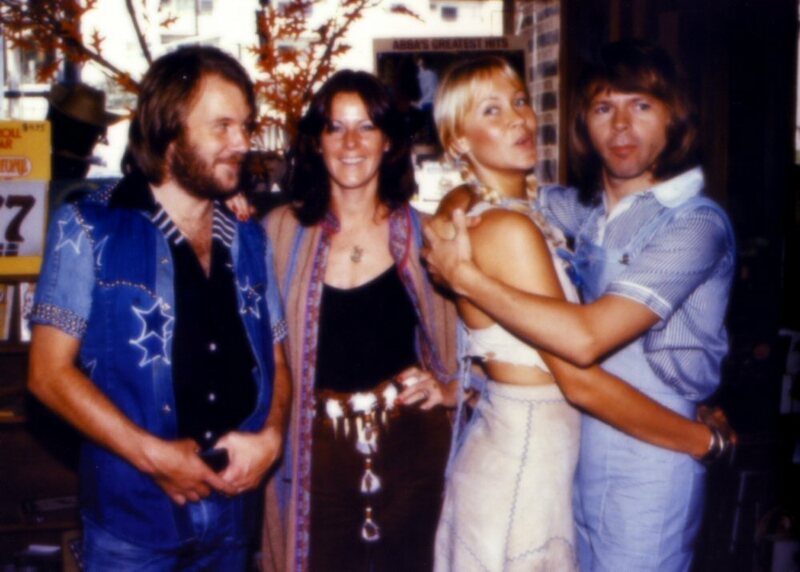 ABBA and other artists stayed at the Opera spending some hours at one of the most luxury restaurant in Stockholm "The Opera Cellar". 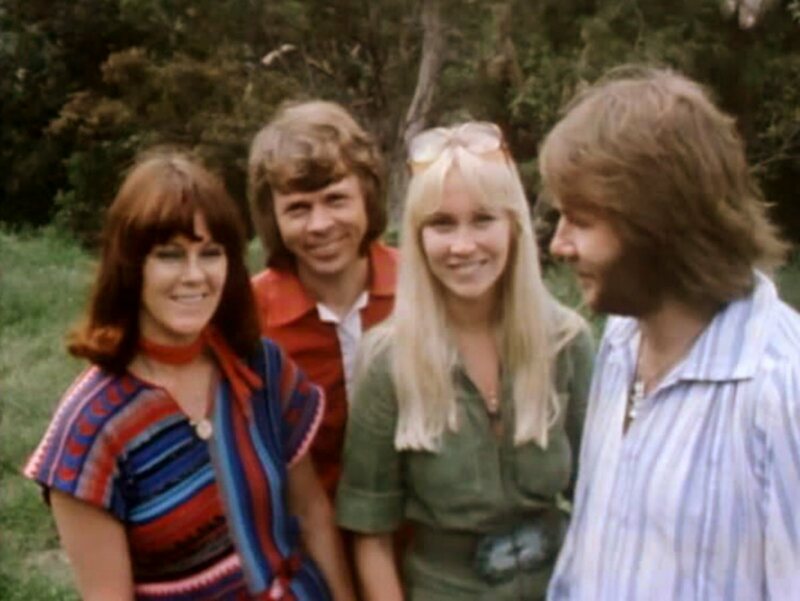 The Australian TV team came to Stockholm in the summer and made a special about ABBA. 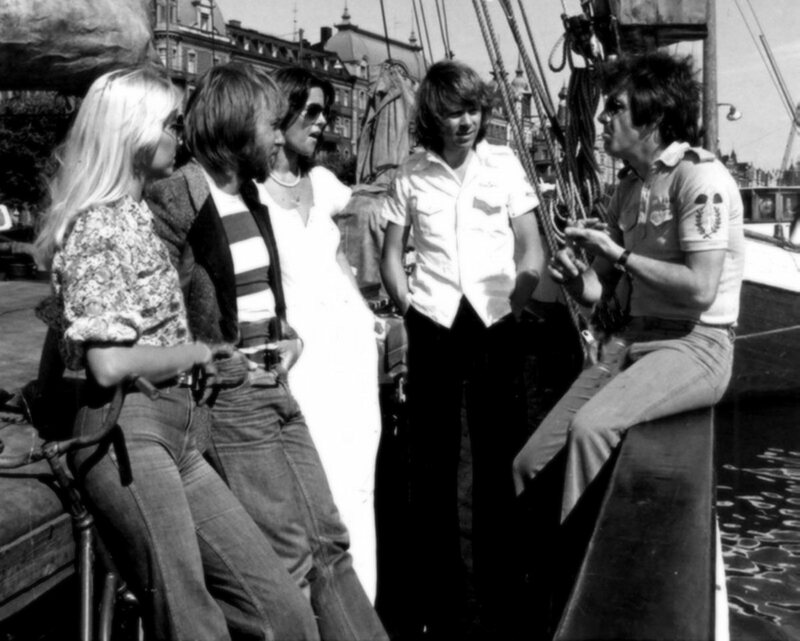 The group was interviewed on the boat in the Stockholm harbour. 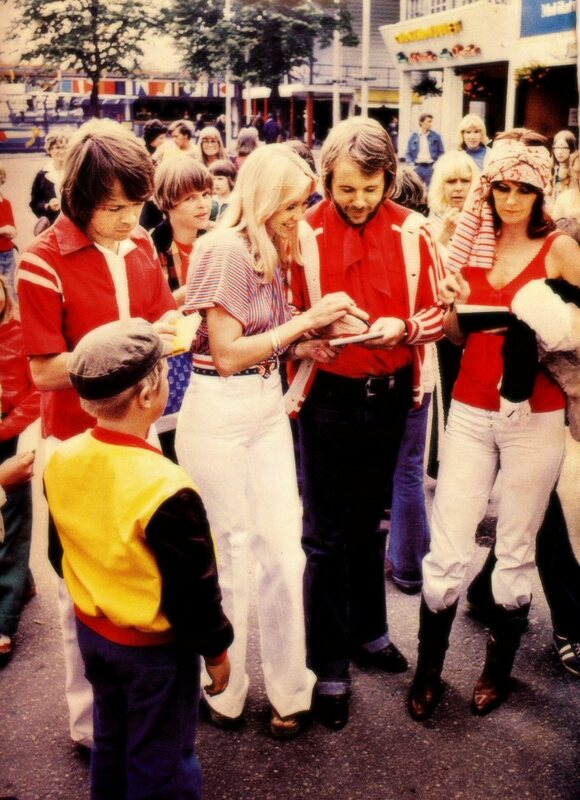 Even the manager Stig Anderson was interviewed in the programme. 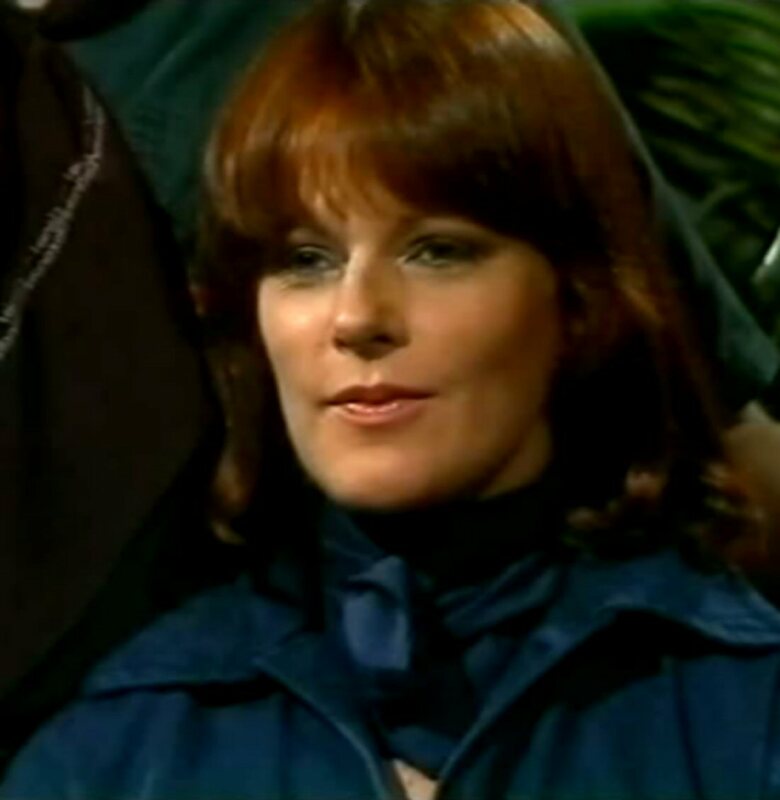 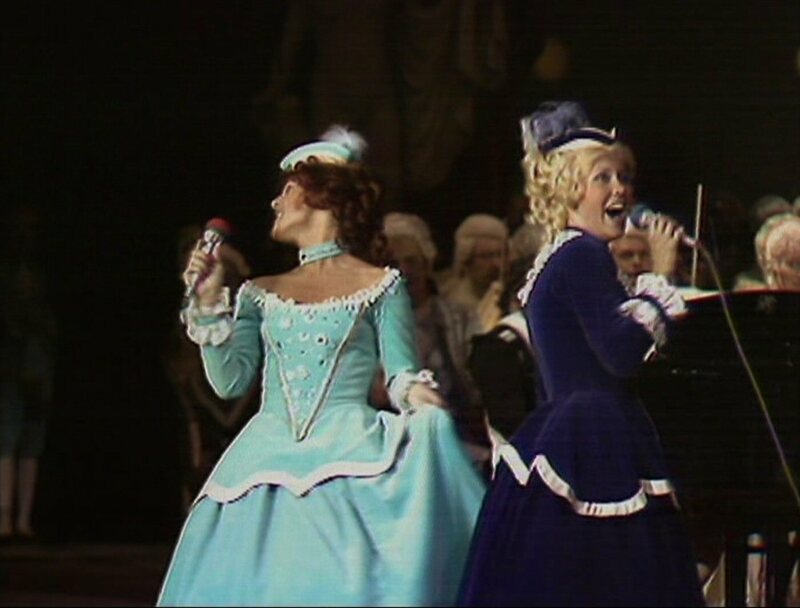 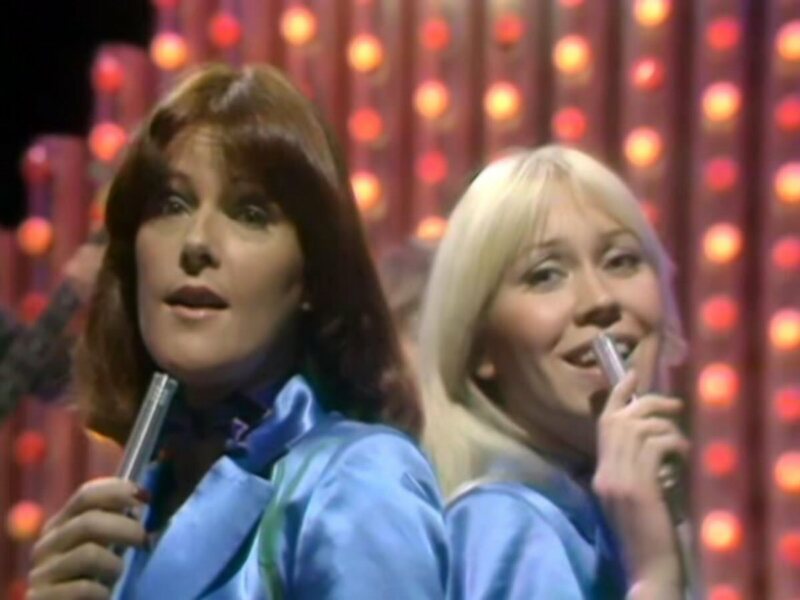 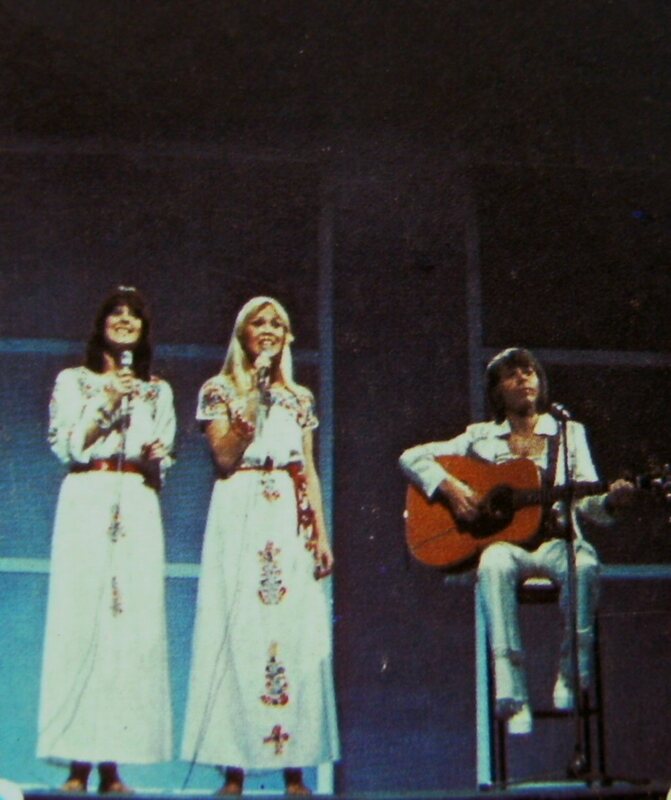 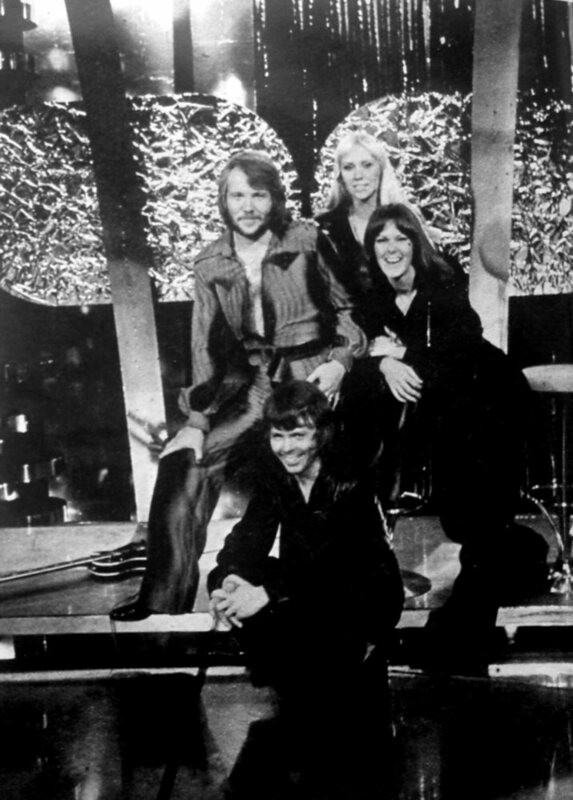 The songs included in this show had been taken from the German show "The best of ABBA" filmed at the beginning of 1976. 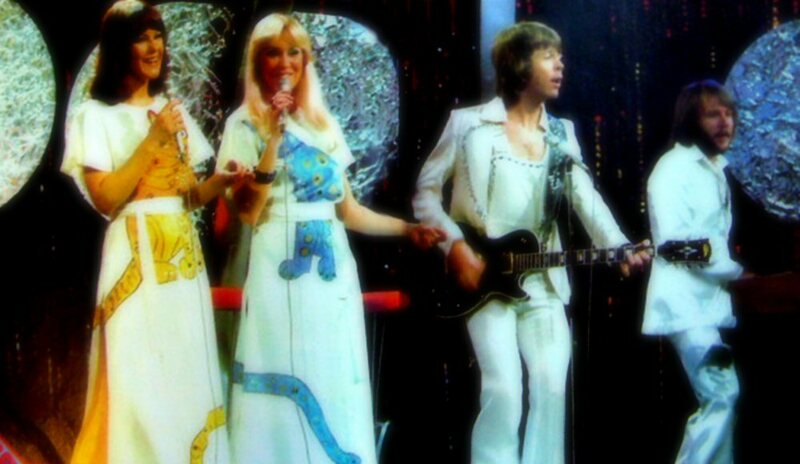 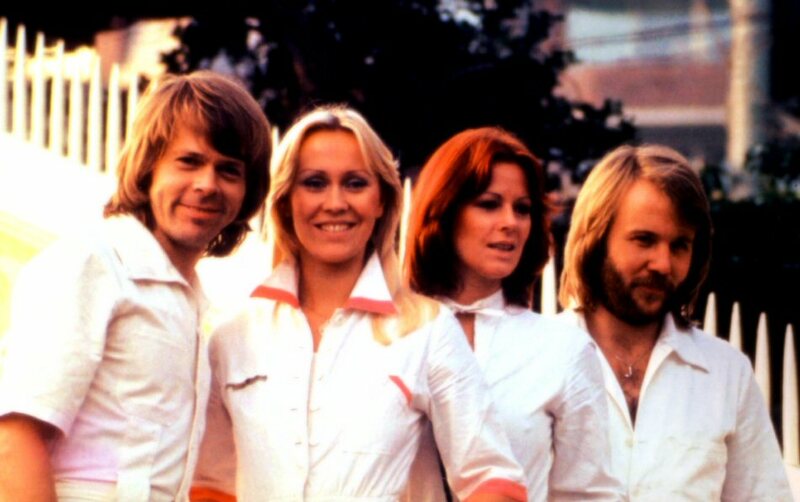 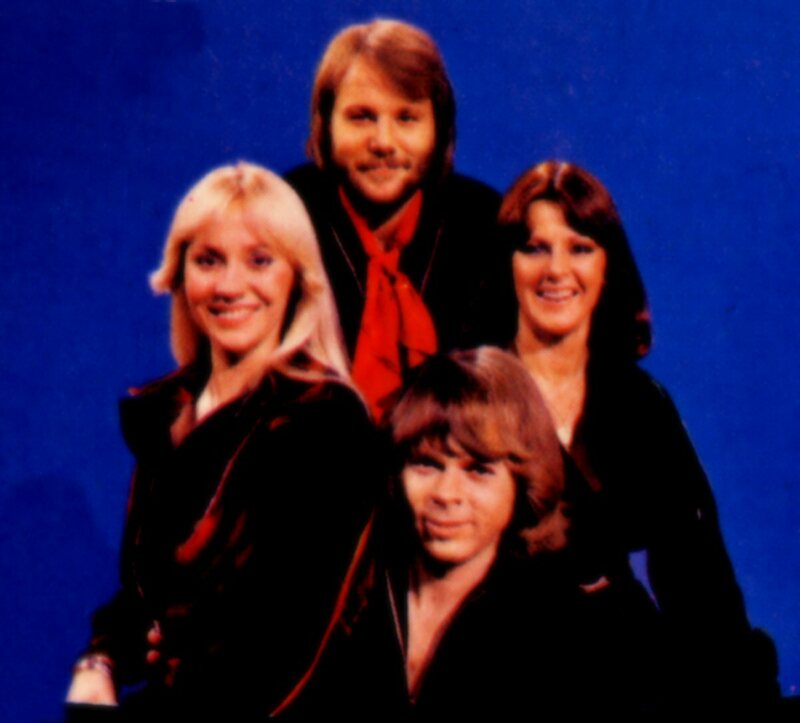 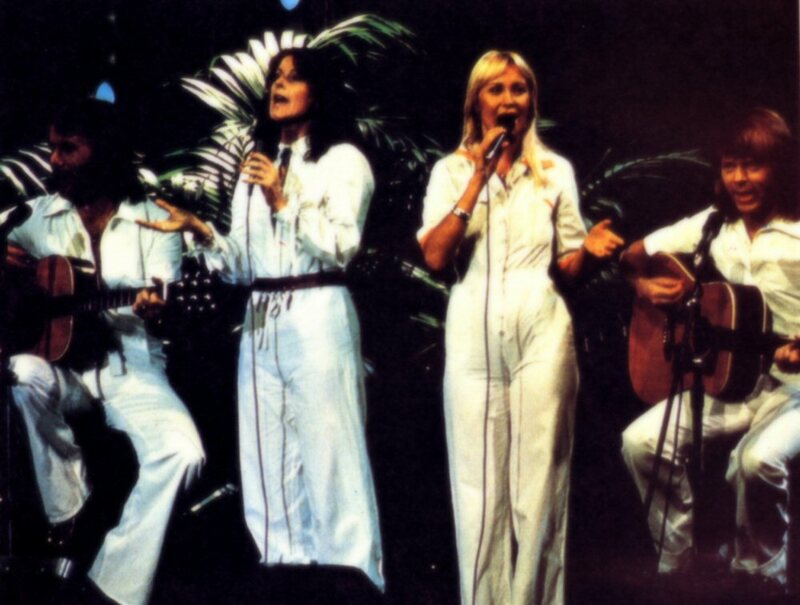 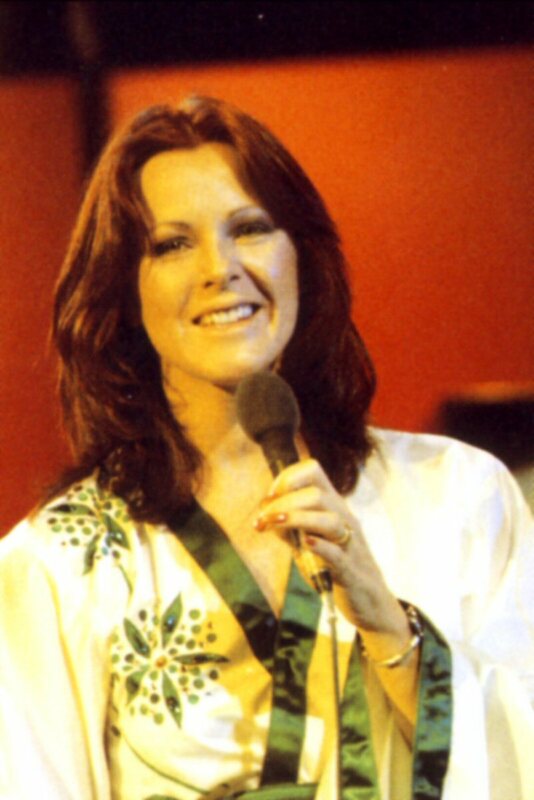 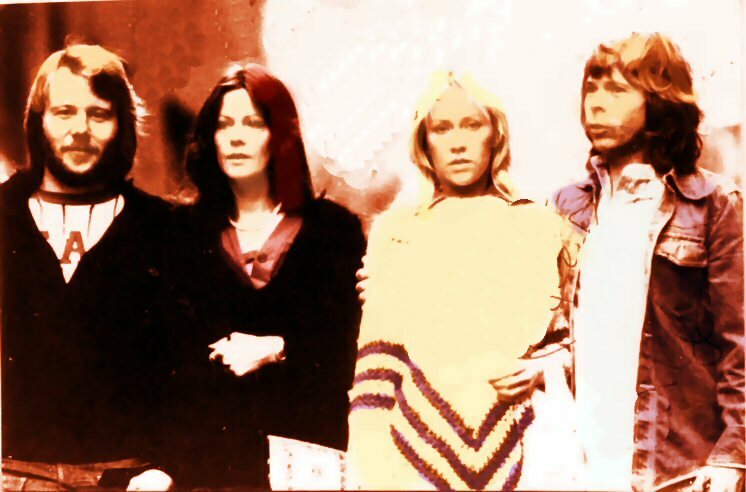 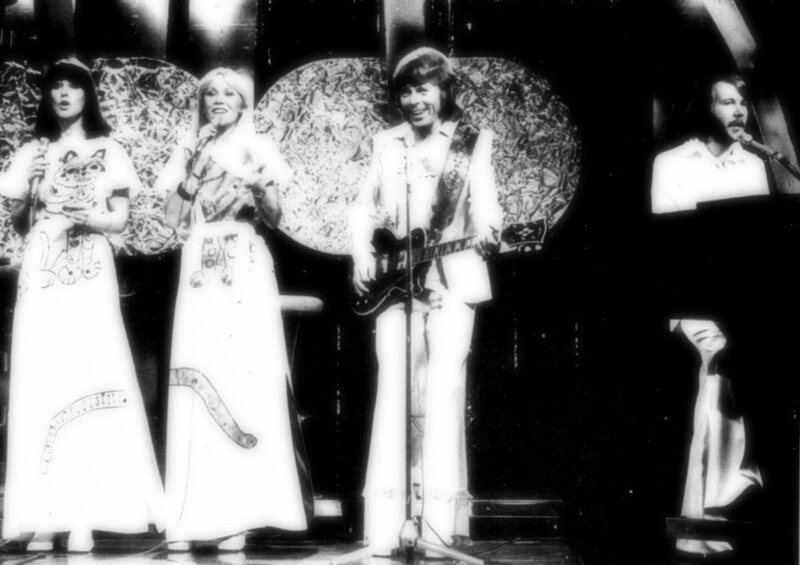 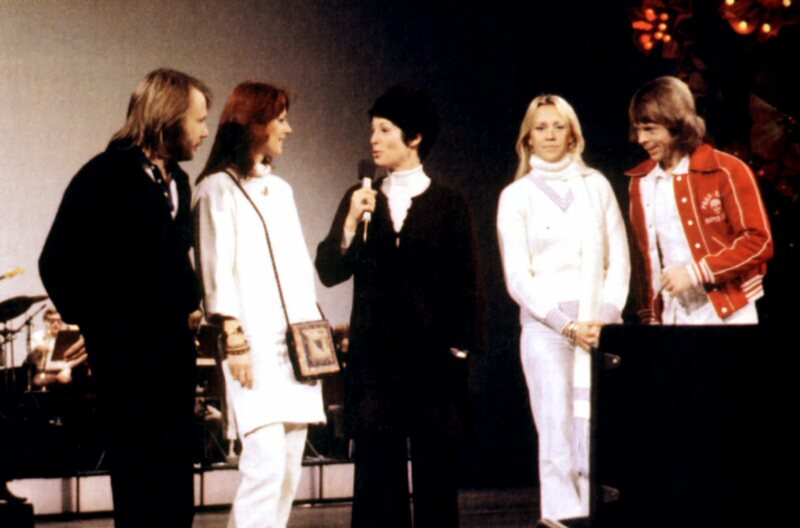 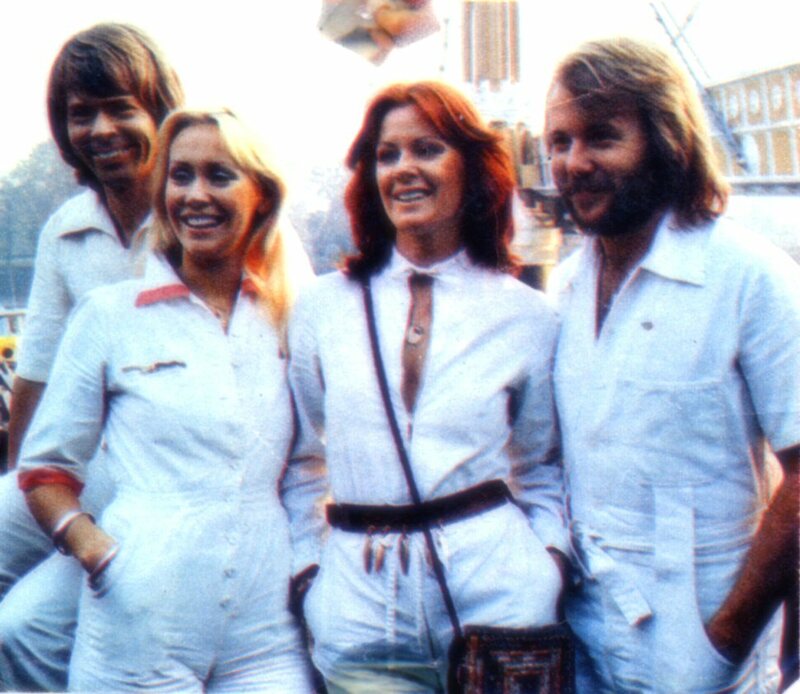 The TV special got the title "ABBA in Sweden" and it was broadcasted in Australia in the autumn 1976. 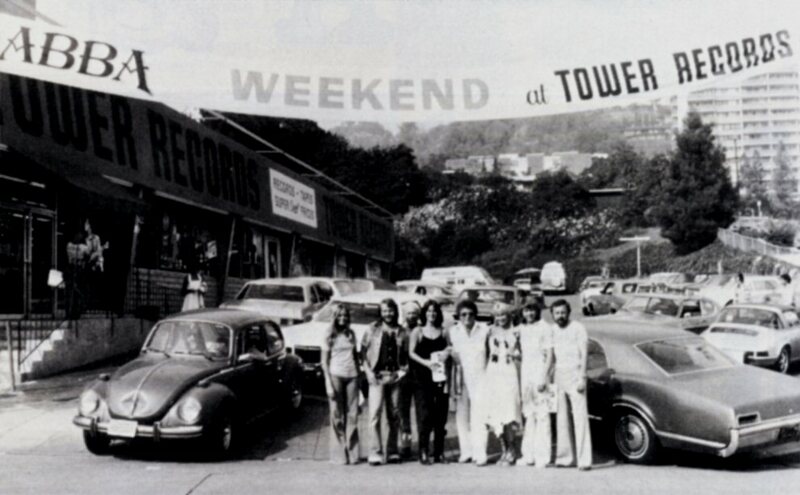 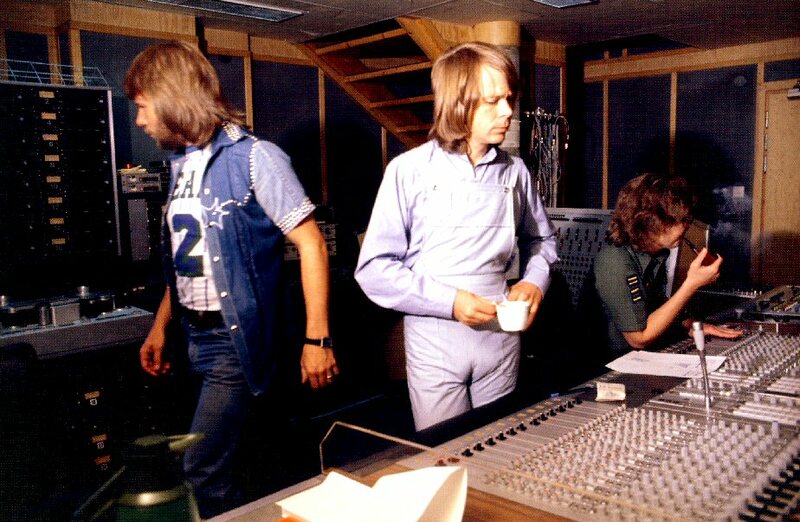 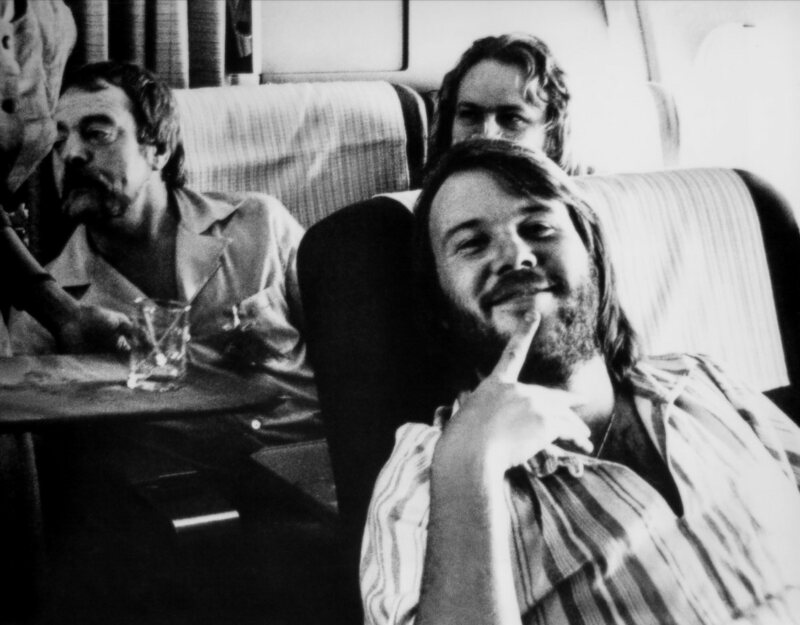 The group worked in the studio until July 20th, 1976 with the tracks for the new album. 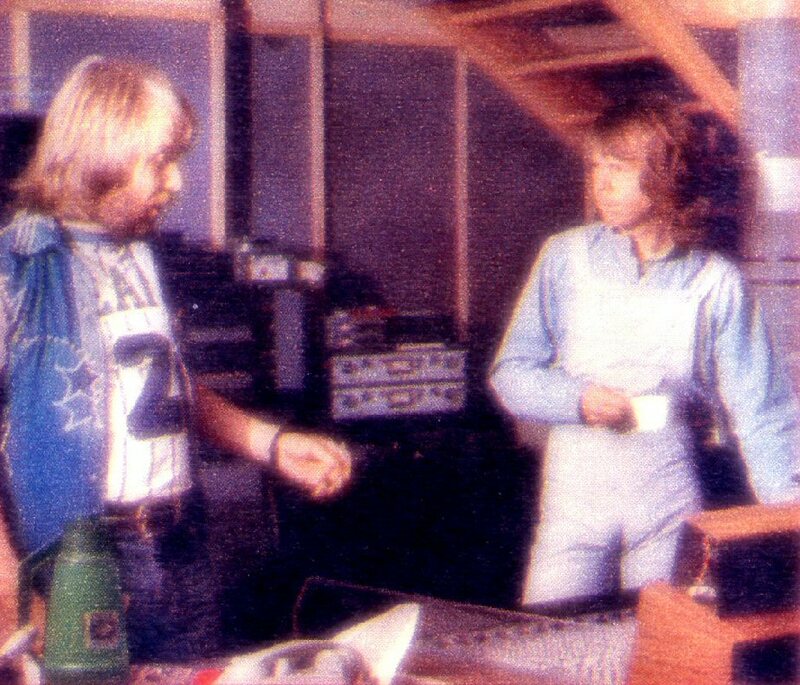 The tracks completed by that time were "Why Did It Have To Be Me", "Money Money Money", "Dum Dum Diddle", "When I Kissed the Teacher" and "Tiger". 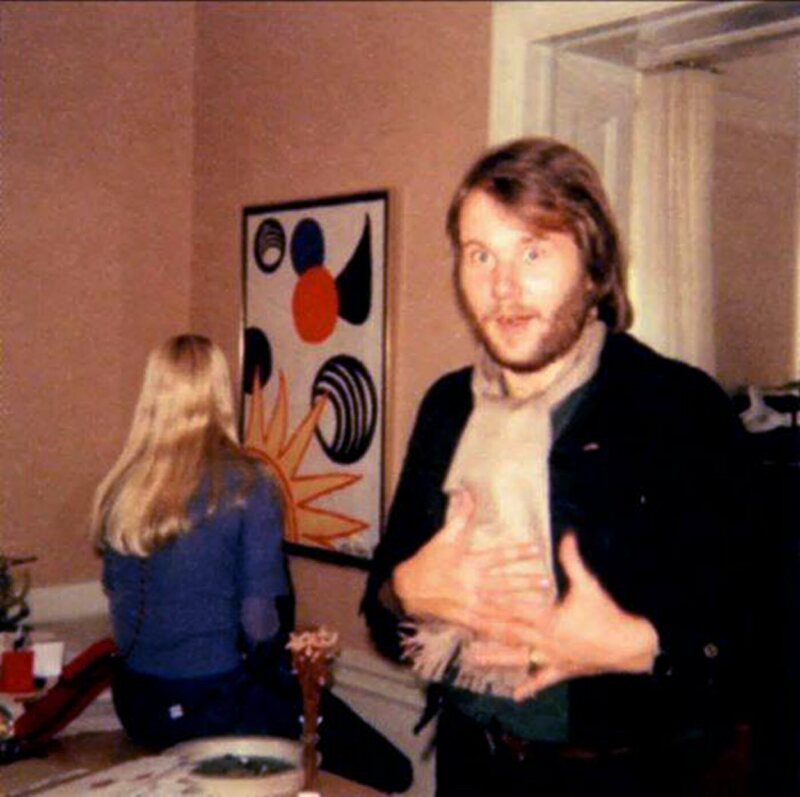 After the holidays. 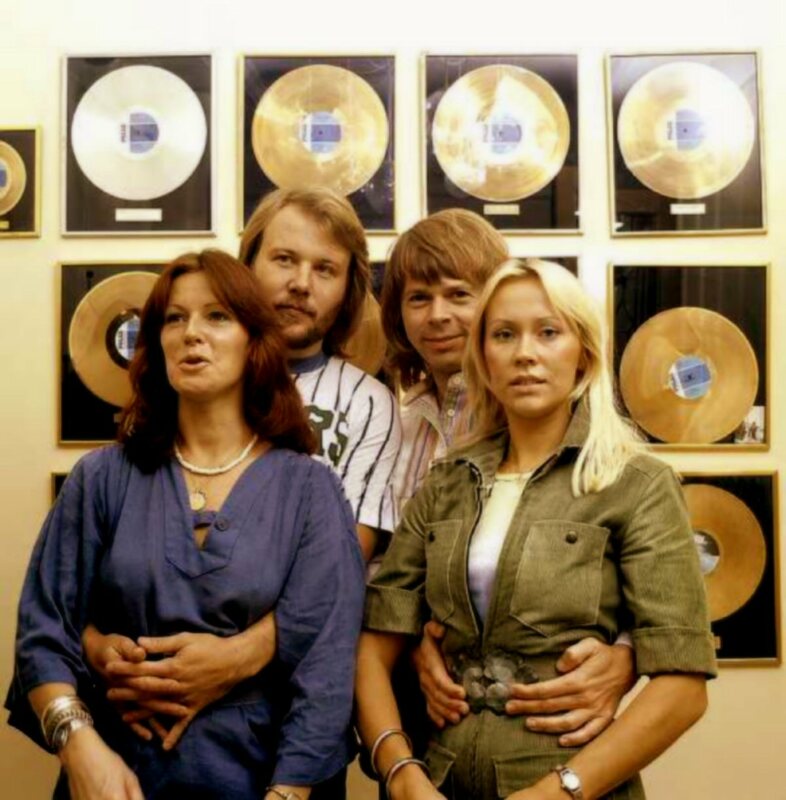 at the end of August, the group went back to the studio and recorded one more track finally entitled "My Love My Life". 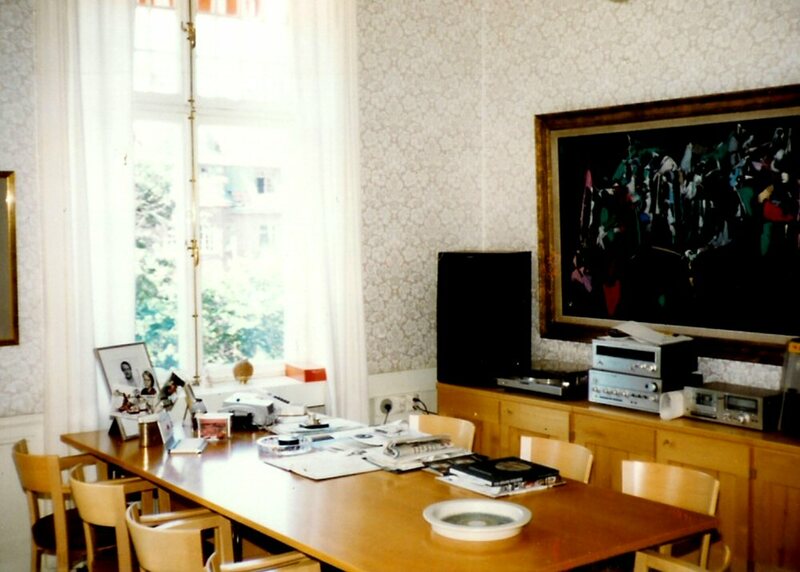 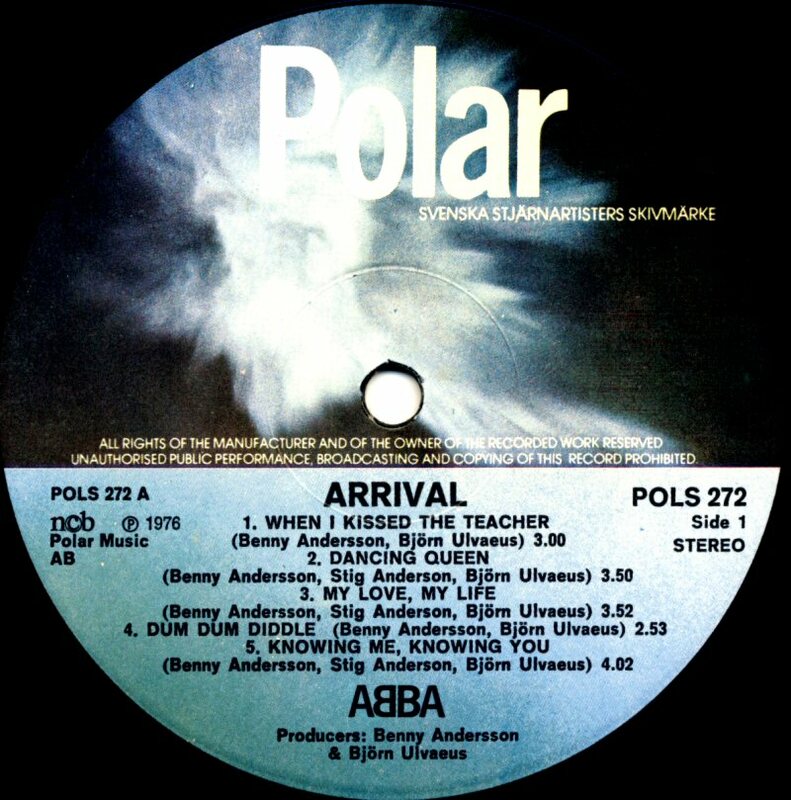 A promotional video for the song "When I Kissed the Teacher" from the upcoming album "Arrival" was filmed at one of the schools in Stockholm. 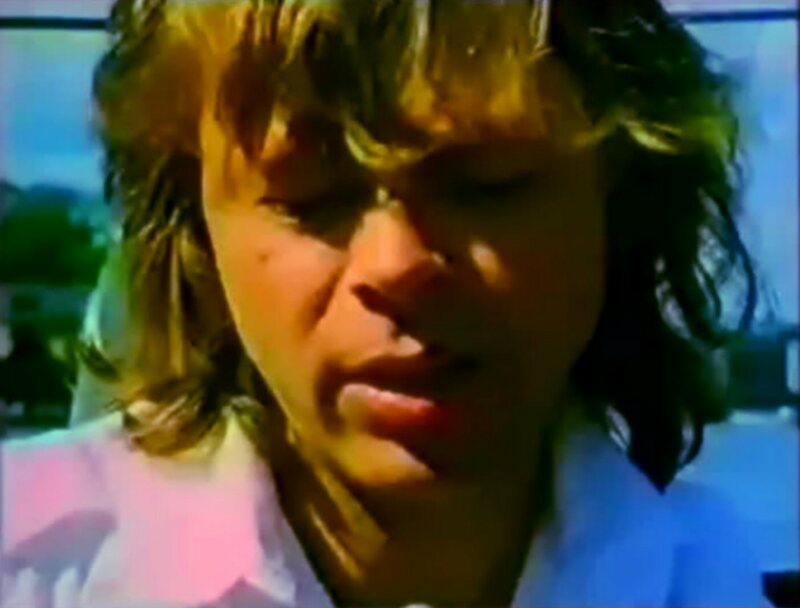 The teacher was played by the Swedish actor Magnus Härenstam. 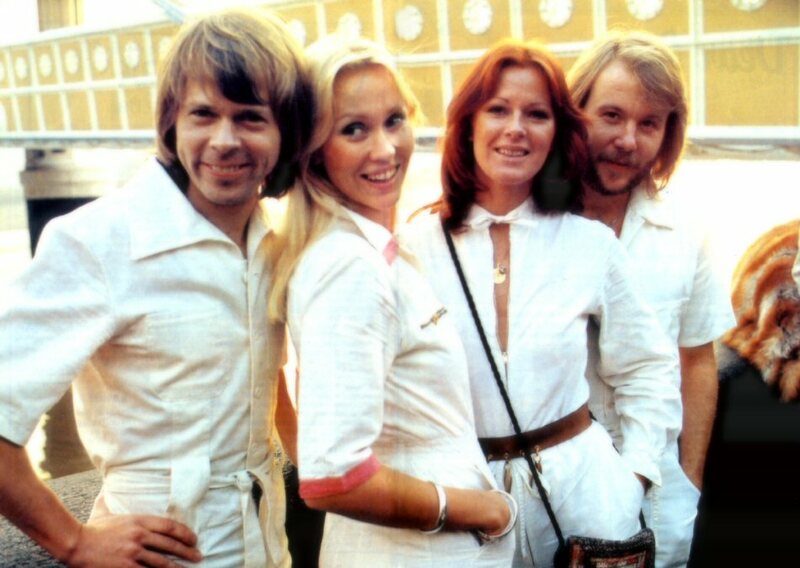 (go.to/ABBA related). 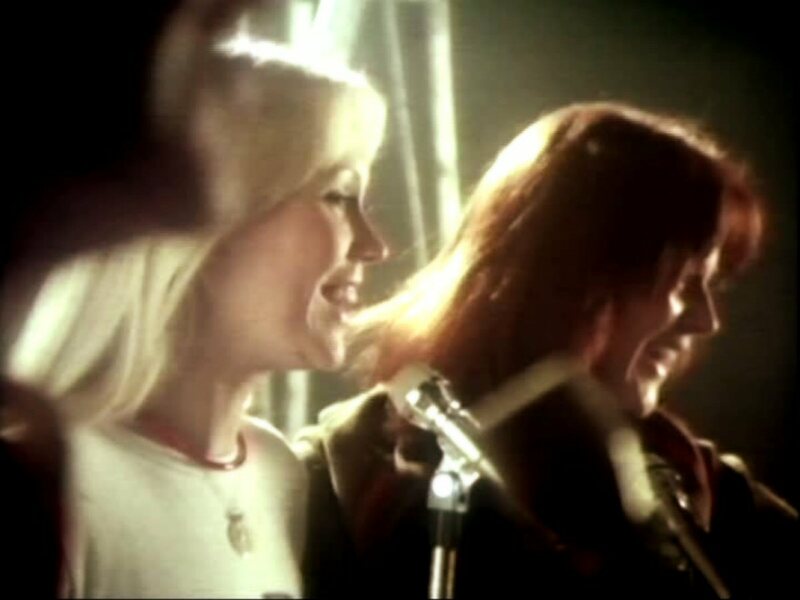 One of the fans was so happy to meet her idols during the filming of the video. 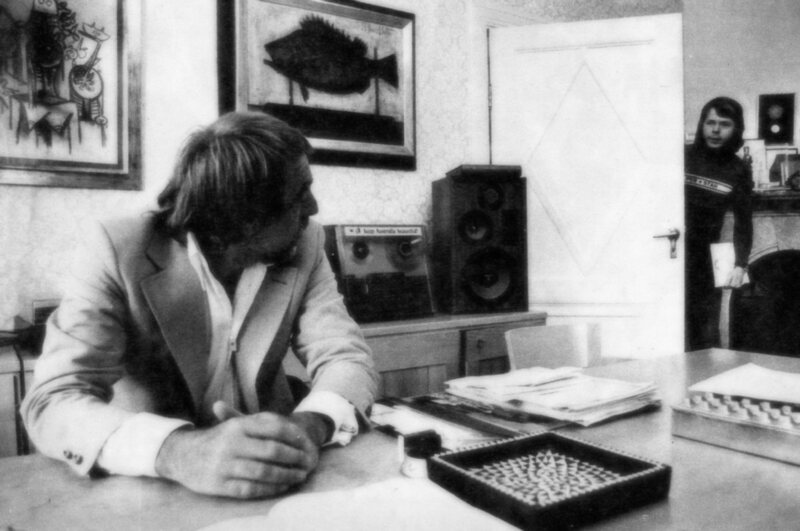 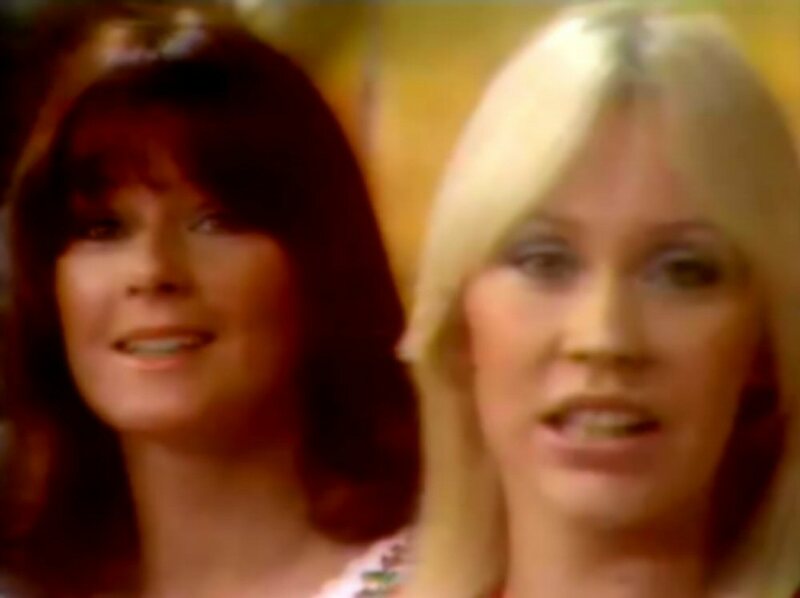 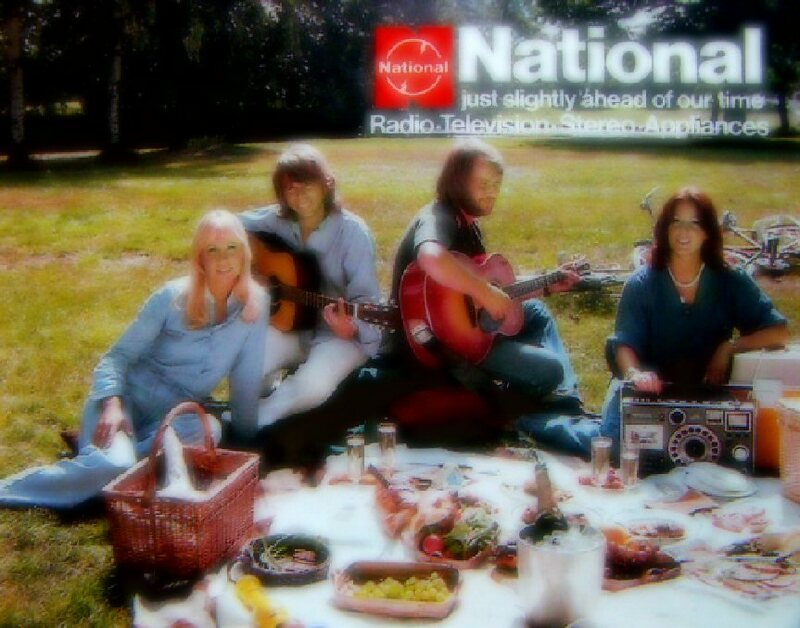 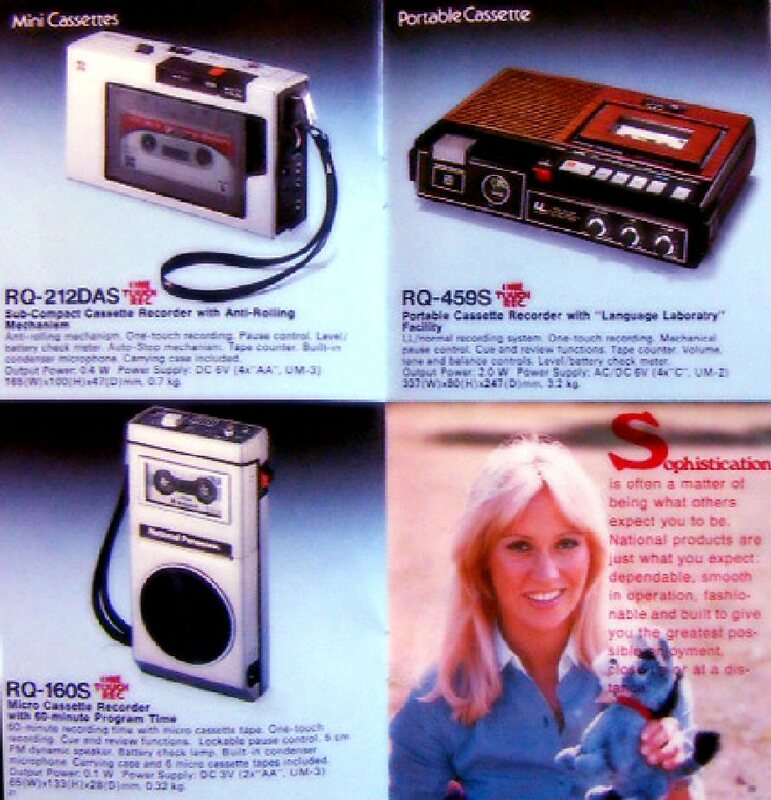 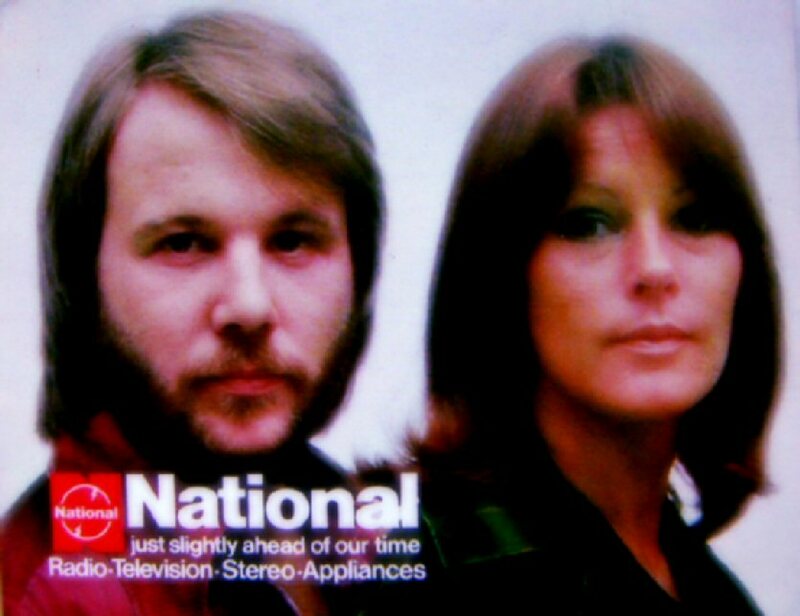 In the late summer of 1976 ABBA made a series of commercials for the National corporation producing hi-fi and other electronic equipment. 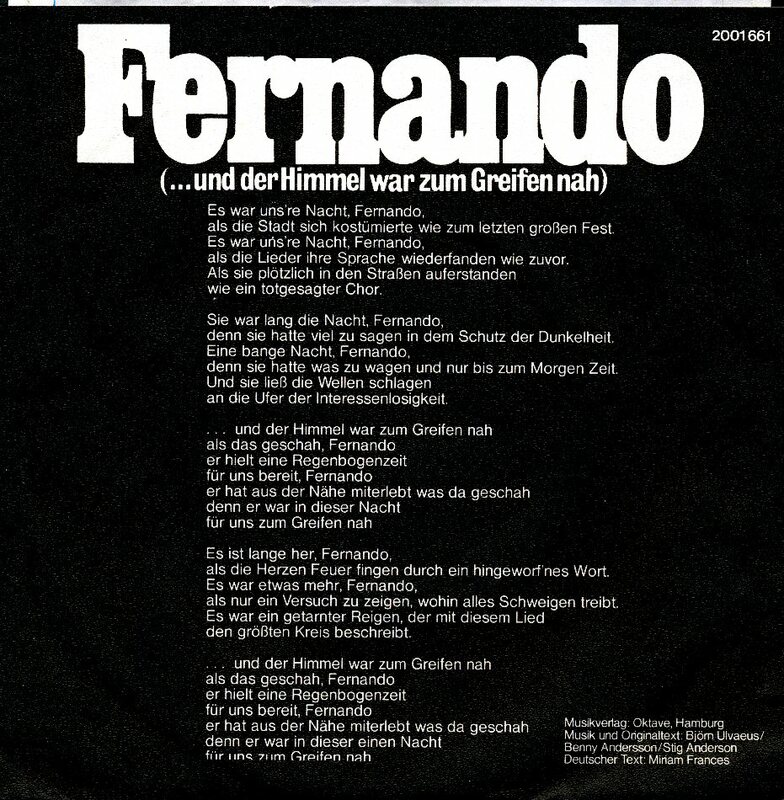 The song "Fernando" was redone and performed with new lyrics. 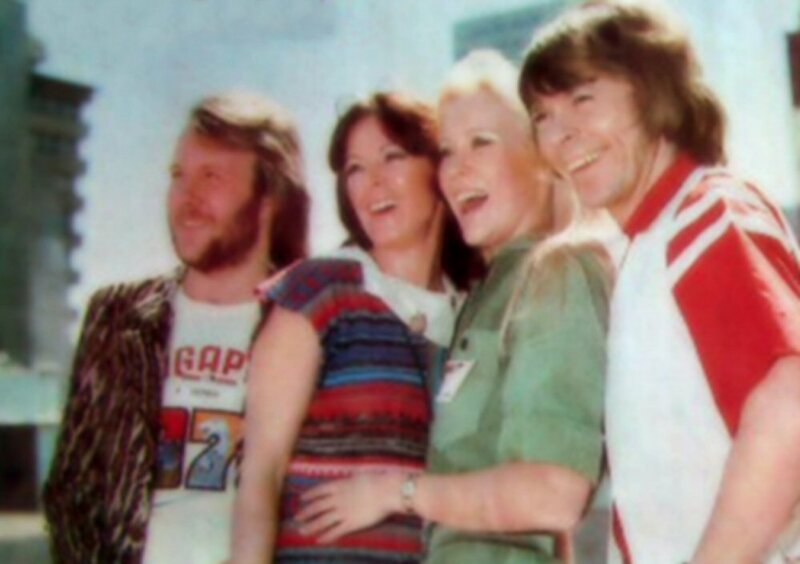 Totally 5 short films were made in Stockholm with the ABBA members singing and talking about National and their products. 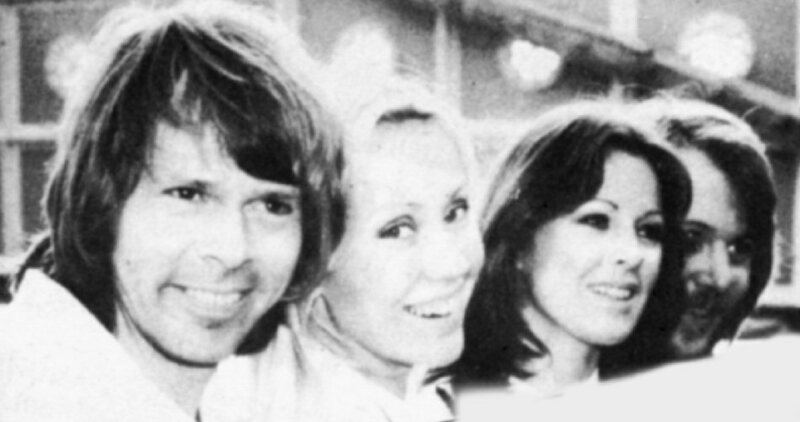 Agnetha, Björn, Frida and Benny with their children and Stikkan with his family spent a lot of time on their island Viggsö in the Stockholm archipelago. 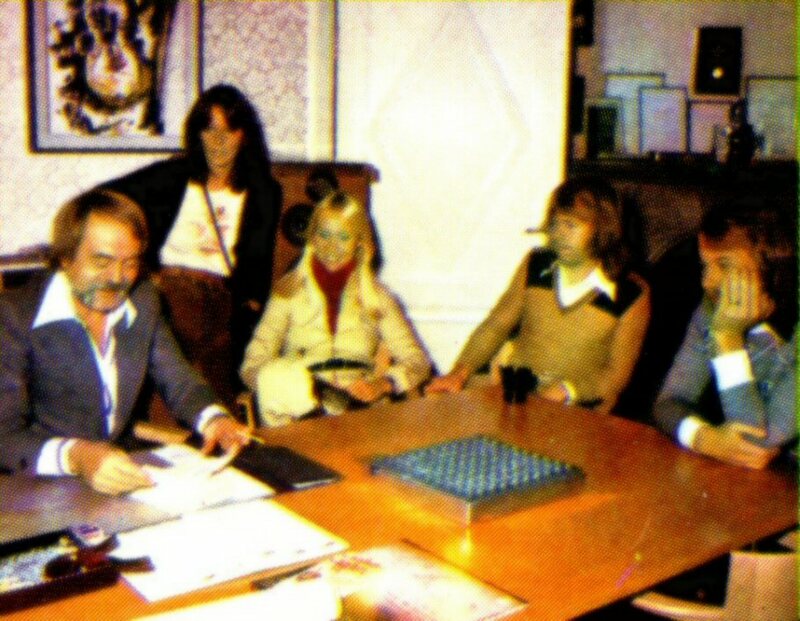 Some occassional visits were paid by the press and TV and that's why there are quite a lot of pictures available from this period. 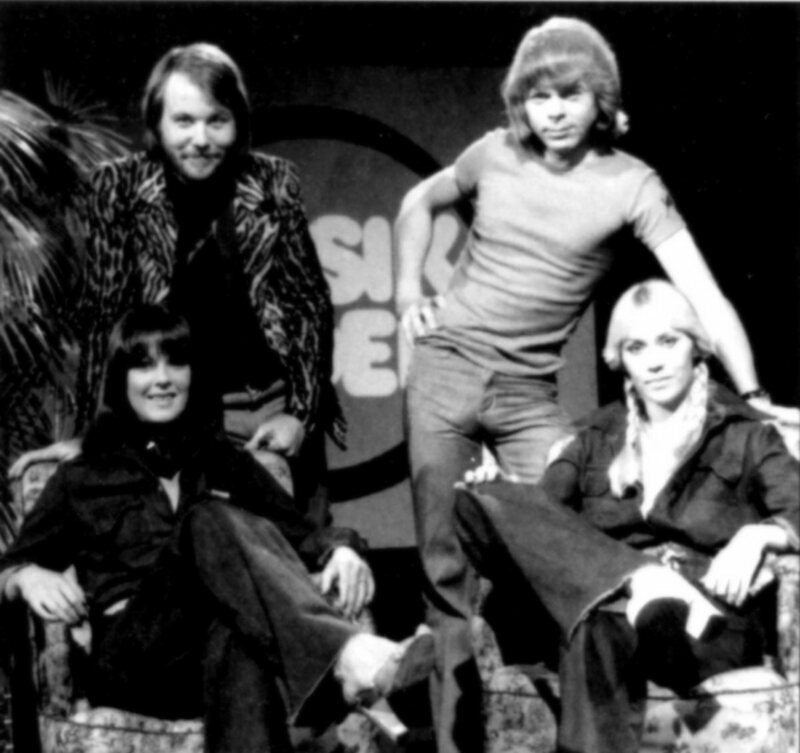 Swedish TV was preparing during the summer 1976 the first big special about the group which would be aired in Sweden in the following autumn (go.to/Arrival Special). 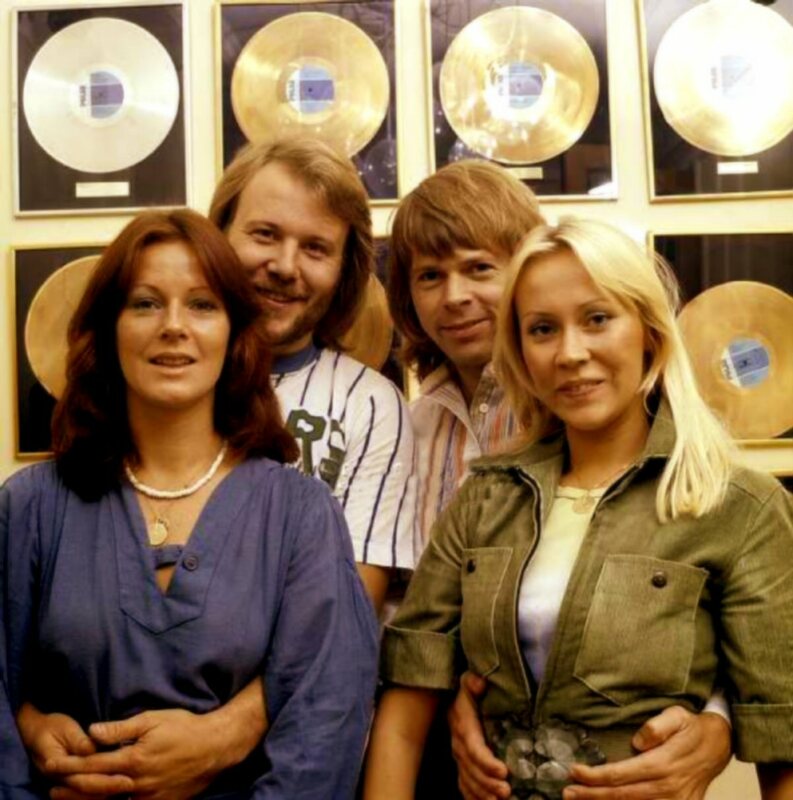 The second pressing of the LP "The best of ABBA" in West Germany was updated with ABBA's latest chart hit "Fernando". 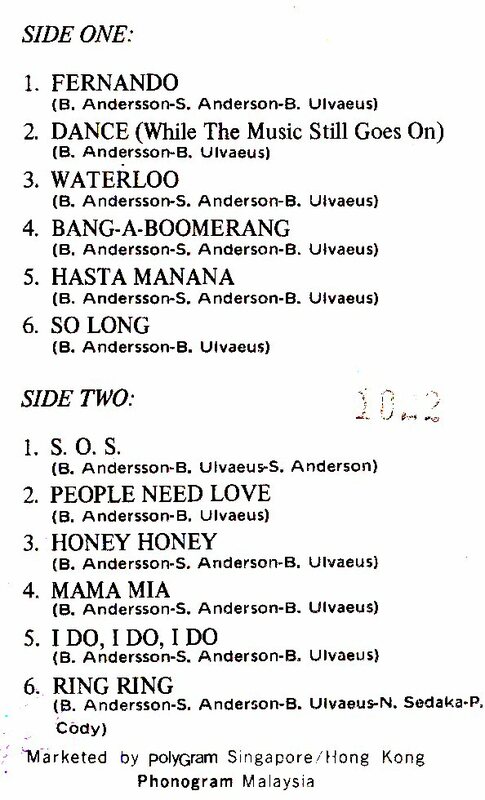 The track listing was different to the first edition of the album. 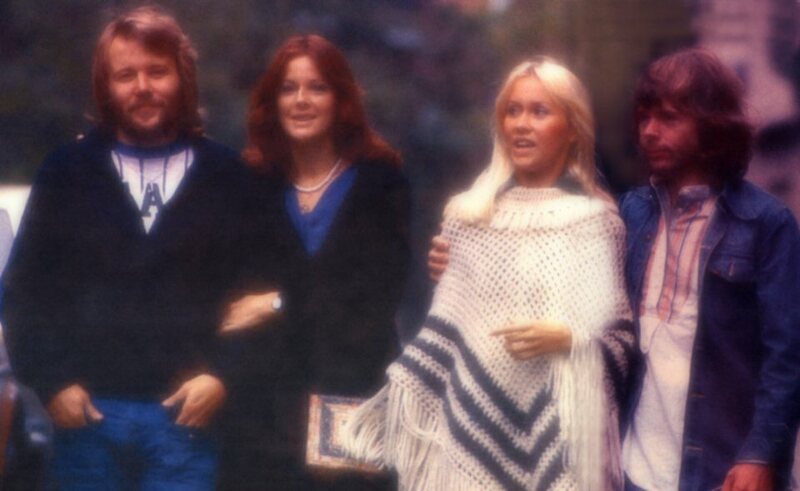 In Holland "The best of ABBA" including Fernando was released in May 1976. 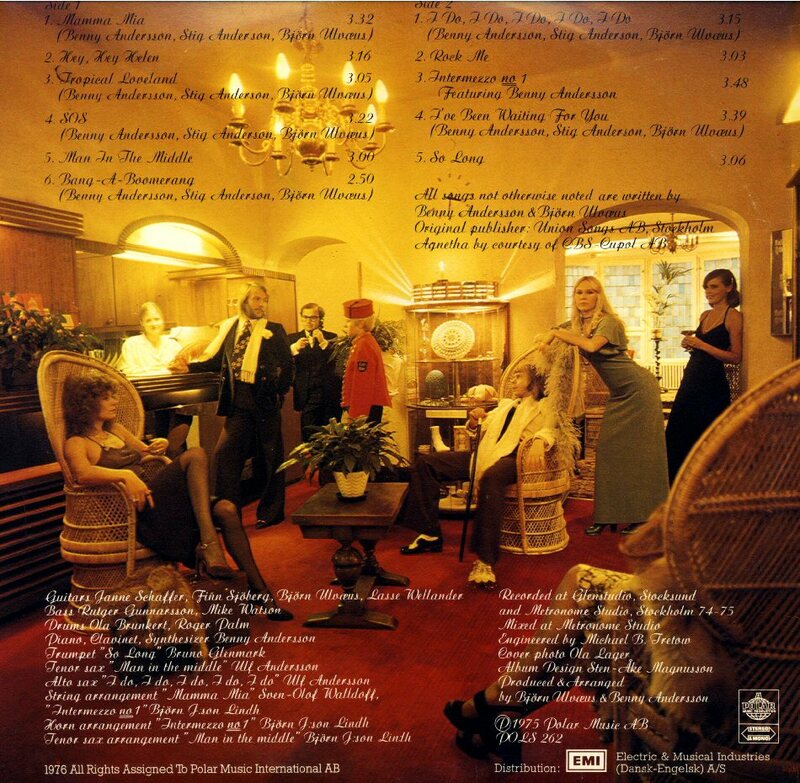 Record company "ex libris" released the compilation in Austria. 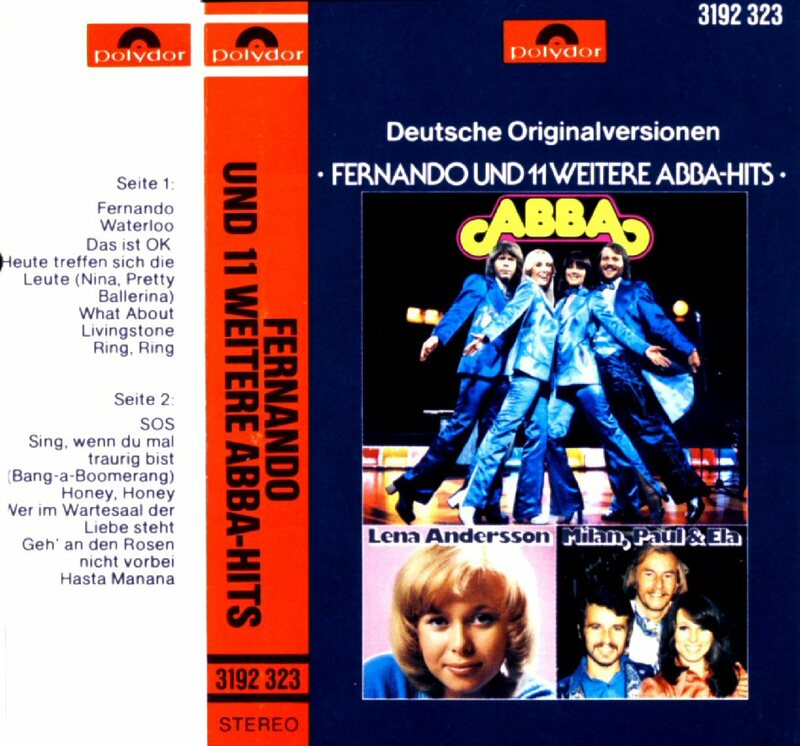 The compilation album + MC entitled "Fernando und 11 weitere ABBA-Hits" was released in West Germany in 1976. 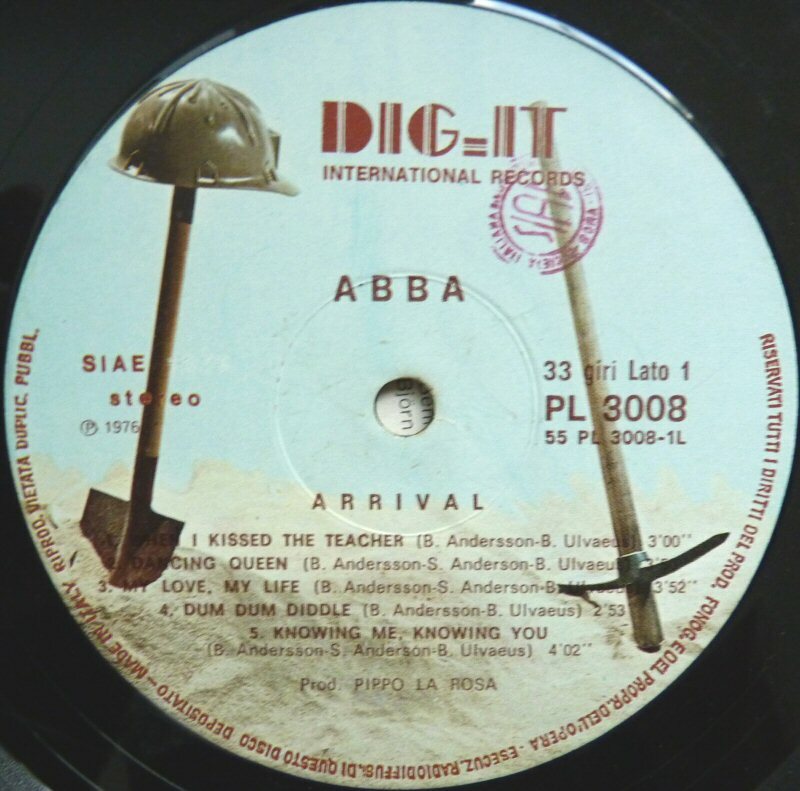 It is probably one of the rarest and most interesting compilation releases as it features many hard-to-find ABBA tracks performed both by the group and other artists. 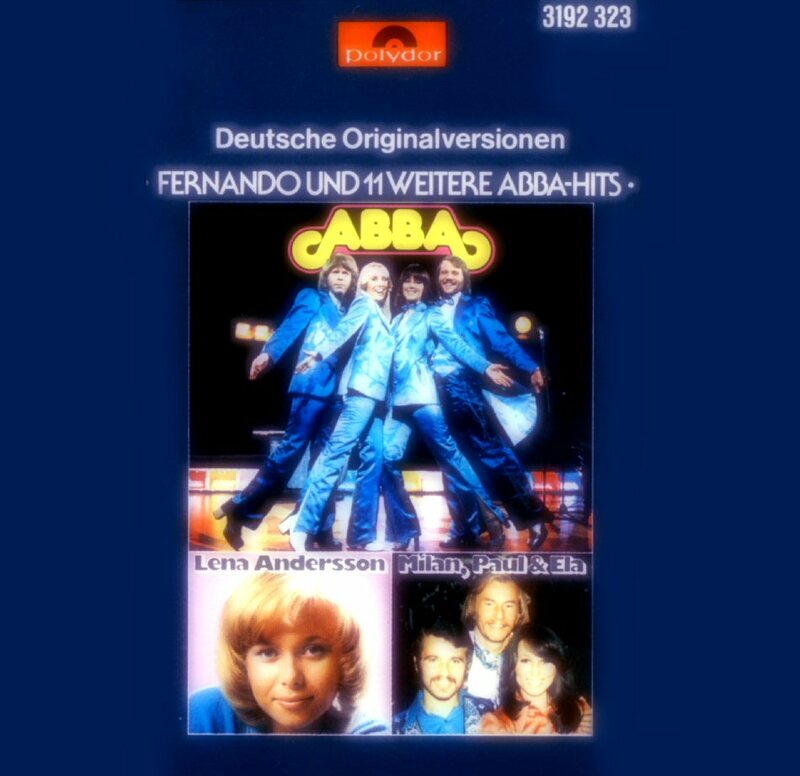 All songs are in German. 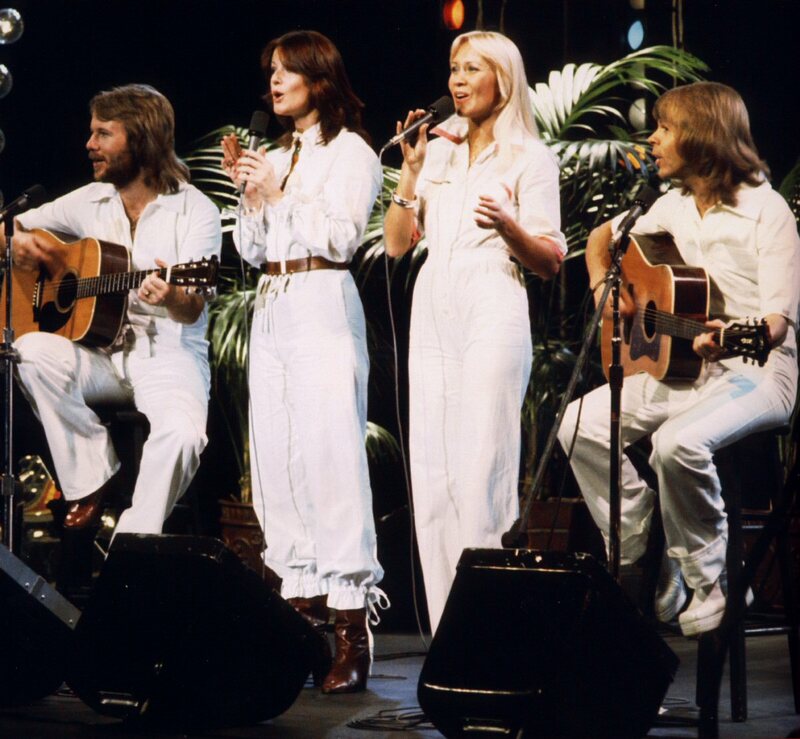 ABBA performed: Waterloo, Ring Ring and Wer in Wartesaal der Liebe steht (Another Town Another Train). 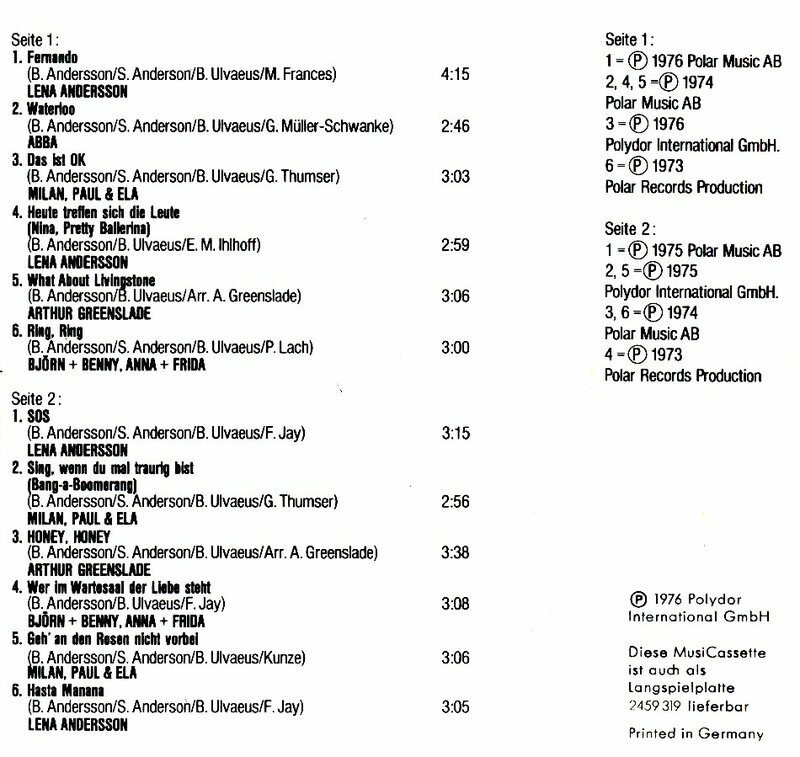 The Polar singer Lena Andersson appeared on the album with her versions of Fernando, Heute treffen sich die Leute (Nina, Pretty Ballerina), SOS and Hasta Mañana. 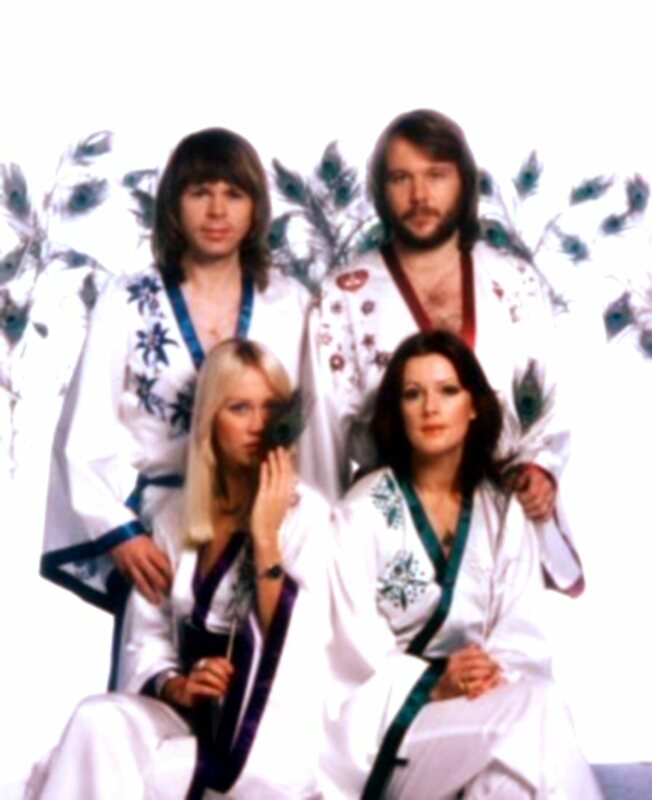 Another artists who played and sang ABBA songs on this album were Arthur Greenslade and the group "Milan, Paul & Ela". 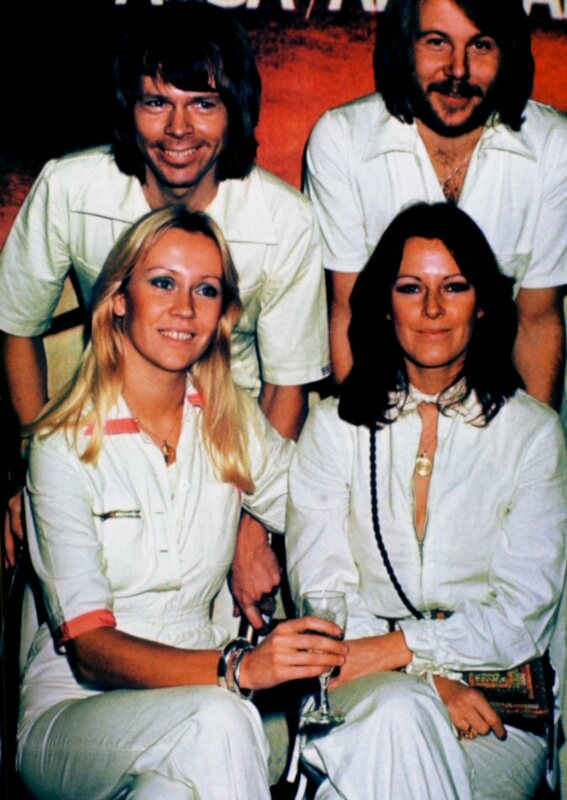 During the period 1975-1977 ABBA was the biggest pop act in Australia and they became bigger and bigger even in Asia. 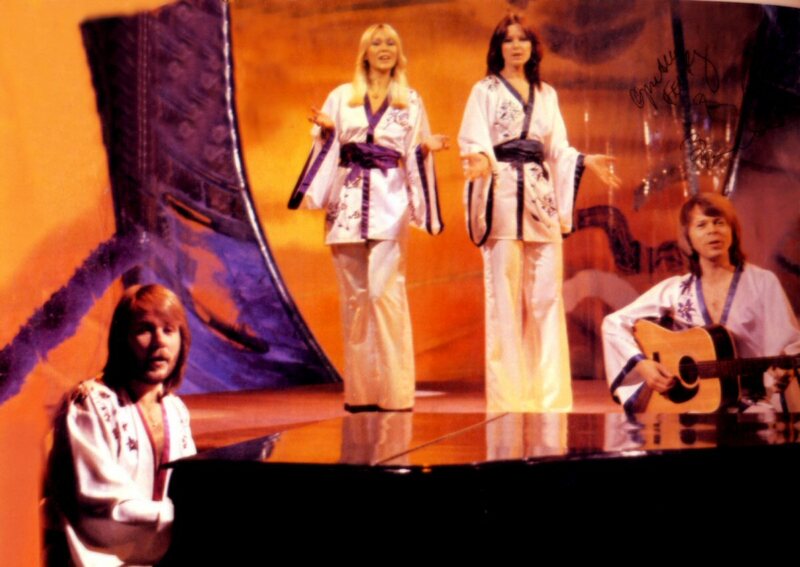 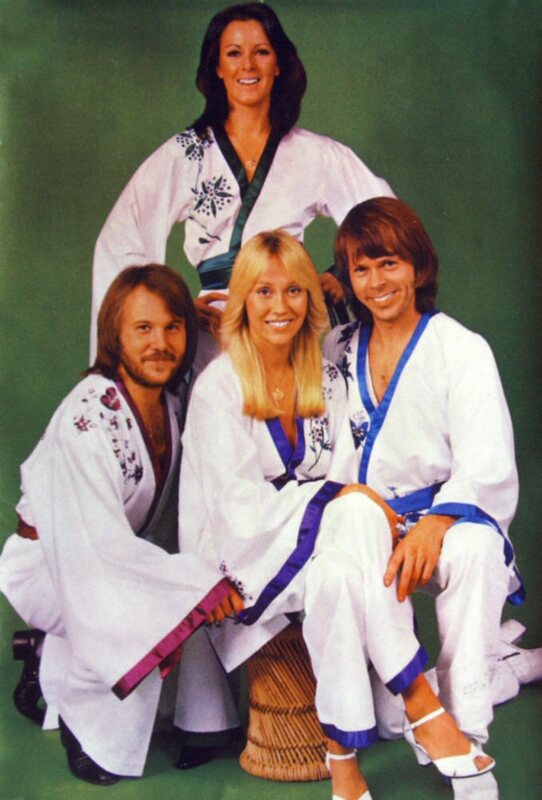 ABBA did no live performances in Asia until 1980 when they toured in Japan. 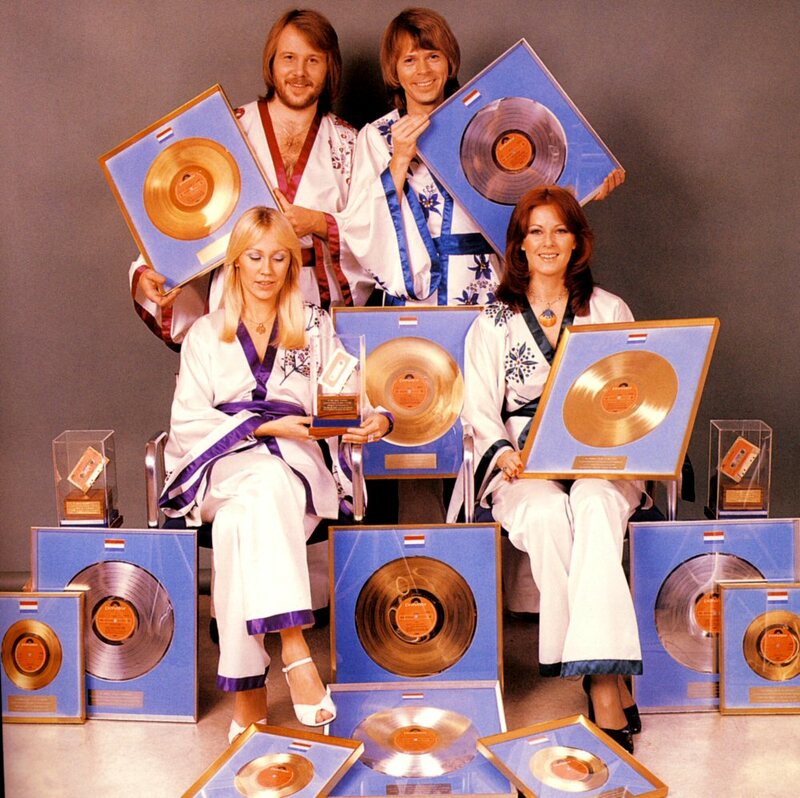 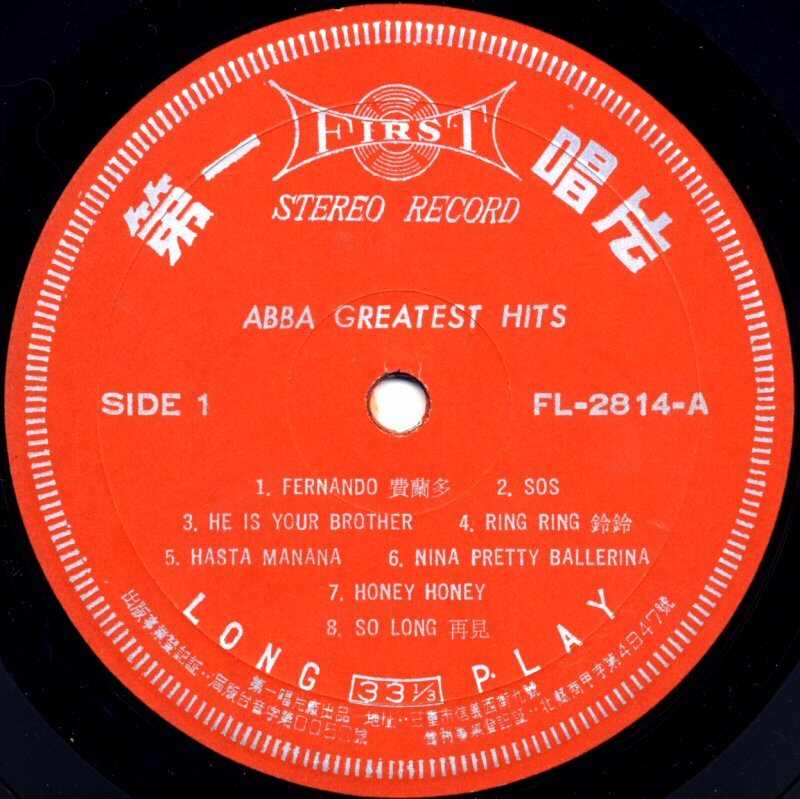 ABBA's studio albums and compilations were released in different territories in Asia and one of the most interesting compilation albums was "Greatest Hits including Fernando" which was issued in two versions by Polydor in Malaysia, Hong Kong and Singapore. 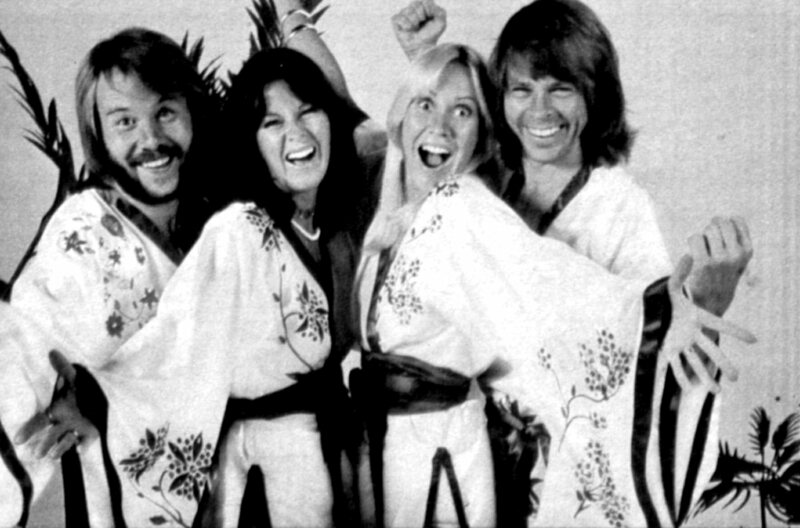 The layout was done in a nice Asian character style. 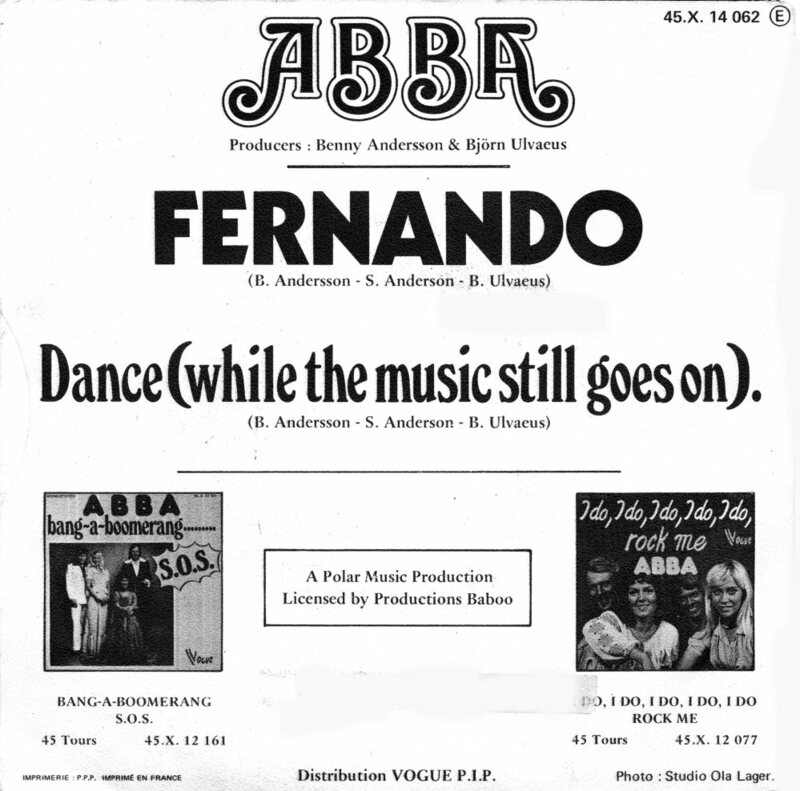 The first version was released in 1976 after the huge success of "Fernando" all over the world. 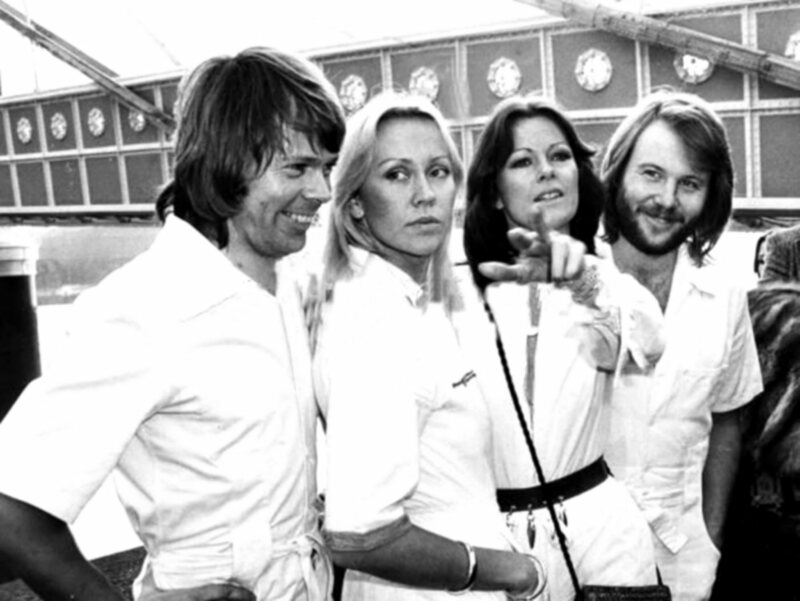 The compilation contained 12 tracks released on ABBA's three first albums (i.e. 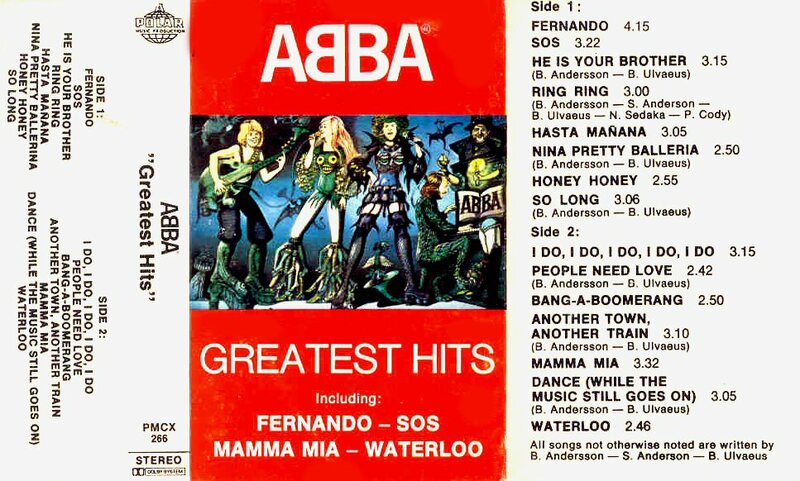 Ring Ring, Waterloo & ABBA). 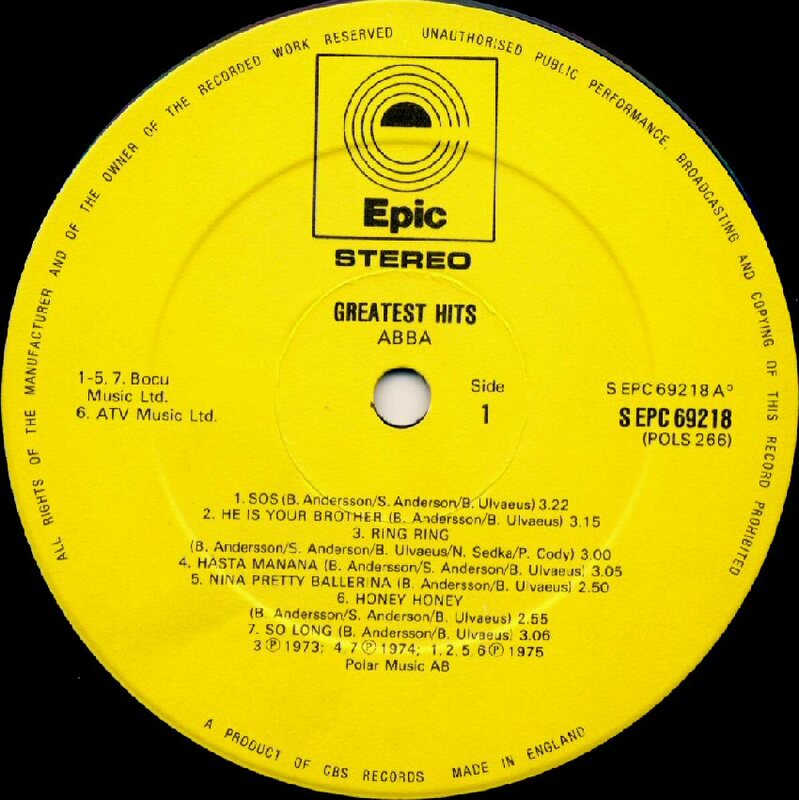 The second release of the Malaysian "Greatest Hits incl. 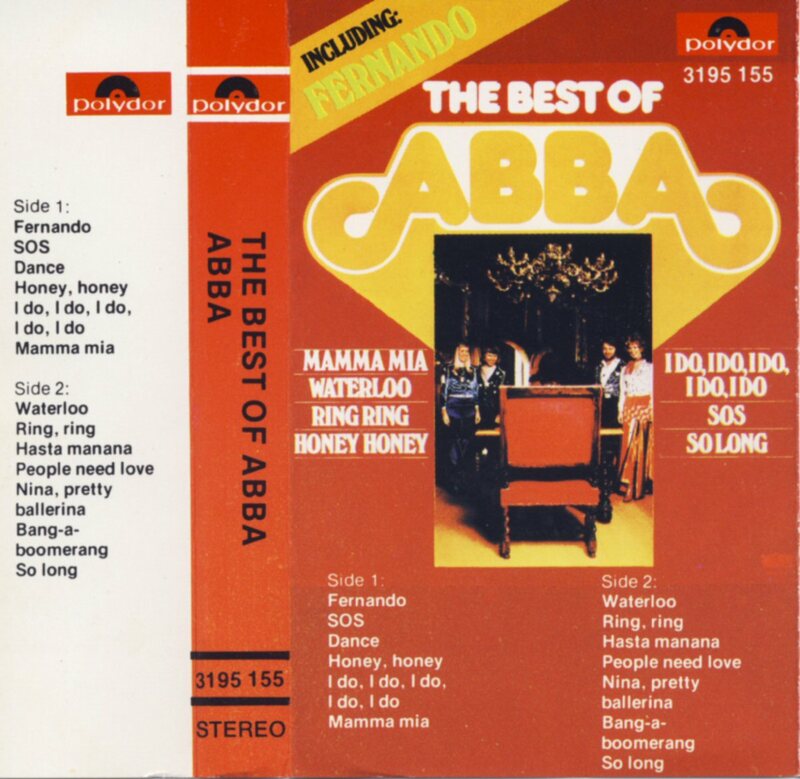 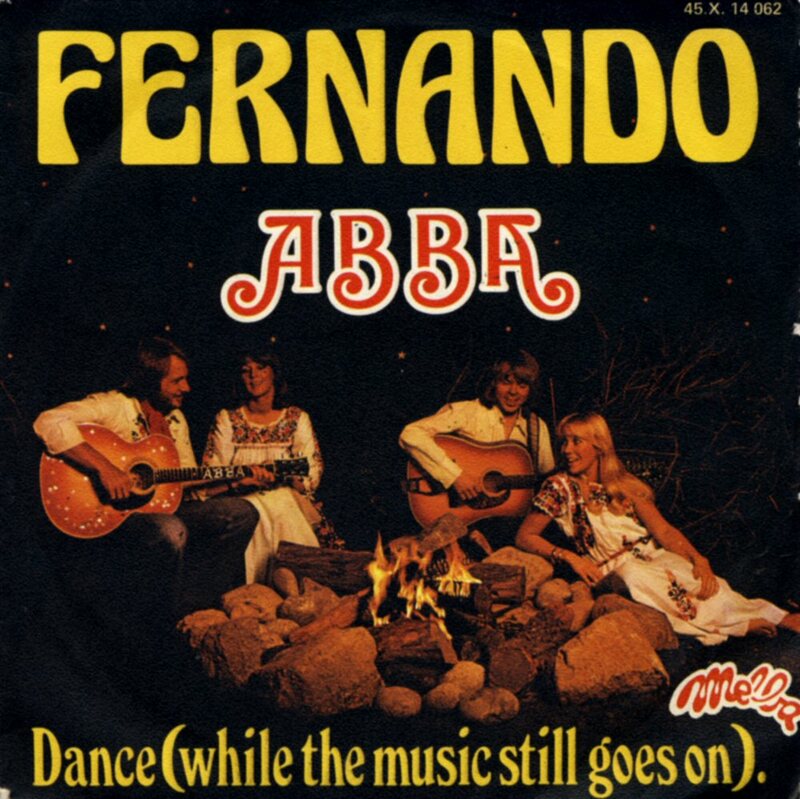 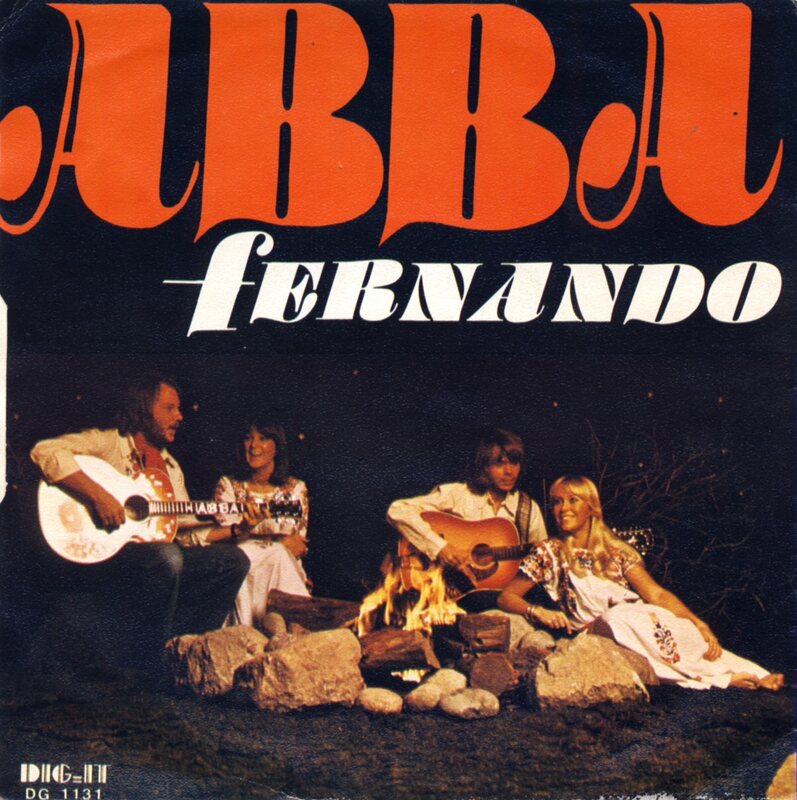 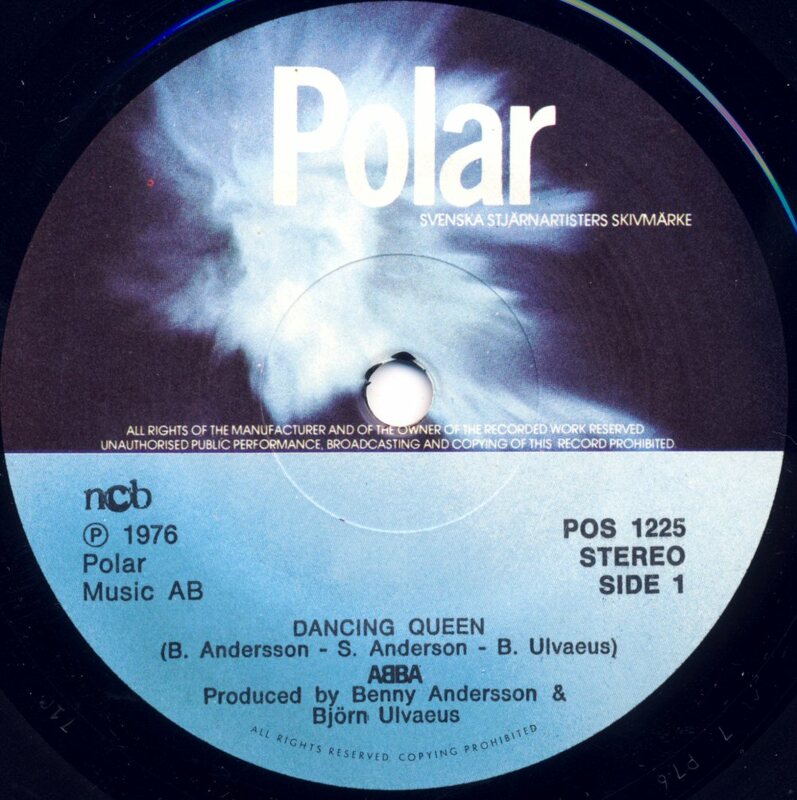 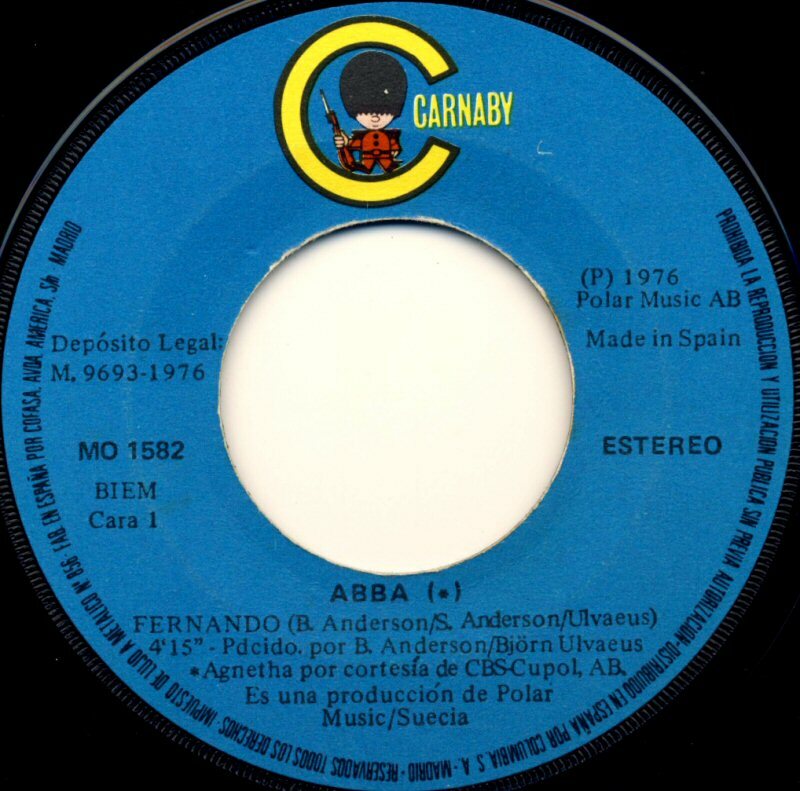 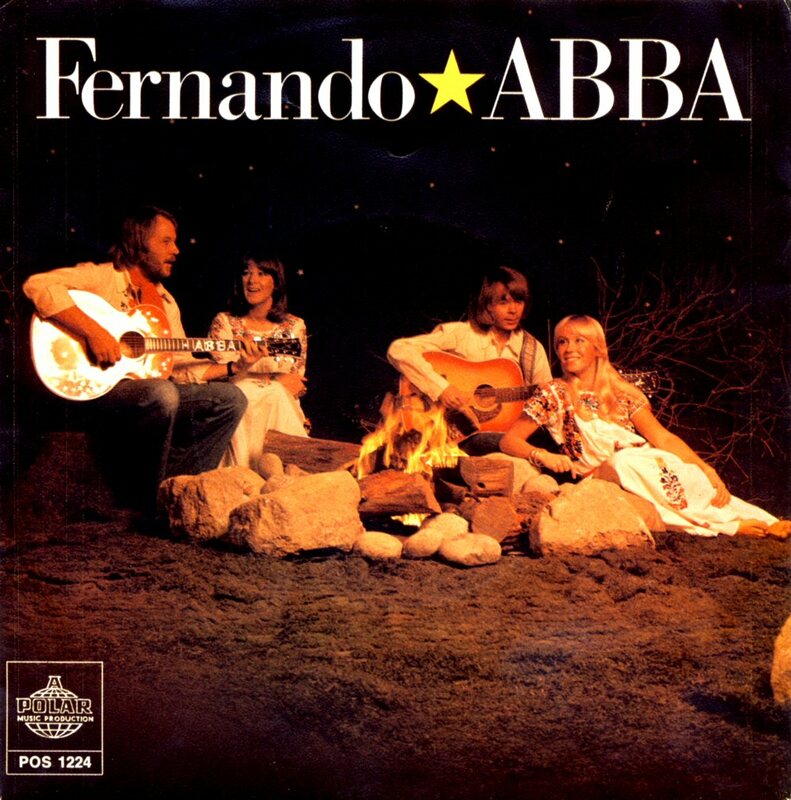 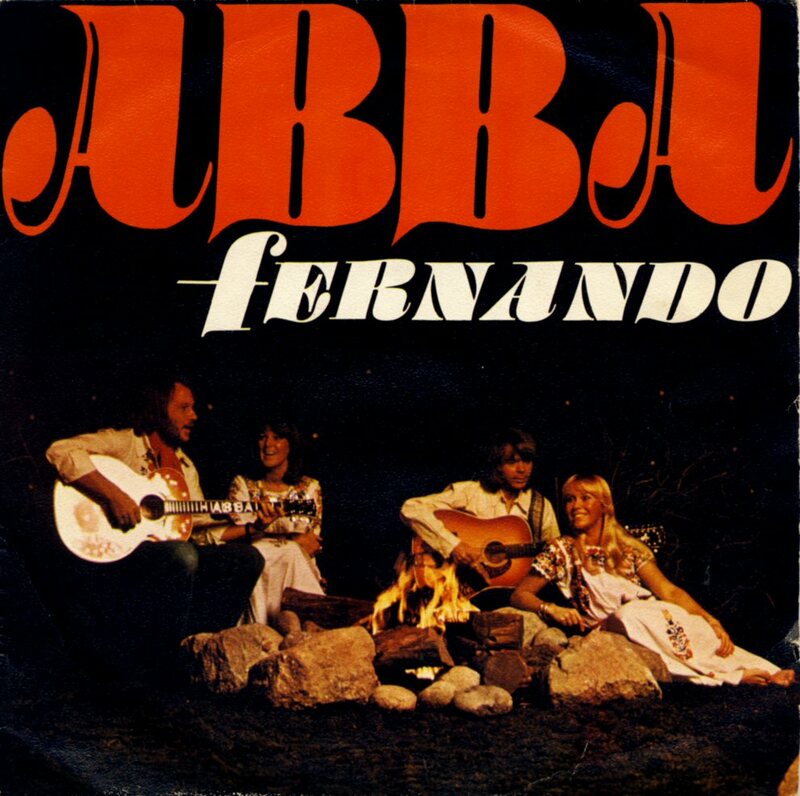 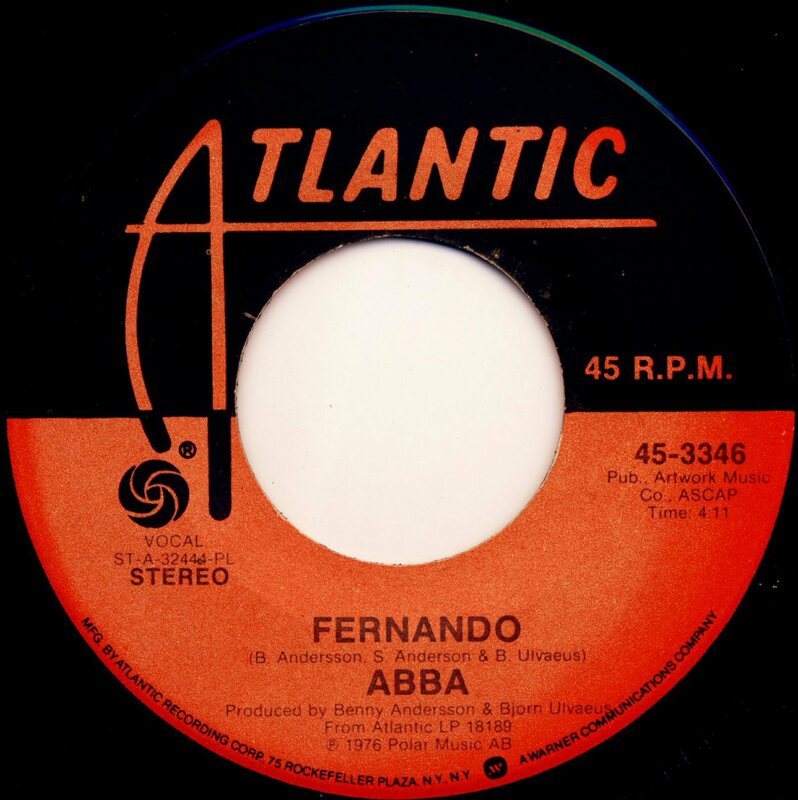 Fernando" took place in 1977 and it featured completely different track listing (go.to/ABBA 1977). 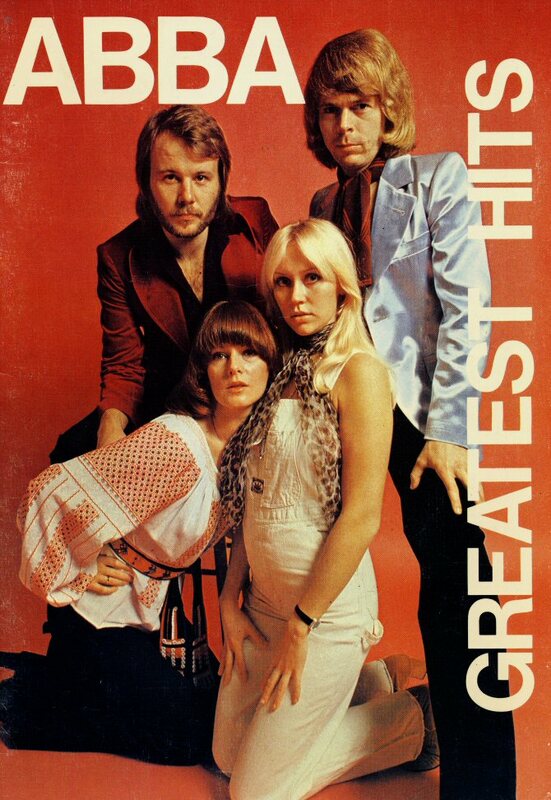 The album "Greatest Hits" was released in USA on August 24, 1976. 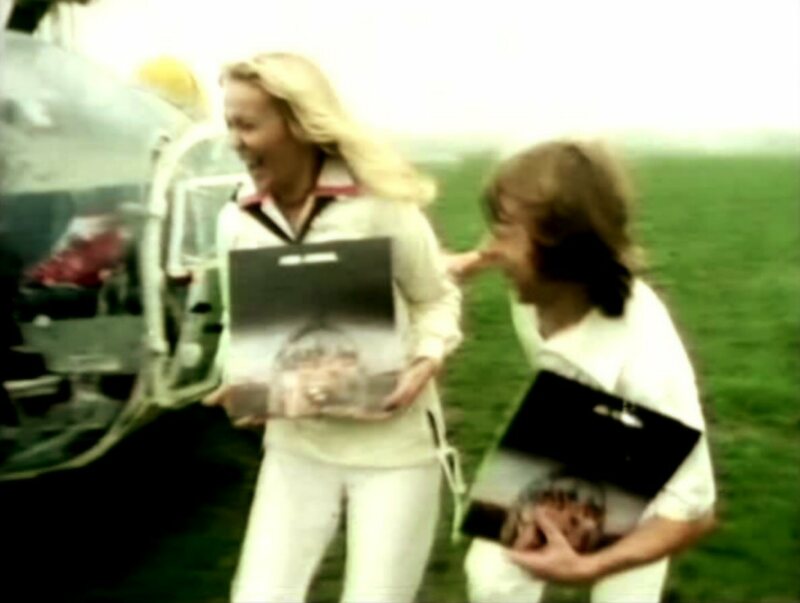 The album stayed for 63 weeks in the Top 200 reaching #48 in November 76. 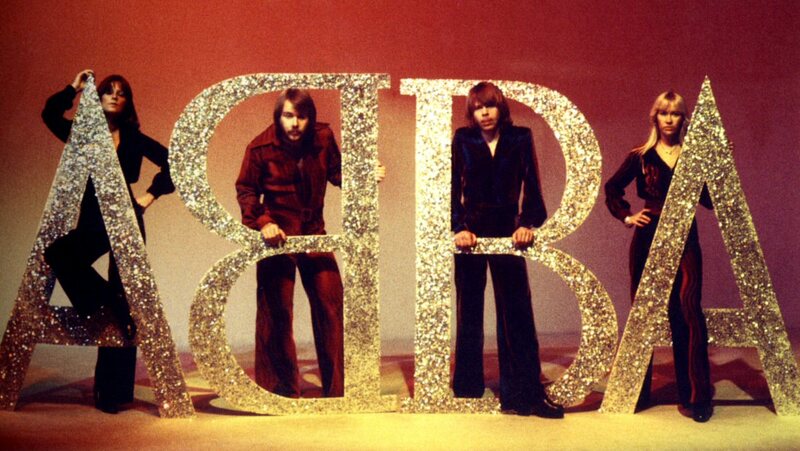 A funny mistake was made on the MC release of the album where the wrong "B" was reverted. 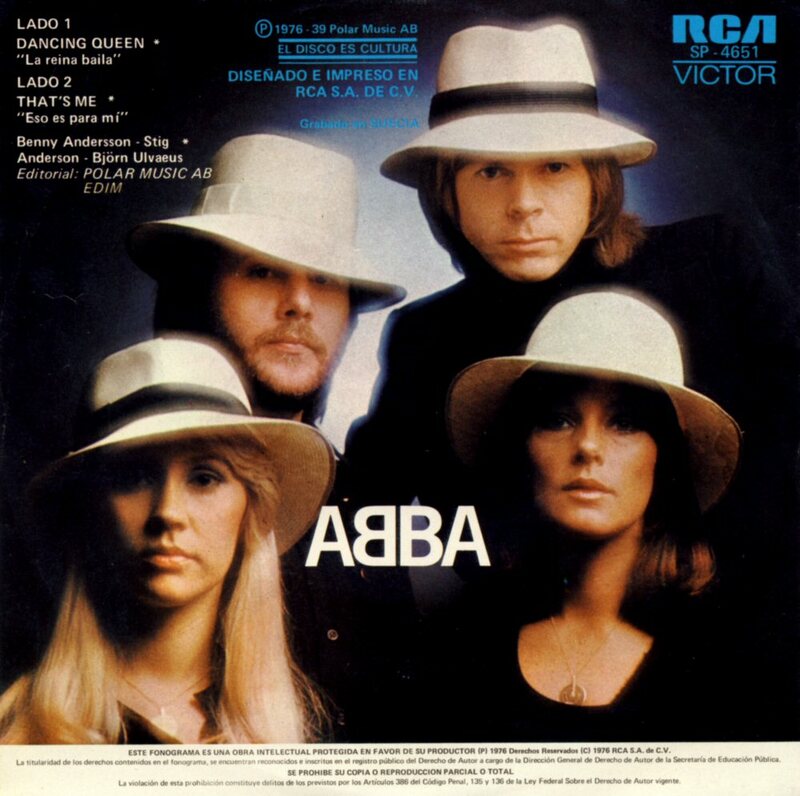 The wonderful "black & hat" session was used on the single cover. 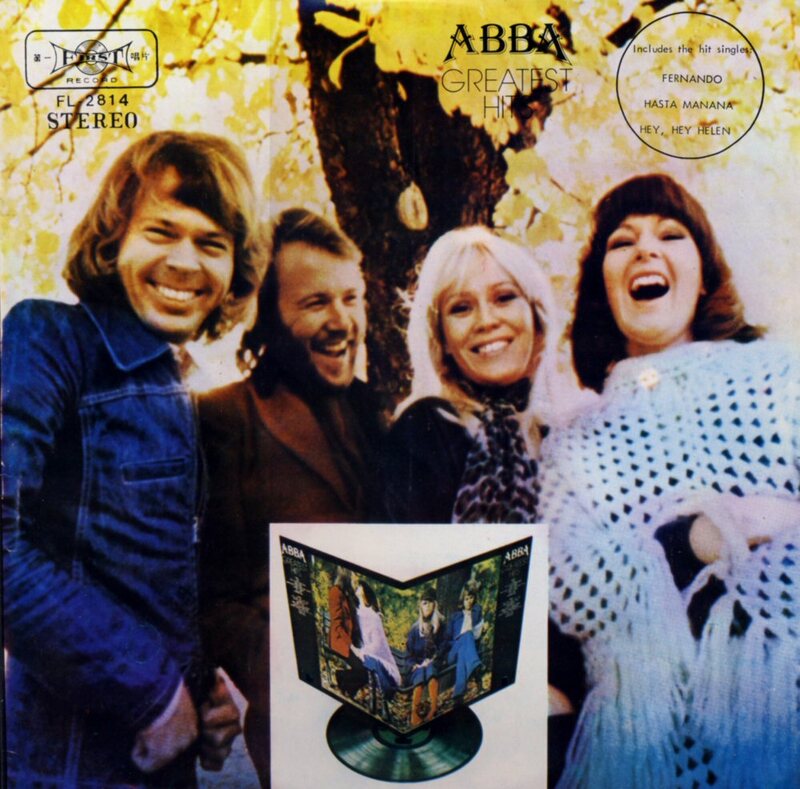 This cover featured a very special detail - the reversed "B" in the name ABBA. 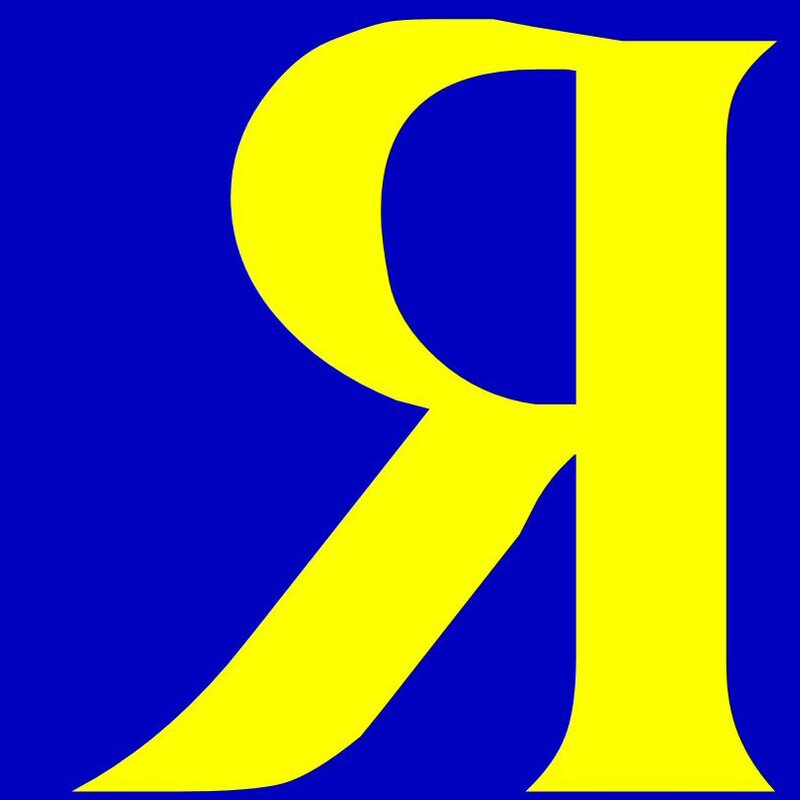 The new logo would be used from now until the end of the group's existence. 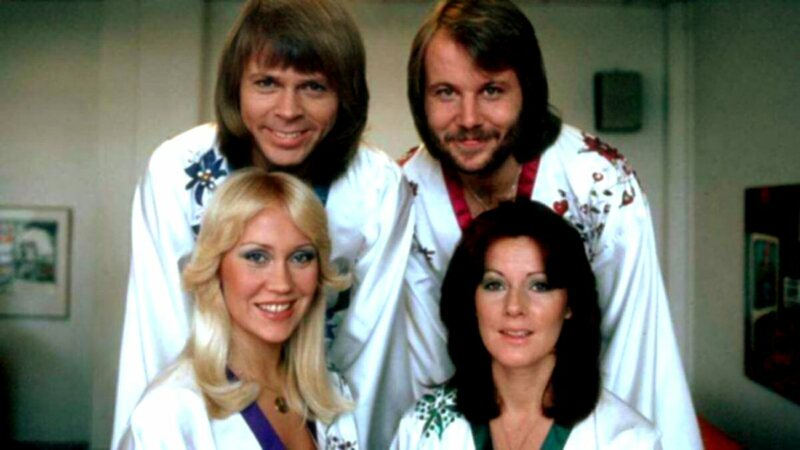 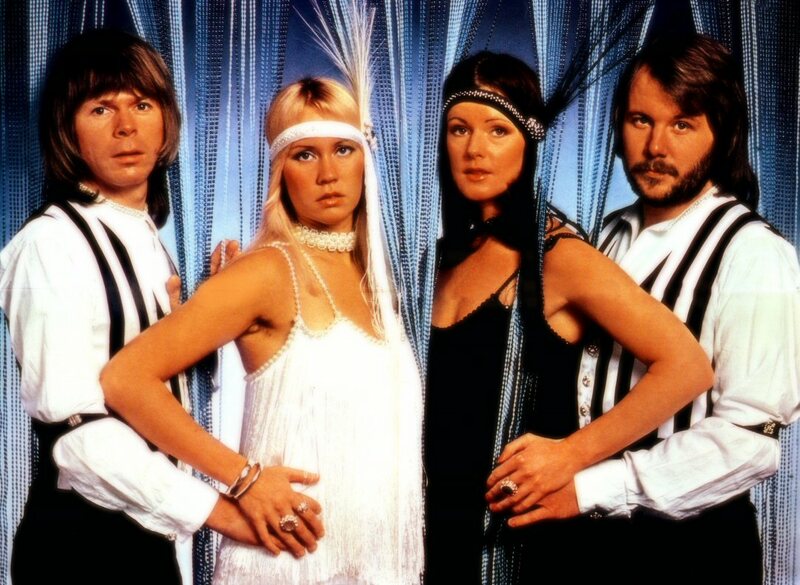 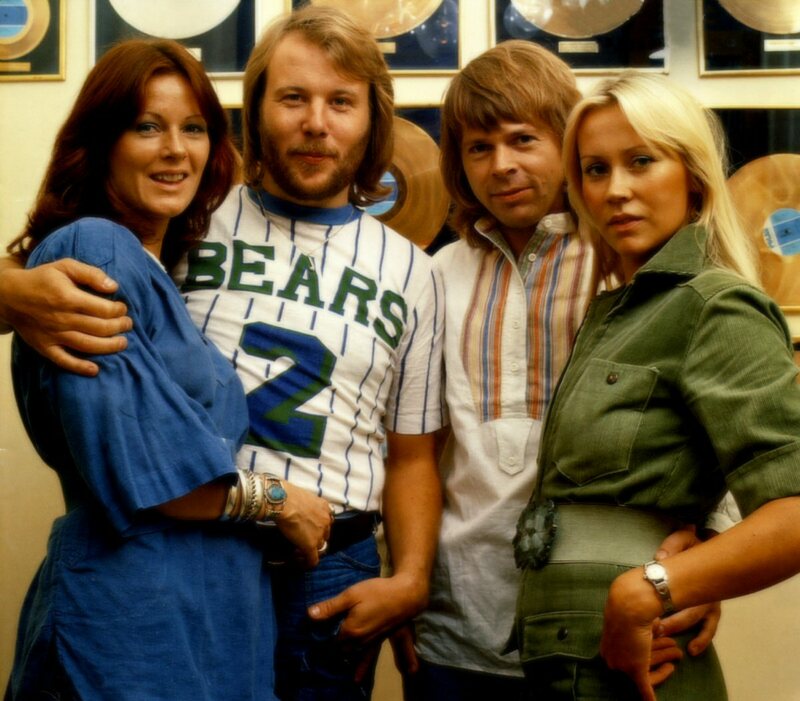 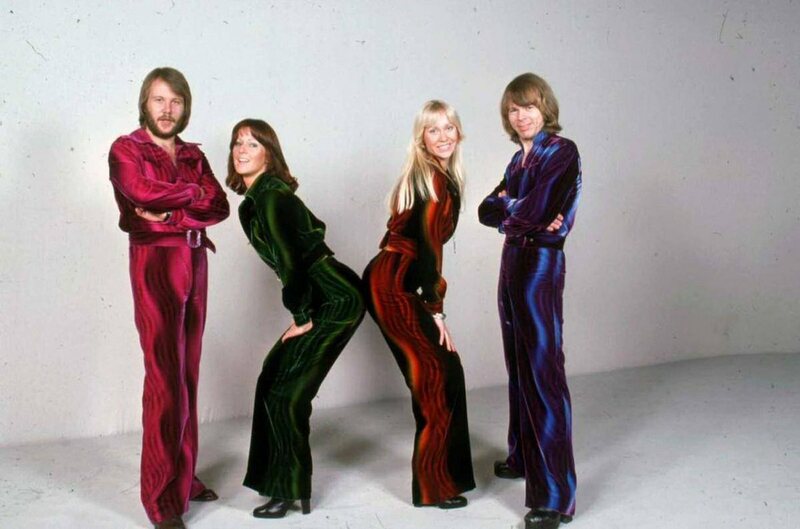 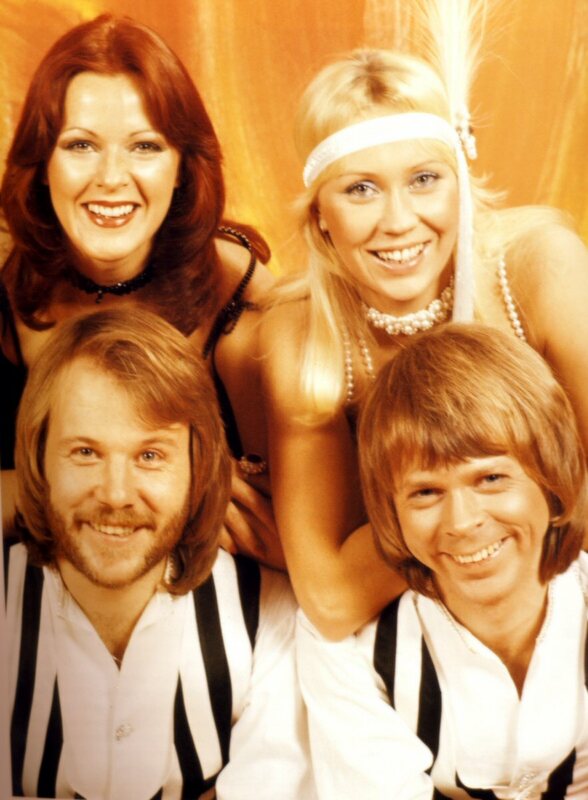 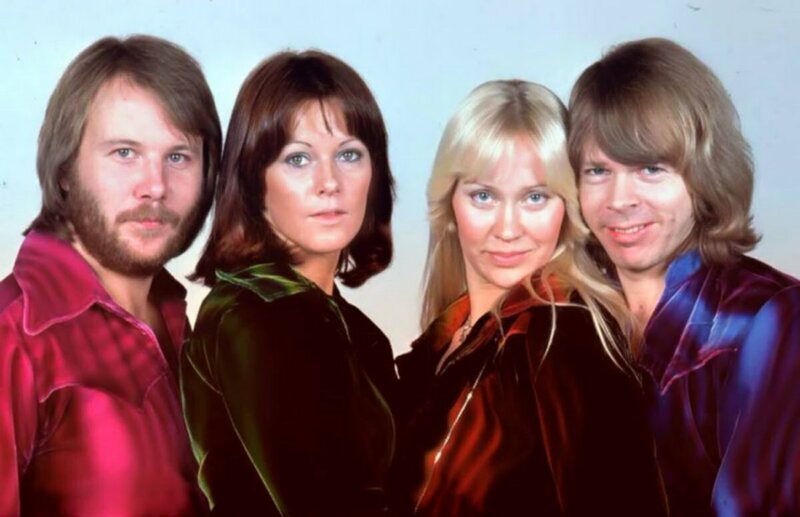 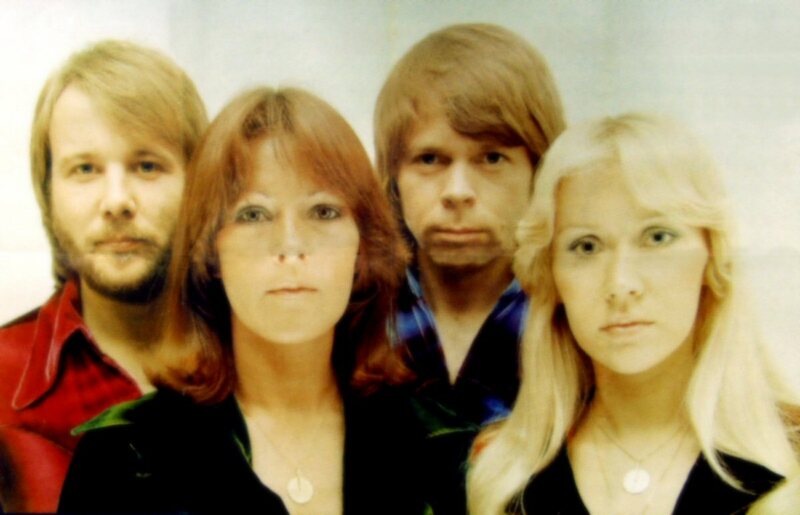 It was never decided which A and which B represent Agnetha, Anni-Frid, Benny and Björn. 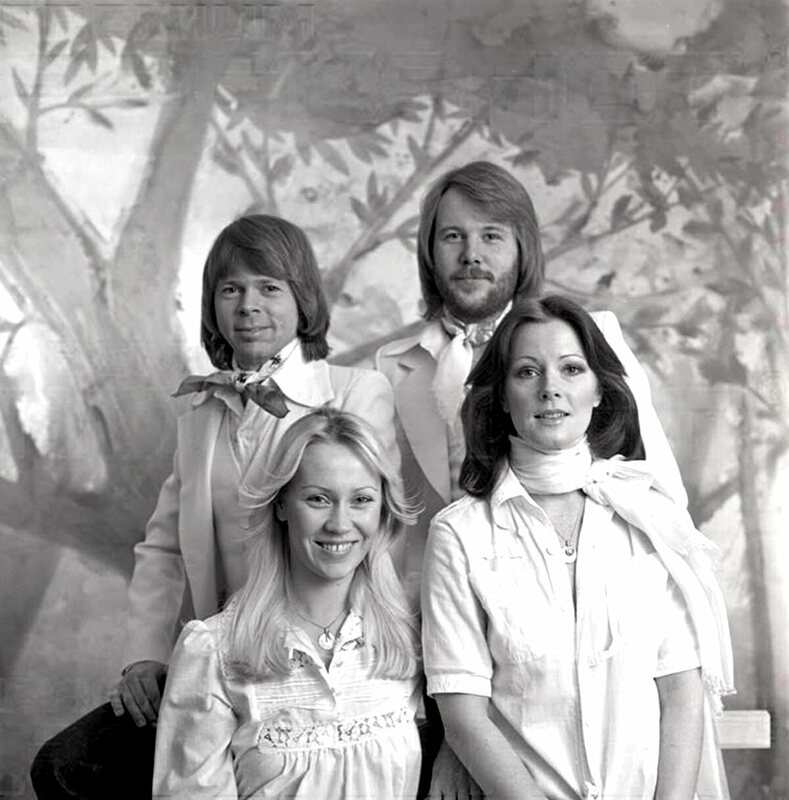 The photo session was taken at the beginning of 1976 and it still is considered as one of the group's most classical photo sessions. 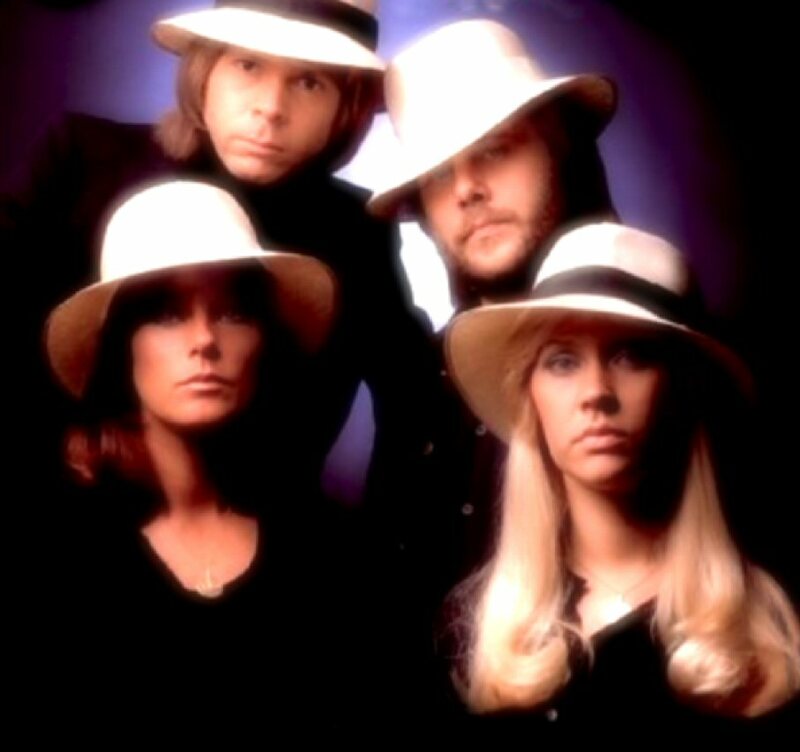 There are several alternative shots available nowadays both with and without hats. 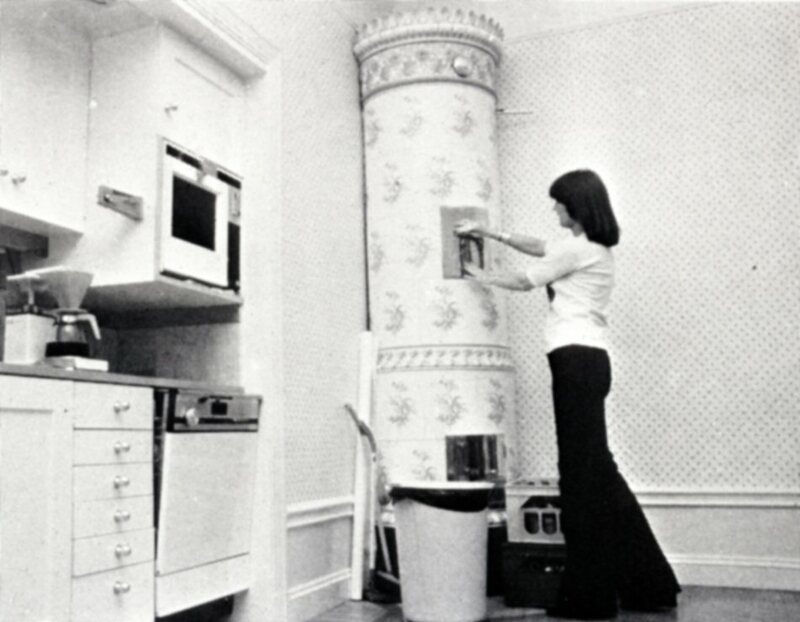 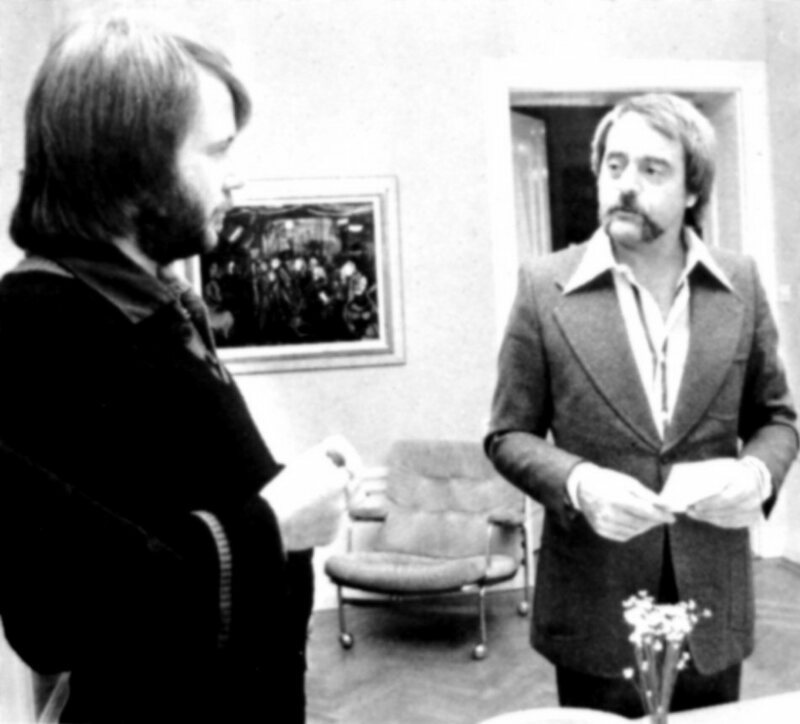 Some rare shots appeared in 1976 in Danish press. 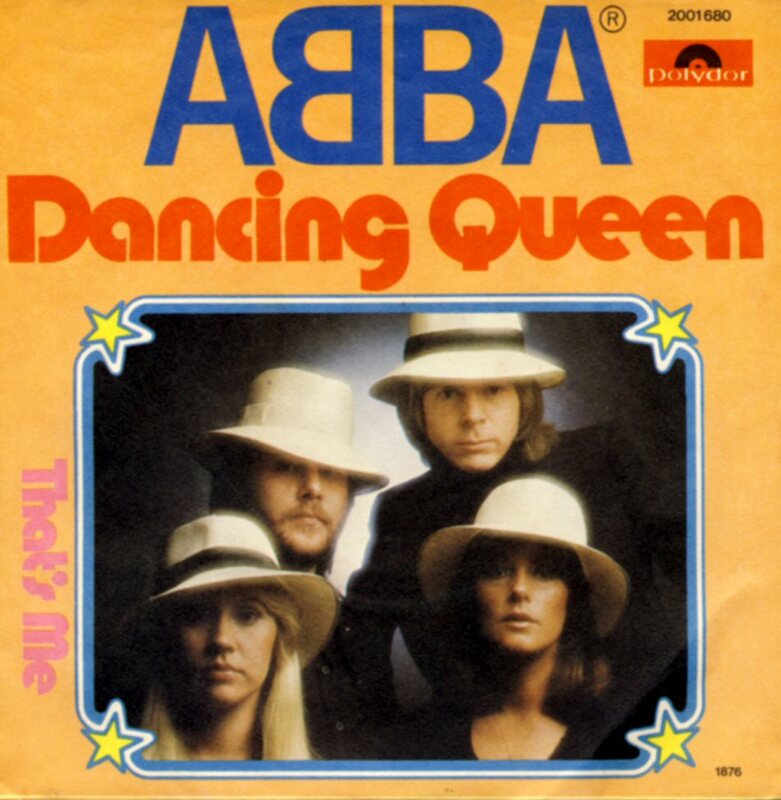 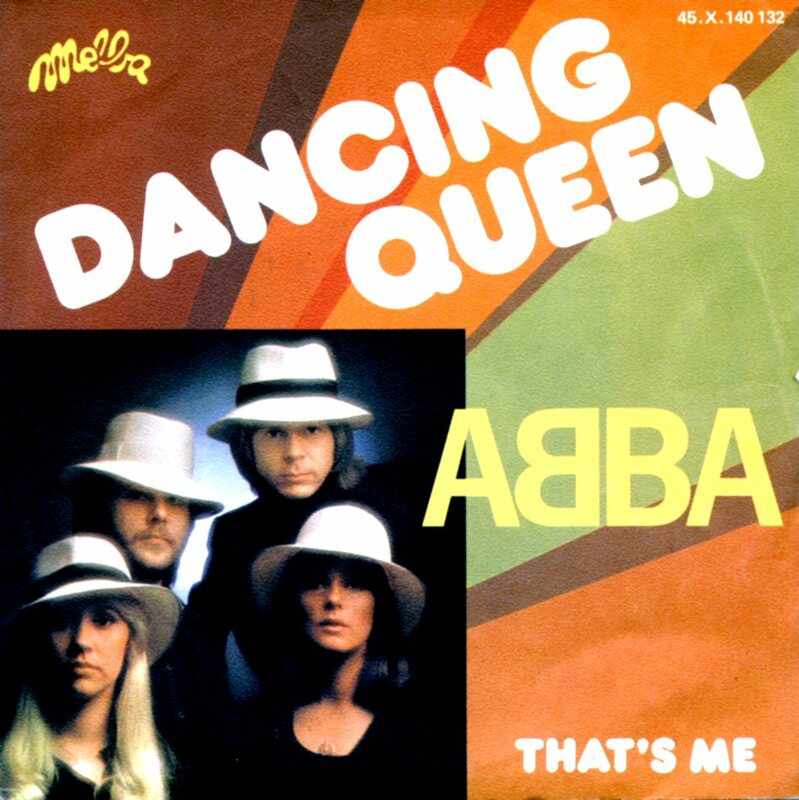 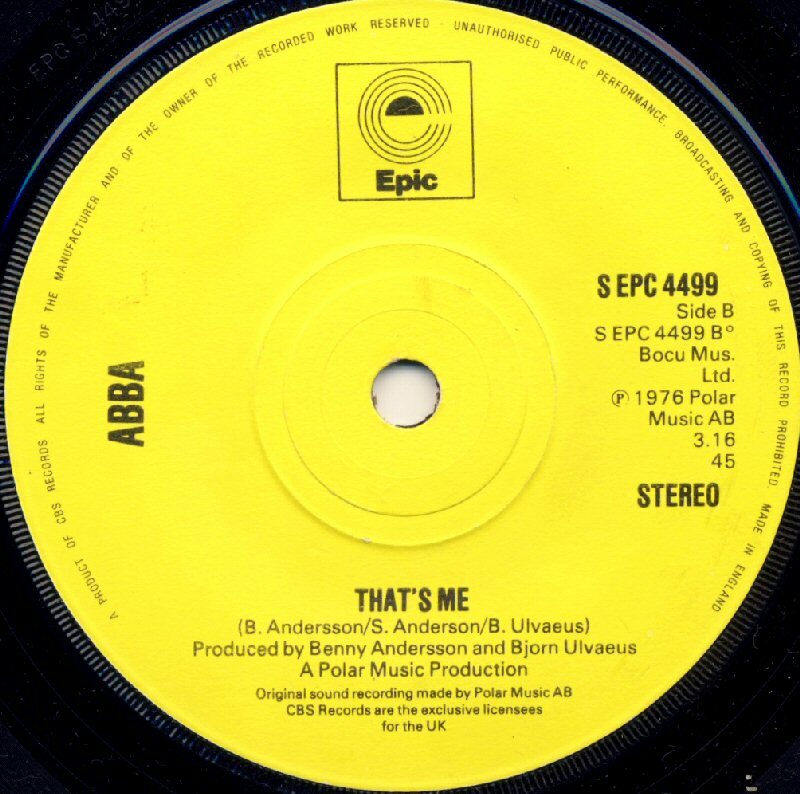 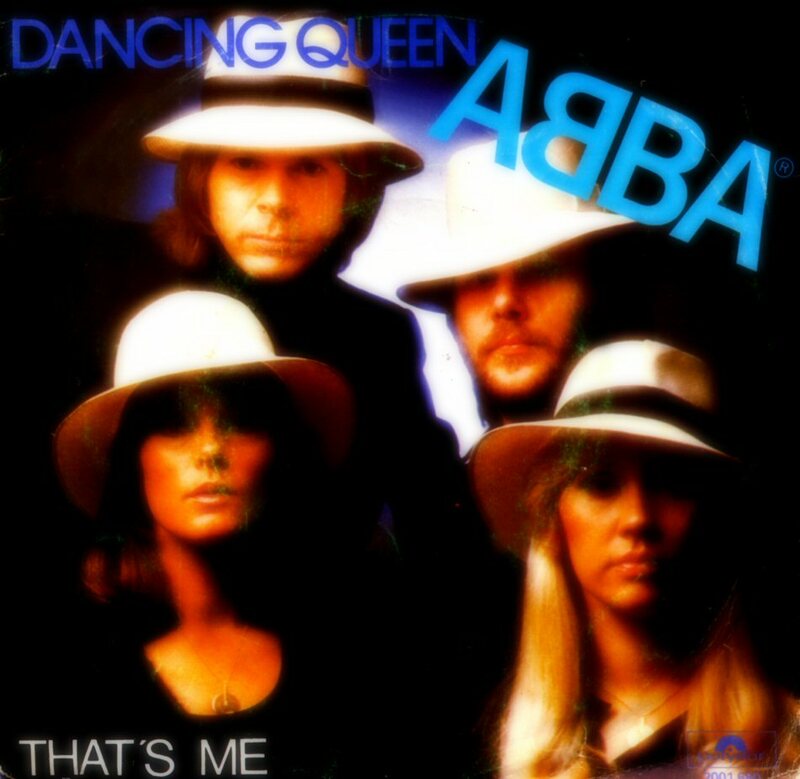 "Dancing Queen" (with "That's Me" on B-side) was released in most European countries on 16 August 1976. 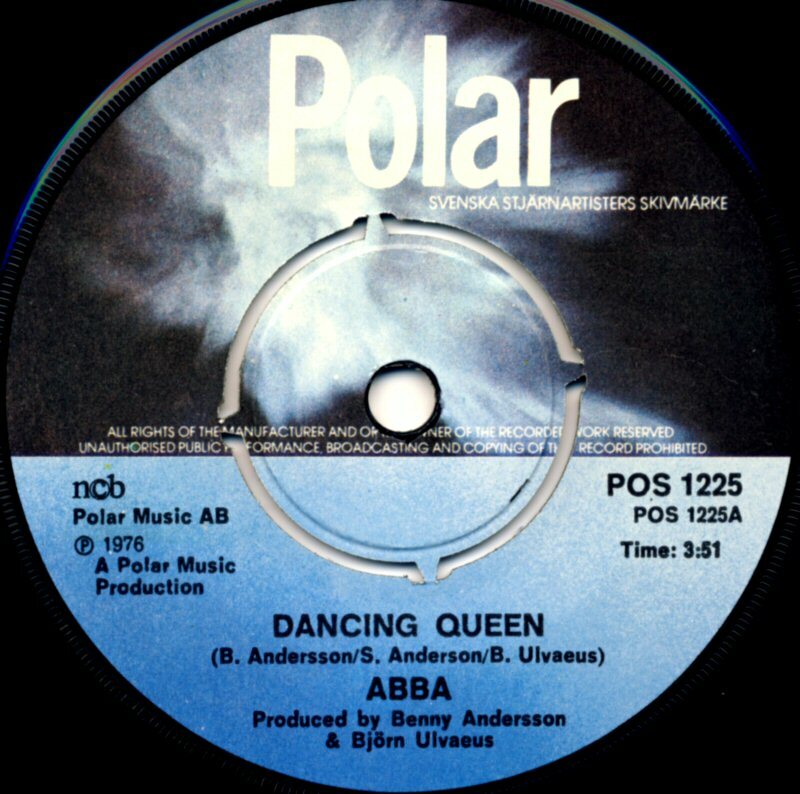 In Sweden "Dancing Queen" entered the single chart on 26 August 1976 where it stayed for 32 weeks reaching #1 (for 14 weeks). 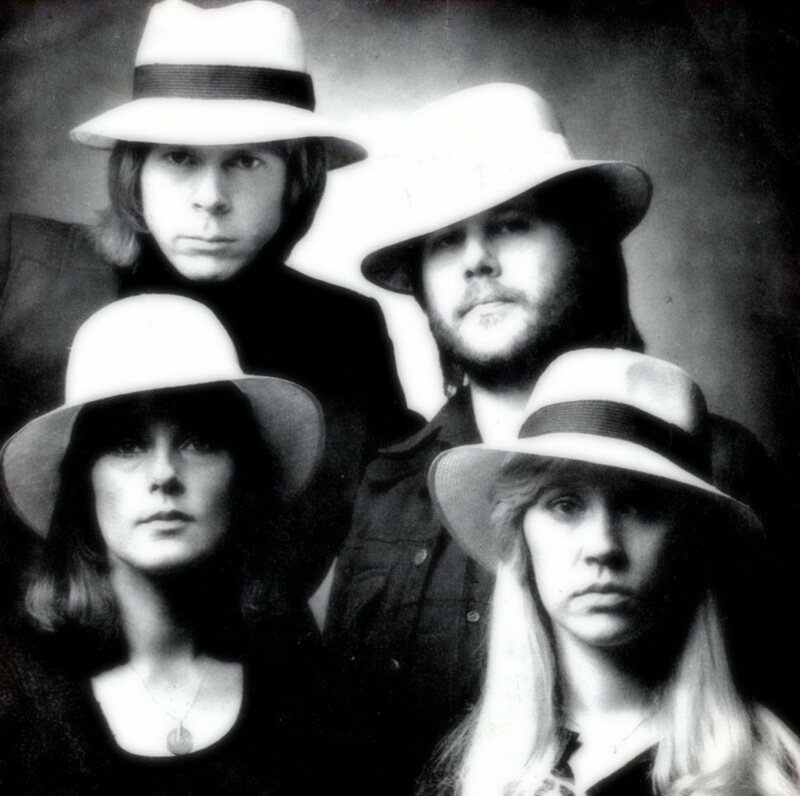 The cover of the single featured the picture from the classical "hat" photo session. 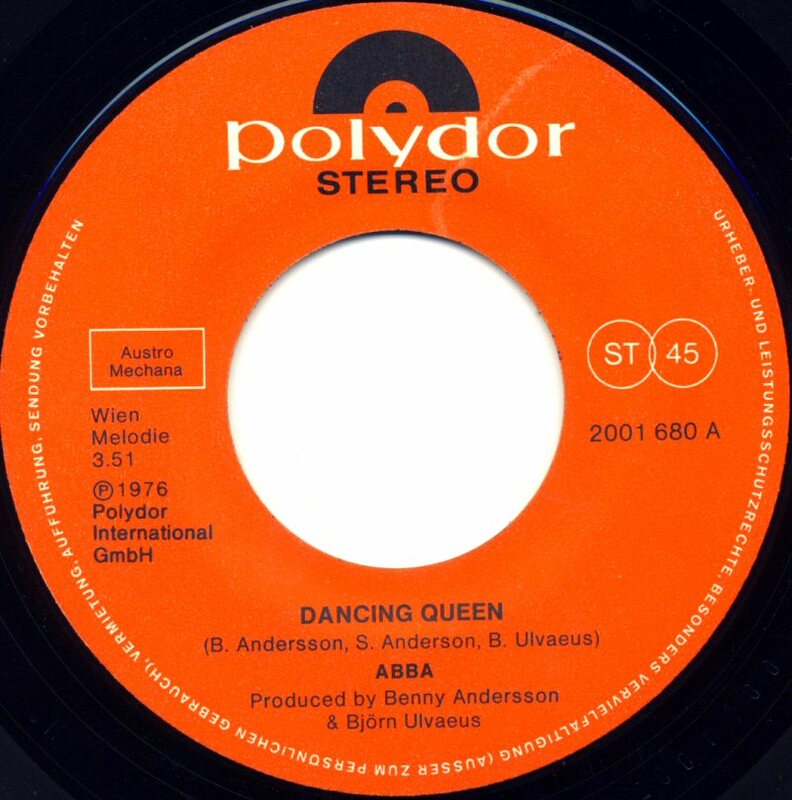 In Denmark the single was released in two versions - the first had the same photo and lay-out as the Swedish version and the second version with red background featured an alternative shot from the photo session. 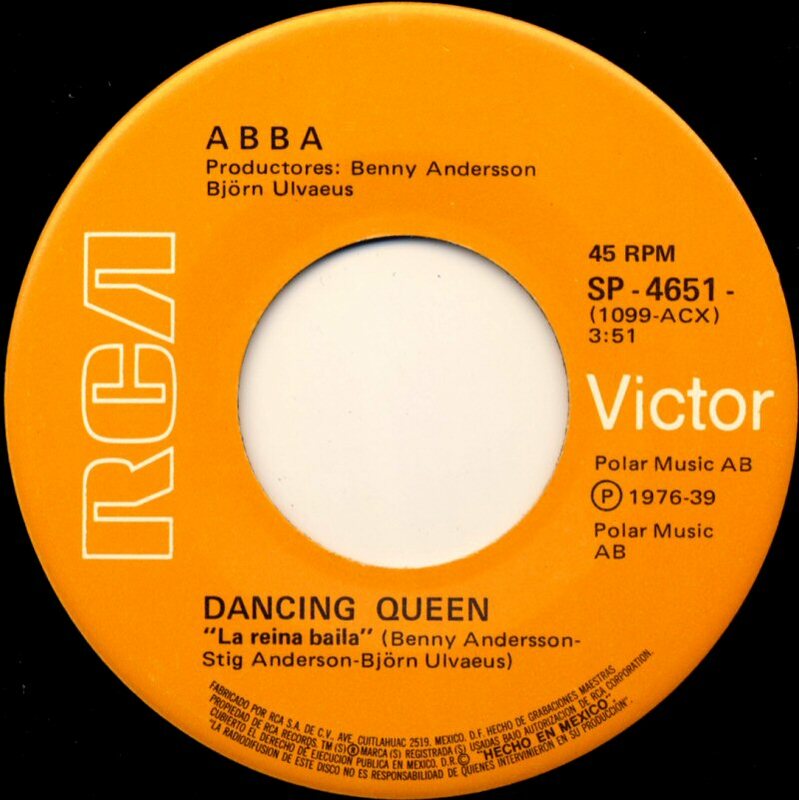 "Dancing Queen" entered the Danish single chart on August 21, 1976 where it stayed for 13 weeks peaking at #1 (for 8 weeks). 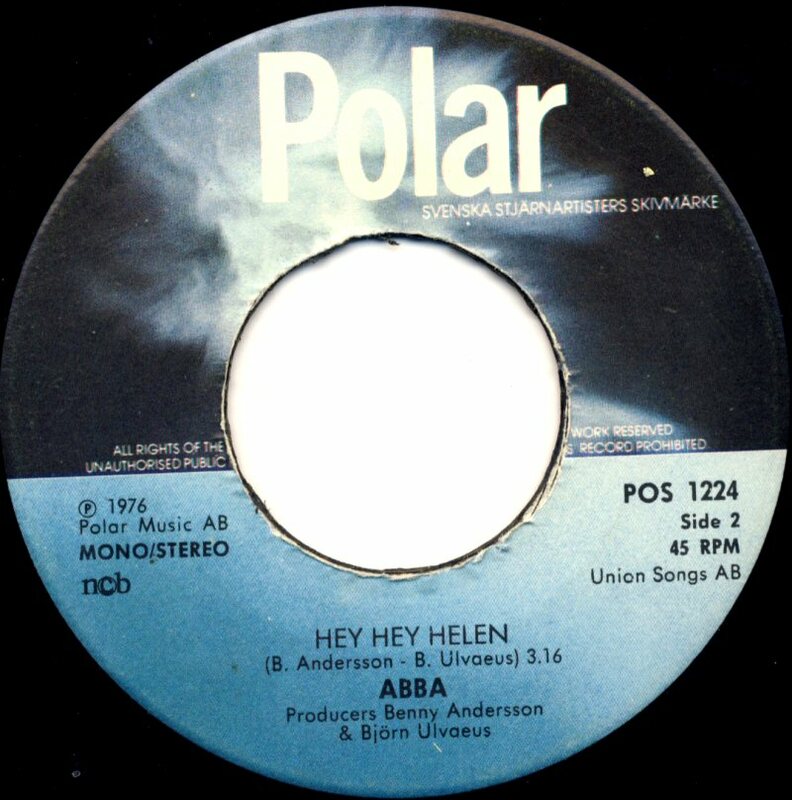 The single entered Norwegian chart on August 21st, 1976 and stayed there for 28 weeks peaking at #1 (for 12 weeks). 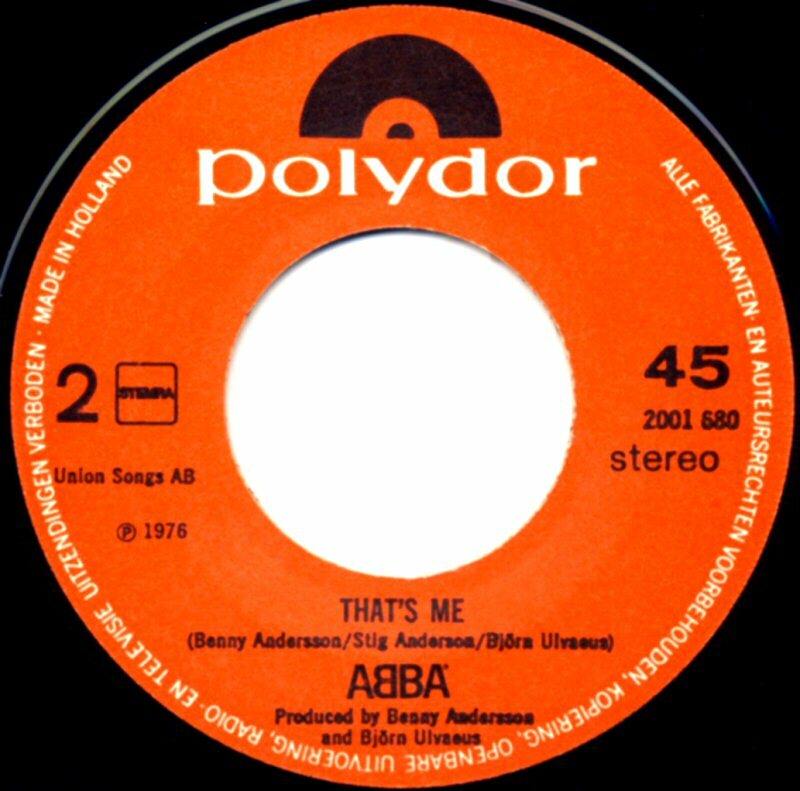 The single entered the British chart on August 21st at #23. 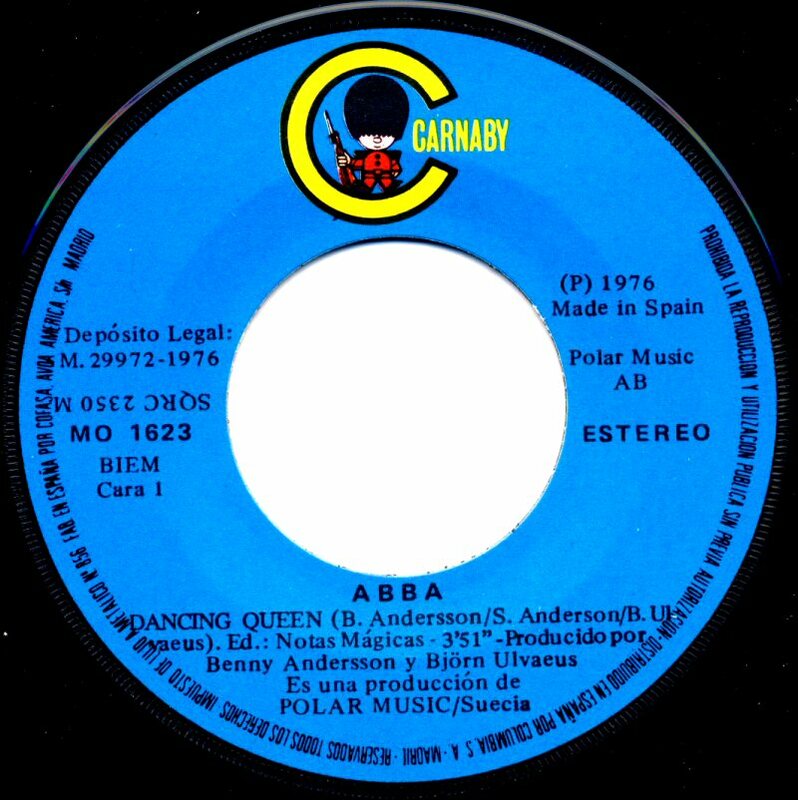 One week later "Dancing Queen" reached #16 and finally on September 4th the single came to the number 1 where it stayed for 6 weeks until October 16th. 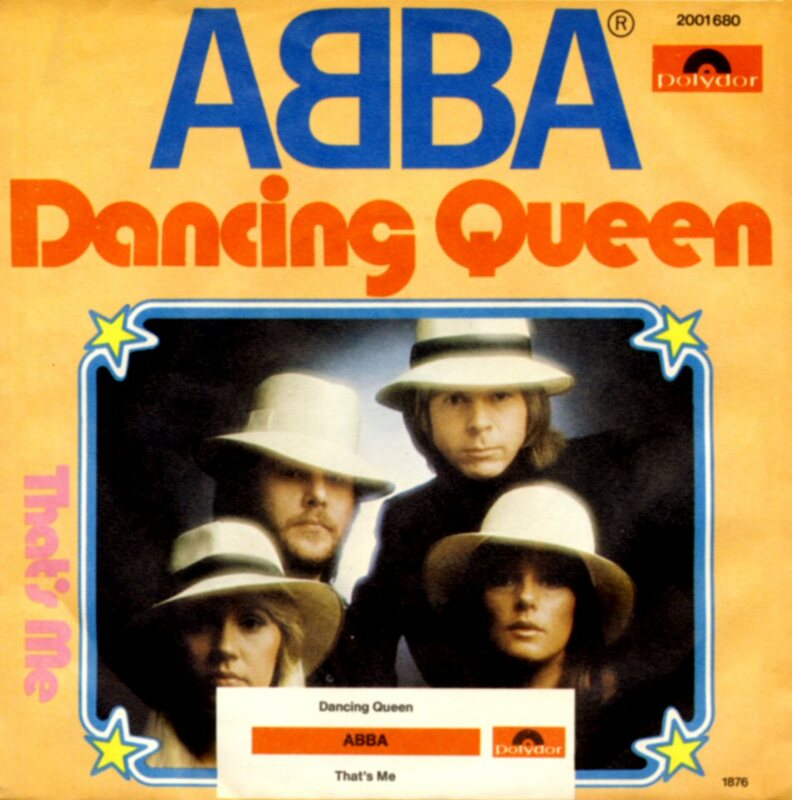 Totally "Dancing Queen" spent 15 weeks on the UK chart. 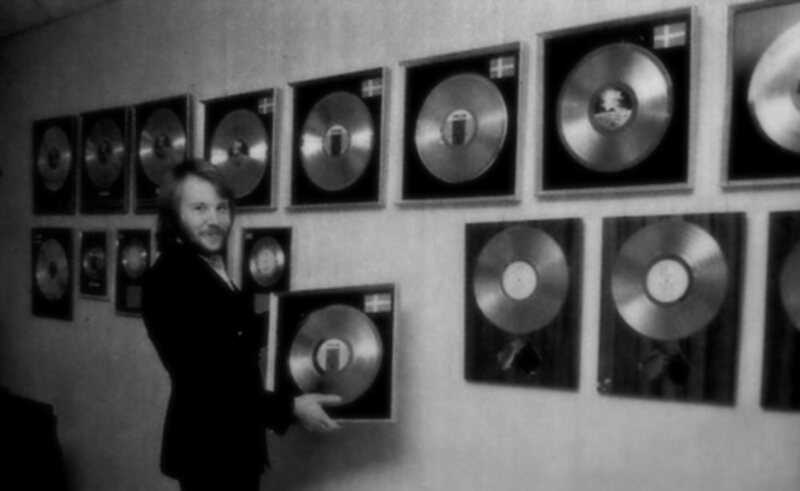 The chart history (Top 40)+: Aug 21 #23, Aug 28 #16, Sep 4 # 1, Sep 11 #1, Sep 18 #1, Sep 25 #1, Oct 2 #1, Oct 9 #1, Oct 16 #2, Oct 23 #6. 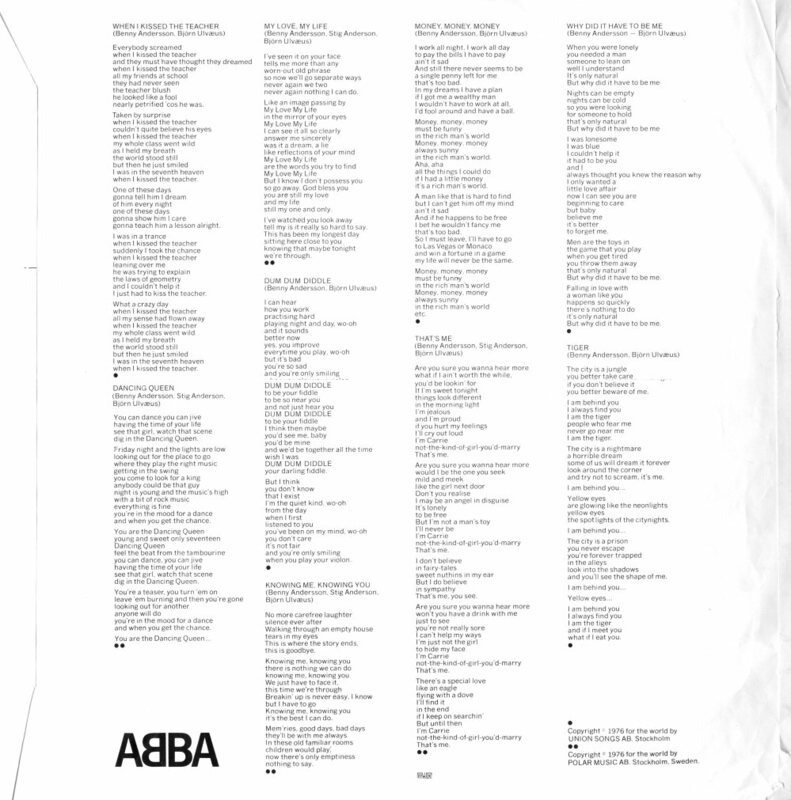 Oct 30 #8, Nov 6 #13, Nov 13 #20, Nov 20 #30, Nov 27 #37. 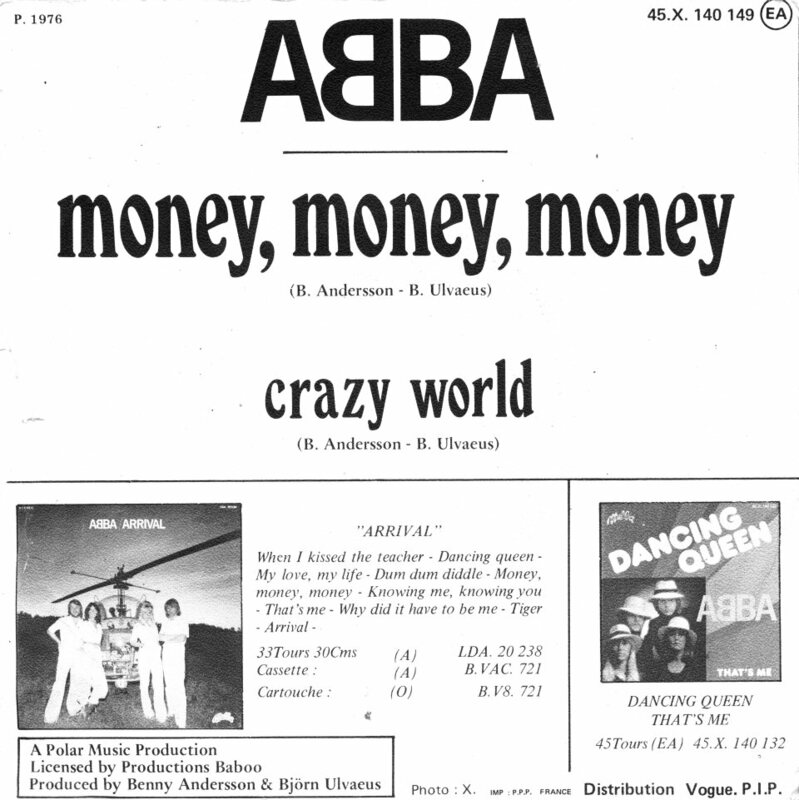 In West Germany the single entered the chart on 16 August and on 20 September it reached #1 for one week. 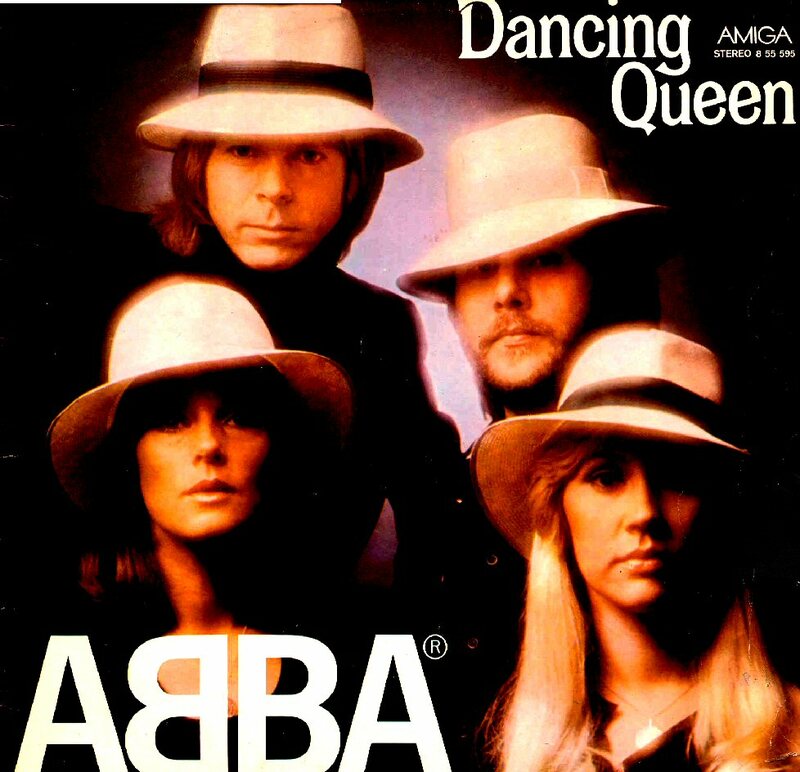 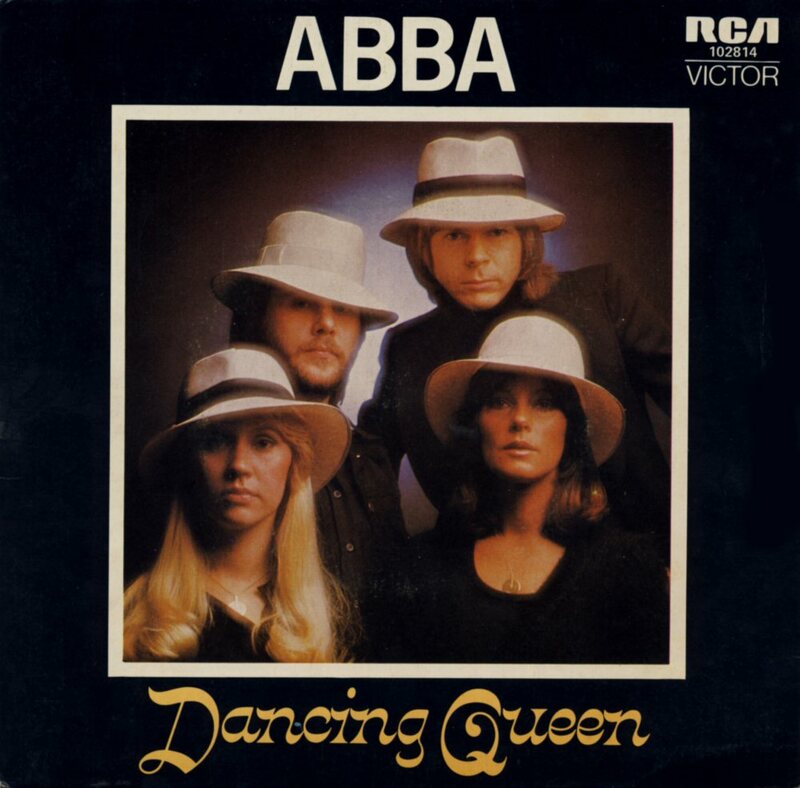 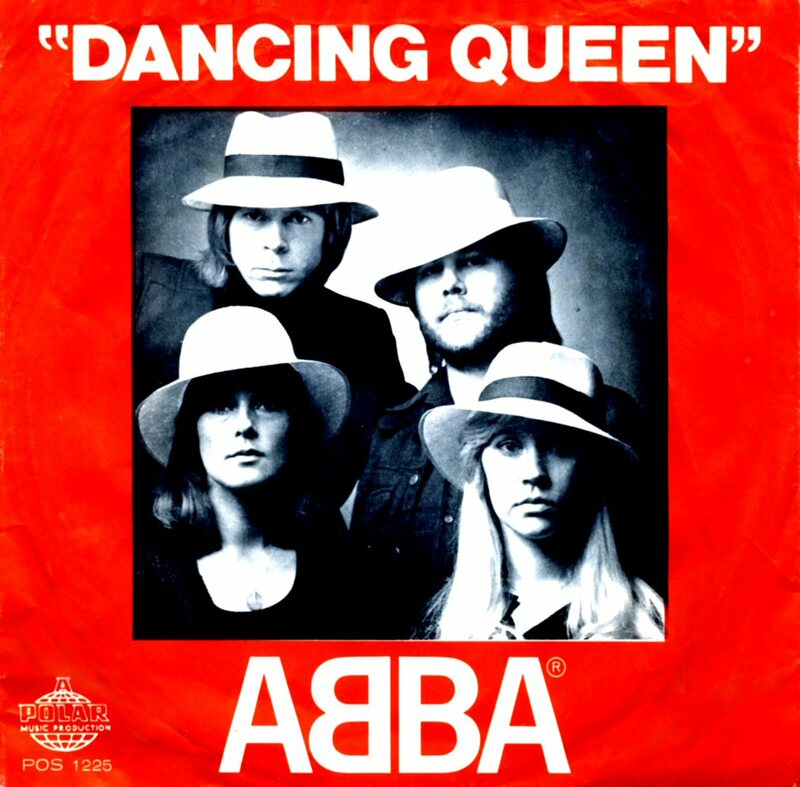 "Dancing Queen" became number 1 in almost all European countries, USA and Australia and it was ABBA's biggest commercial hit ever. 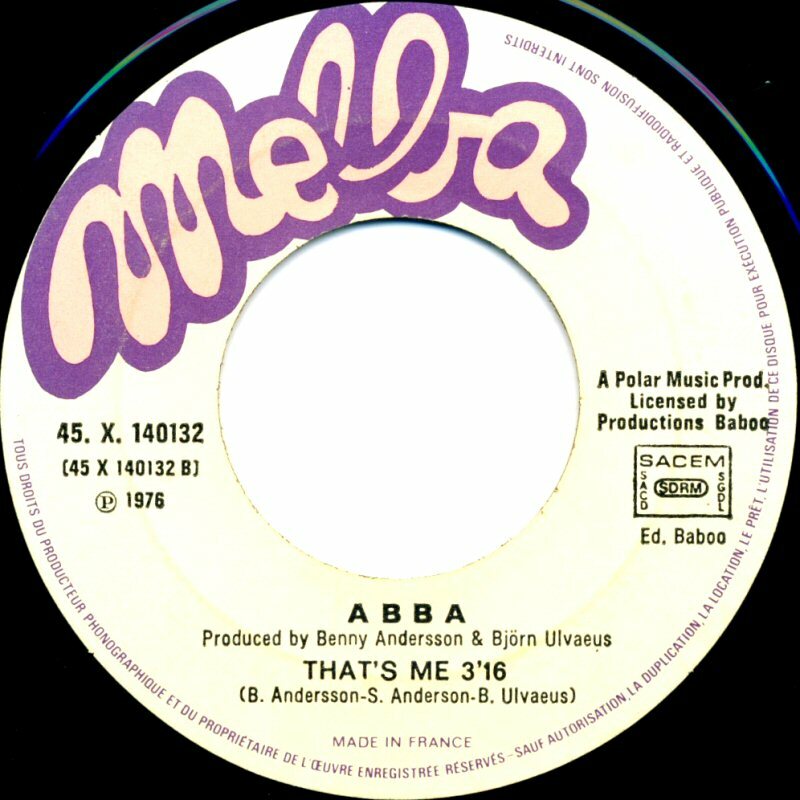 The single did not topped the chart in France where it reached #5 (release 13 August). 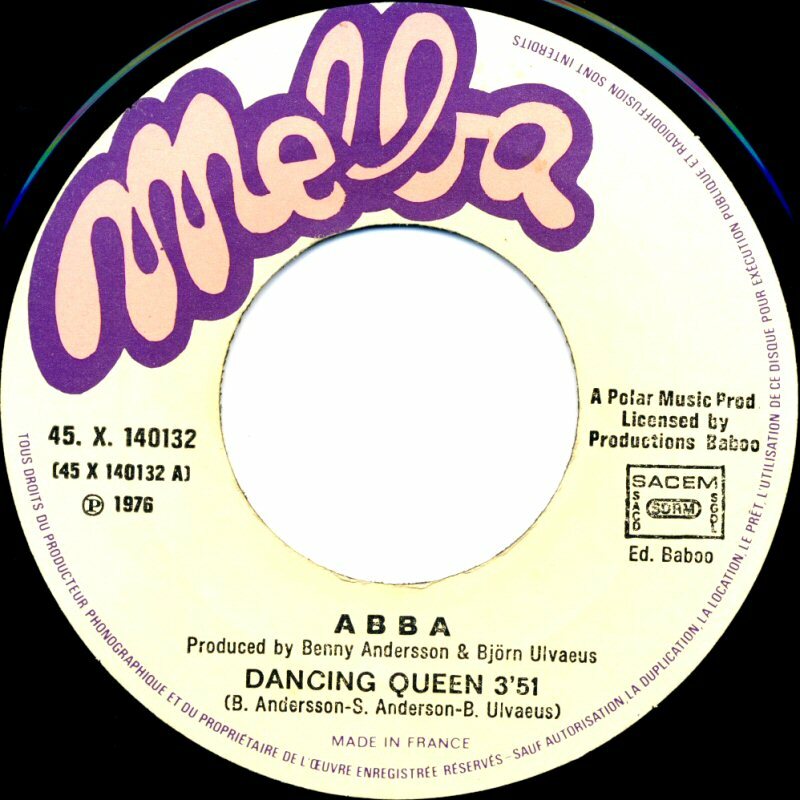 In The Netherlands the single "Dancing Queen" entered the chart already on 14 August and it stayed there for 15 weeks reaching the top. 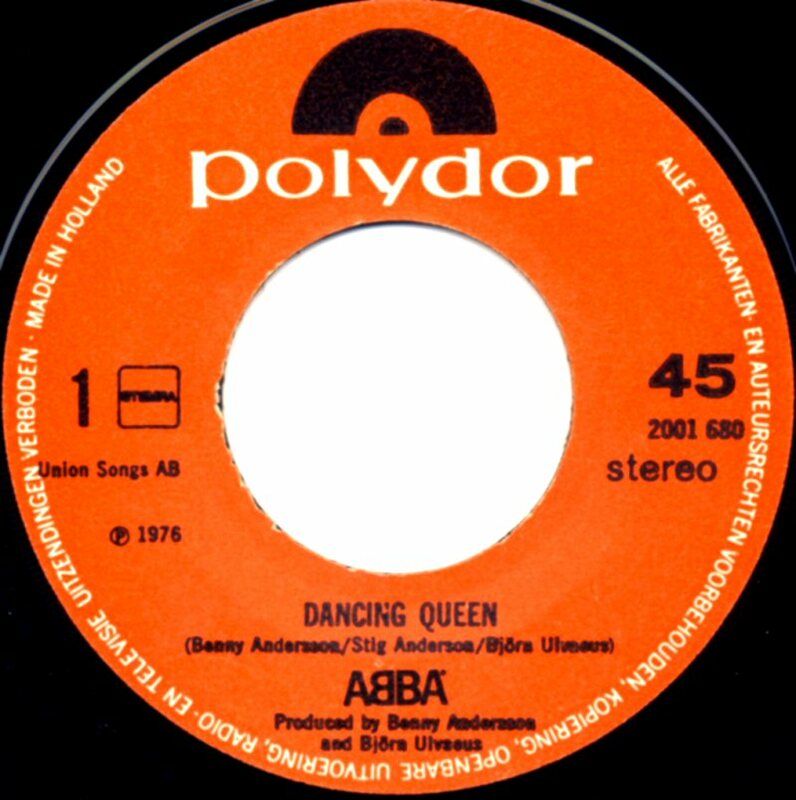 "Dancing Queen" never became number 1 hit in France but the single stayed on the chart for 15 weeks reaching #5. 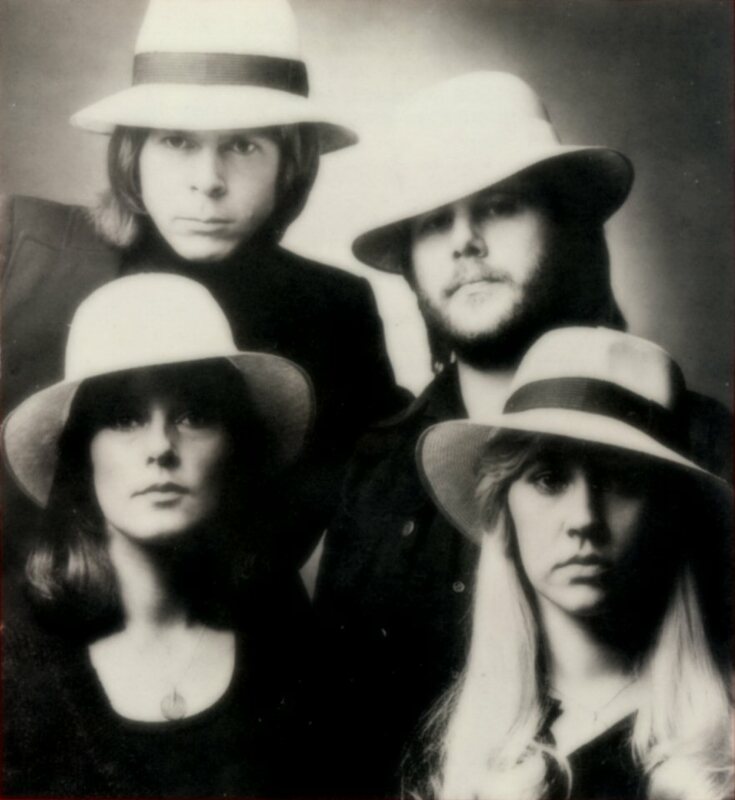 The French cover was different to the Swedish one but it featured the same photo from the "hat" session. 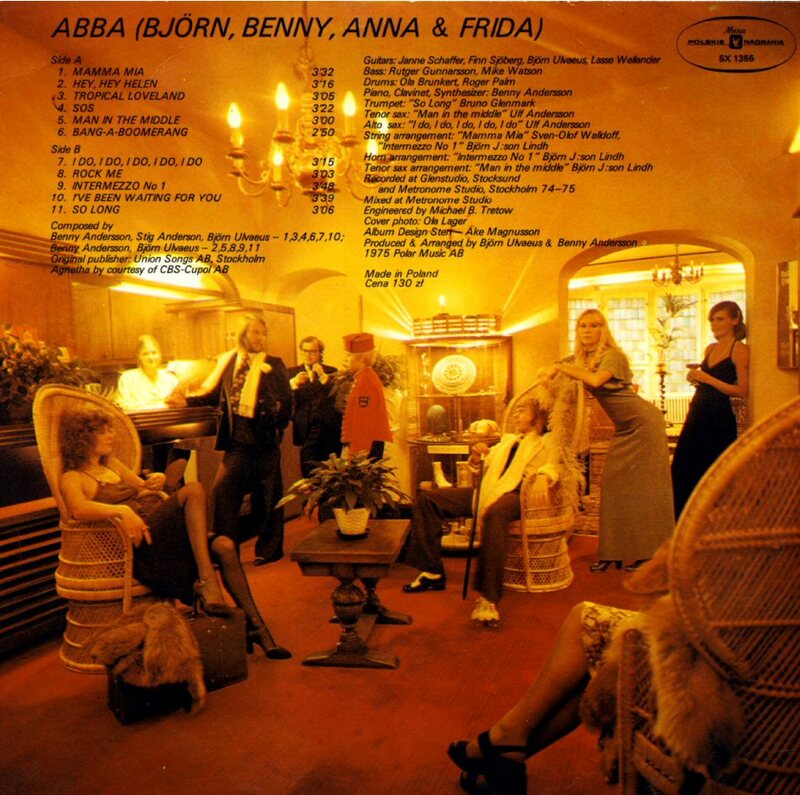 Even the Austrian release of the single featured different cover to the Swedish one but the same picture in laterally reversed version. 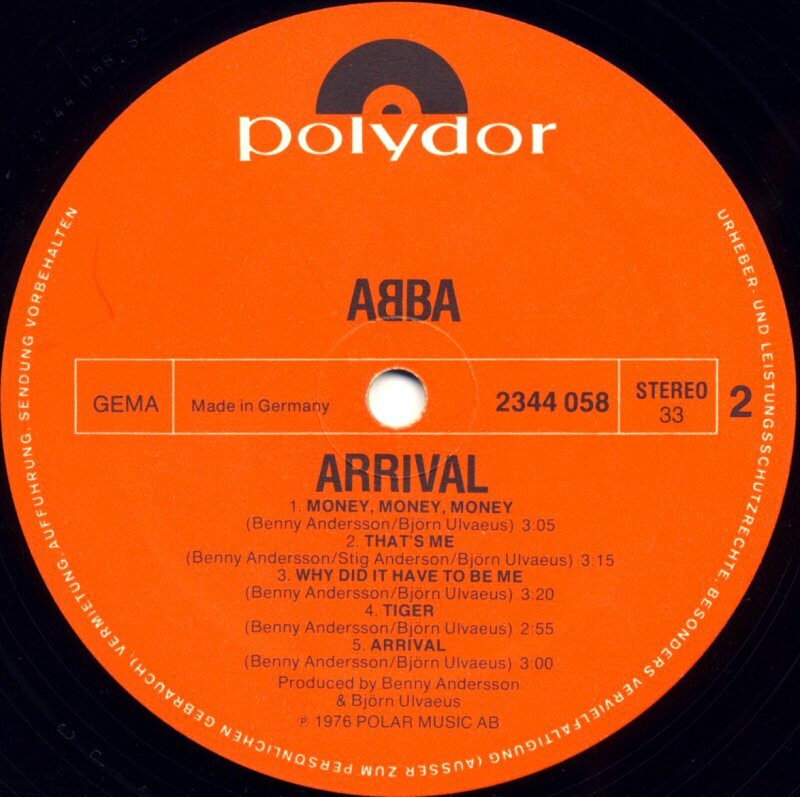 The single was released in Austria at the beginning of September. "Dancing Queen" stayed on the Austrian chart for 15 weeks reaching #4. 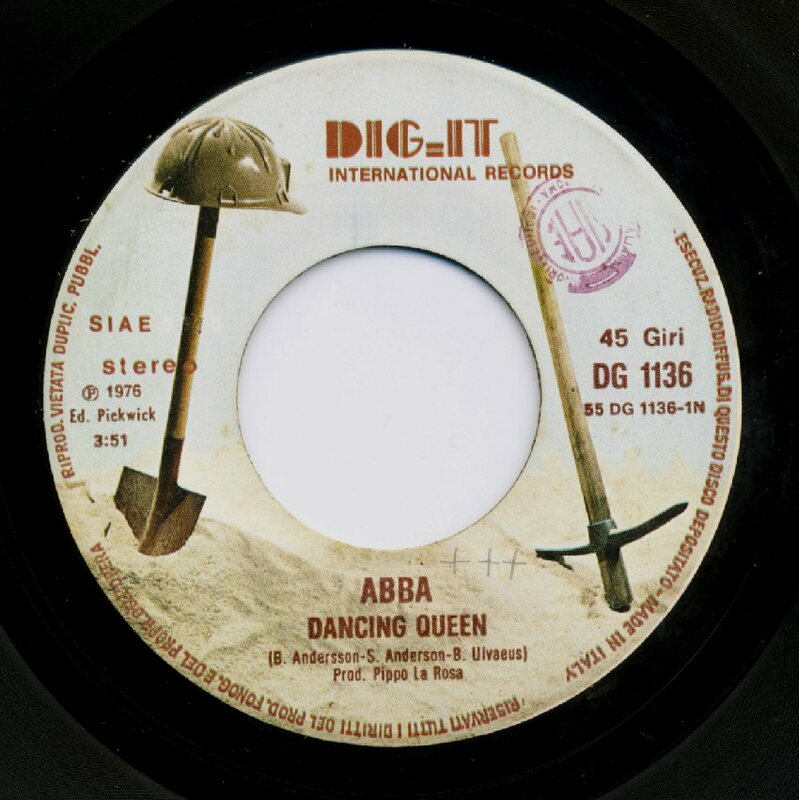 The Italian record company Dig-It released the single "Dancing Queen" at about the same time as in other European countries. The single cover had slightly changed lay-out but it featured the same picture as other releases all over the world. 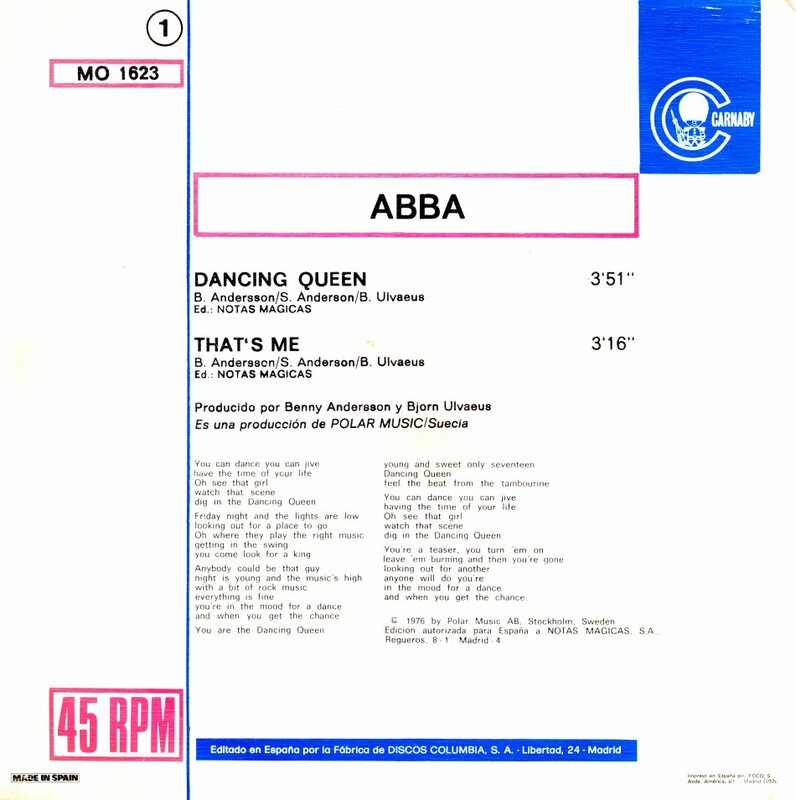 The single stayed on the Italian chart for 15 weeks reaching #14. 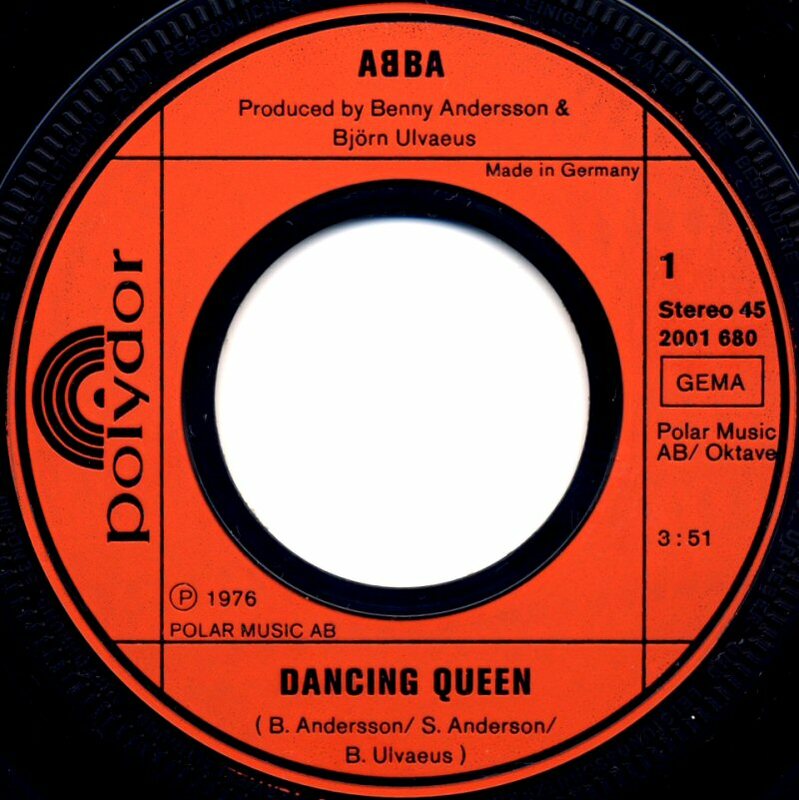 "Dancing Queen" saw its Spanish release at the end of August 1976. 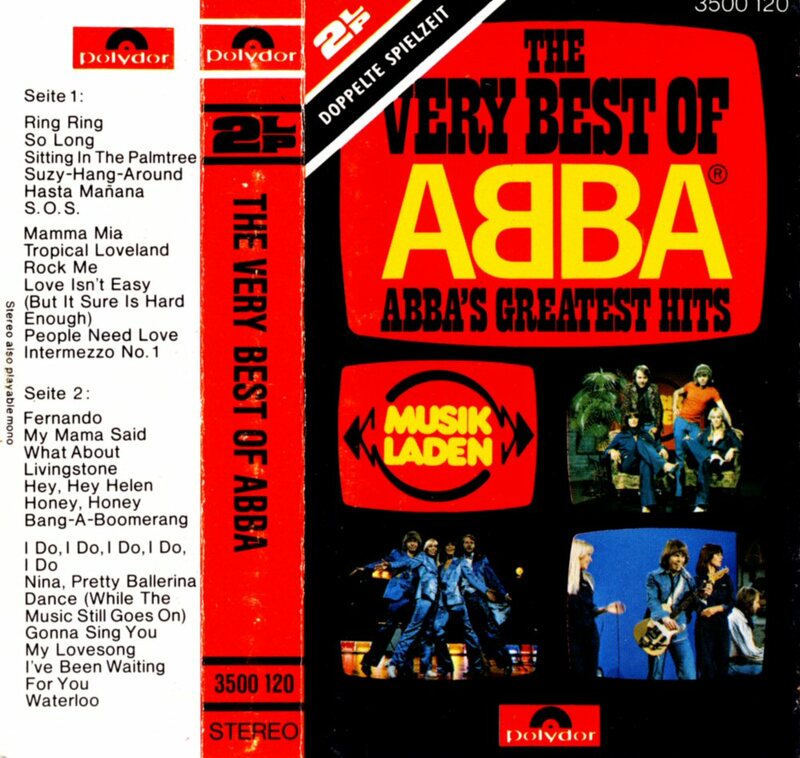 The cover lay-out was slightly changed comparing to the Swedish release. 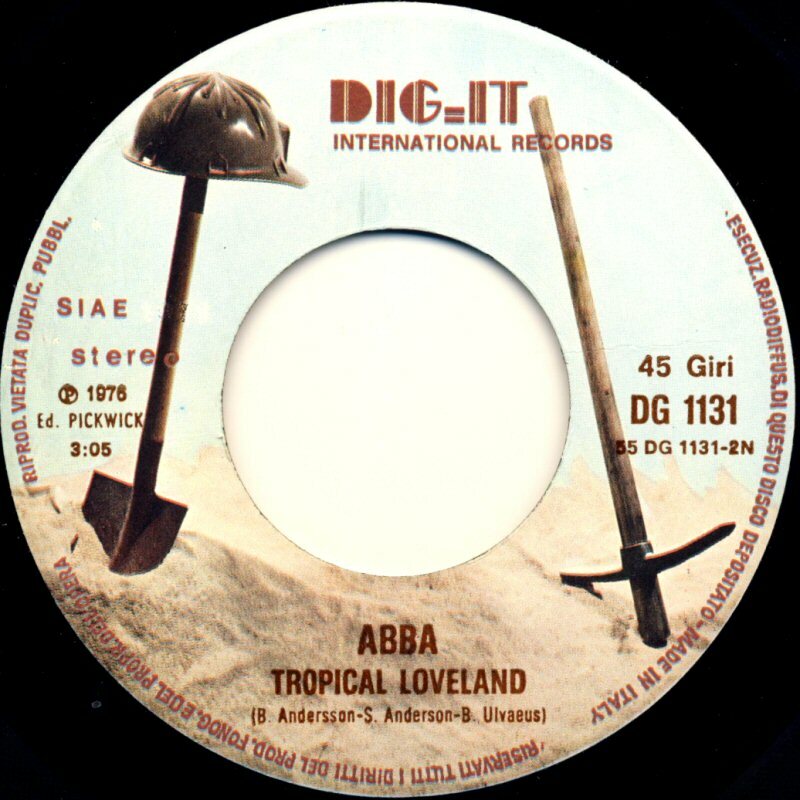 The single was quite successful in Spain where it stayed for 12 weeks reaching #10. 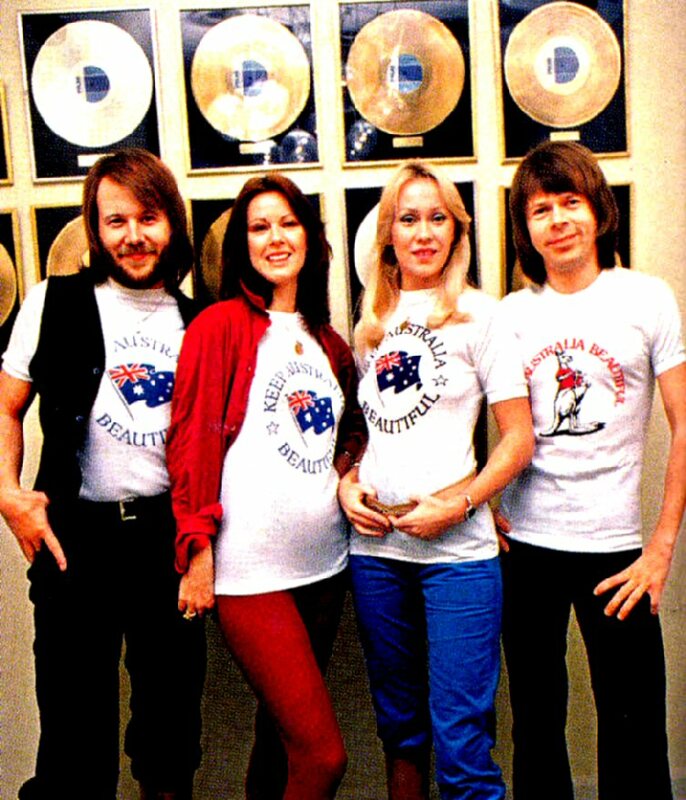 In ABBA's "second homeland" Australia the single "Dancing Queen" entered the chart on August 16, 1976 where it stayed for unbelievable 25 weeks reaching #1. 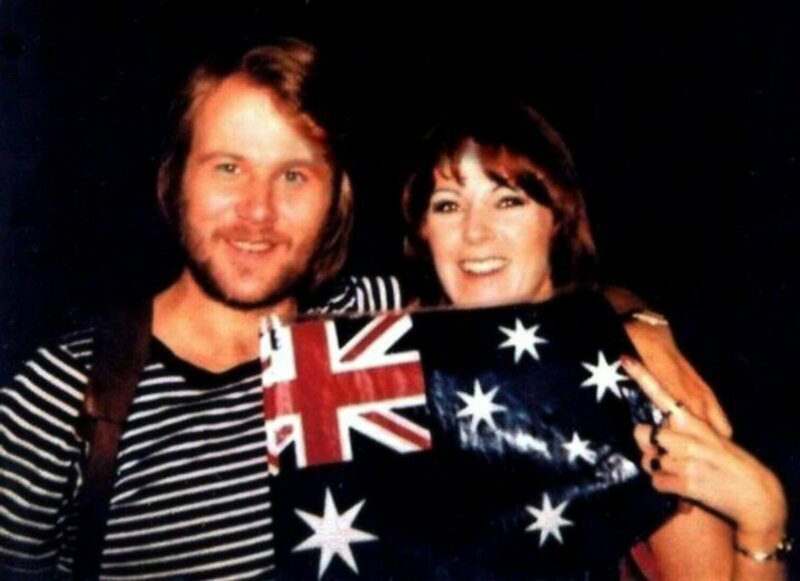 The Australian single release has a very special story - read below. 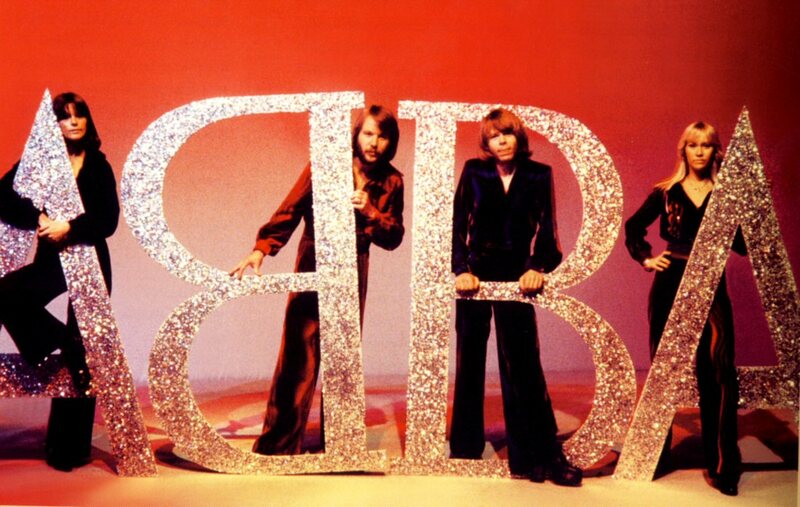 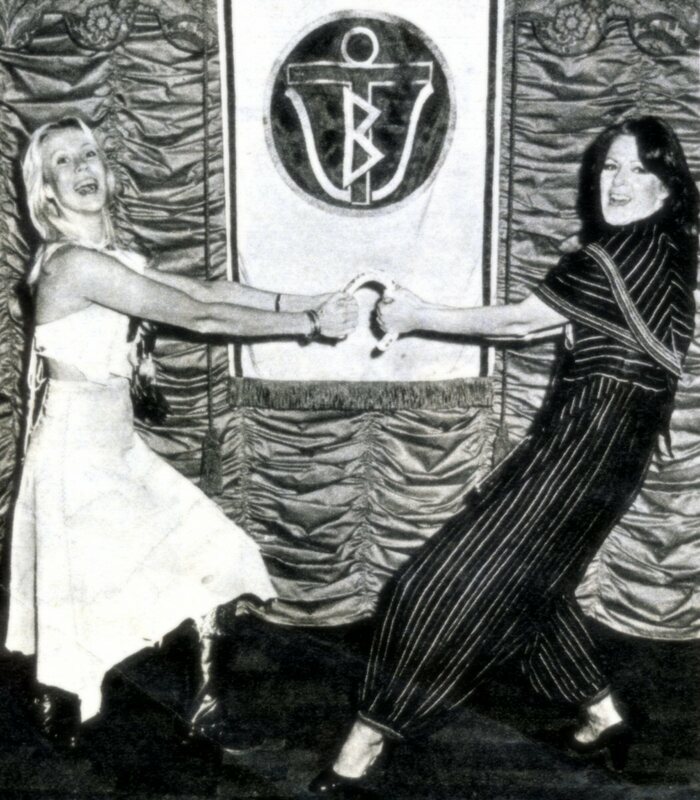 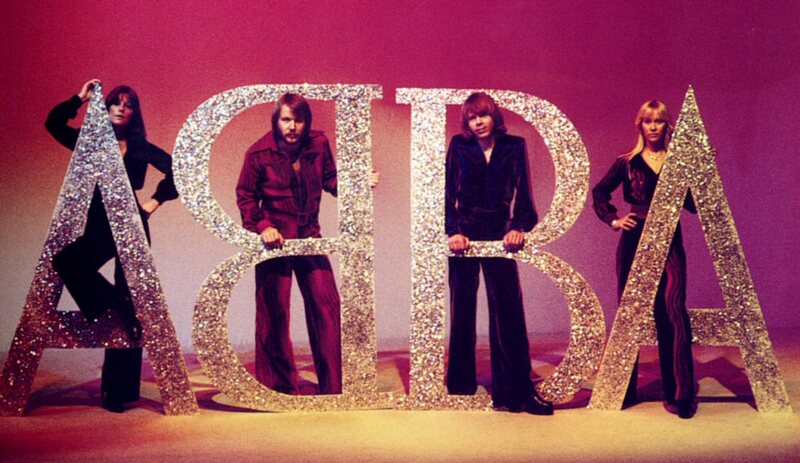 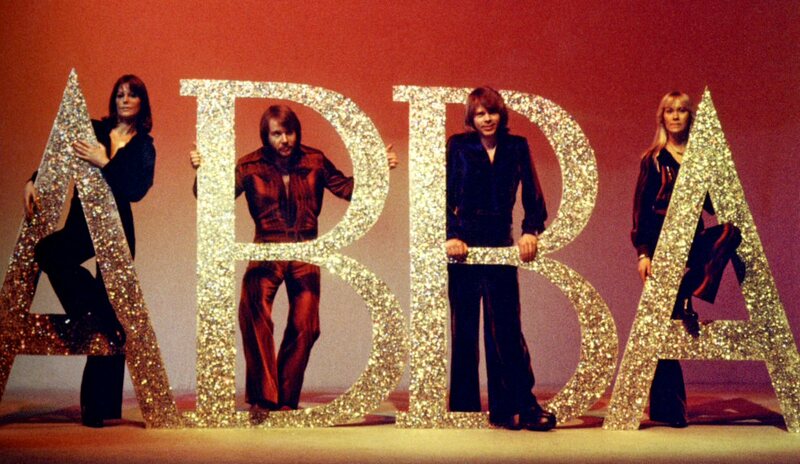 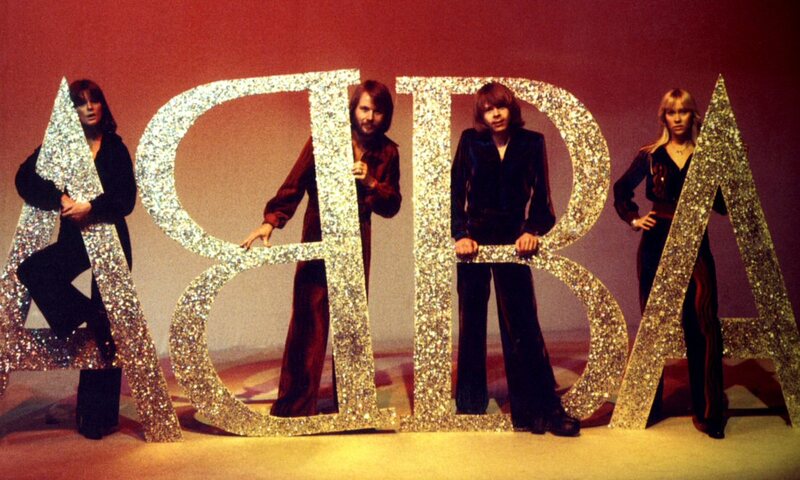 By the time of release of the single "Dancing Queen" in Australia ABBA launched their new official logo featuring the first "B" in the name of the group reversed. 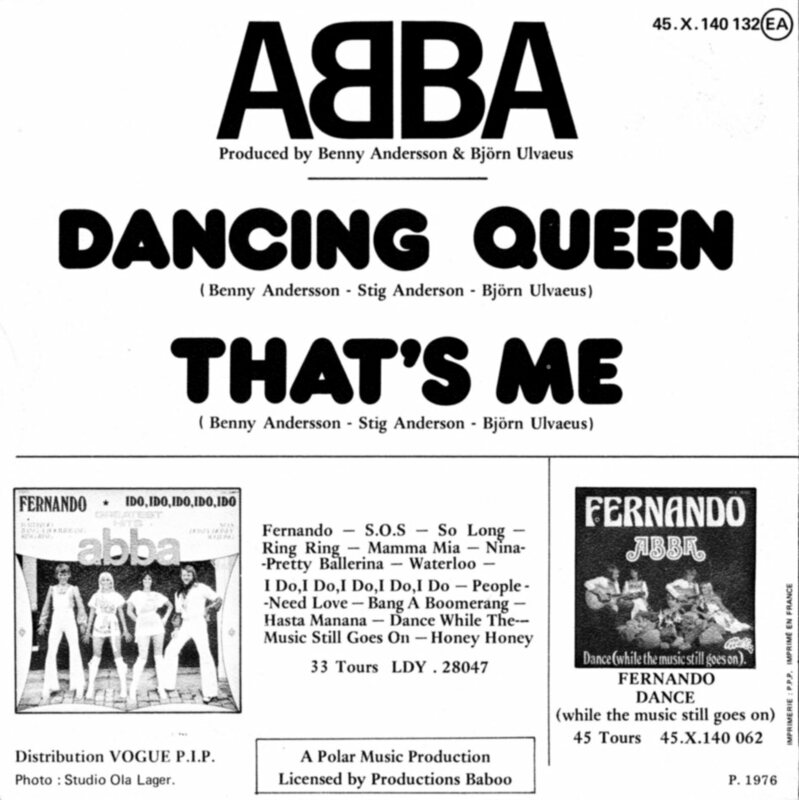 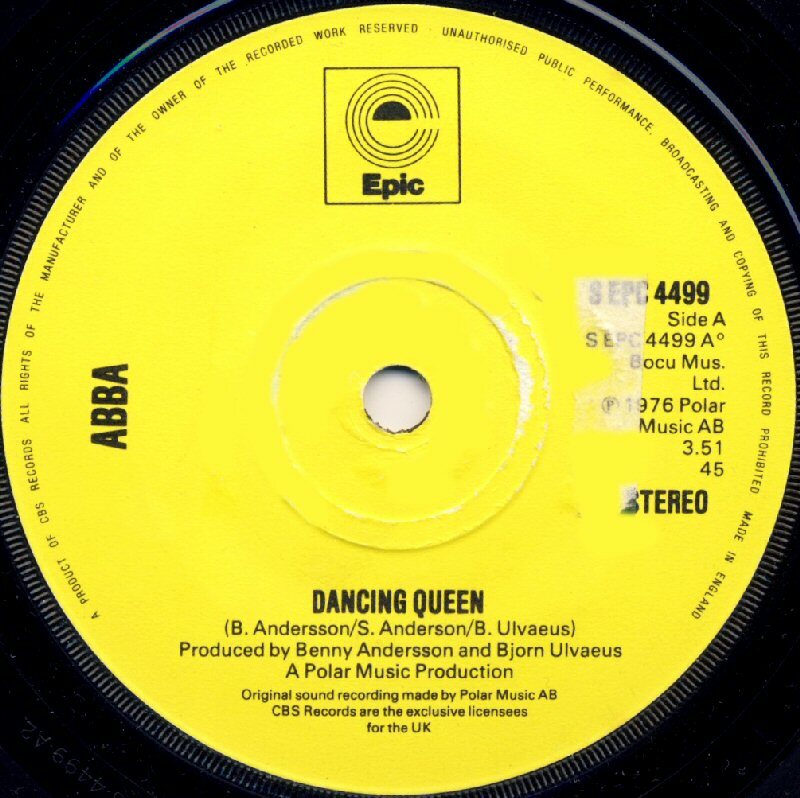 The first edition of the Australian single "Dancing Queen" was released with misprint on the cover, without the first "B" reversed. 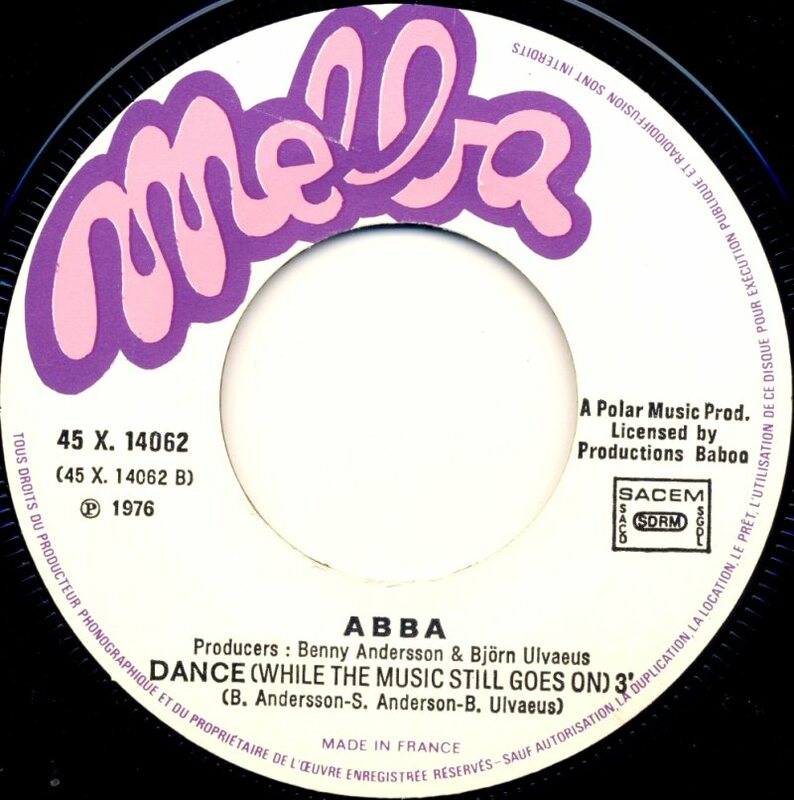 Presumably the first press of the single cover had been made shortly before ABBA's new logo was sent to the record companies. 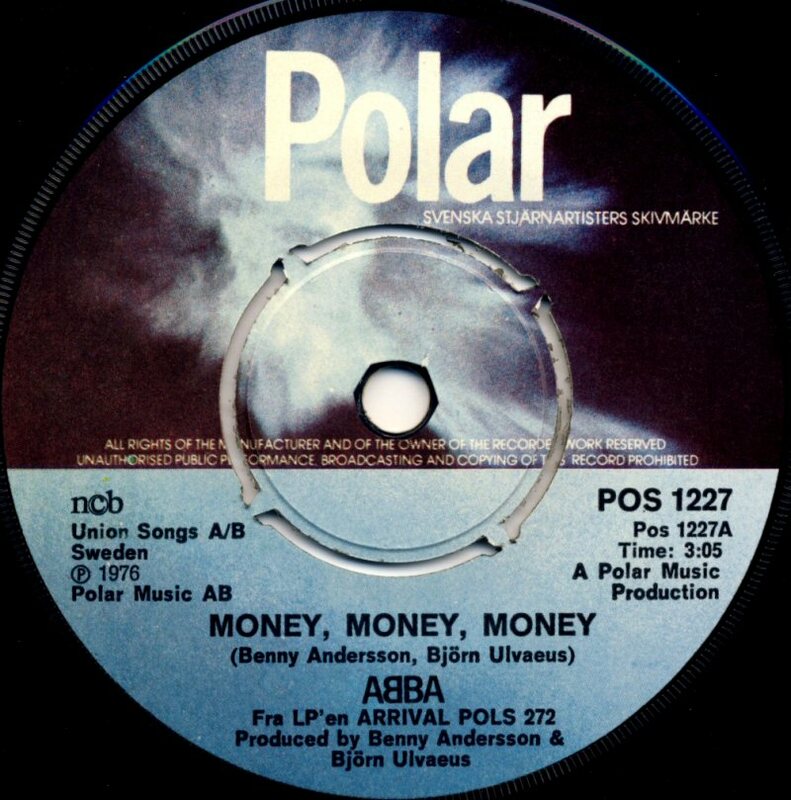 The first lot of singles was immediately deleted from the market and singles with the right cover version were distributed out to the record stores the same day. 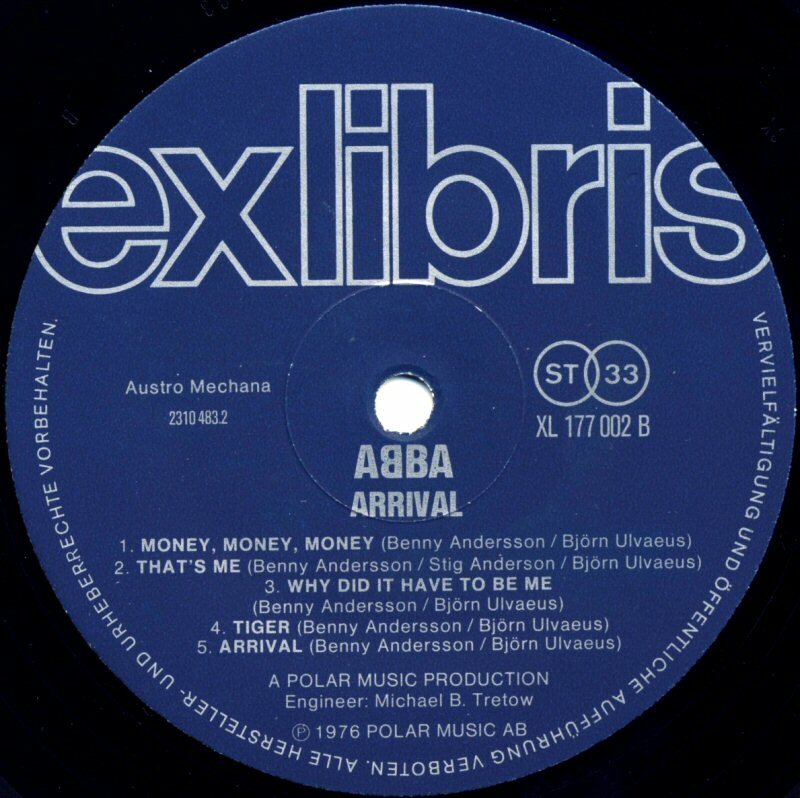 The wrong cover version of the single became one of the most wanted ABBA rarities among ABBA collectors. 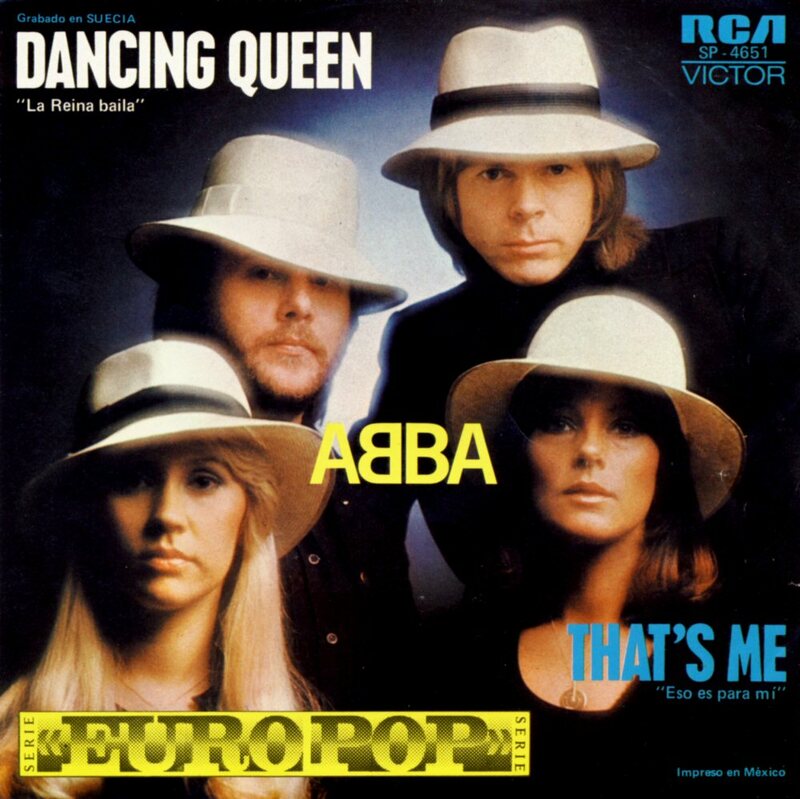 "Dancing Queen" became a number 1 hit even in Mexico where the single was released in the series "Europop". 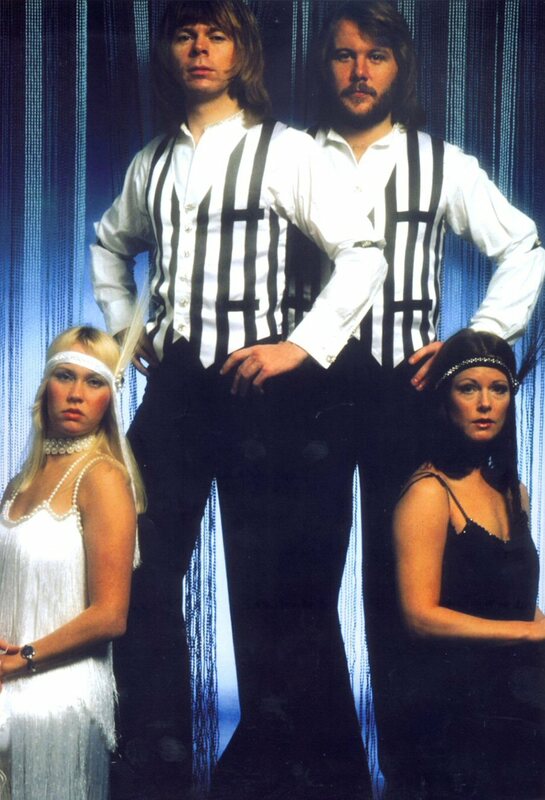 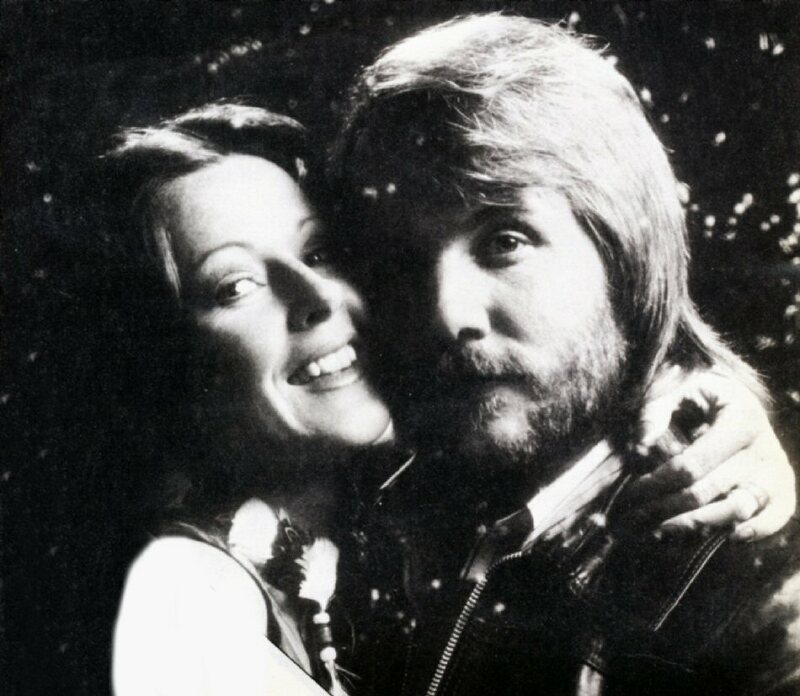 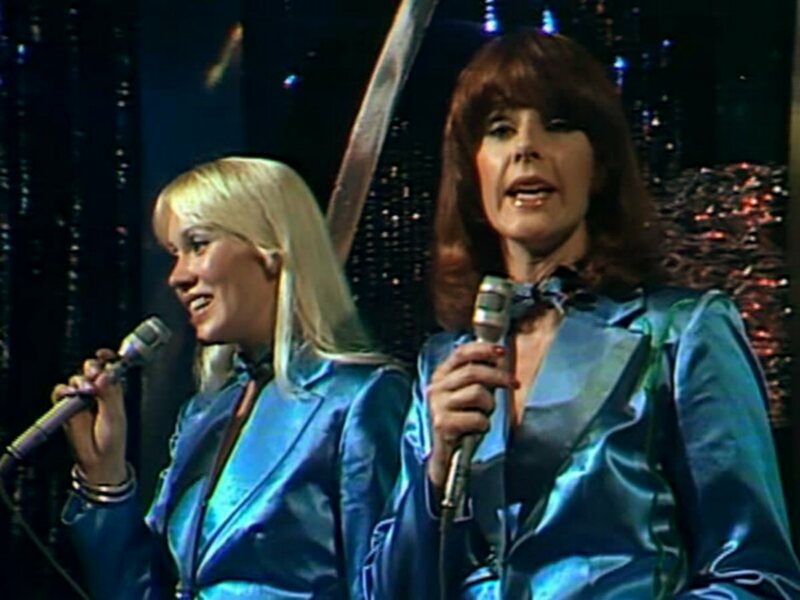 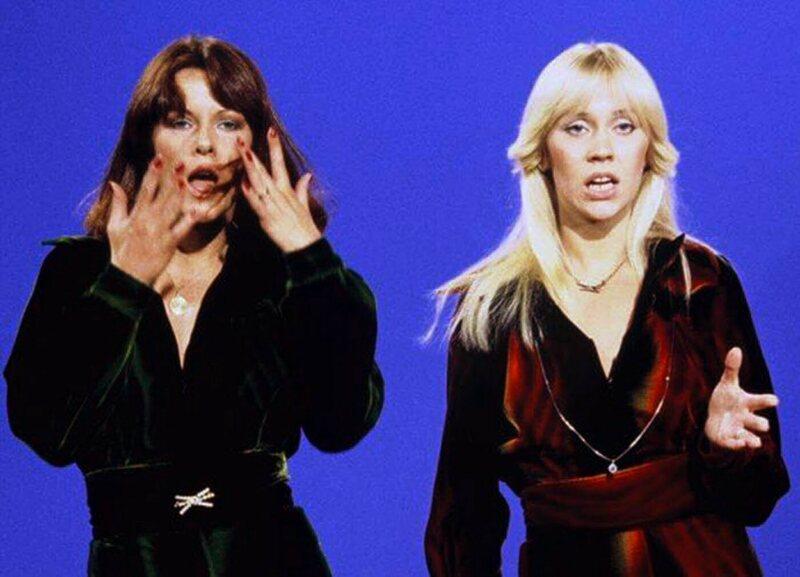 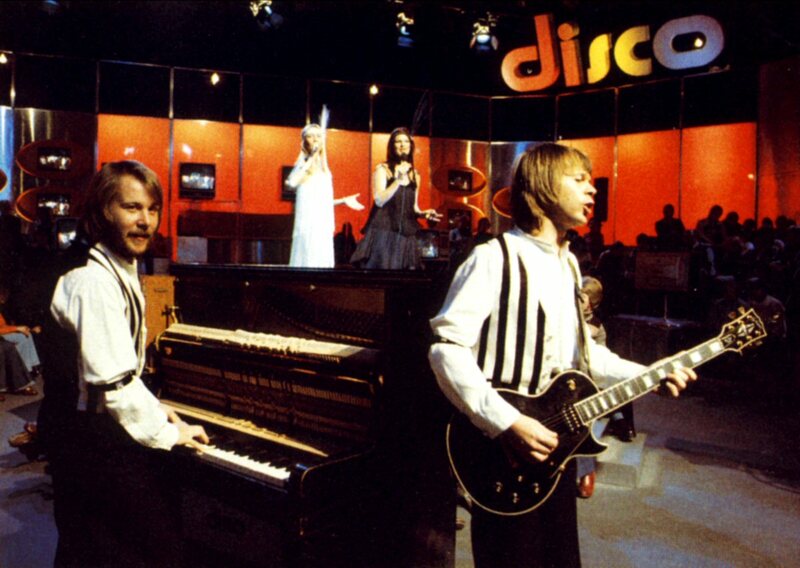 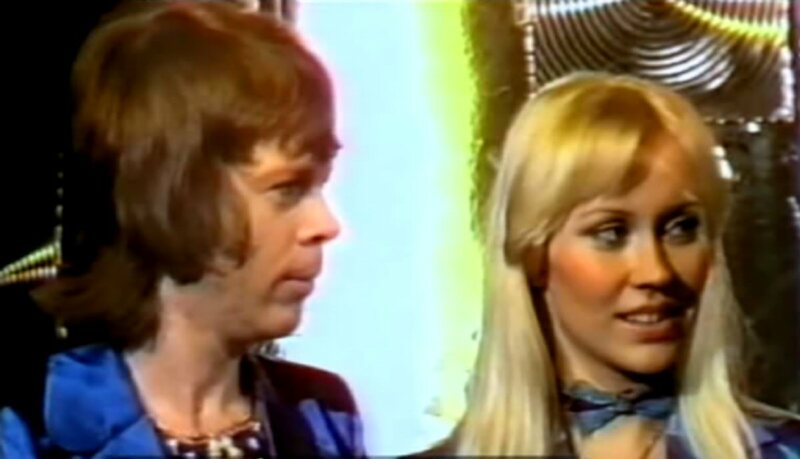 The Danish compilation in the series "Disco drönet" featured two songs written by Benny and Björn: ABBA's smash hit "Dancing Queen" and "Funky Feet" performed by Svenne & Lotta. 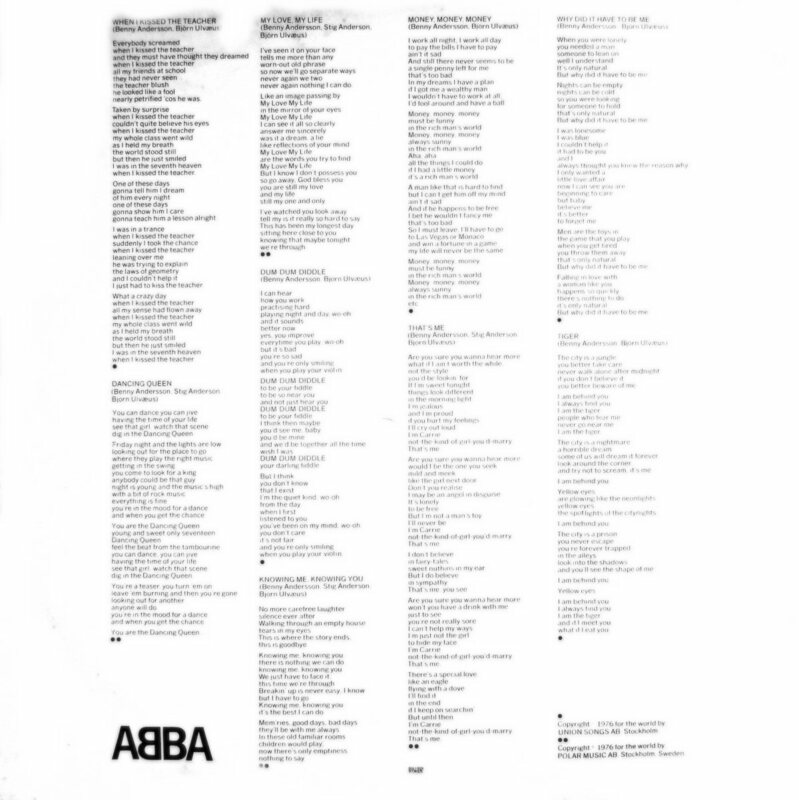 The compilation saw its release at the end of 1976. 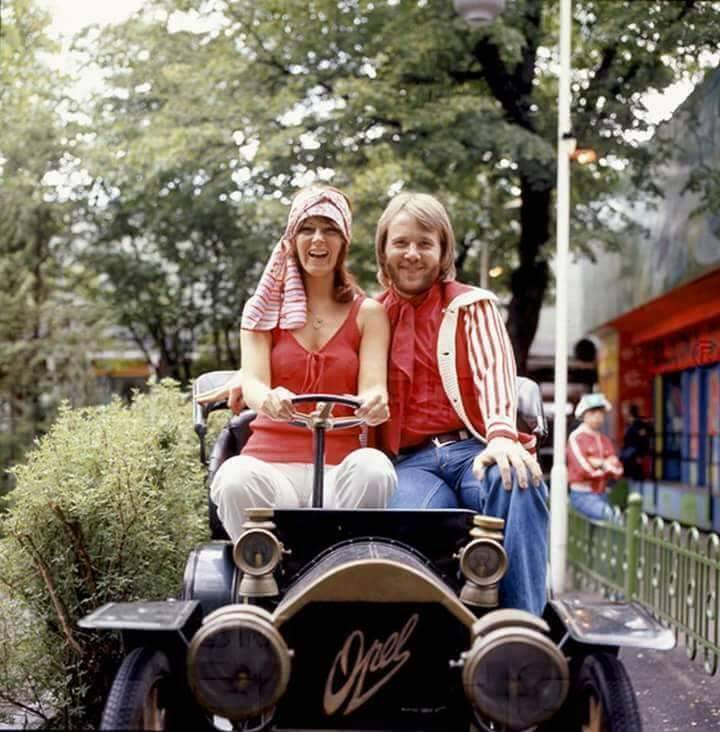 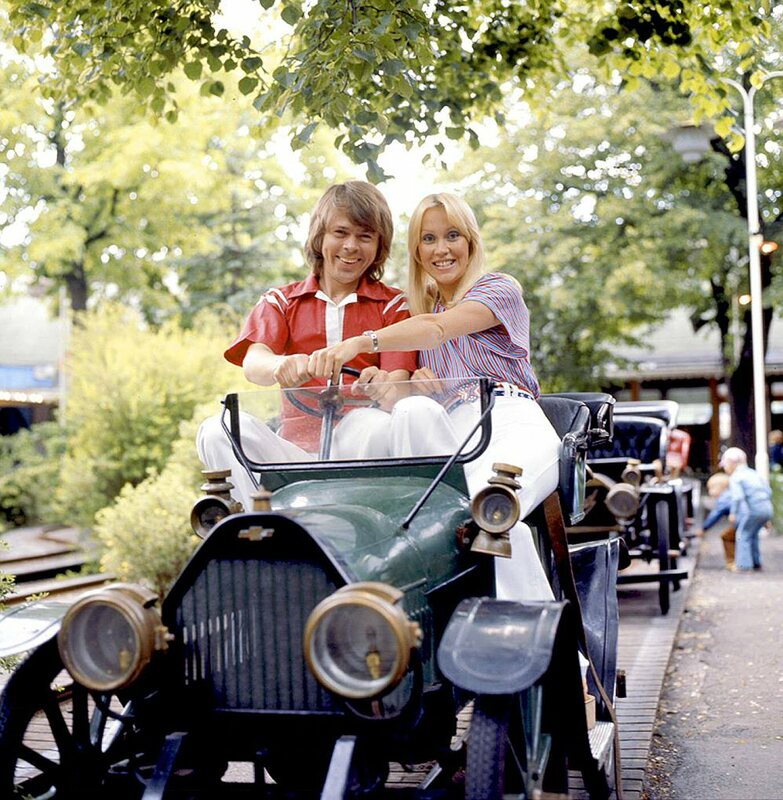 These pictures were taken someday in the summer 1976 in the amusement park Gröna Lund in Stockholm. 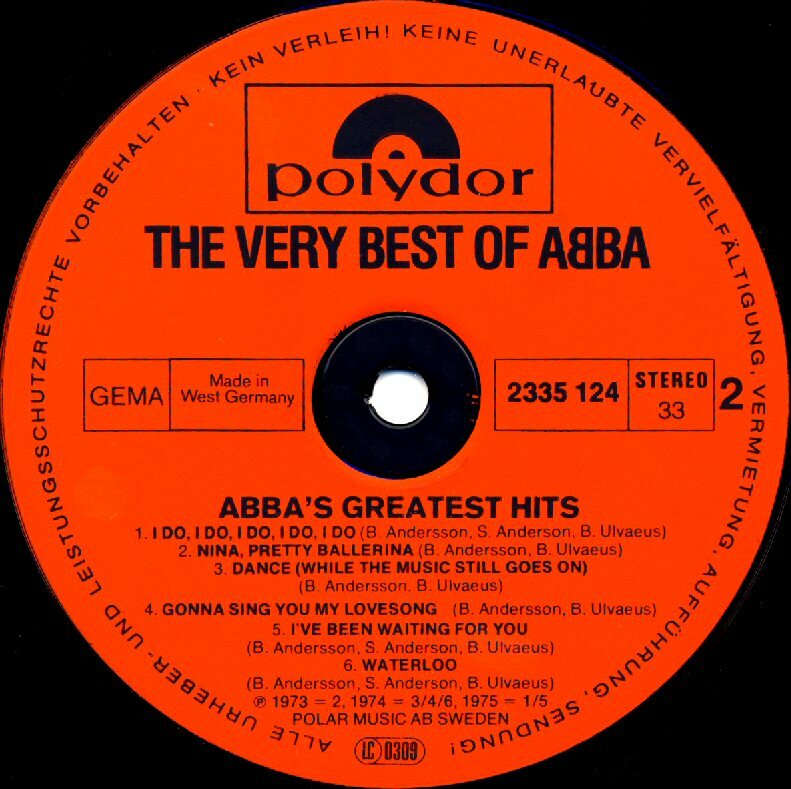 After the great success of "Fernando", Polydor in West Germany re-released the compilation "The Best of ABBA" with partly new, more "shiny" cover (the photo was though the same as on the first version of the album) and the new ABBA logo with one B reversed. 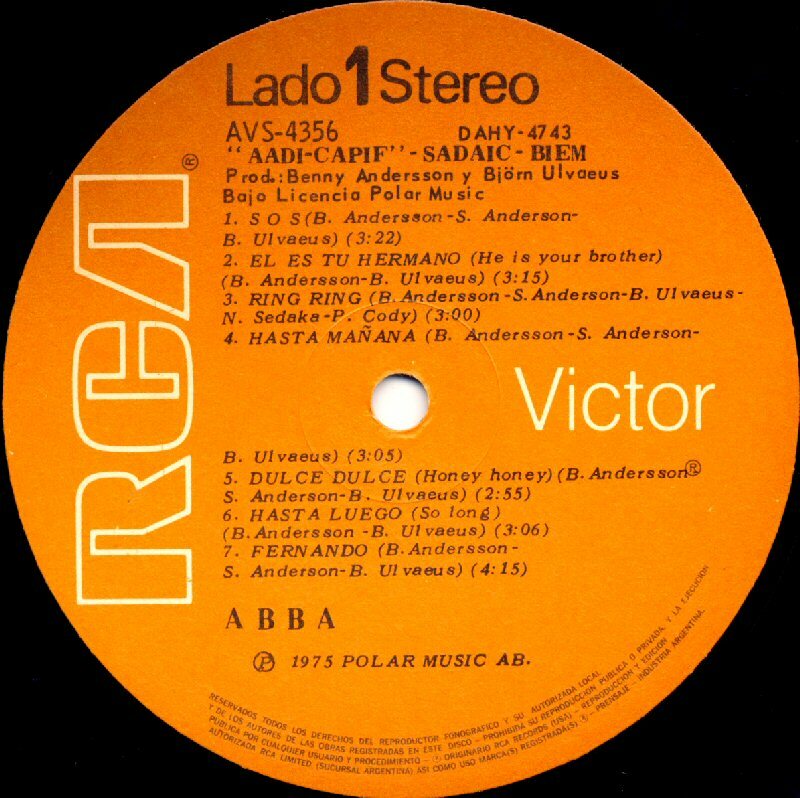 The track listing was partly changed and it included even "Fernando". 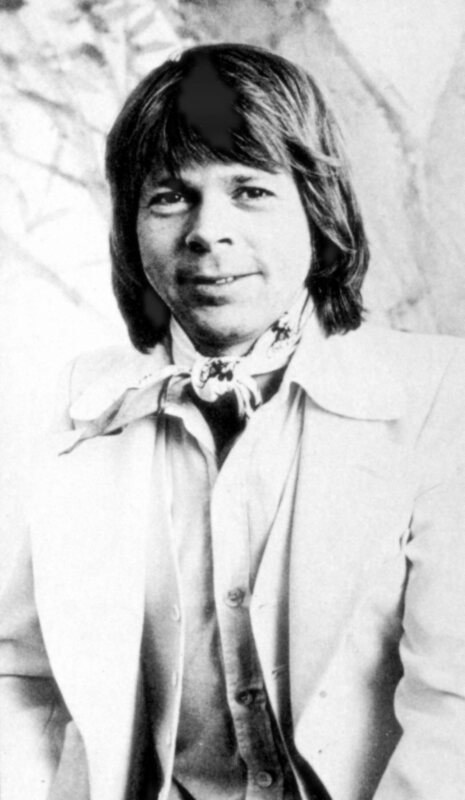 Swedish singer Jerry Williams released his version of the song "Rikky Rock'n Roller" on the album "Kick Down". 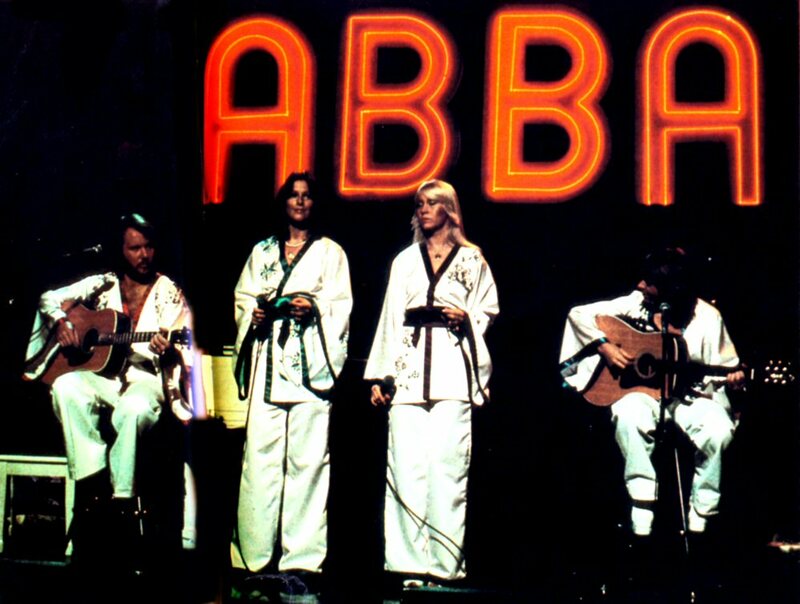 The song had been originally recorded by ABBA in 1974 but never released. 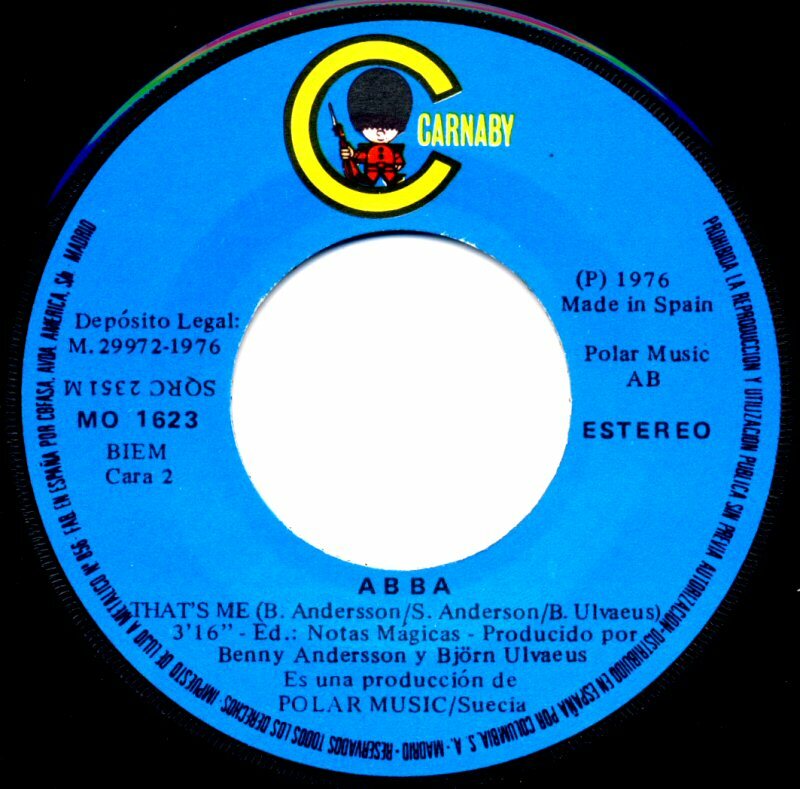 In 1994 a part of this song performed by ABBA saw its release in the "Undeleted medley" on CD in the ABBA Box "Thank You For The Music". 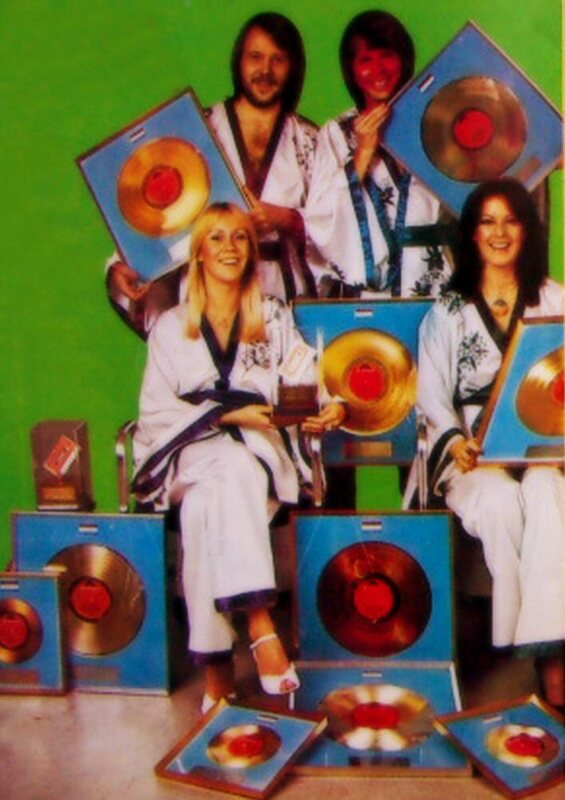 The compilation double LP entitled "Golden Double Album" saw its release in France on August 25, 1976. 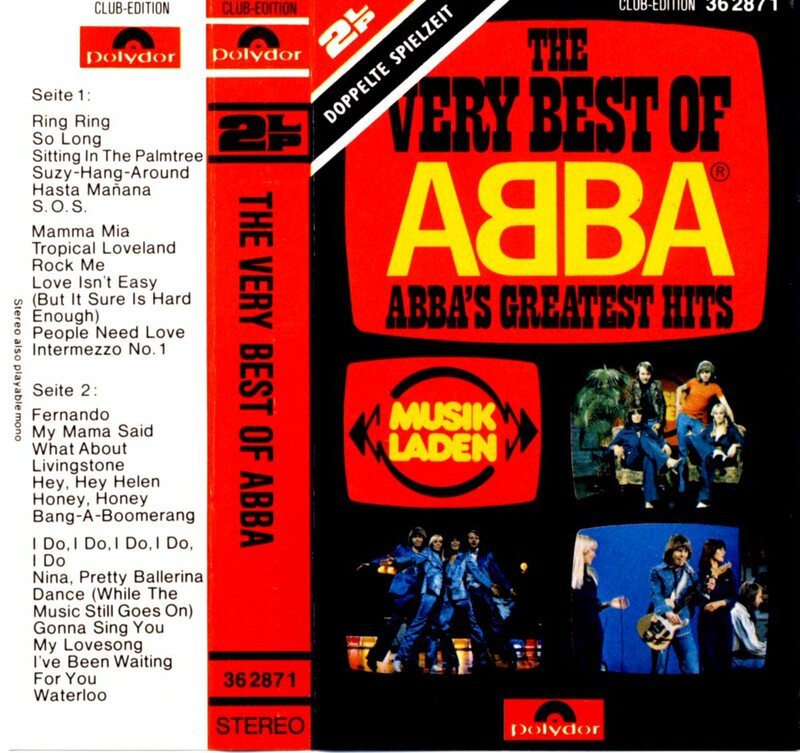 The album contained 24 tracks some of them relatively unknown for French fans from the "Ring Ring" album which was still unavailable outside Scandinavia. 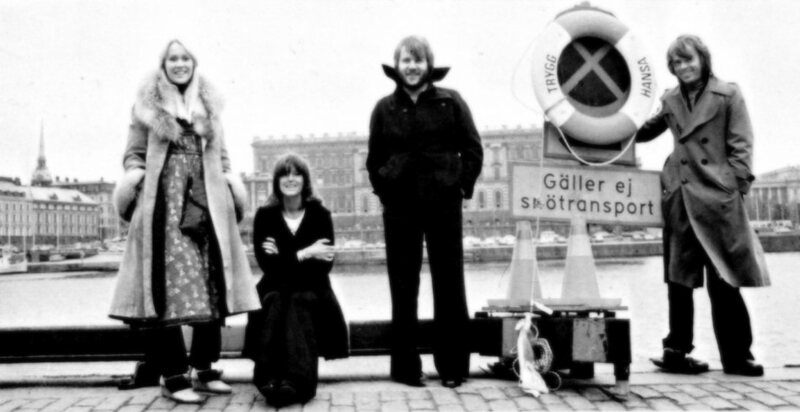 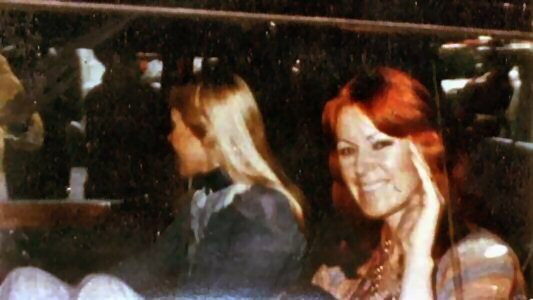 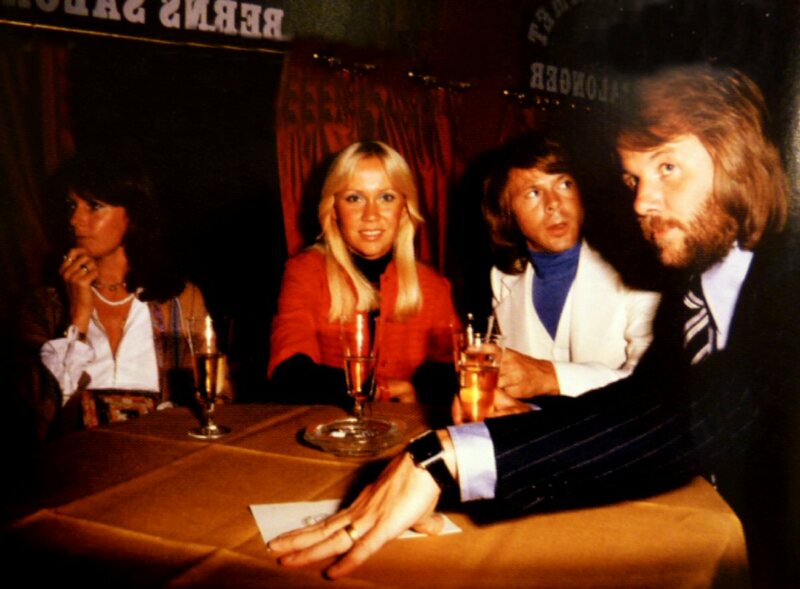 On August 30th, 1976 ABBA went to see "Lasse Berghagen show" at Berns in Stockholm. 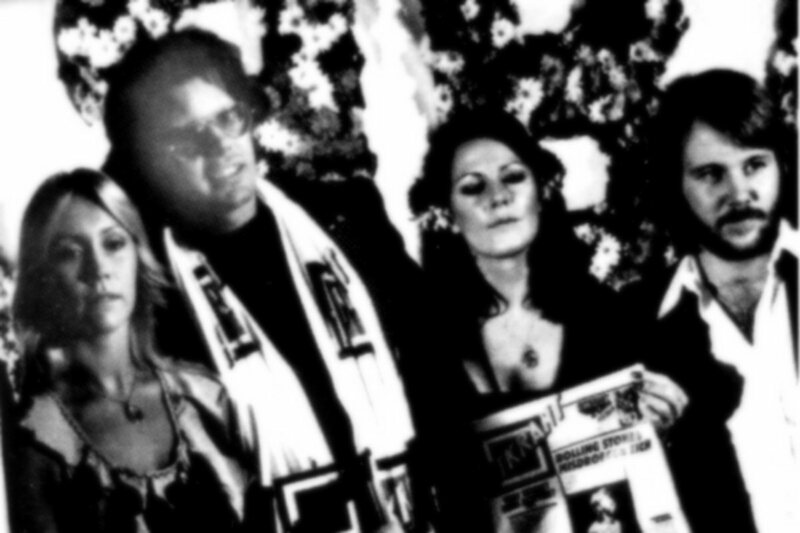 The Bravo team from West Germany was in Stockholm in September for new photo sessions. 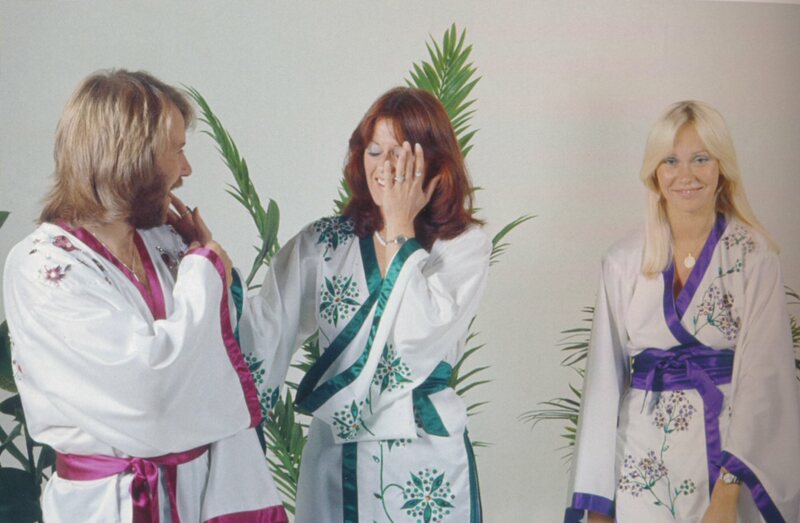 Hundreds photos in different outfits were taken. 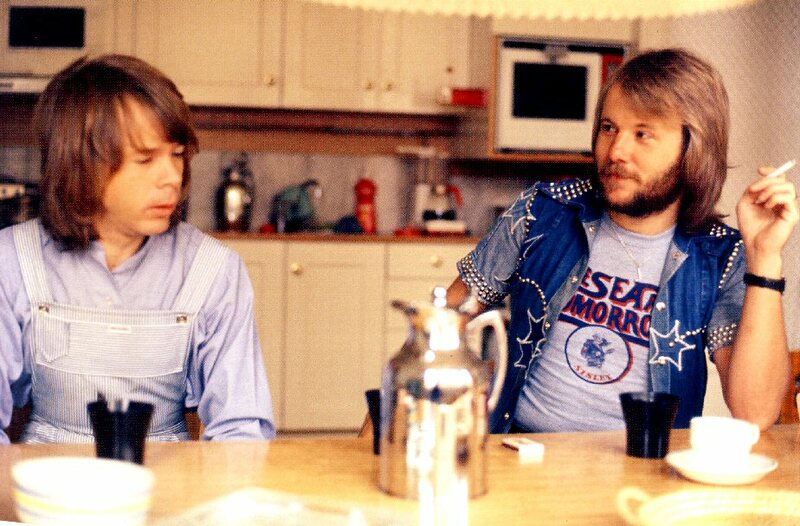 In September Björn and Benny were putting last touches on the forthcoming new album "Arrival". 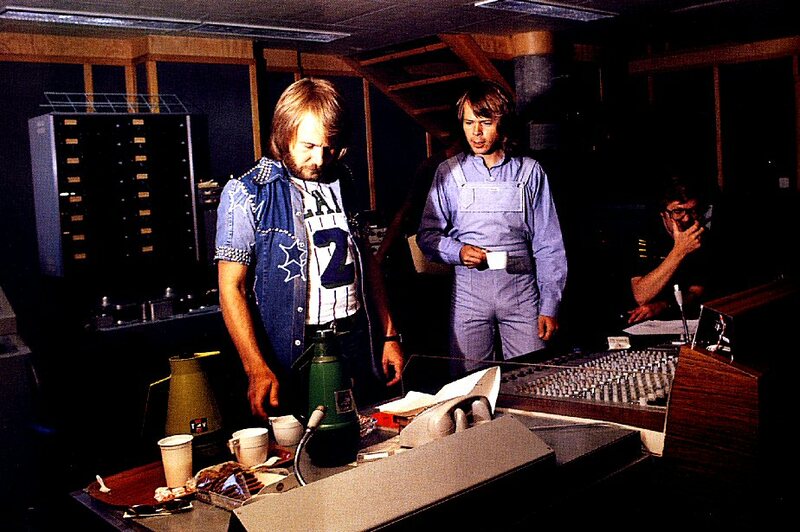 Together with Mikael B. Tretow they were in Metronome Studio in Stockholm where several pictures were taken. 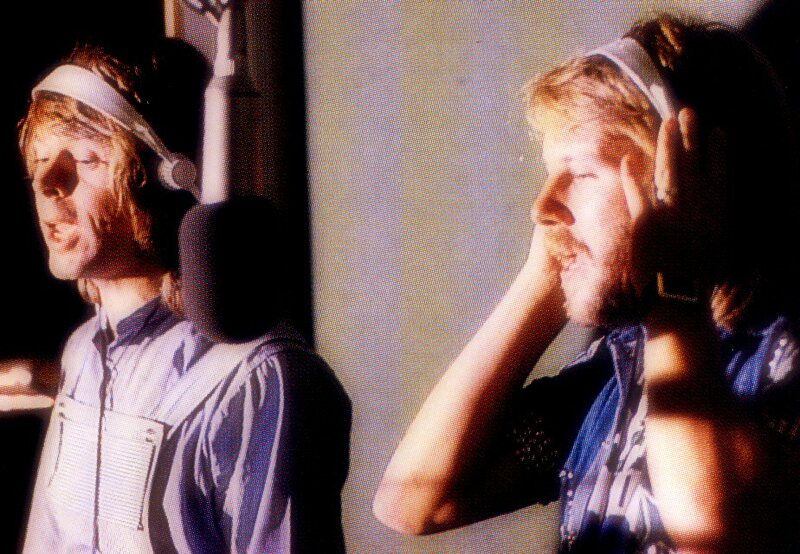 They even let the Bravo photographer take pictures in front of microphones but as all material had been already recorded so it seems to be a fake recording session. 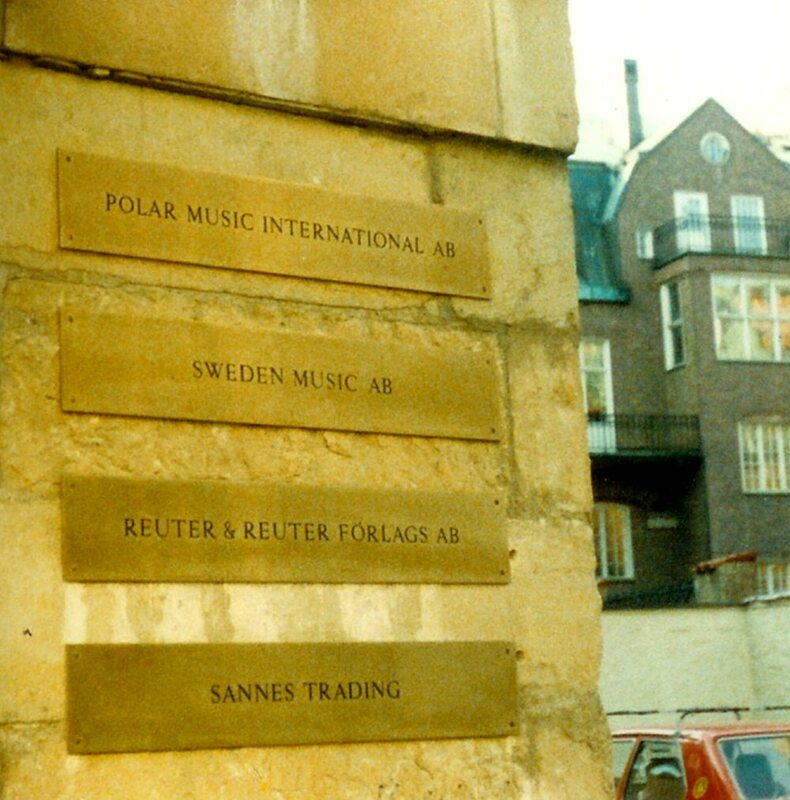 Some photos were taken at the Polar Music office another day. 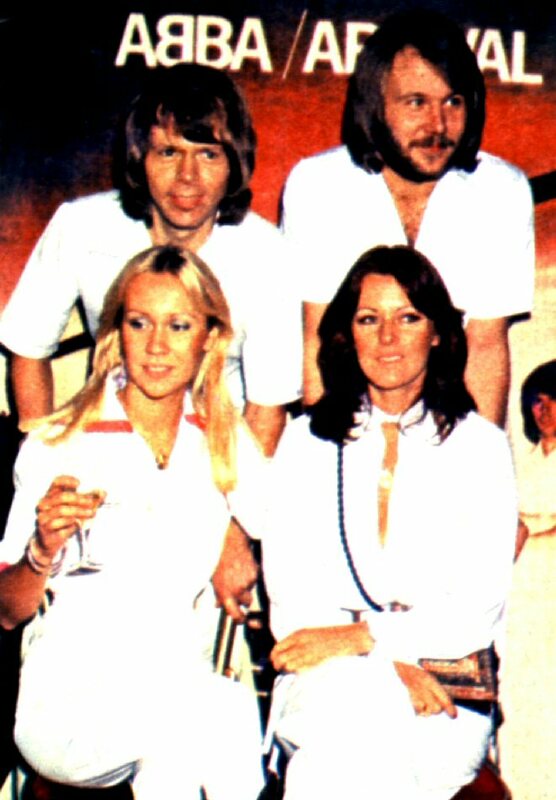 On September 1st, ABBA attended the premiere of a new show of Lasse Berghagen at Berns in Stockholm. 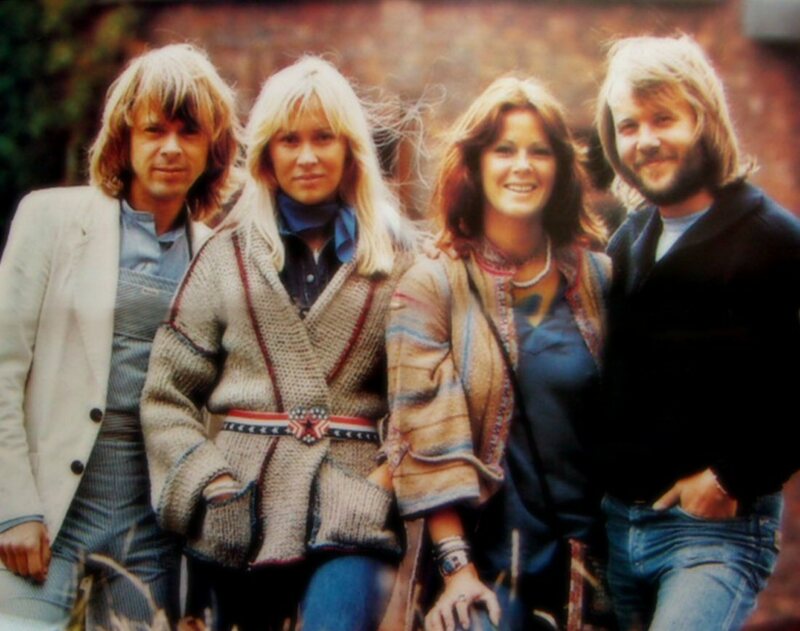 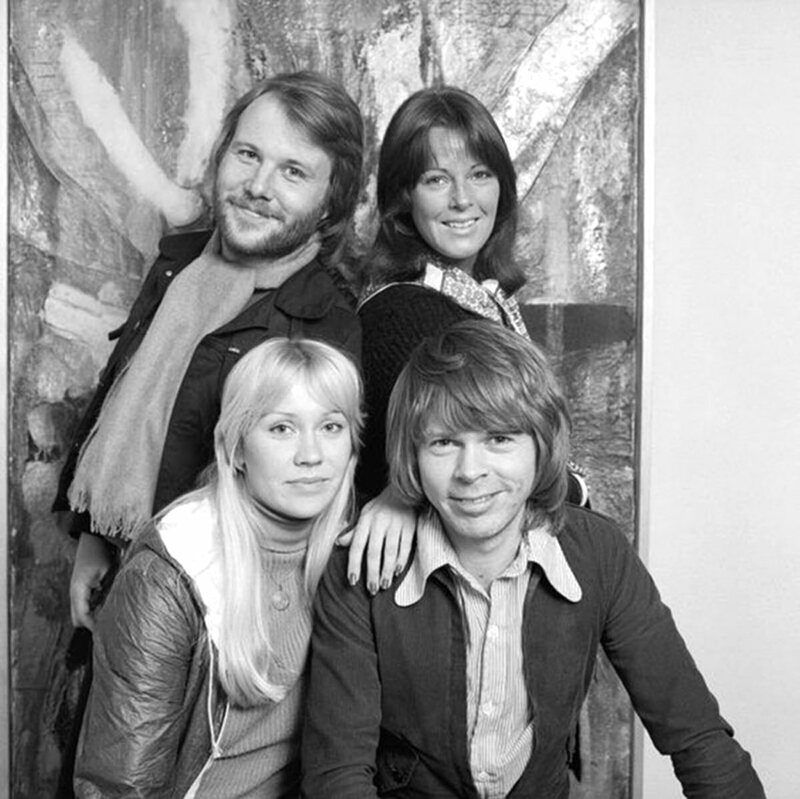 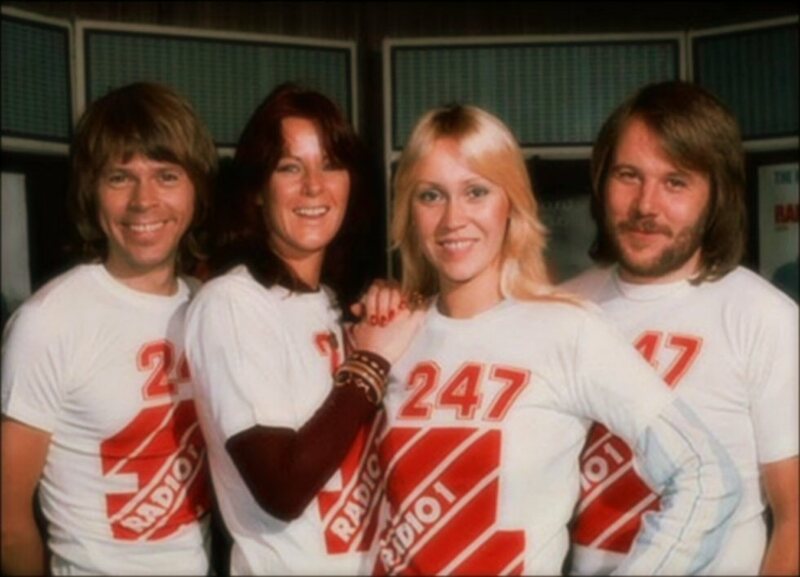 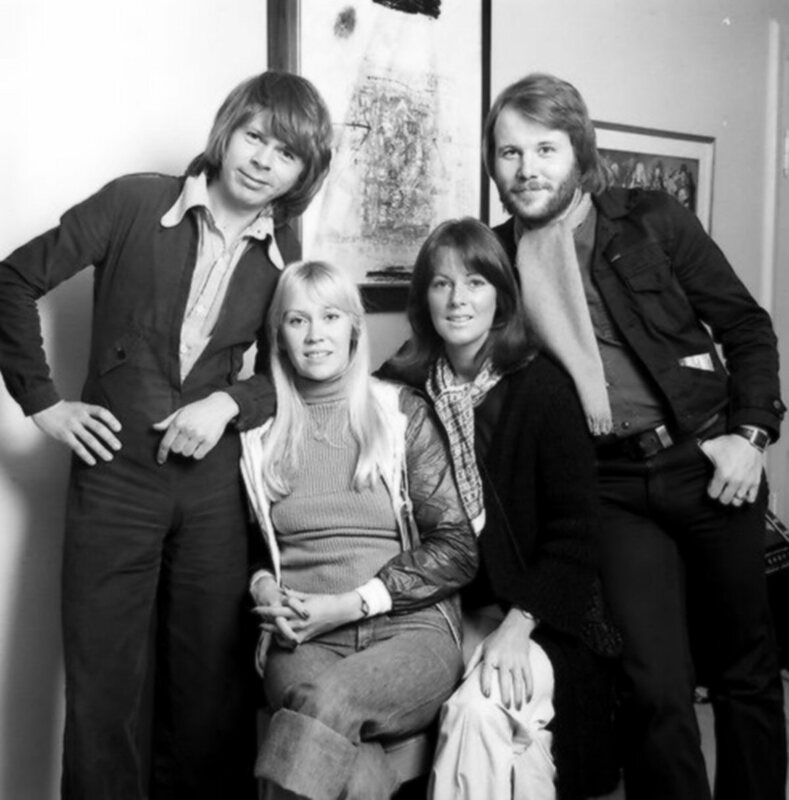 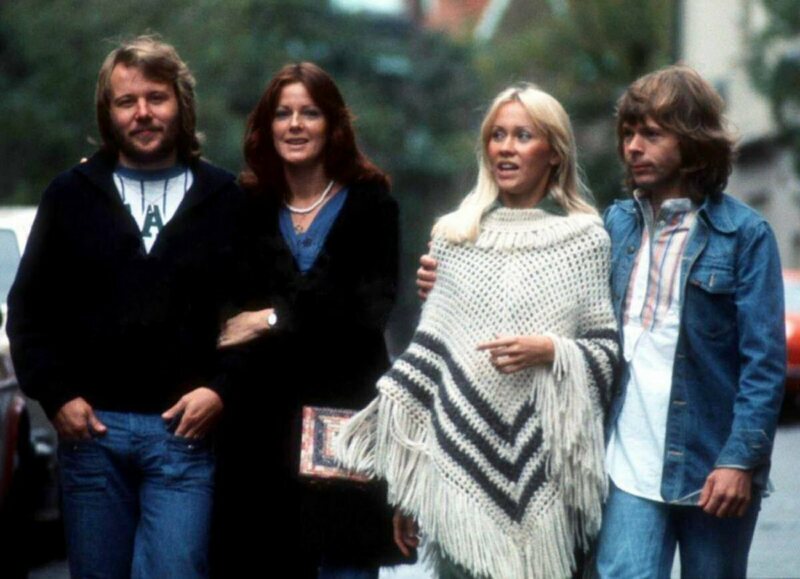 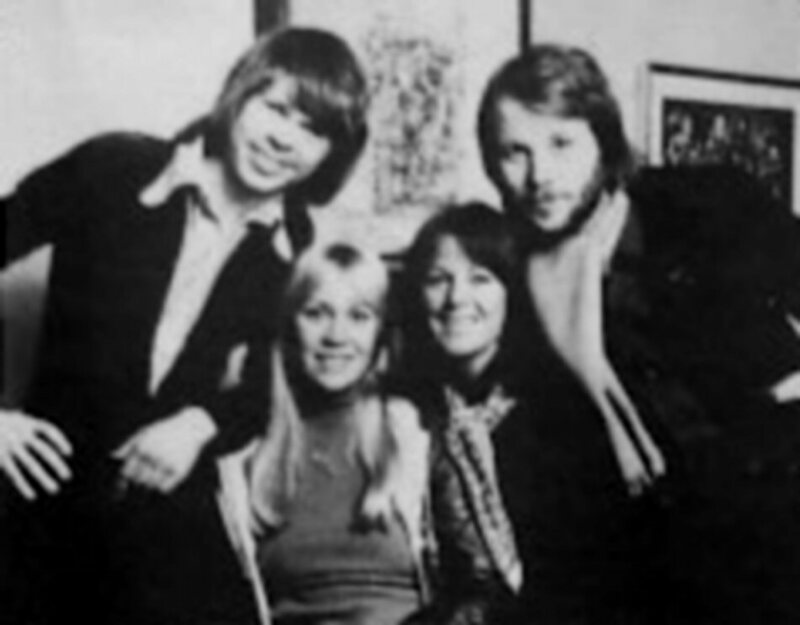 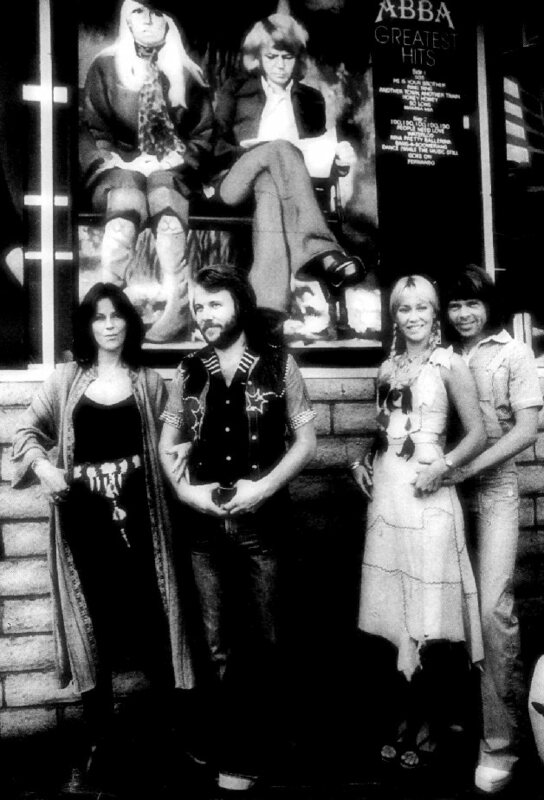 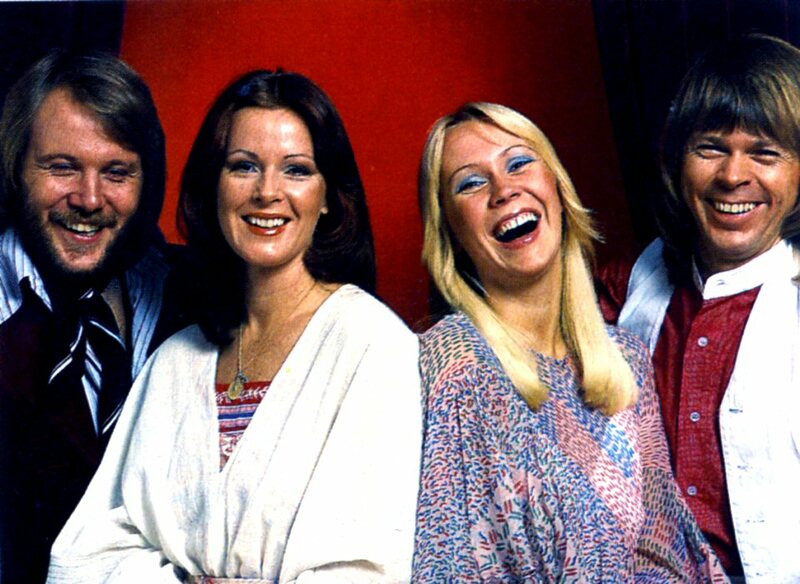 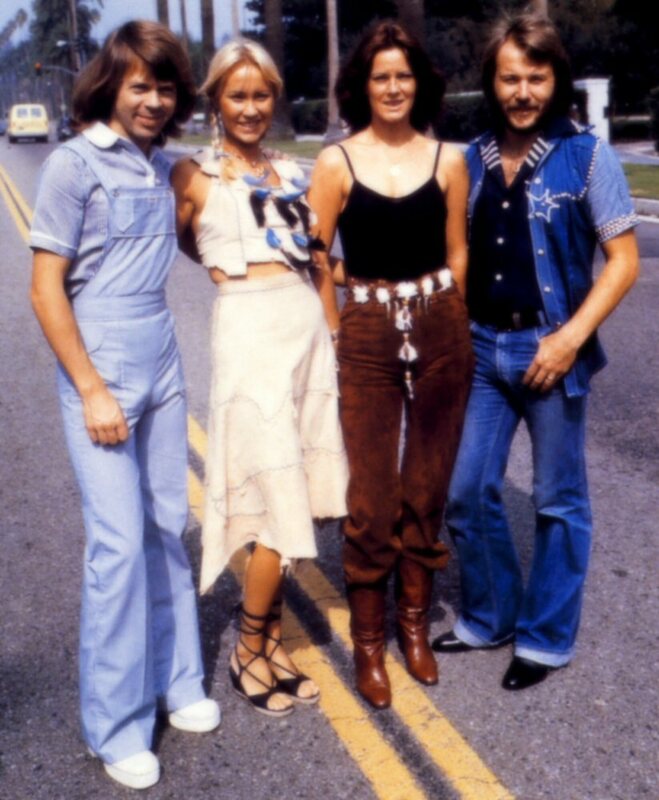 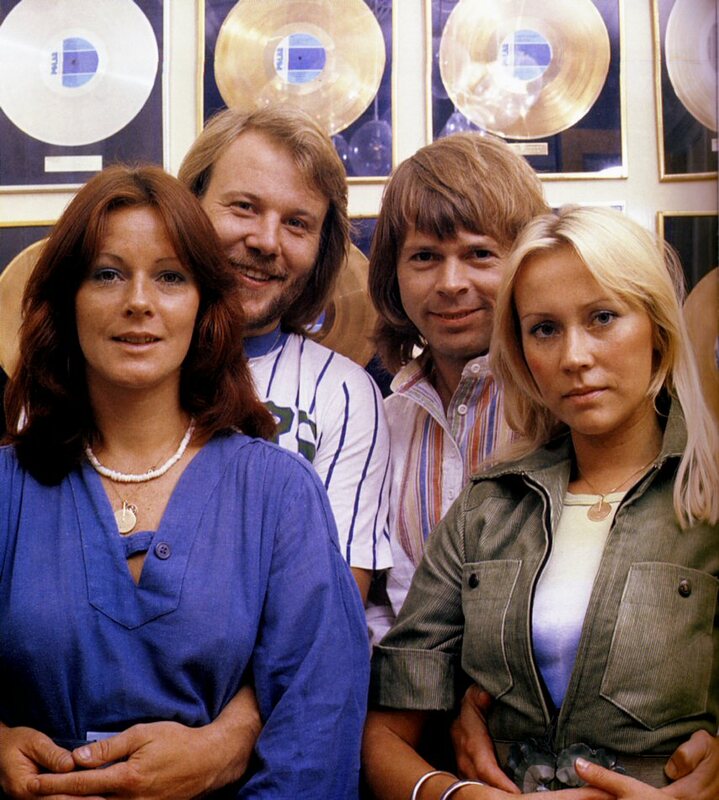 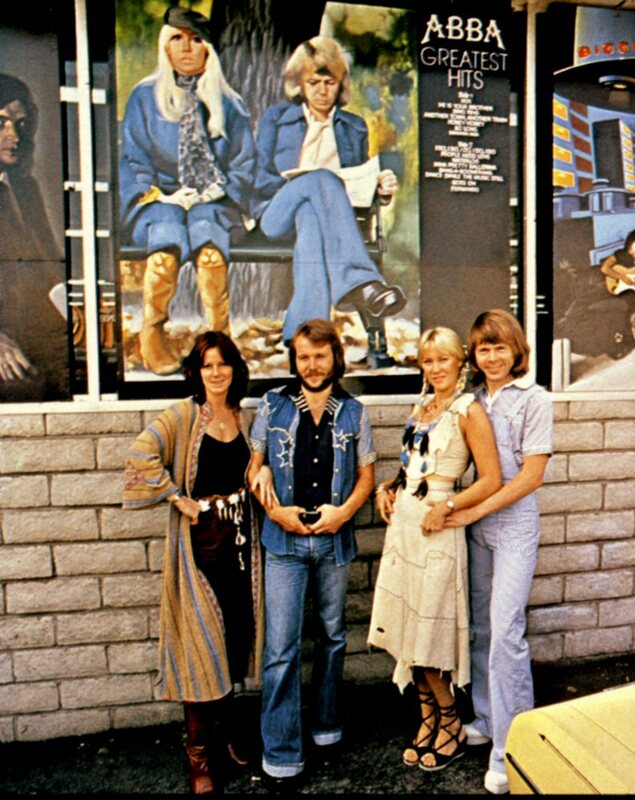 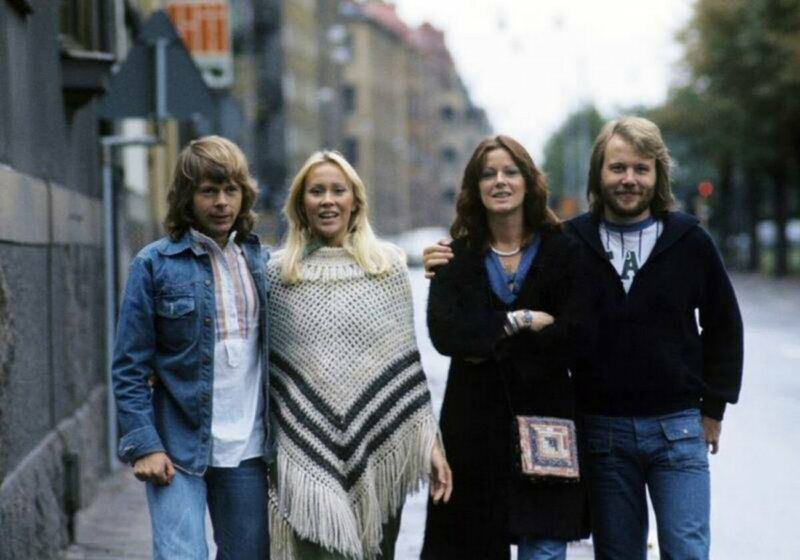 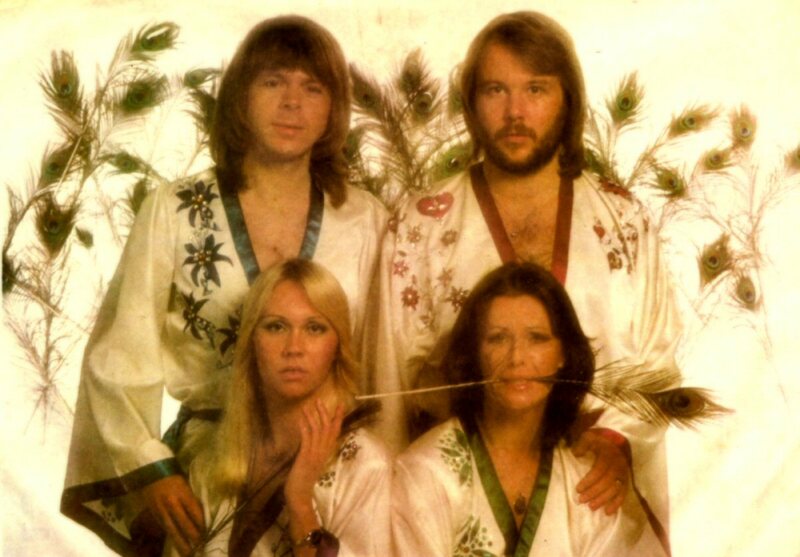 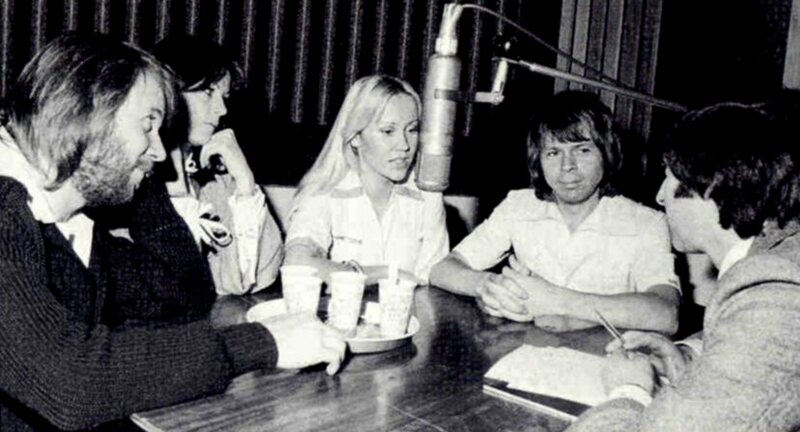 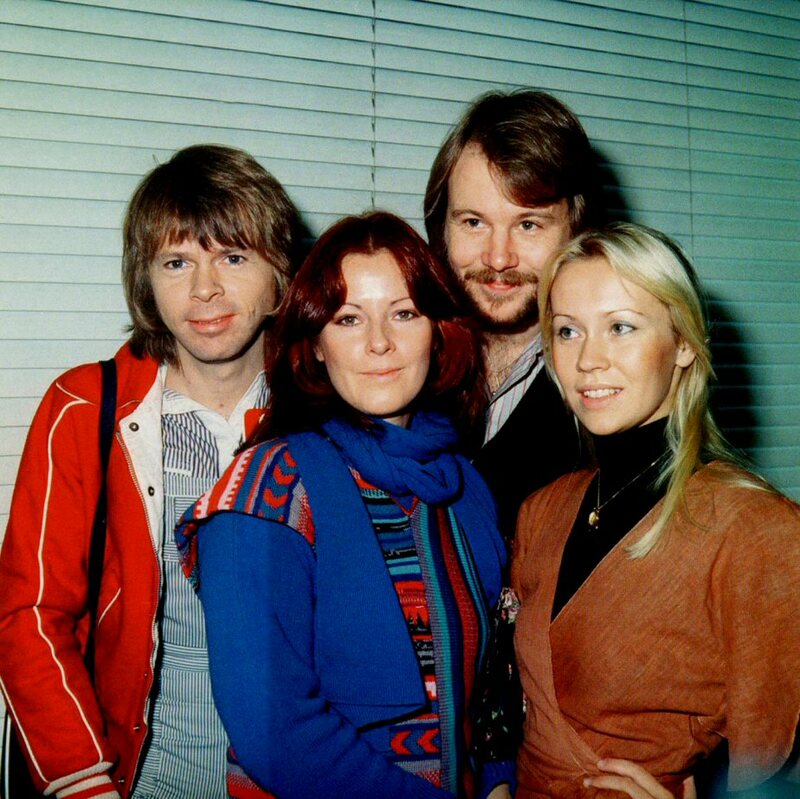 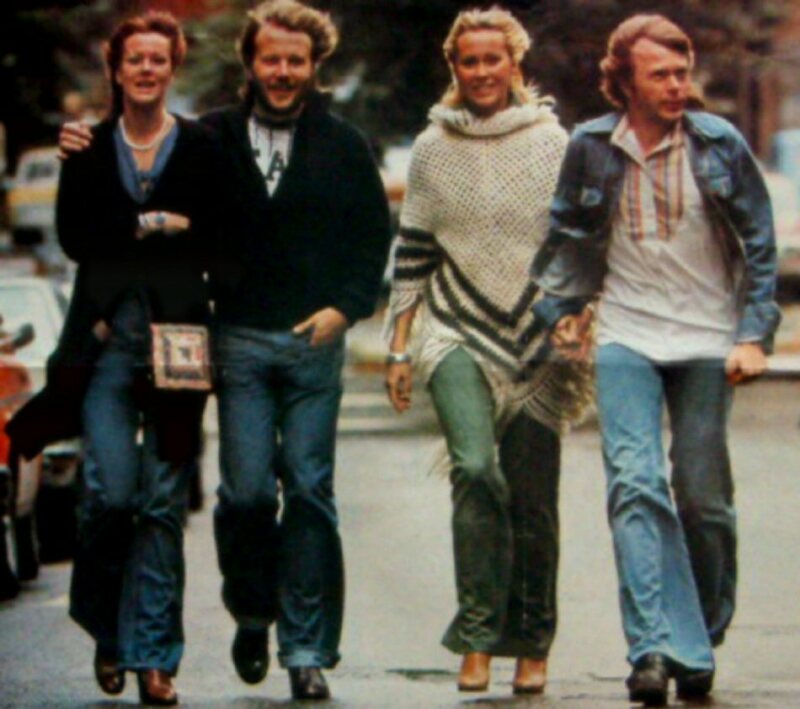 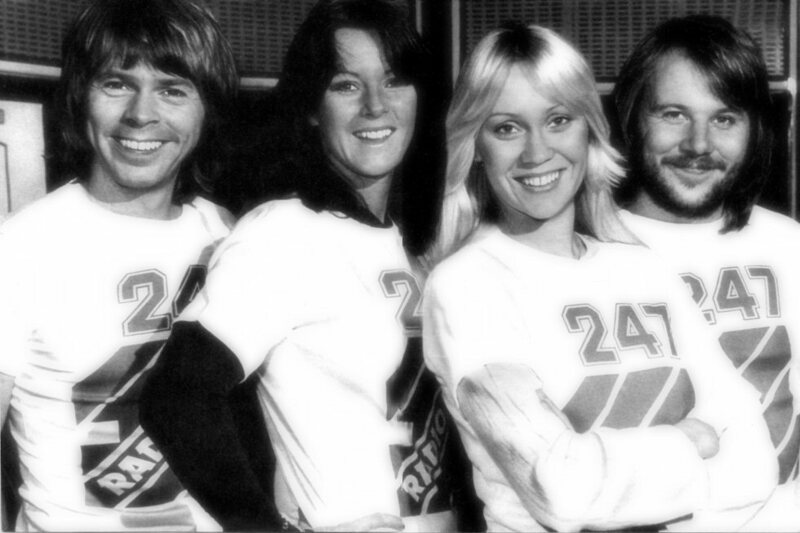 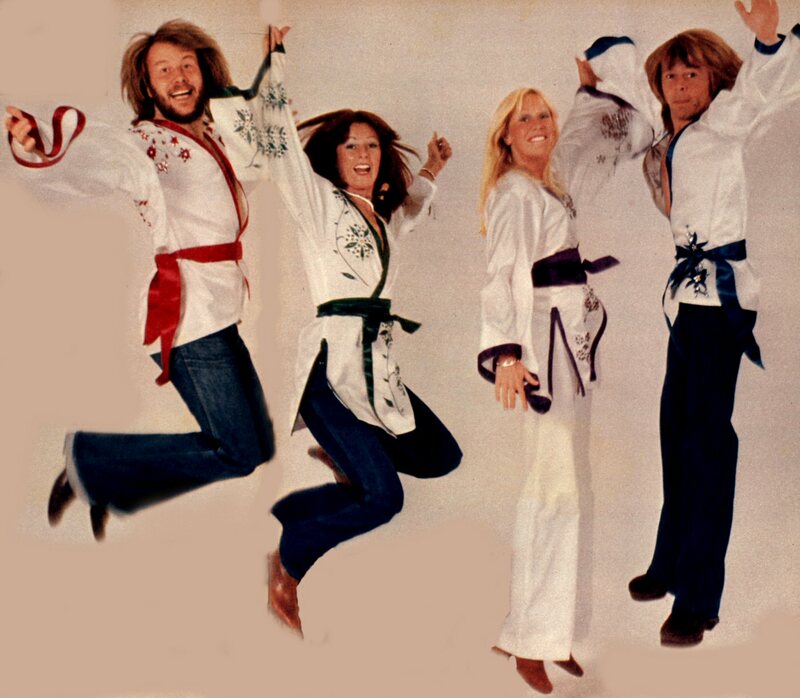 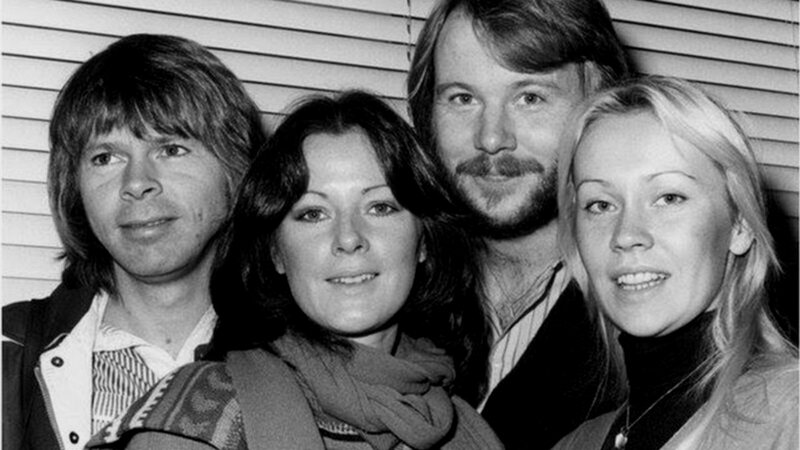 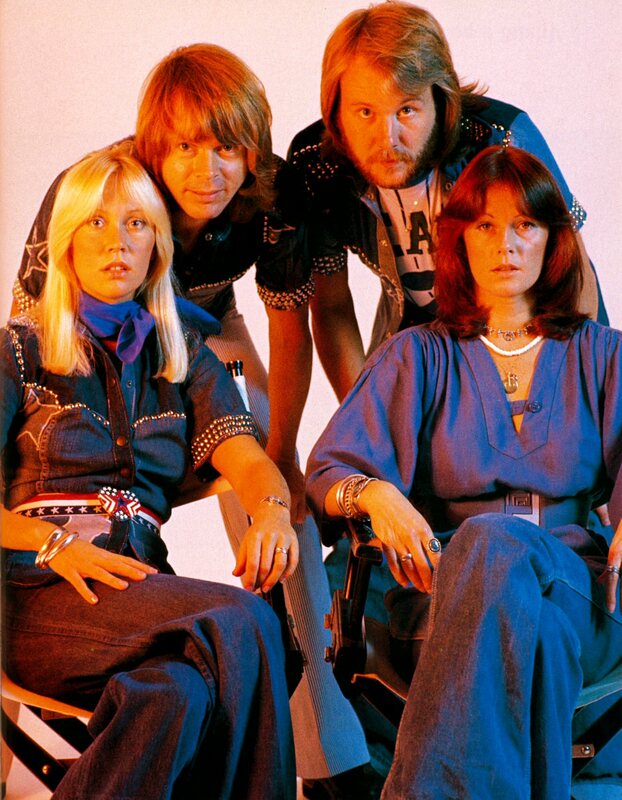 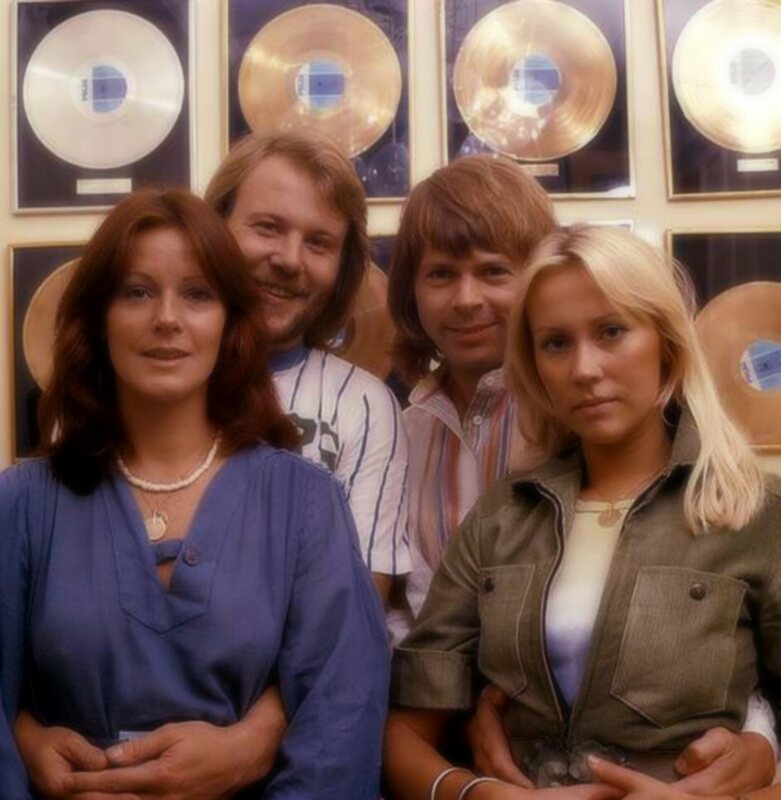 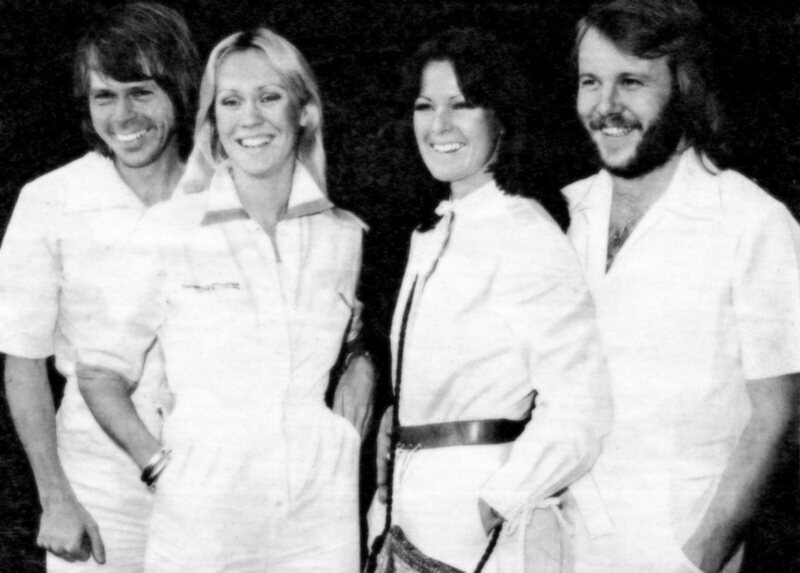 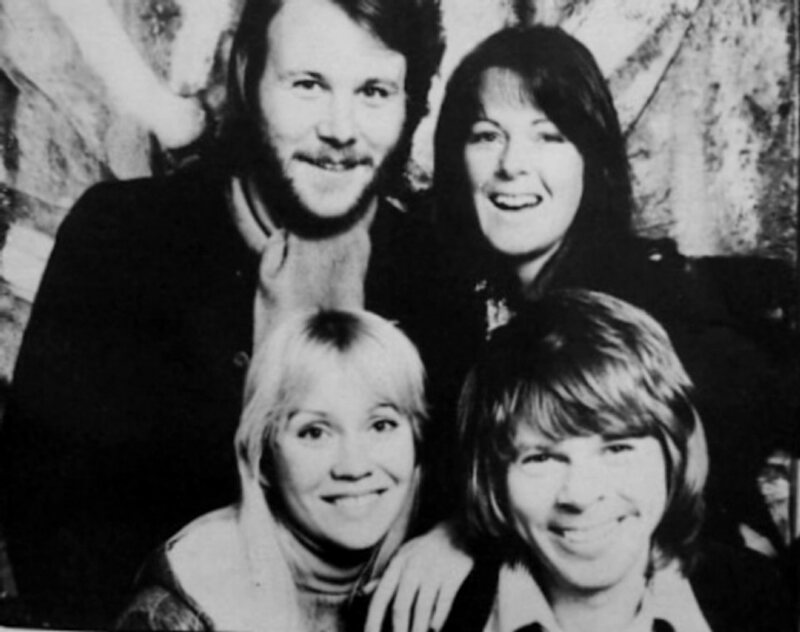 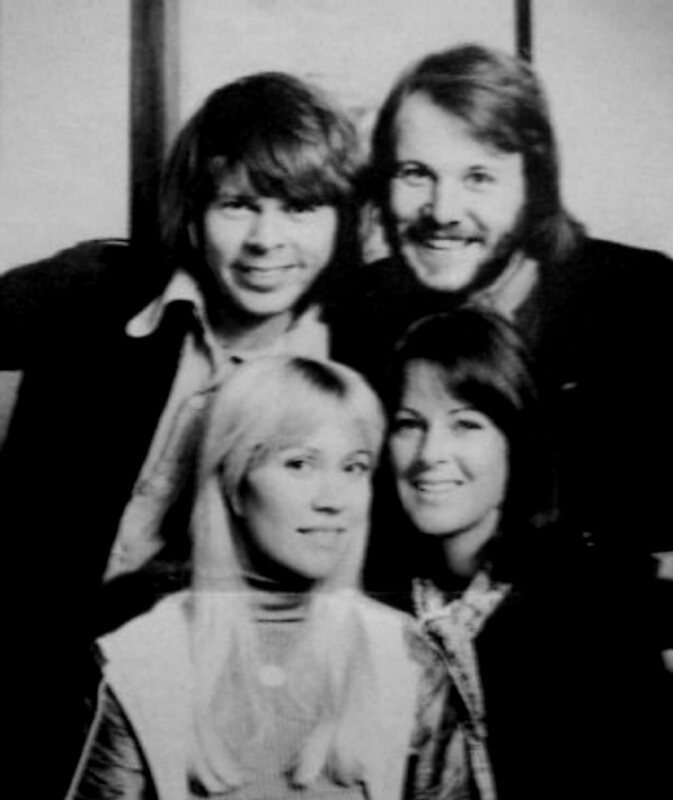 At the beginning of September the four members of ABBA recorded four one-hour-shows for the Swedish radio. 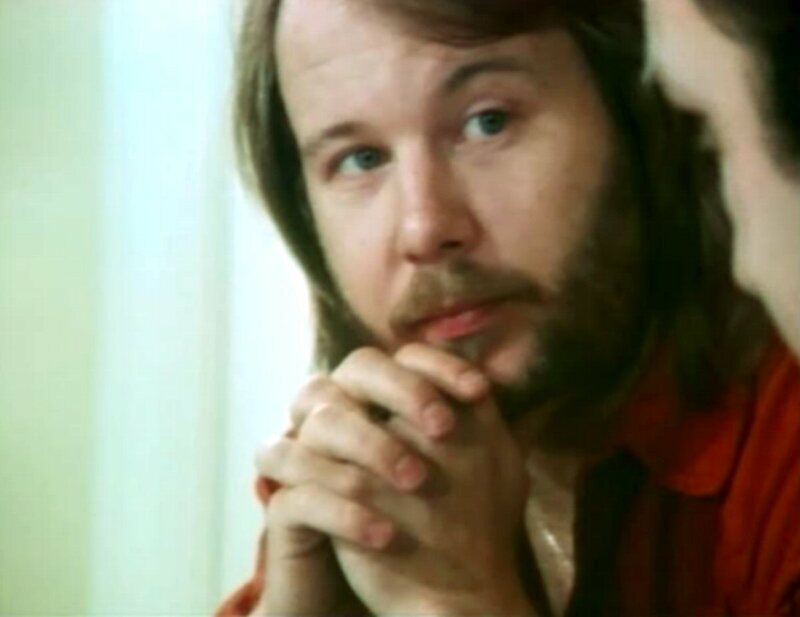 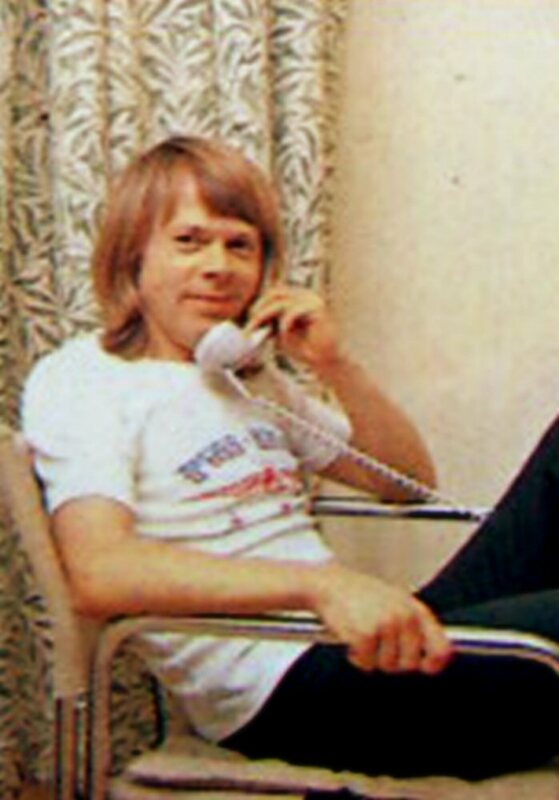 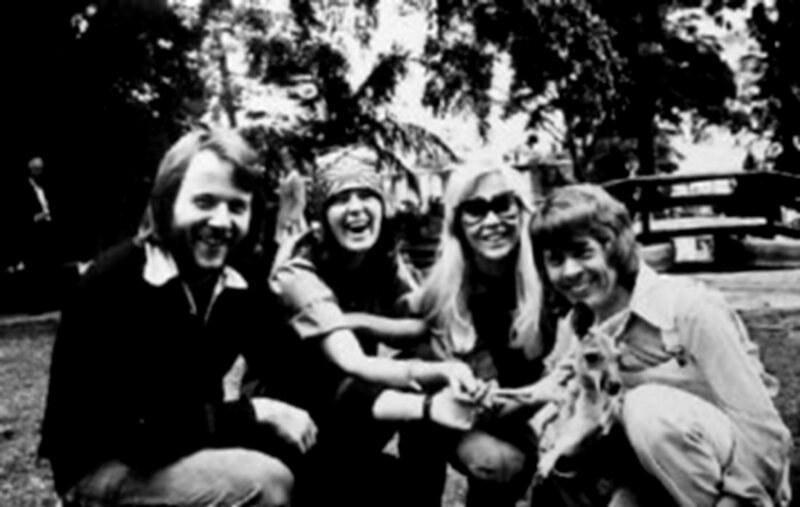 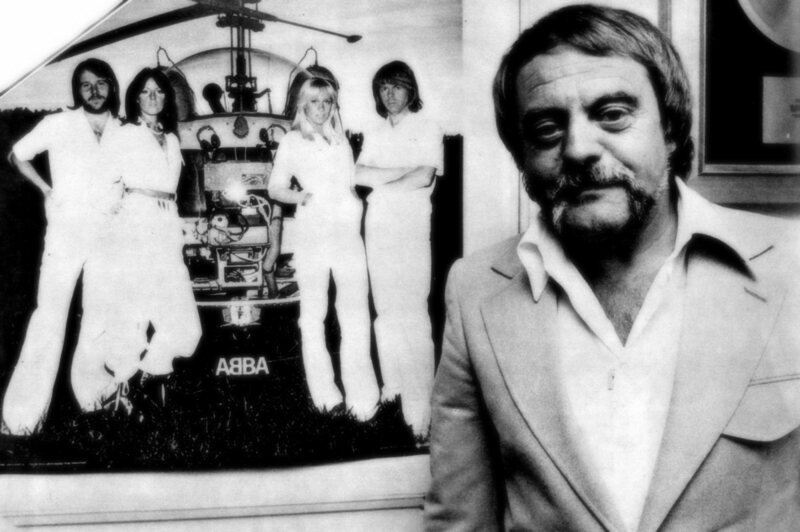 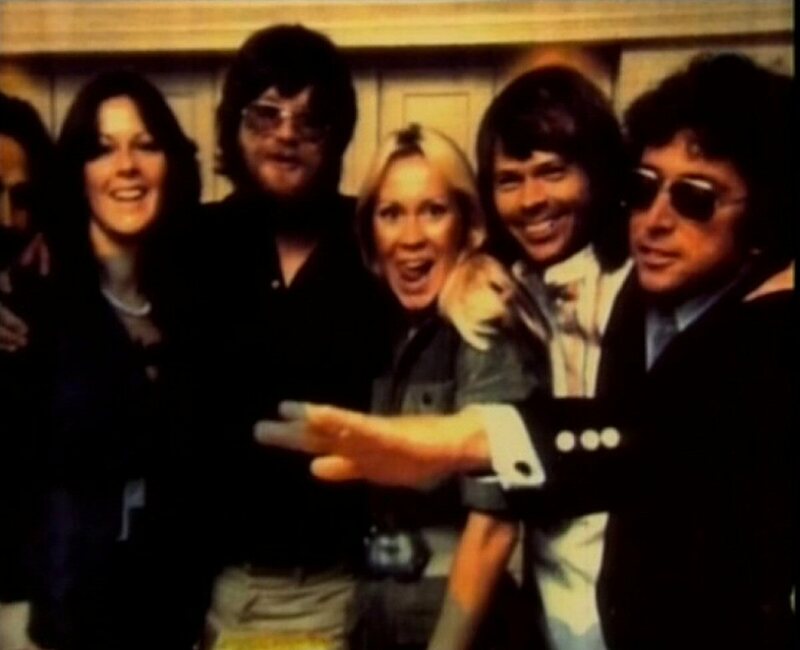 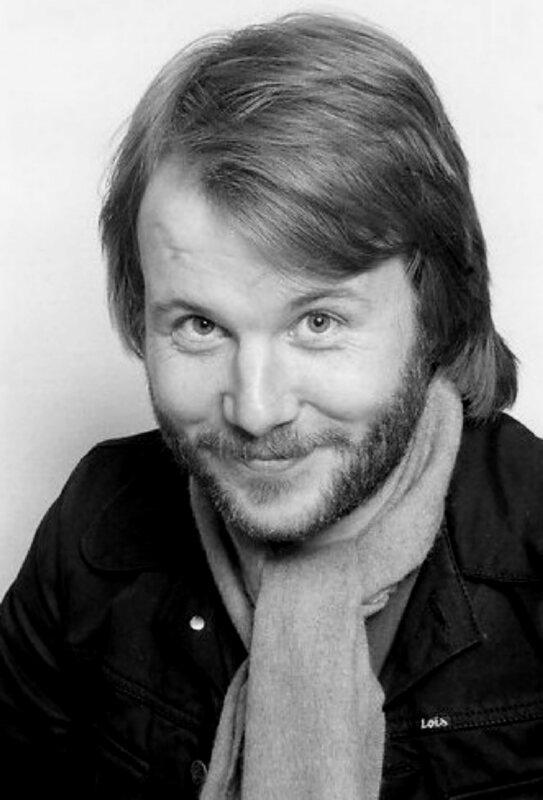 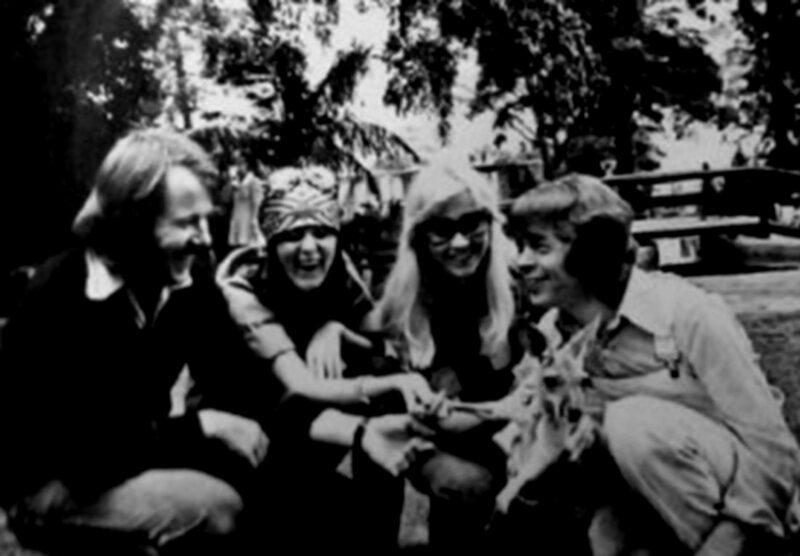 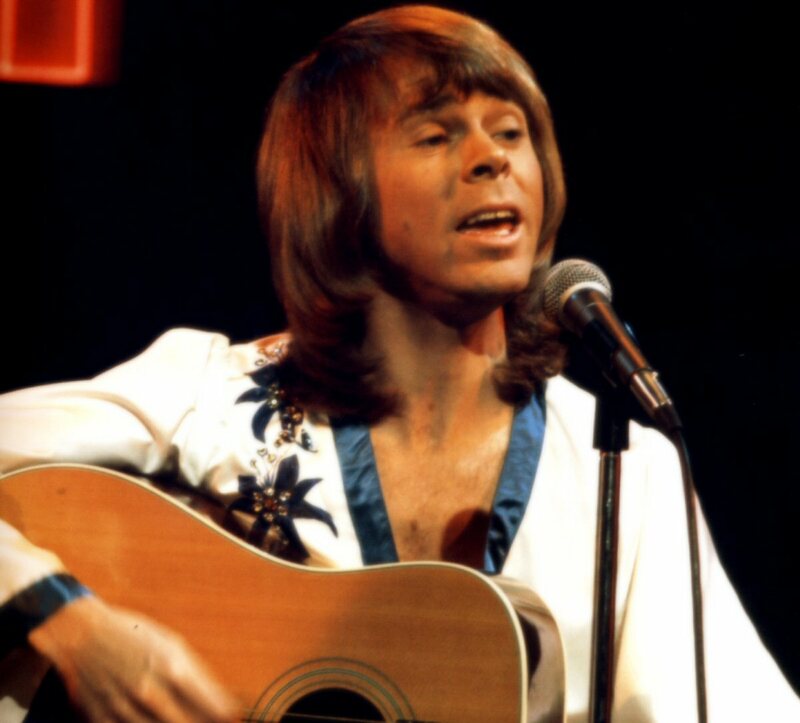 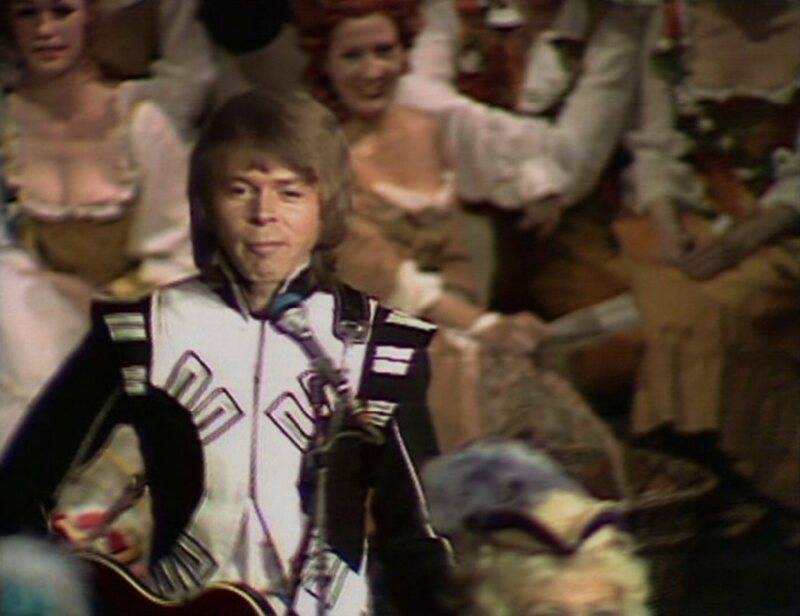 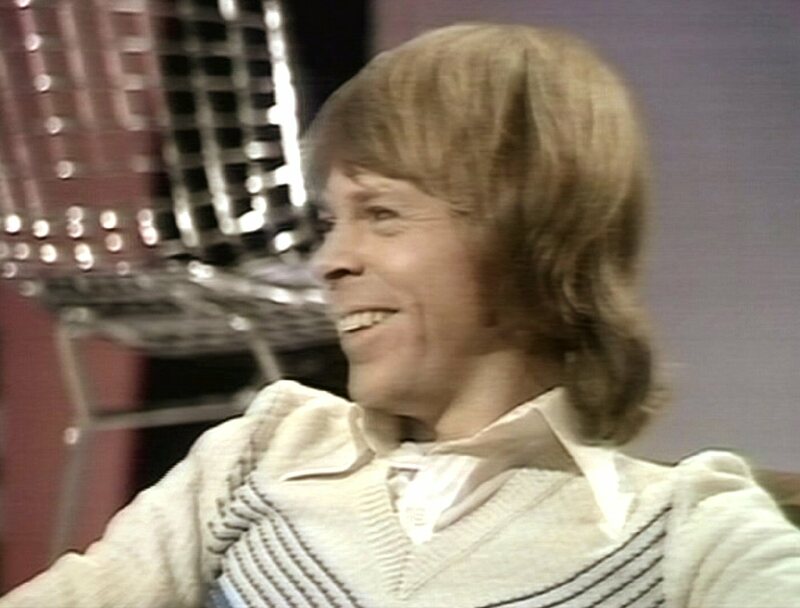 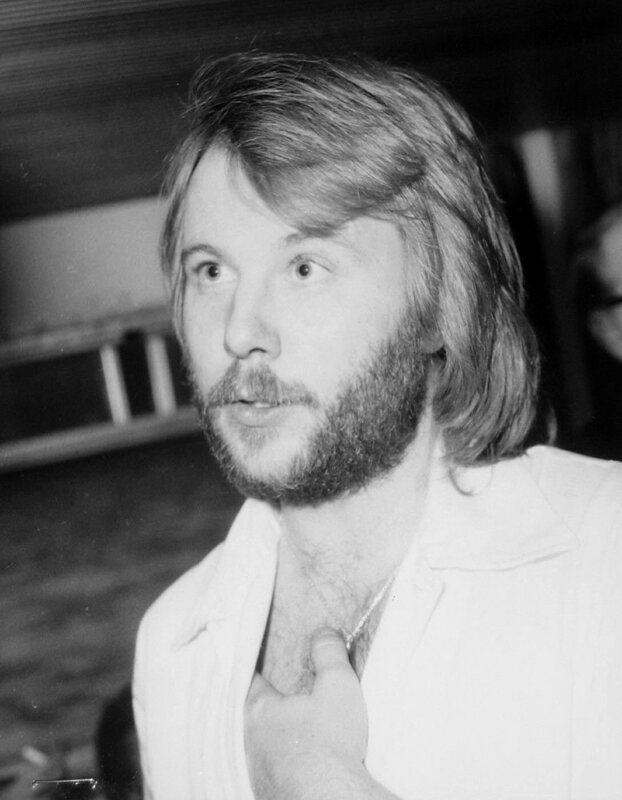 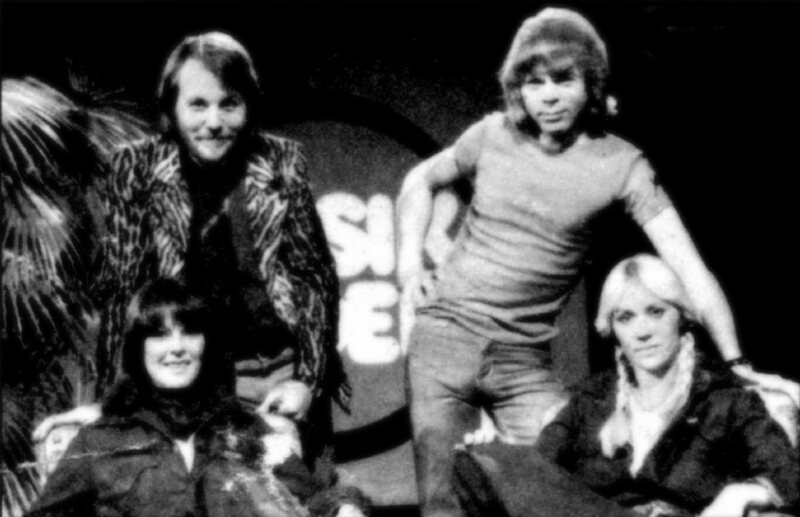 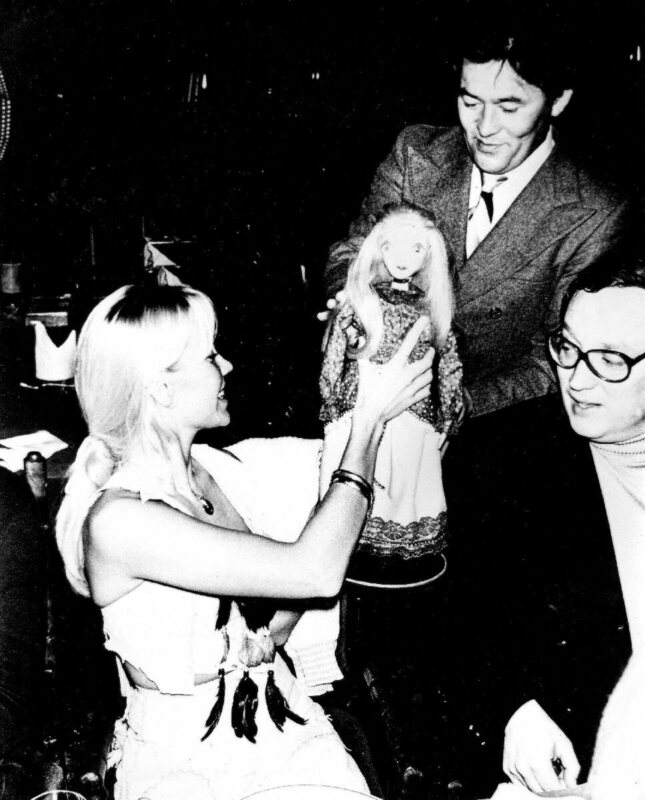 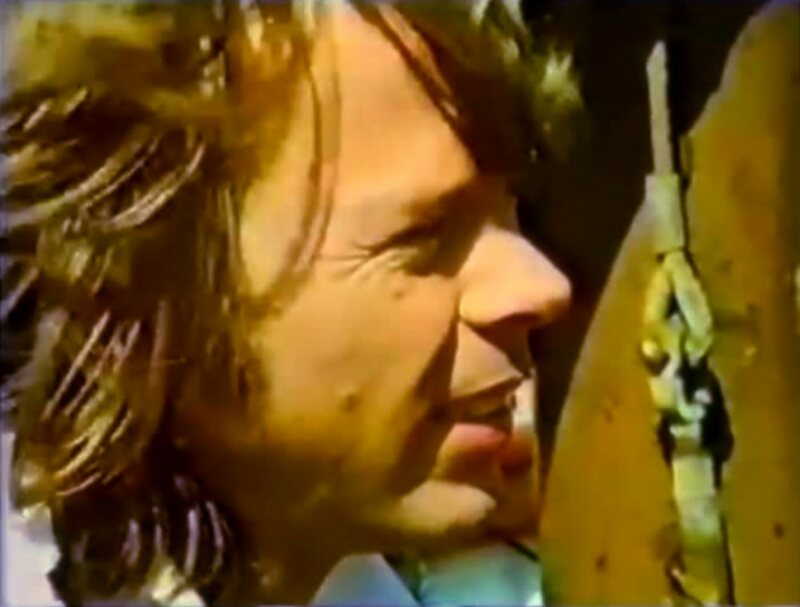 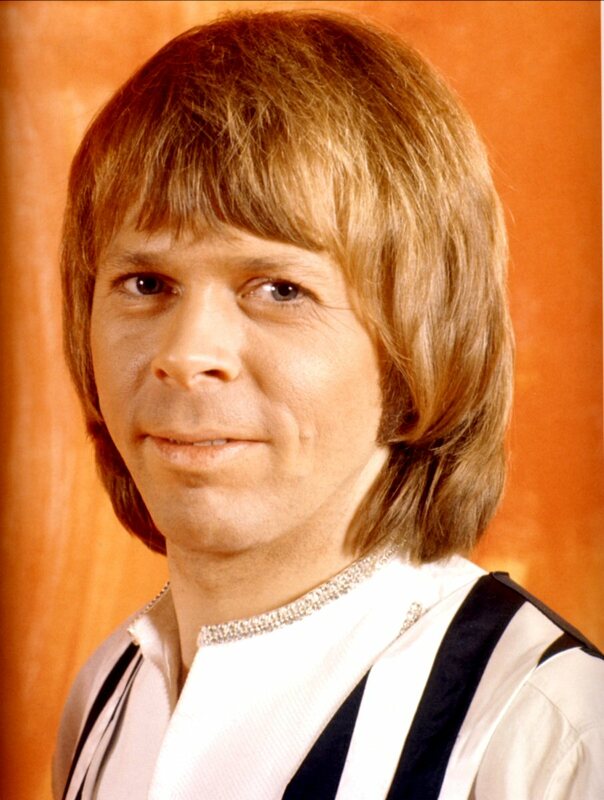 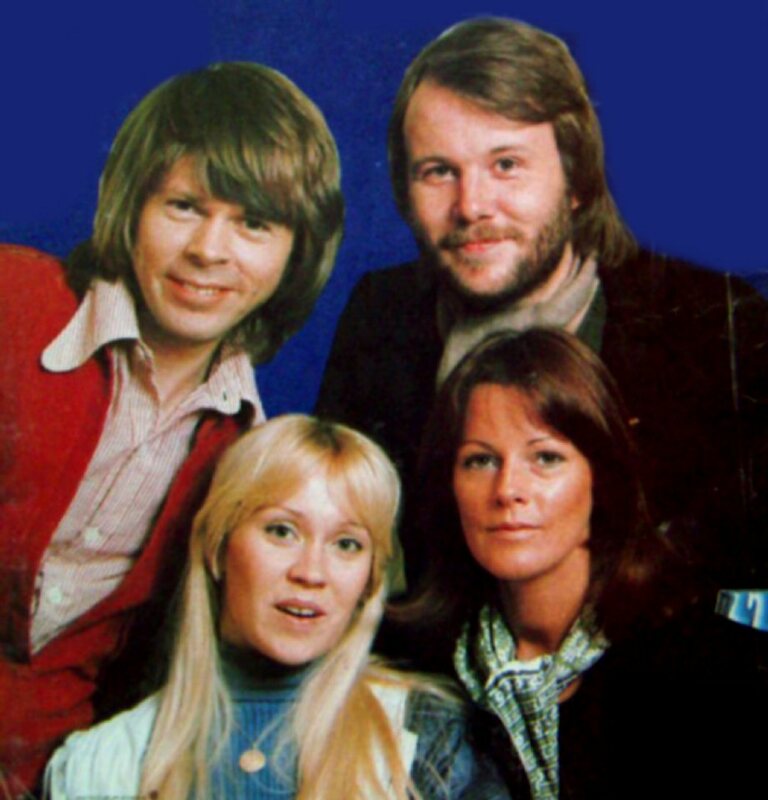 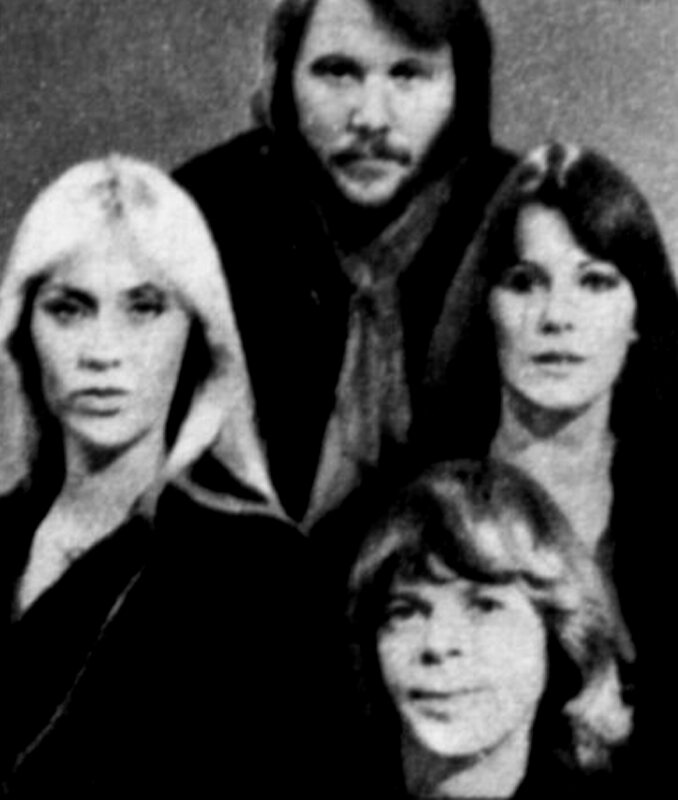 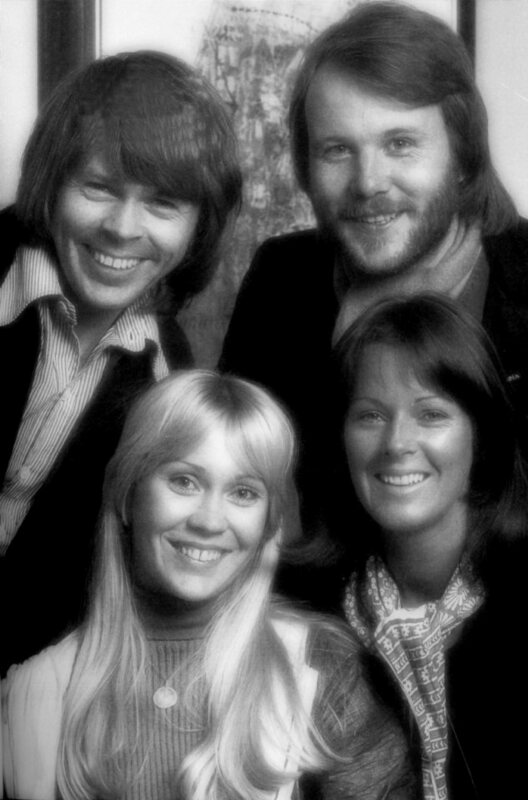 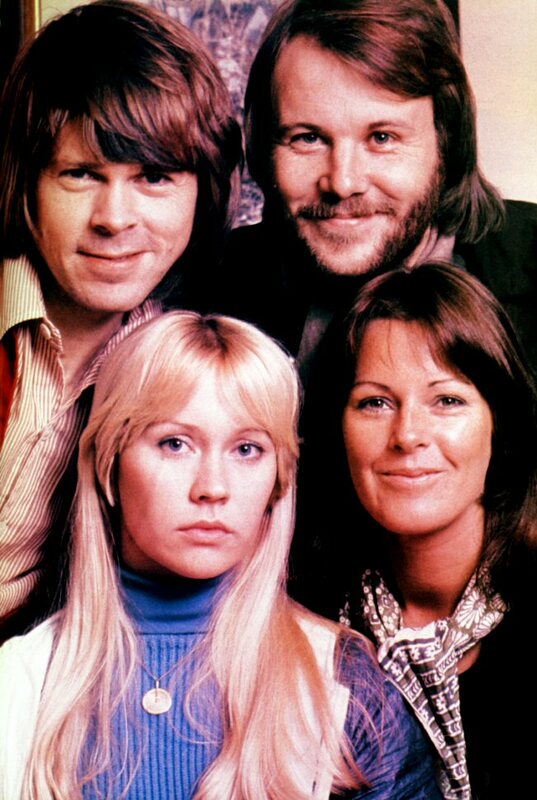 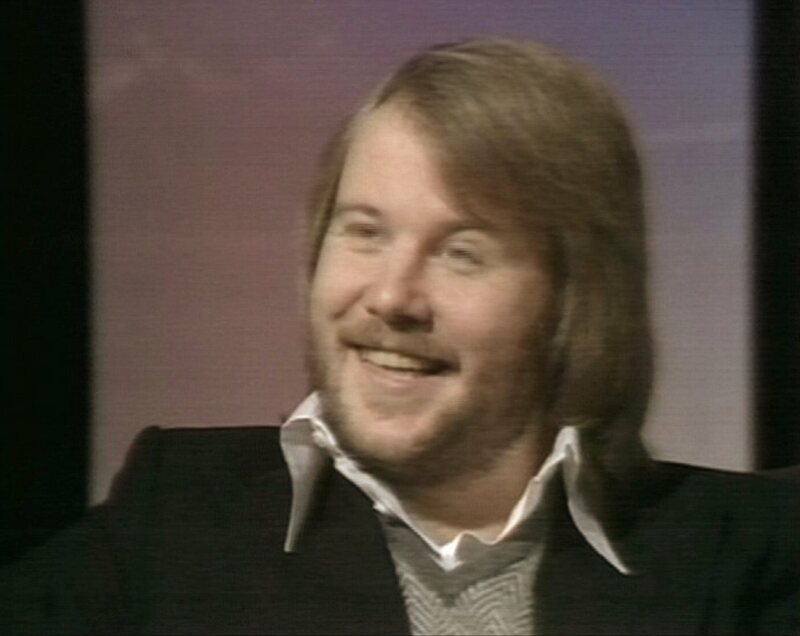 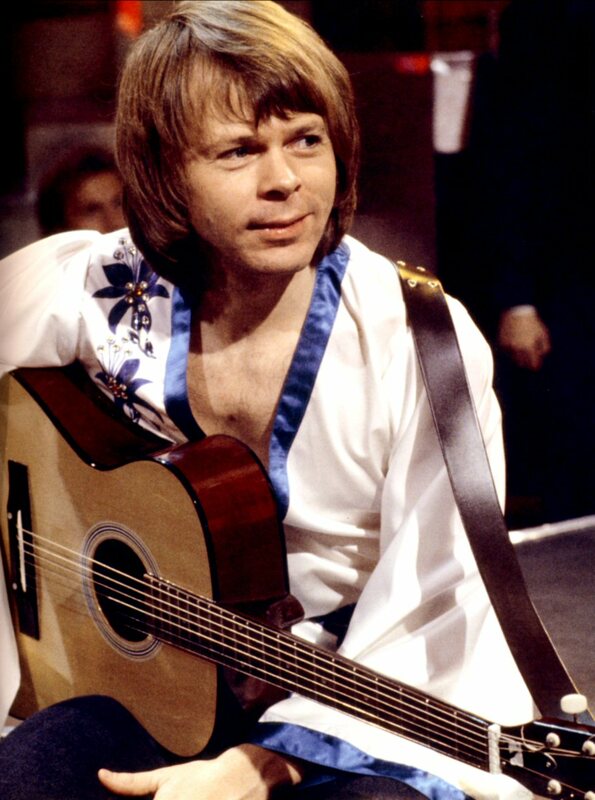 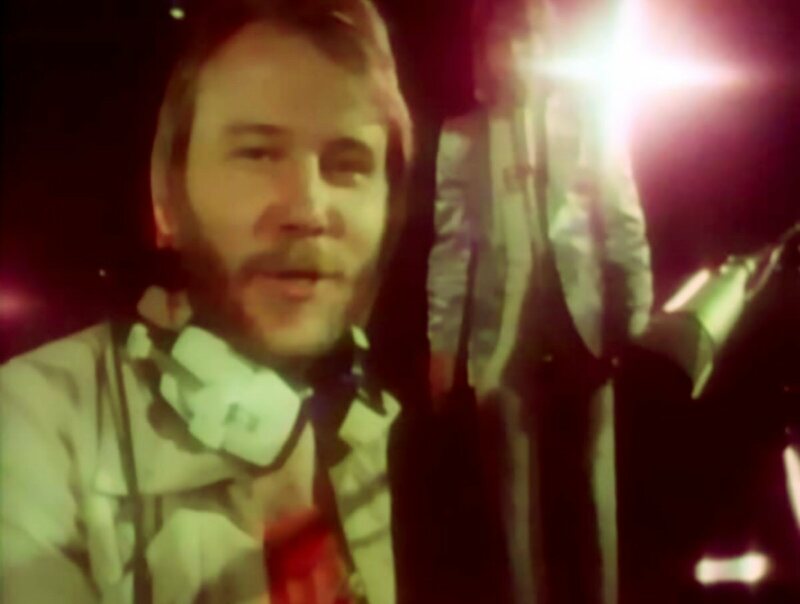 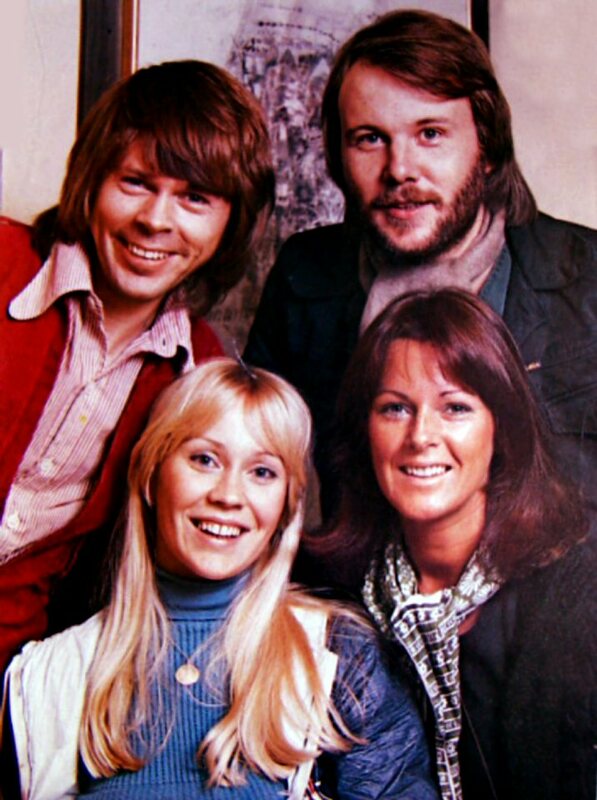 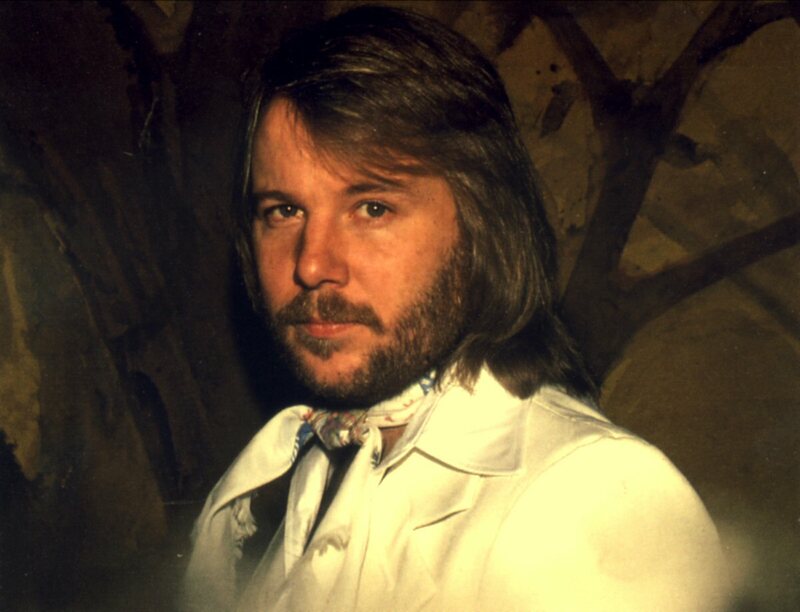 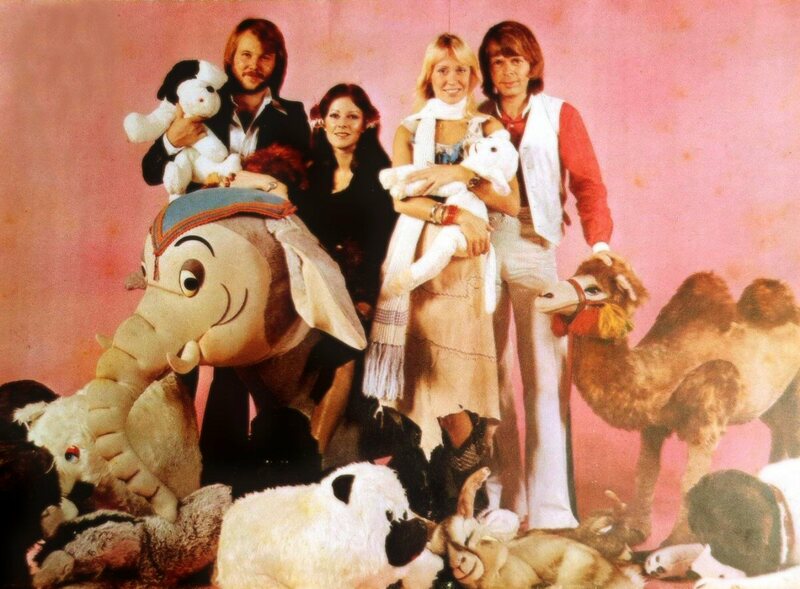 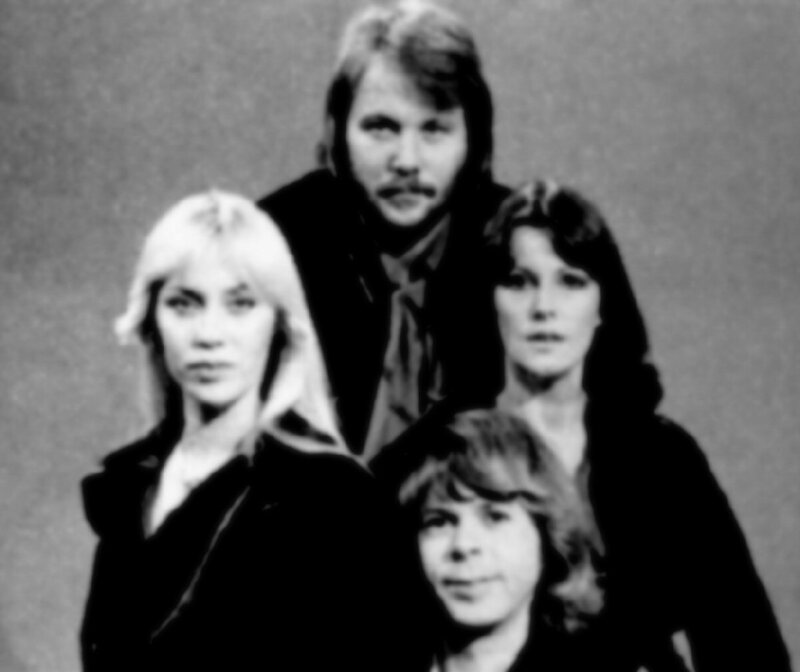 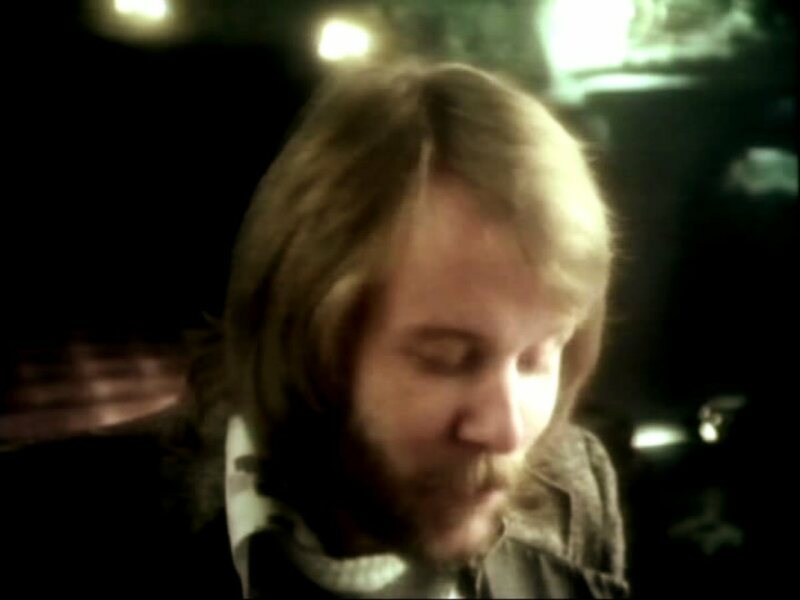 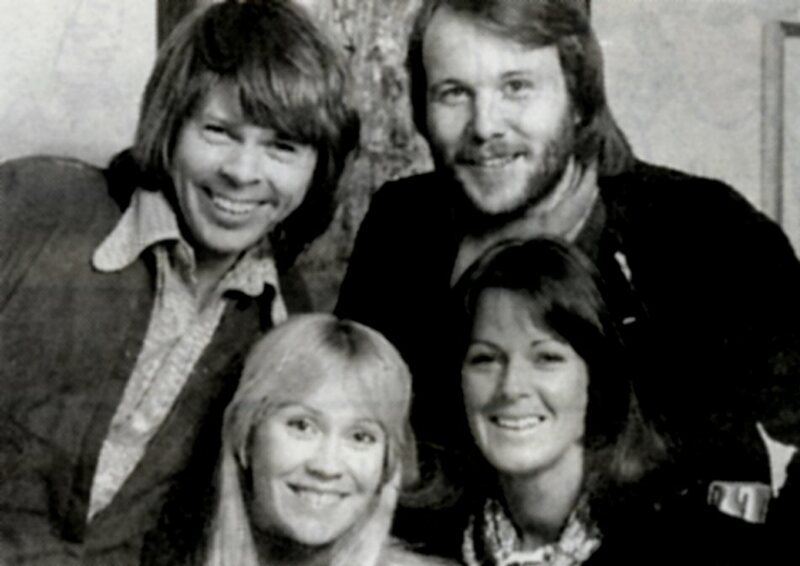 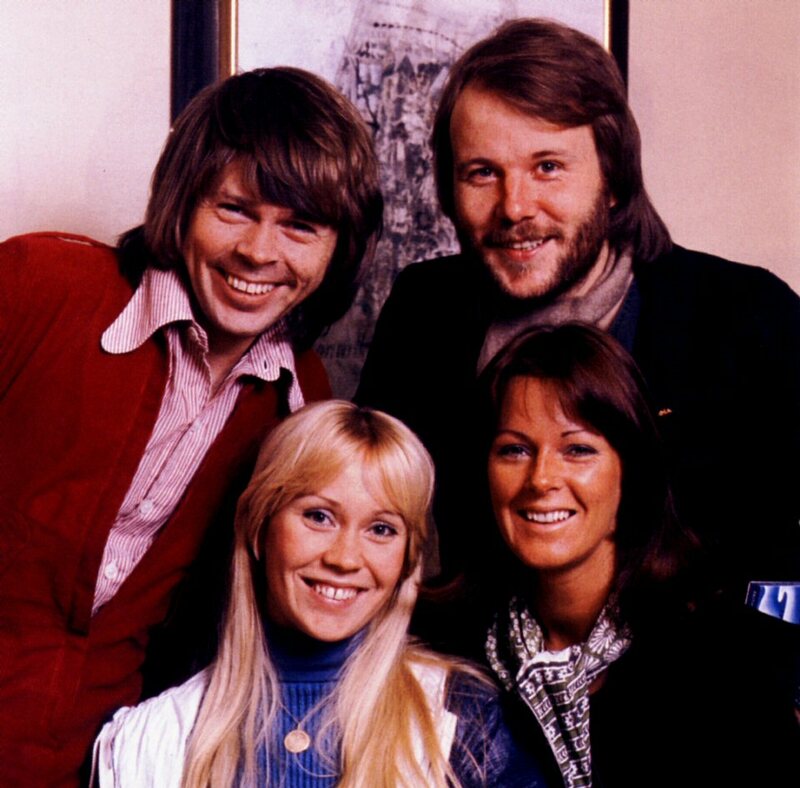 Each show in the series "ABBA i kvadrat" (ABBA in quadrat) was devoted to the one of the members and the host was the famous pop journalist Ulf Elfving. 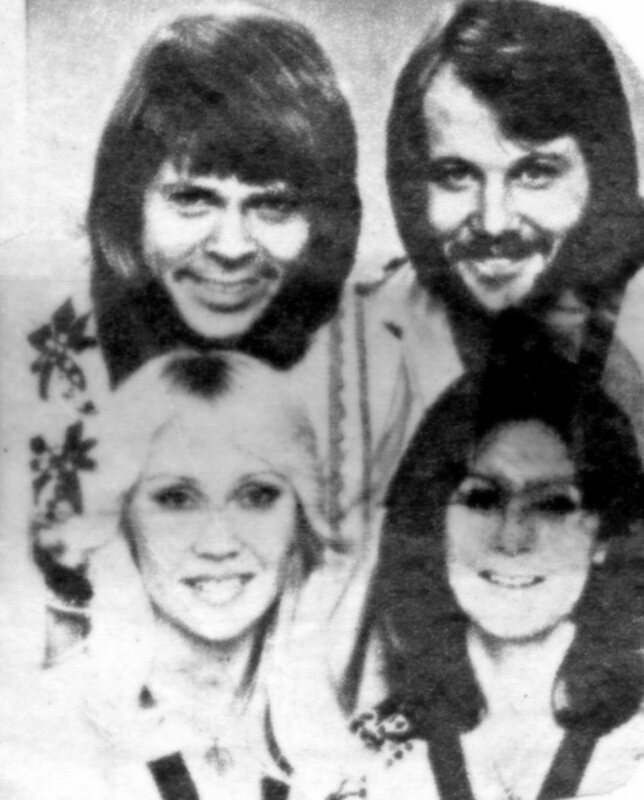 All four parts would be broadcasted by Swedish radio P 3 during the Christmas time 1976. 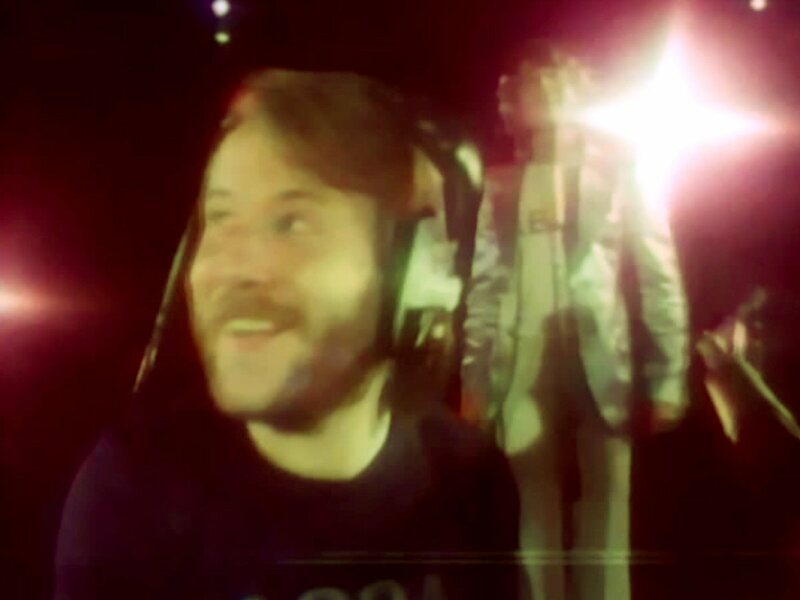 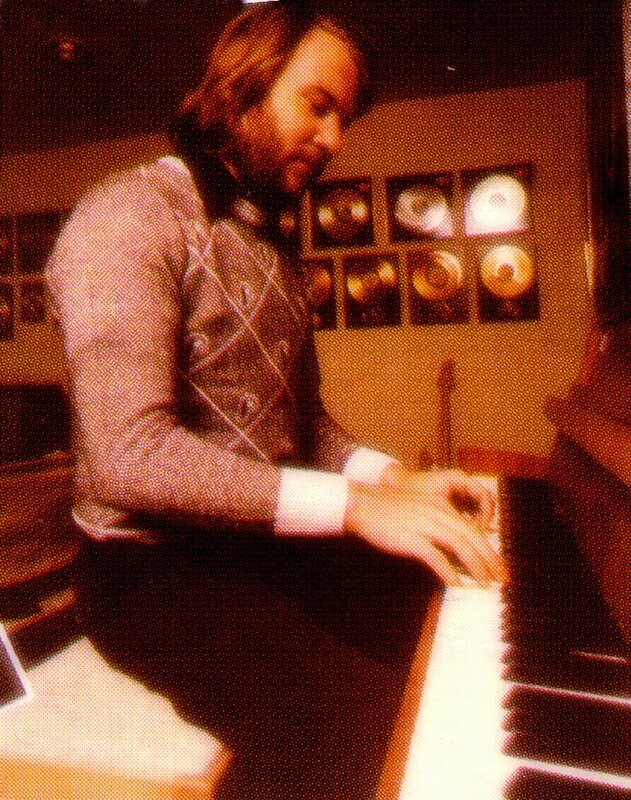 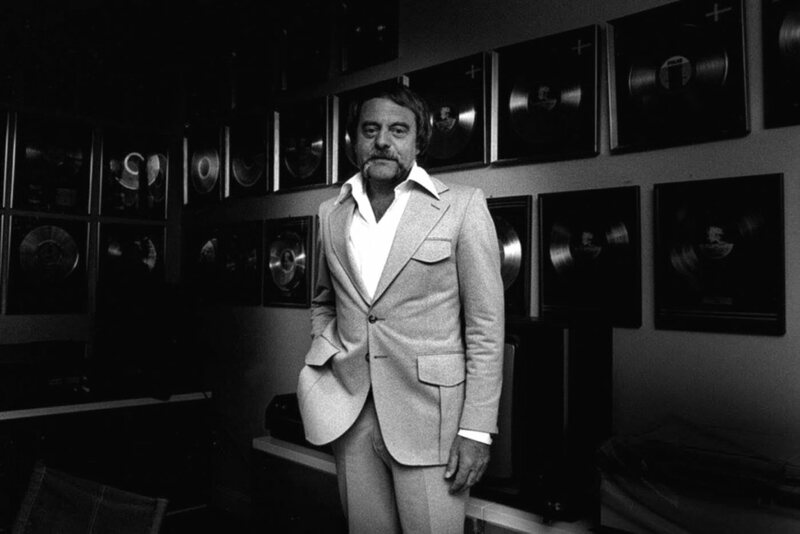 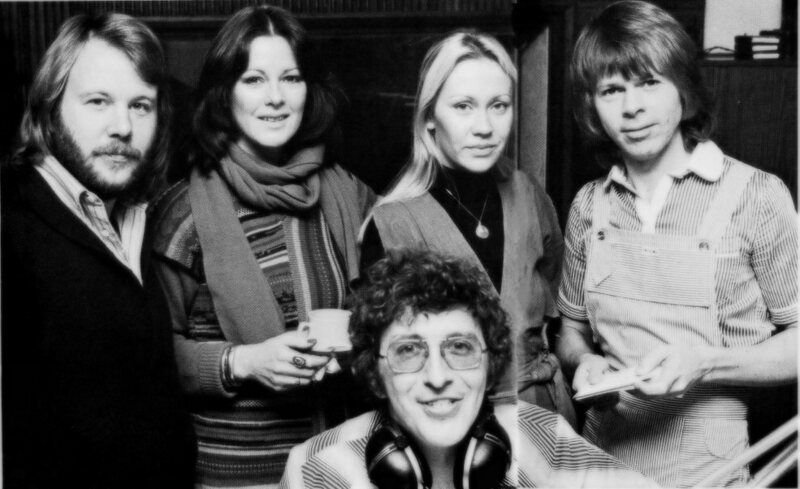 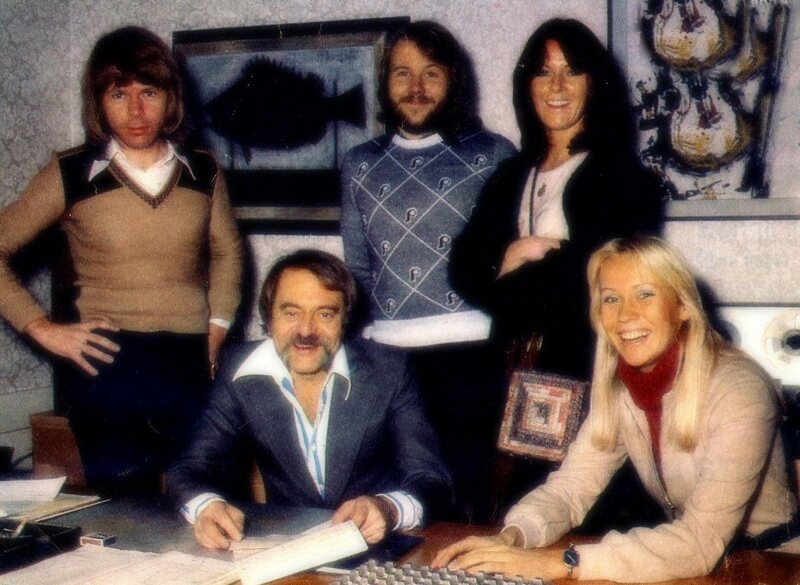 ABBA were highly involved in recording of Michael B. Tretow's solo album which saw its release in September 1976 and was entitled "Let's Boogie". 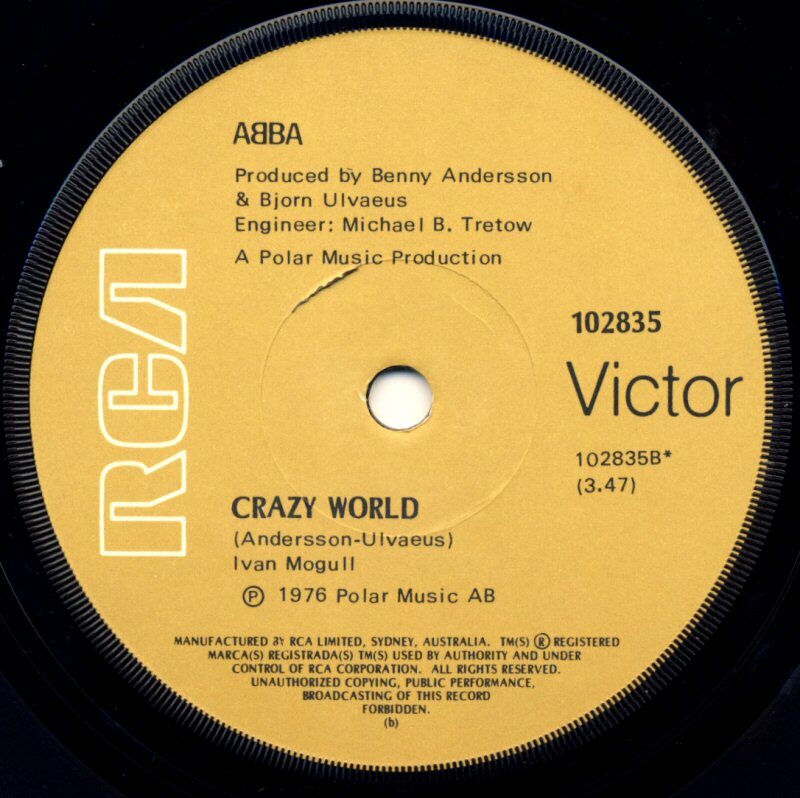 It featured 13 crazy compositions performed by Michael together with the ABBA members and other musicians and singers from the Polar family. 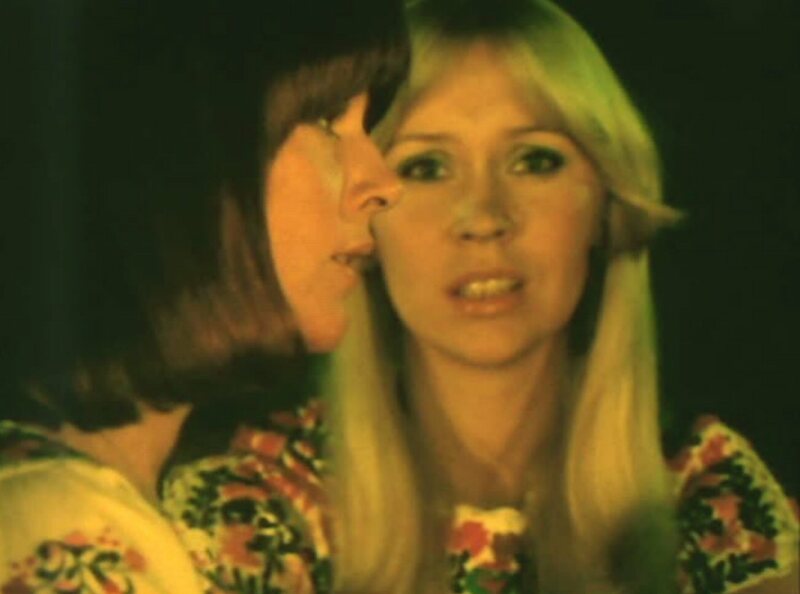 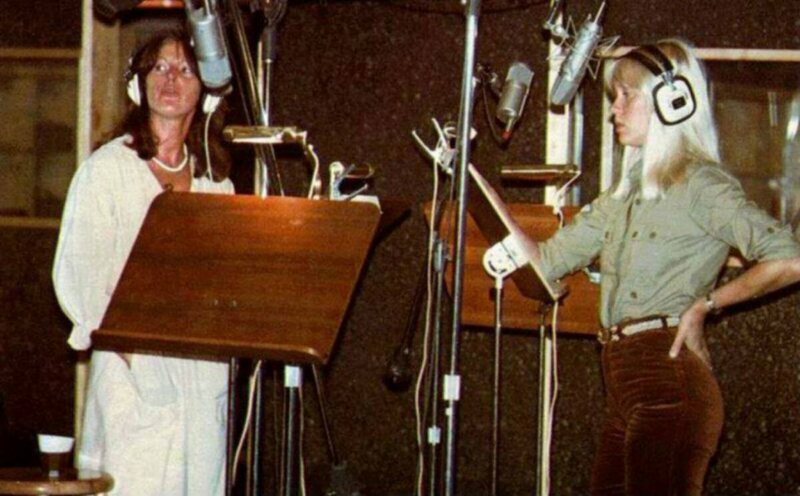 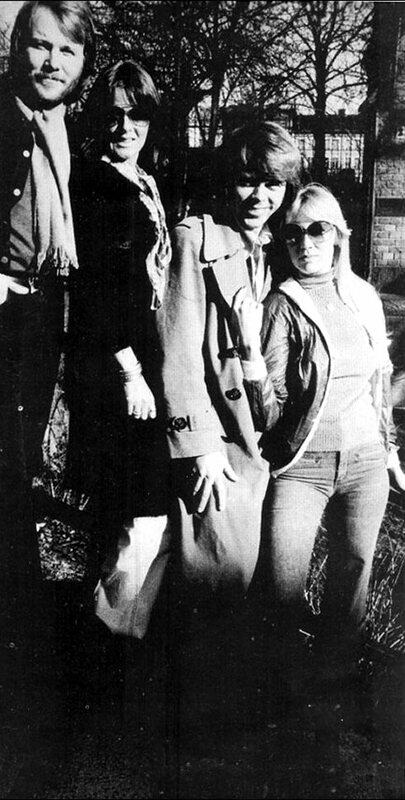 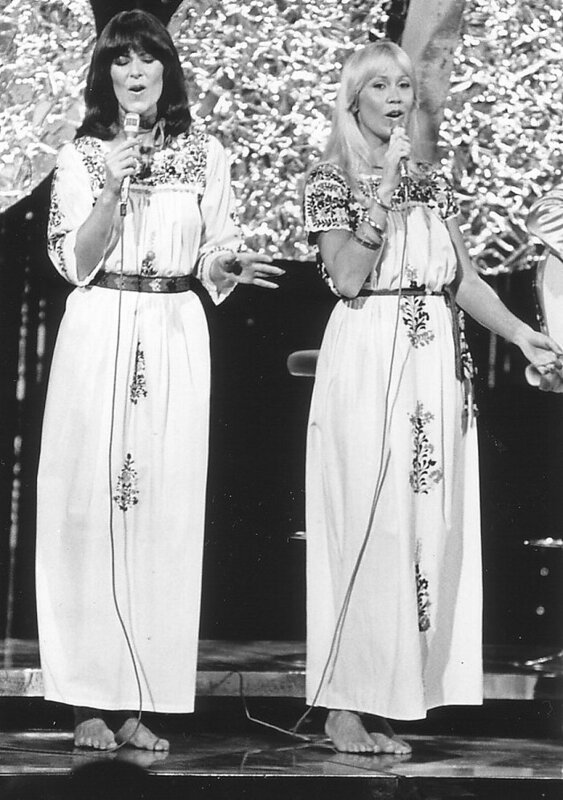 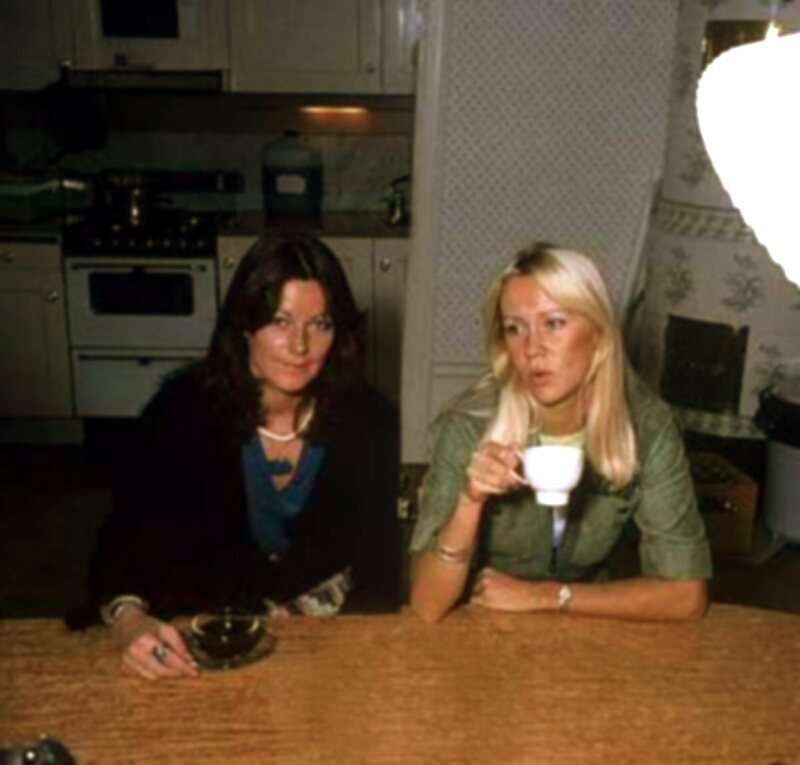 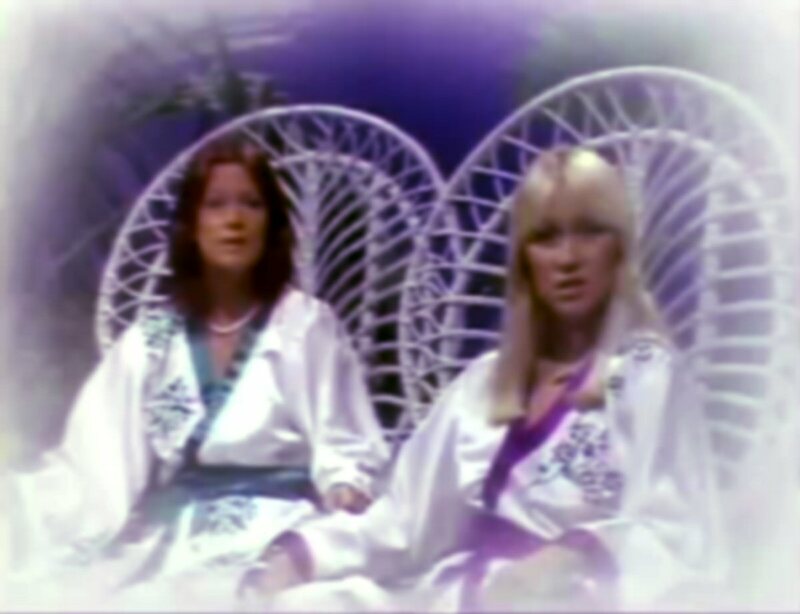 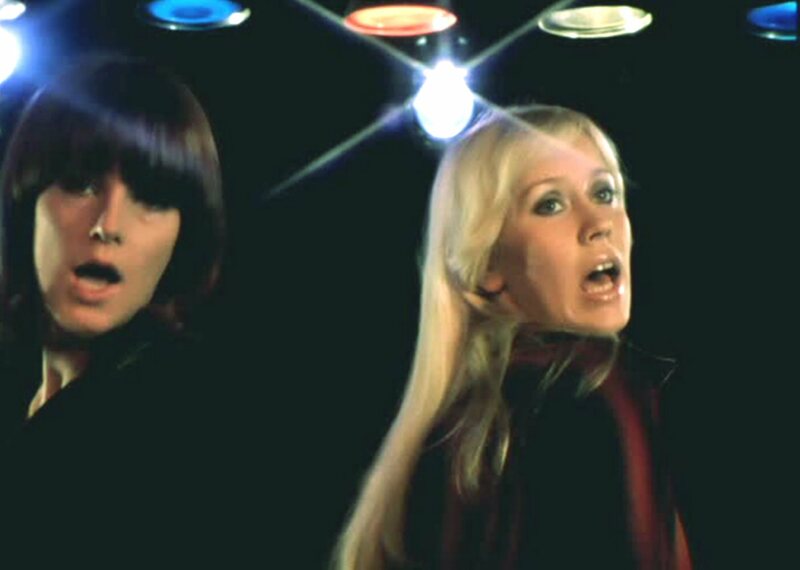 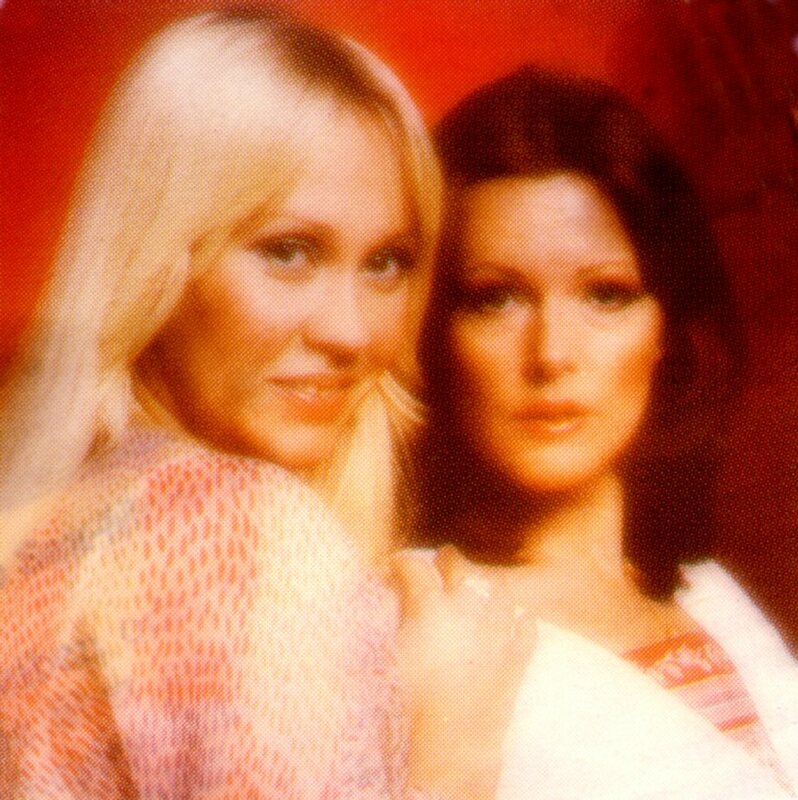 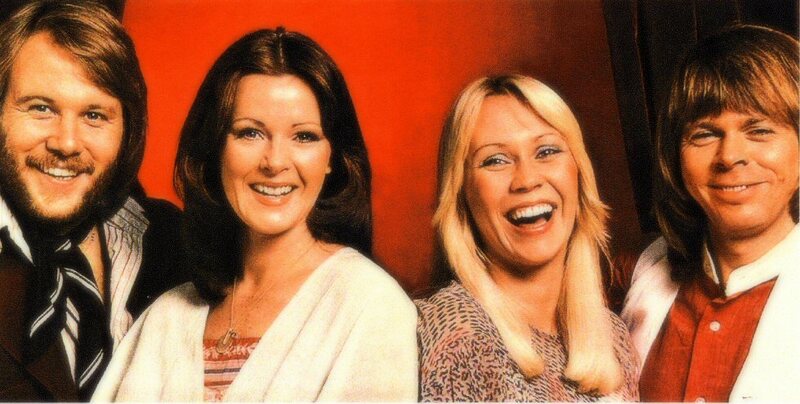 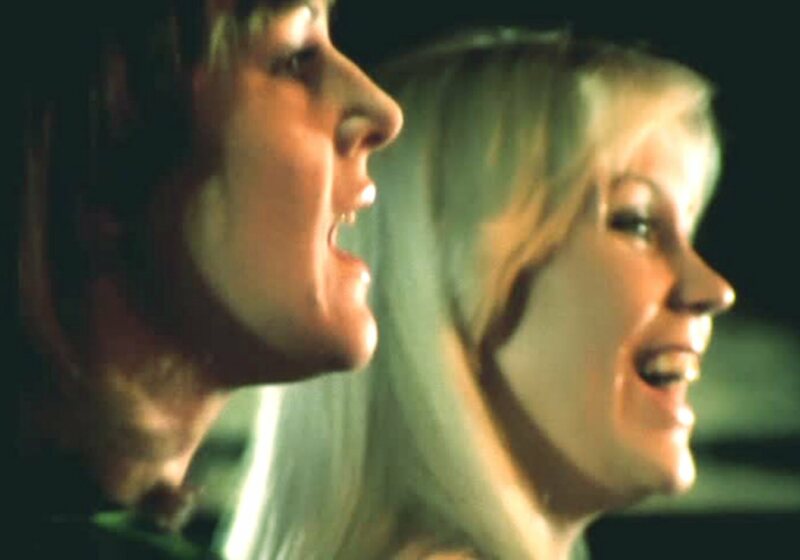 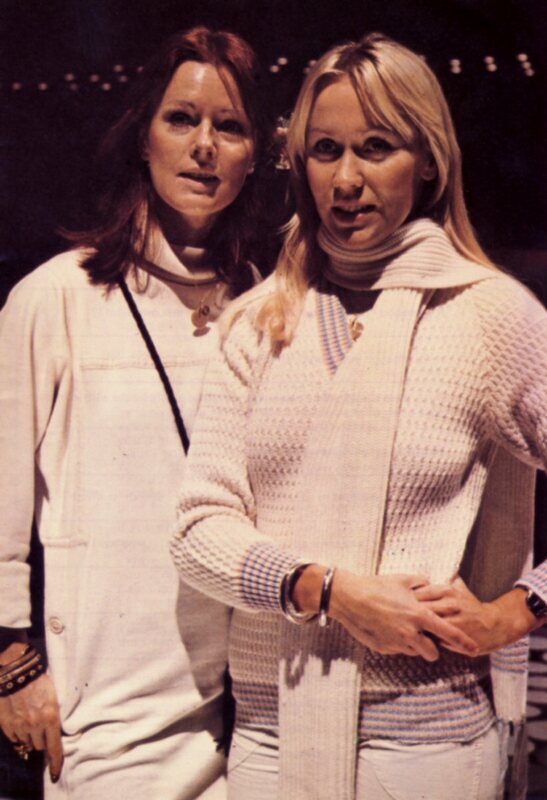 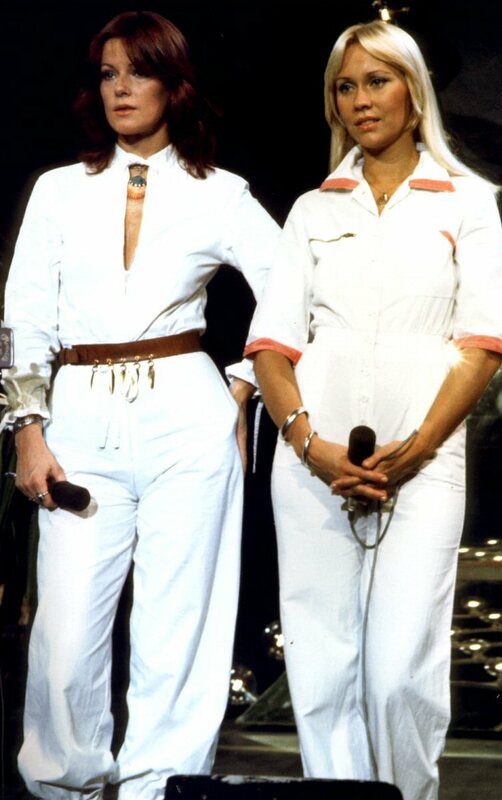 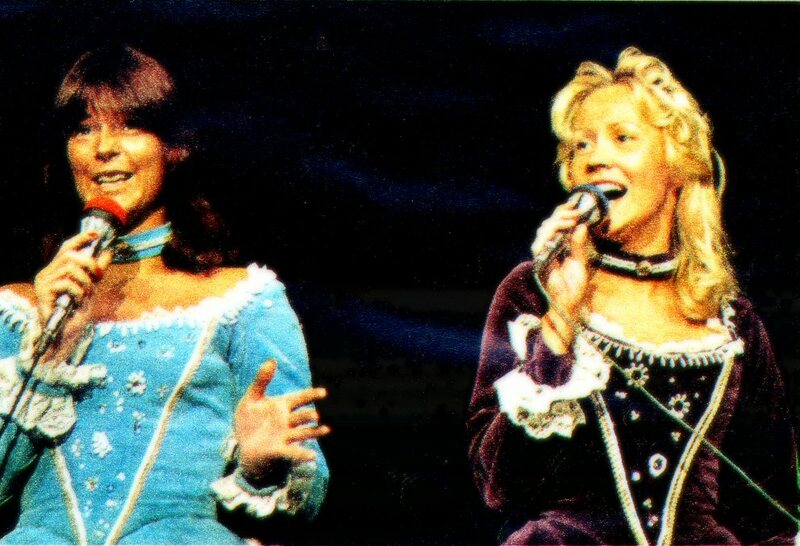 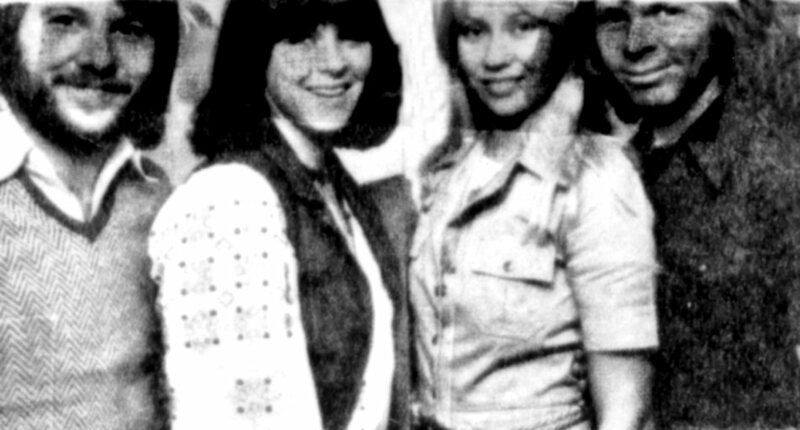 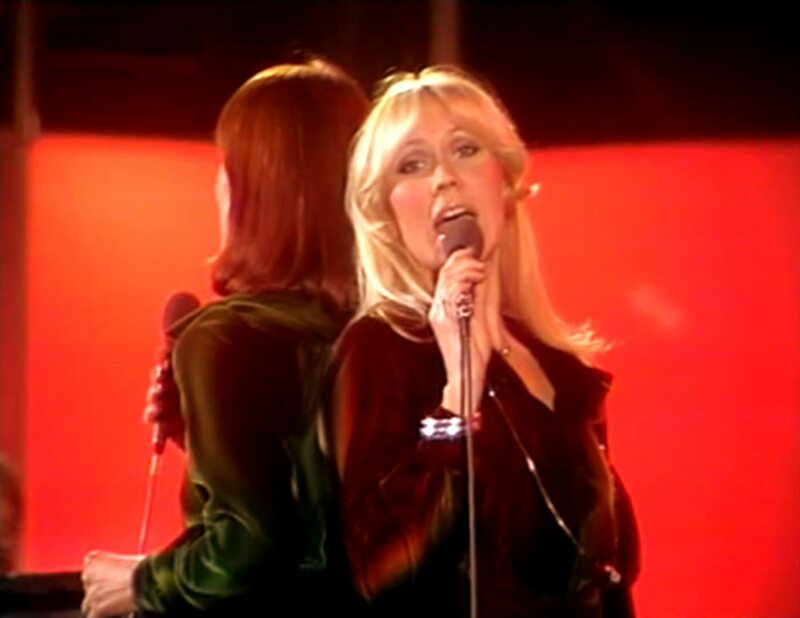 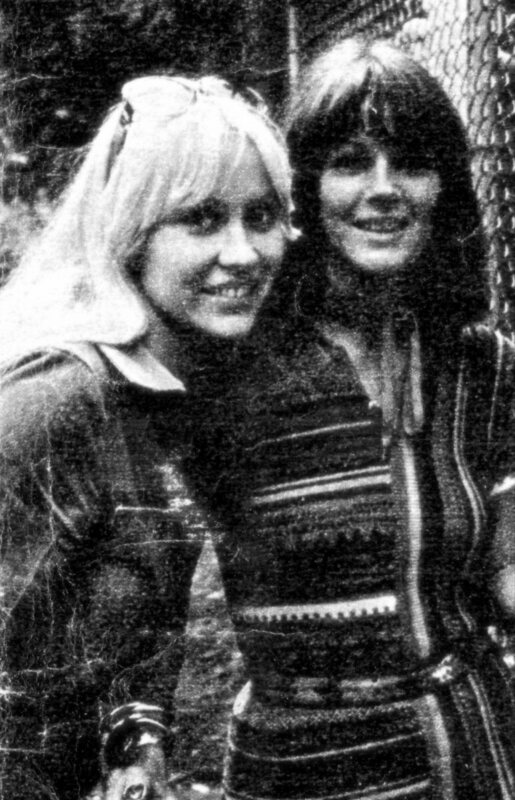 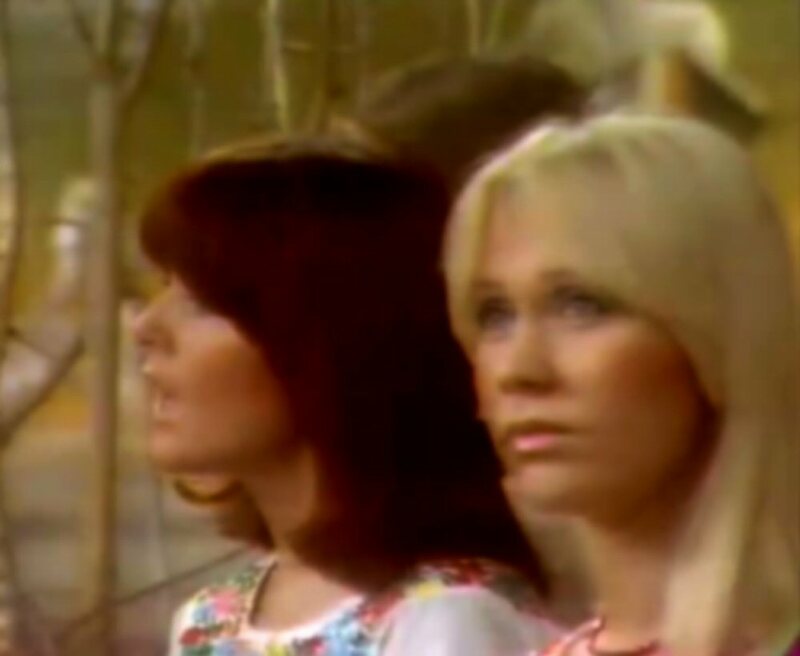 Agnetha and Anni-Frid sung background vocals on almost all songs on the album. 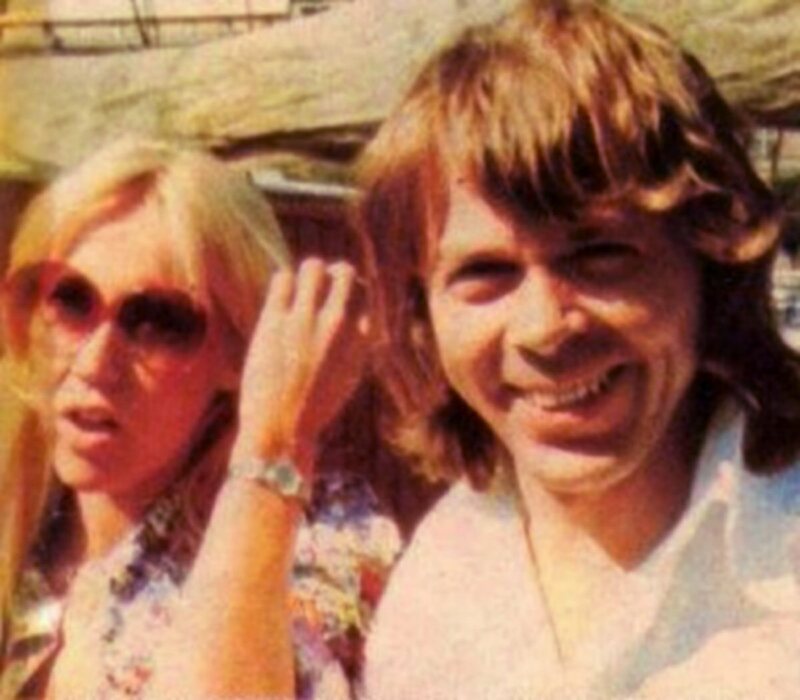 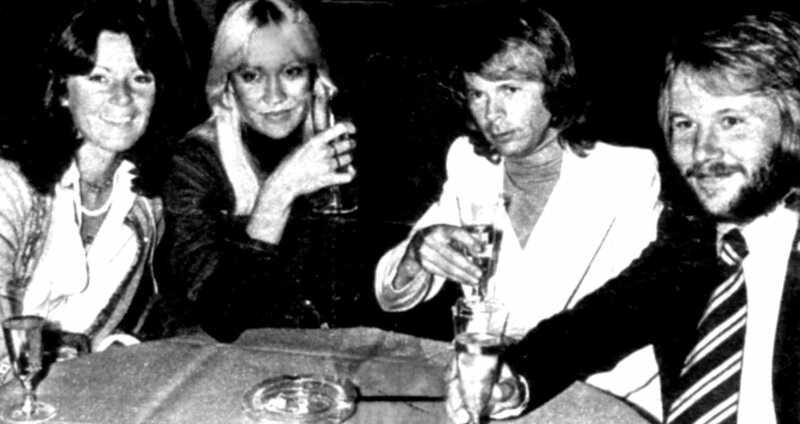 Björn and Benny played different instruments and even Agnetha played piano on one track. 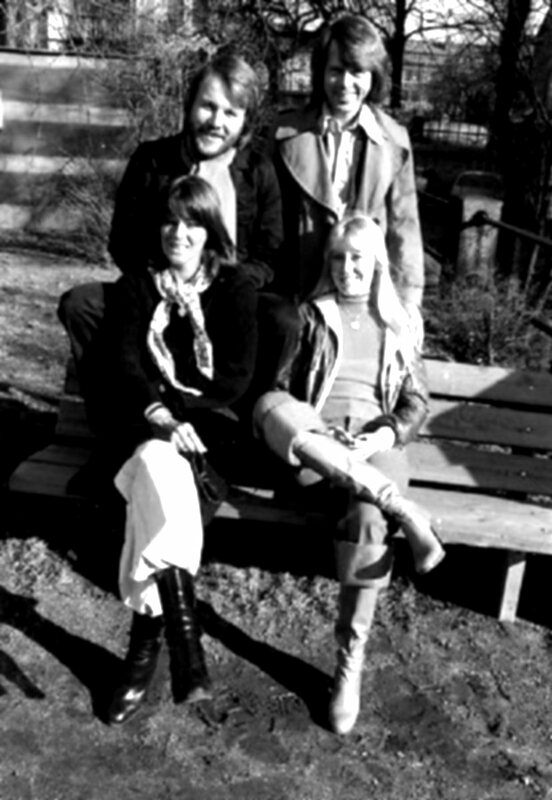 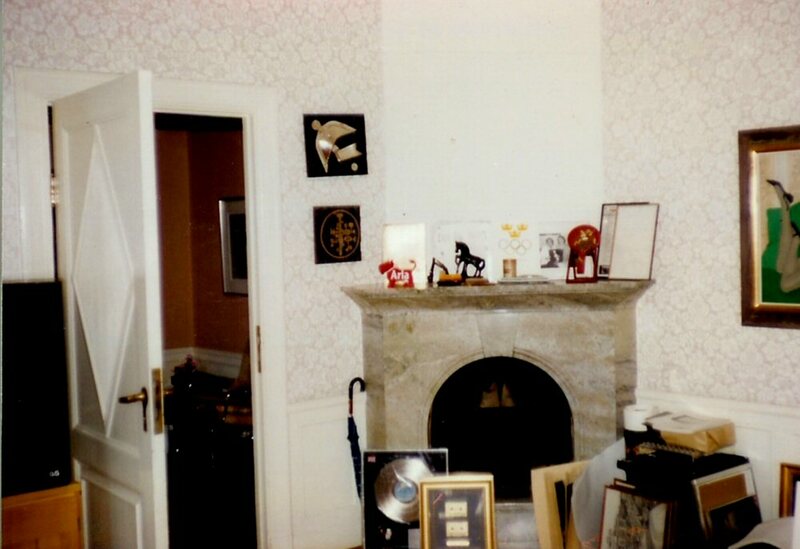 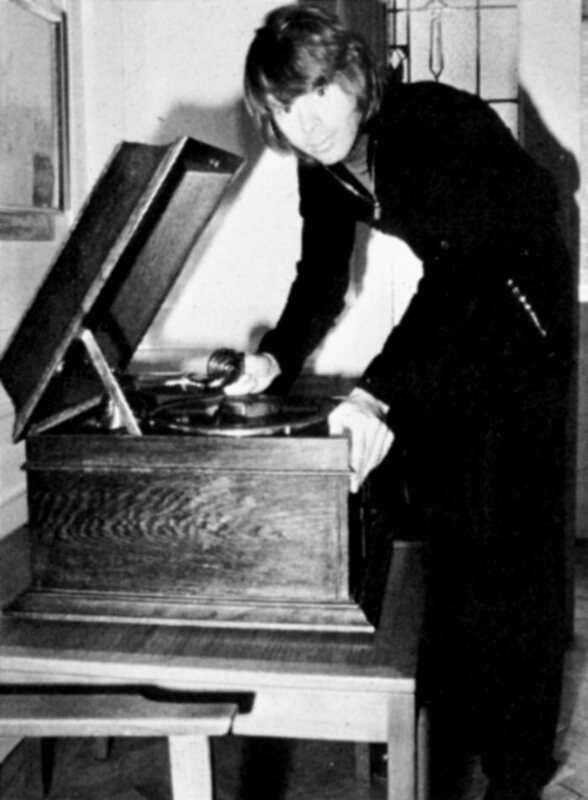 The album had been recorded at Glenstudio in Stockholm between October 75 and February 76. 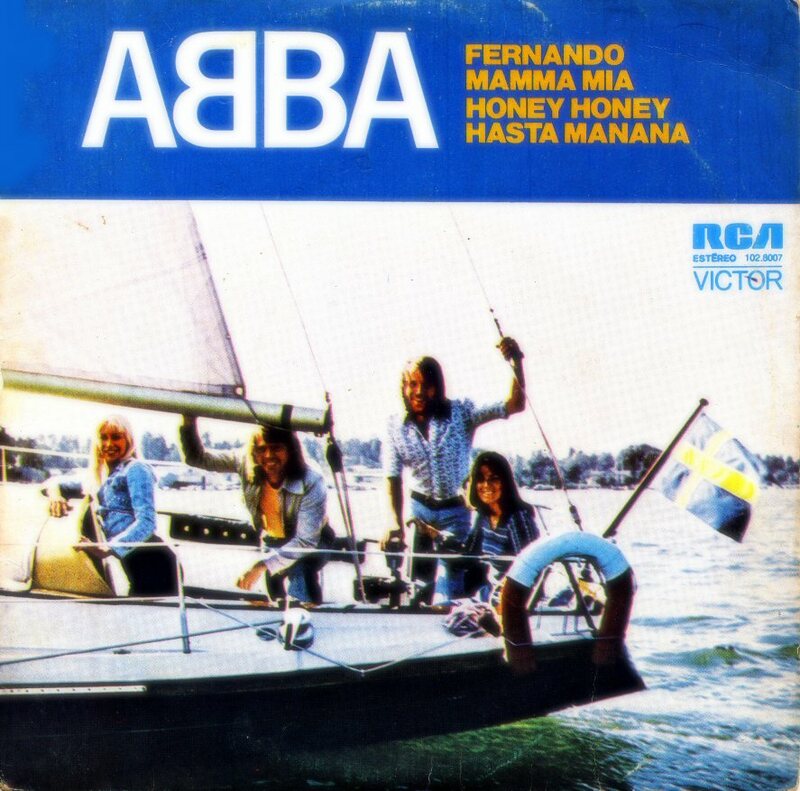 A compilation LP entitled in Swedish "Gobitar från Svenstoppen" (The best from Svensktoppen) was released someday in autumn 1976 and it featured cover versions of three ABBA songs: "Mamma Mia", "SOS" and "Fernando". 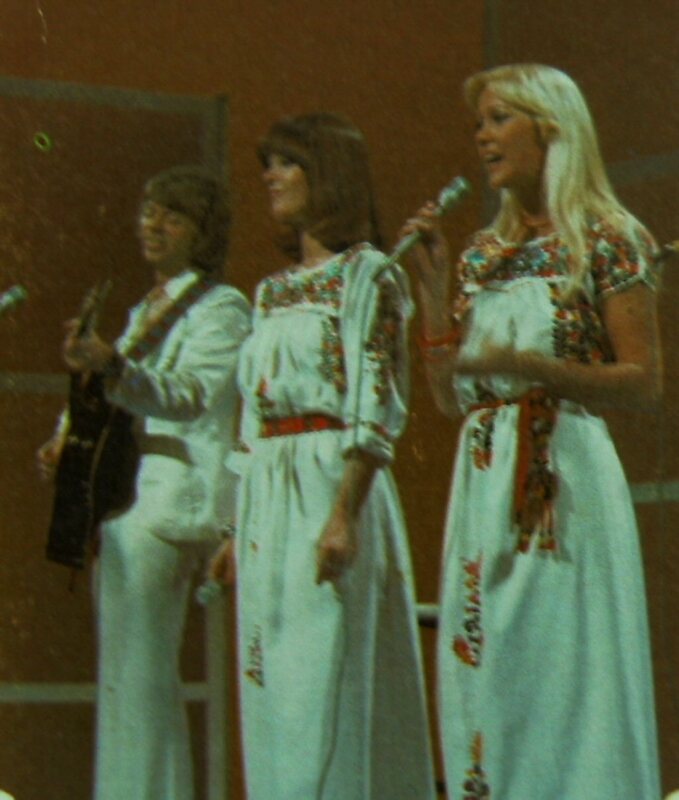 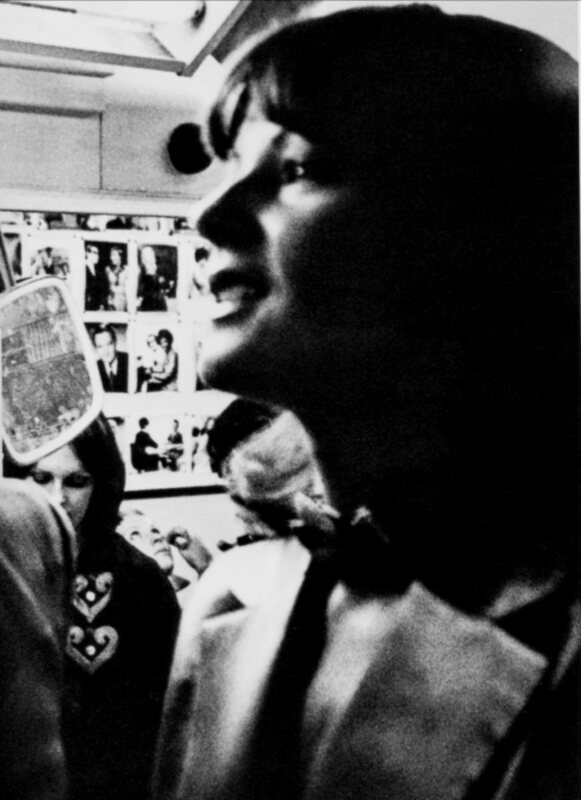 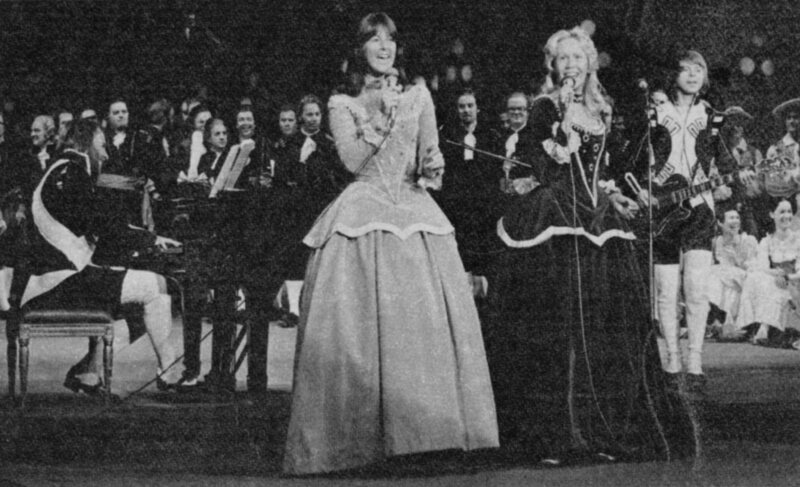 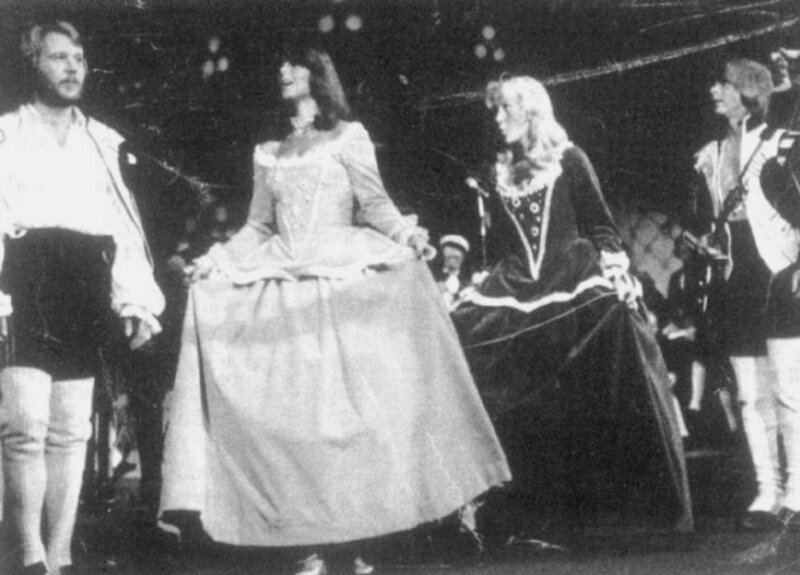 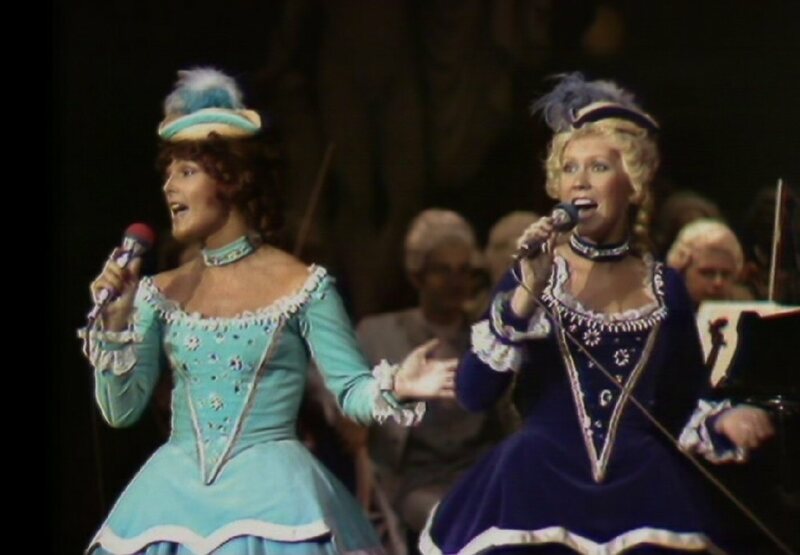 The songs were performed by Swedish studio singers: Annica Risberg, Agneta Zelán and Liza Öhman. 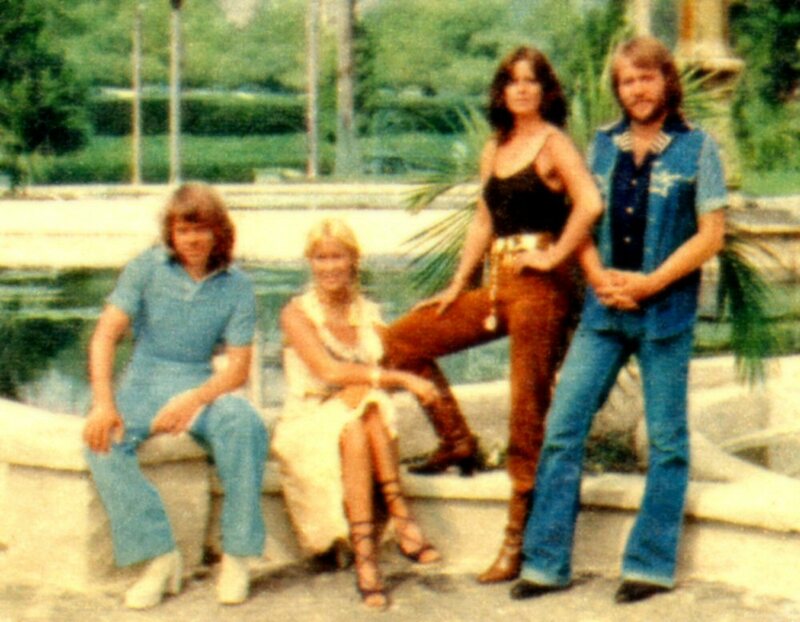 Öhman who would be ABBA's background singer on the 1977 World Tour performed "SOS" on this album. 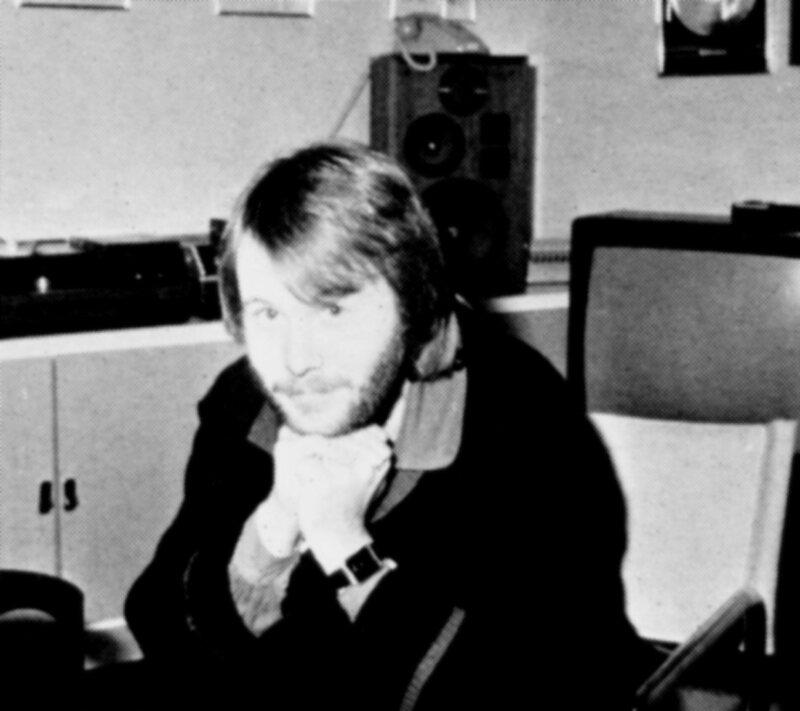 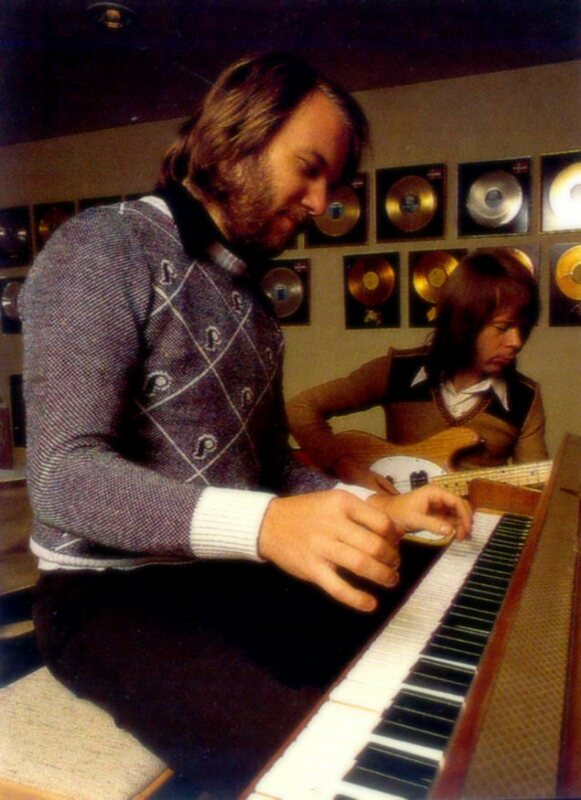 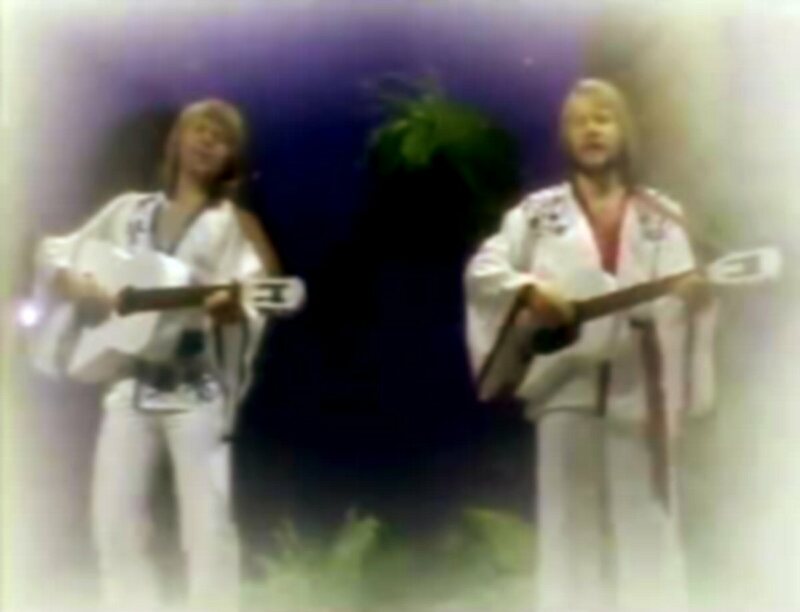 Even two ABBA musicians: Roger Palm and Rutger Gunnarsson played on the album. 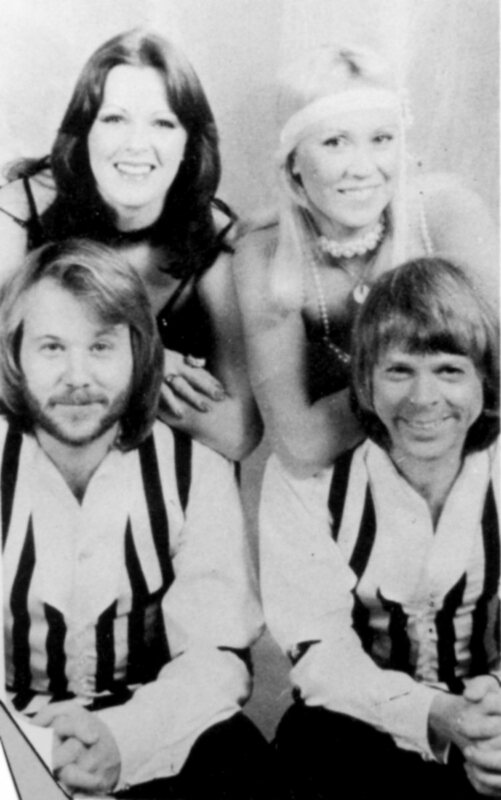 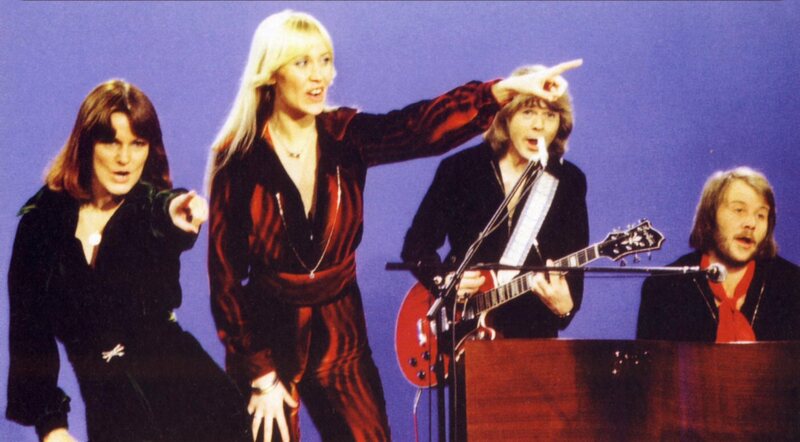 The famous Swedish dance band "Sten & Stanley" covered two ABBA songs on their 1976 album "Bella Bella". 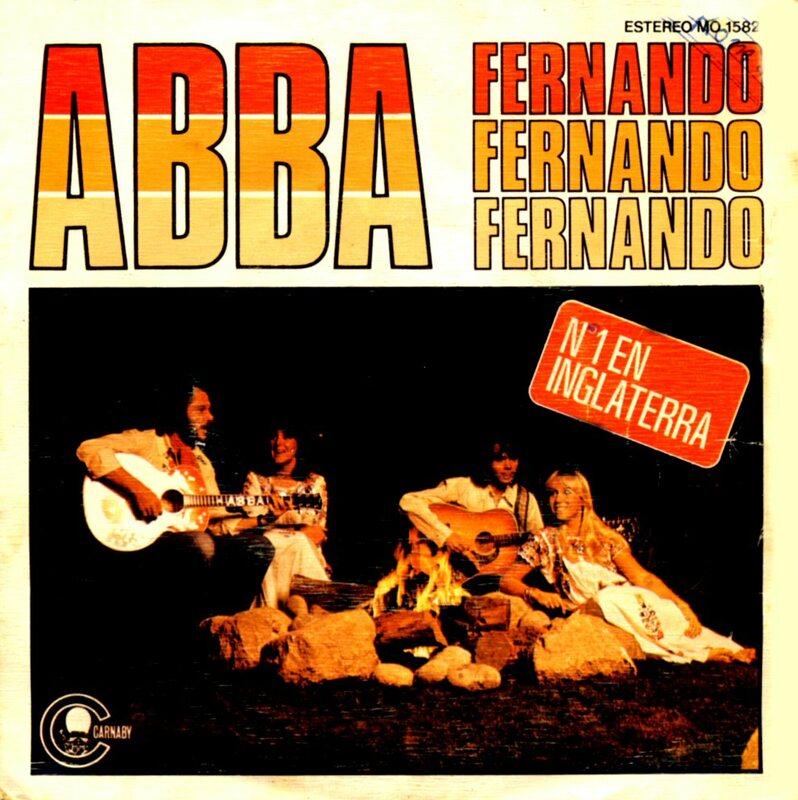 The songs were "So Long" and "Fernando". 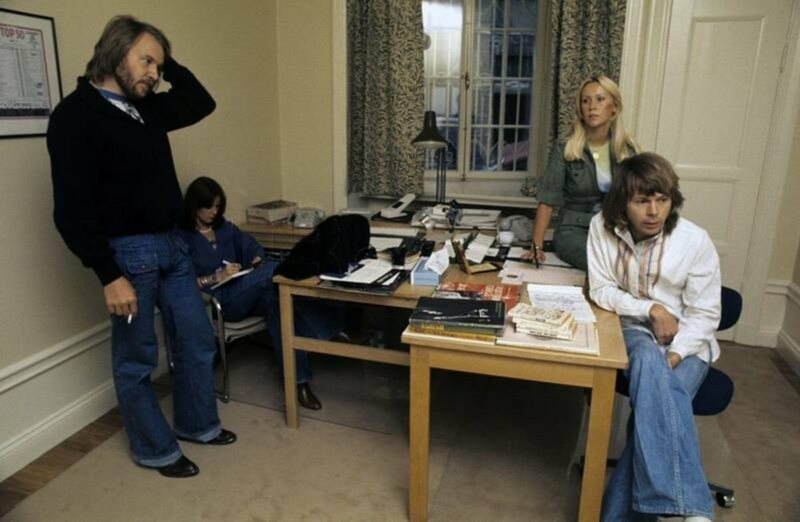 In September a special feature about ABBA was being prepared for the 45th issue of the Swedish weekly "Allers". 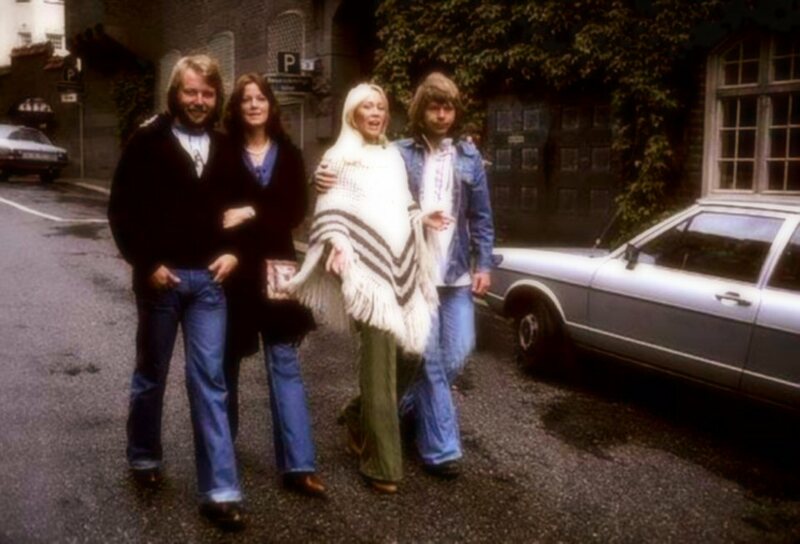 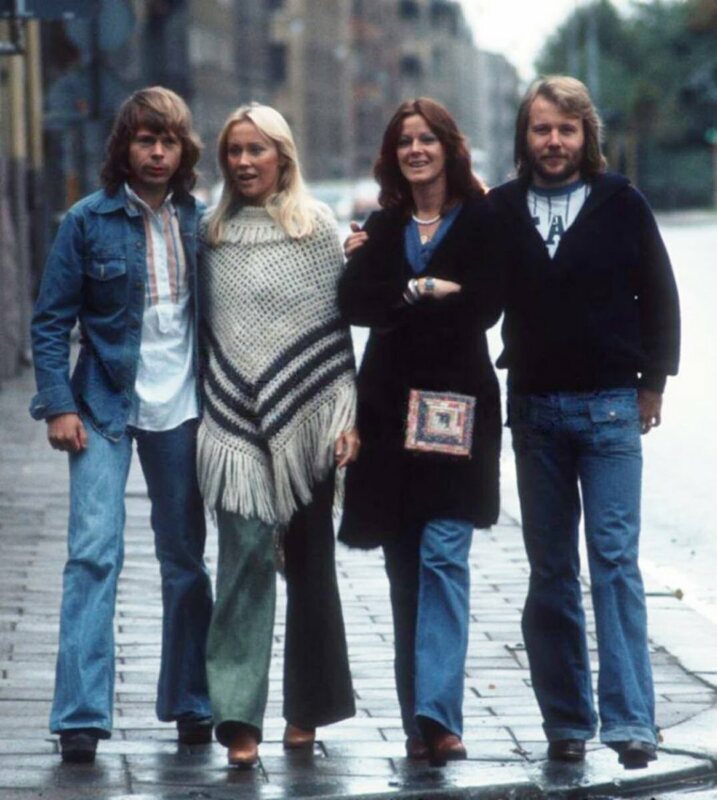 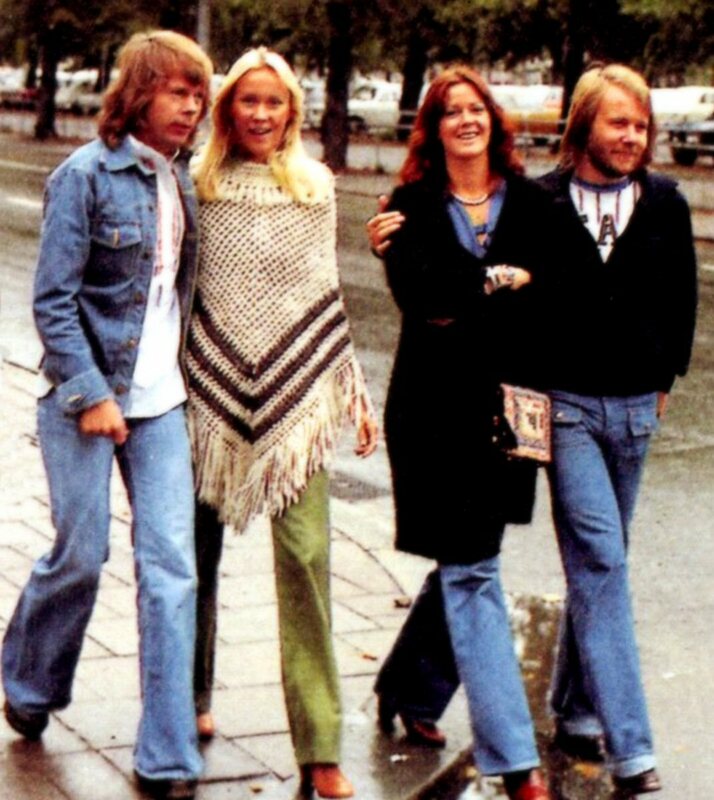 Exclusive photos showing ABBA strolling somewhere in Stockholm were taken. 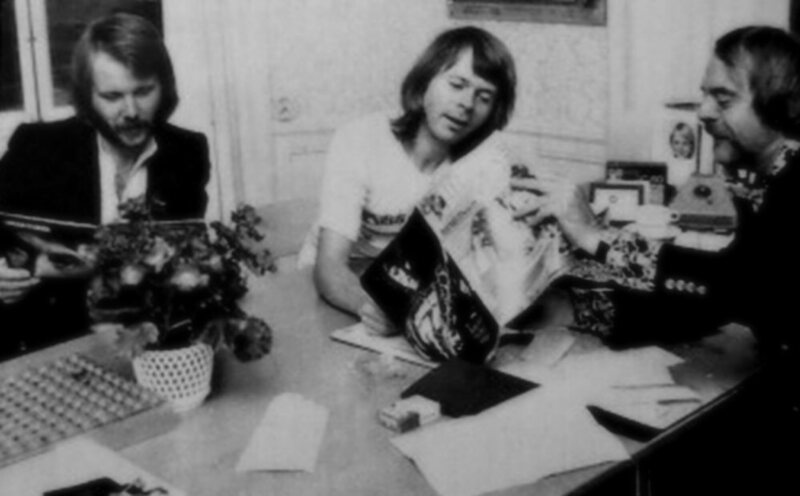 It can be noticed that Frida had the same little purse that she even had in Poland when they promoted "Arrival" at the beginning of October. 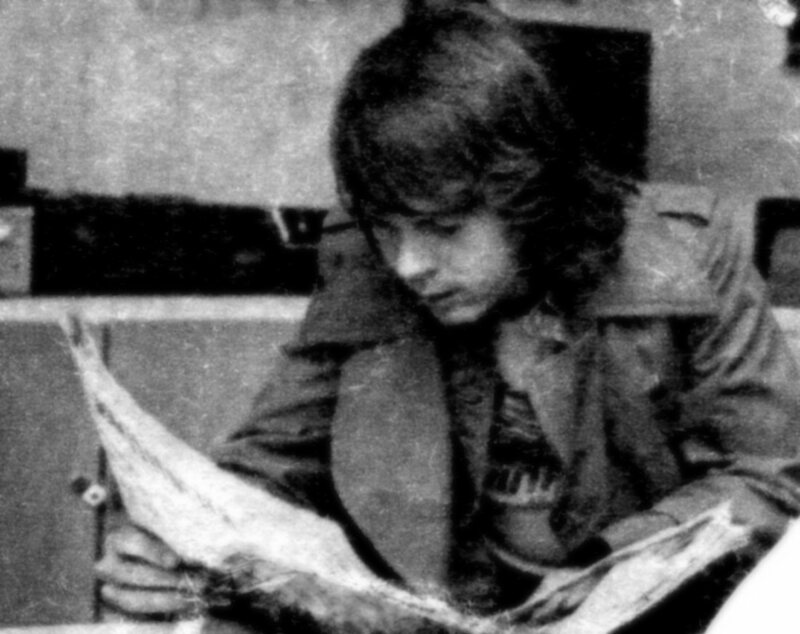 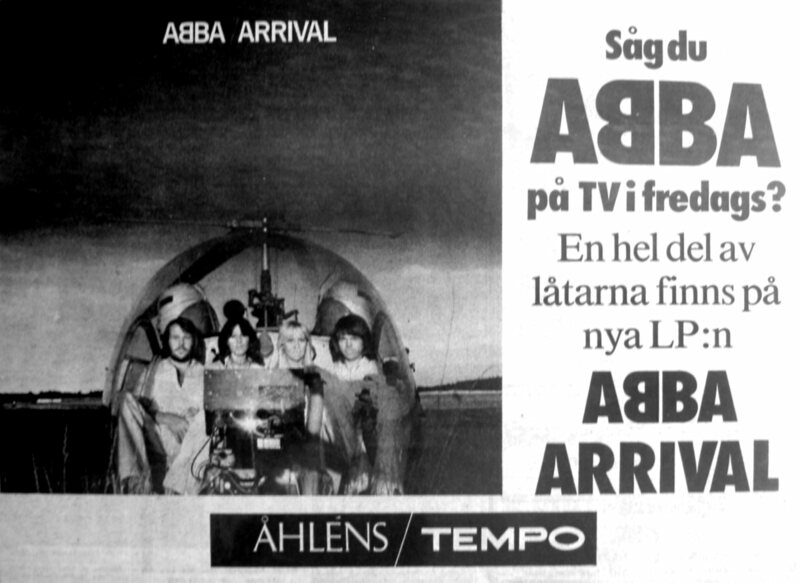 The article with the photos came out in "Allers" on 7 November 1976. 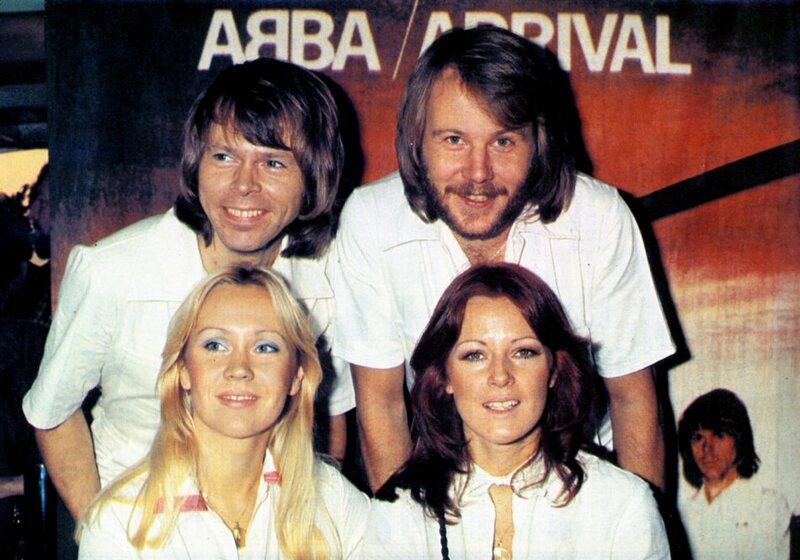 The compilation album "The Very Best of ABBA" was released in West Germany in September 1976. 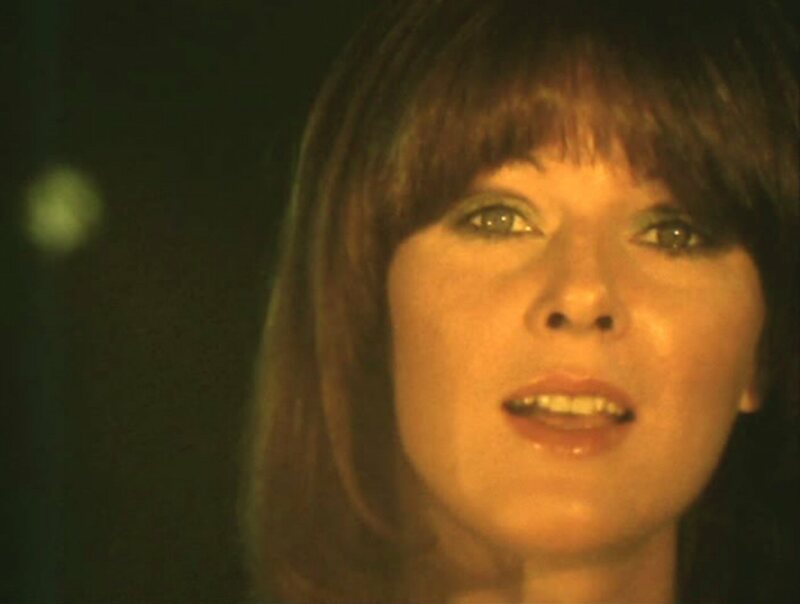 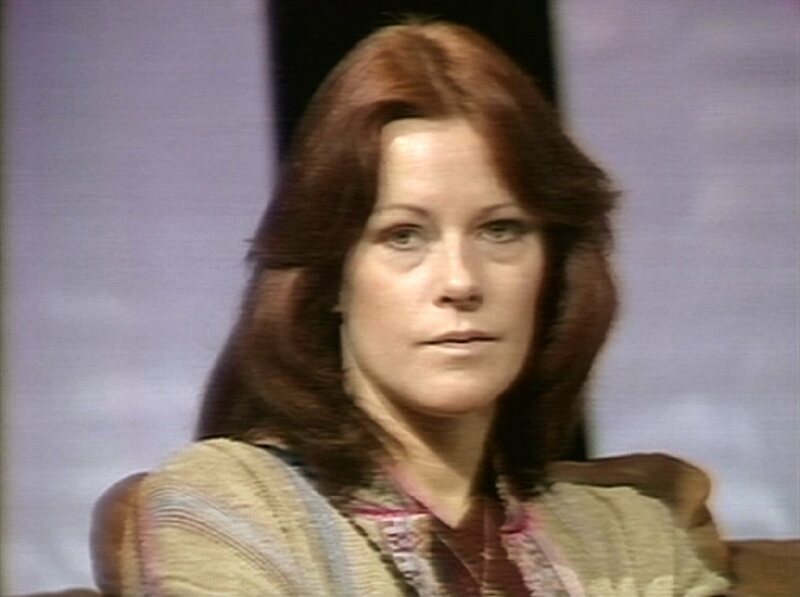 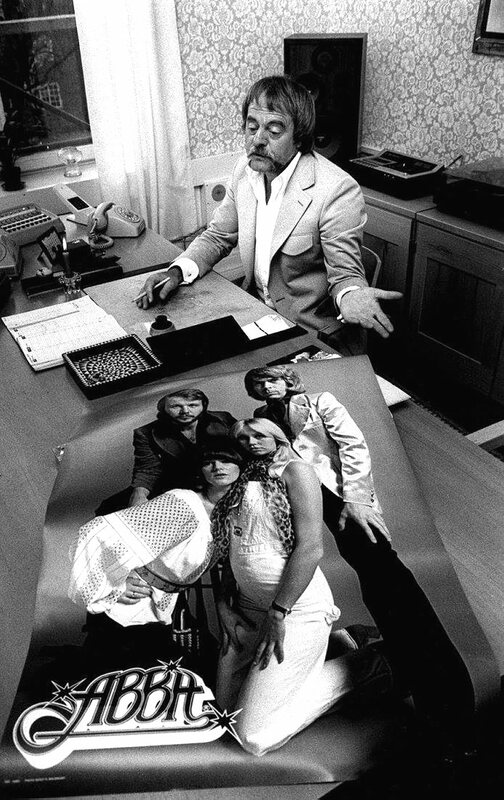 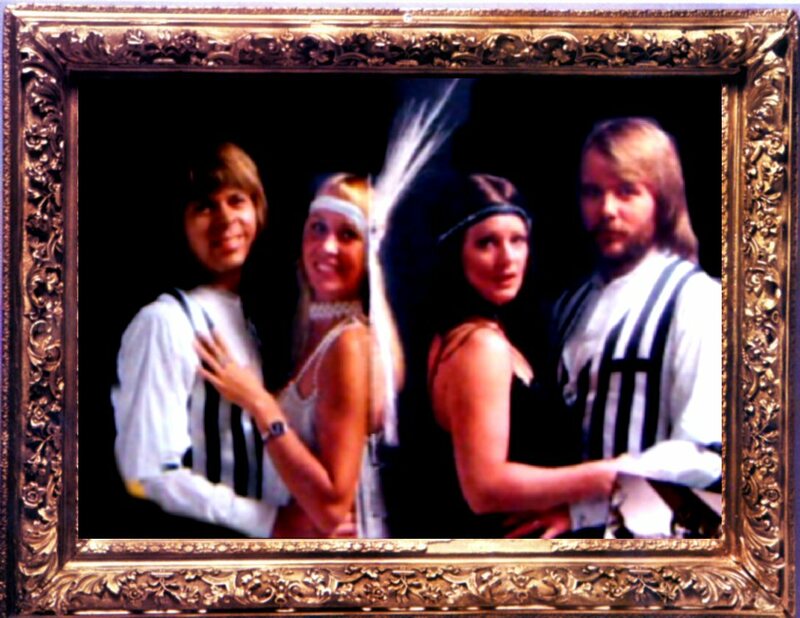 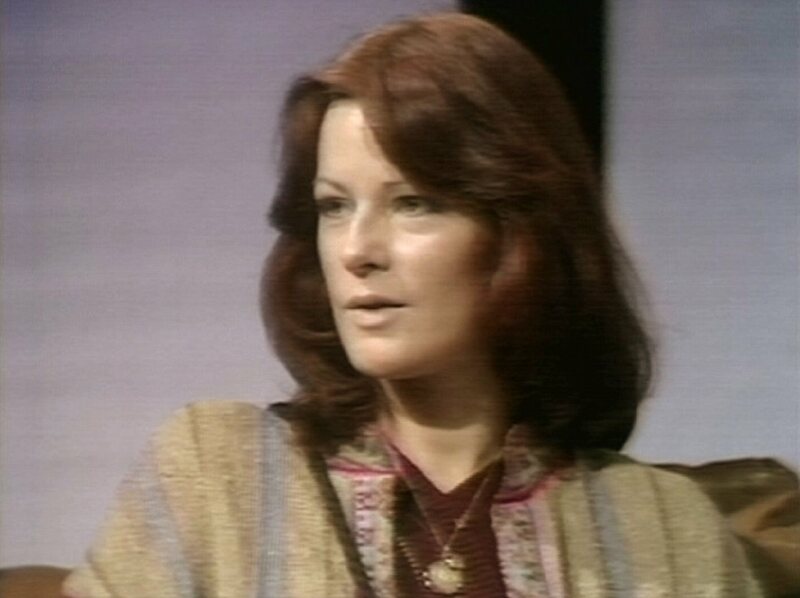 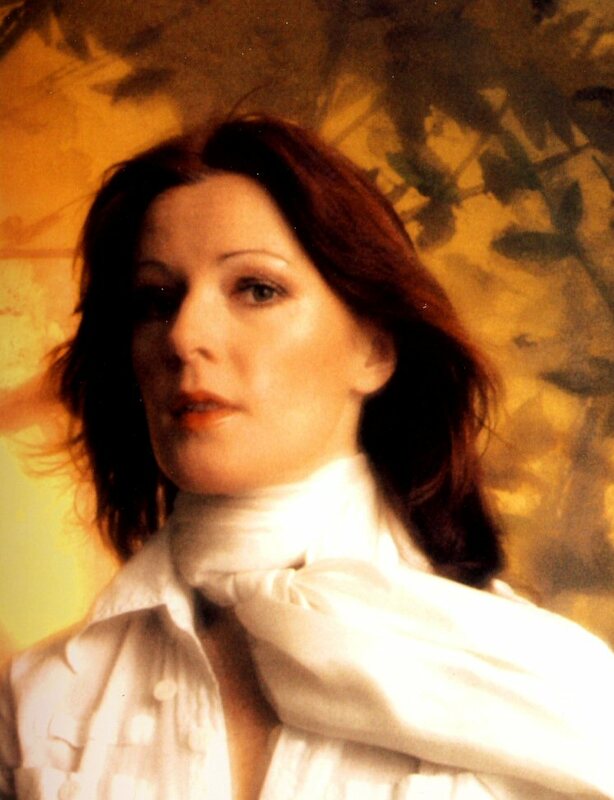 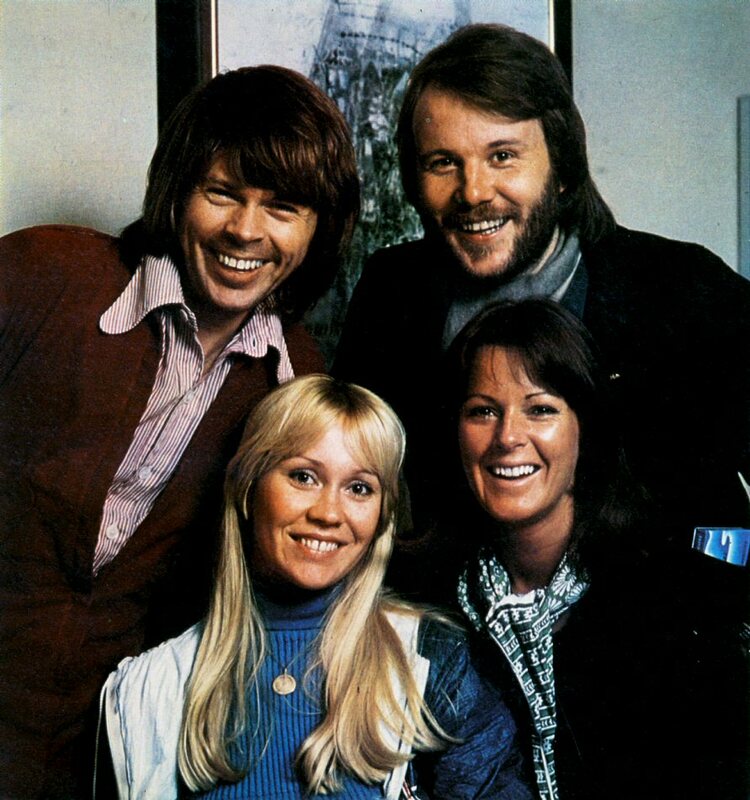 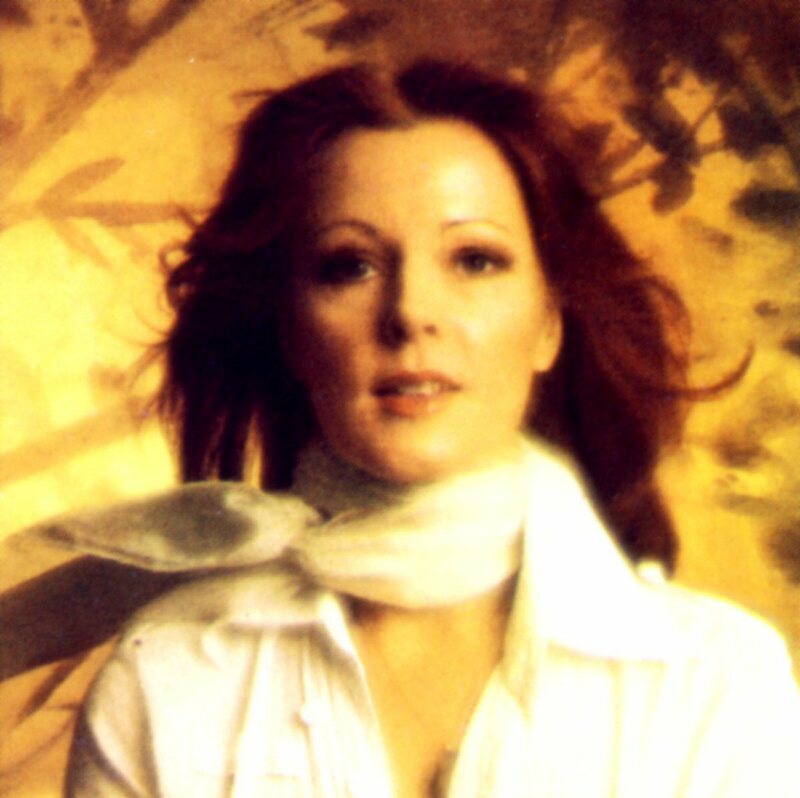 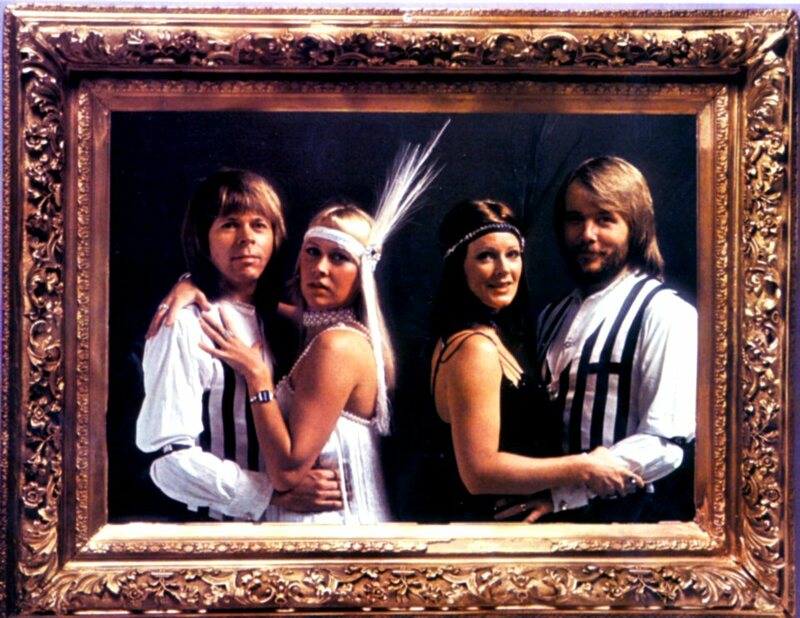 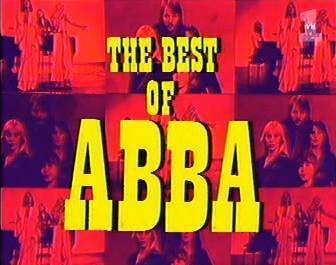 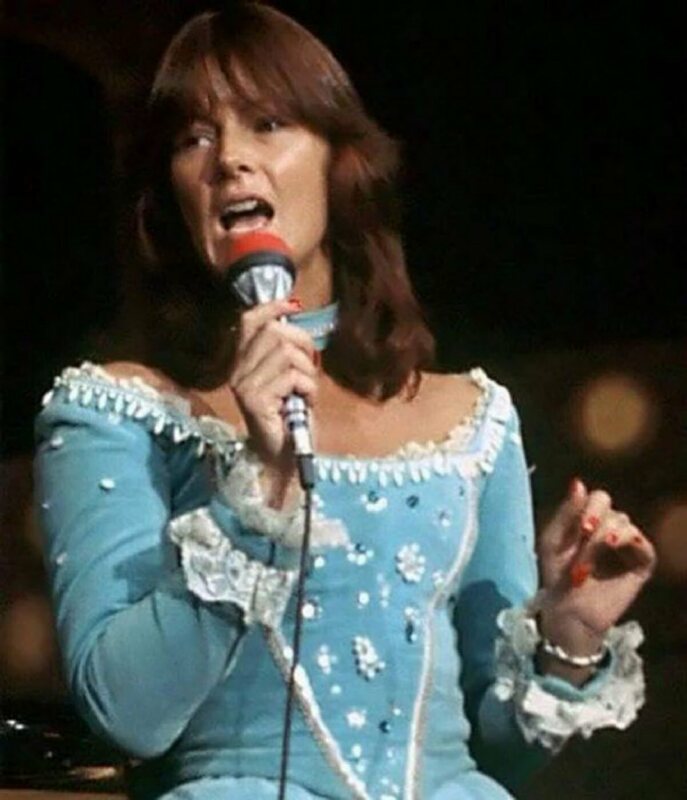 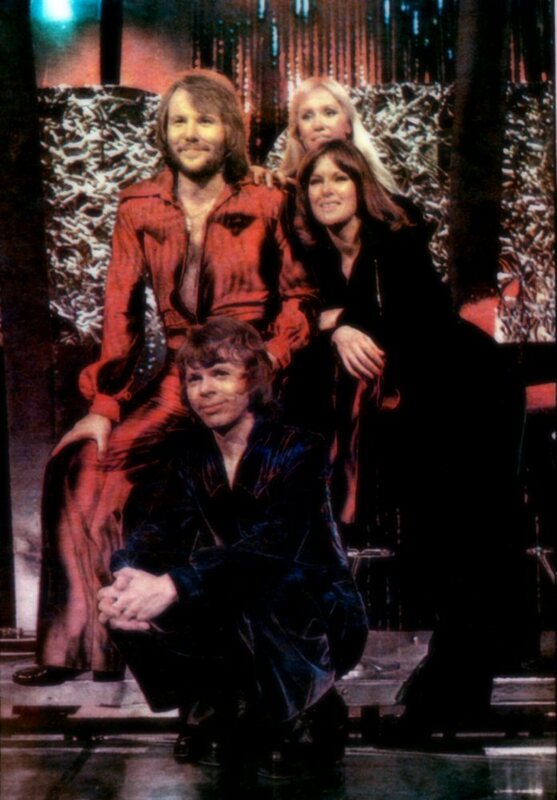 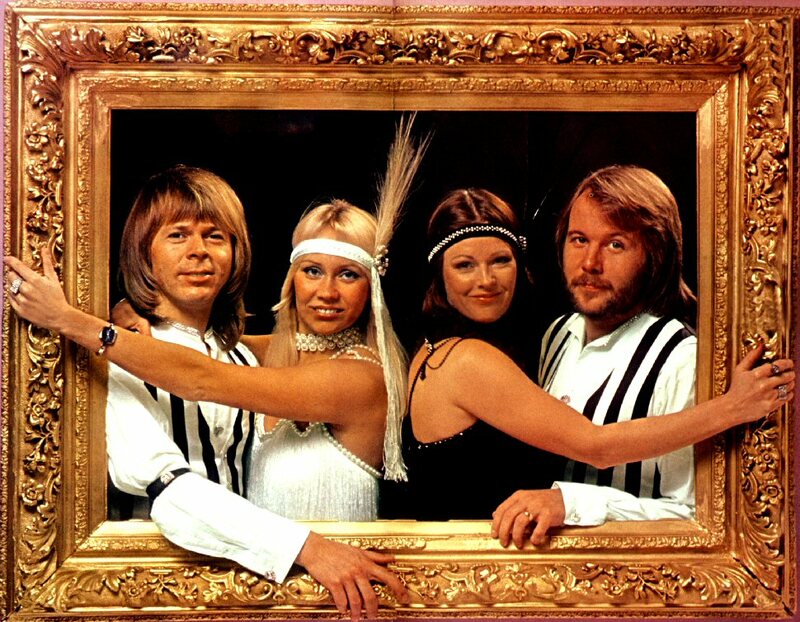 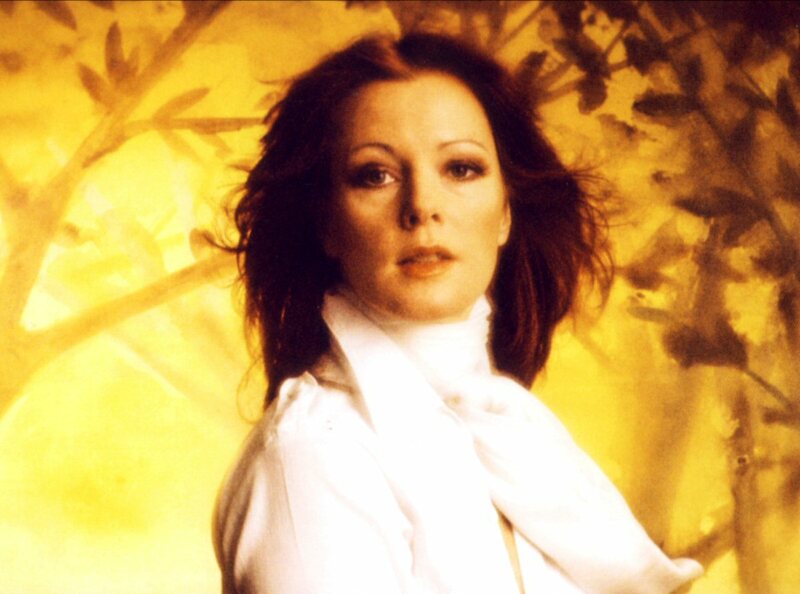 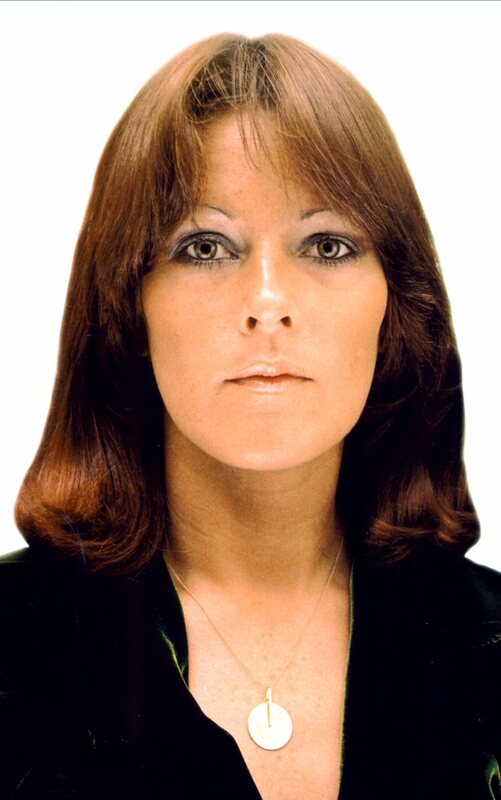 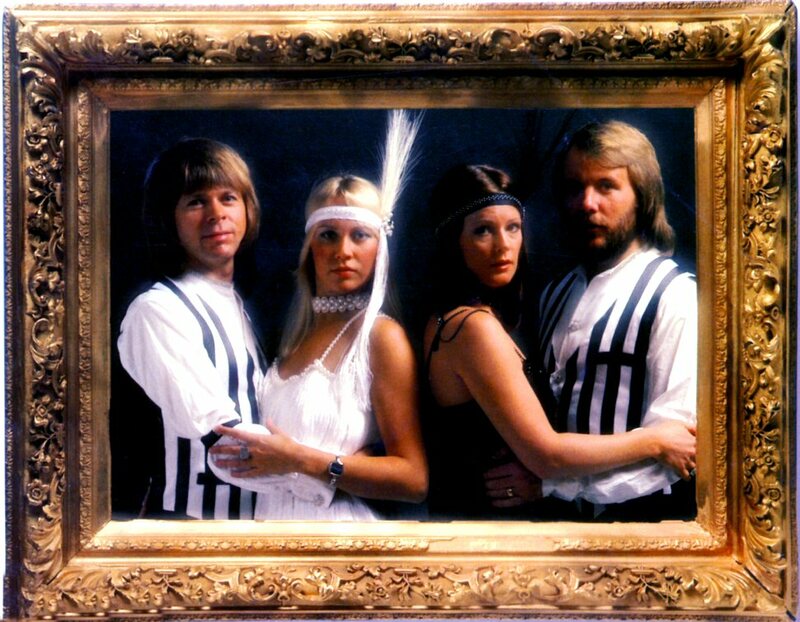 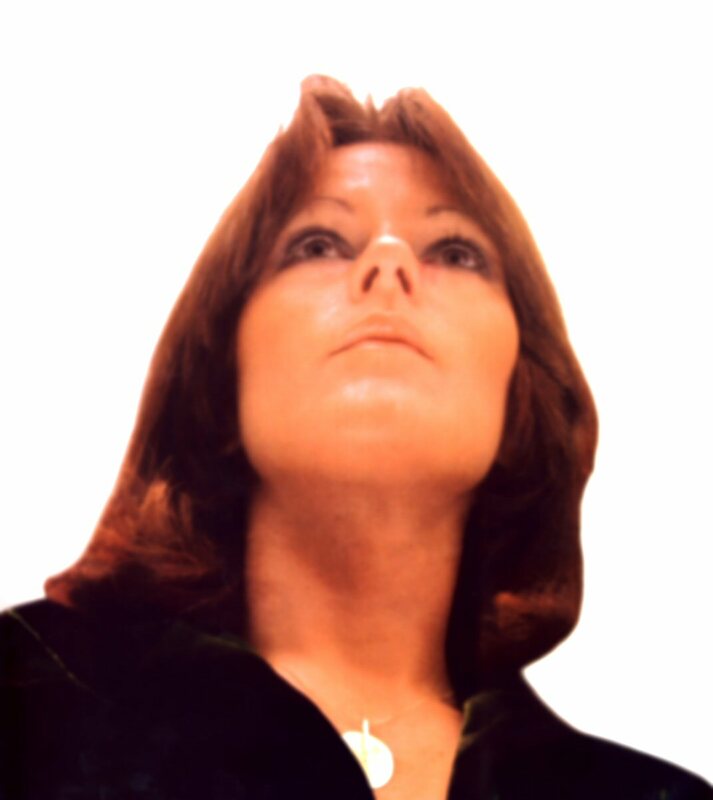 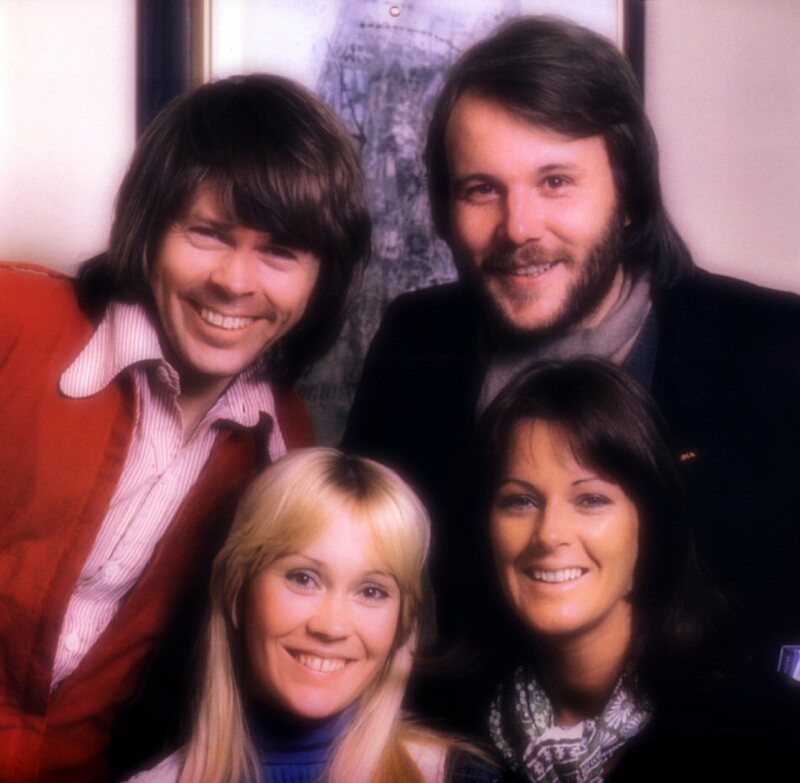 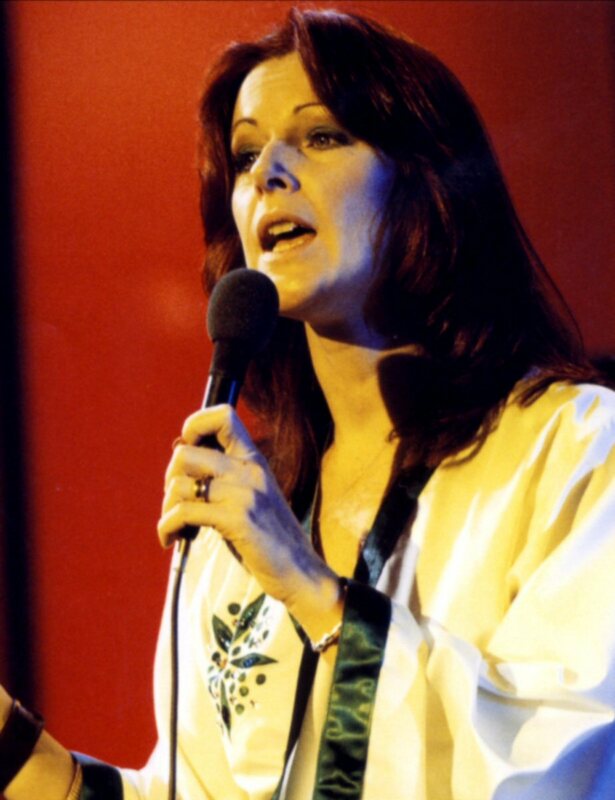 The pictures on the cover had been taken from the TV special "The best of ABBA" which was shown in the same month as the album was promoted. 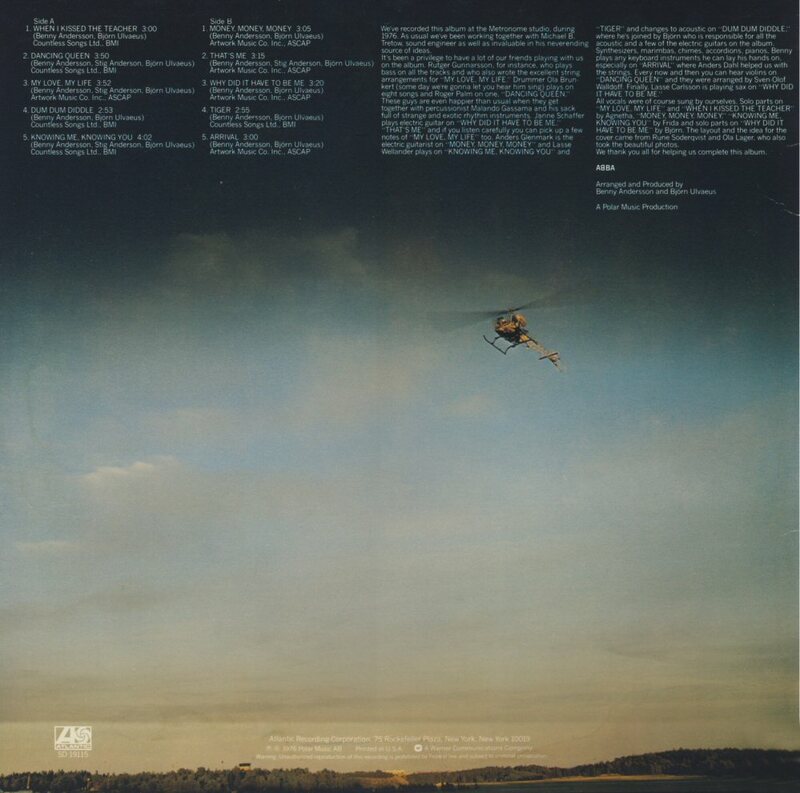 A short interview was printed inside the fold out cover of the album. 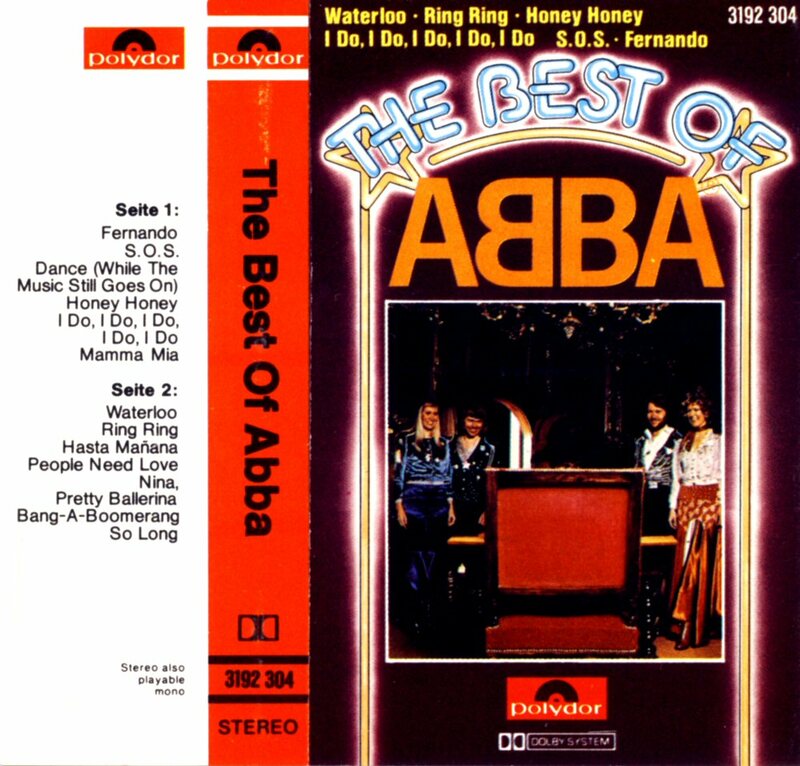 "The Very Best of ABBA" was released as 2LP & music cassette. 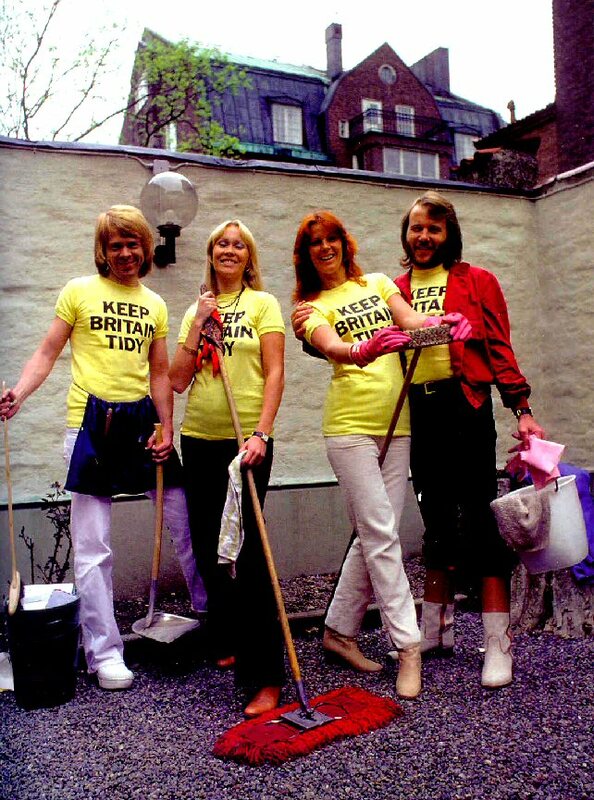 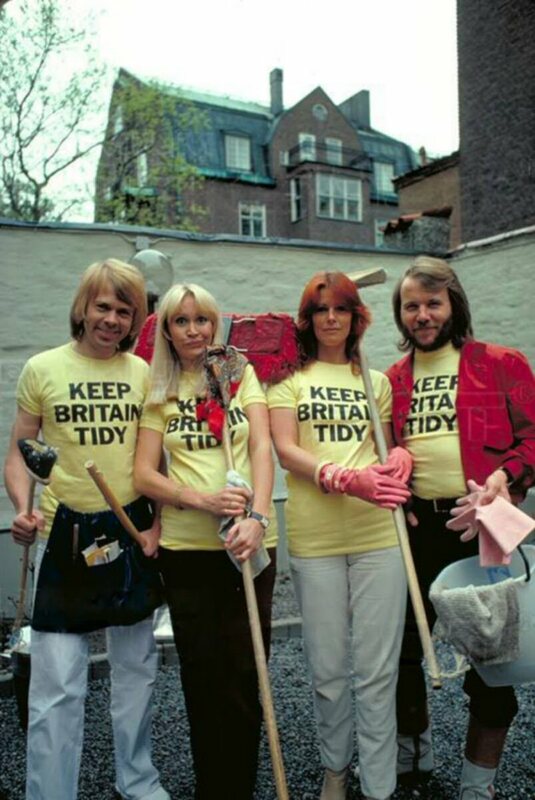 ABBA were avid supporters of the "Keep Britain Tidy" campaign and the photo session with tee-shirts and cleaning utensils was taken outside the Polar Music office in Baldersgatan in Stockholm. 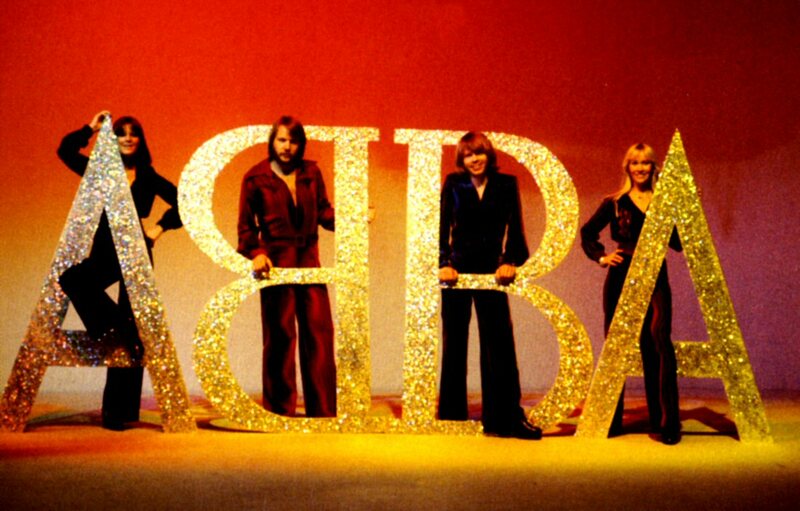 At the beginning of October ABBA paid a visit behind iron curtain - in Poland. 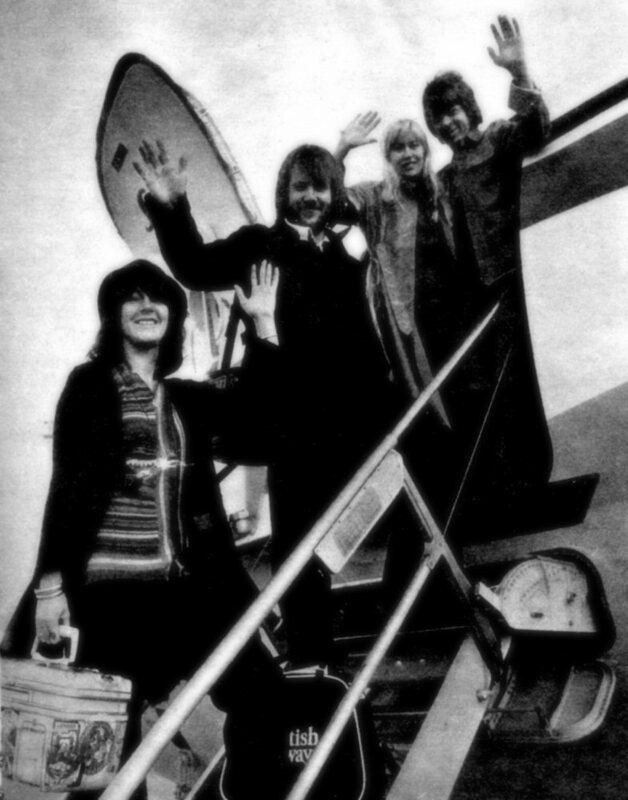 They went to Warsaw one week before the release of the new album "Arrival". 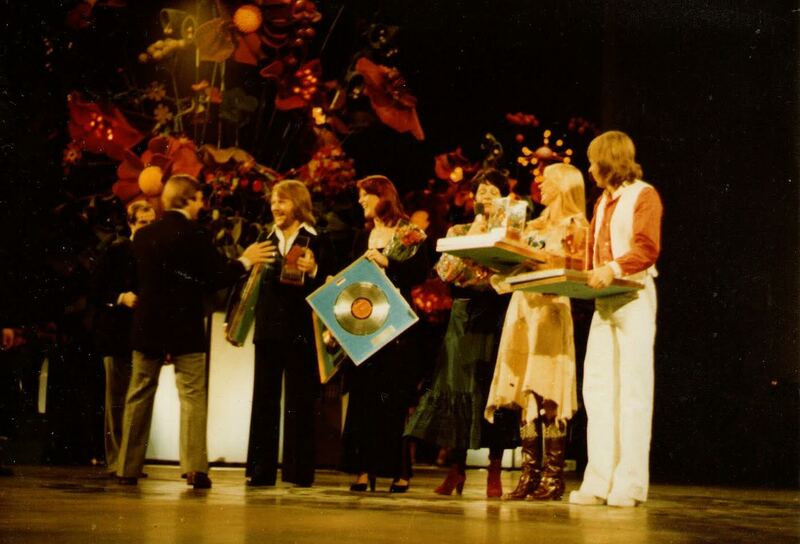 The Polish audience in the TV studio in Warsaw was probably the first audience in the world which could hear almost all the songs from the forthcoming album "Arrival". 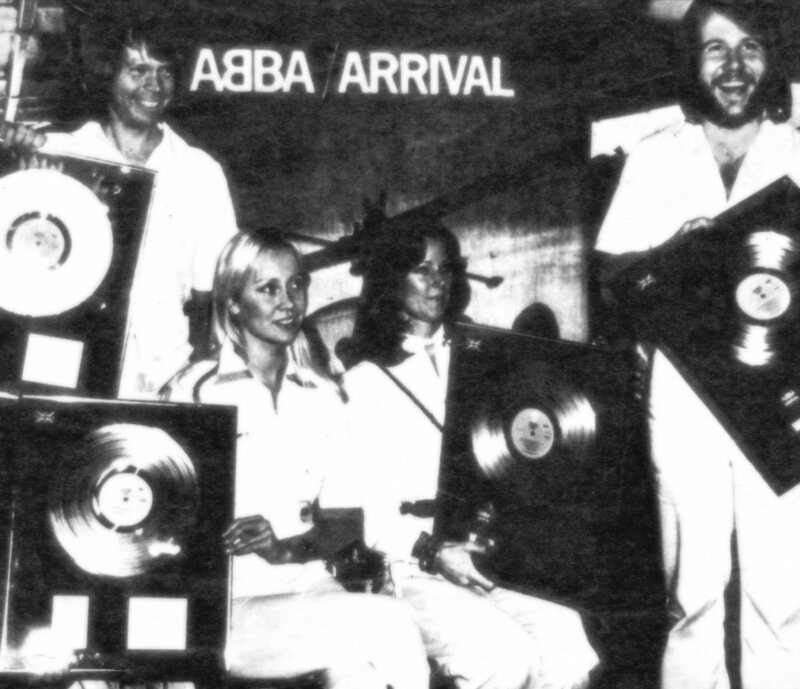 The fourth ABBA studio album was entitled "Arrival" . 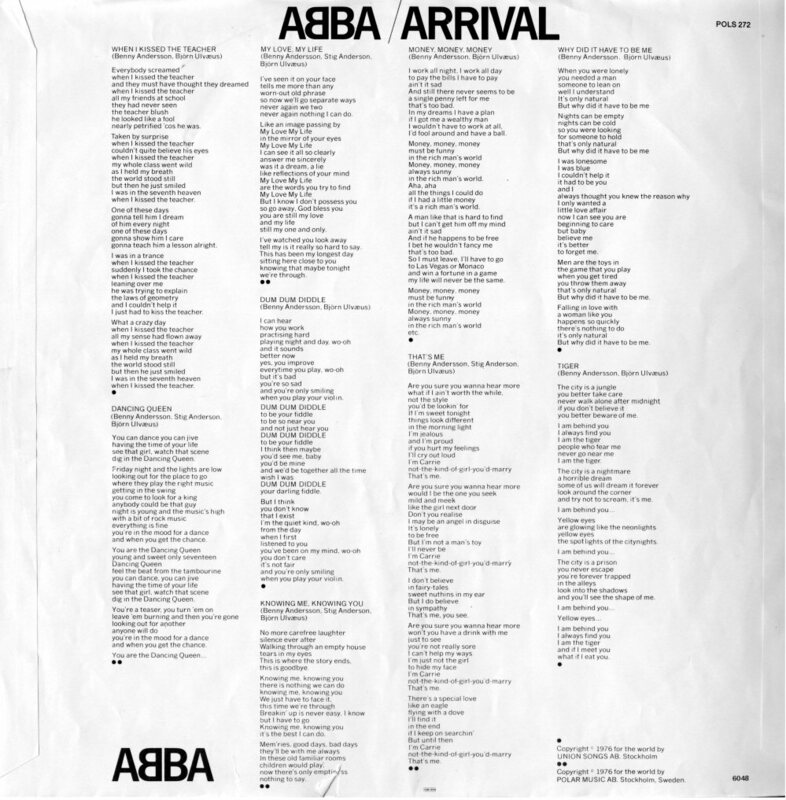 It contained 10 tracks including the instrumental composition "Arrival". 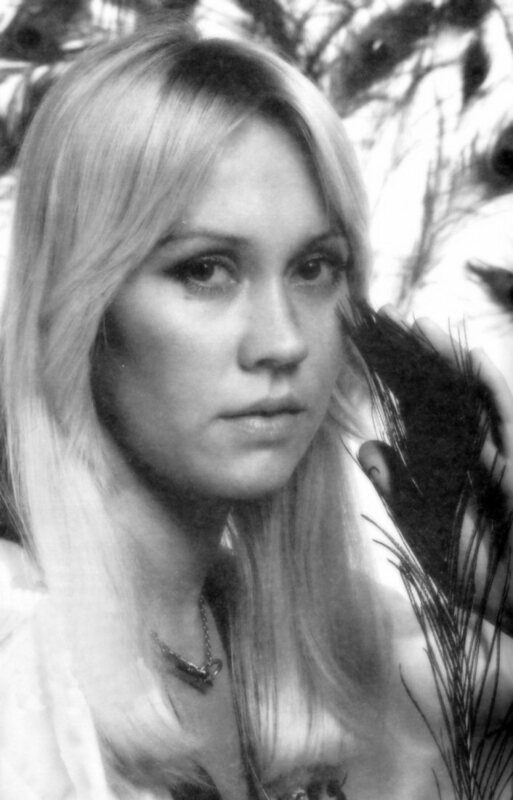 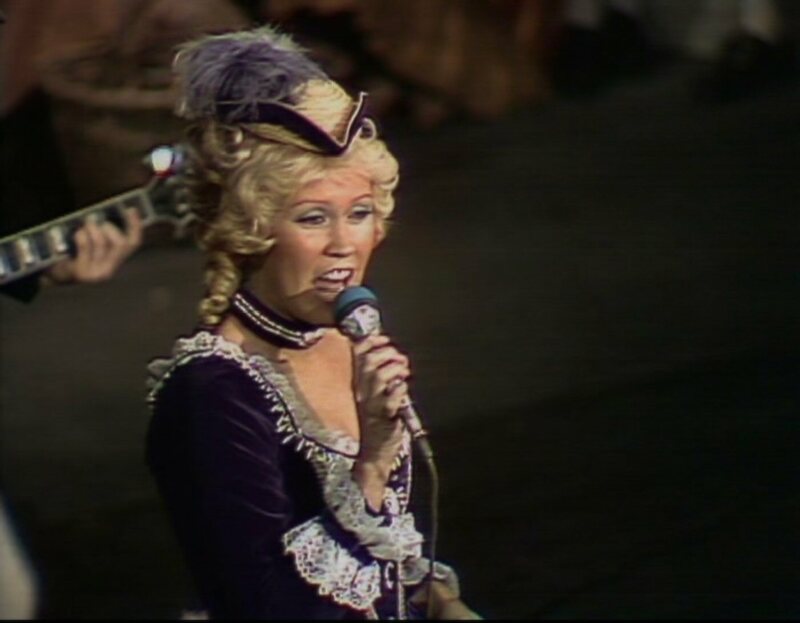 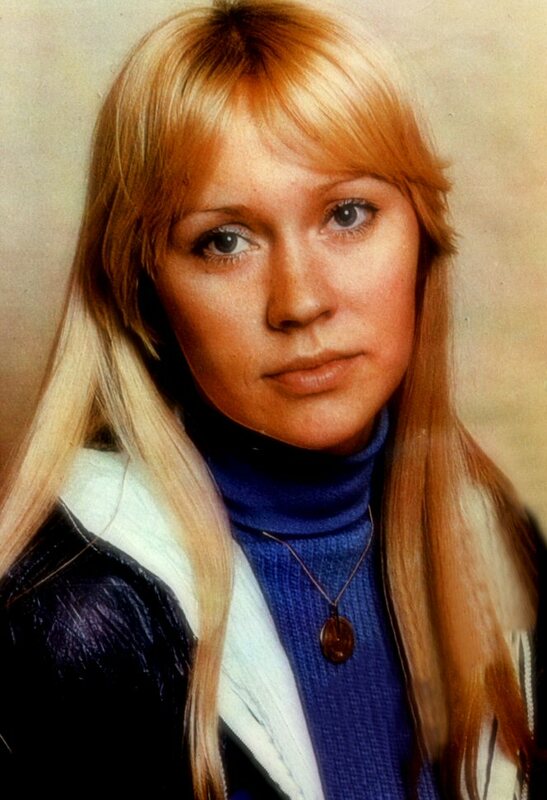 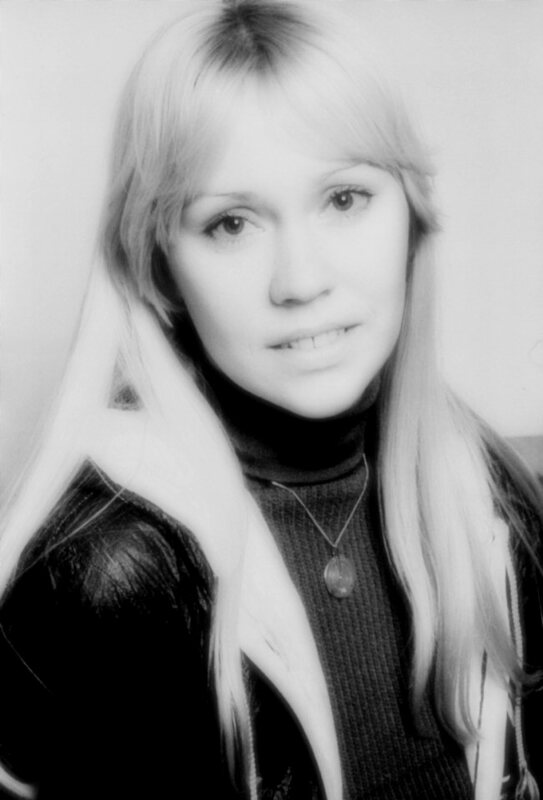 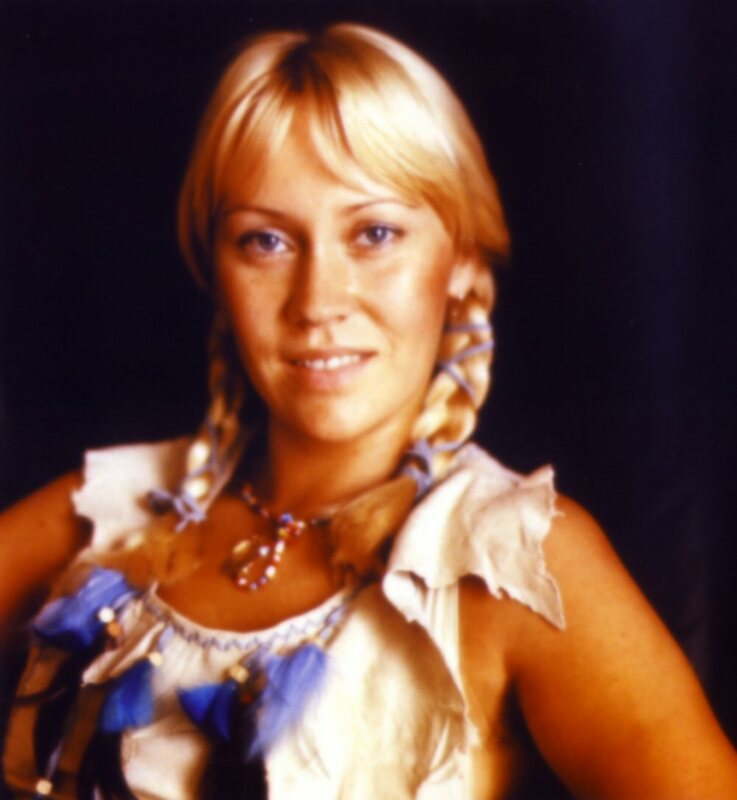 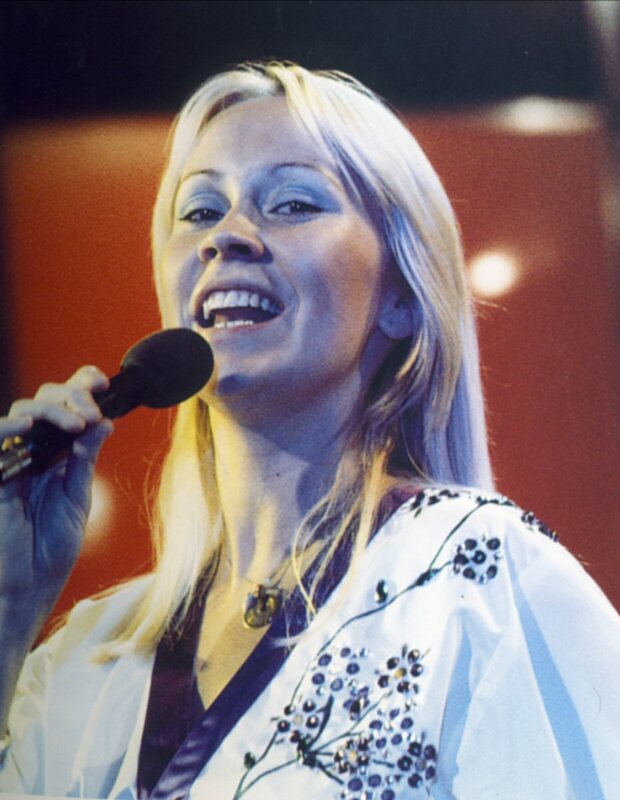 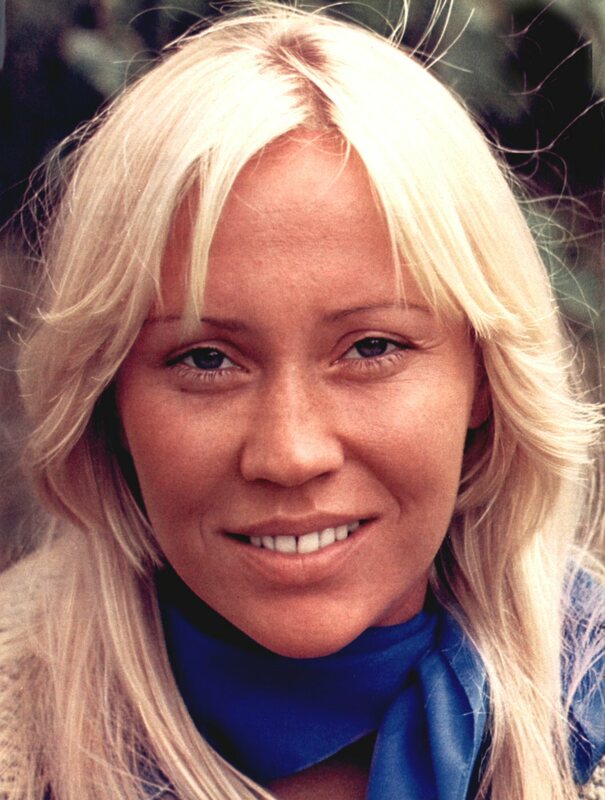 Agnetha had lead vocals on "When I Kissed The Teacher" and "My Love My Life". Frida sung two single hits "Money Money Money" and "Knowing Me Knowing You". 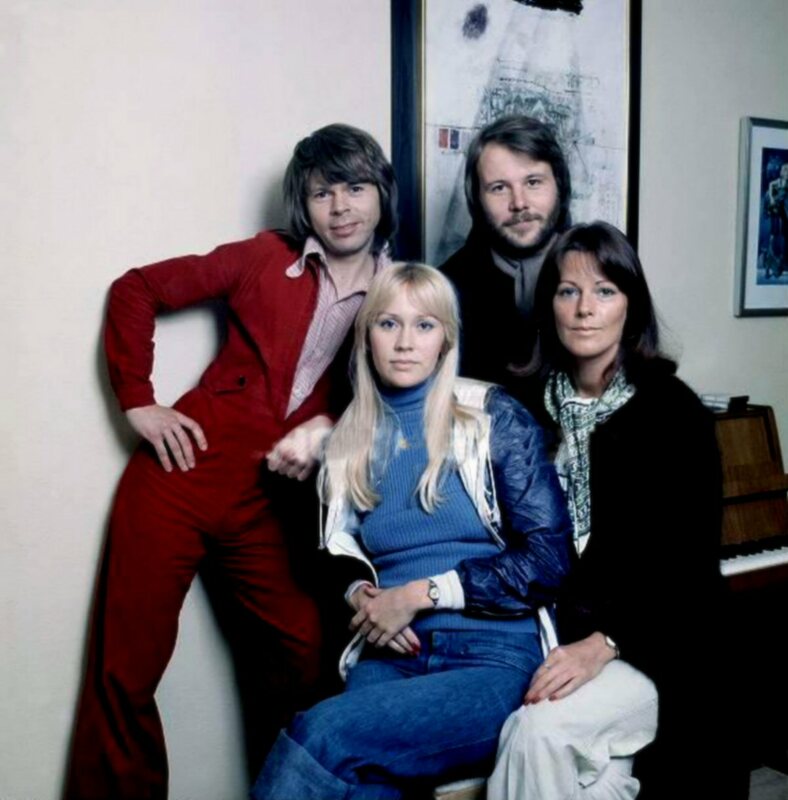 Björn had one lead vocal on "Why Did It Have To Be Me" which would become one of the highlights performed live by Björn and Frida on the upcoming tour in 1977. 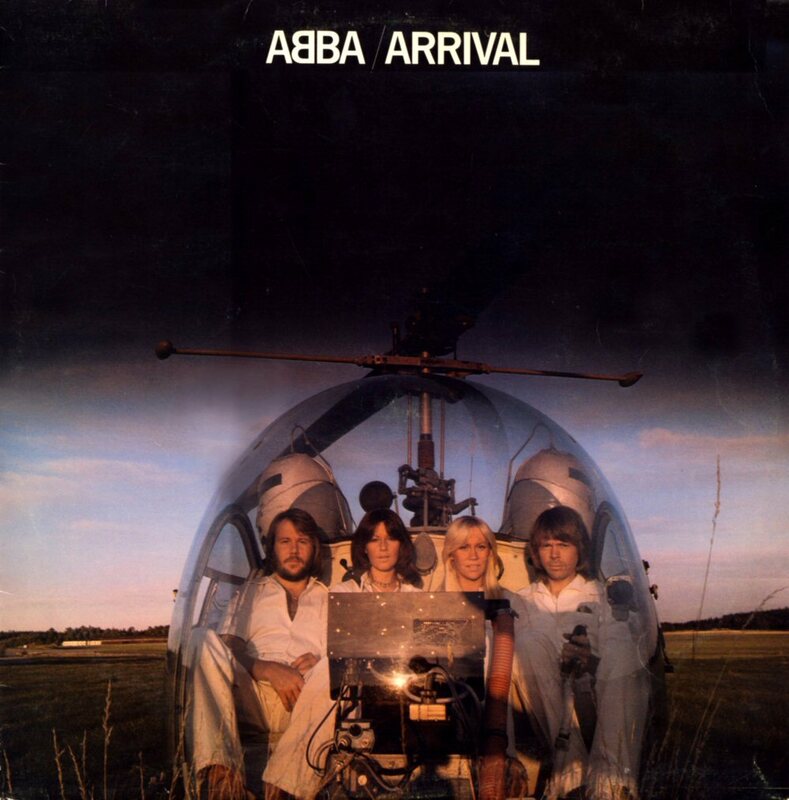 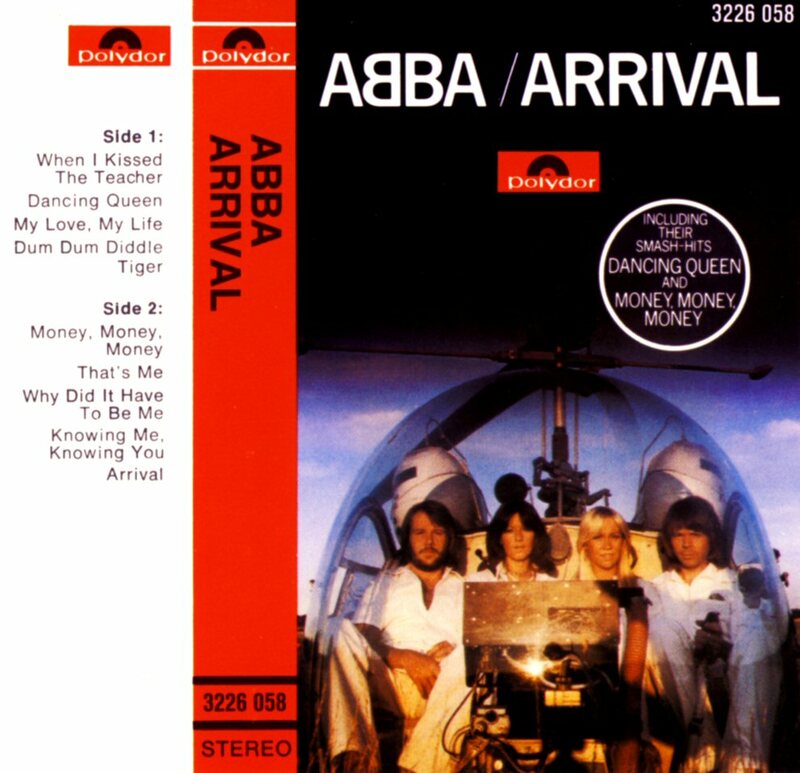 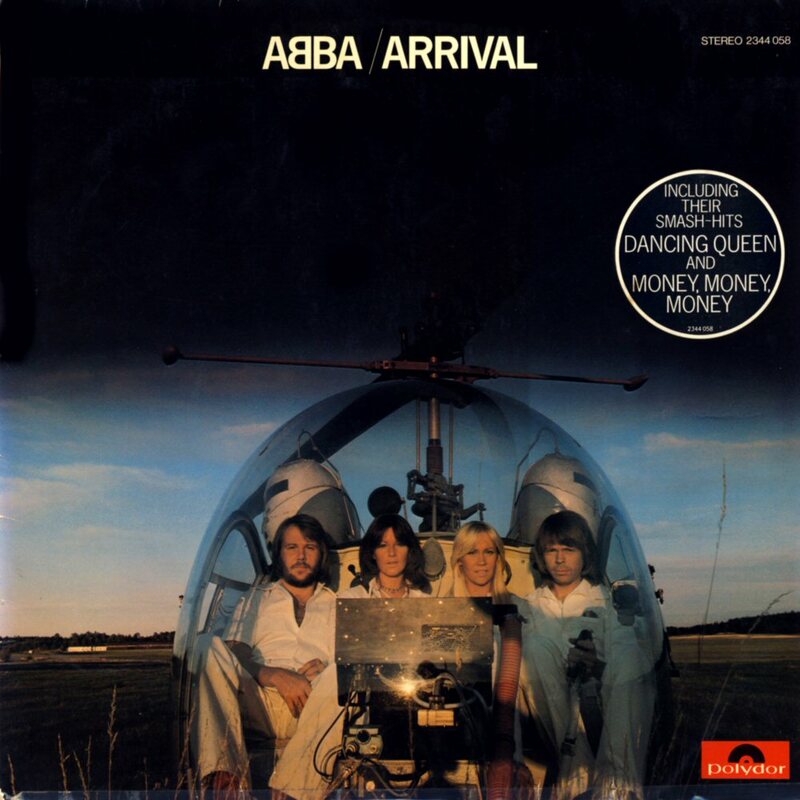 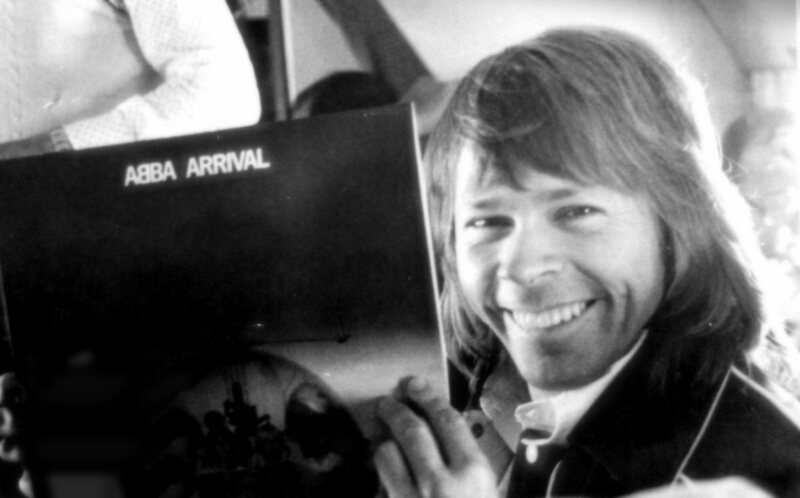 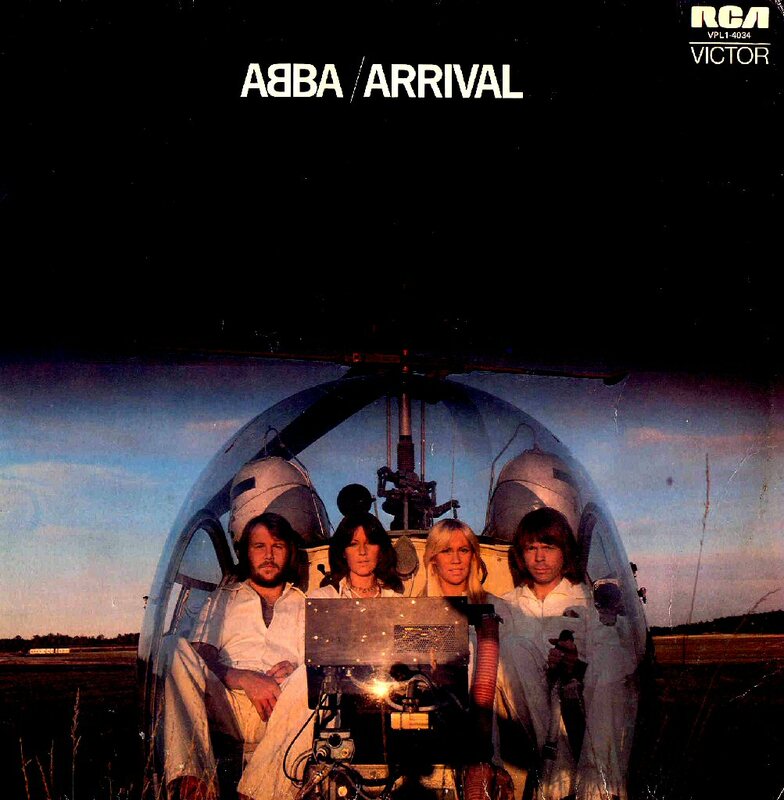 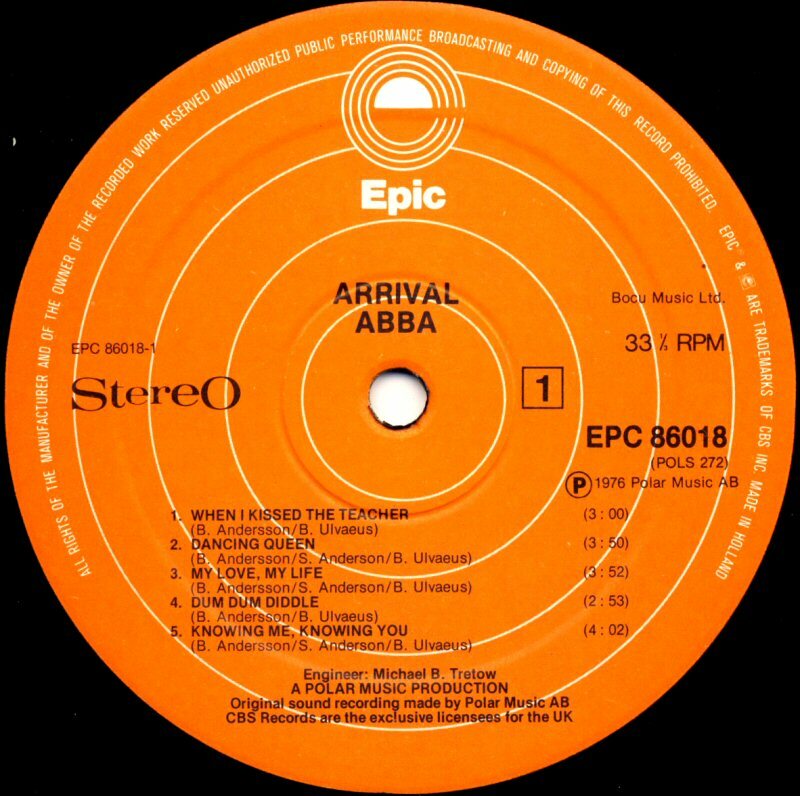 "Arrival" was undoubtedly one of the best albums ABBA ever did - commercially maybe the best one! The picture sessions were taken on the Barkarby airfield outside Stockholm (go.to/ABBA related places) if you want to know more). 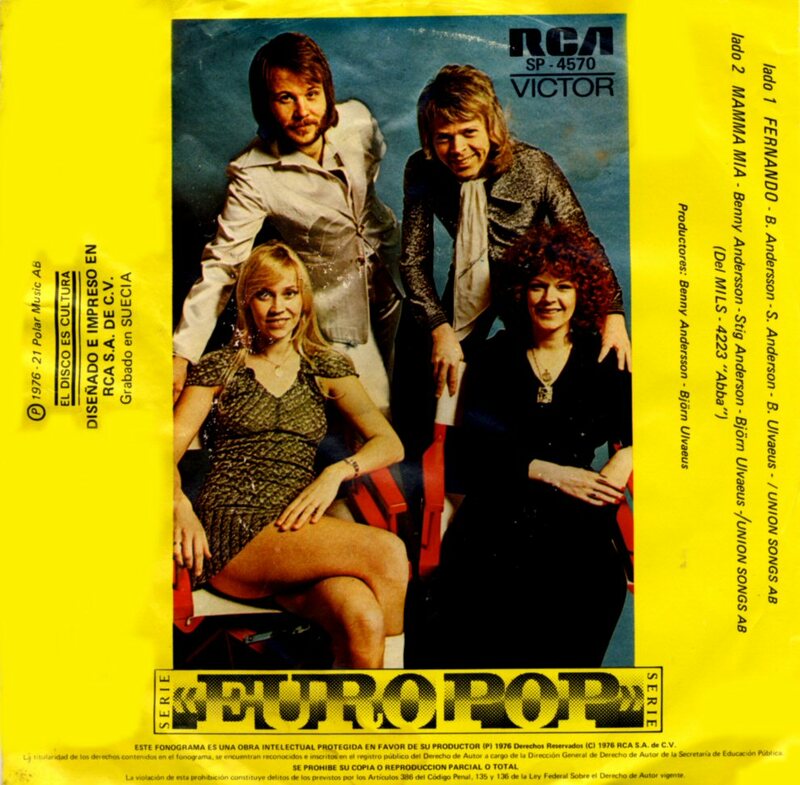 The front cover of the album was the same on all the releases all over the world except France, Bulgaria and East Germany. 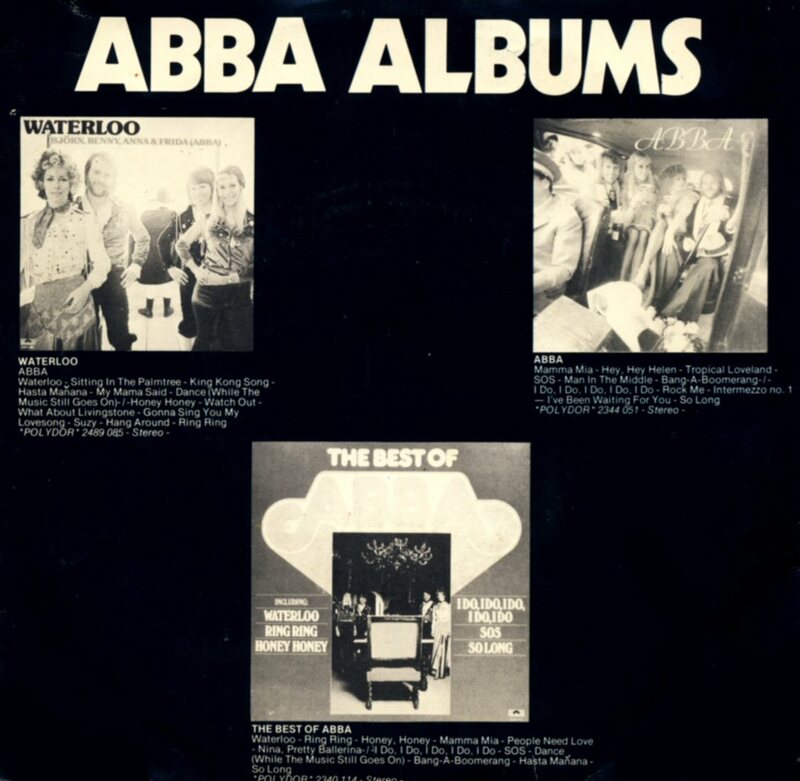 But... the rest of the album layout had some differences from country to country. 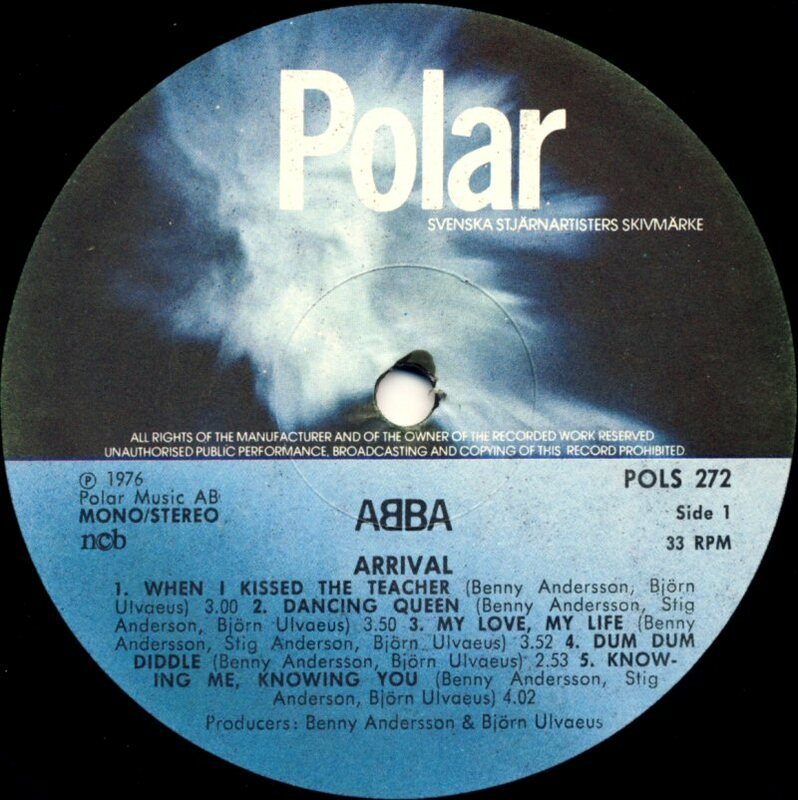 The Swedish "Polar" release can be probably considered as the "basic" one. 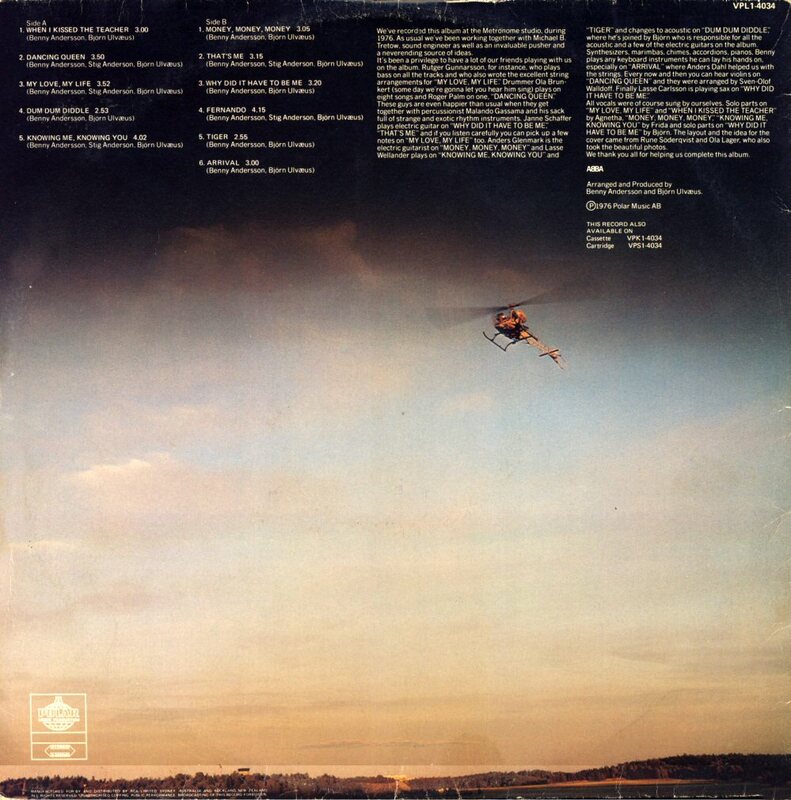 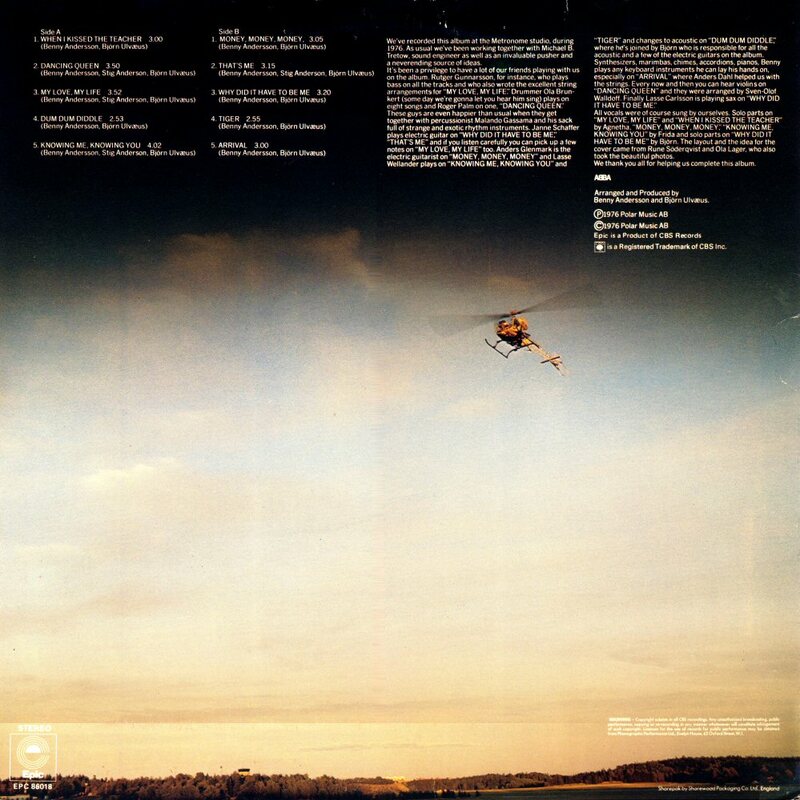 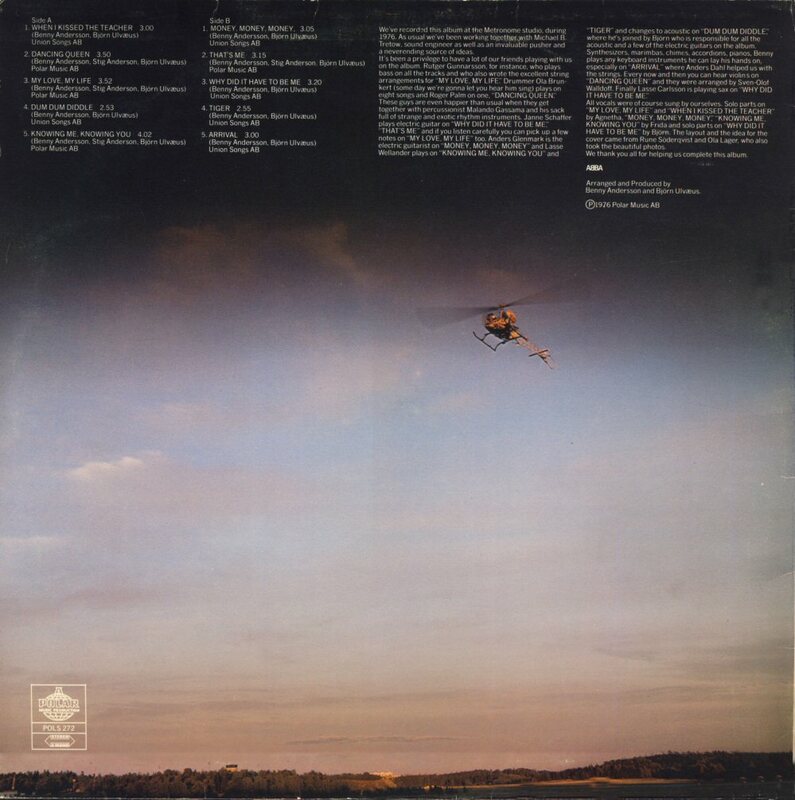 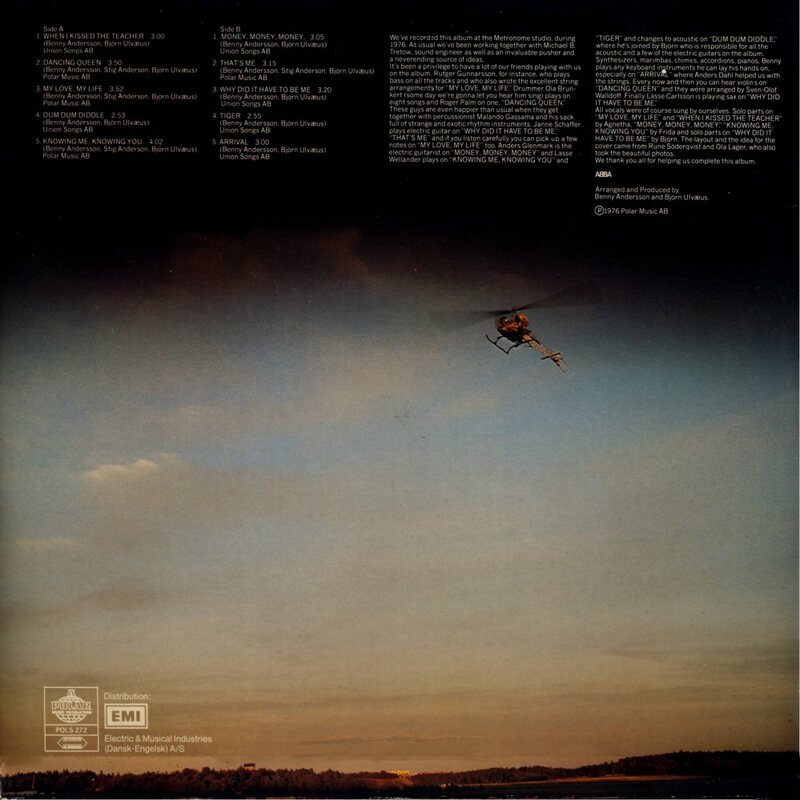 The front cover features the classical shot with the band members sitting in the helicopter. 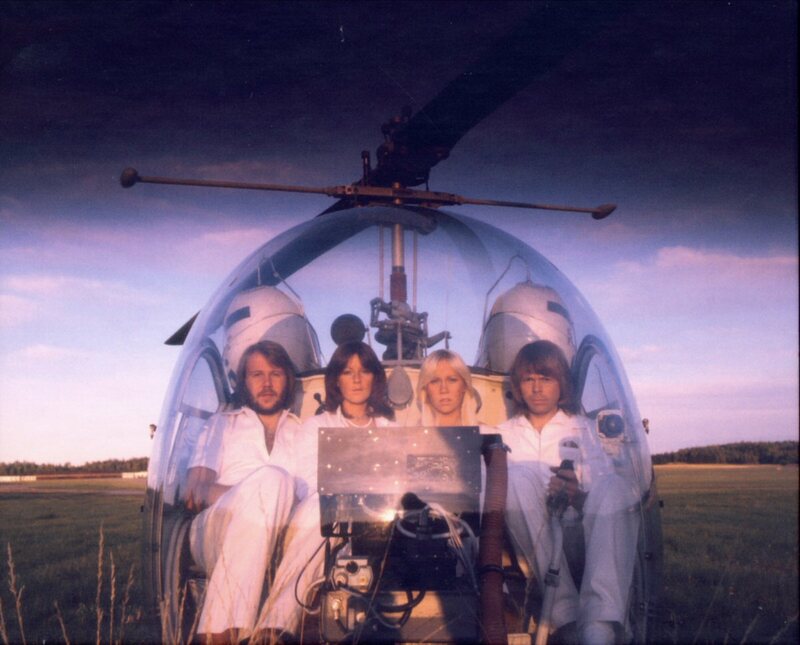 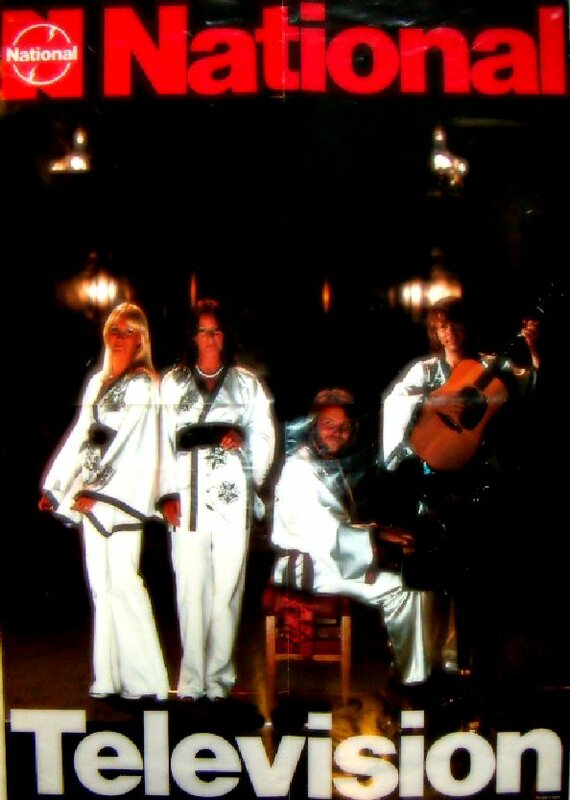 The inner sleeve has one more classical photo of ABBA taken at the Barkarby airfield outside Stockholm featuring the group in front of the helicopter. 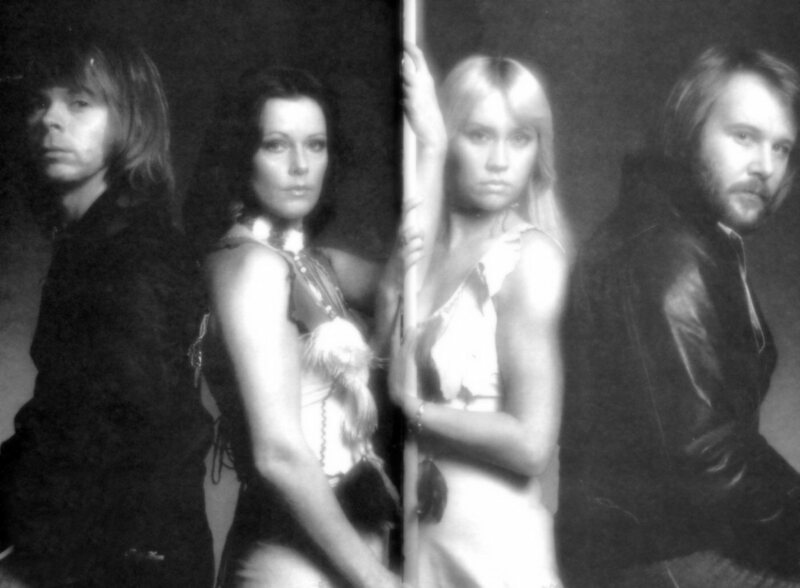 Alternative shots from this photo session are extremely hard to find. 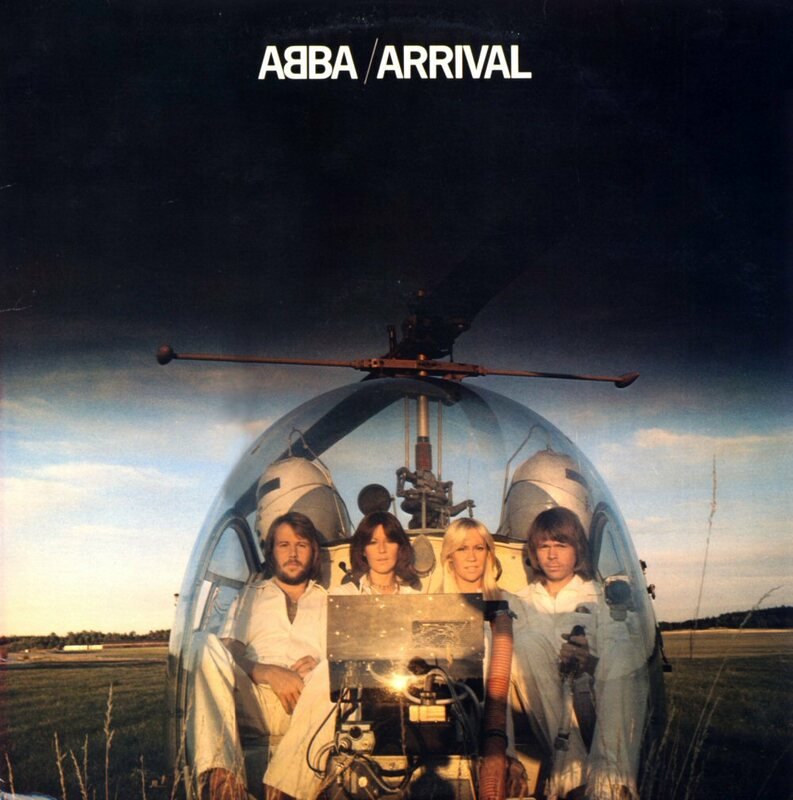 "Arrival" was released on October 11, 1976 in Scandinavia. 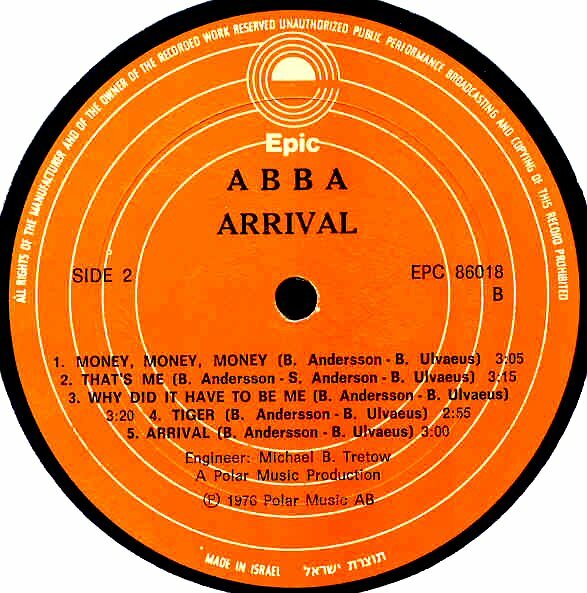 In Sweden the album saw its release as LP and MC and it entered the chart on October 19th, 1976 where it stayed for 32 weeks peaking at #1 (for 12 weeks). In Norway "Arrival" entered the chart on October 14th, 1976 where it stayed for 35 weeks reaching #1. 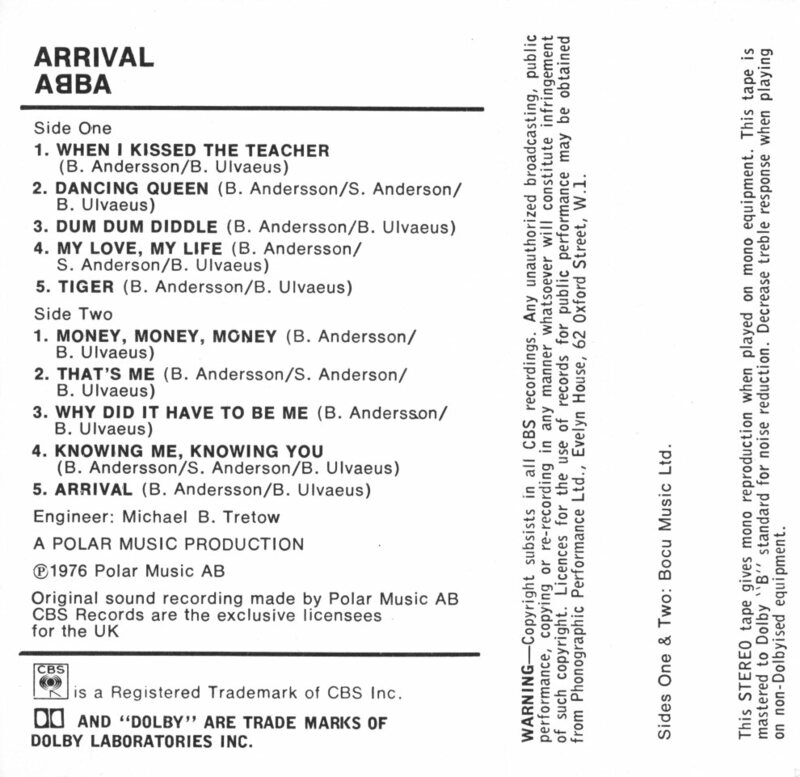 The cassette that followed the LP release featured changed track listing probably in order to achieve the same length on the both sides of the tape. 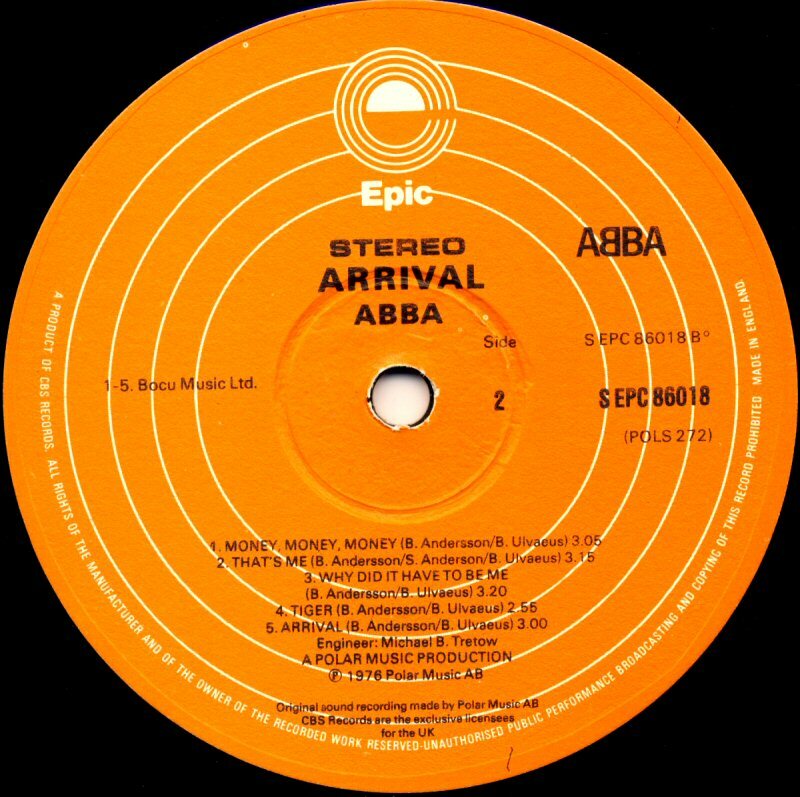 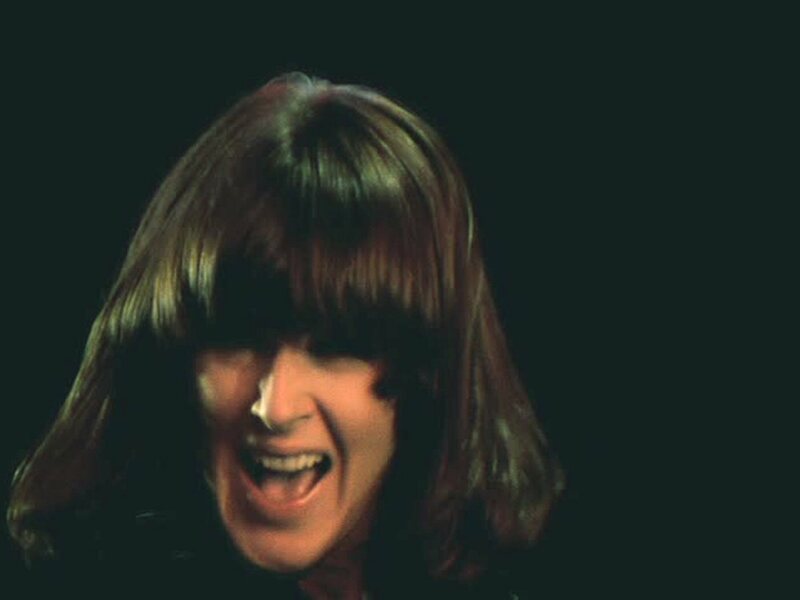 "Arrival" was a giant success in the UK where it entered the chart on November 27th, 1976 and stayed there for coming 92 weeks peaking at #1. 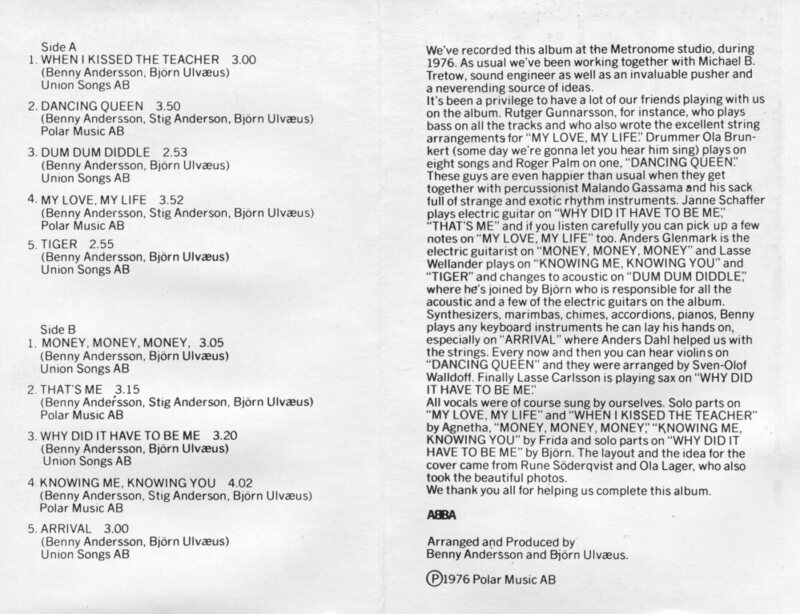 The MC featured different track listing. 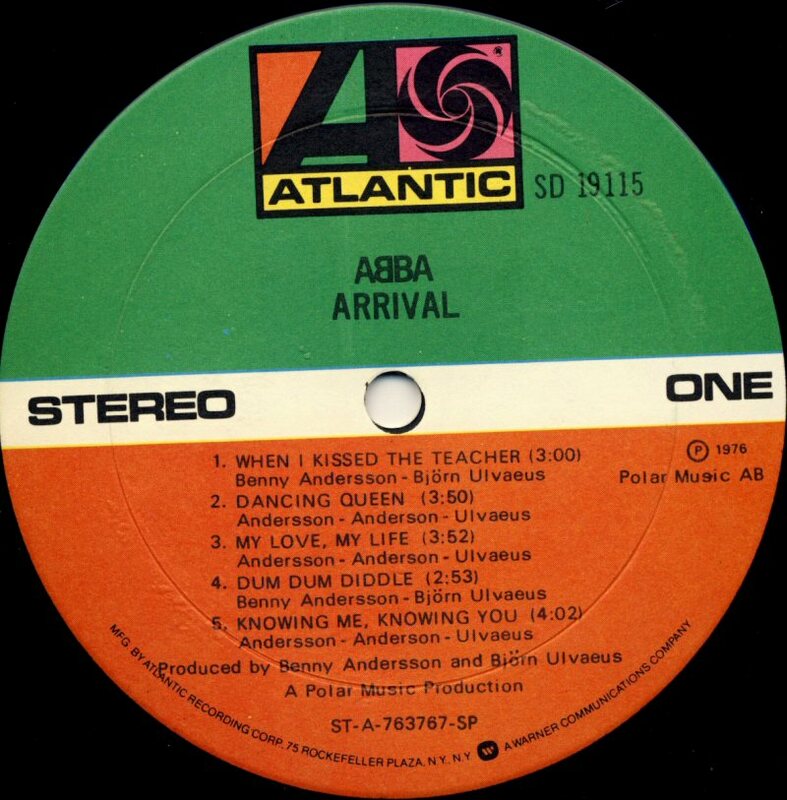 In Holland "Arrival" entered the LP chart on November 6th, 1976 and stayed there for 49 weeks peaking at #1 (for 8 weeks). 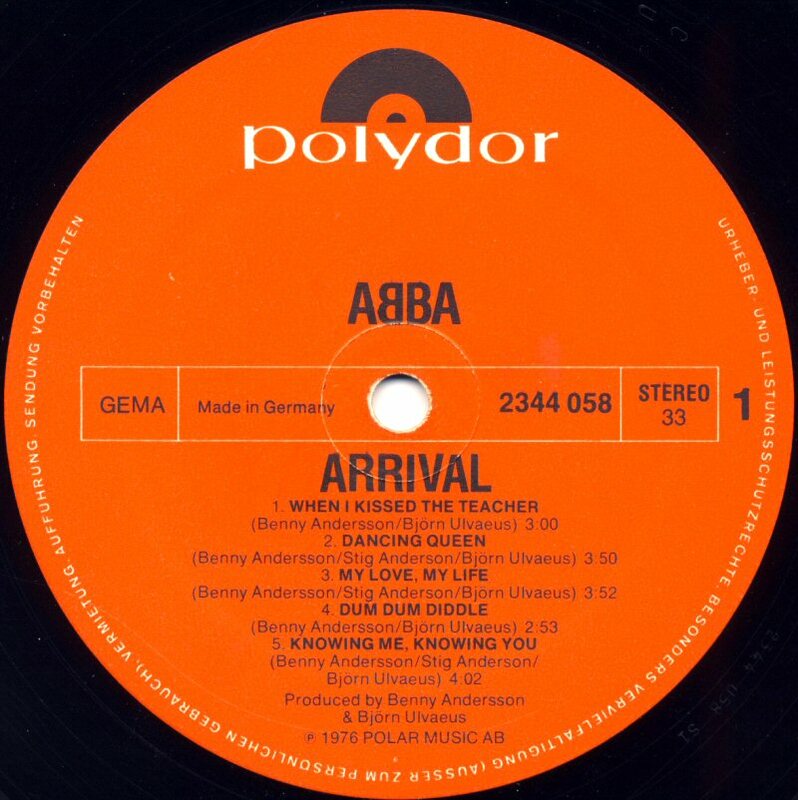 In West Germany "Arrival" entered the chart on December 15th, 1976 and stayed there for 76 weeks reaching #1 (for 18 weeks). 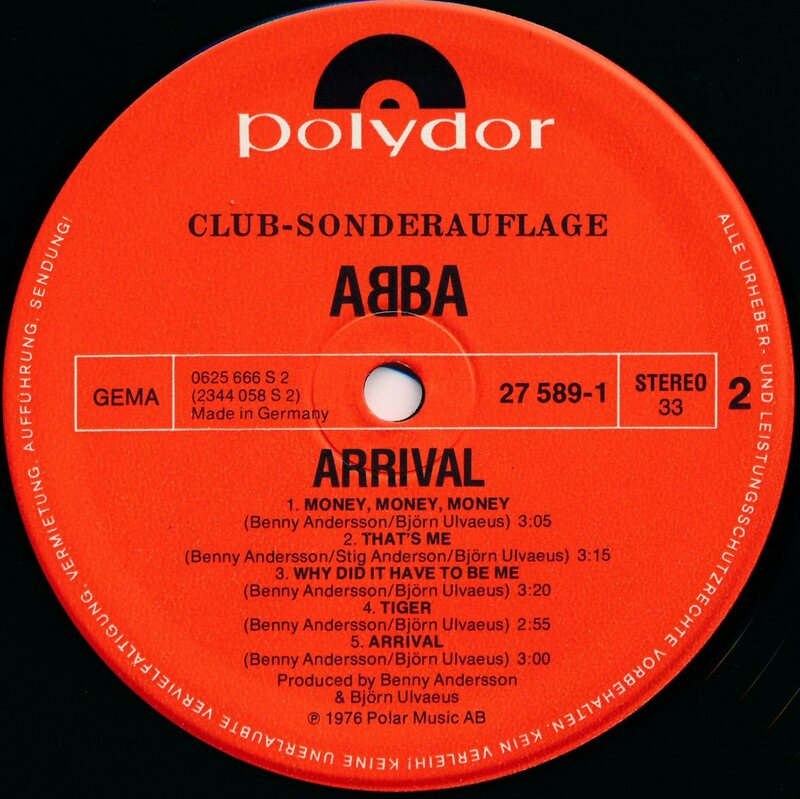 "Arrival" entered the Austrian LP chart on January 15th, 1977 and stayed there for 32 weeks peaking at #12. 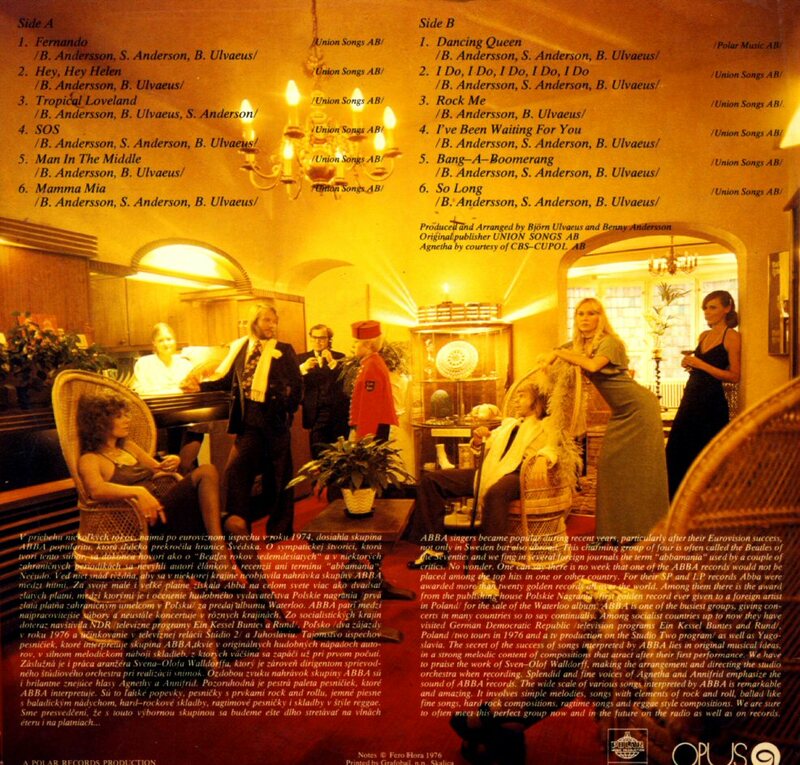 The Austrian version of the album featured different back cover. 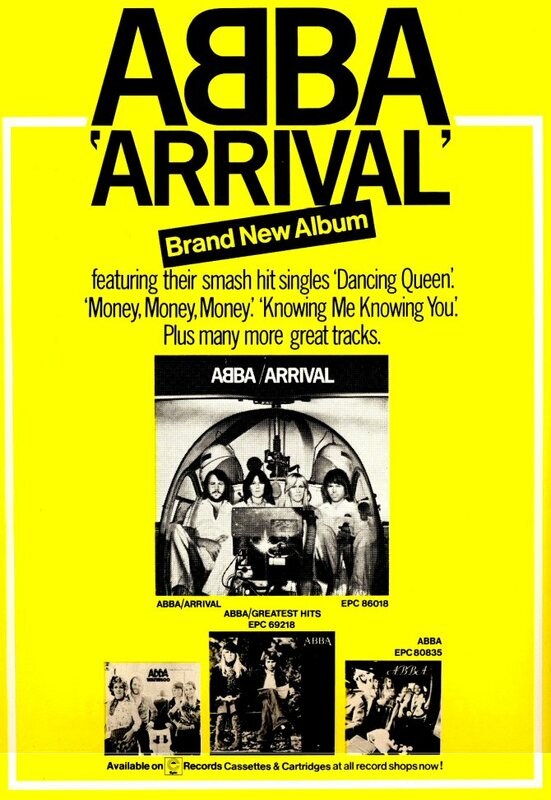 On January 22nd, 1977 "Arrival" entered the Billboard album chart where it stayed for 50 weeks peaking at #20. 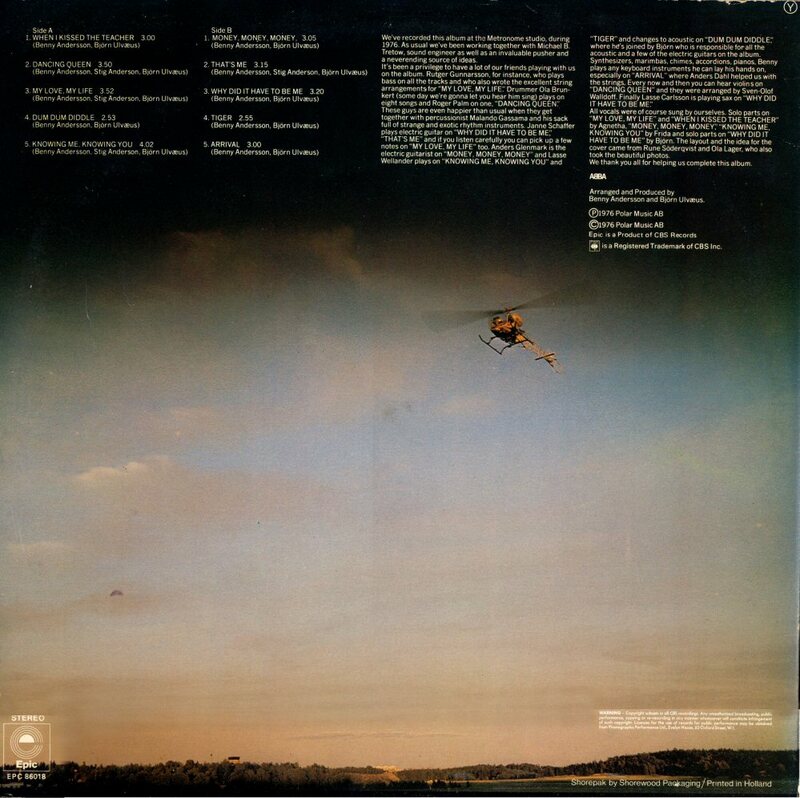 Epic released "Arrival" in Israel with different back cover. 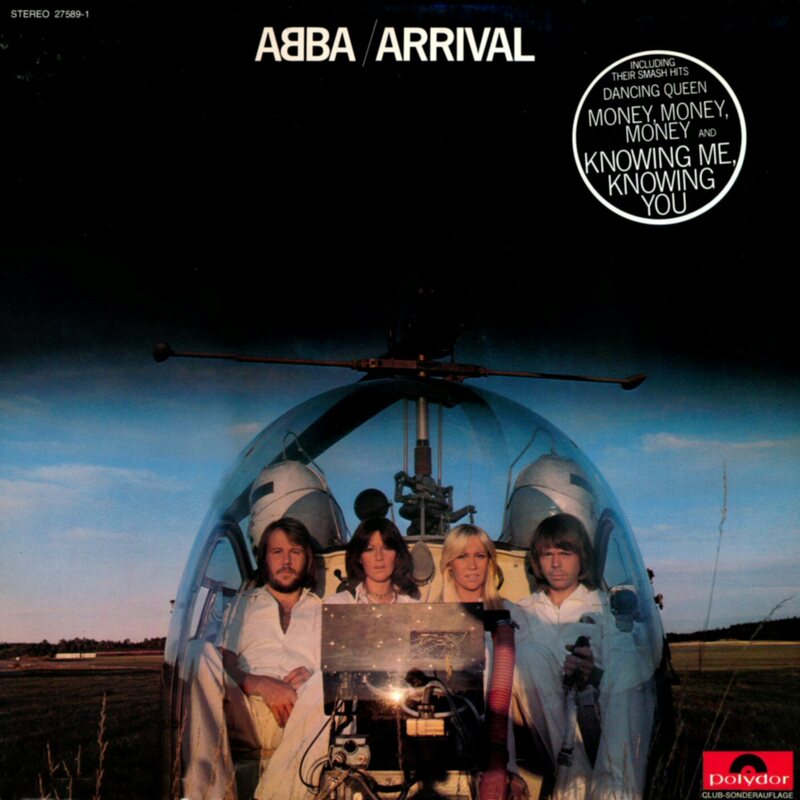 The album "Arrival" saw its release in France on November 12th, 1976. 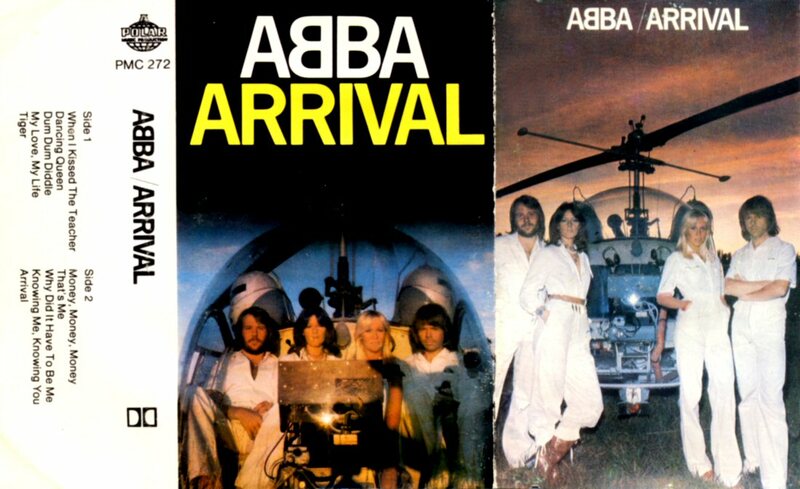 The French edition was quite different to the other releases. 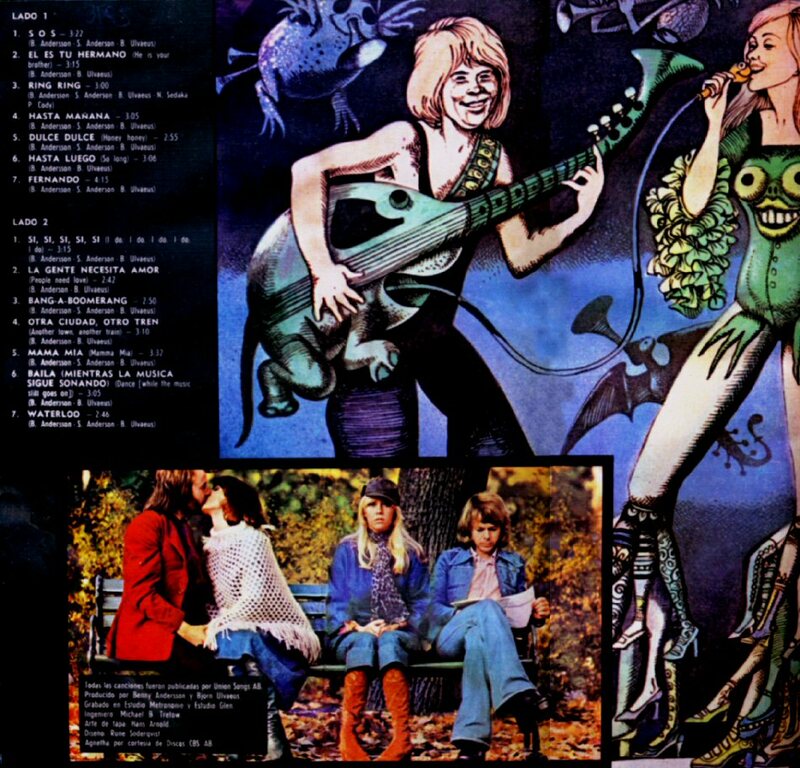 It had gatefold cover and different picture on the front. 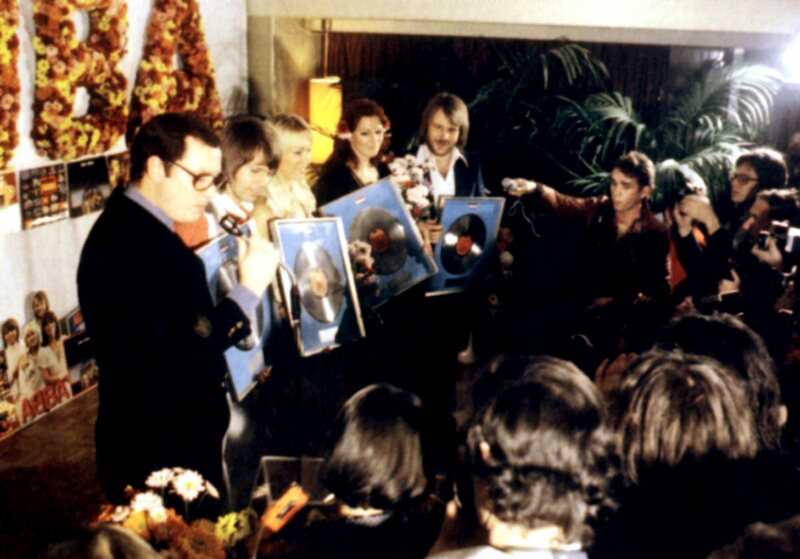 It stayed on the French album chart 10 weeks peaking at #15. 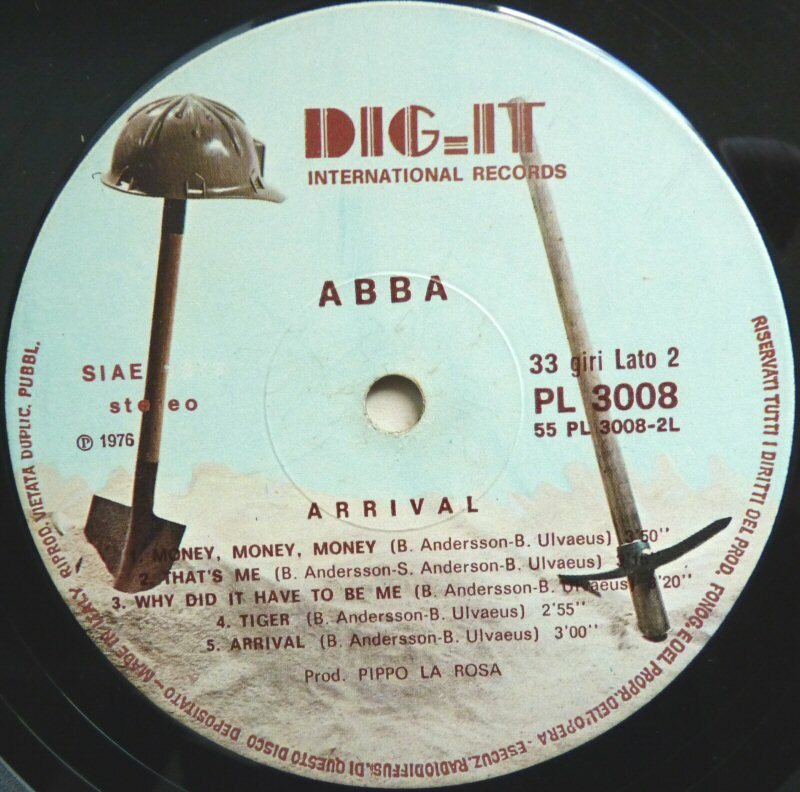 In Italy the album was released by Dig-It under number PL 3008. 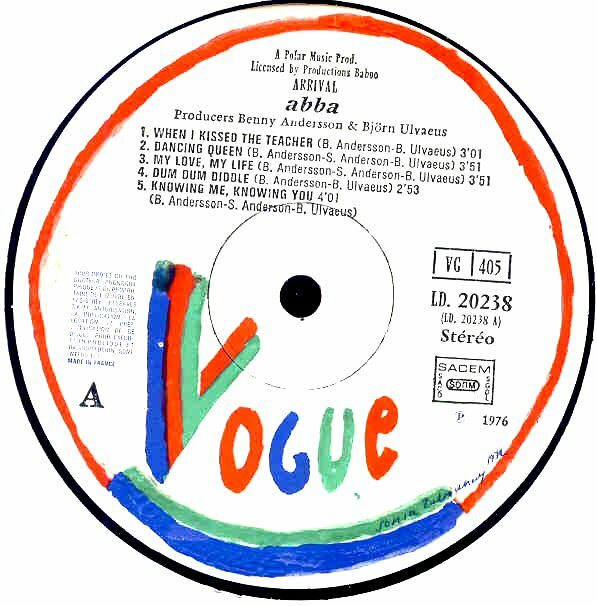 It stayed on the Italian LP chart for 23 weeks peaking at #12. 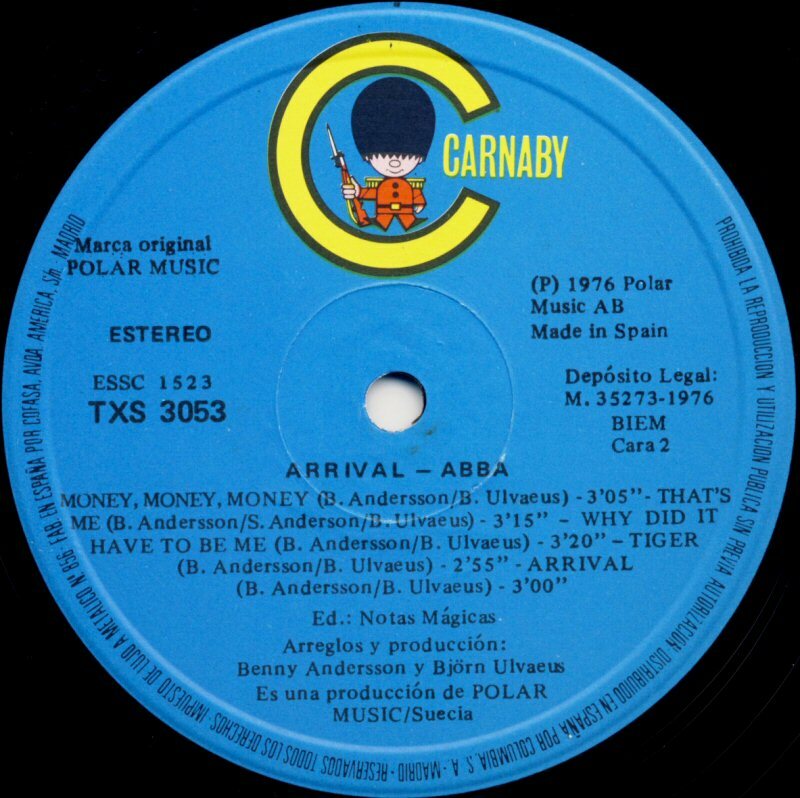 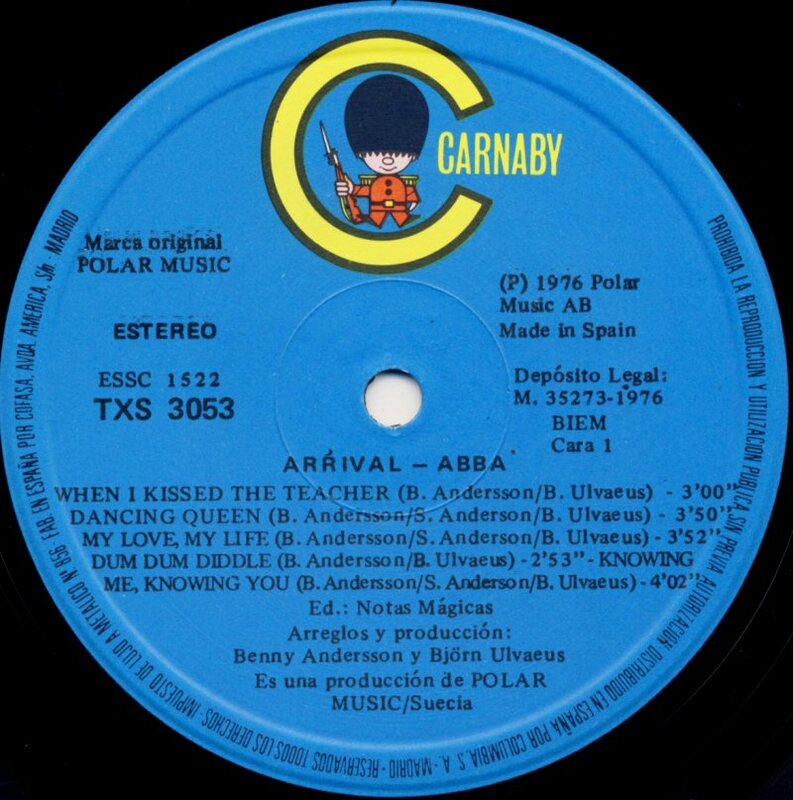 In Spain "Arrival" was released by Carnaby in November 1976 with slightly changed back cover and the note from the group in Spanish language. 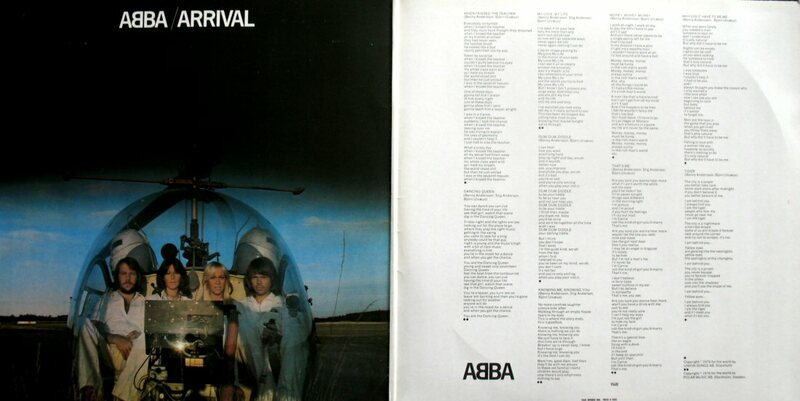 "Arrival" was released in Australia and New Zealand in November 1976 in gatefold sleeve. 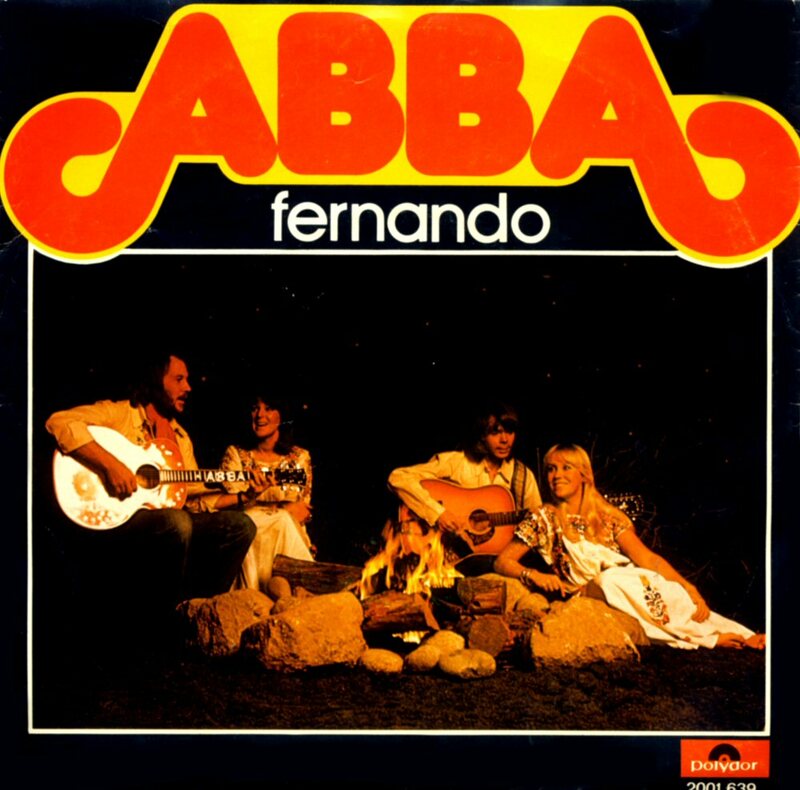 "Fernando" was included as an extra track on the side B. 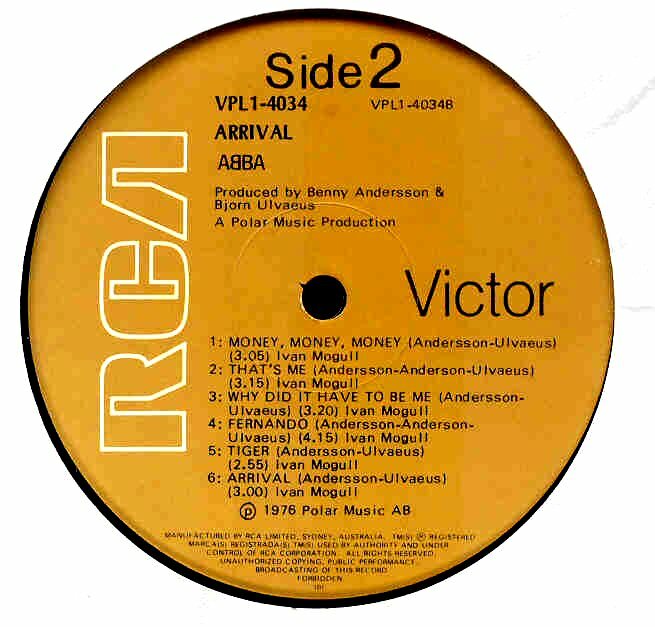 The MC release featured different track listing. 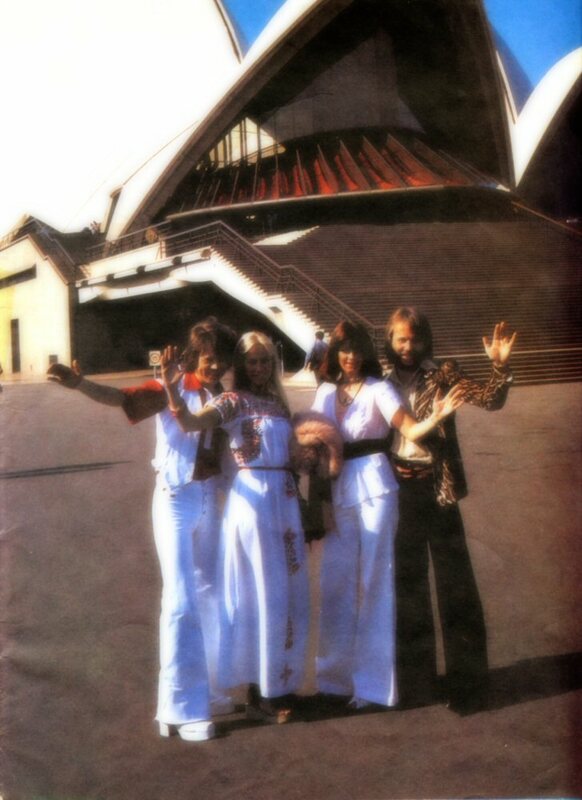 In Australia the album entered the chart on November 22nd, 1976 where it stayed for 35 weeks reaching #1 (for 8 weeks). 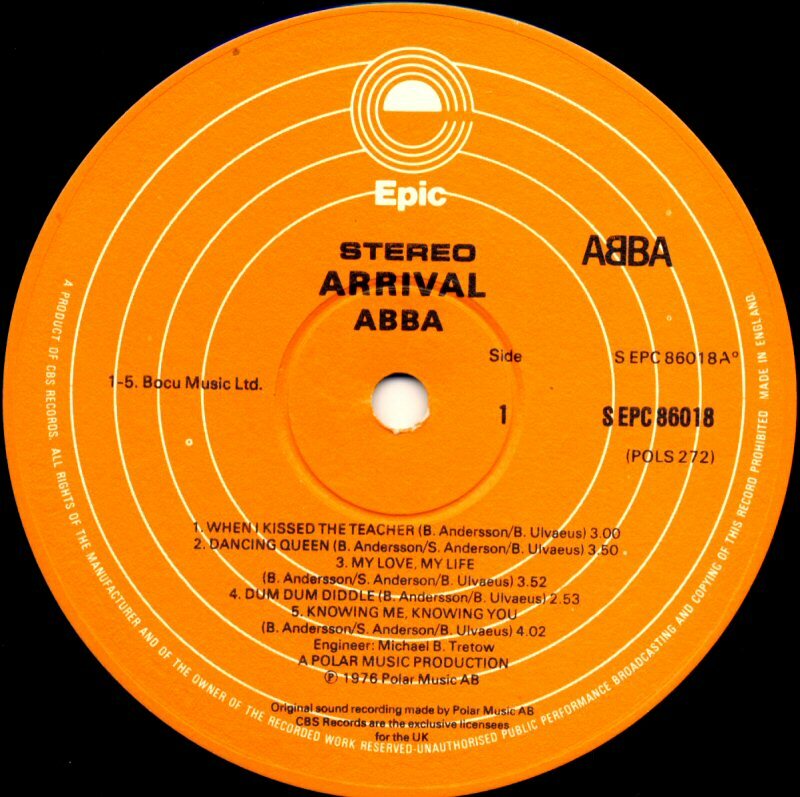 In New Zealand "Arrival" entered the chart on November 26th, 1976 and stayed there for 42 weeks peaking at #1 (for 5 weeks). 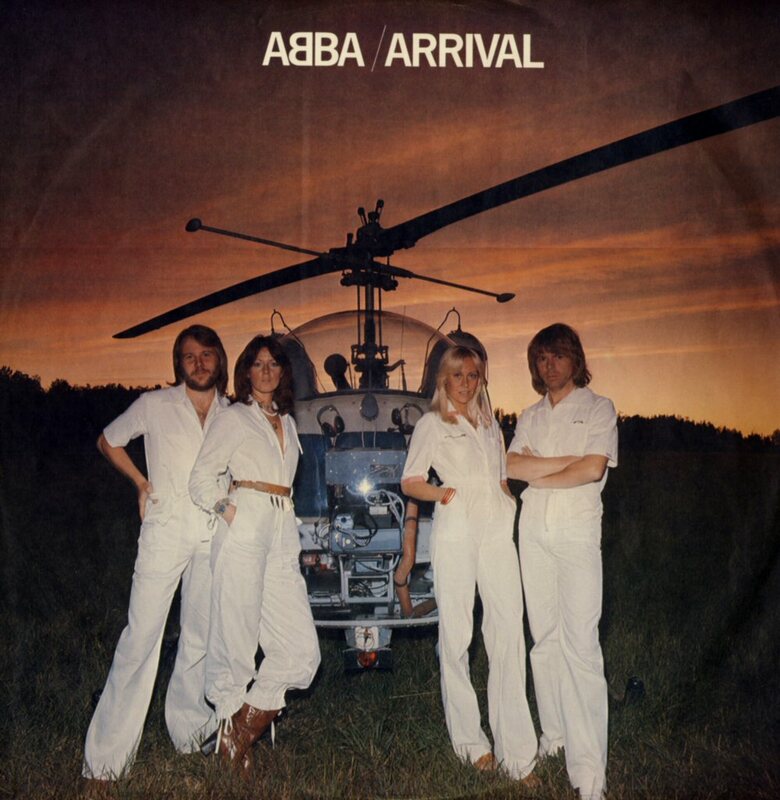 The most bizarre version of the album "Arrival" was released by the record company Opus in Czechoslovakia. 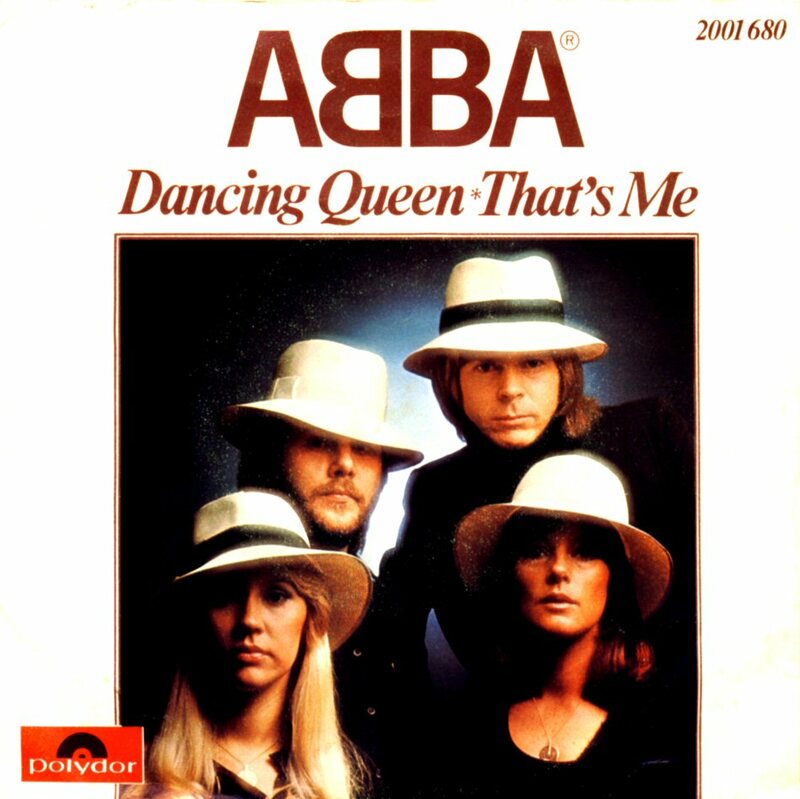 The album did not contain "Dancing Queen" which was replaced by... "Intermezzo No. 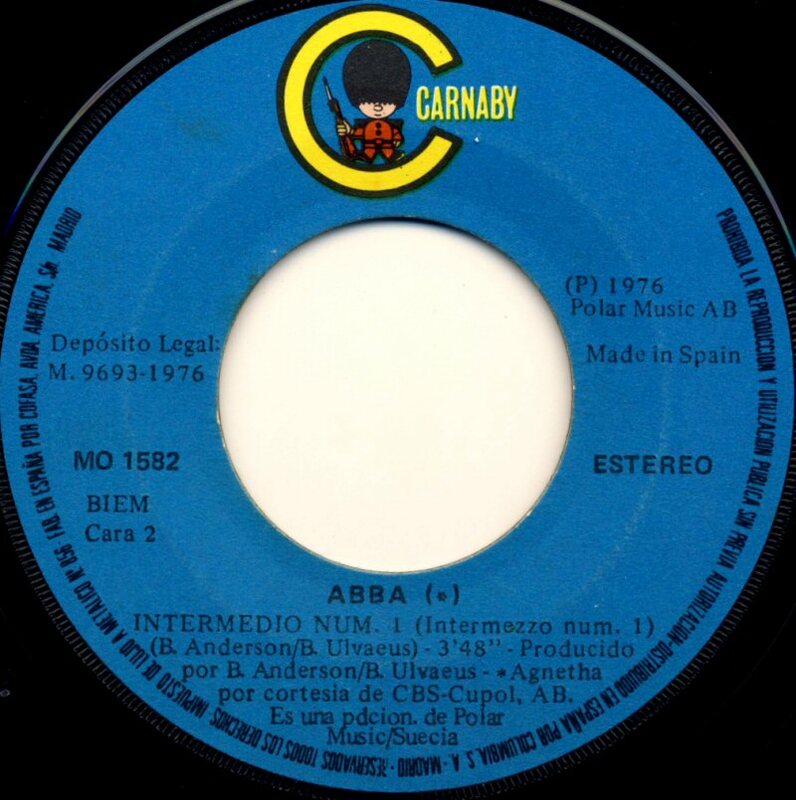 1". 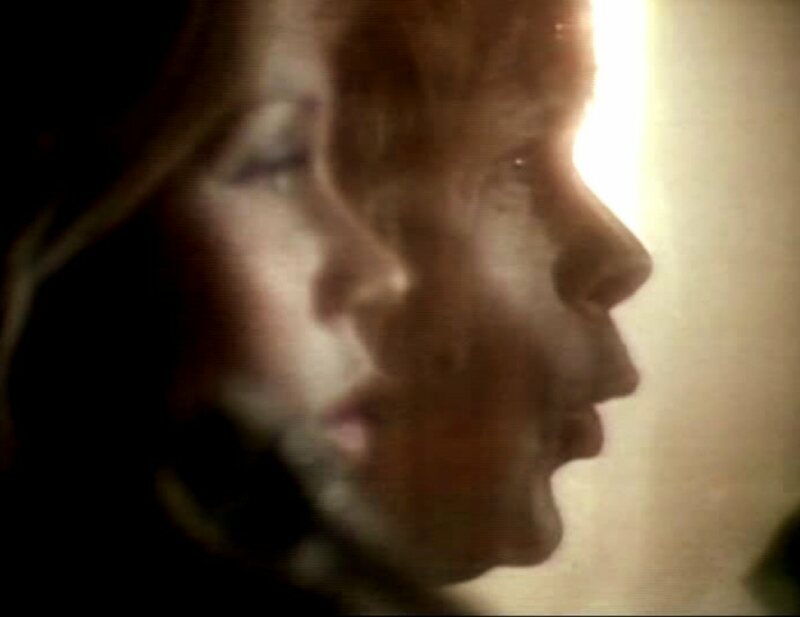 The reason is unknown. 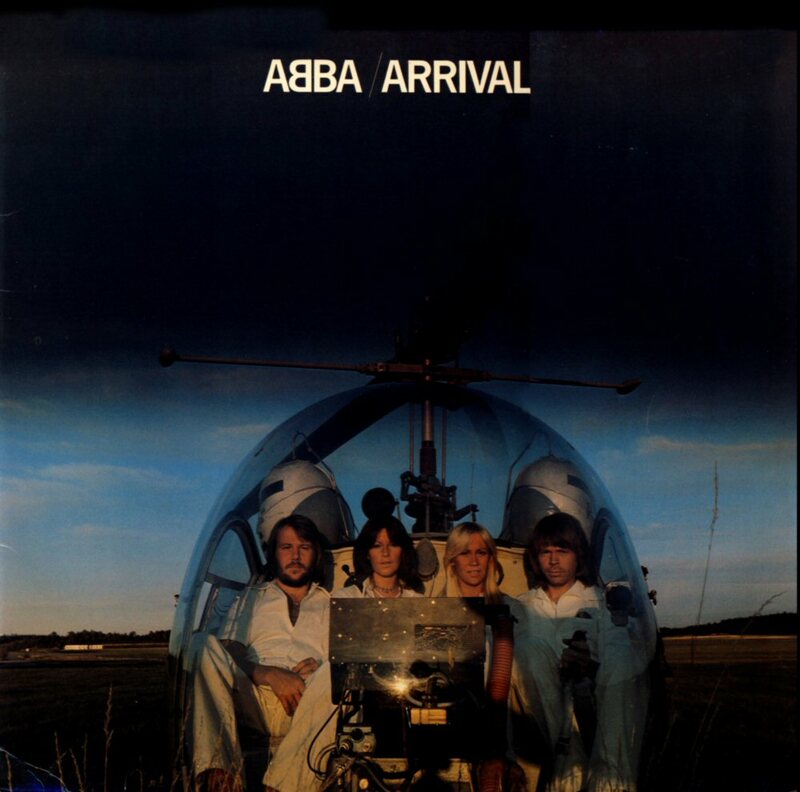 A different version of "Arrival" was released in East Germany in 1978. 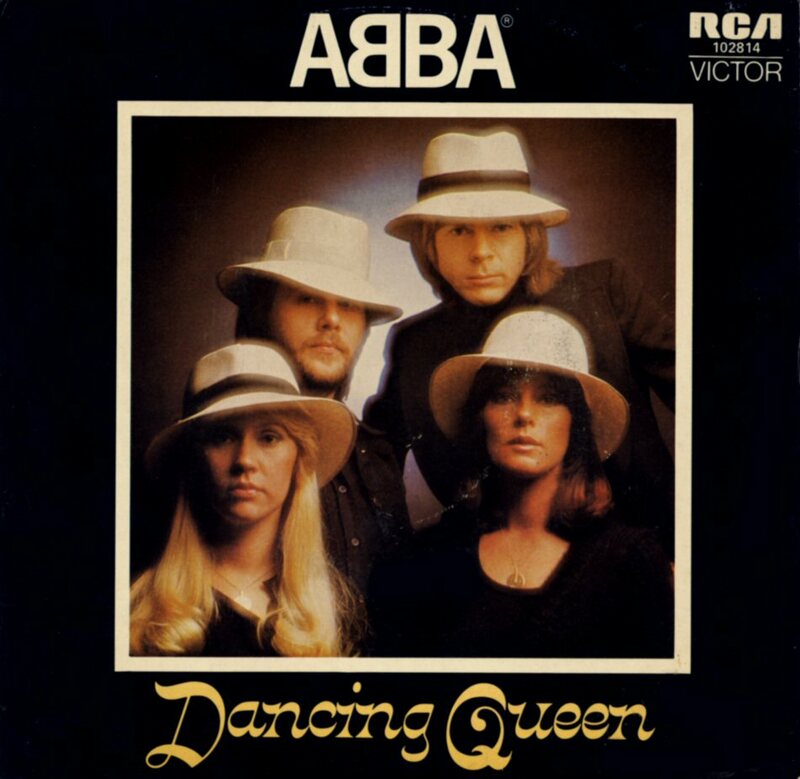 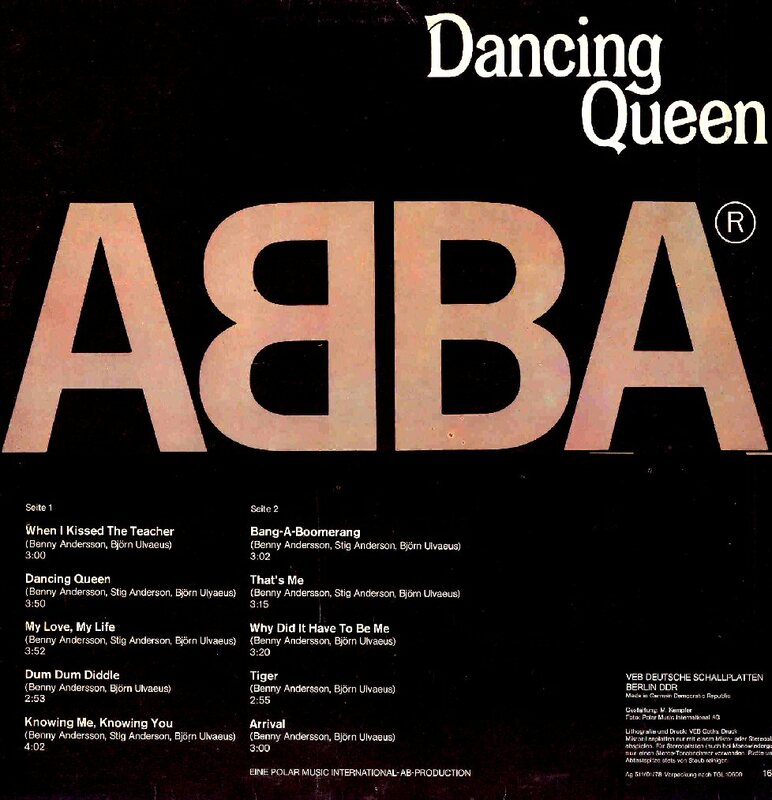 The album received the title "Dancing Queen", different cover and slightly different track list. 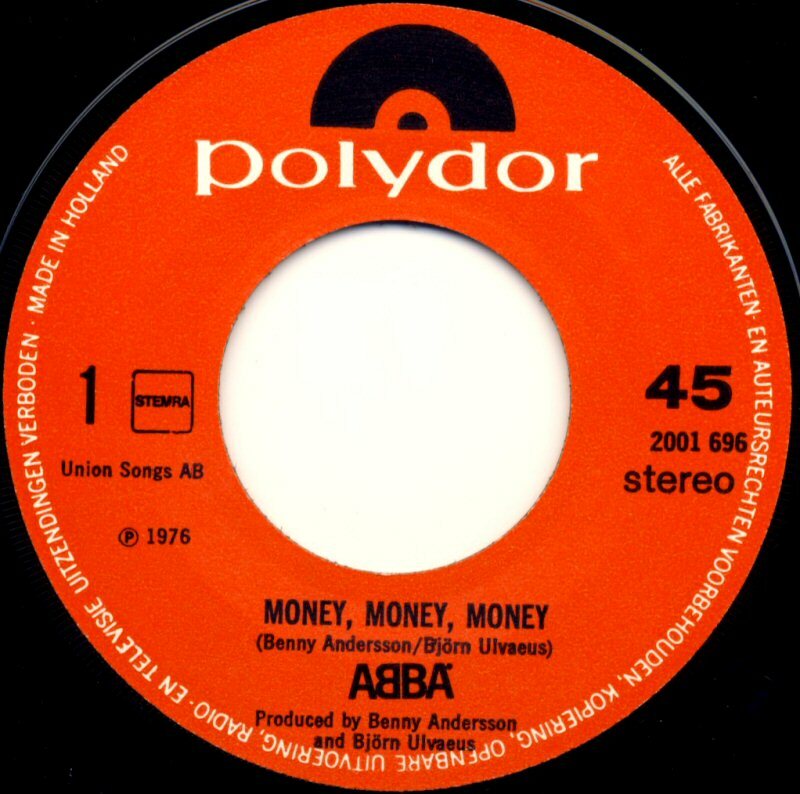 As the communist regime did not like the lyrics to "Money Money Money" ("too capitalistic") the song was replaced by "Bang-A-Boomerang"! 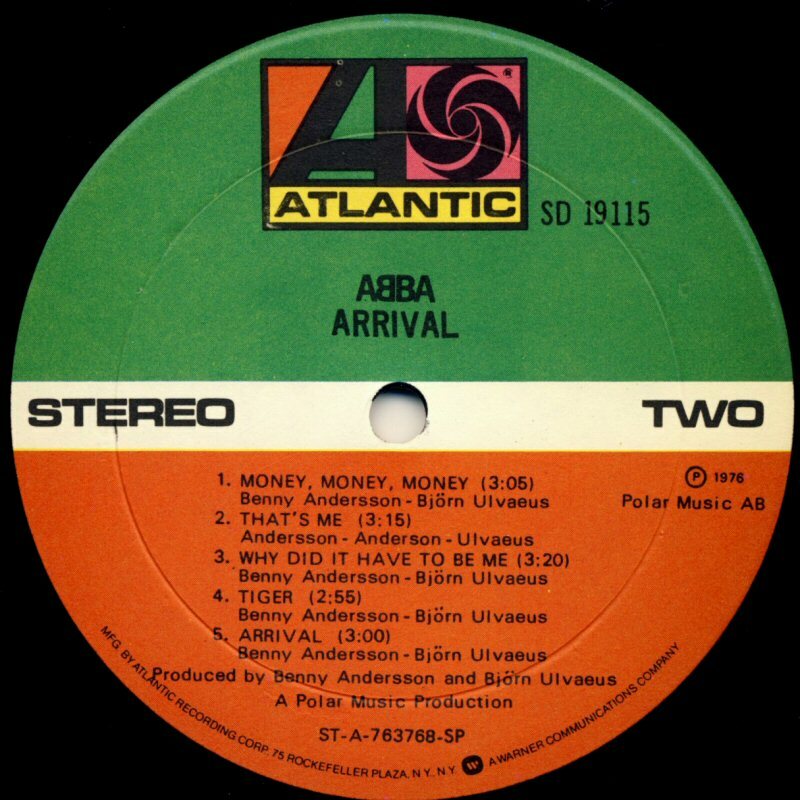 Money were not so sensitive subject in Sovjet Union where "Arrival" was released in 1977 with the original track listing and changed cove. 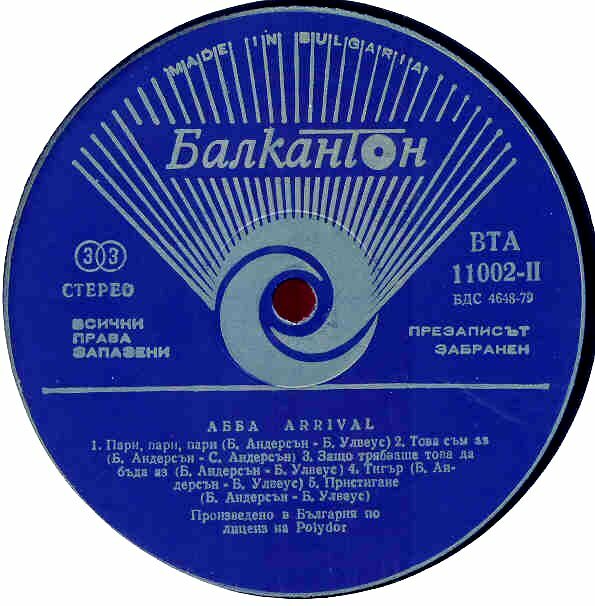 The Bulgarian pressing of "Arrival". 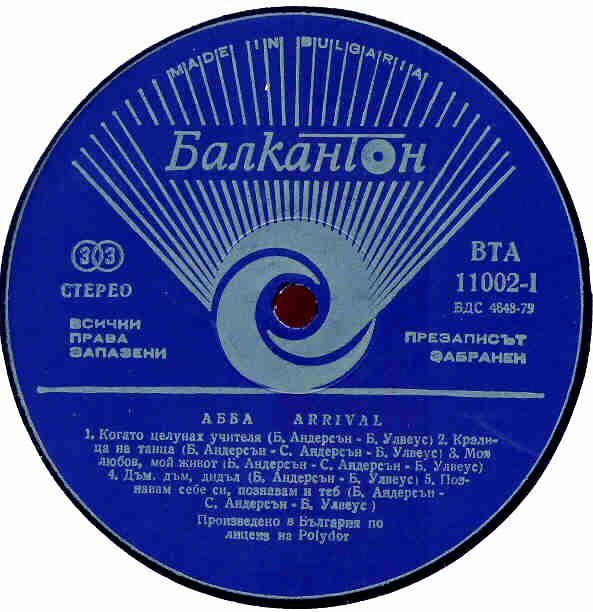 The titles of the songs are translated to Bulgarian. 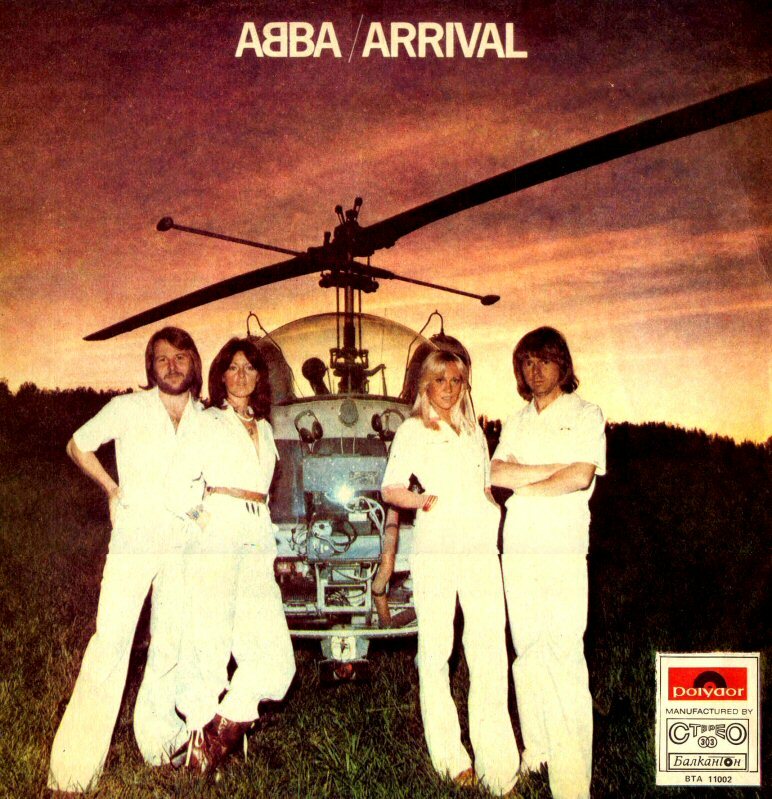 "Arrival" was released even in Yugoslavia - no bigger changes in the album lay out. 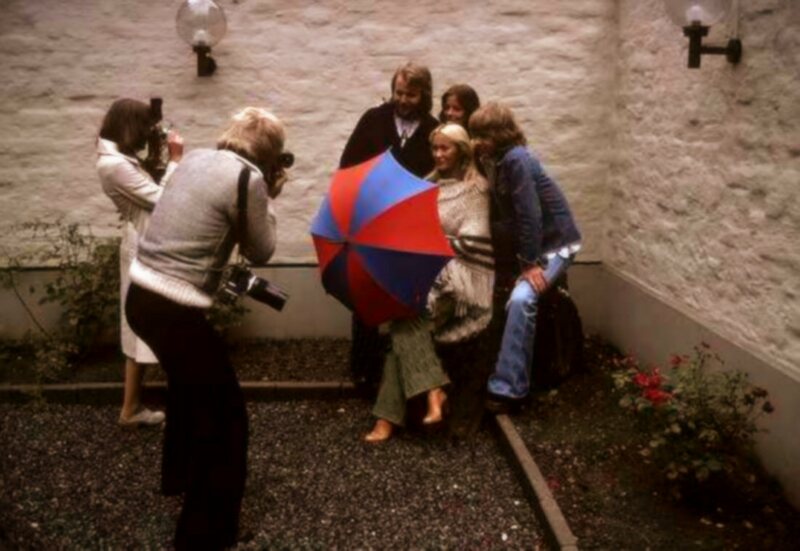 This famous photo session with pin were distributed to the press world-wide at the end of 1976. 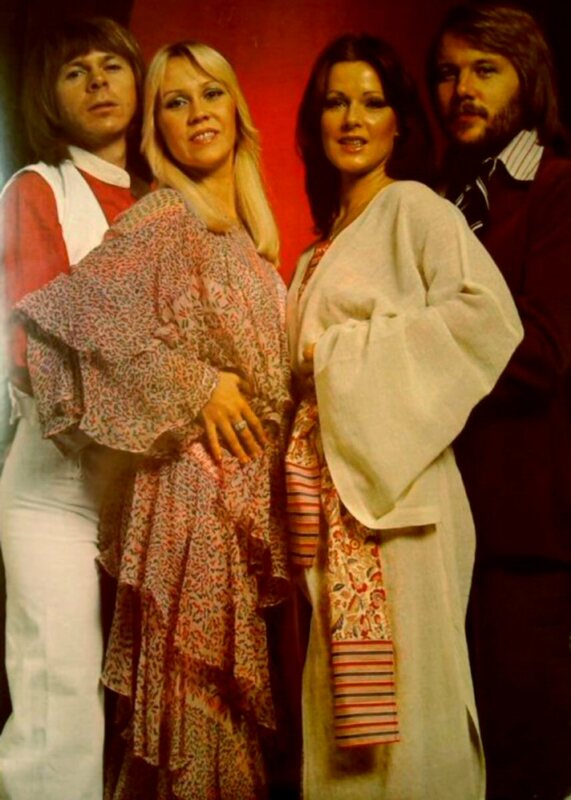 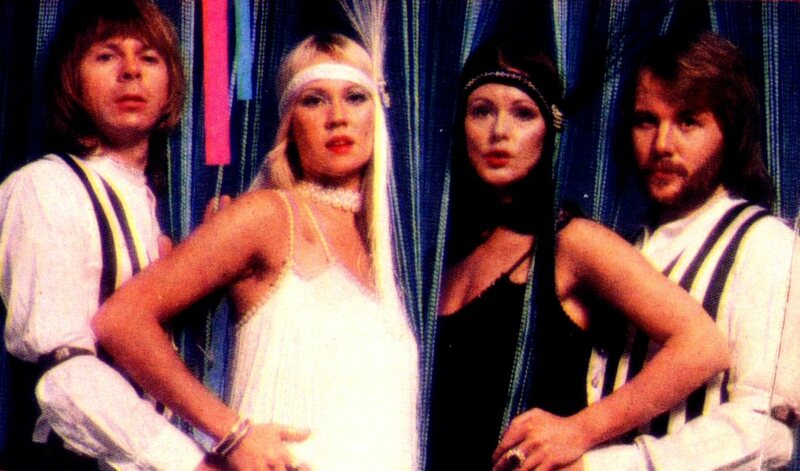 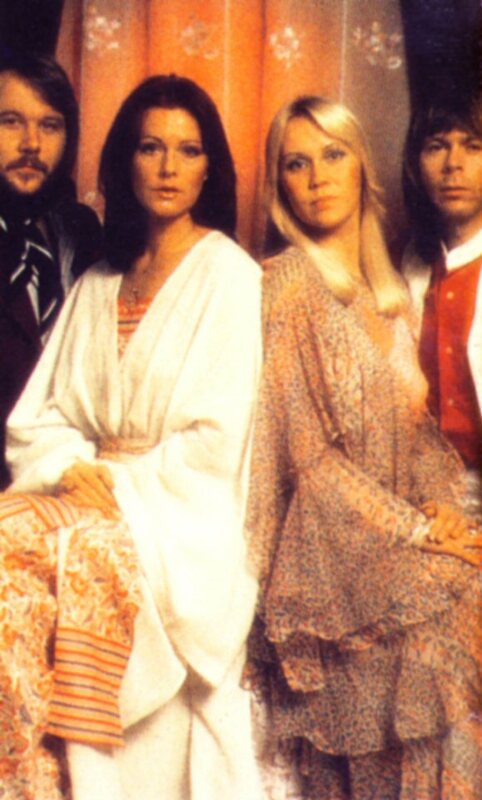 There are several alternative shots available with both all four members of the group as well as only Agnetha and Frida. 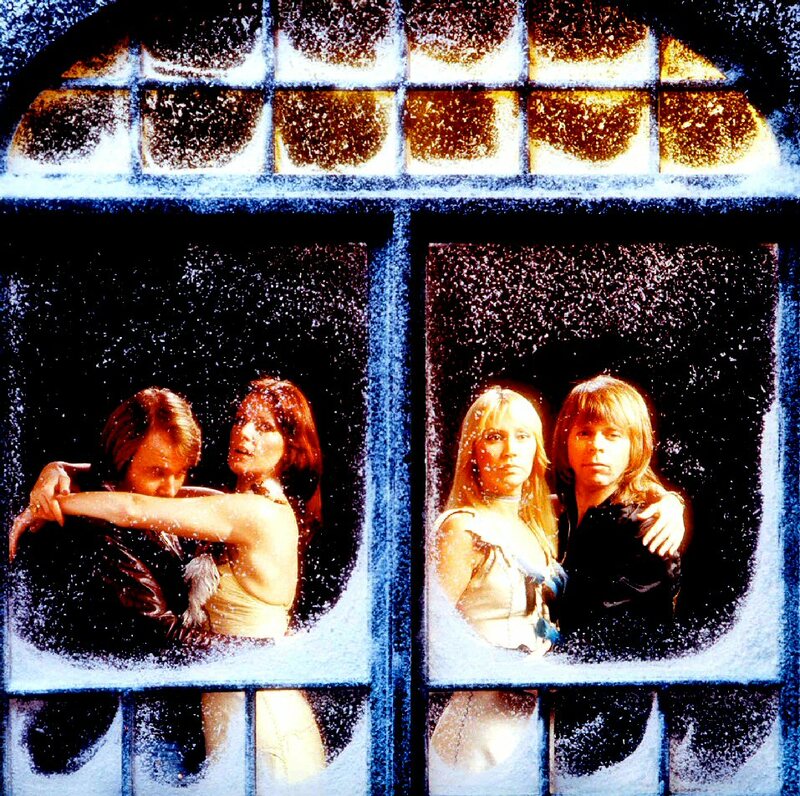 A shot from the "snowy window" would be used on the cover of the forthcoming single "Knowing Me Knowing You". 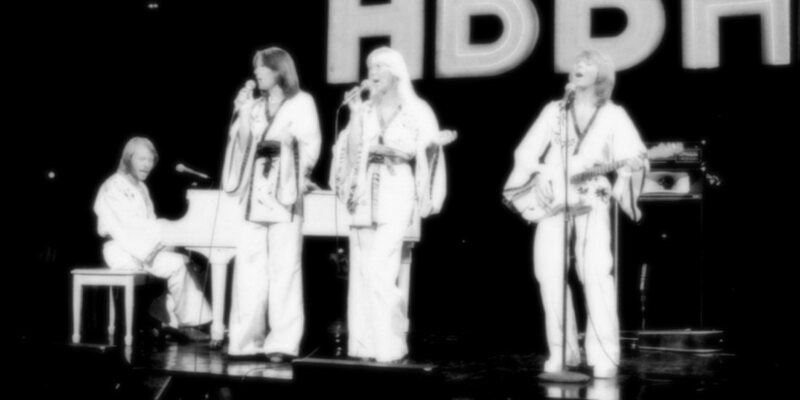 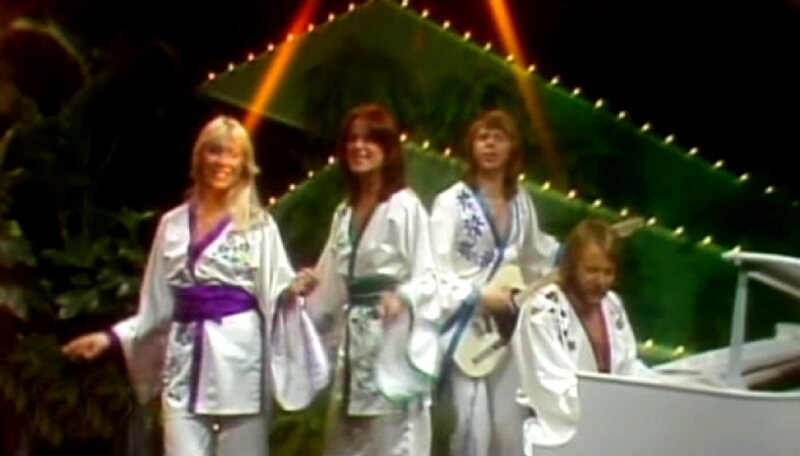 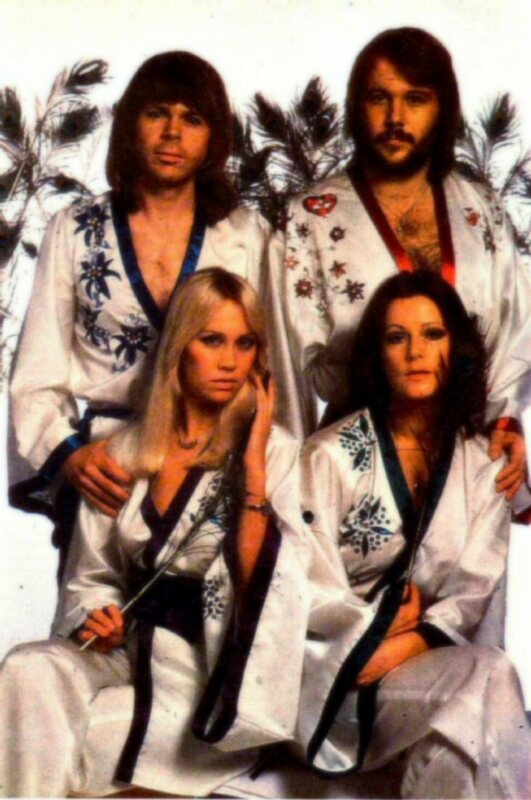 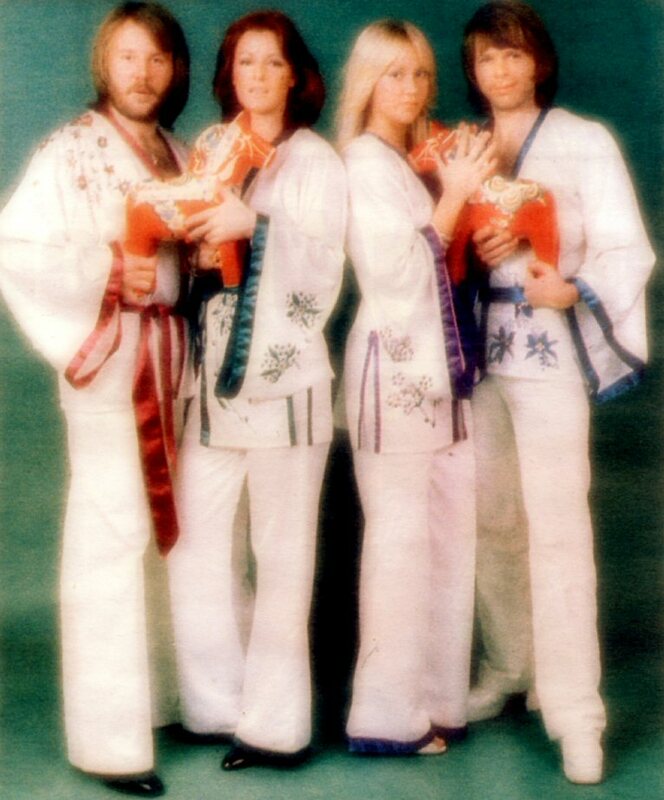 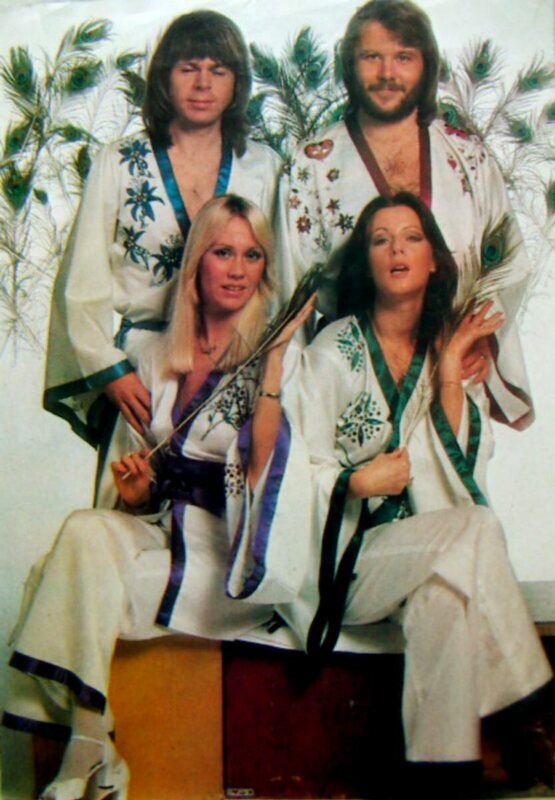 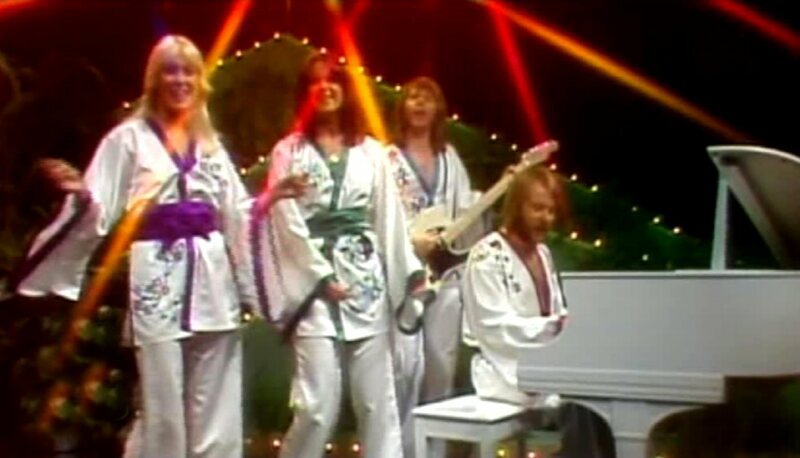 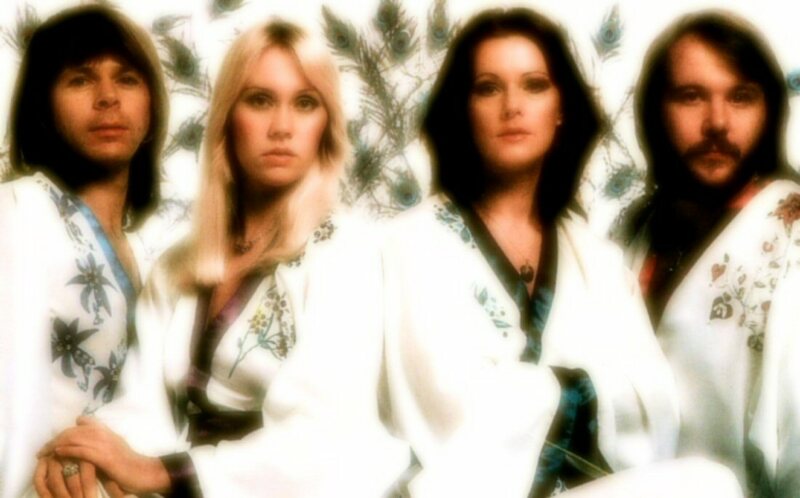 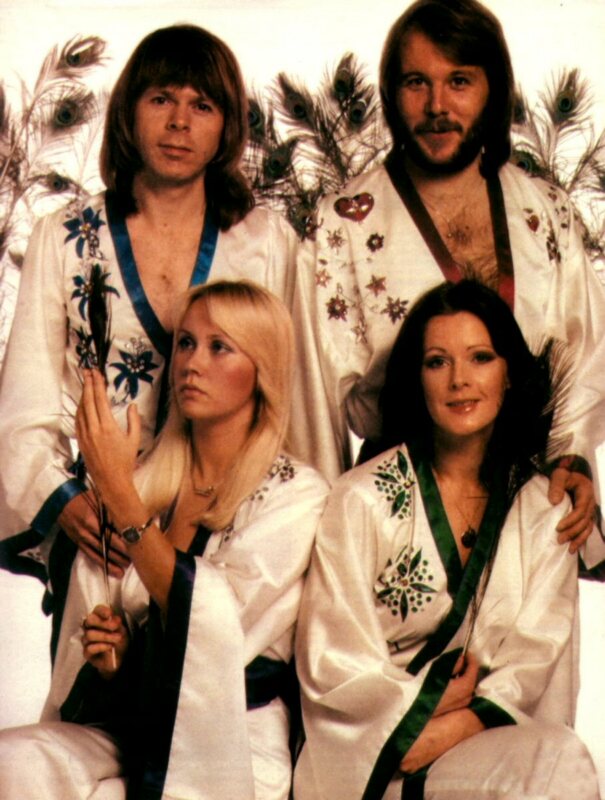 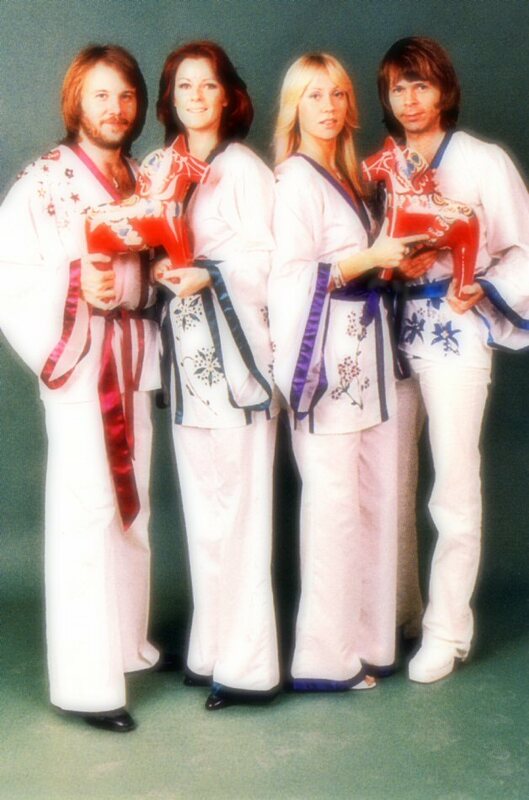 ABBA performed in their kimonos during the promotion of "Arrival" in 1976 and even in Japan 1978. 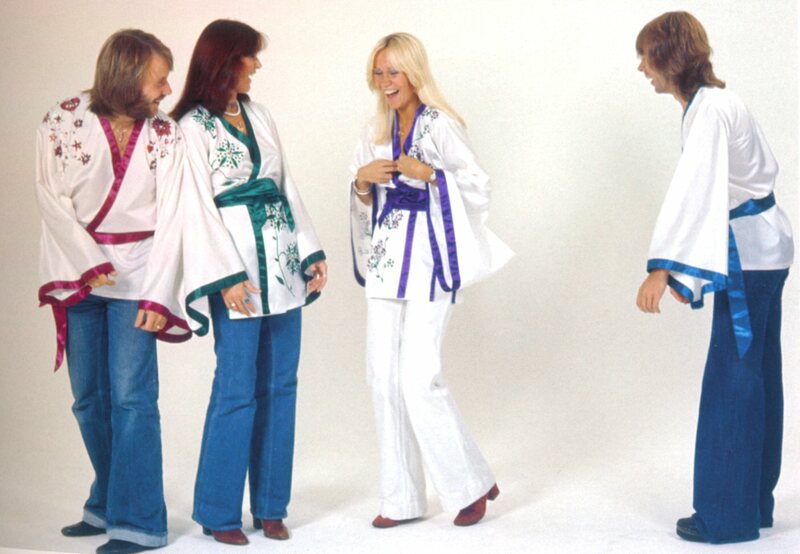 Lots of photo sessions had been taken in these outfits and they are maybe the most well-known from this period. 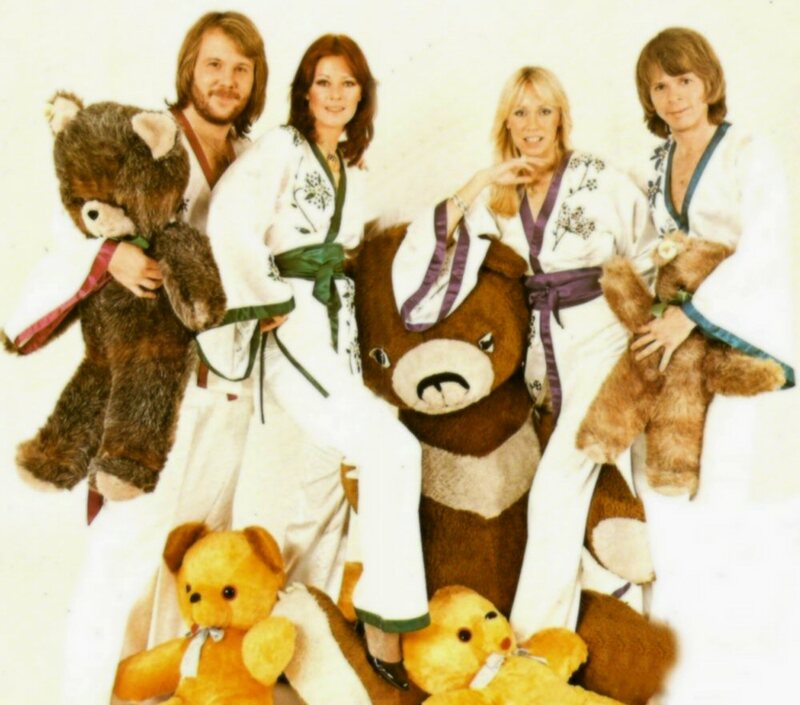 In kimono outfits with big teddy-bears. 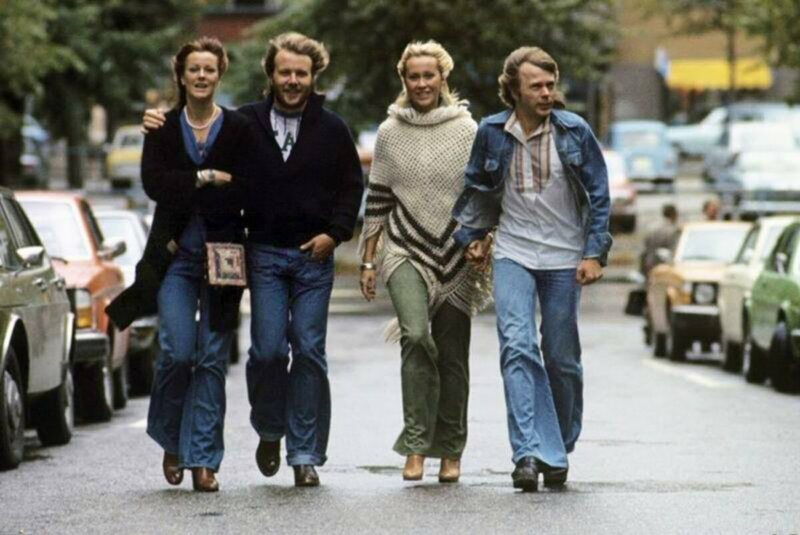 On October 10, ABBA went to North America where "Fernando" was already a big hit. 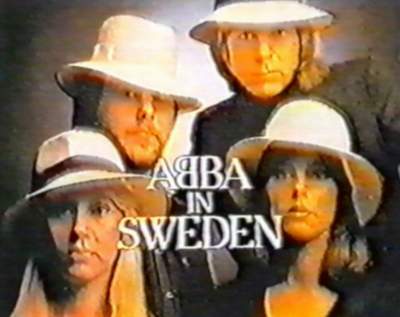 They performed in 8 TV shows in USA and Canada. 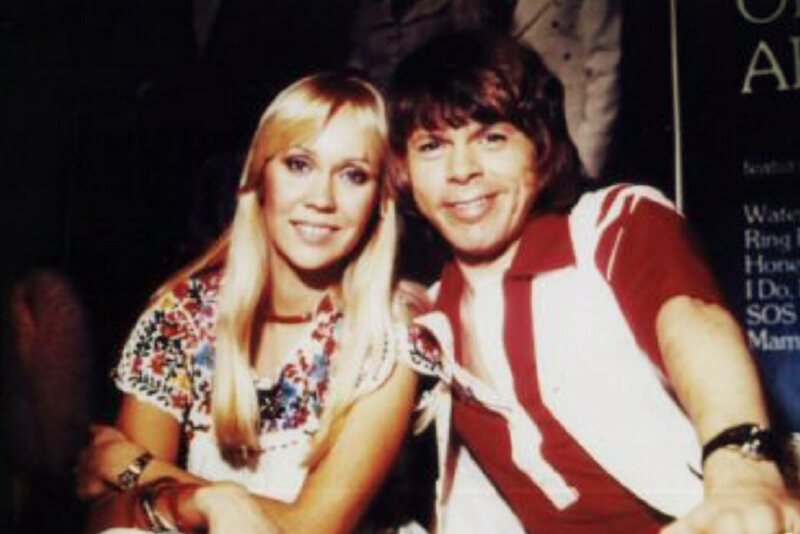 In the "Dinah Shore Show Frida and Benny were offered the chance to get married in front of TV cameras - an offer in the typical American style which was though refused by the couple. 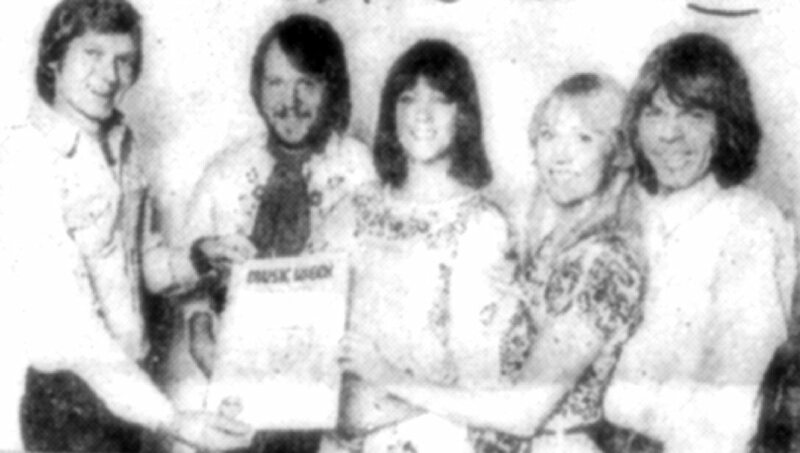 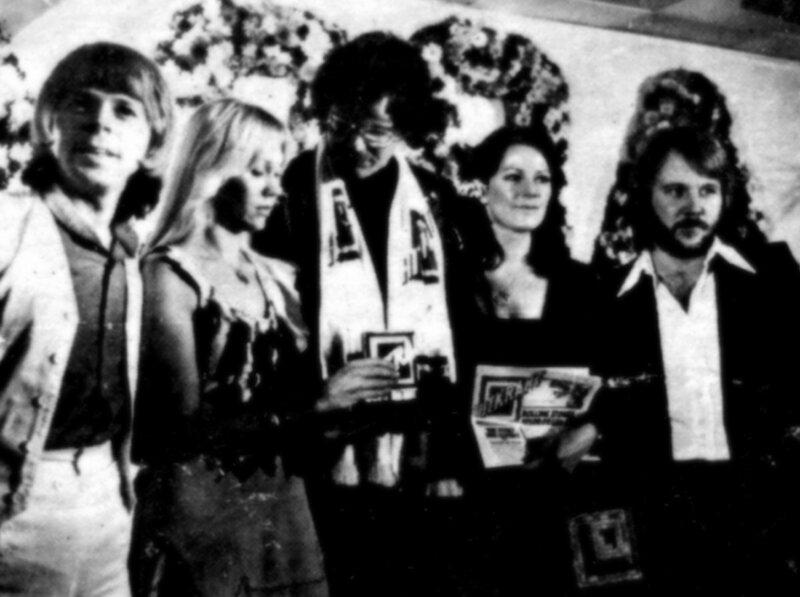 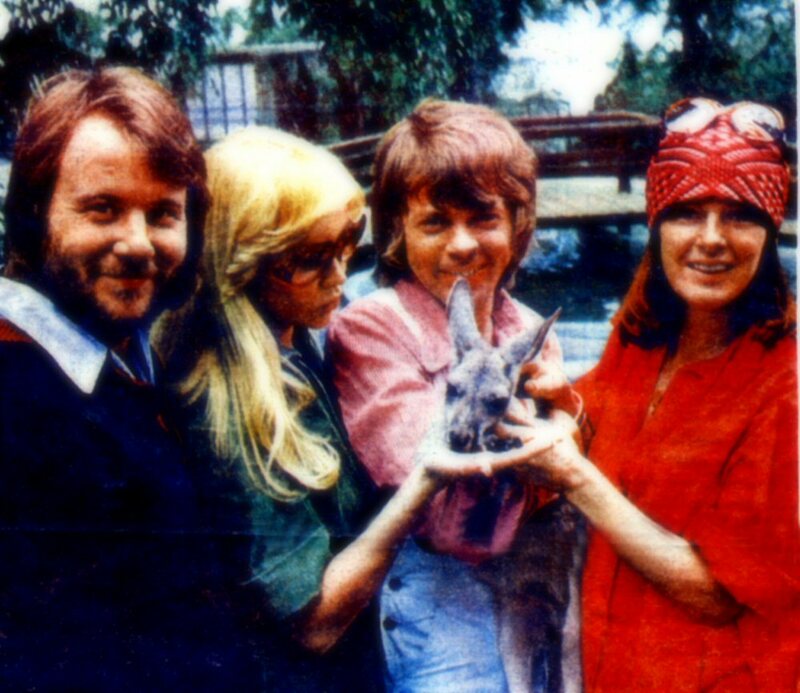 During the trip through America ABBA received a ... British prize of the newspaper "Sun" as the best entertainer in UK. 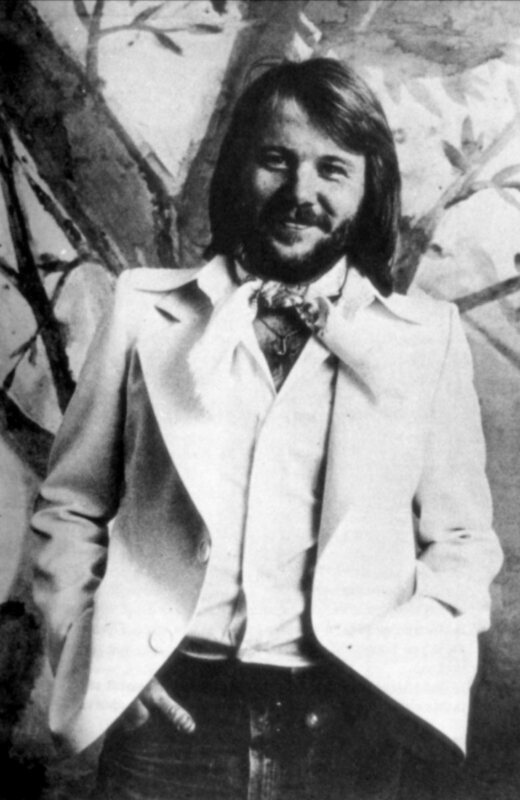 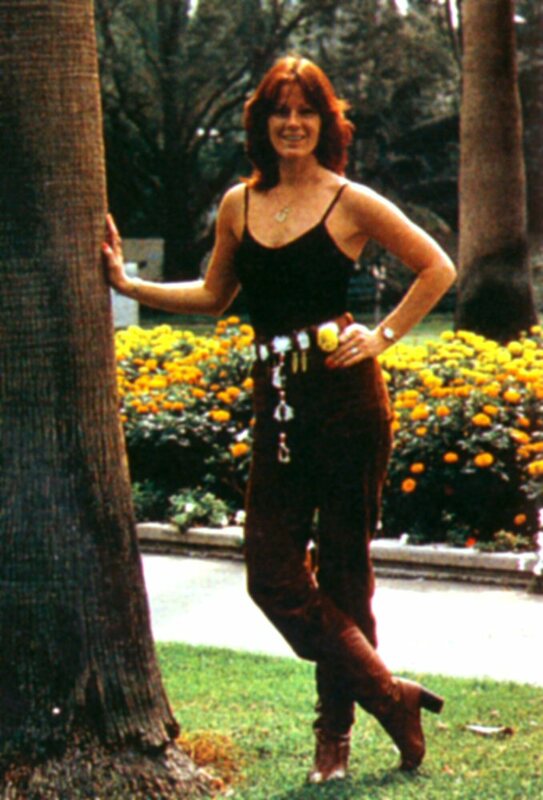 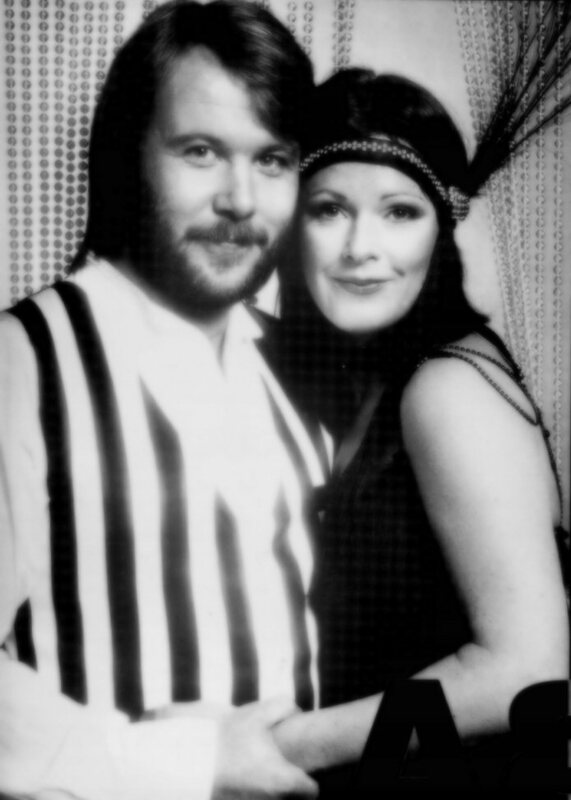 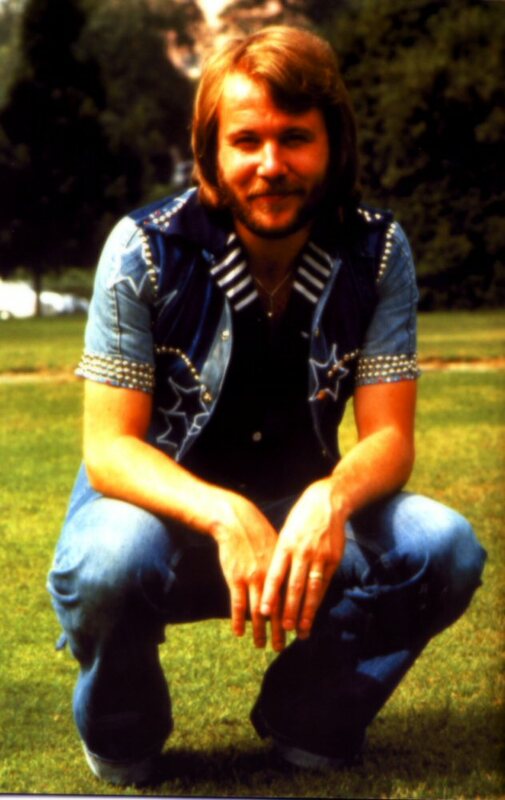 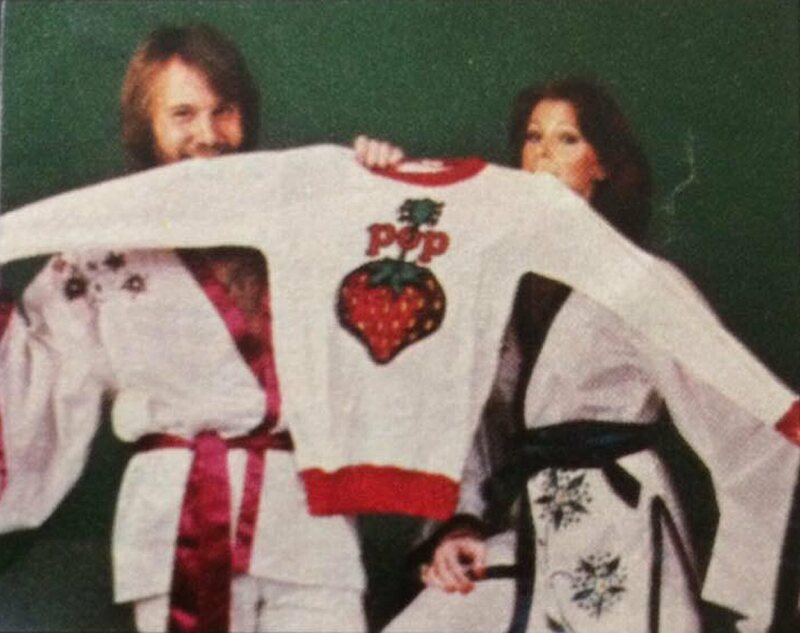 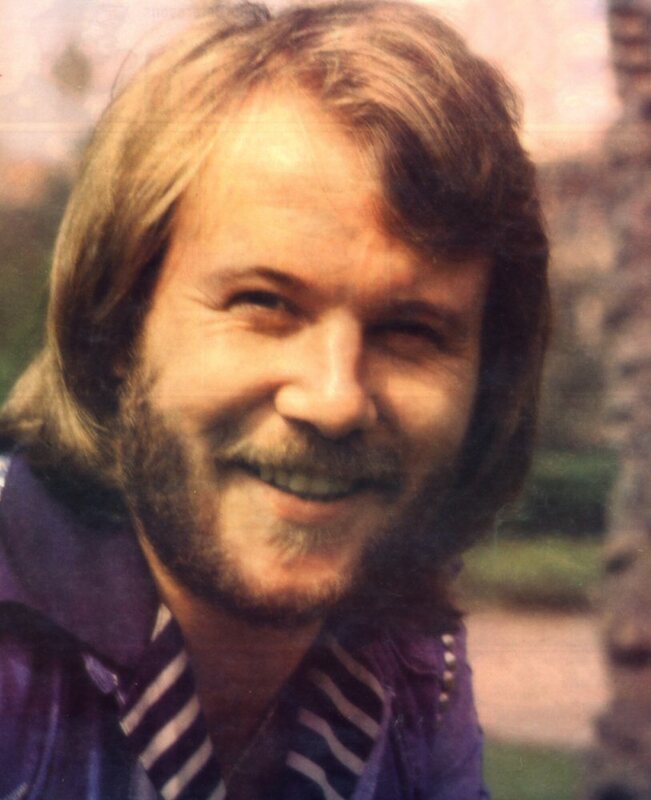 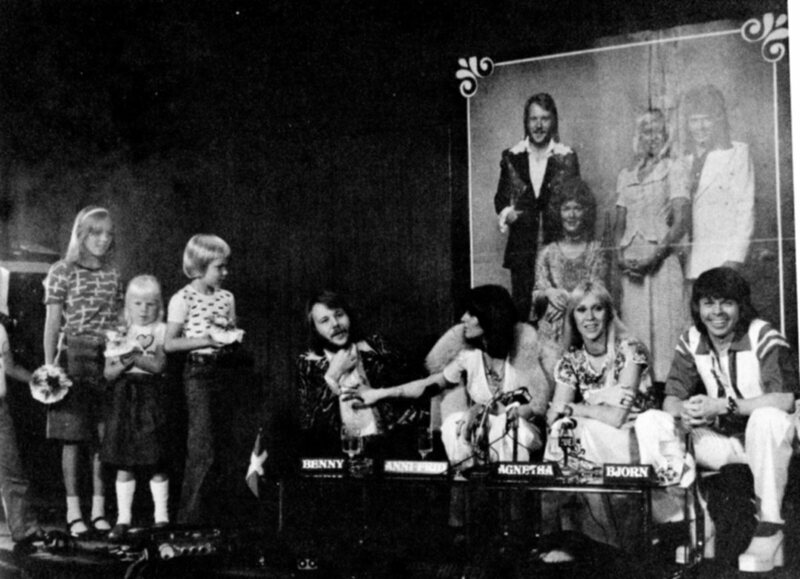 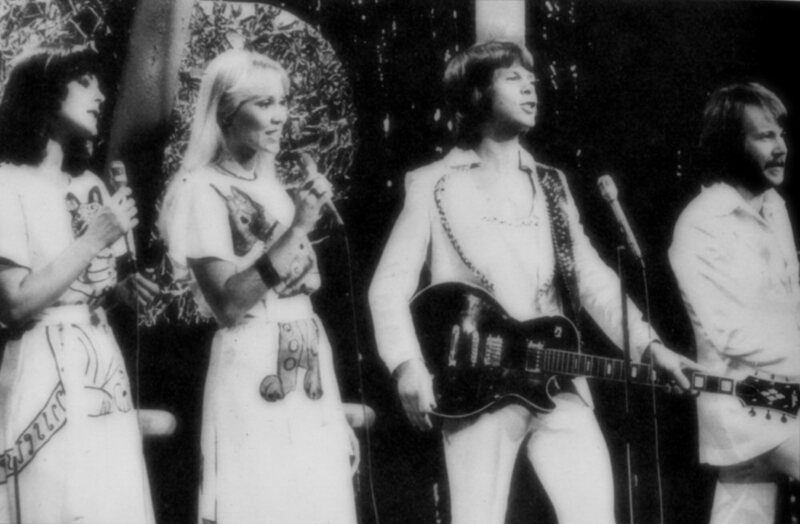 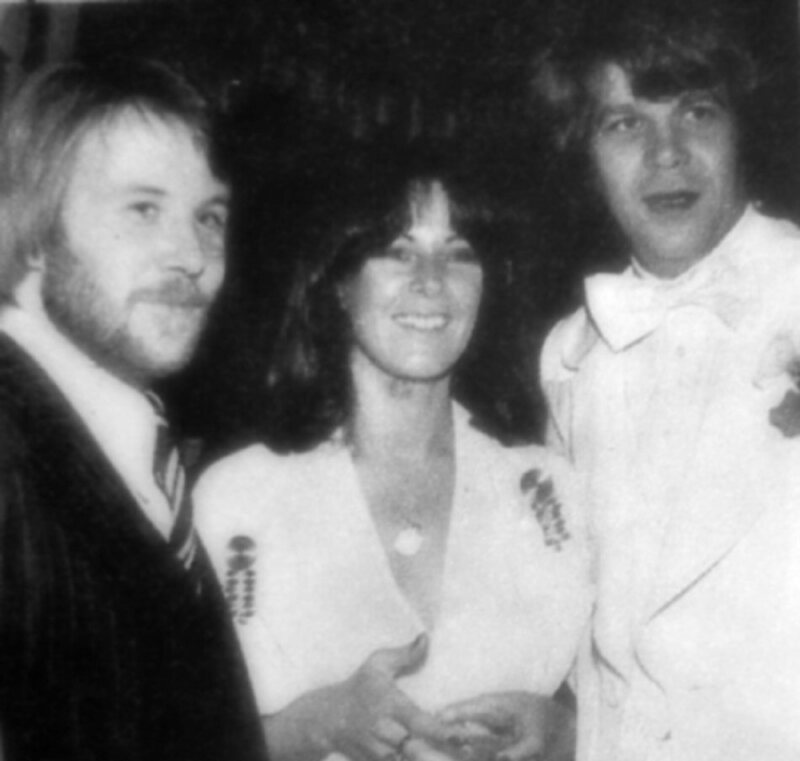 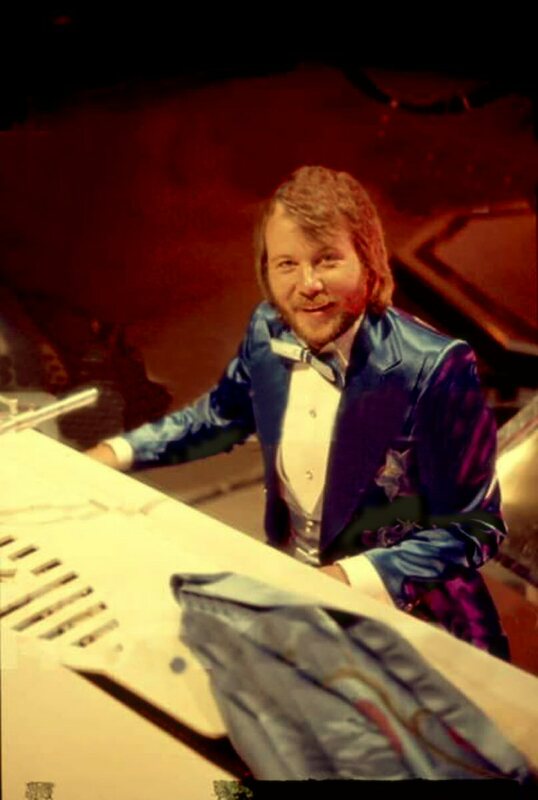 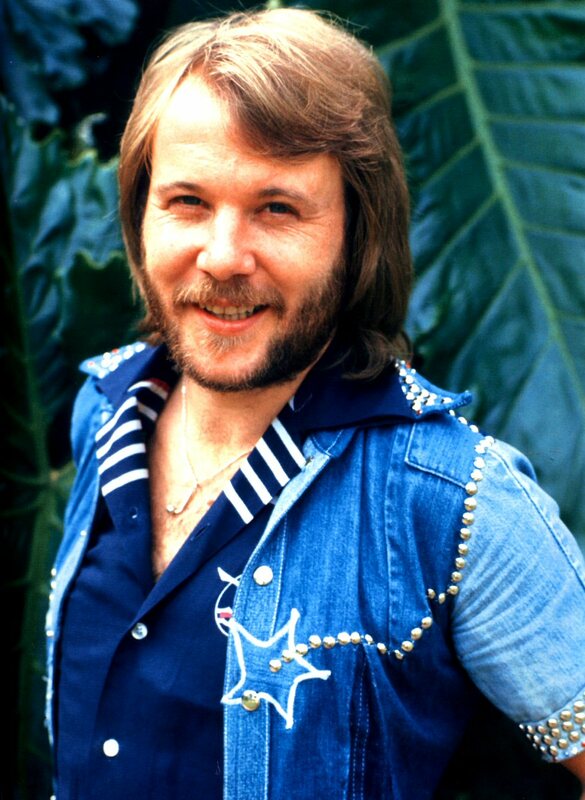 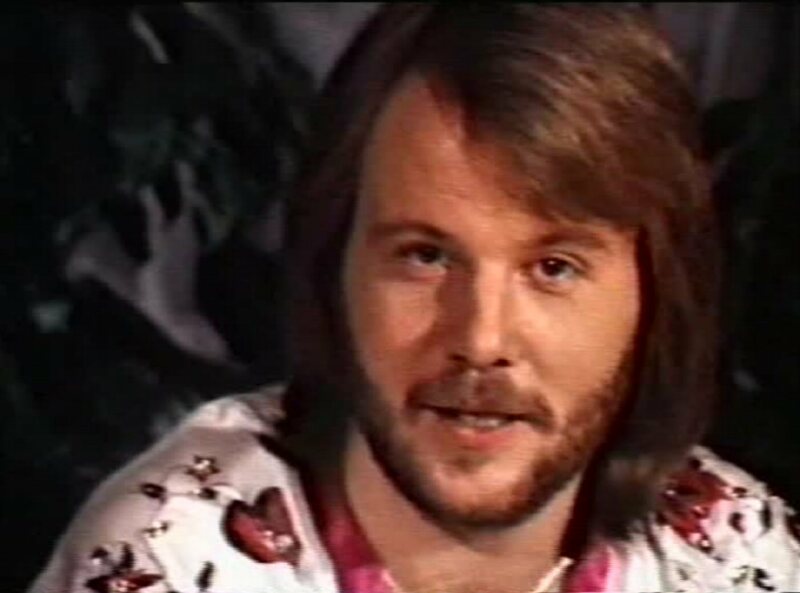 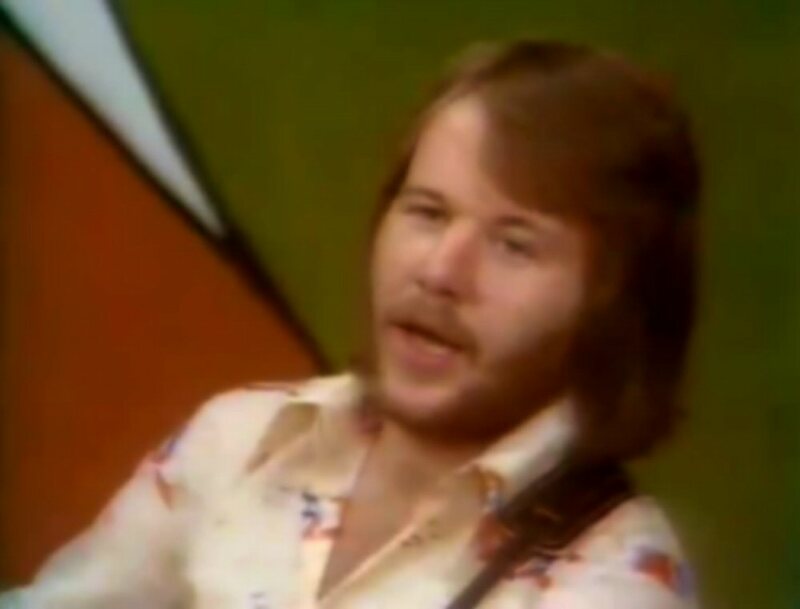 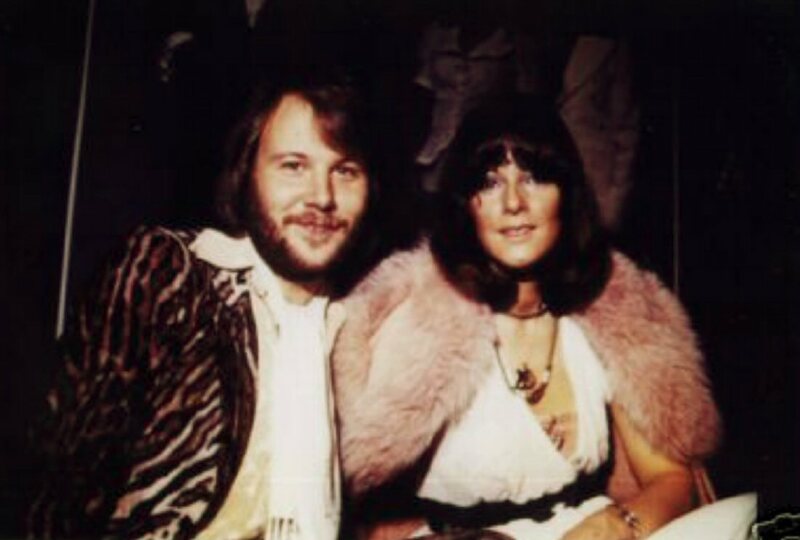 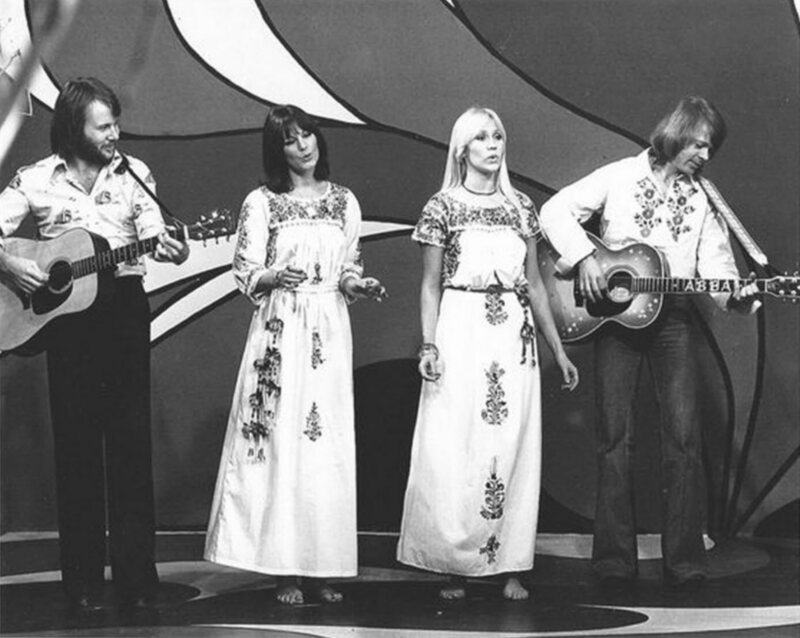 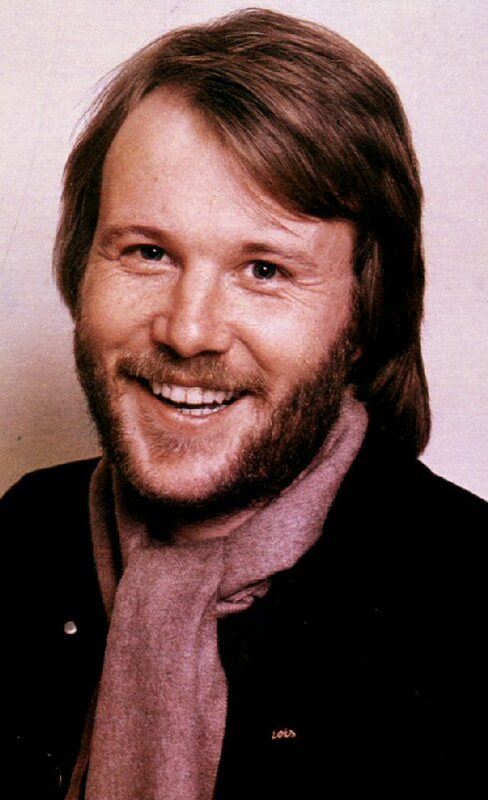 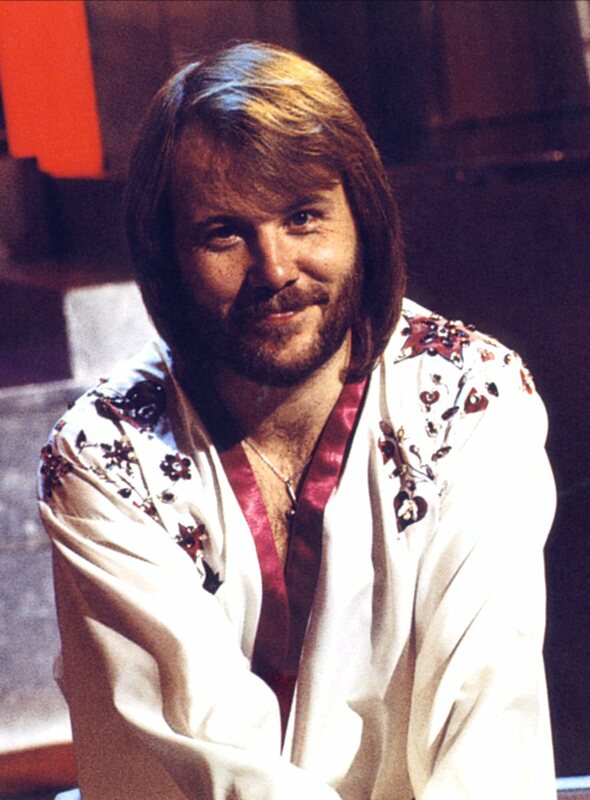 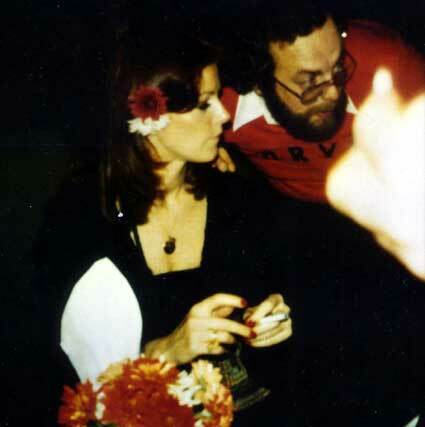 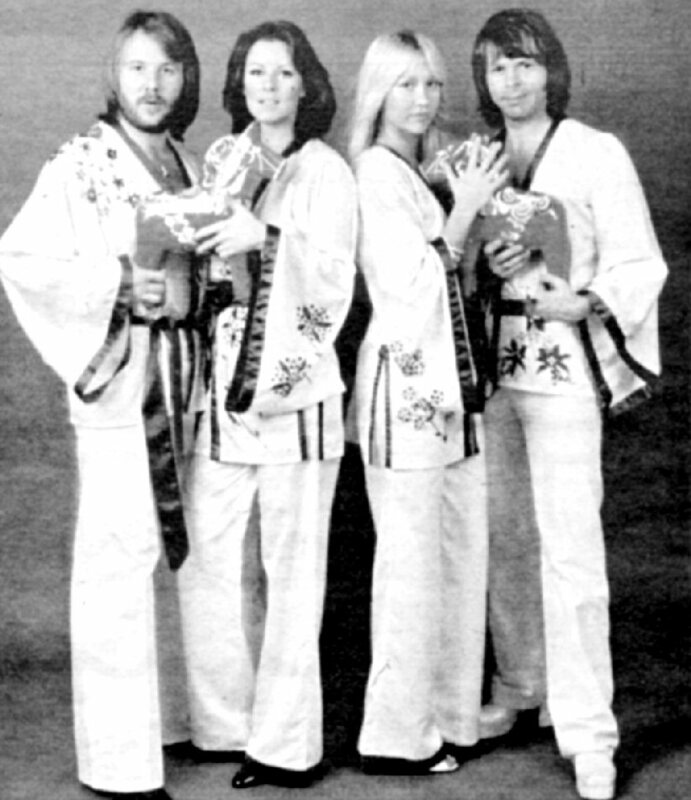 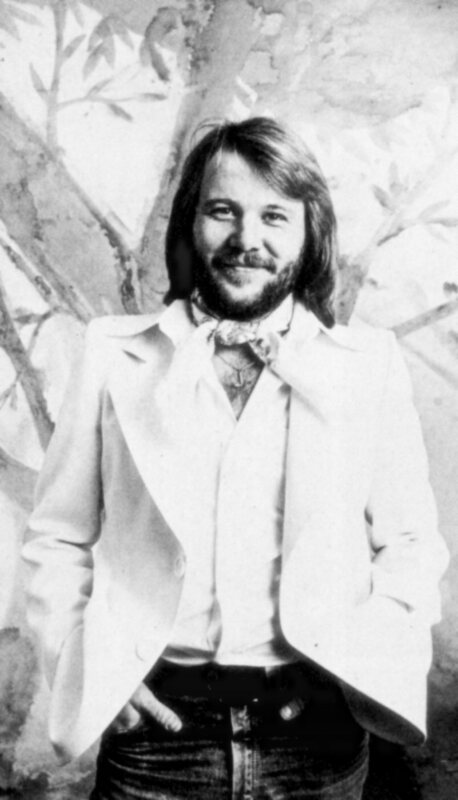 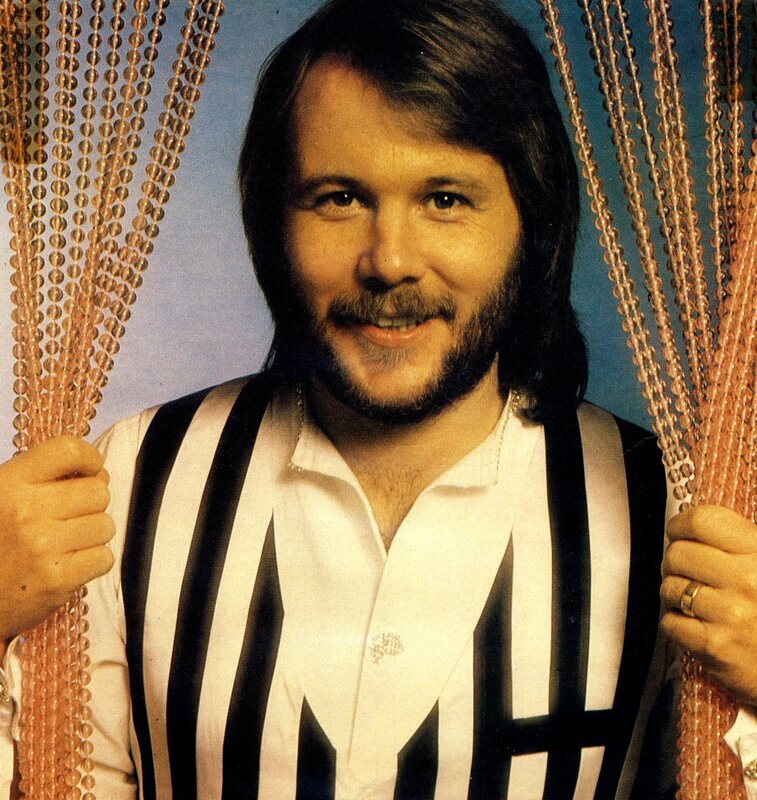 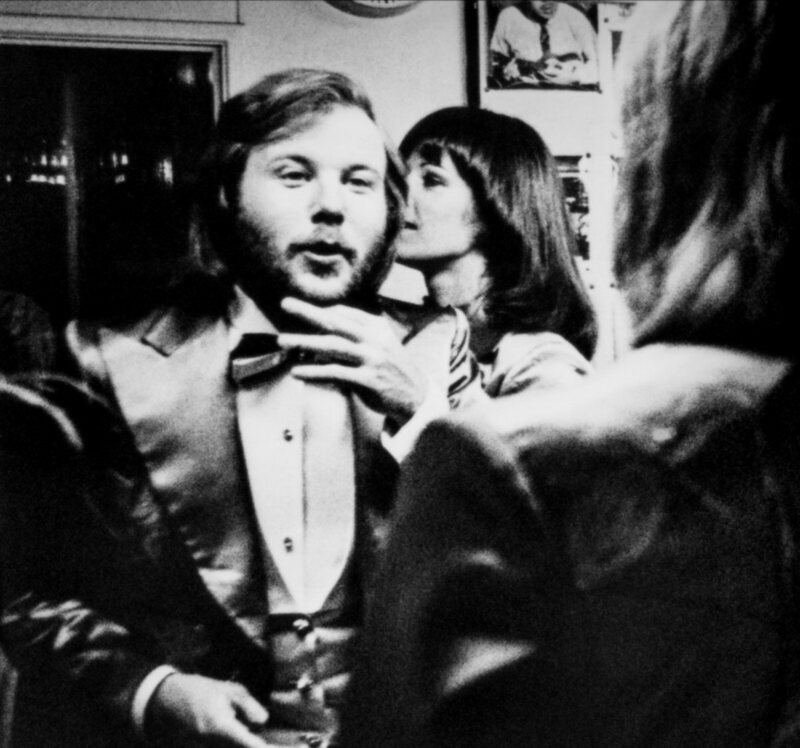 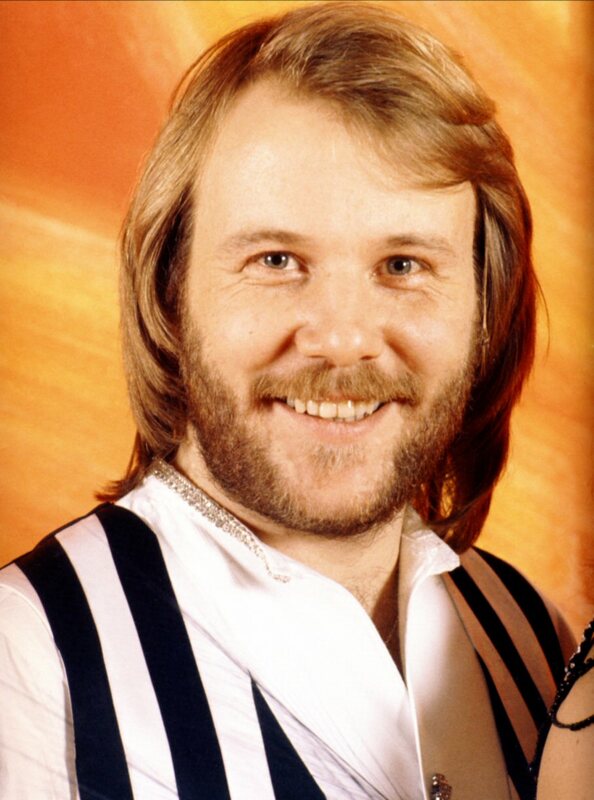 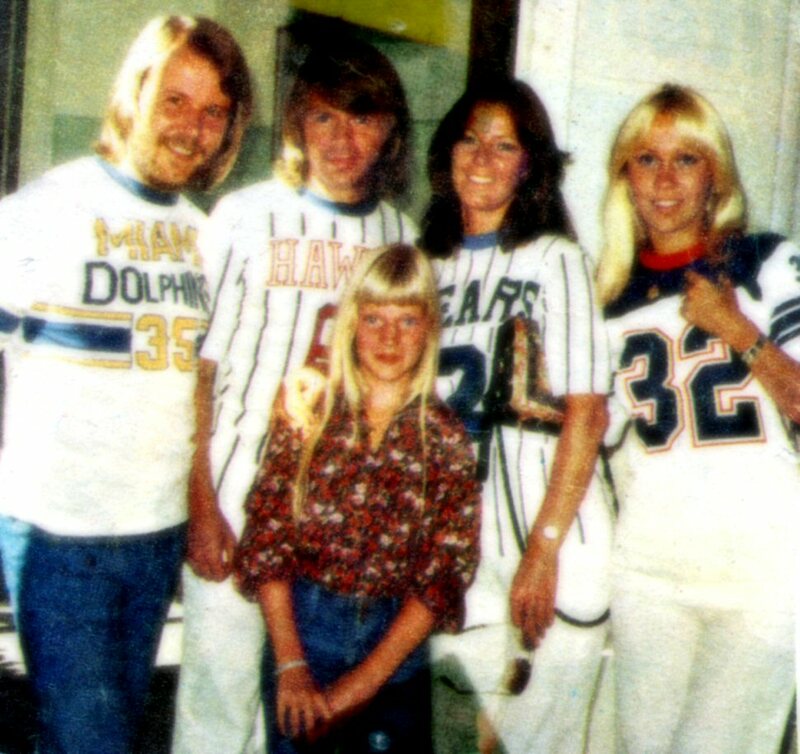 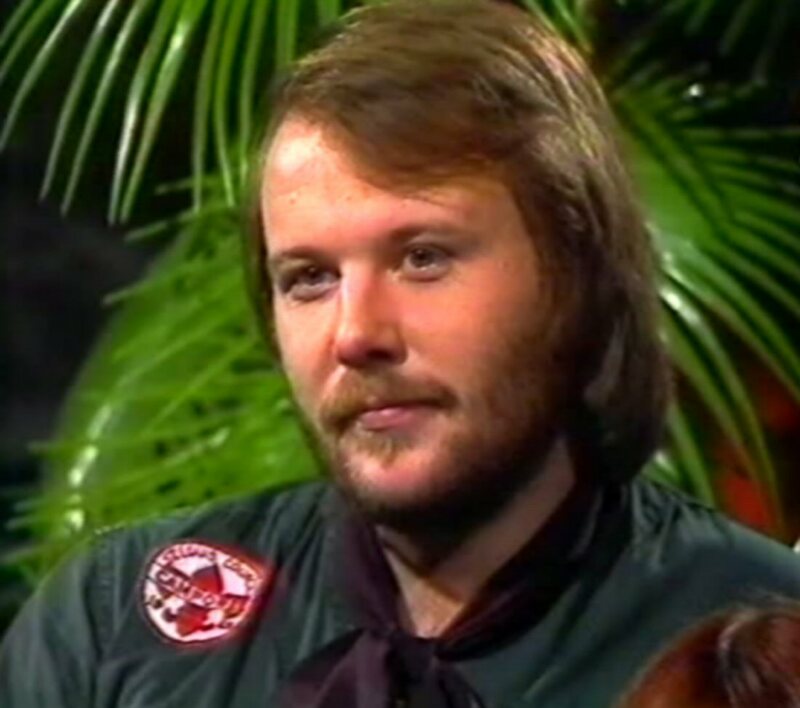 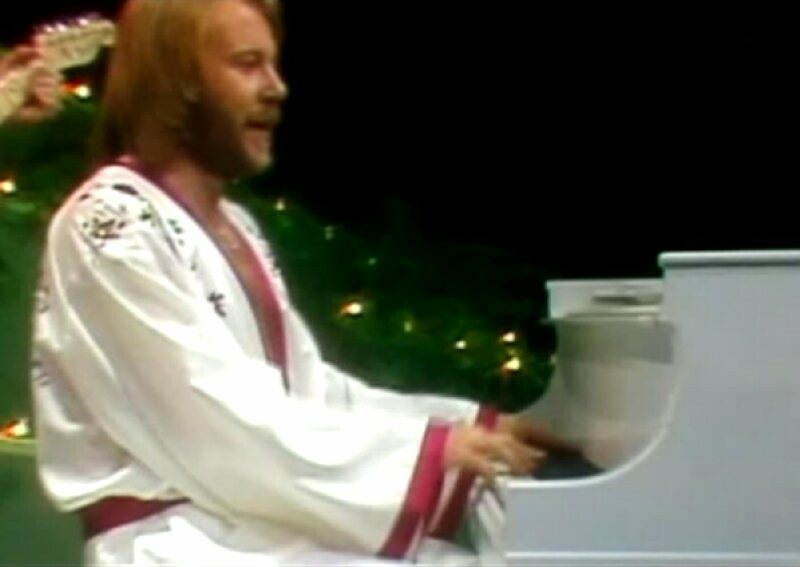 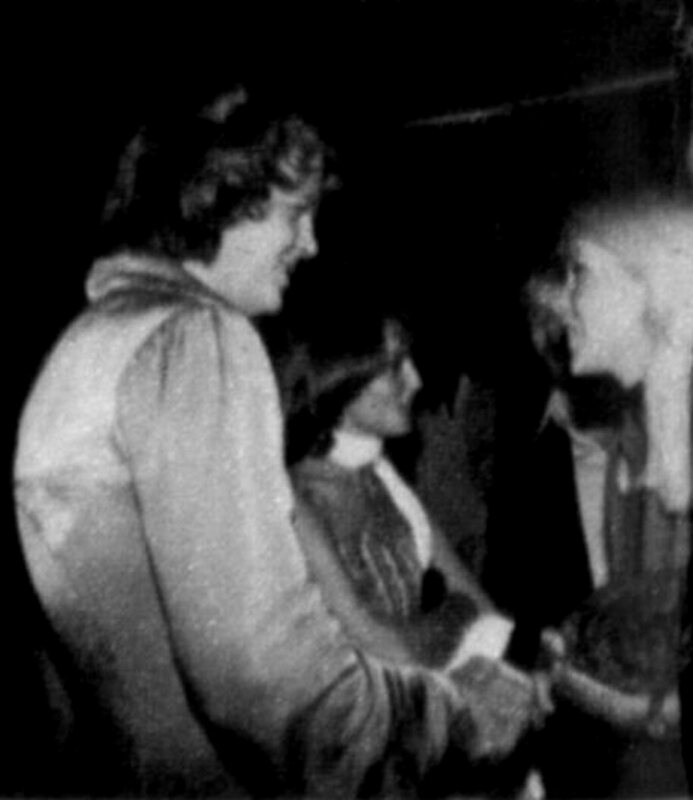 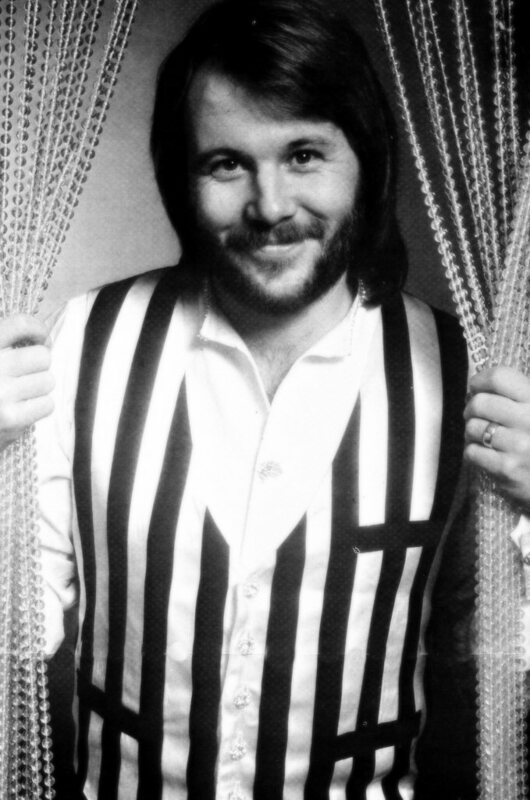 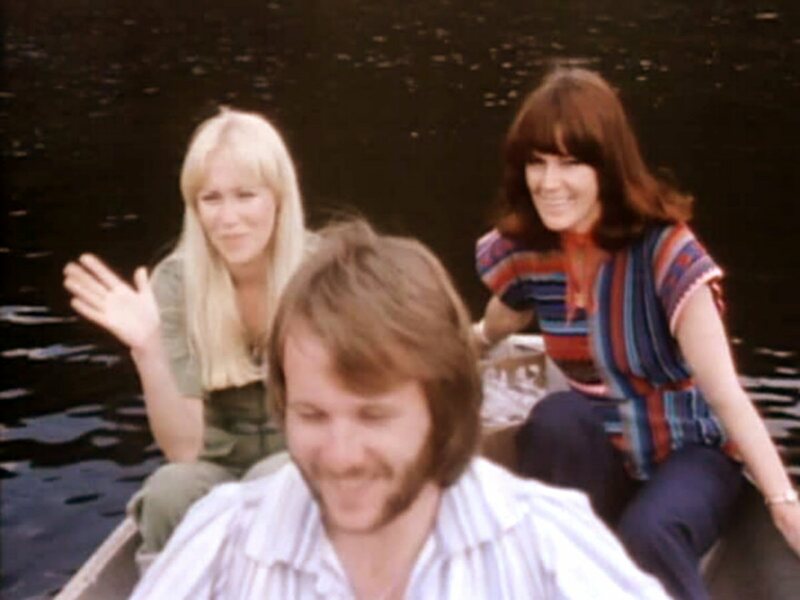 In Vancouver ABBA appeared in two TV shows, one of them was hosted by well-known Canadian personality Mike Neun. 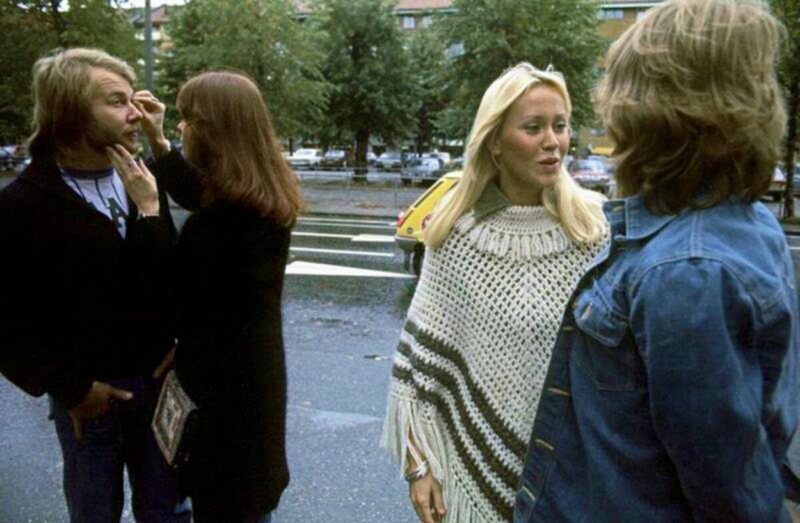 The group performed "Fernando" and "Dancing Queen"
The Bravo team with Wolfgang Heilemann came to Baldersgatan on Monday, October 20th, 1976 and took several pictures in the afternoon. 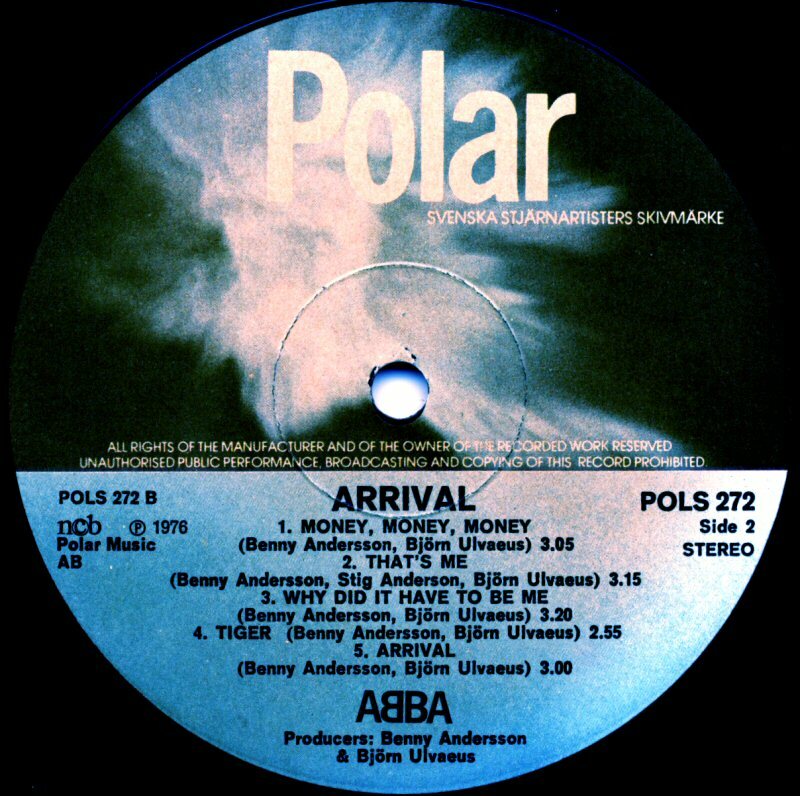 The second single from "Arrival" "Money Money Money"/"Crazy World" was released by Polar on 1 November 1976. 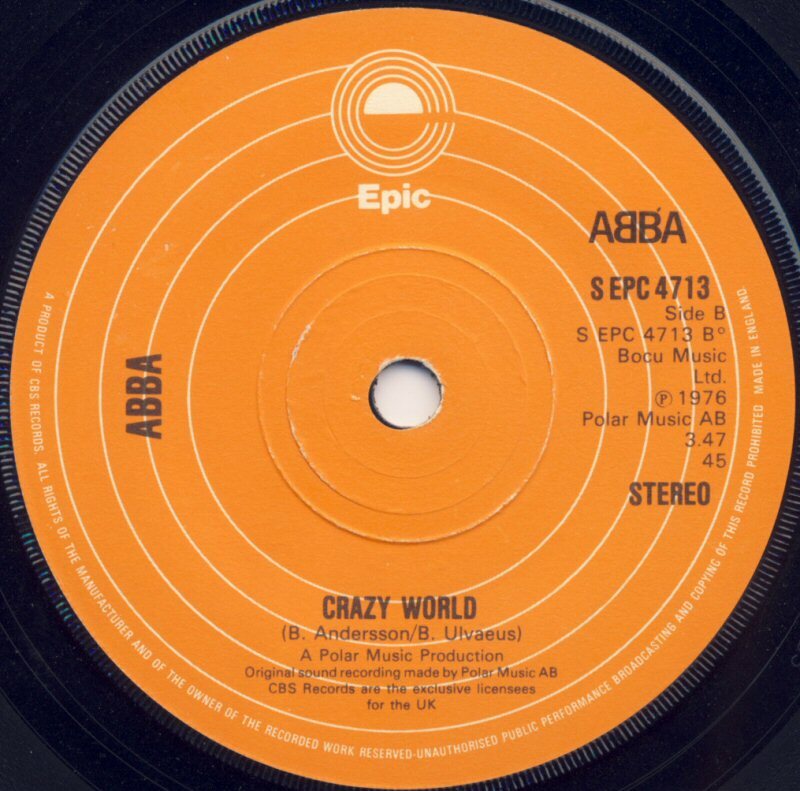 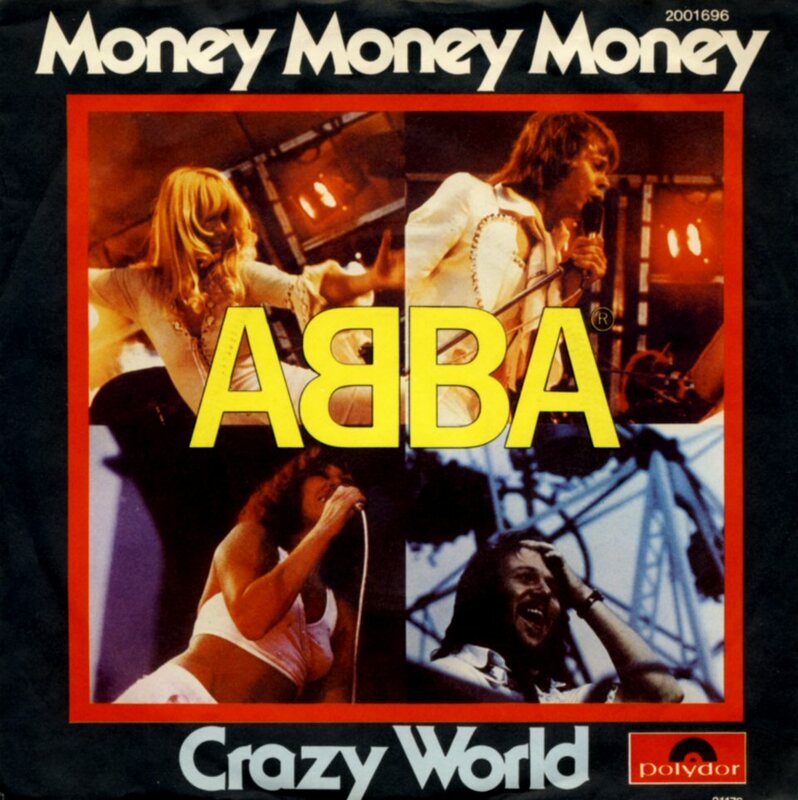 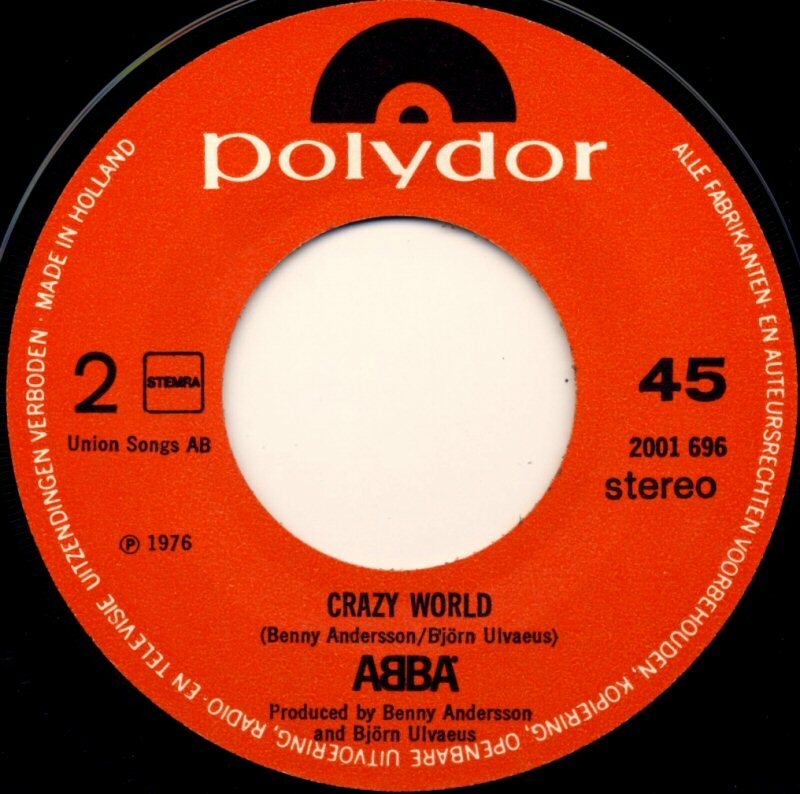 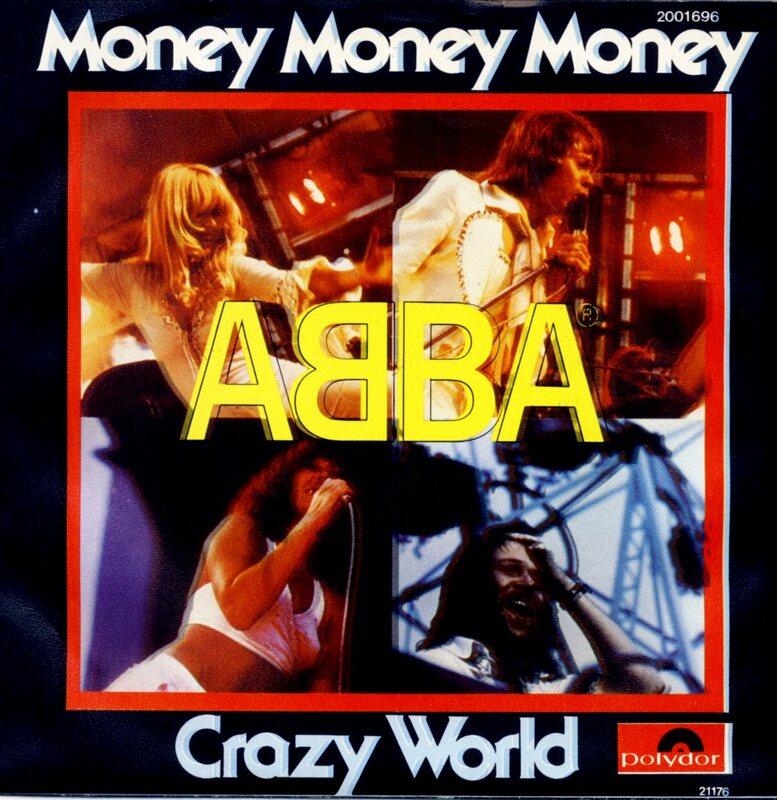 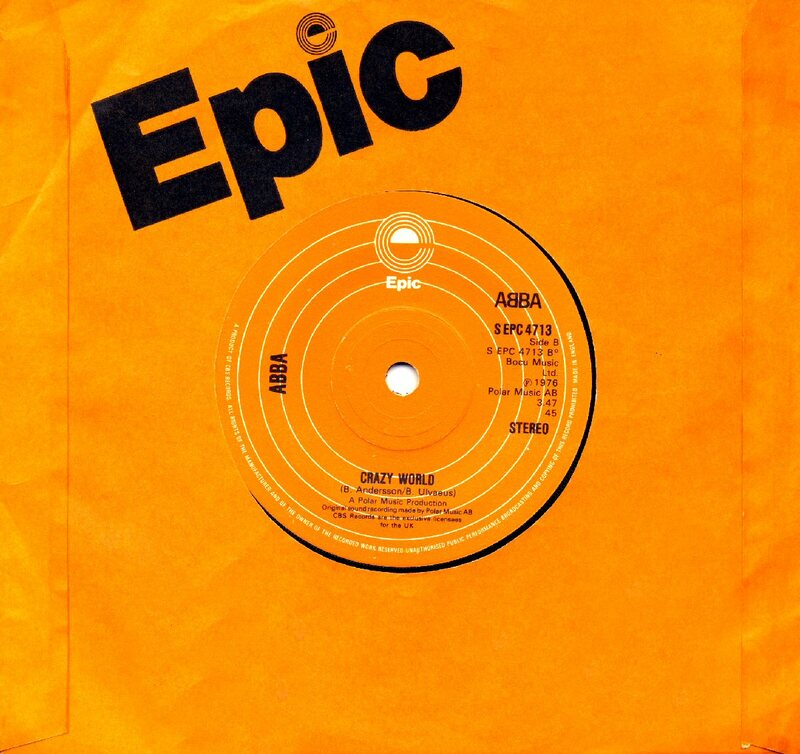 The B-side featured the song "Crazy World" which never appeared on any ABBA LP. 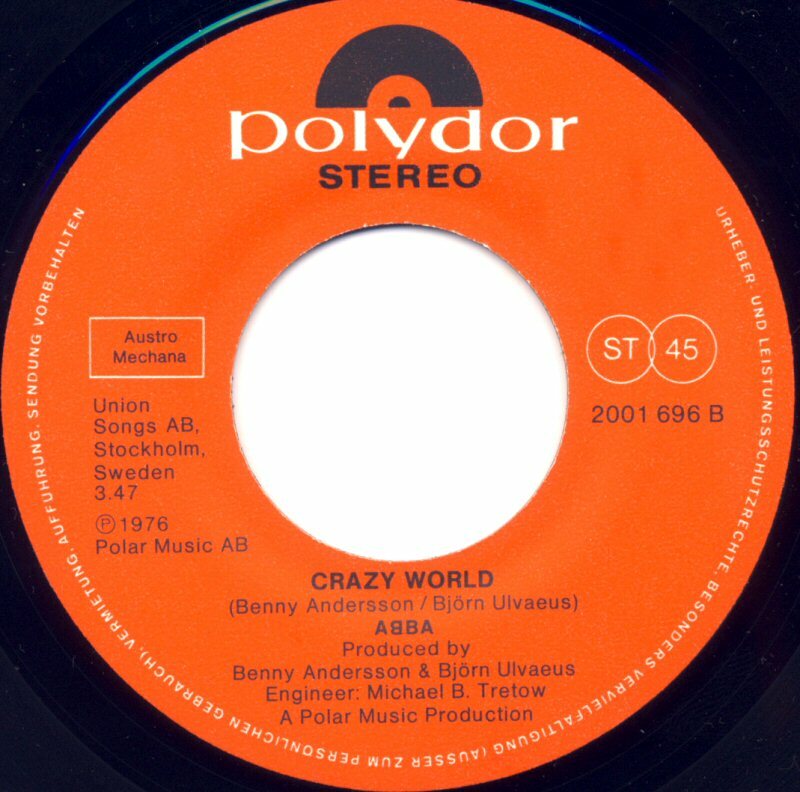 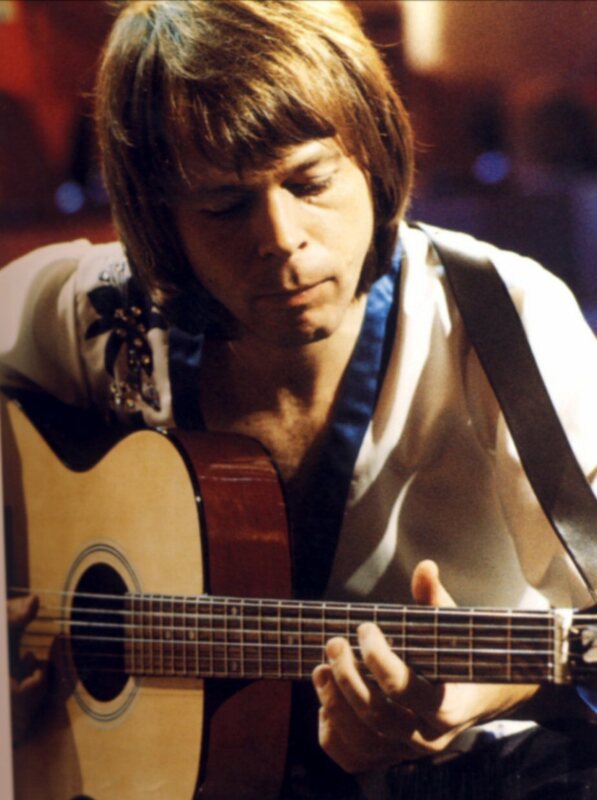 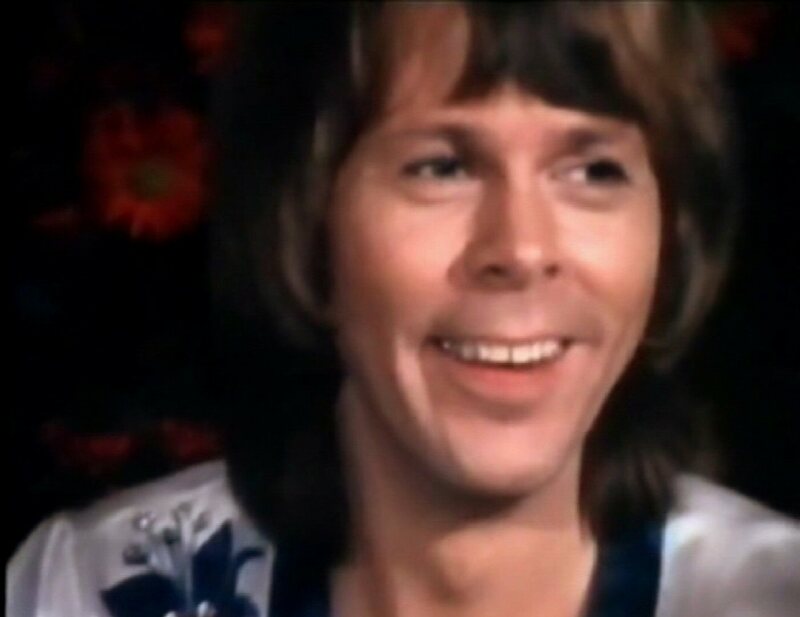 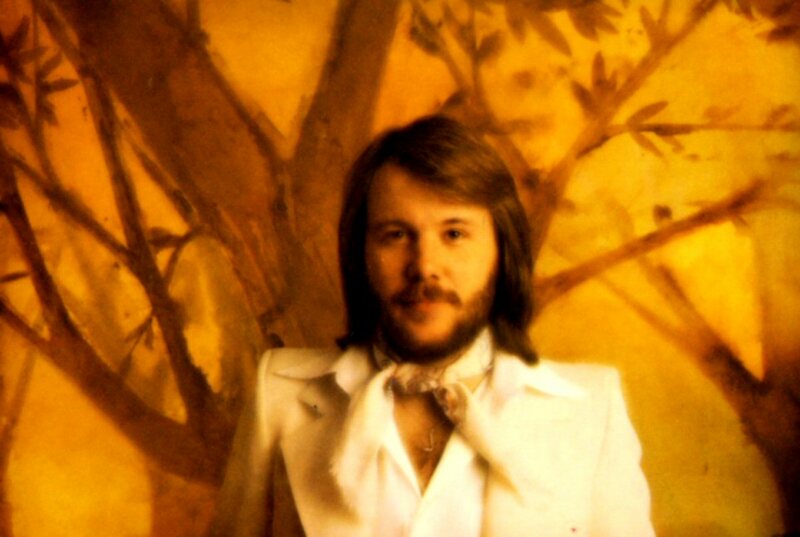 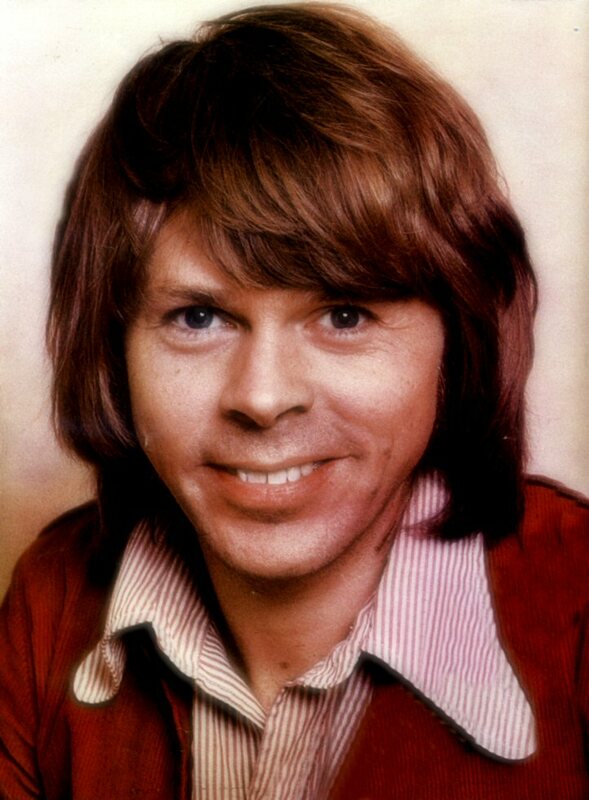 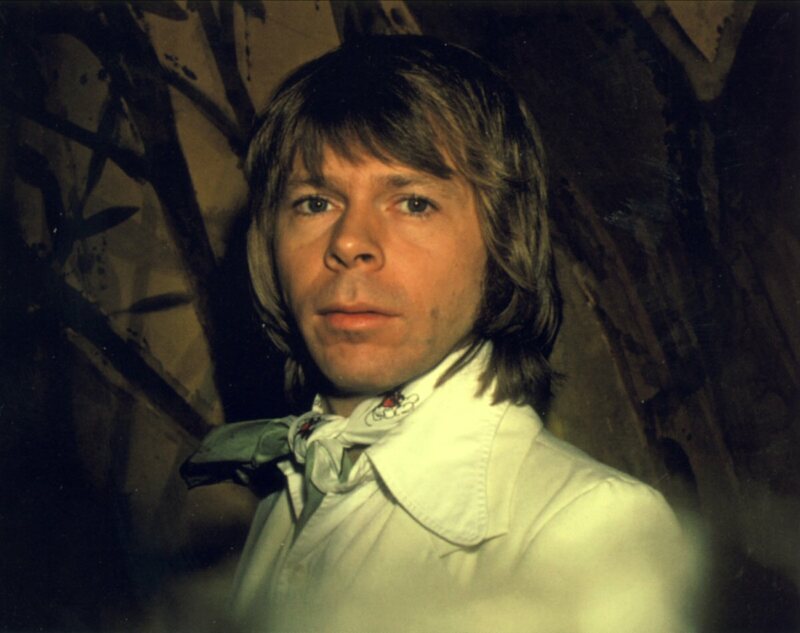 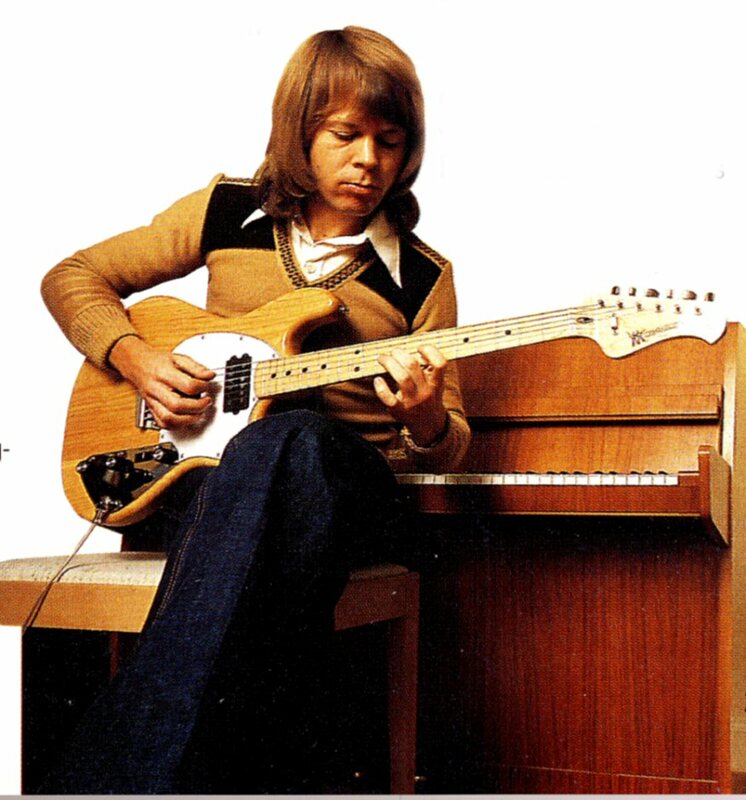 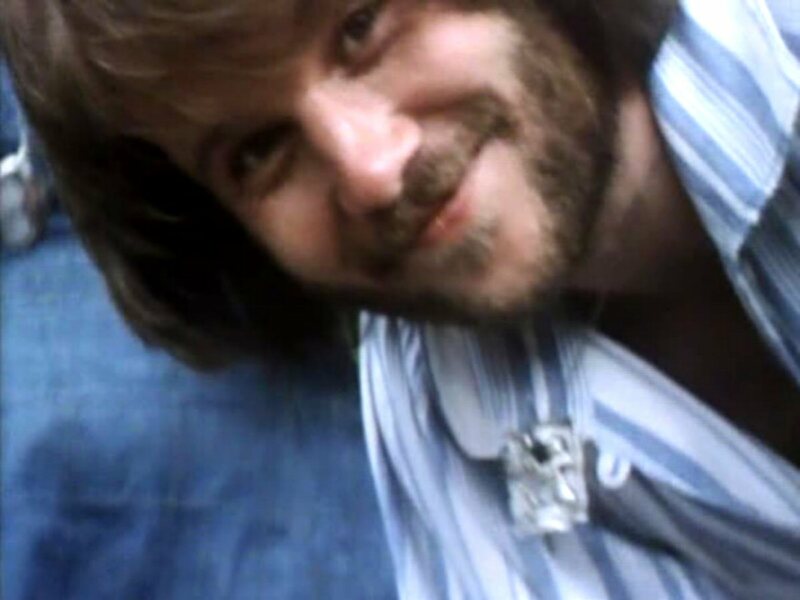 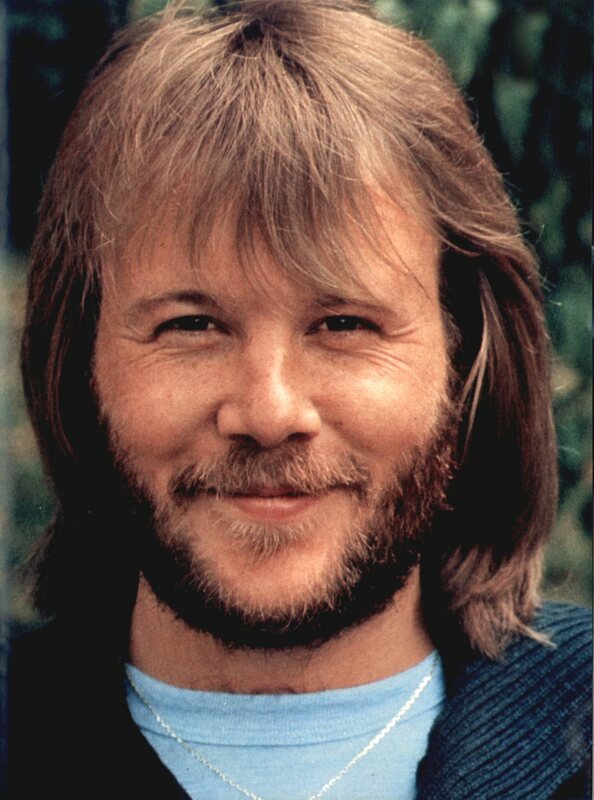 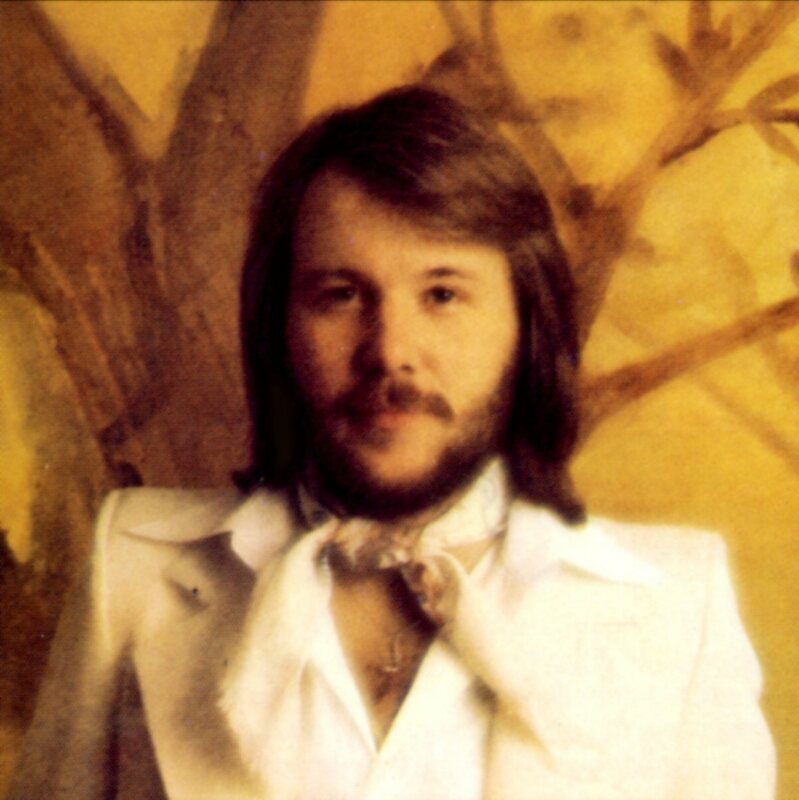 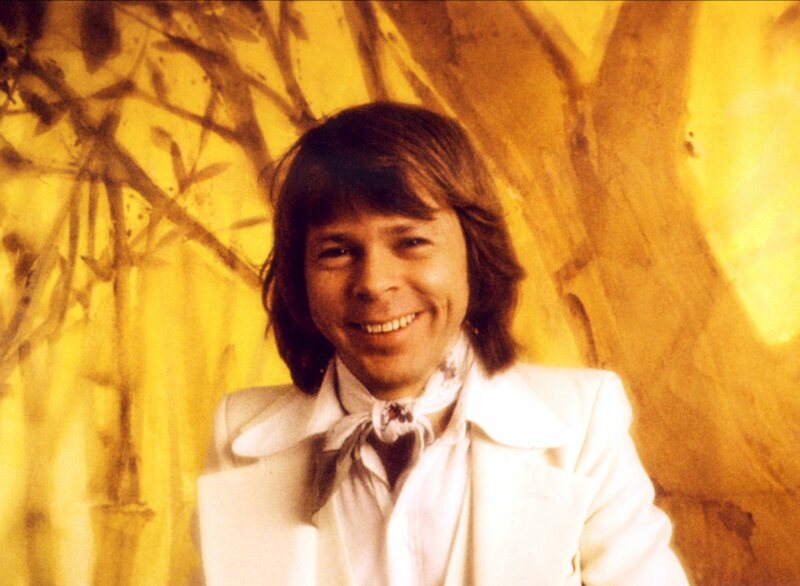 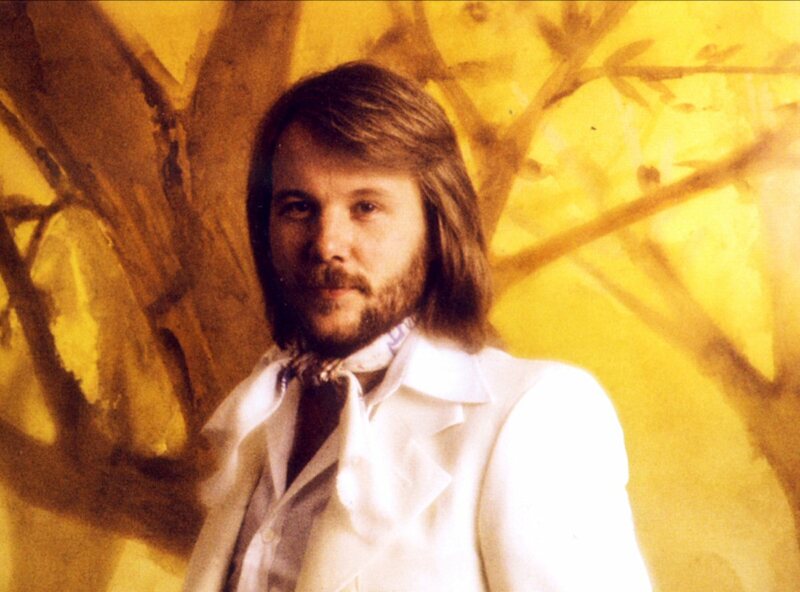 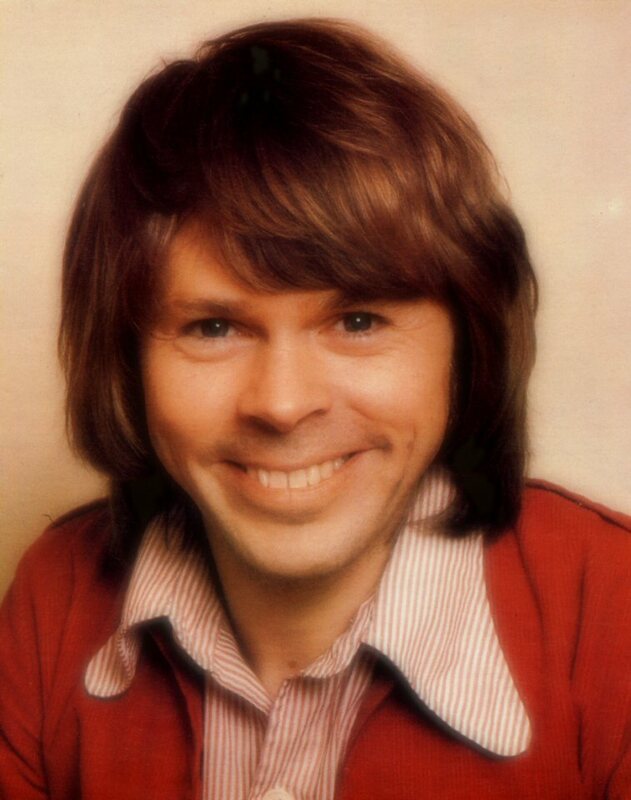 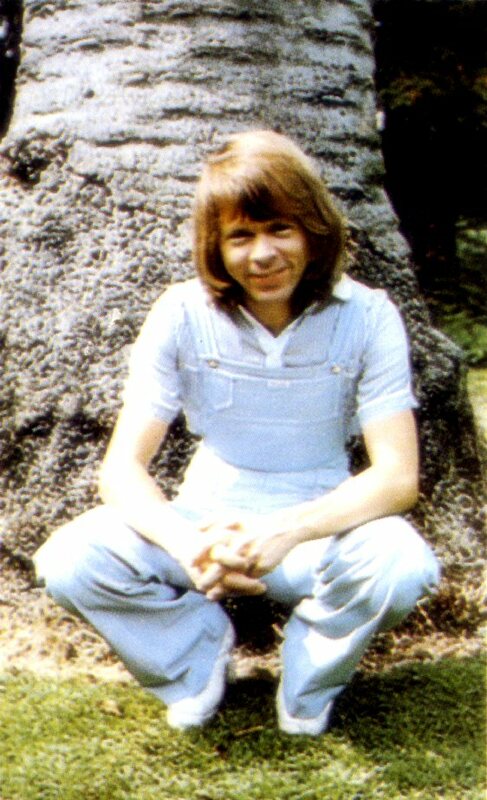 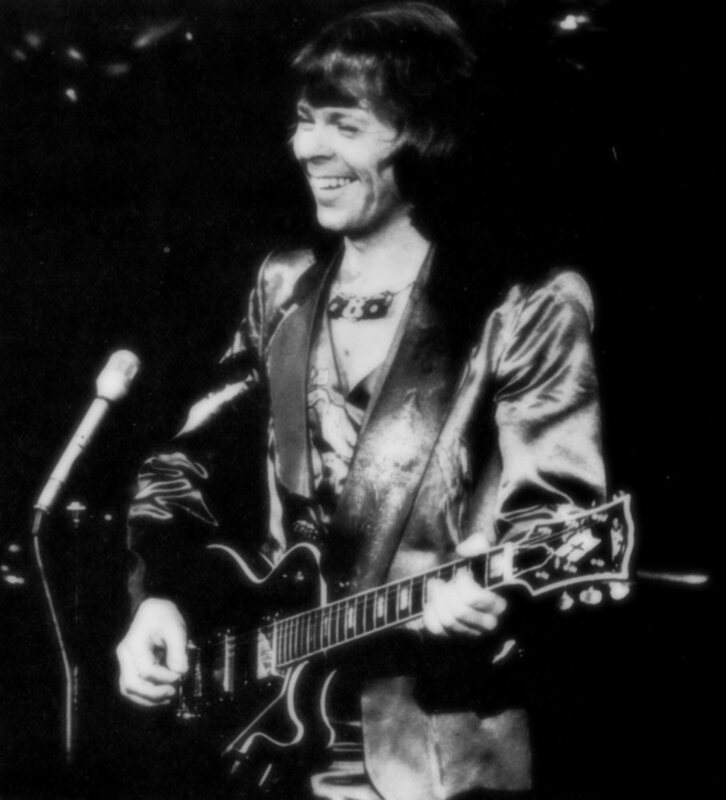 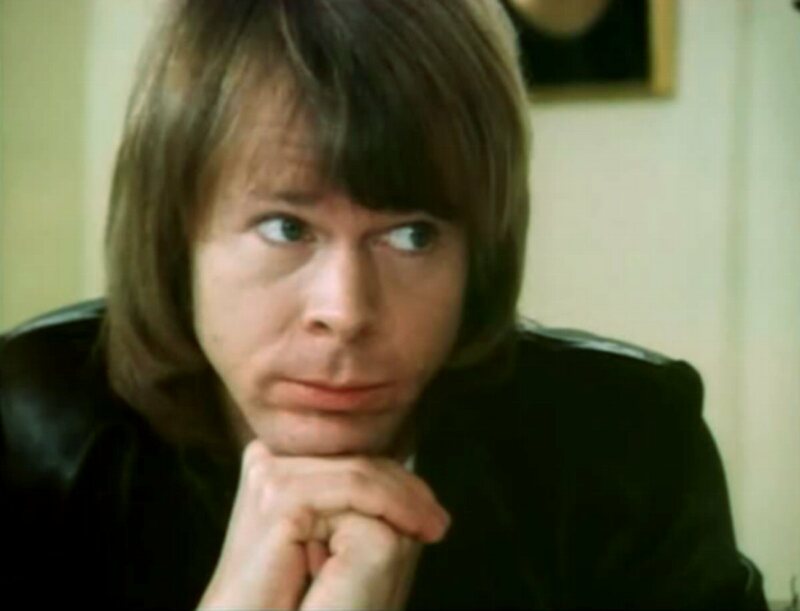 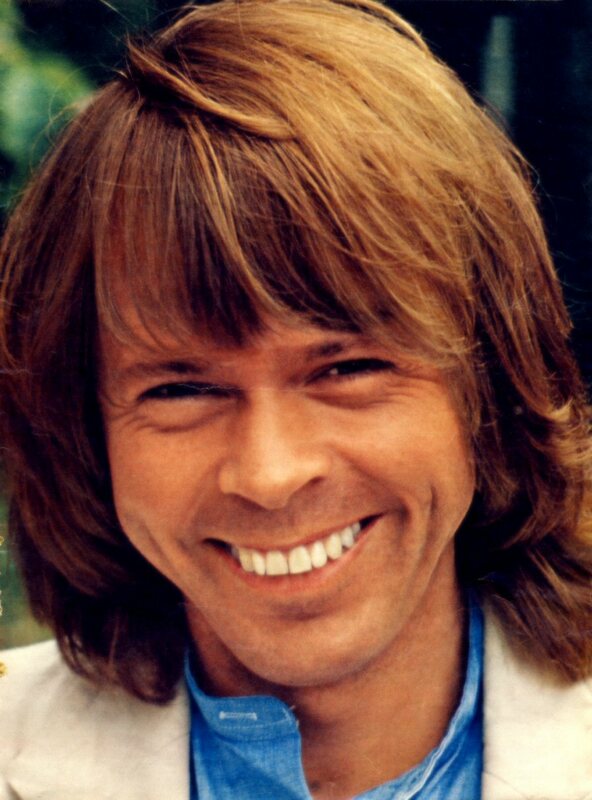 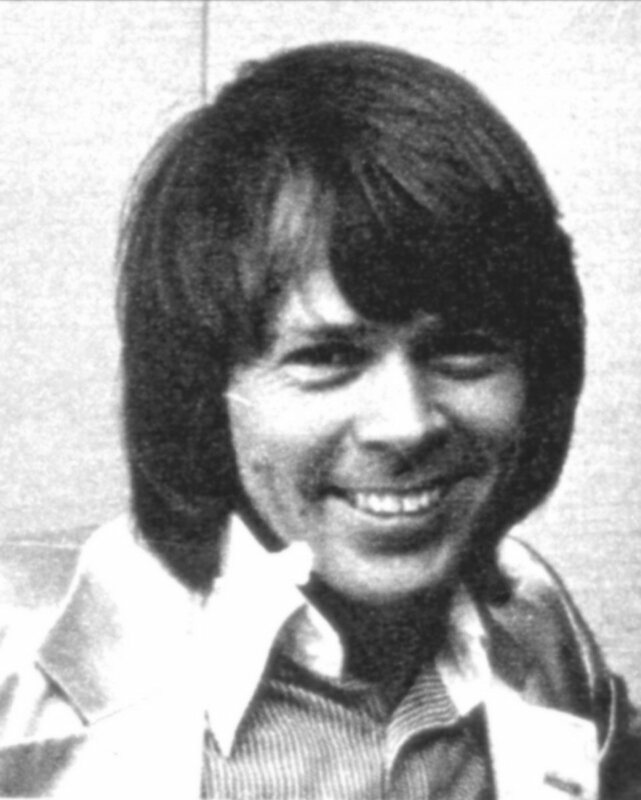 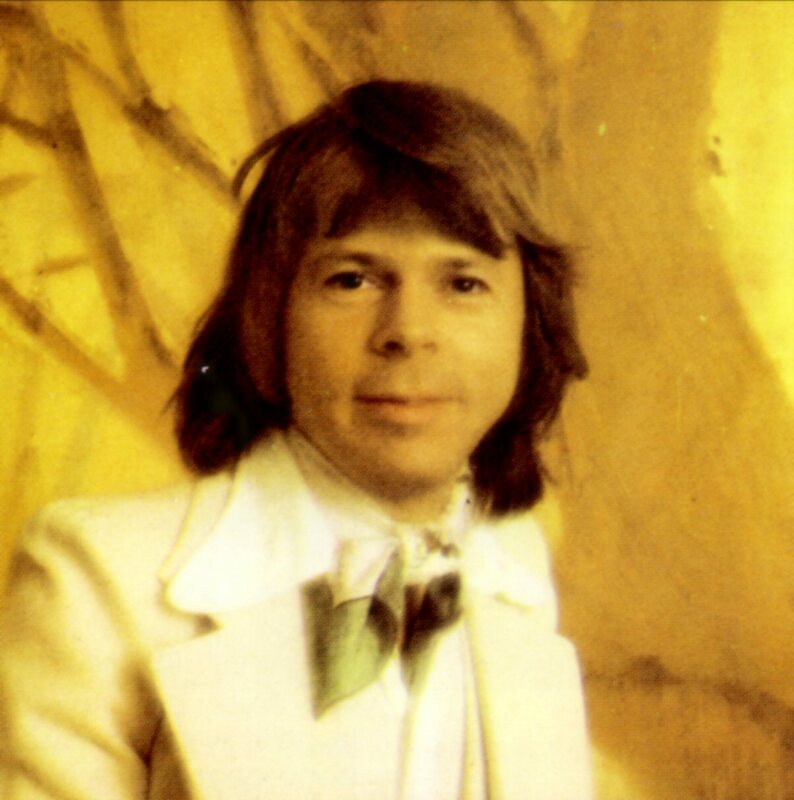 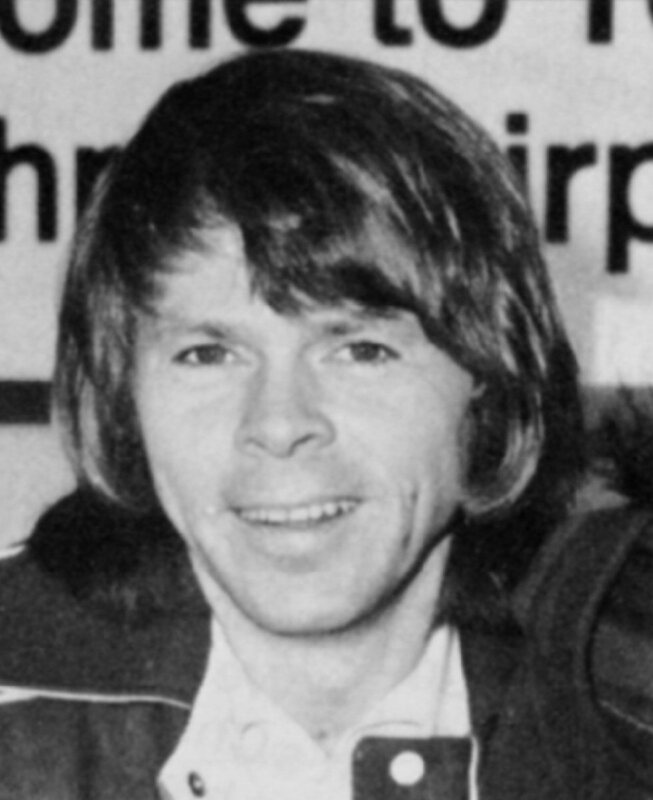 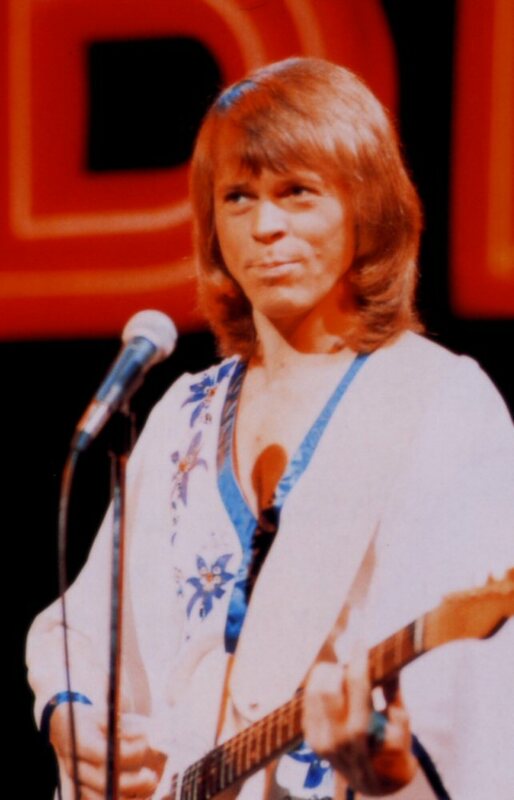 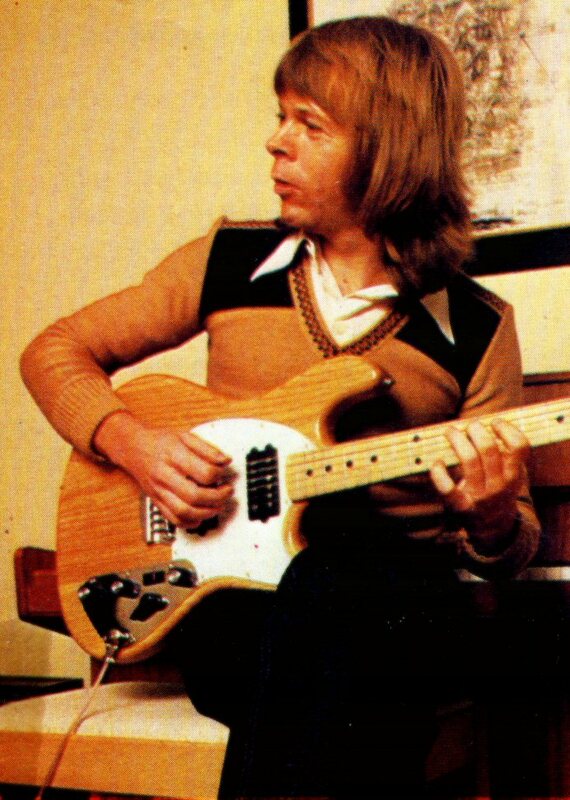 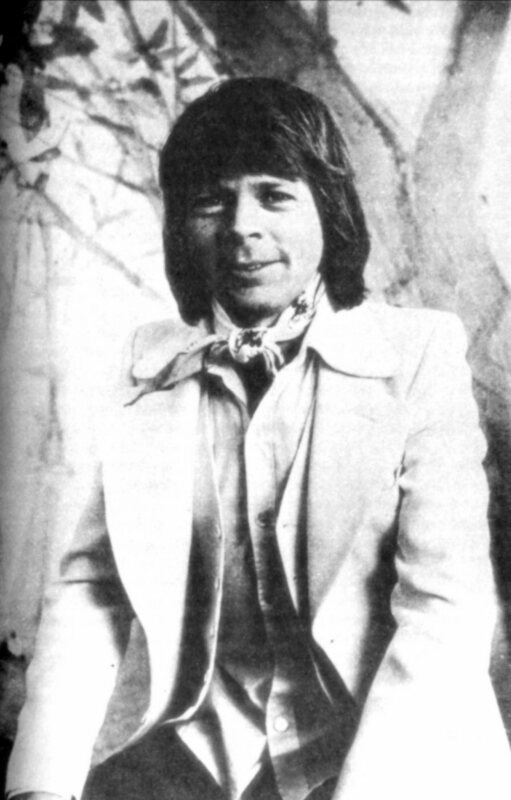 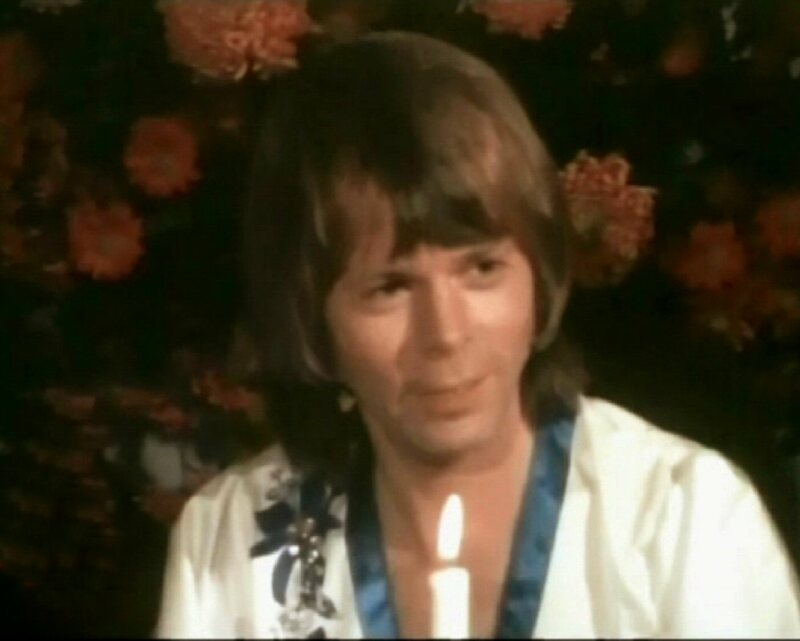 "Crazy World" had been recorded in 1975 with lead vocal was sung by Björn. 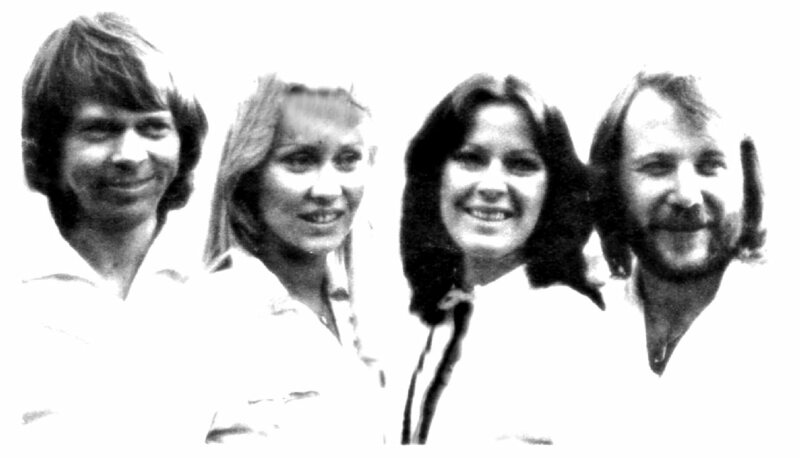 The single cover featured four pictures taken during their 1975 tour. 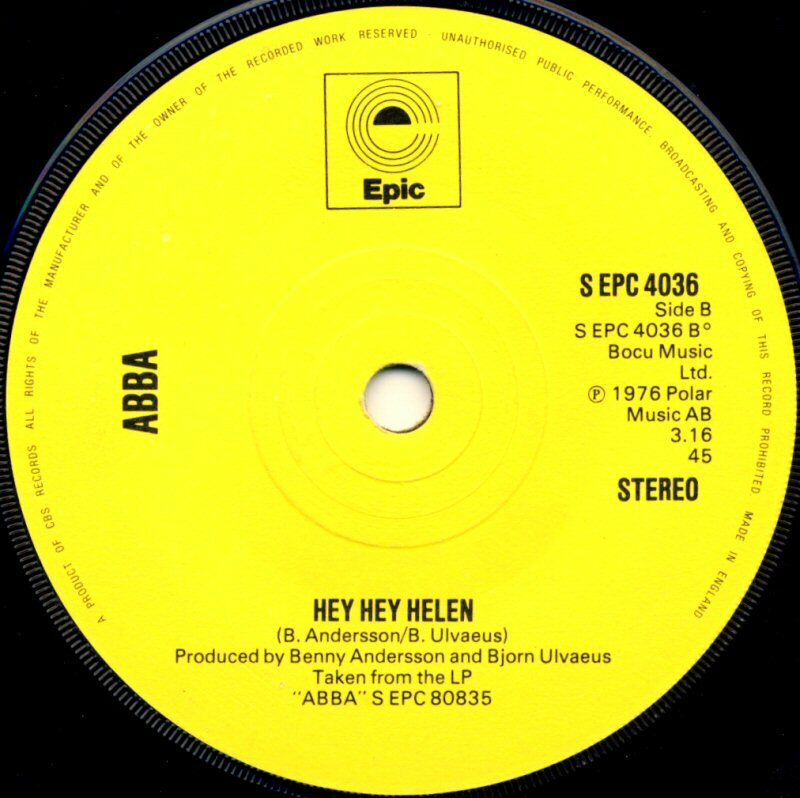 The single entered the UK single chart on 20 November 1976 and stayed there for 12 weeks reaching #3. 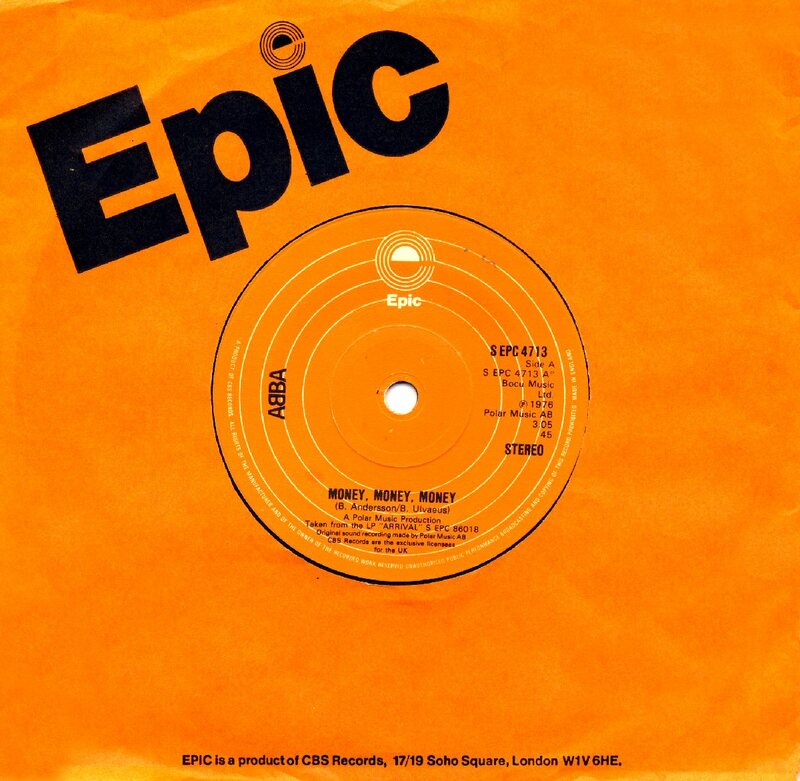 This single was the first one in the UK featuring the new ABBA logo with reversed "B". 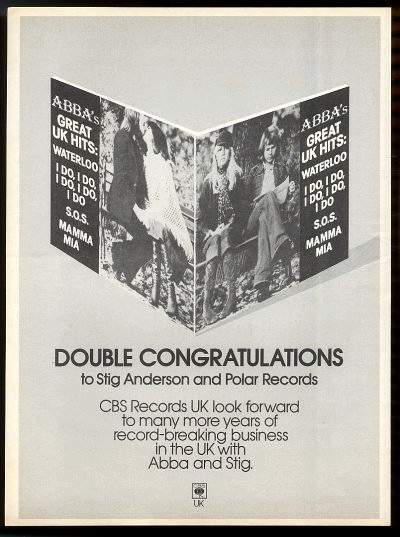 The first pressings of the single featured though both the old one and the new one. 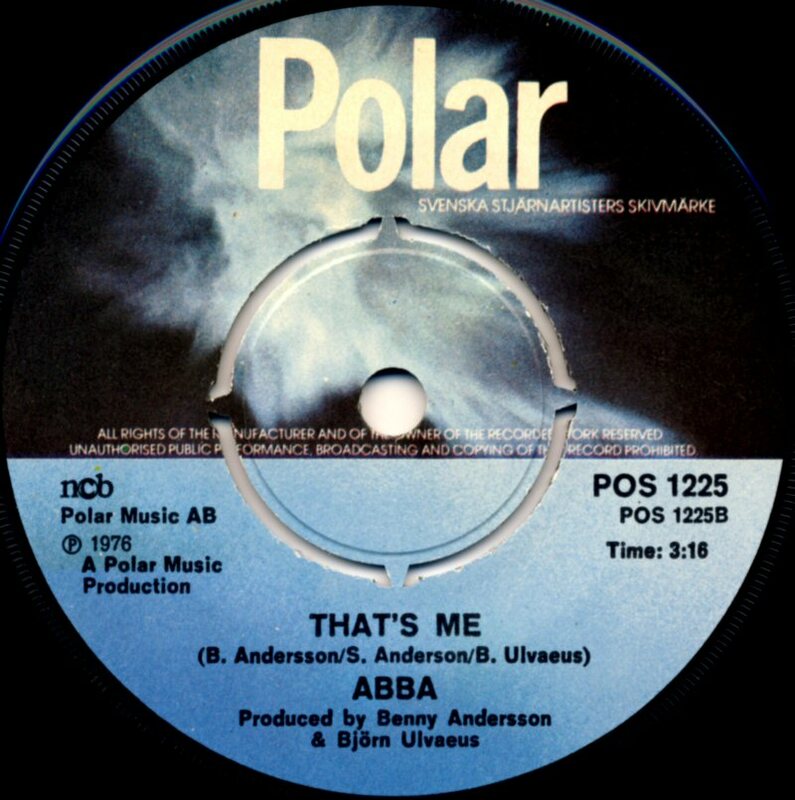 The later pressings featured only the new one. 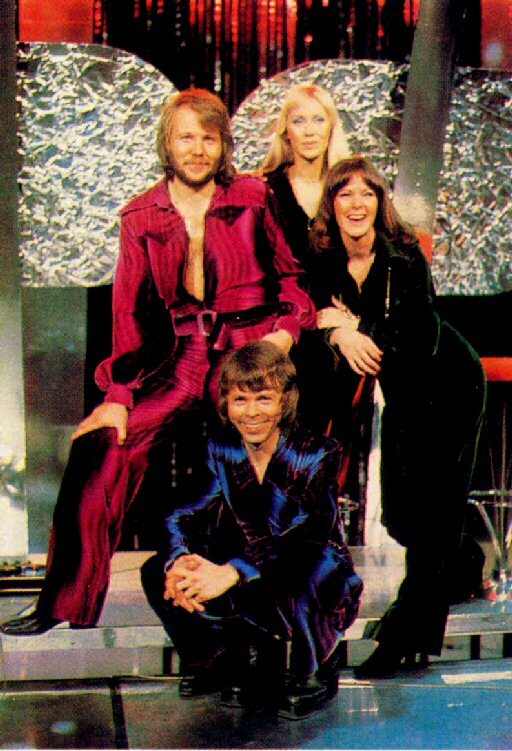 The single was much more successful in West Germany where it stayed for 22 weeks reaching #1 on 20 December 1976 (for 5 weeks). In Austria the single entered the chart on December 15th, 1976 and stayed there for 4 months peaking at #3 in January 1977. 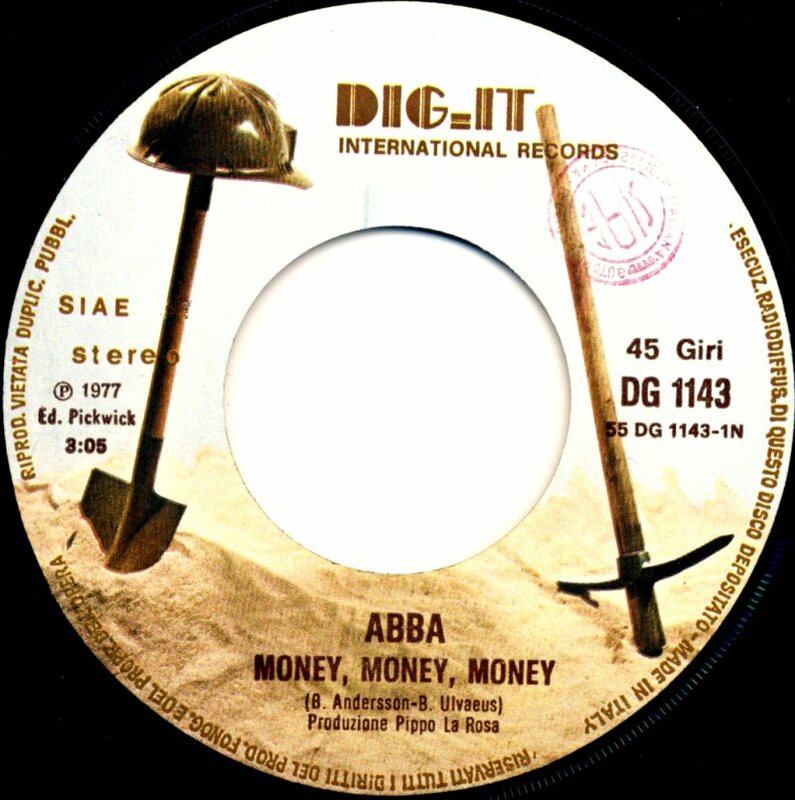 In France "Money Money Money" entered the chart at the beginning of December 1976 and it stayed there for 13 weeks reaching #1. The single was very successful in the Benelux countries. 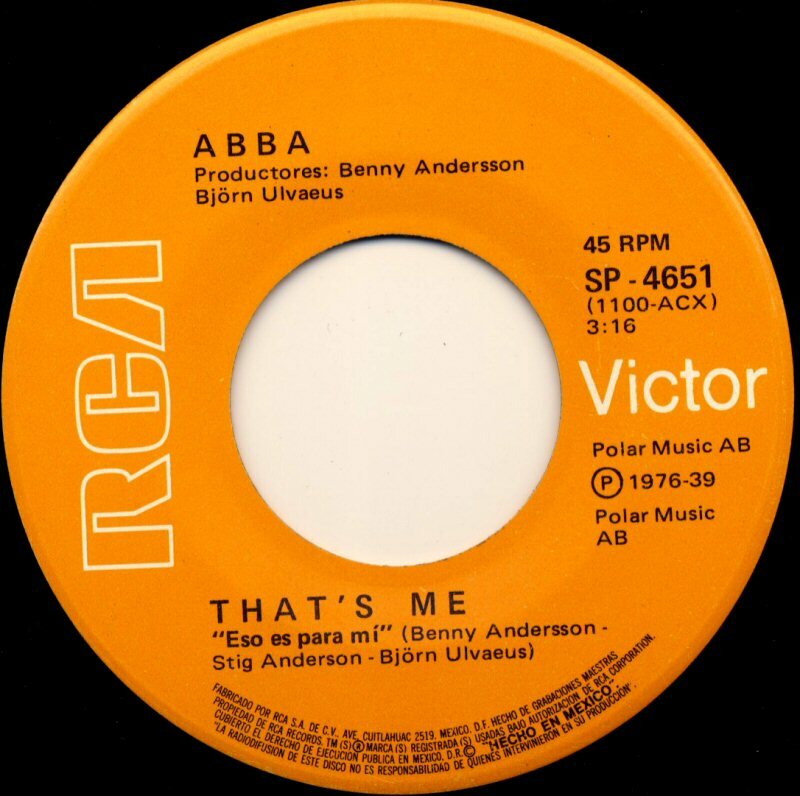 In The Netherlands it entered the chart on 13 November 1976 and it stayed there for coming 12 weeks reaching #1. 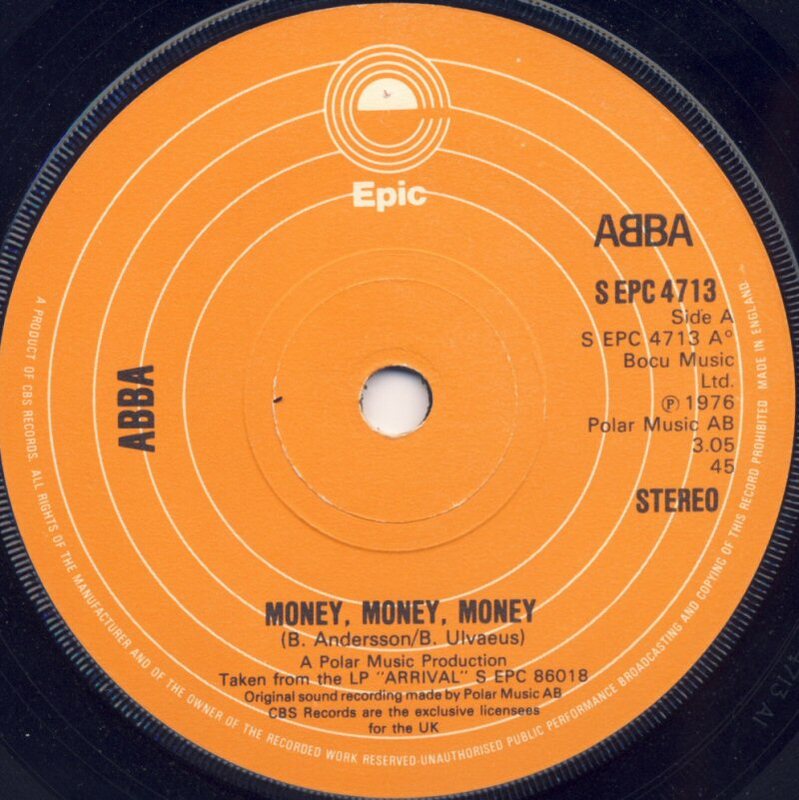 Even in Belgium "Money Money Money" became #1. The single was released in Italy at the beginning of 1977 and it featured two A-sides with "Money Money Money" ("Money Money" on the cover) and "Knowing Me Knowing You". 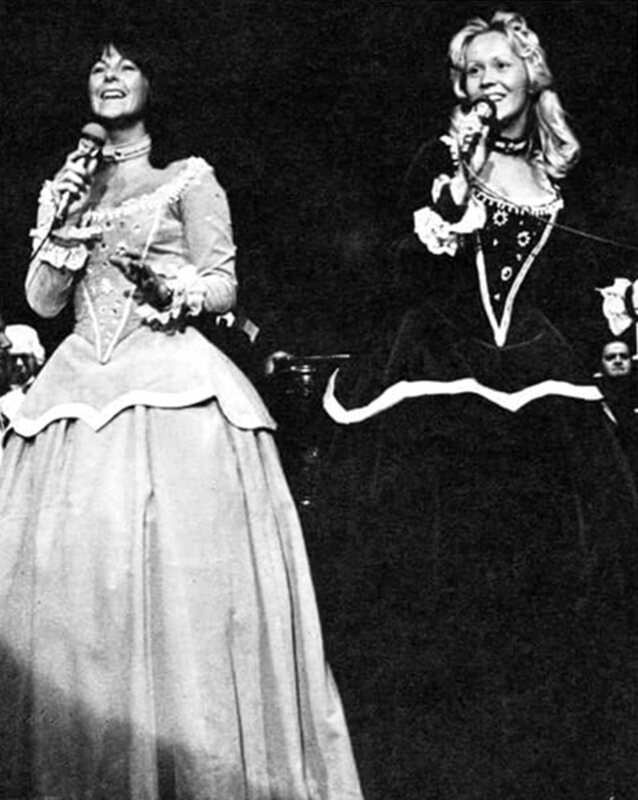 Even if the both songs became smash hits in Europe they did not become big hits in Italy where the single flopped. 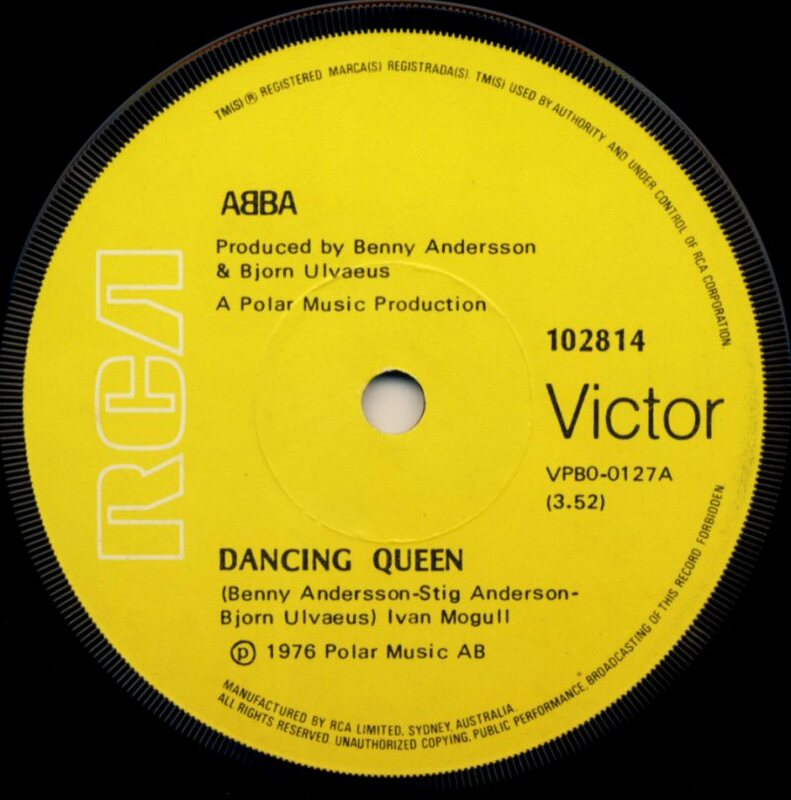 In USA the single was released almost one year later - in October 77. 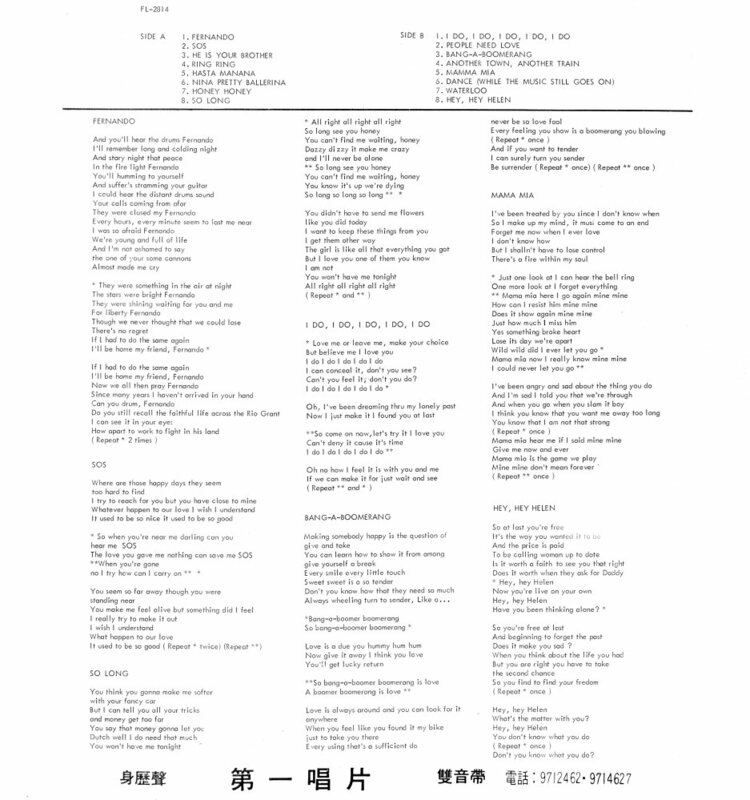 It stayed on the chart for 12 weeks reaching though only #56. 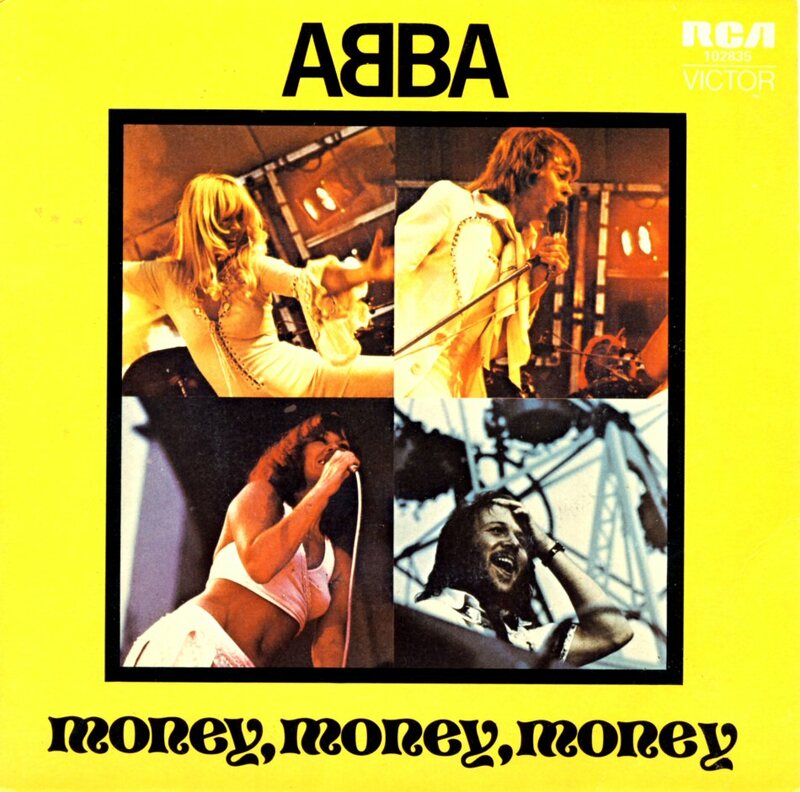 "Money Money Money" entered the Australian hit chart on 3 November 1976 (entry position #5) and it stayed there for 14 weeks. 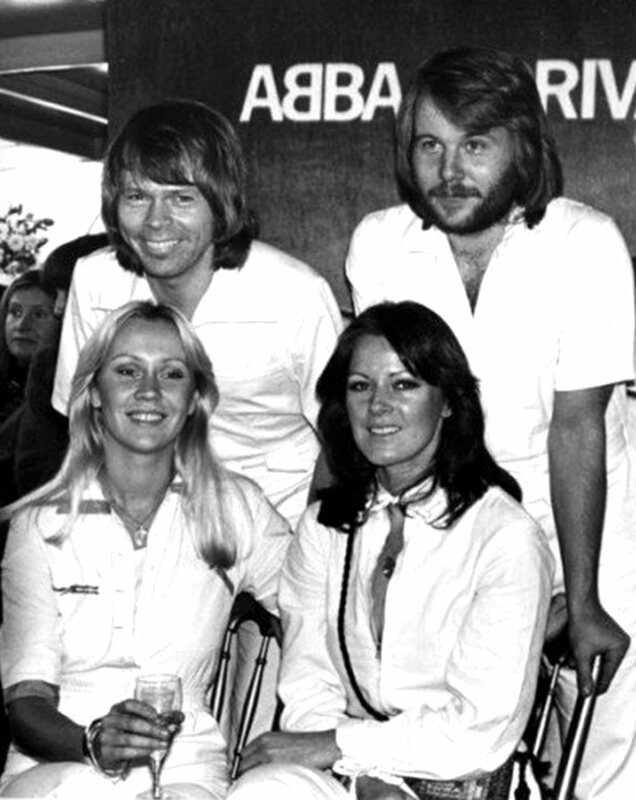 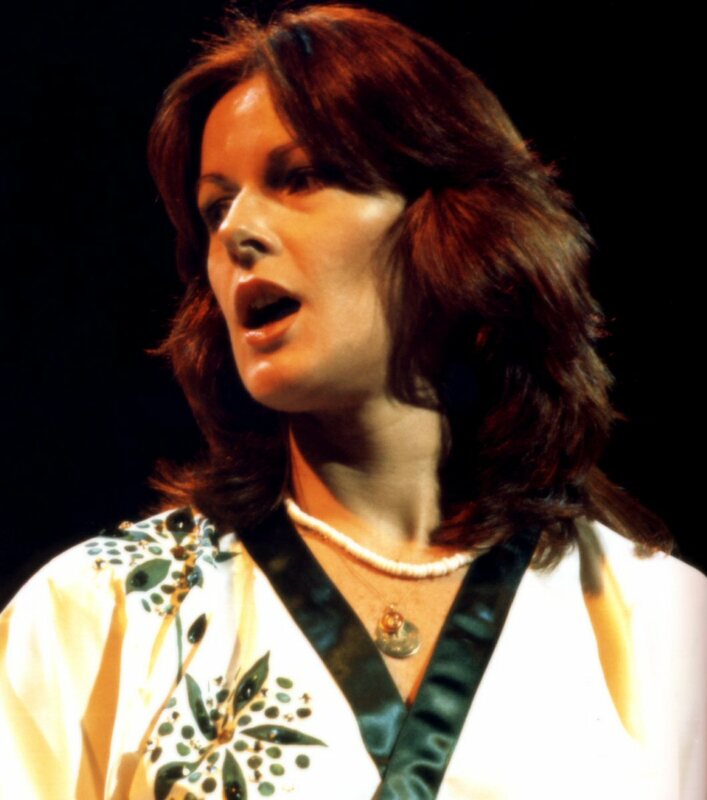 The single became ABBA's sixth number 1 single in Australia, remaining on the top for 6 weeks. 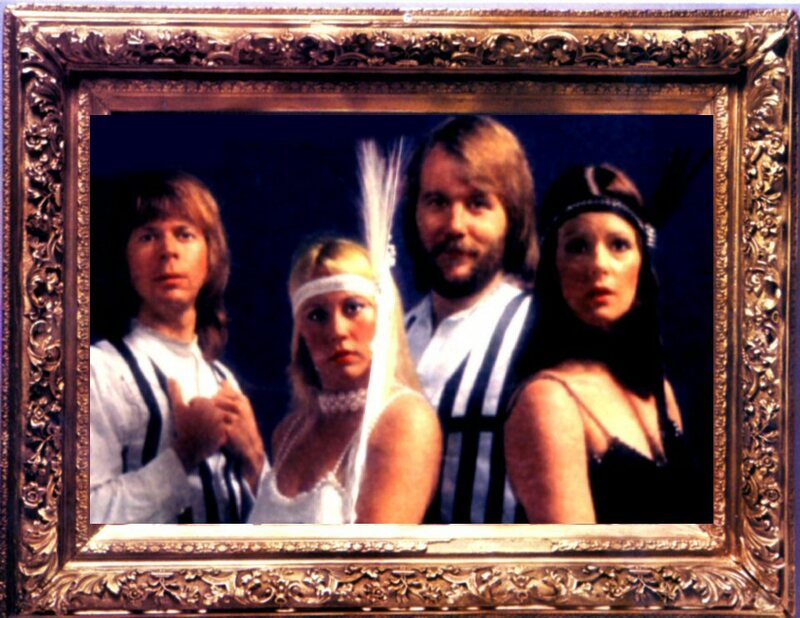 ABBA created a new image for performances of this song and the outfits which maybe can lead the thoughts to the famous film "Cabaret". 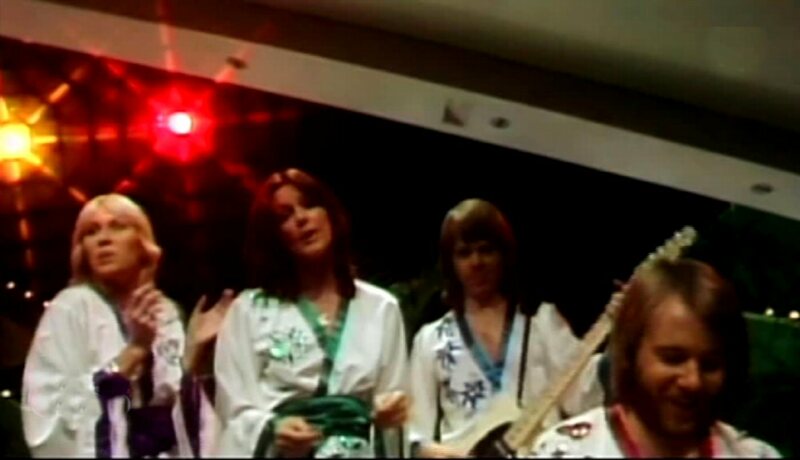 The official video though featured the group members in the kimono-outfits. 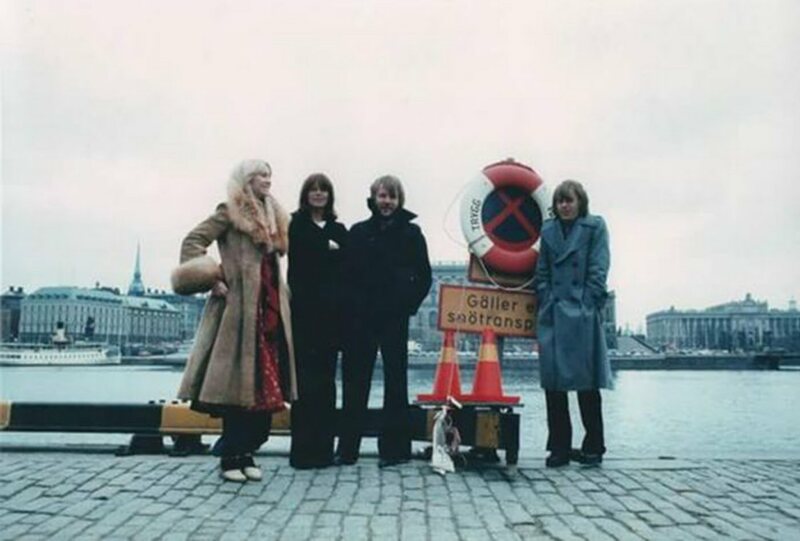 The video was made at the beginning of autumn in Stockholm. 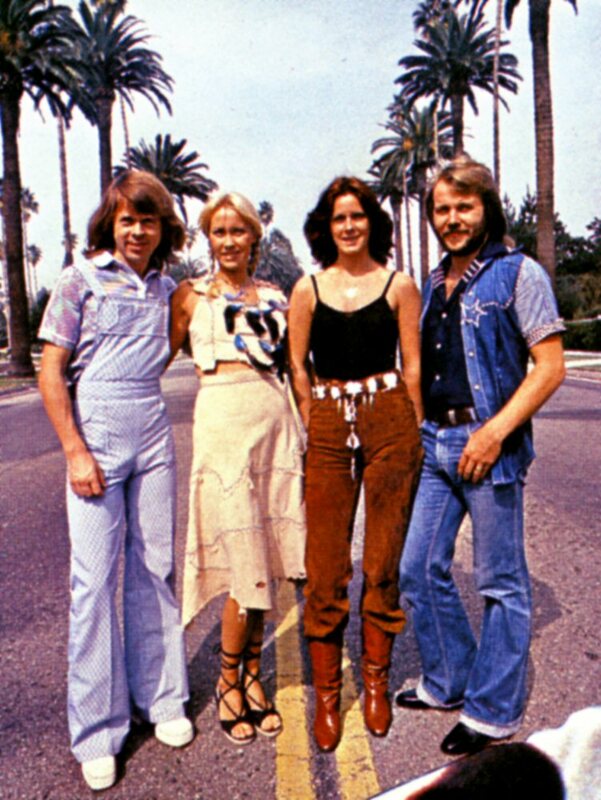 Frida was filmed in the Old Town; the car with all four members was filmed on the central bridge (Centralbron) in the city center and on the island Lidingö. 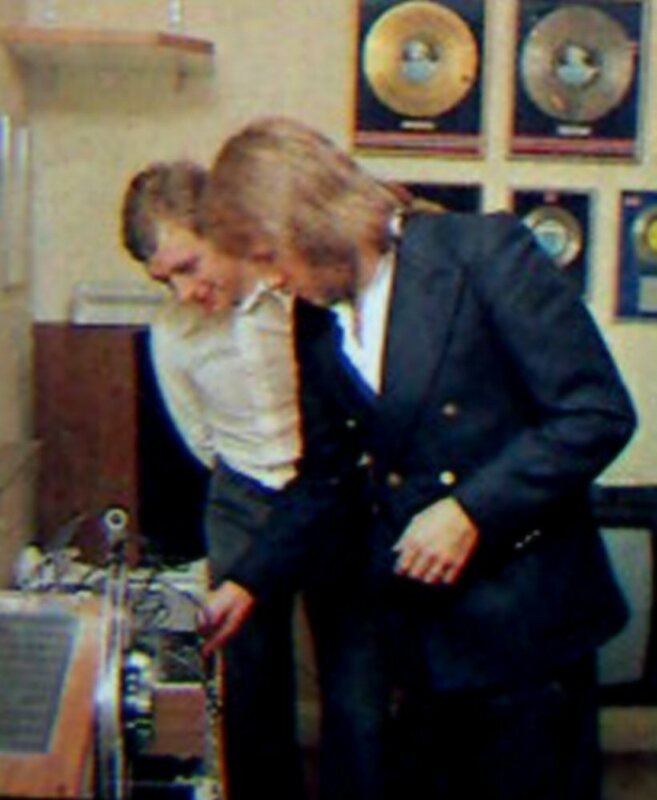 The other parts of the video were recorded in the studio. 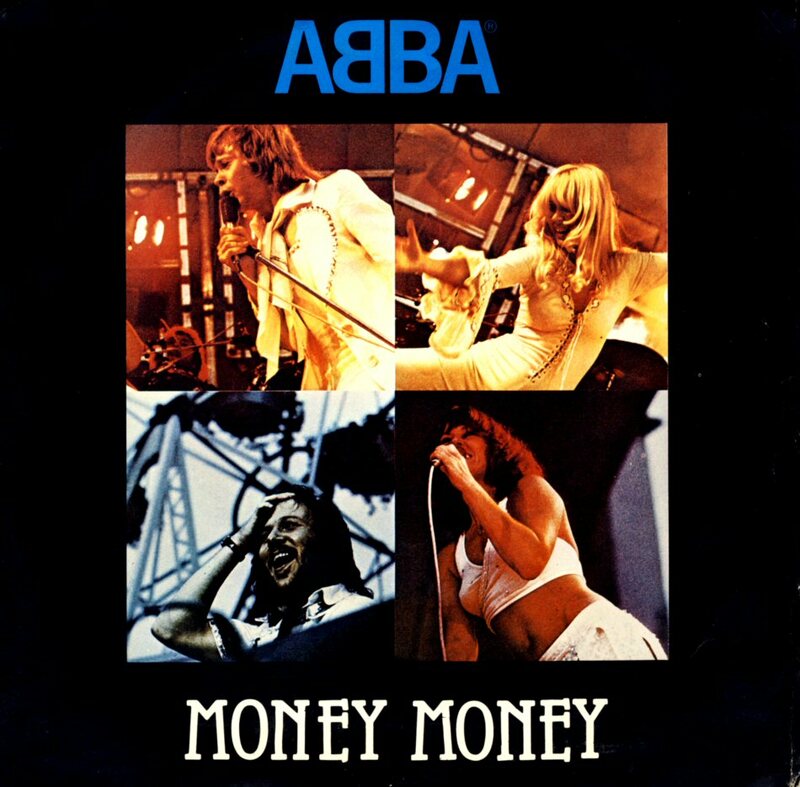 Several different photo sessions were taken during this period of 1976 in the "Money Money Money" outfits. 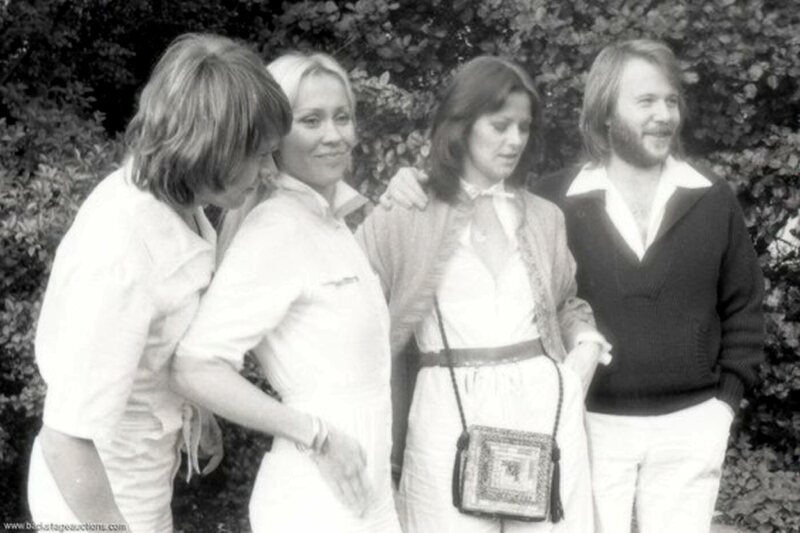 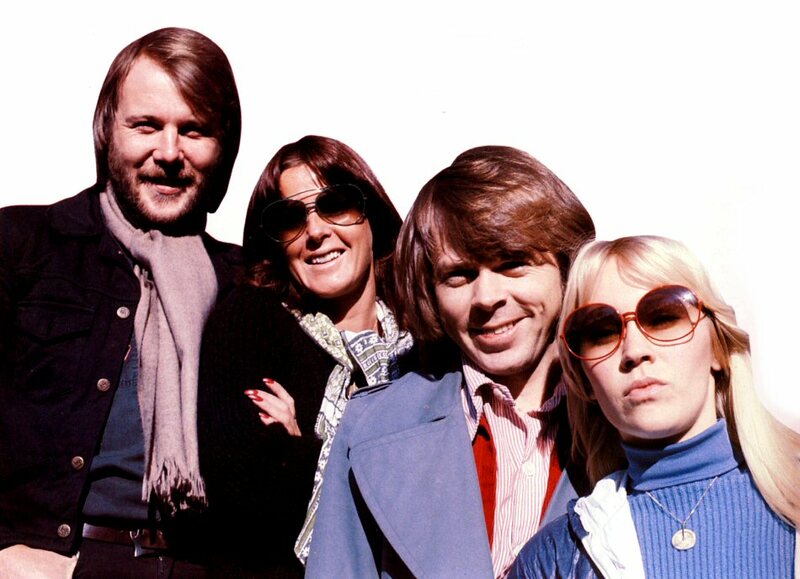 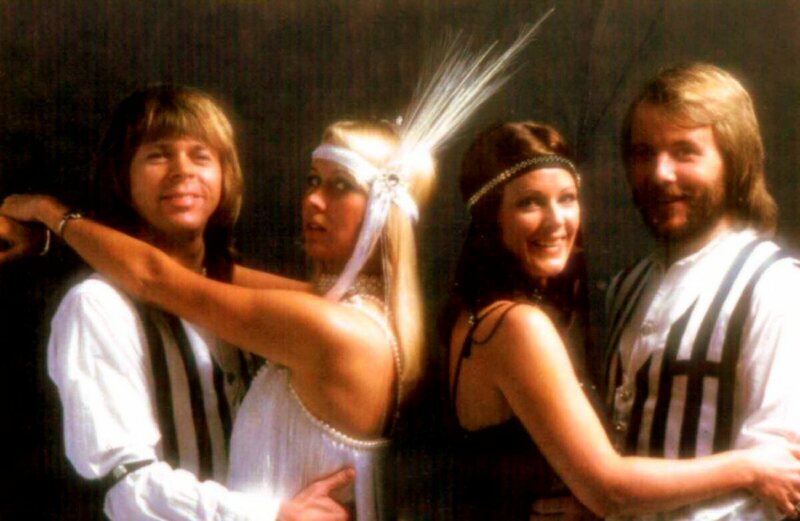 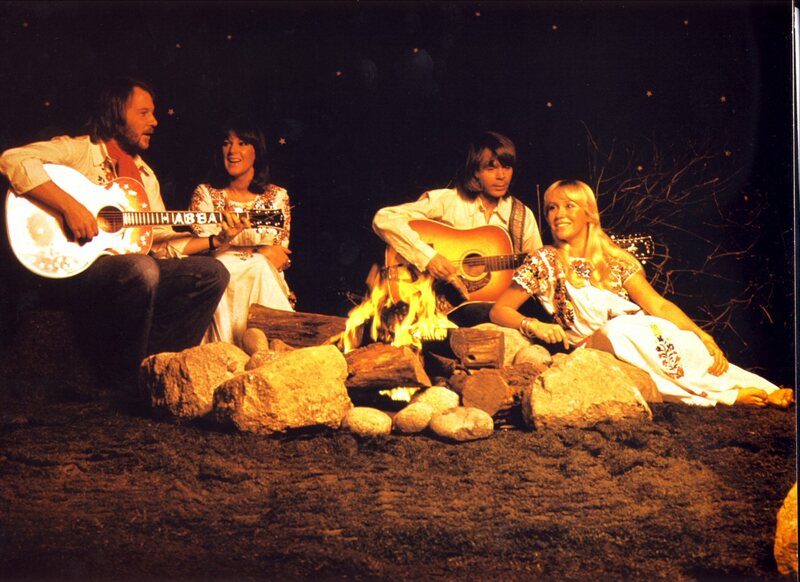 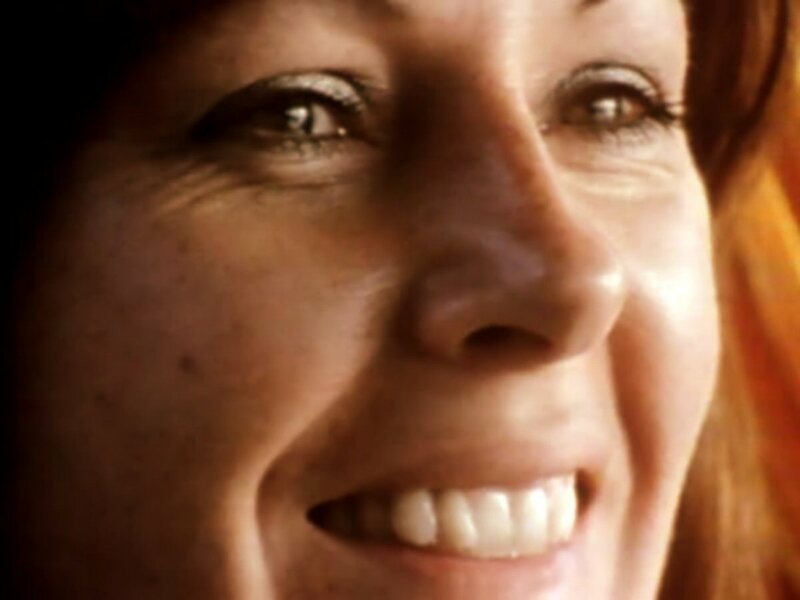 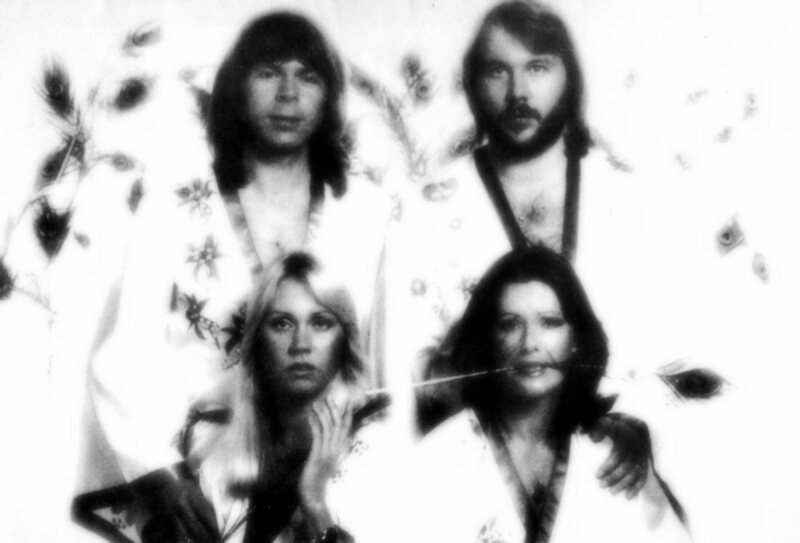 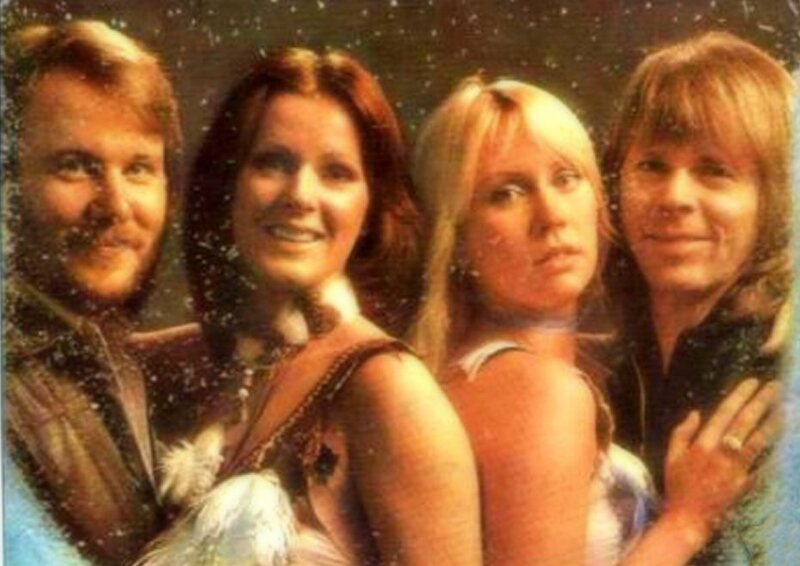 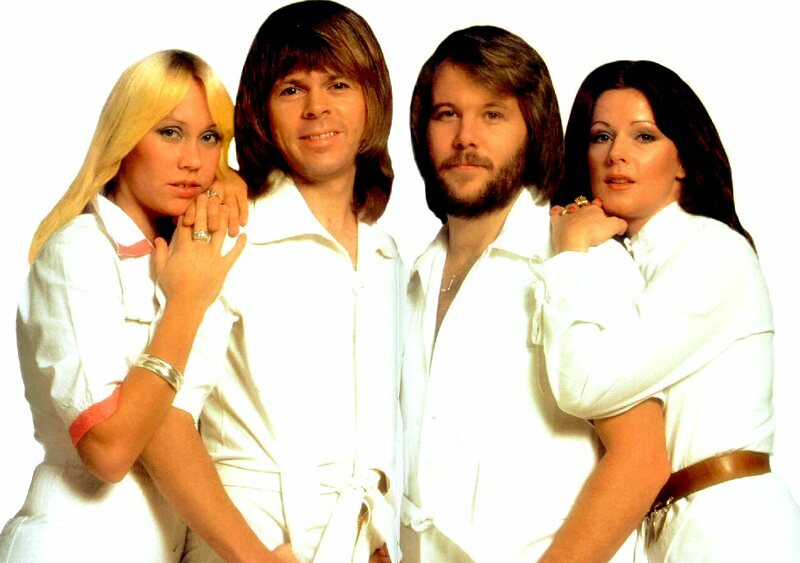 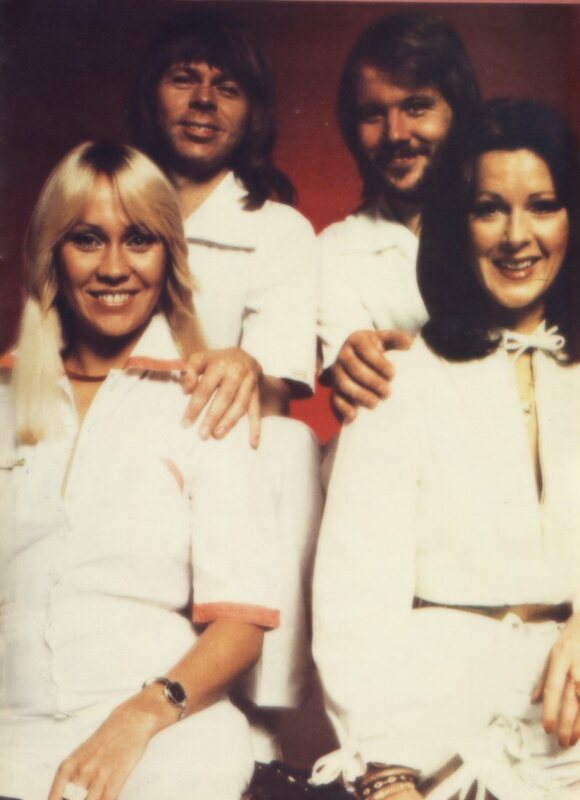 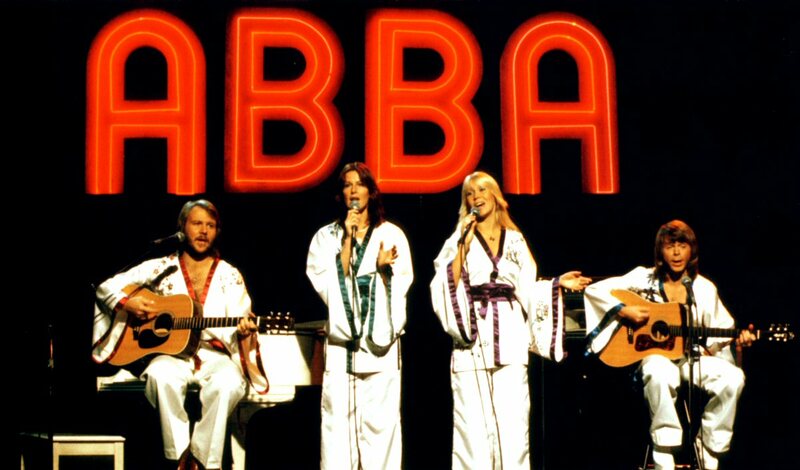 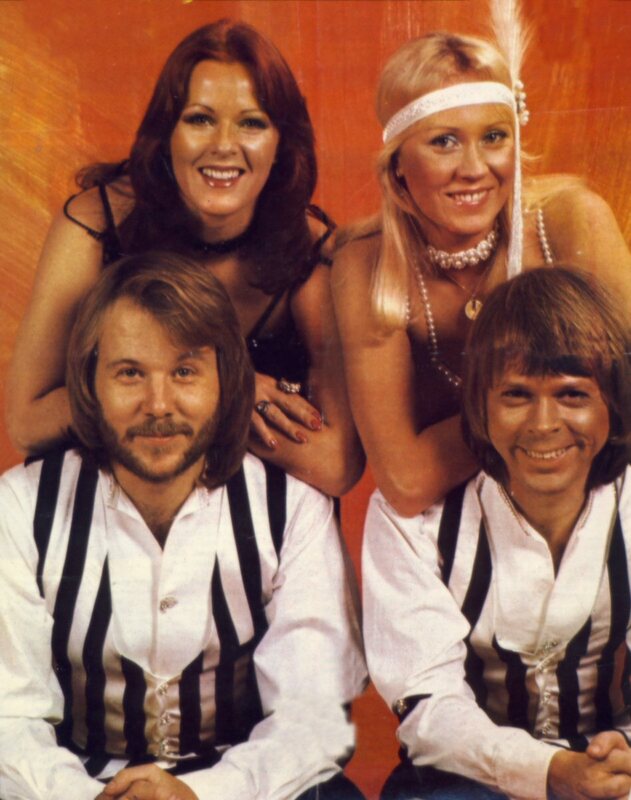 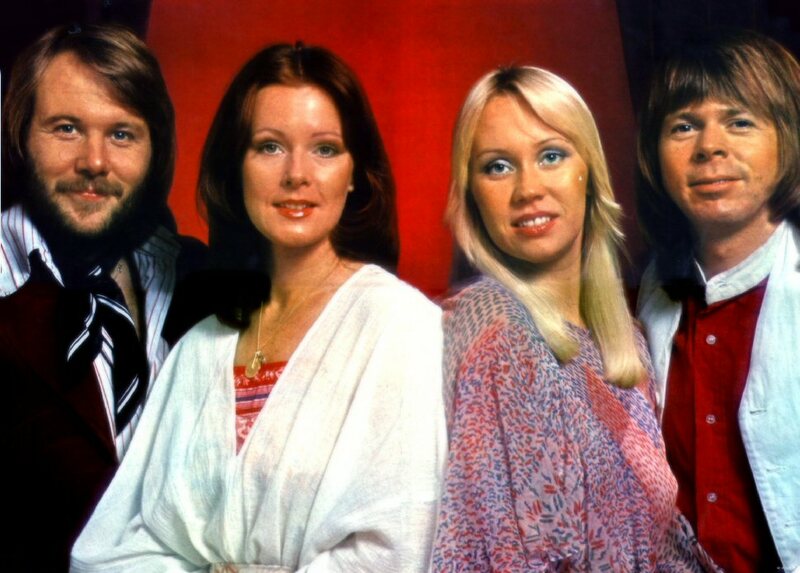 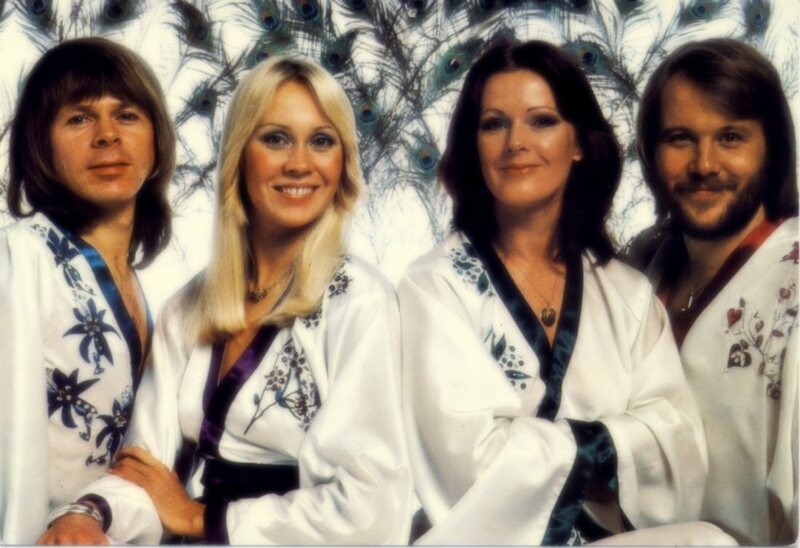 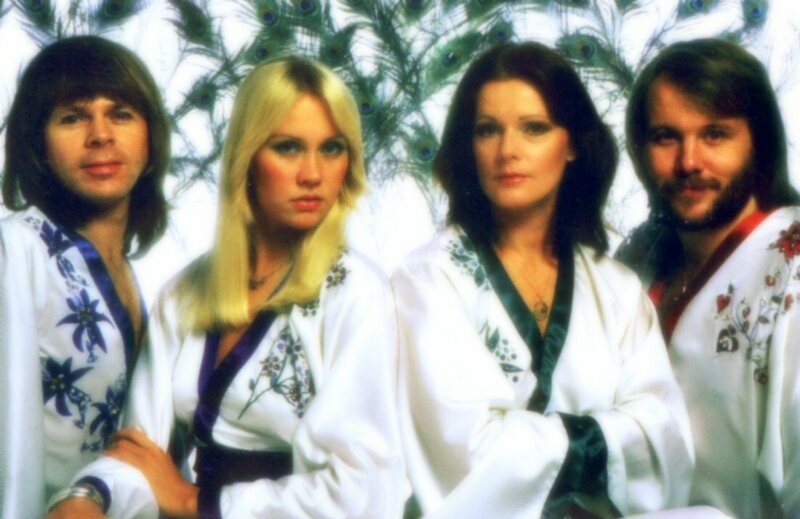 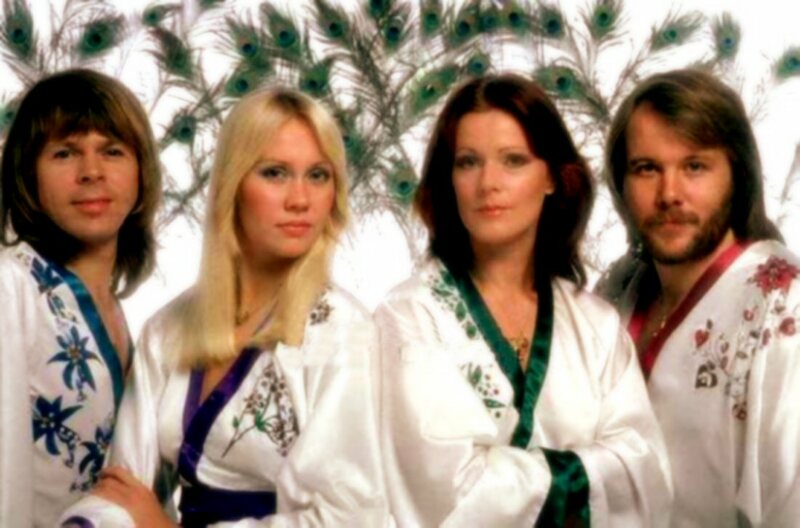 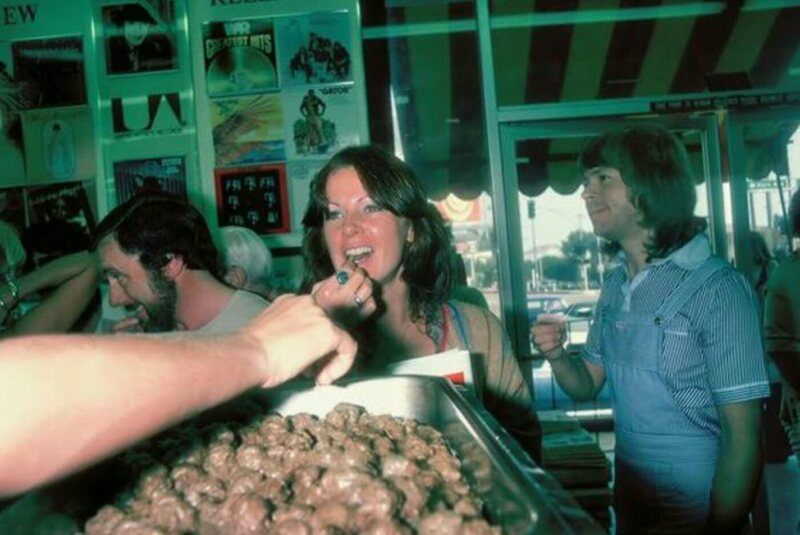 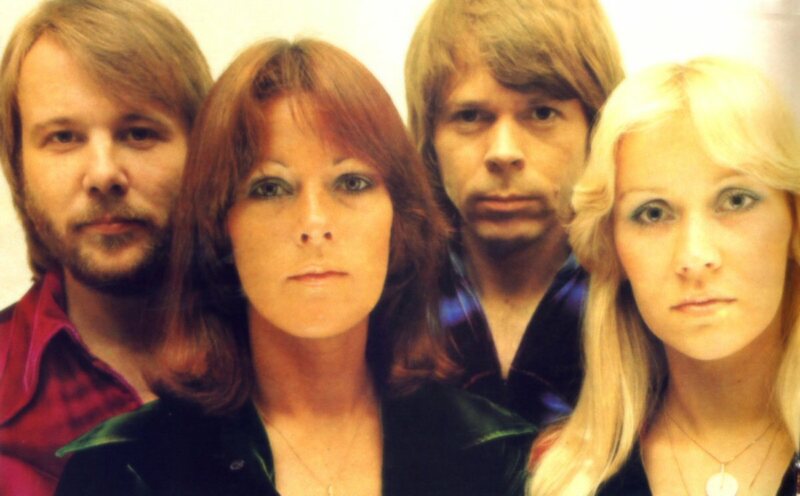 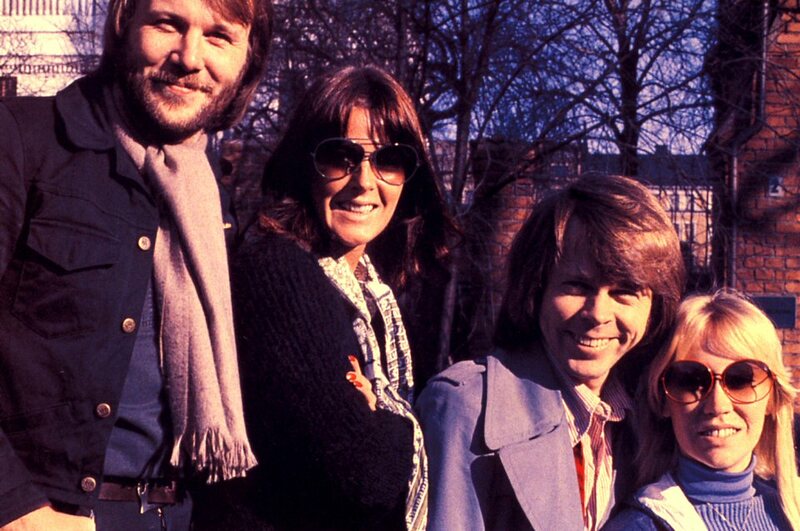 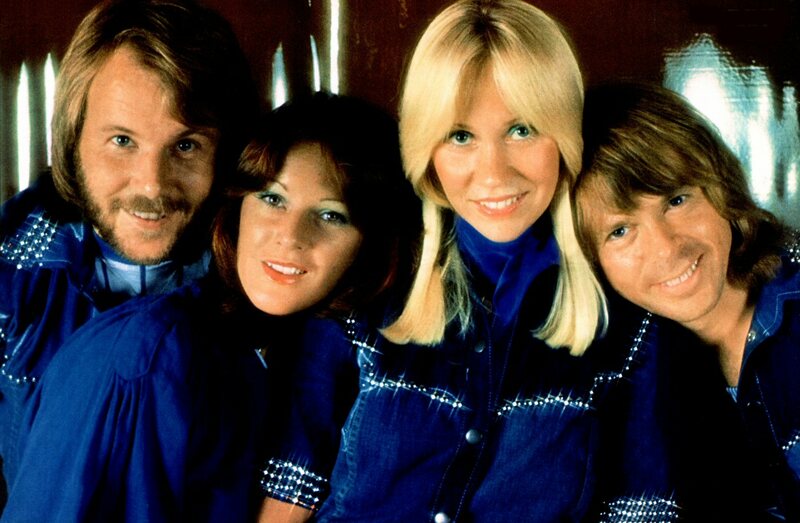 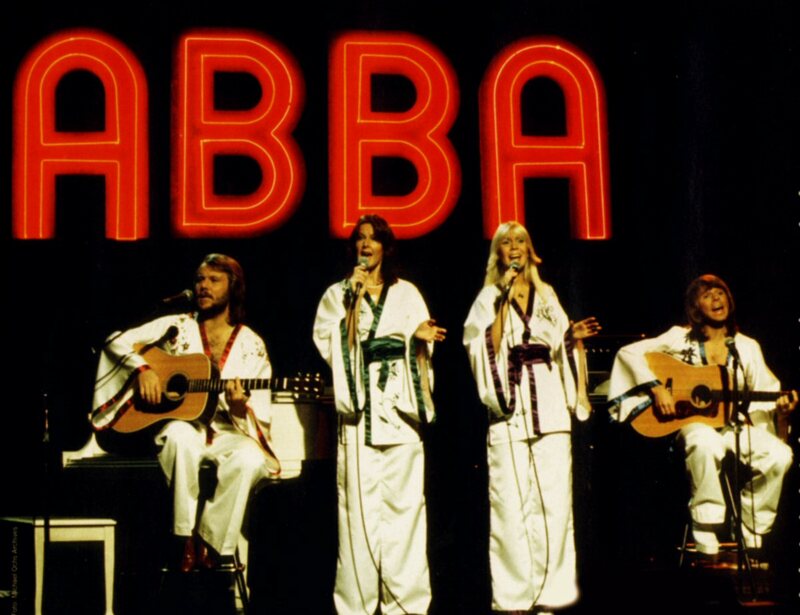 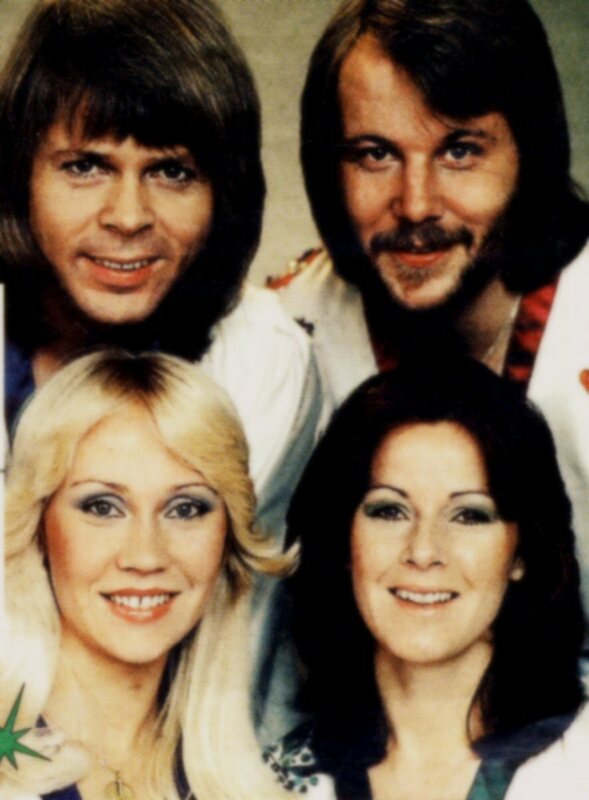 ABBA-Dabba-Do documentary was made by Swedish Television in the summer 1976 and broadcasted for the first time on Swedish TV on 5 November at 8 pm. 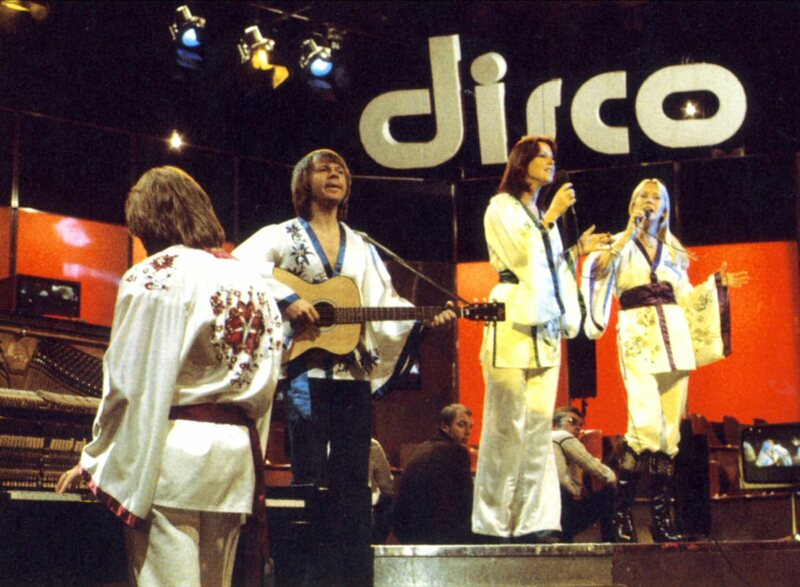 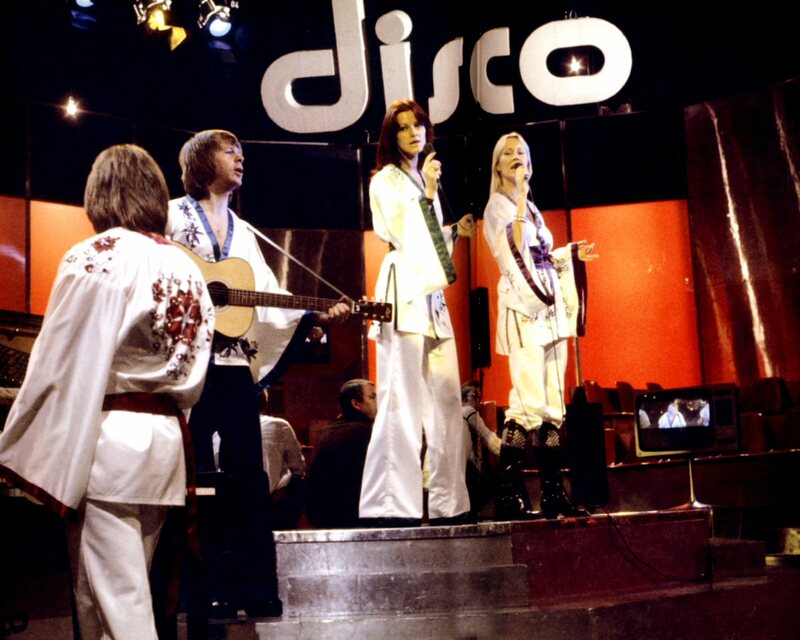 ABBA appeared in the German TV special "Disco" on 6 November 1976 performing "Dancing Queen" and "Money Money Money". 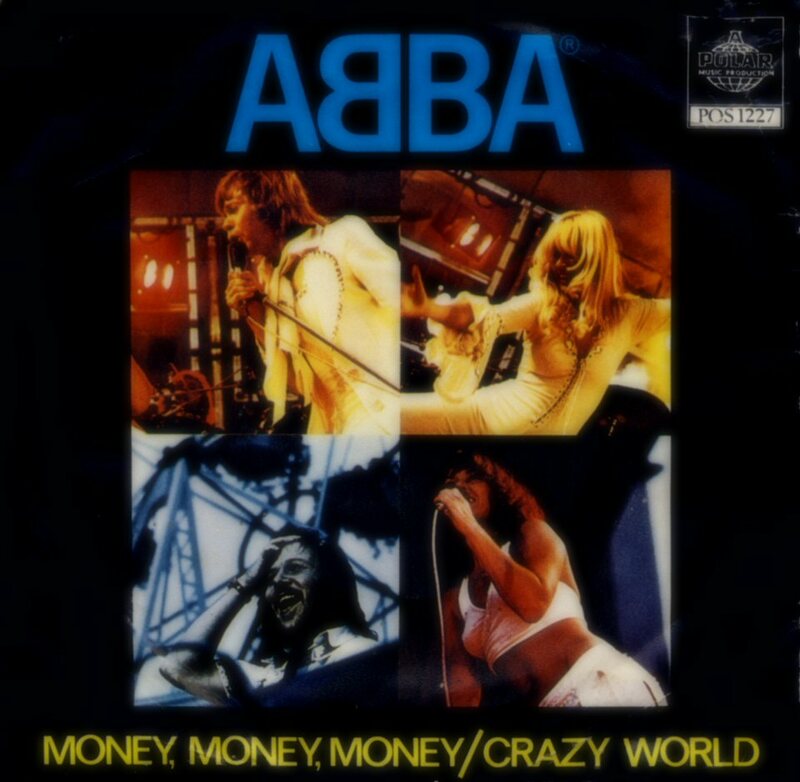 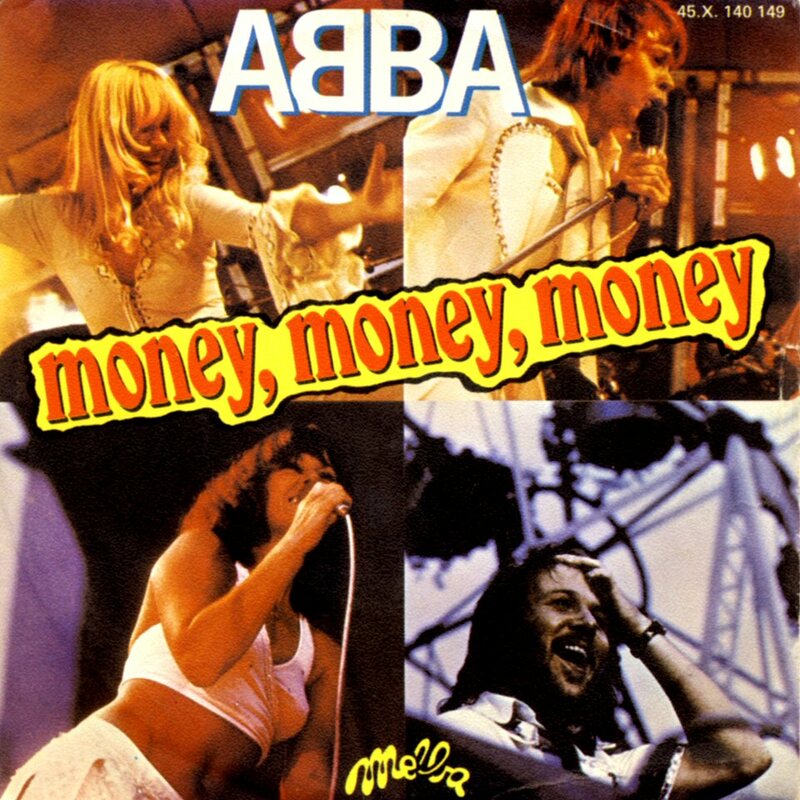 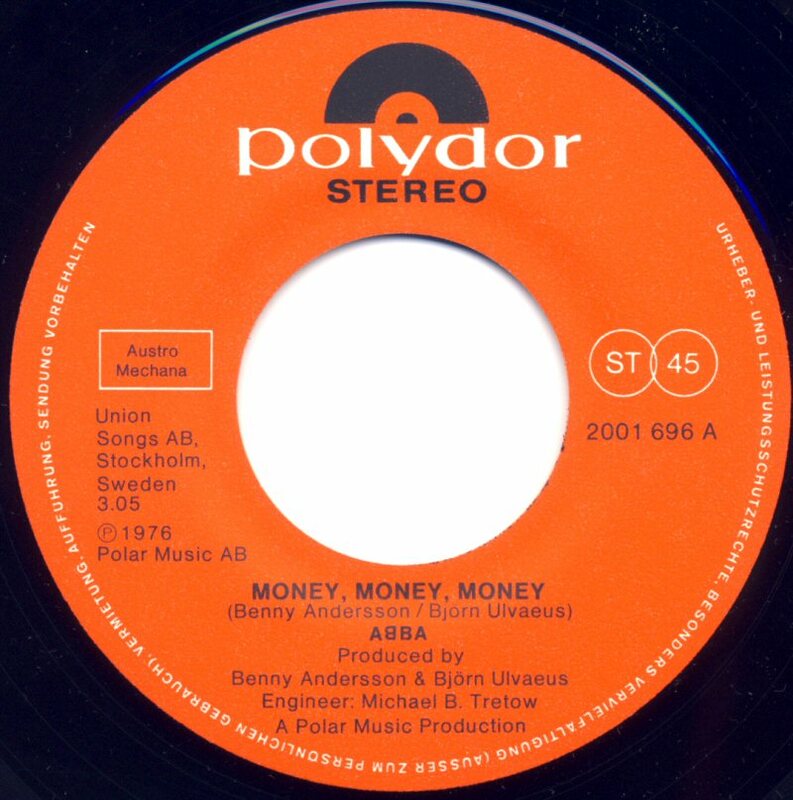 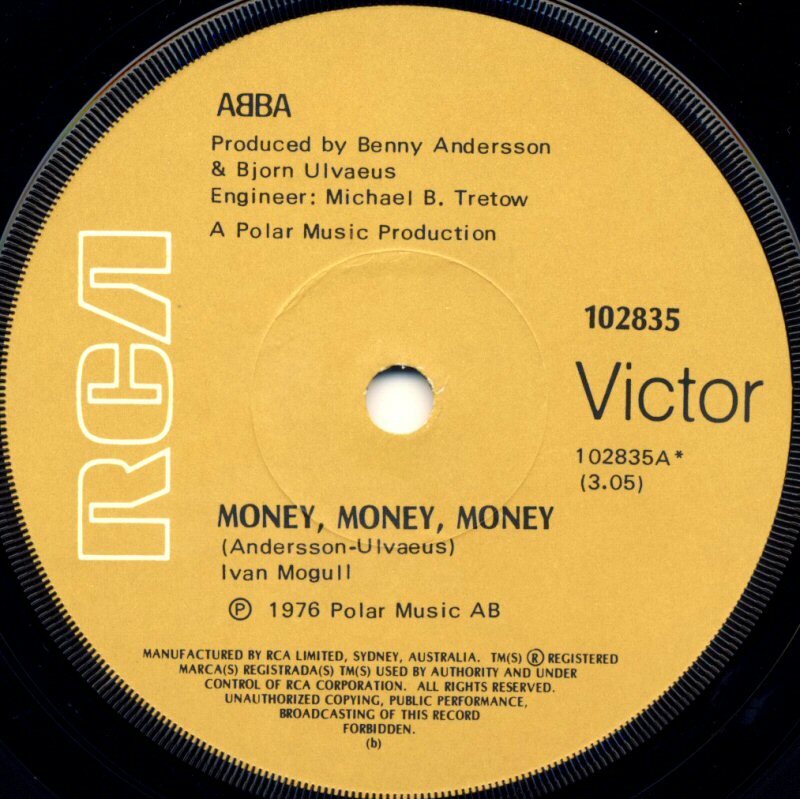 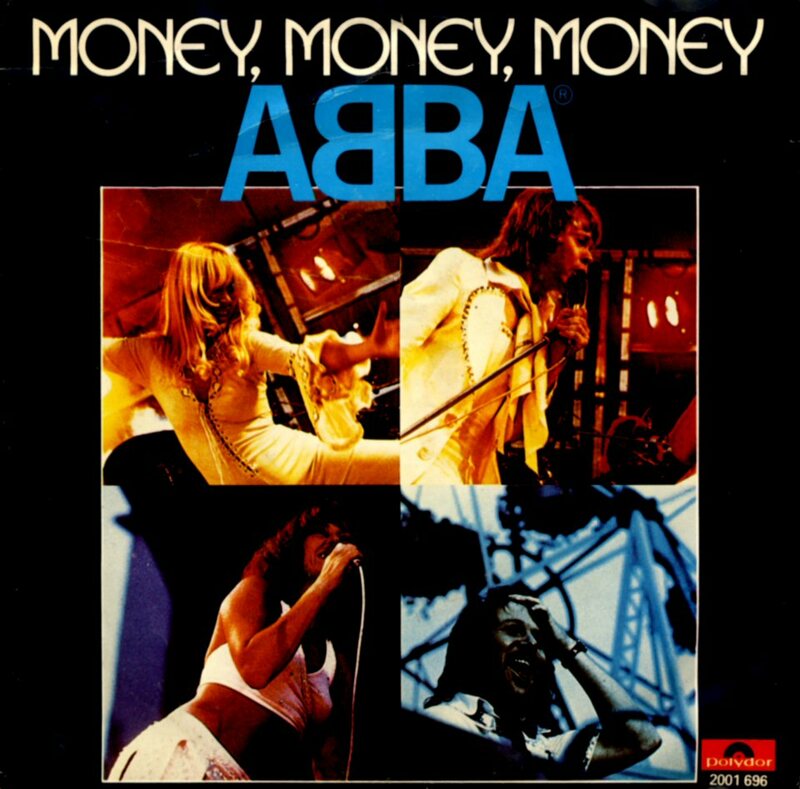 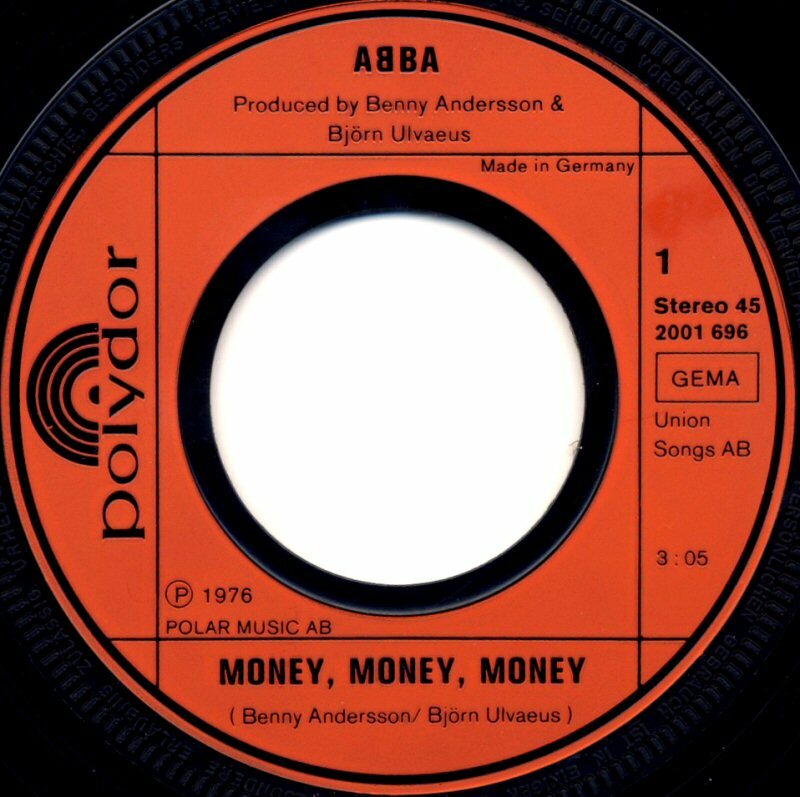 The single "Money Money Money" had been released one week earlier so it was ABBA's very first promotion for the single on TV. 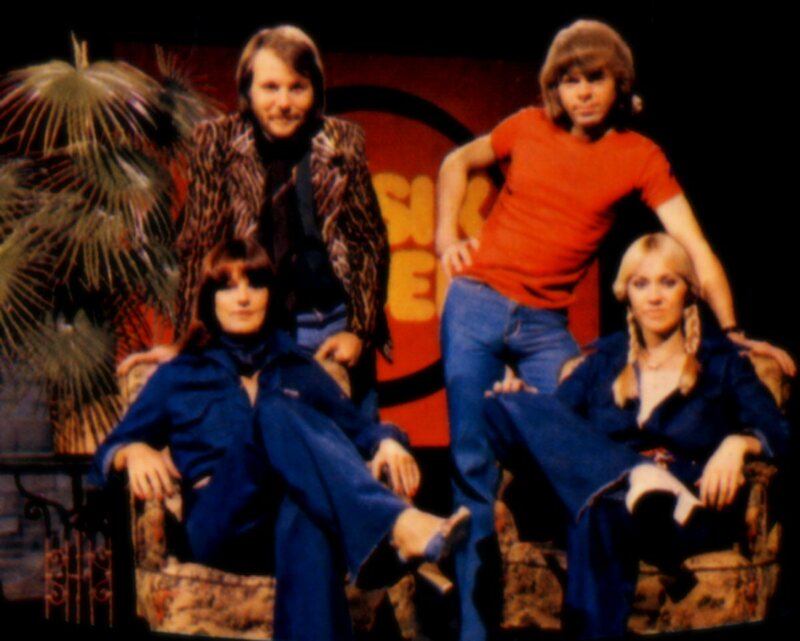 The group posed in the "Money Money Money" outfits for this session with orange background. 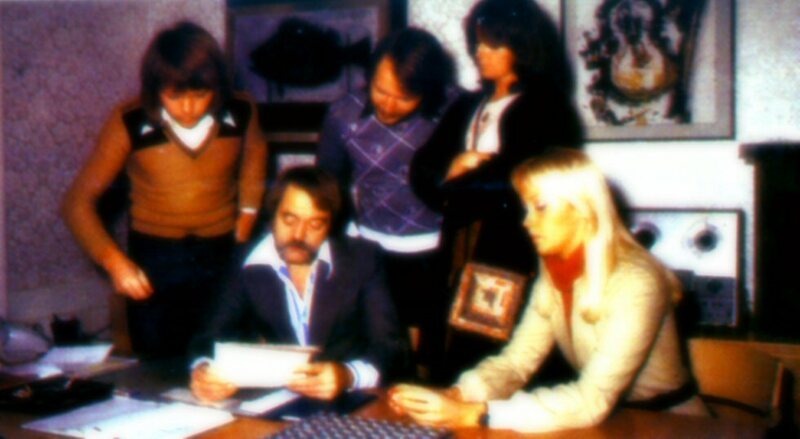 On November 13th, 1976 SKAP (The Swedish Society of Popular music Composers, Lyricists and Arrangers) celebrated its 50th anniversary. 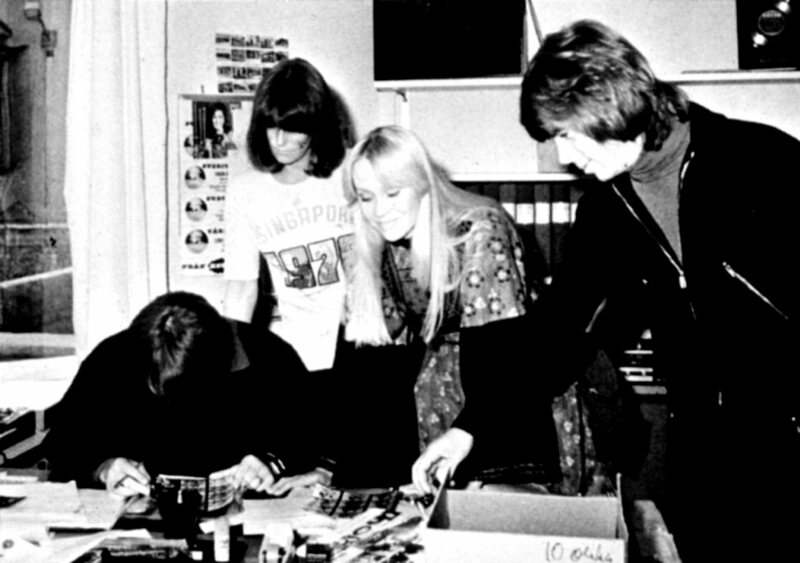 On this occasion it was released a special box containing 4 LPs and a special booklet. 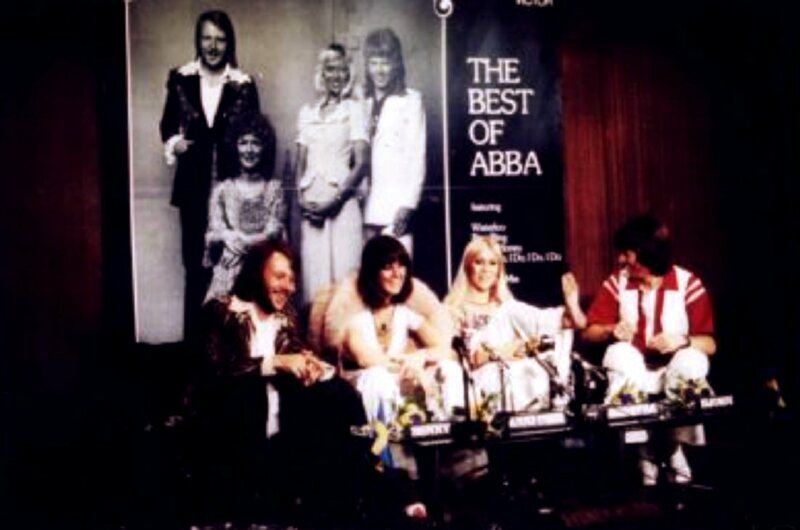 The release wasn't commercial but only promotional in limited edition and it was distributed to Swedish embassies around the world as well as to foreign radio stations and record companies. 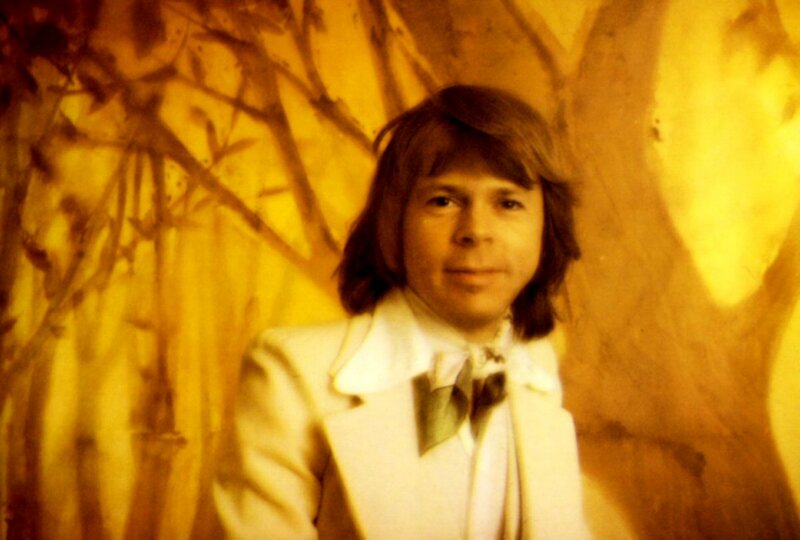 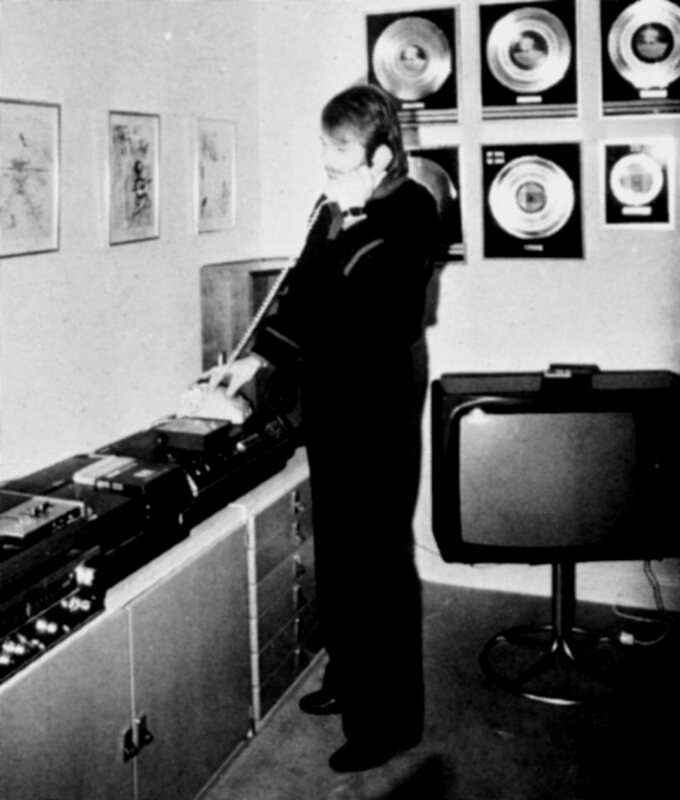 SKAP wanted to promote Swedish music abroad after the huge success of ABBA, Björn Skifs, Harpo and many others. 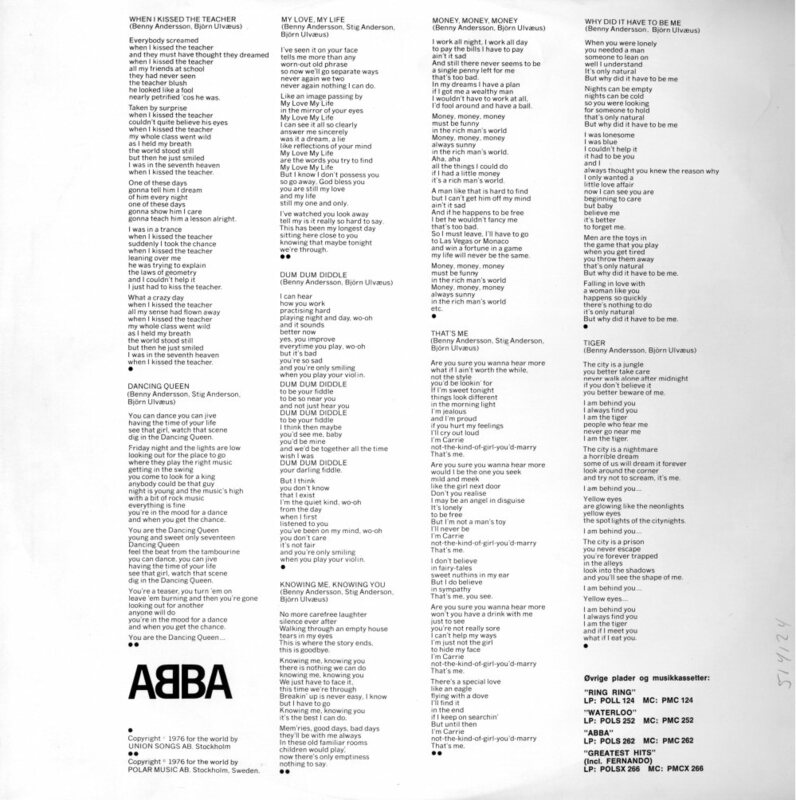 Side 1 on the first LP was devoted to ABBA and it contained some of their hits up-to-date. The songs featured on the LP were: "Ring Ring", "Waterloo", "I Do I Do I Do I Do I Do", "SOS", "Fernando" and "Dancing Queen". 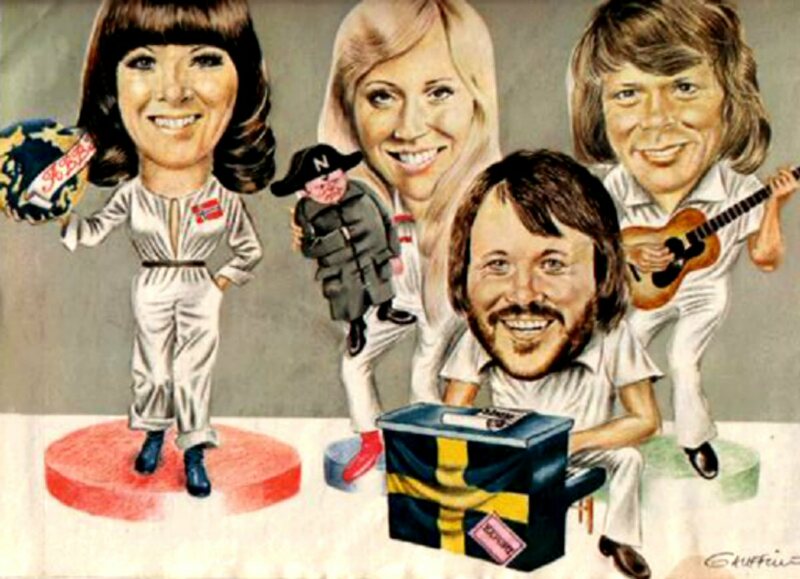 There were other ABBA related pieces included in this box as for instance Harpo's "Moviestar" (with Frida as background singer) and Stikkan's composition "Tivedshambo". 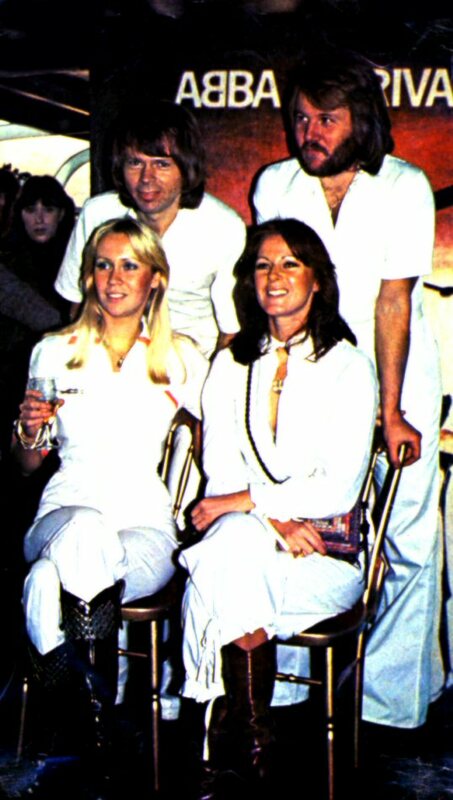 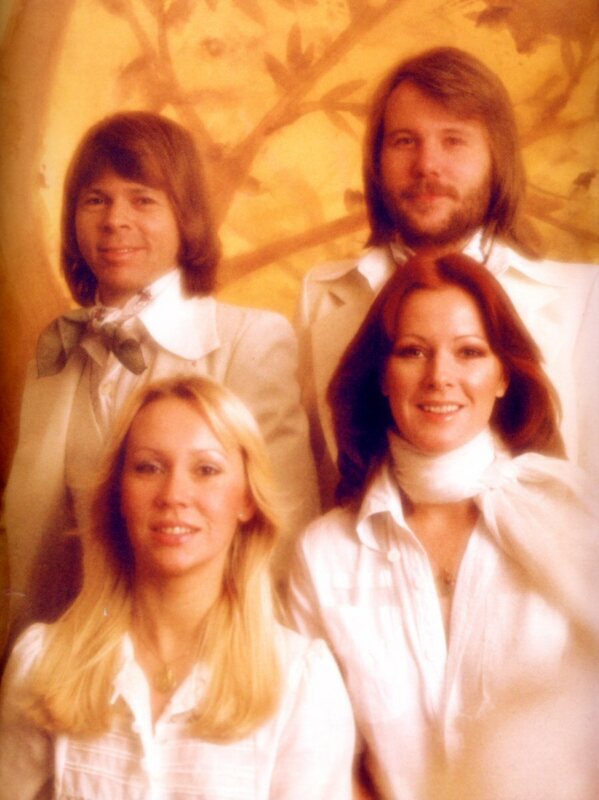 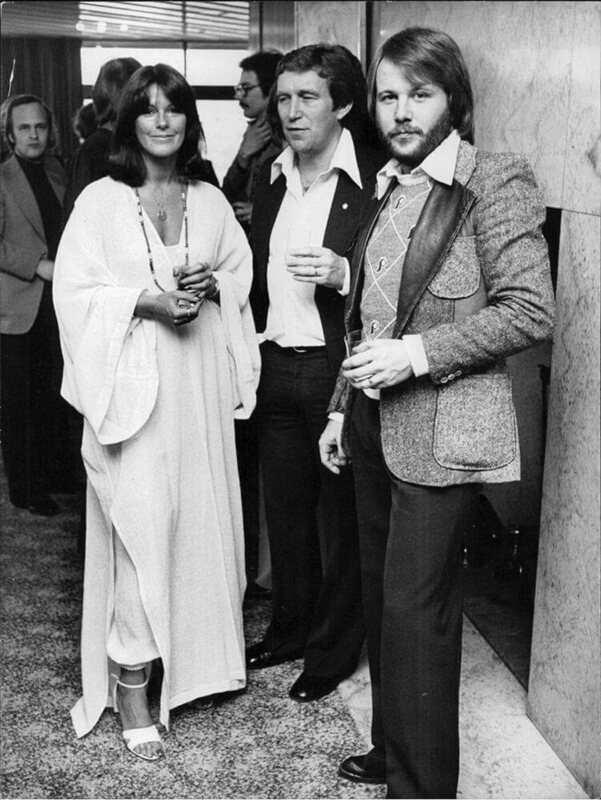 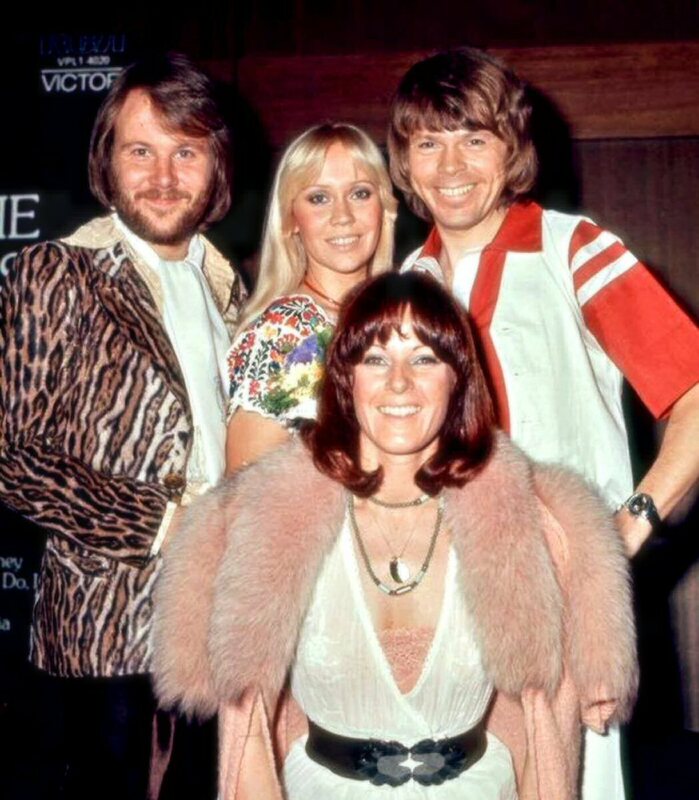 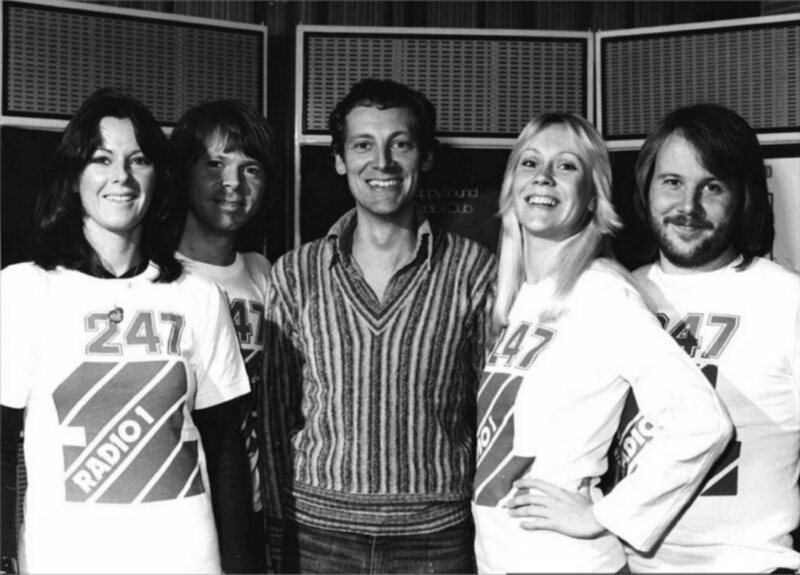 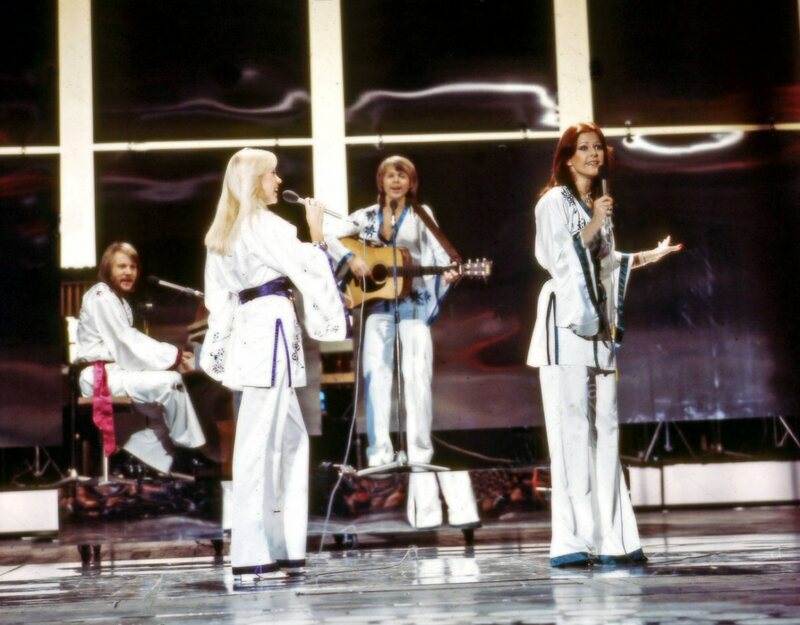 On 15 November ABBA came to London for the promotion. Short flight by chopper was part of the promotion of the newest album "Arrival". 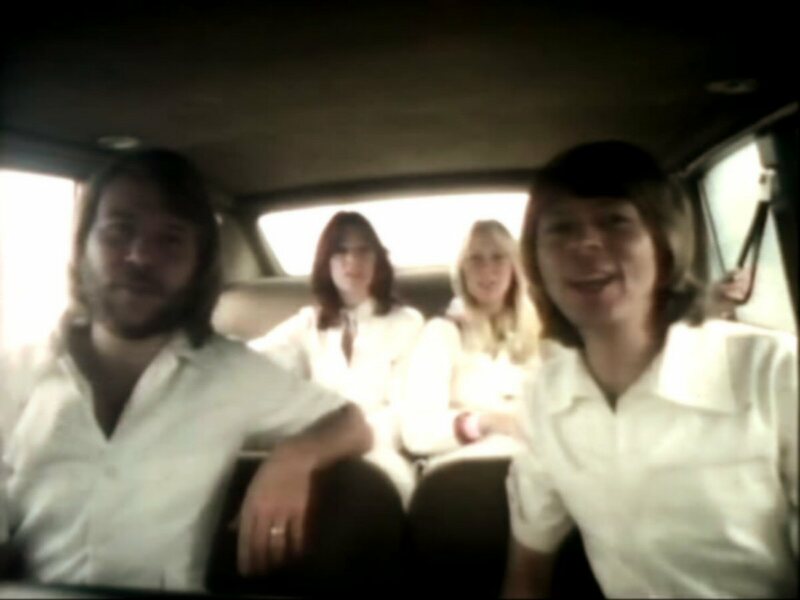 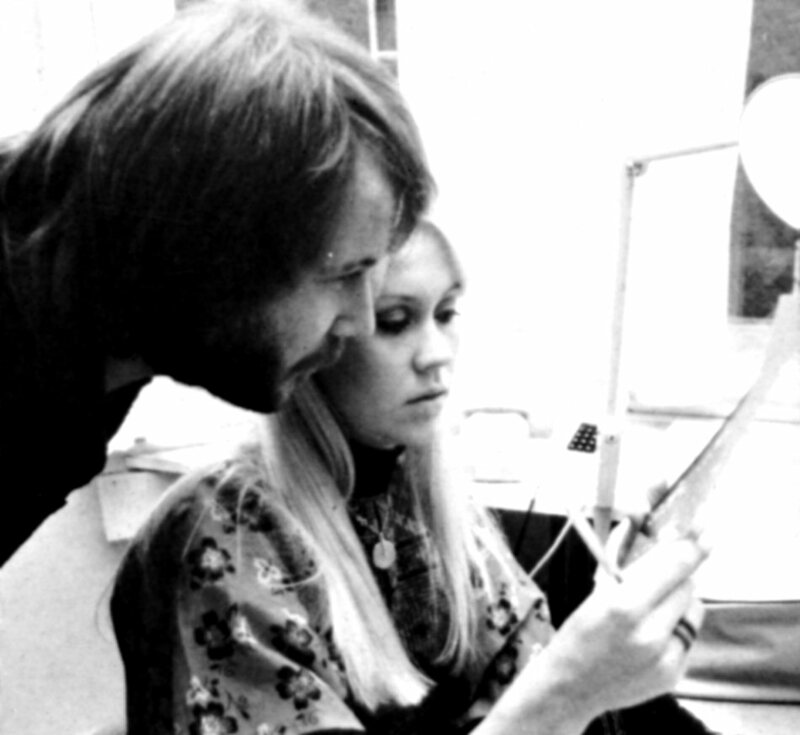 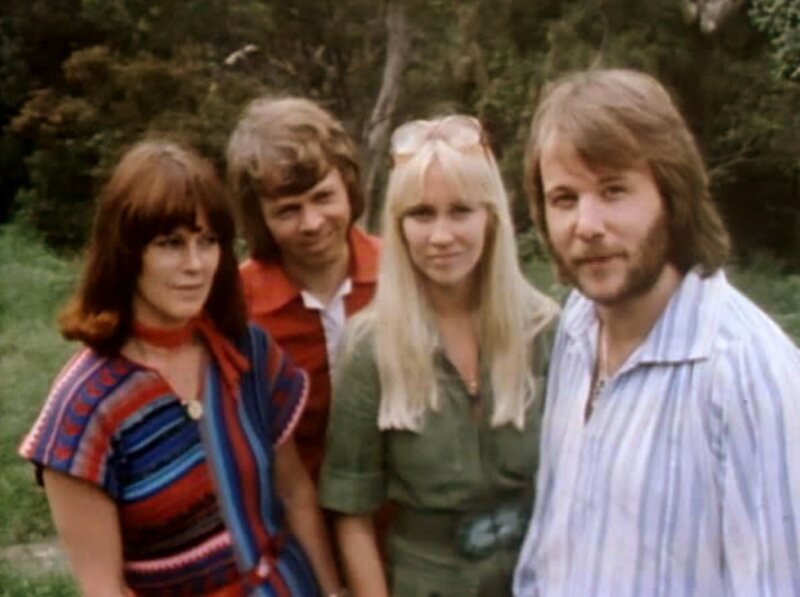 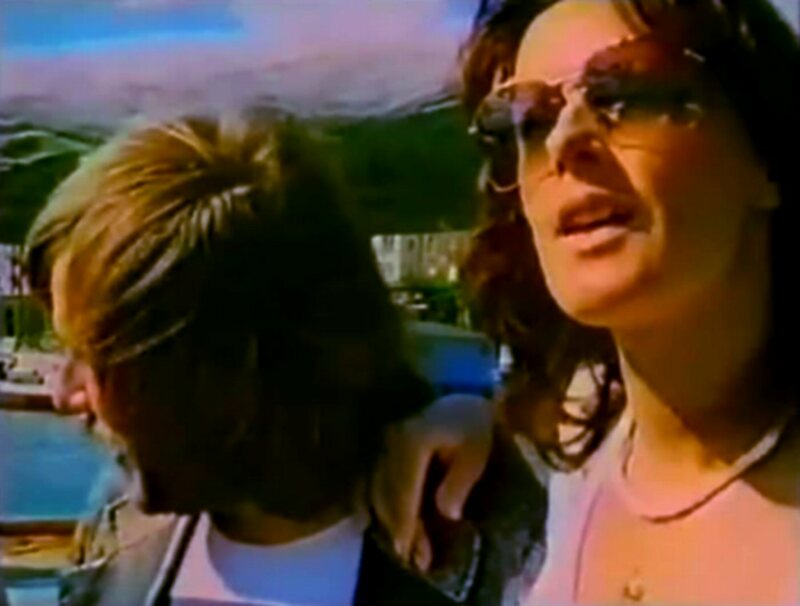 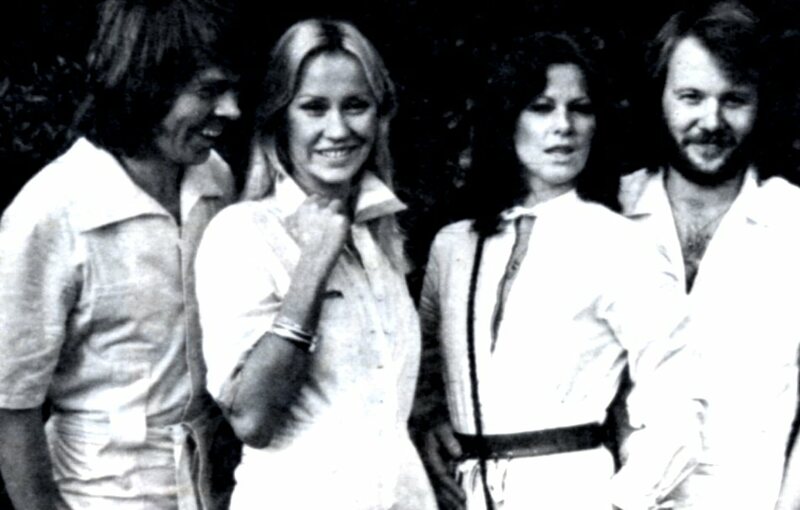 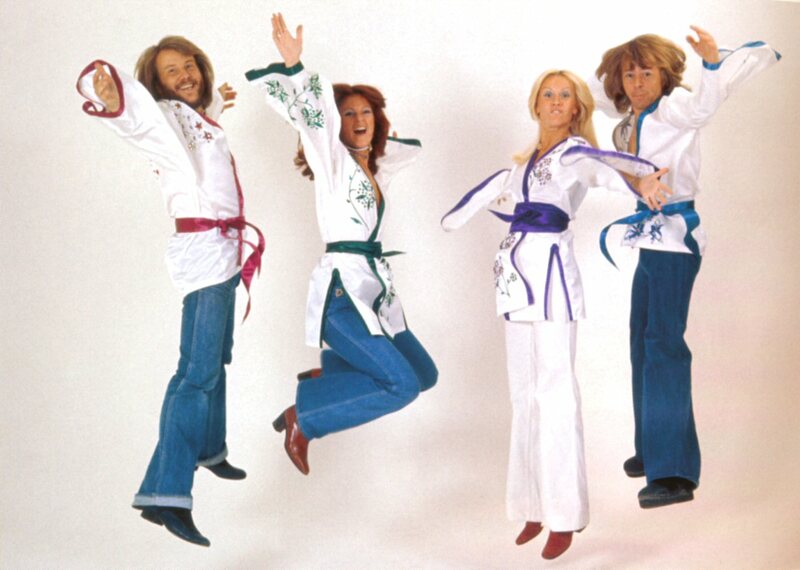 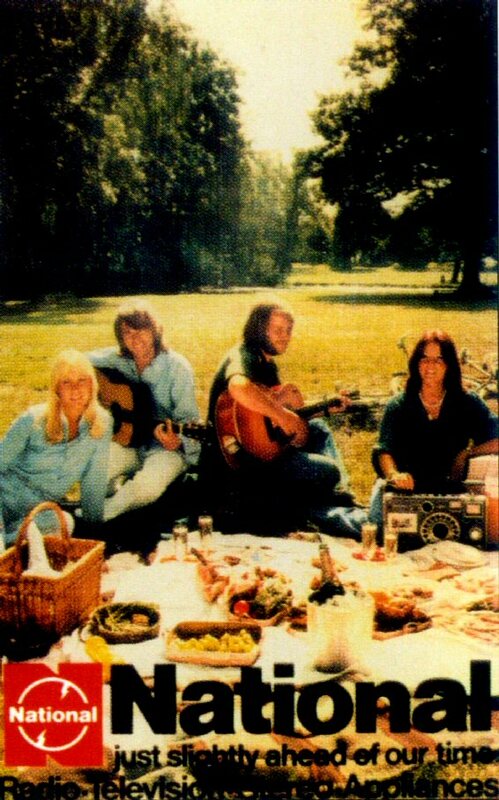 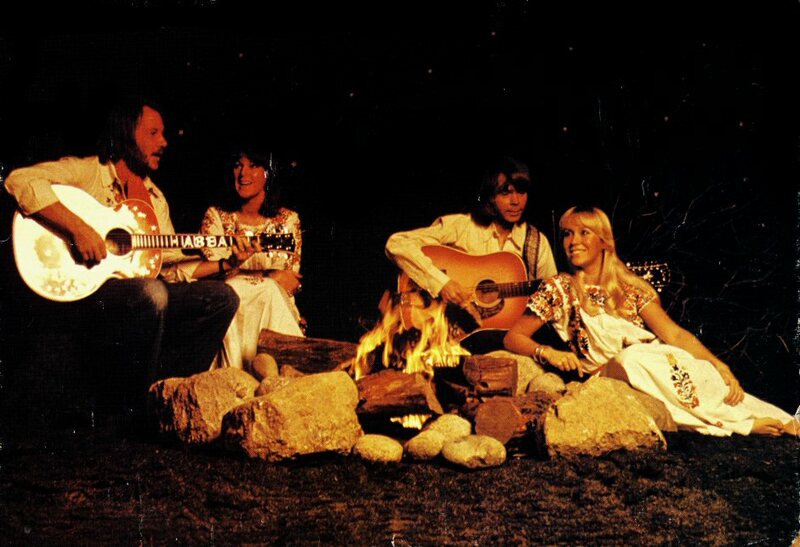 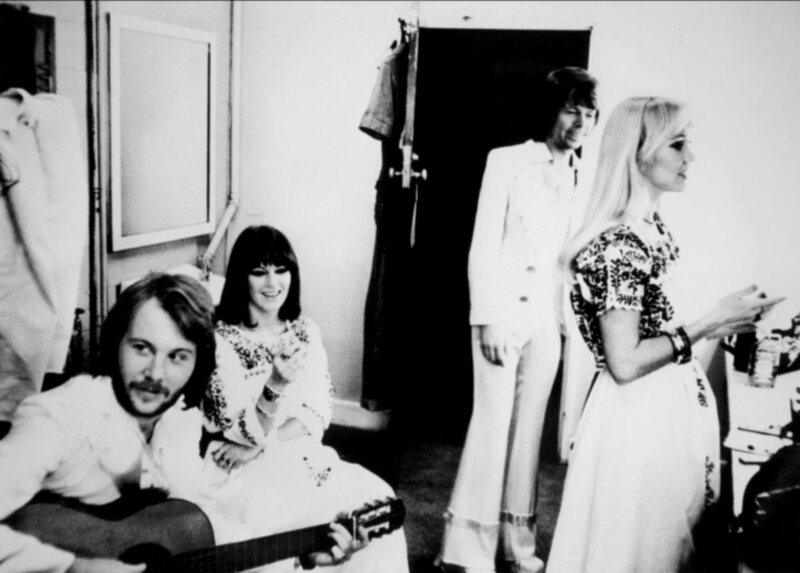 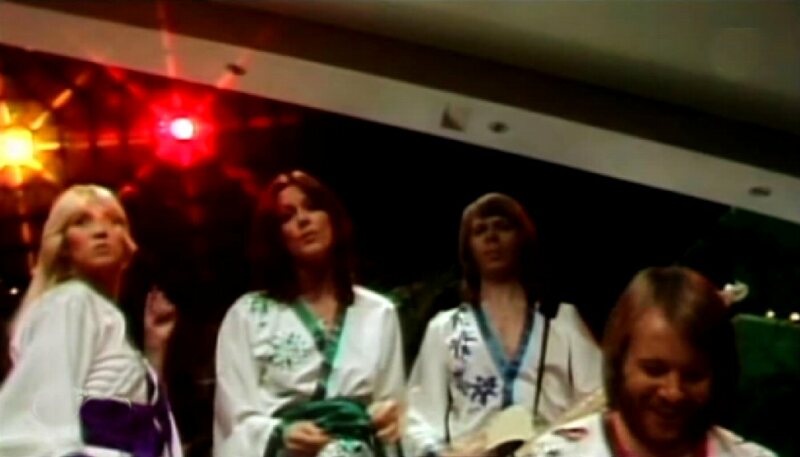 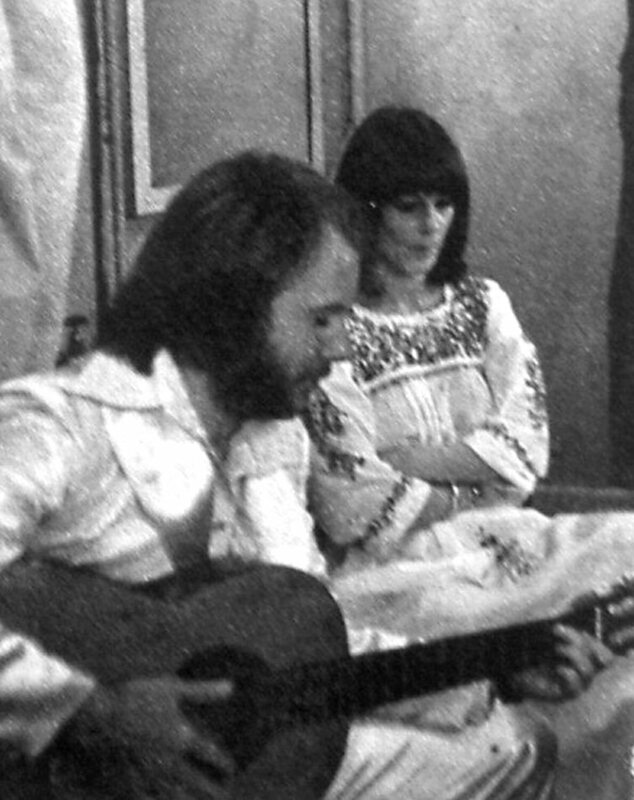 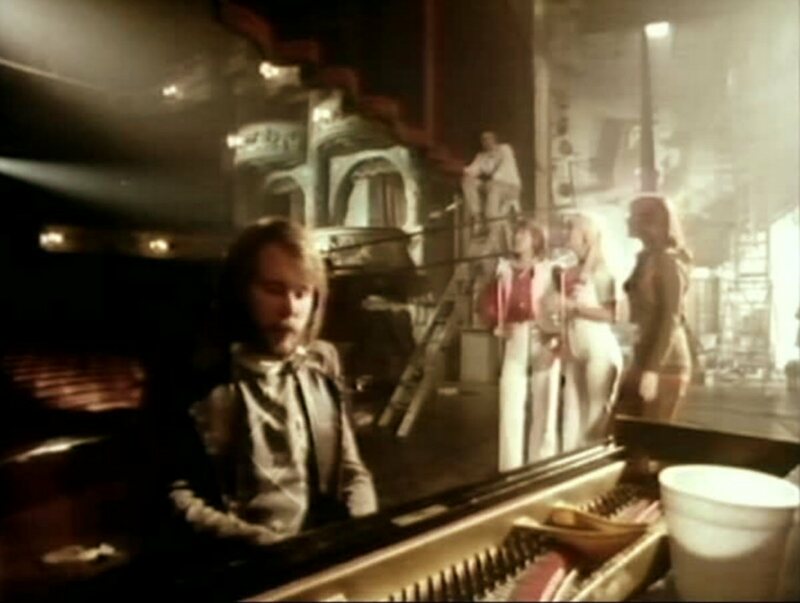 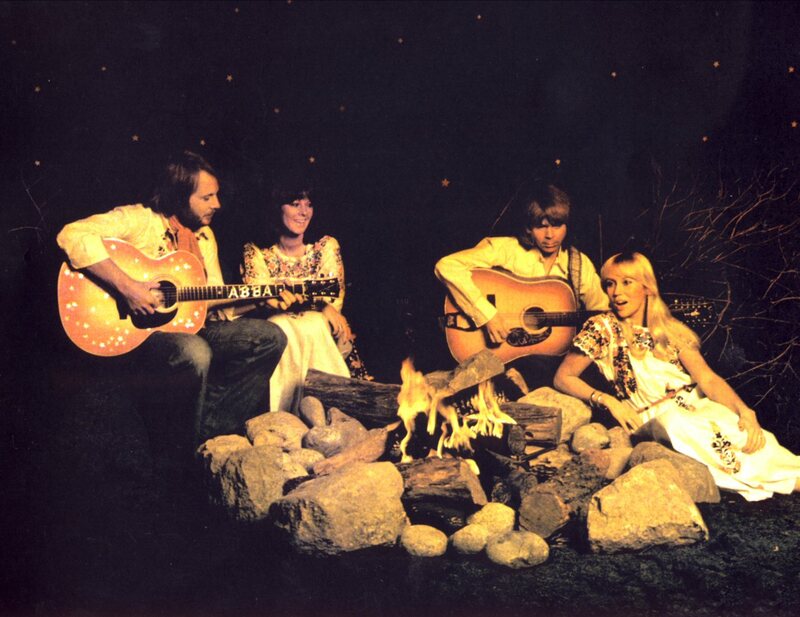 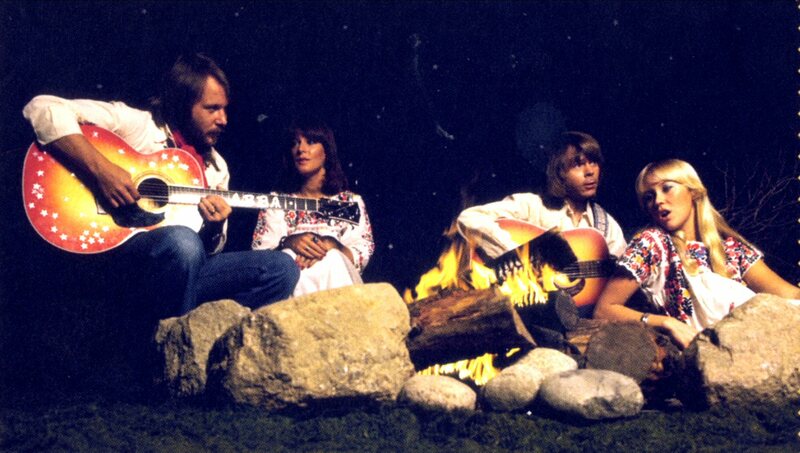 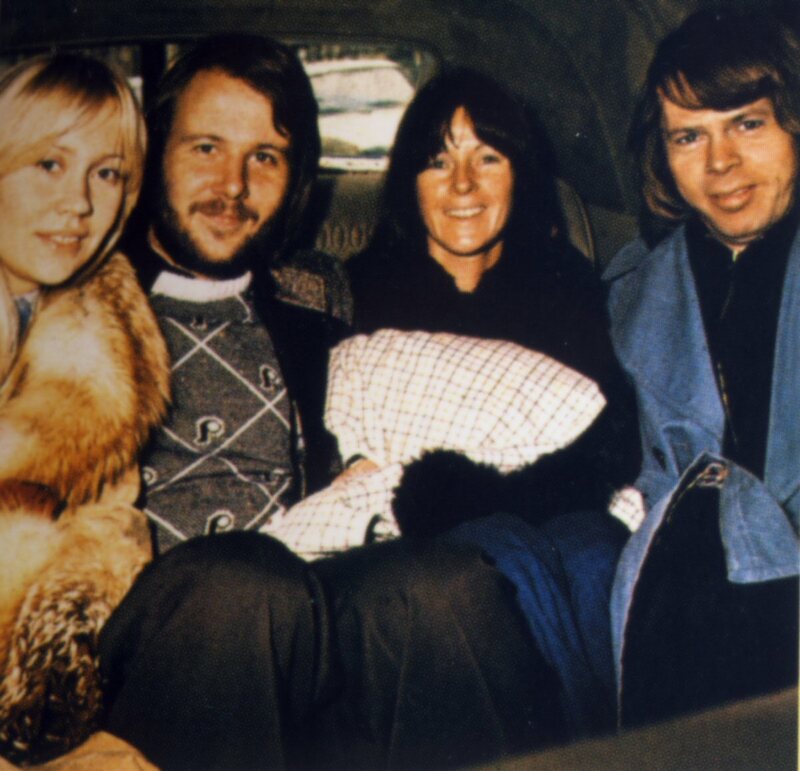 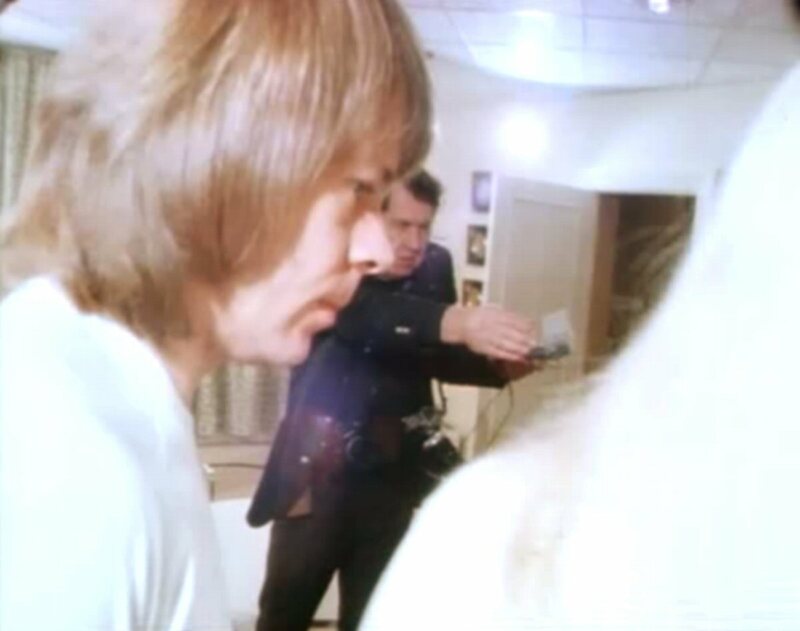 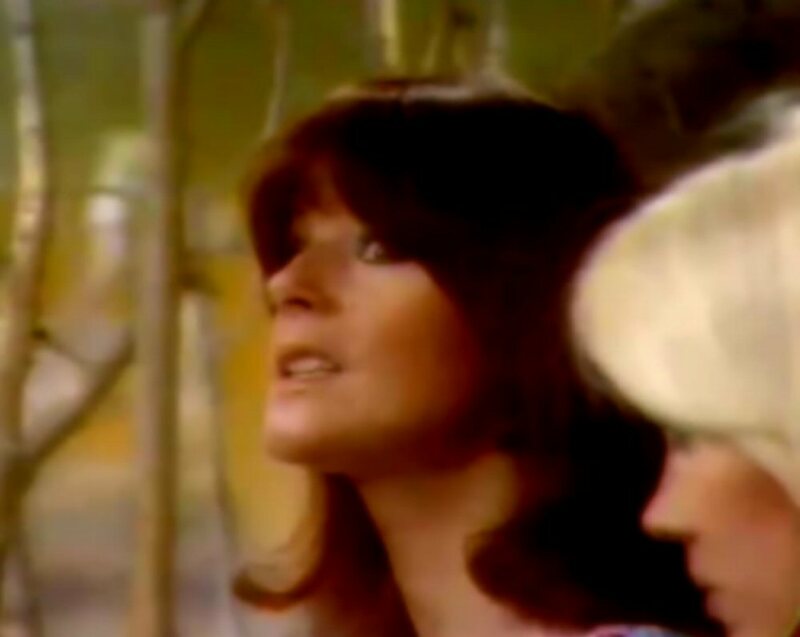 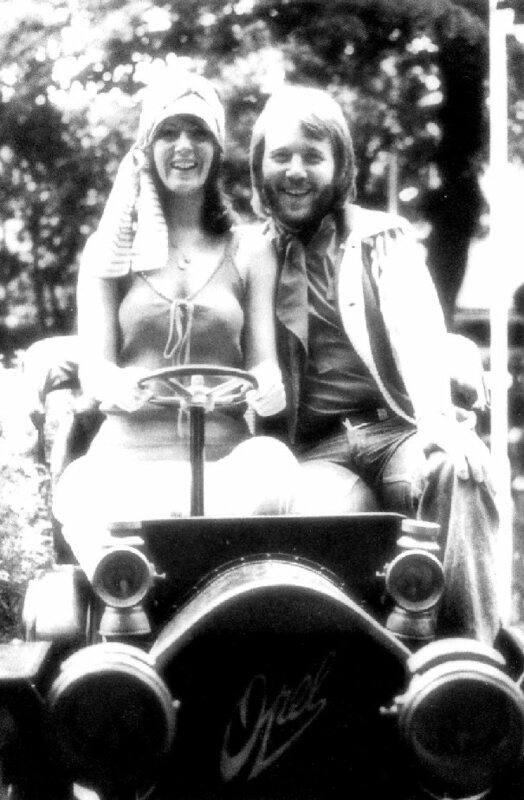 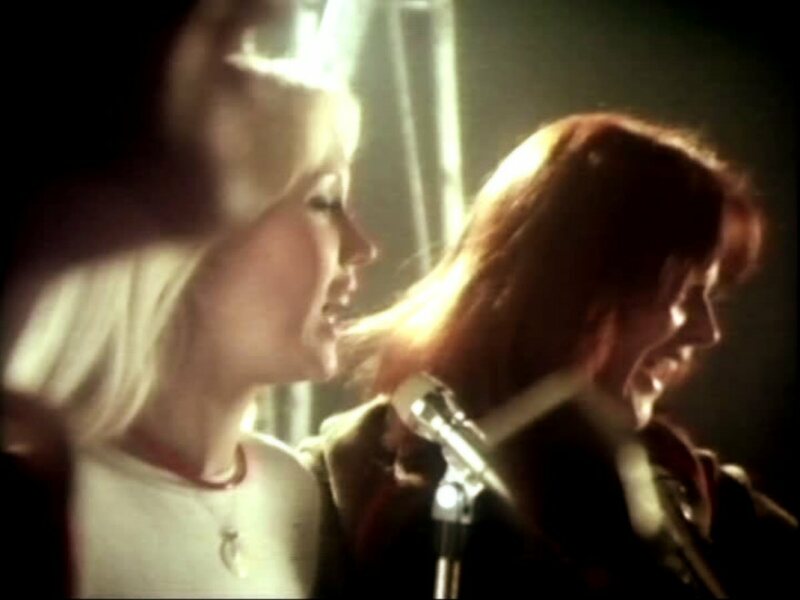 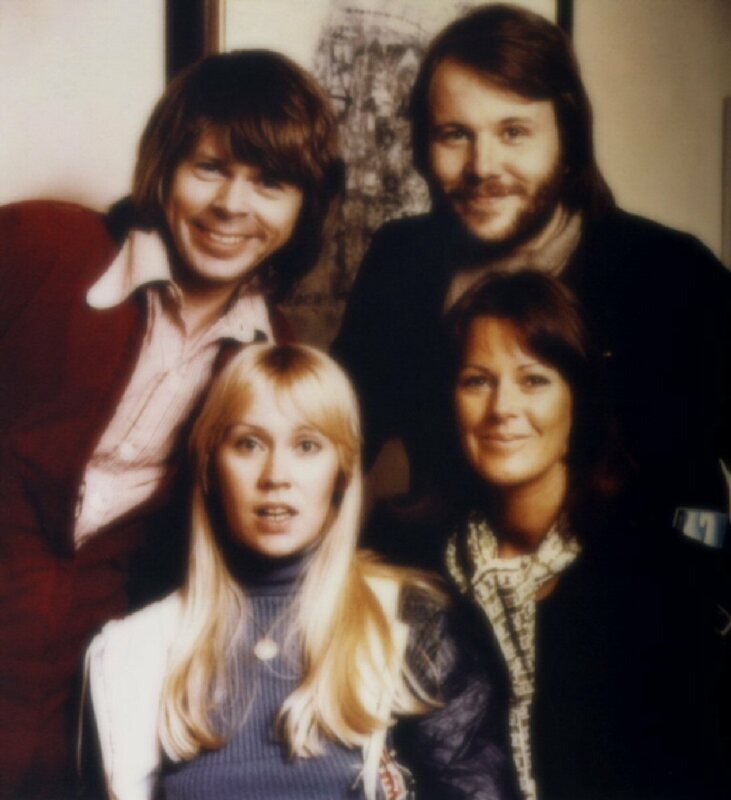 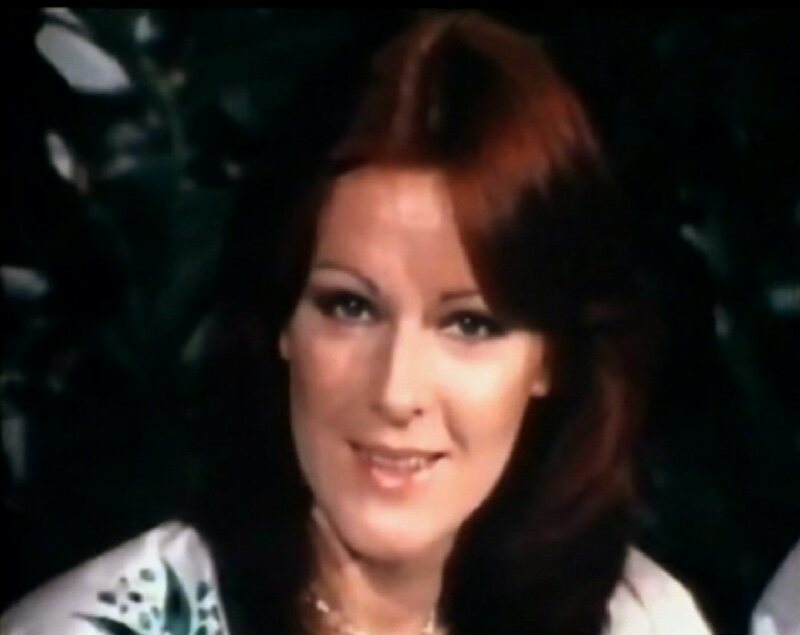 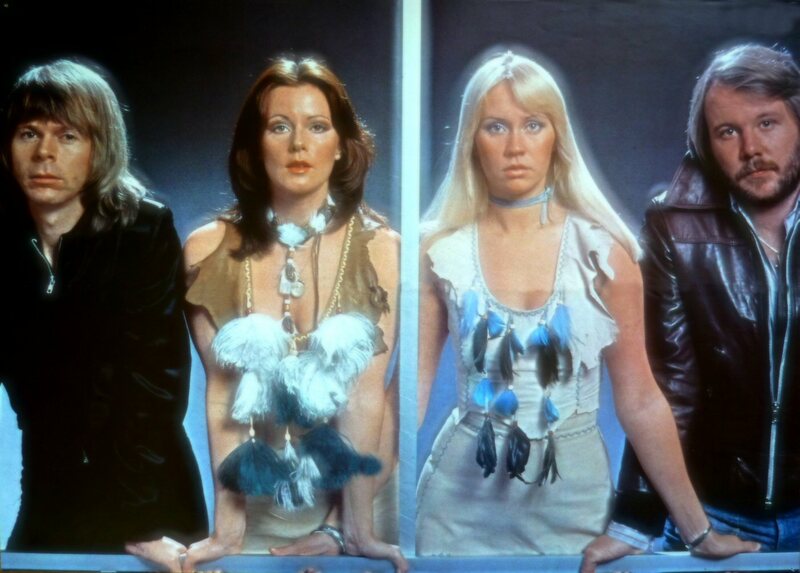 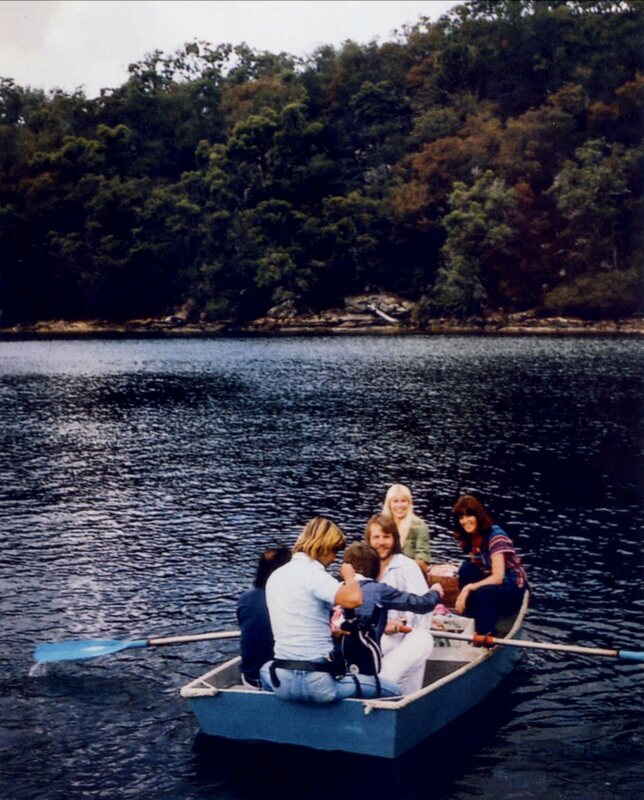 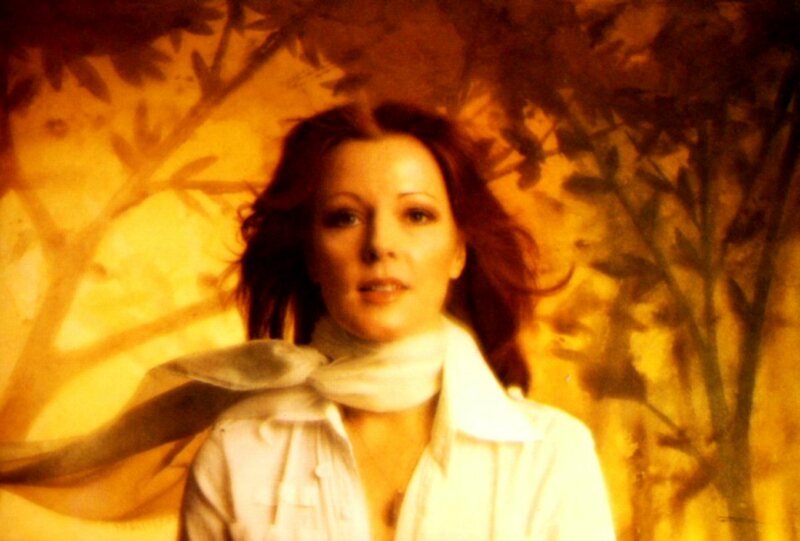 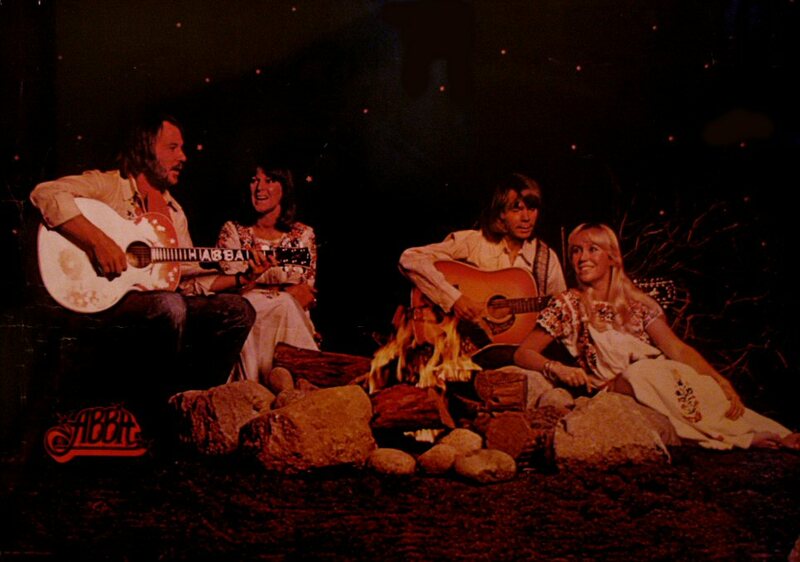 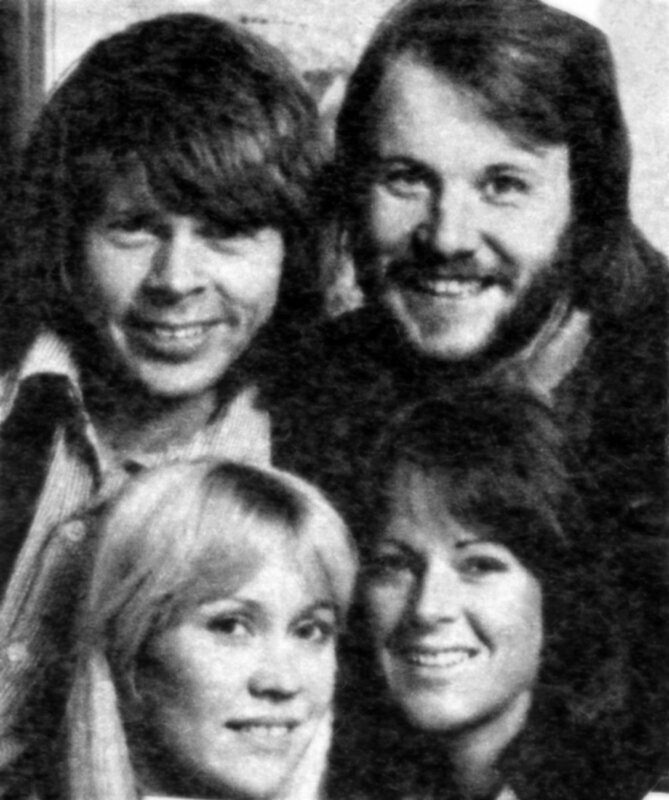 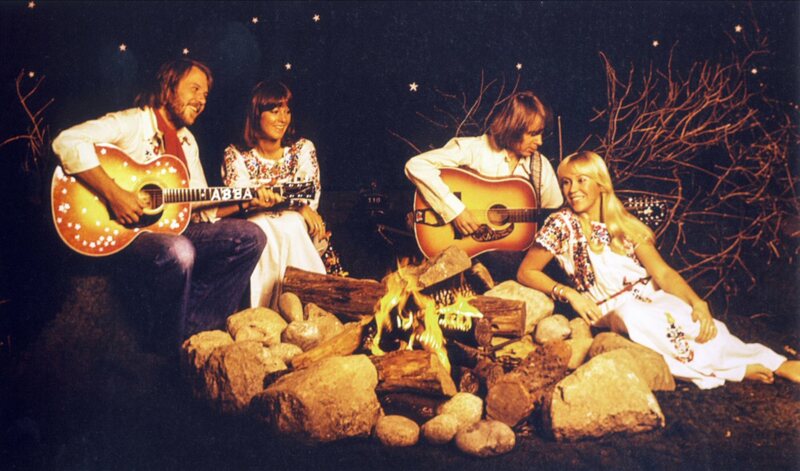 ABBA filmed two commercials for the TV promotion of the album "Arrival" in the UK. 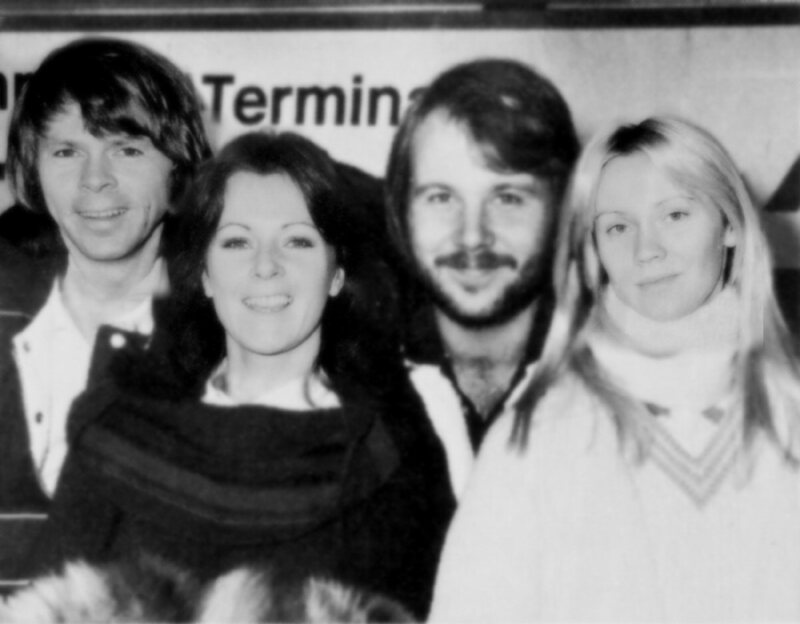 The first photos were taken on the arrival at the Schiphol airport in Amsterdam on 23 November 1976. 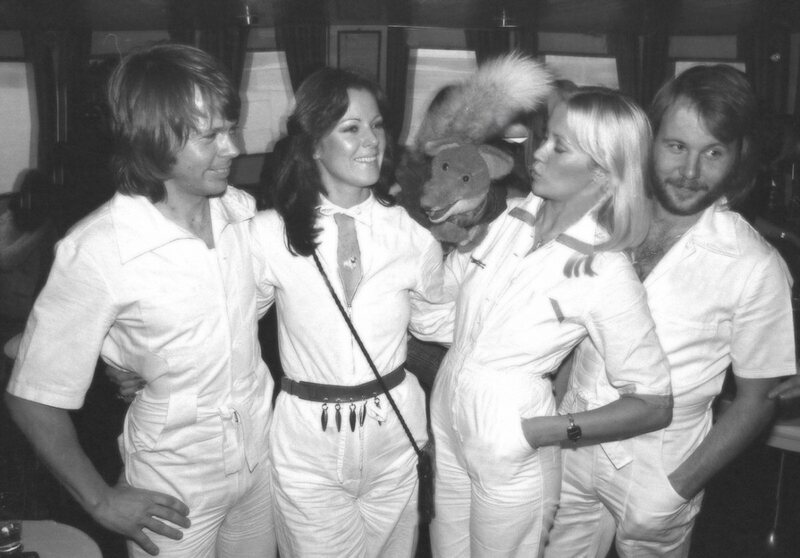 After UK ABBA continued their promotional trip in Holland. 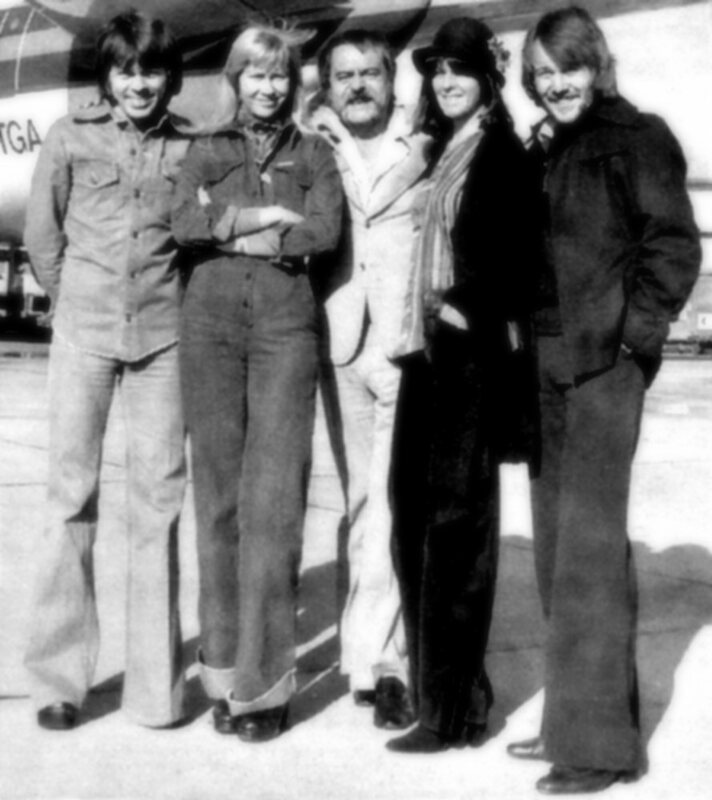 The visit was very short but the group managed to do two TV shows, participate in a press conference, do some photo sessions before they left for Paris the day after. 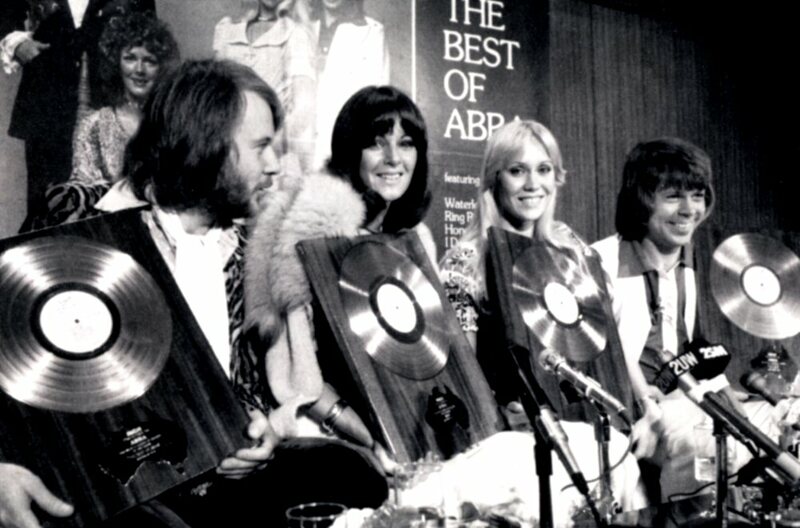 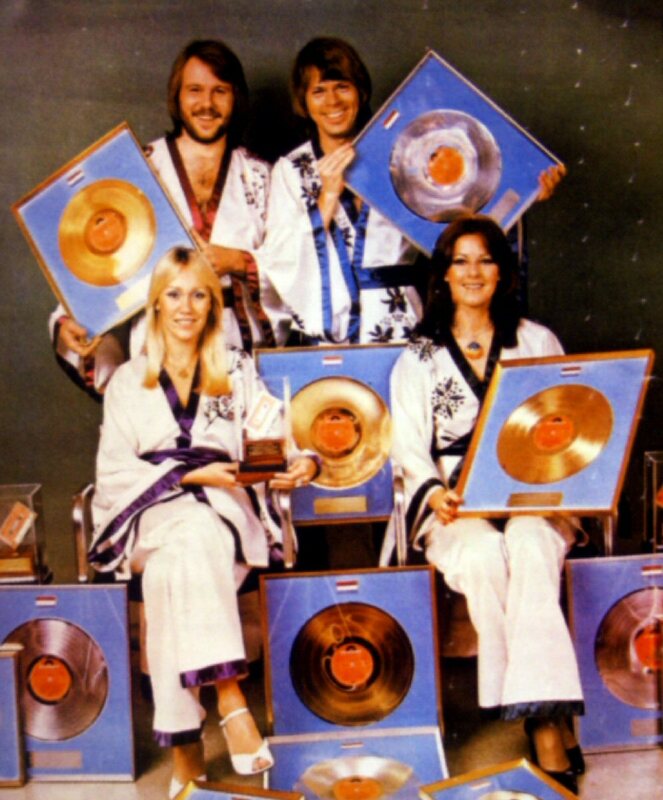 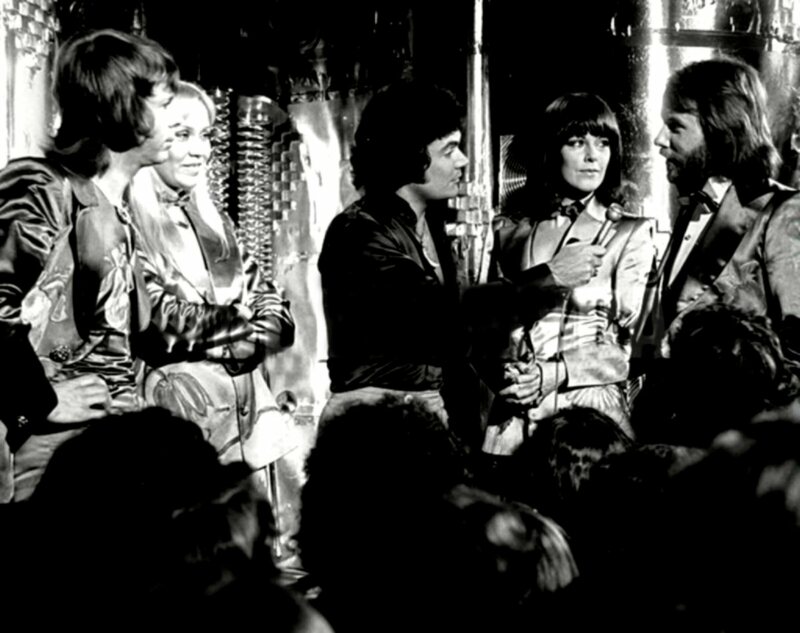 ABBA performed three songs in a TV special "Een Van De Acht" and on the press conference they were awarded with lots of gold and platinum records. 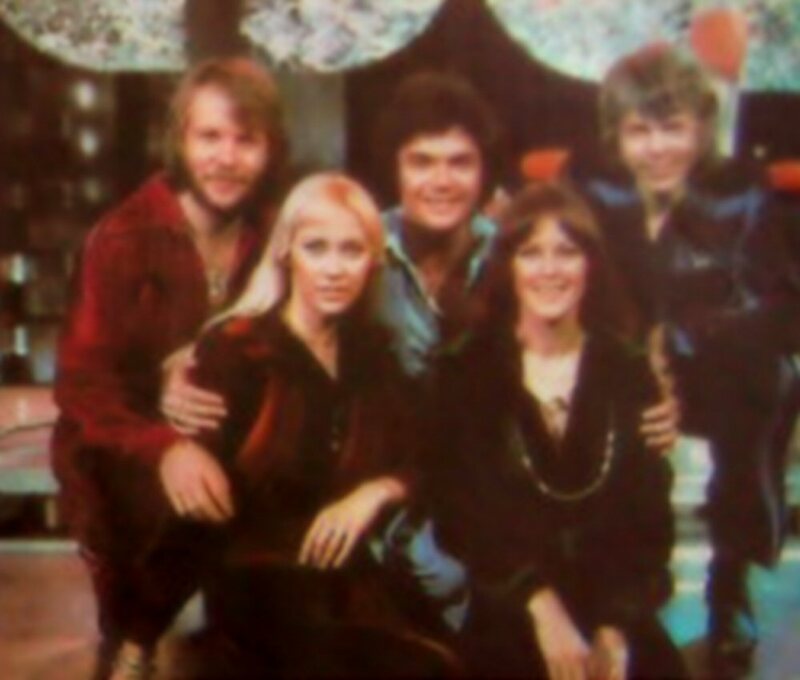 As a bonus the group recorded for the Dutch TV a wish of a happy new year which would be aired on the New Year's Eve. 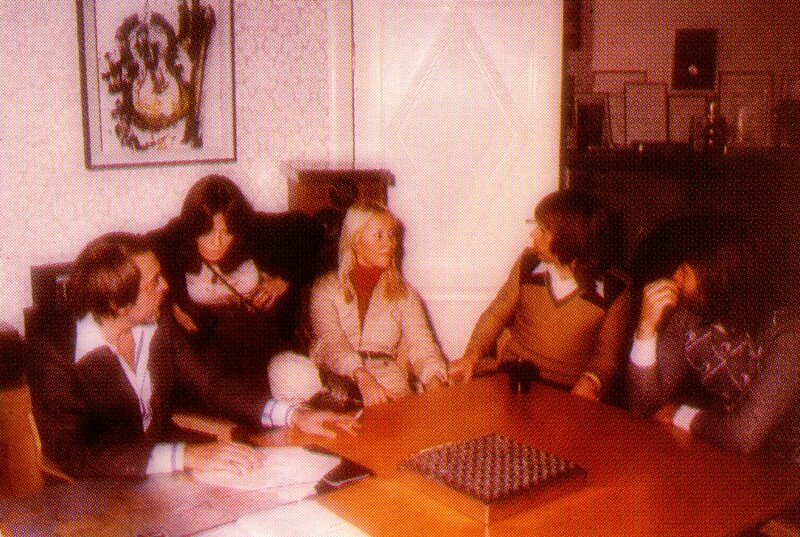 The promotion in Holland was followed by a short stay in Paris the day after (24 November). 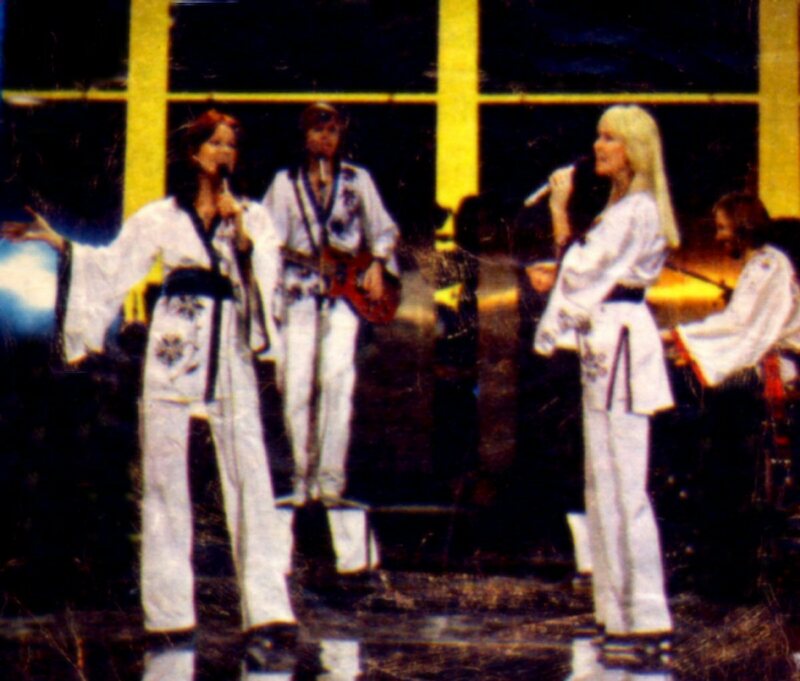 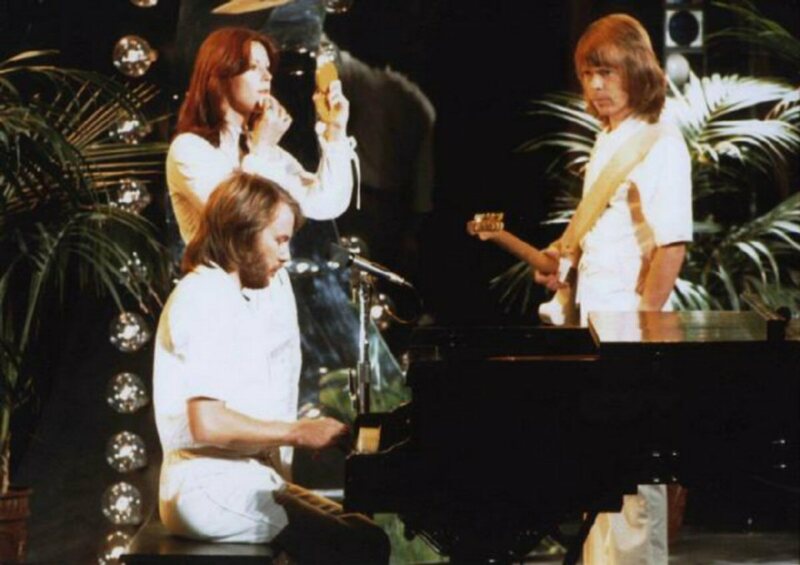 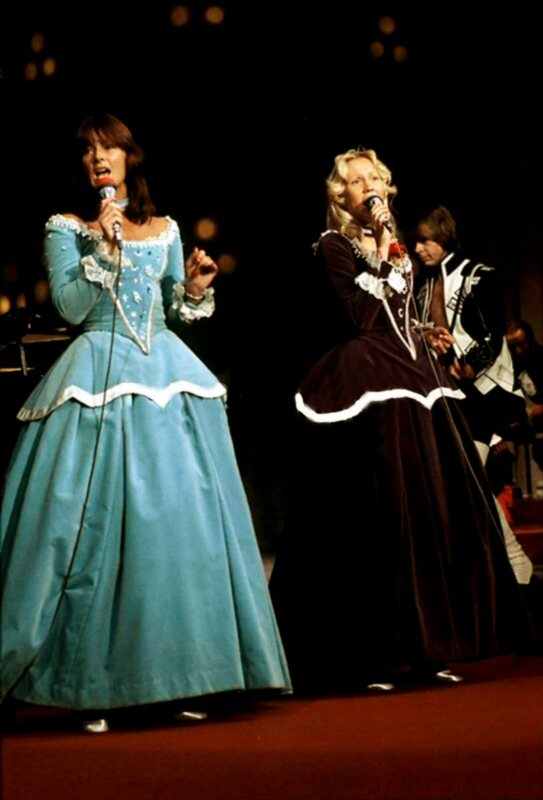 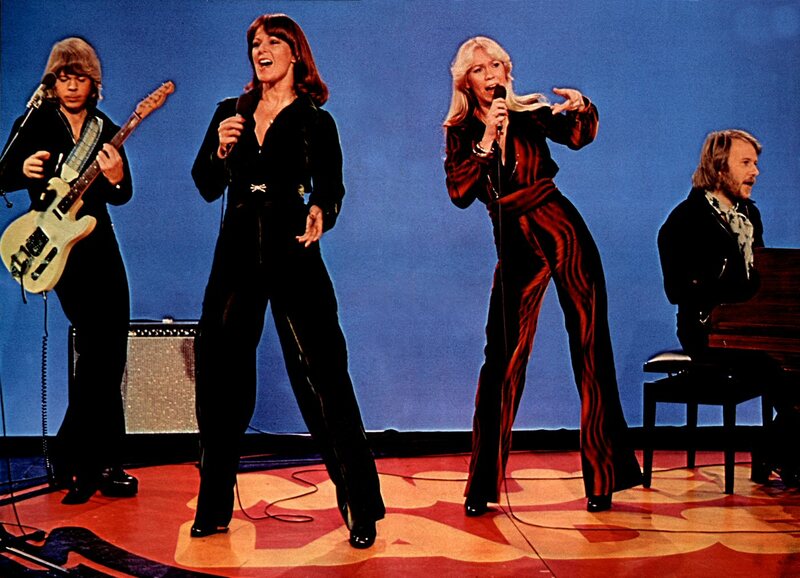 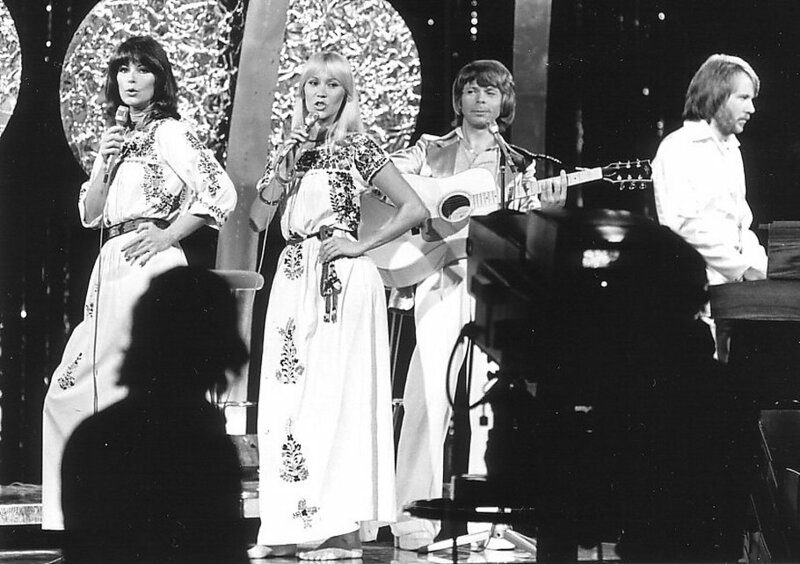 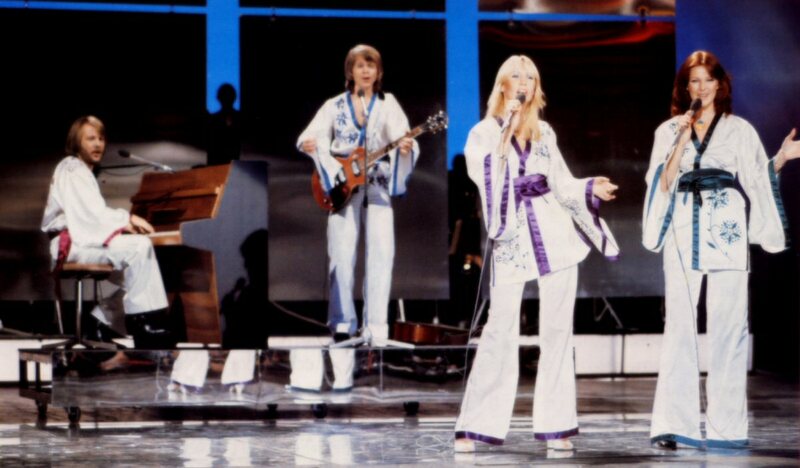 ABBA performed two songs on the TV special "Les Randez-Vous du Dimanche". 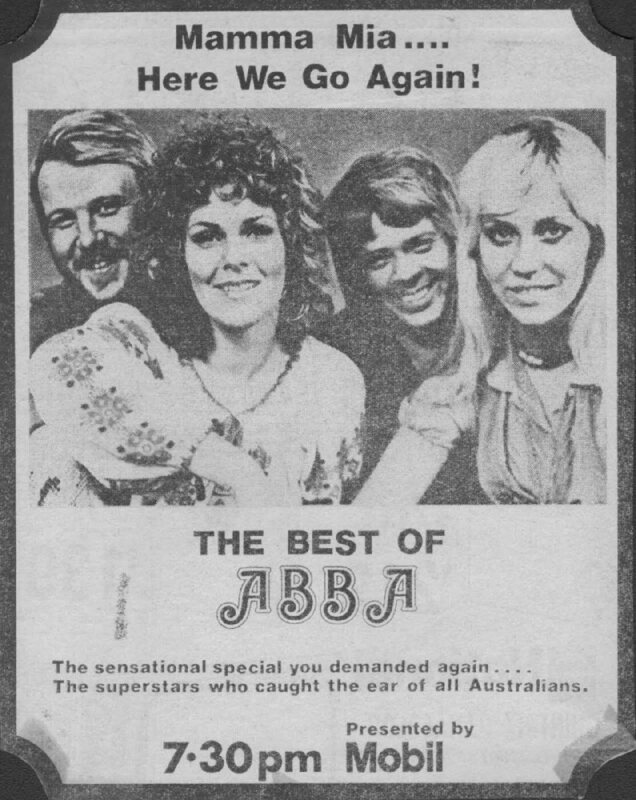 The songs were their latest single hit "Money Money Money" and "When I Kissed The Teacher". 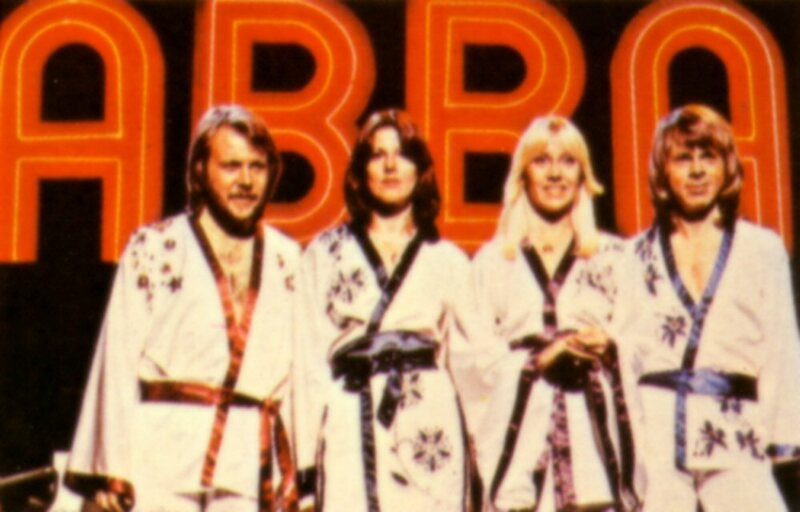 "...there was something in the air..."
After the big success of the singles "Mamma Mia" and "SOS" the album "ABBA" originally released in 1975 saw its re-release in Denmark and first release in Poland and Czechoslovakia at the end of 1976. 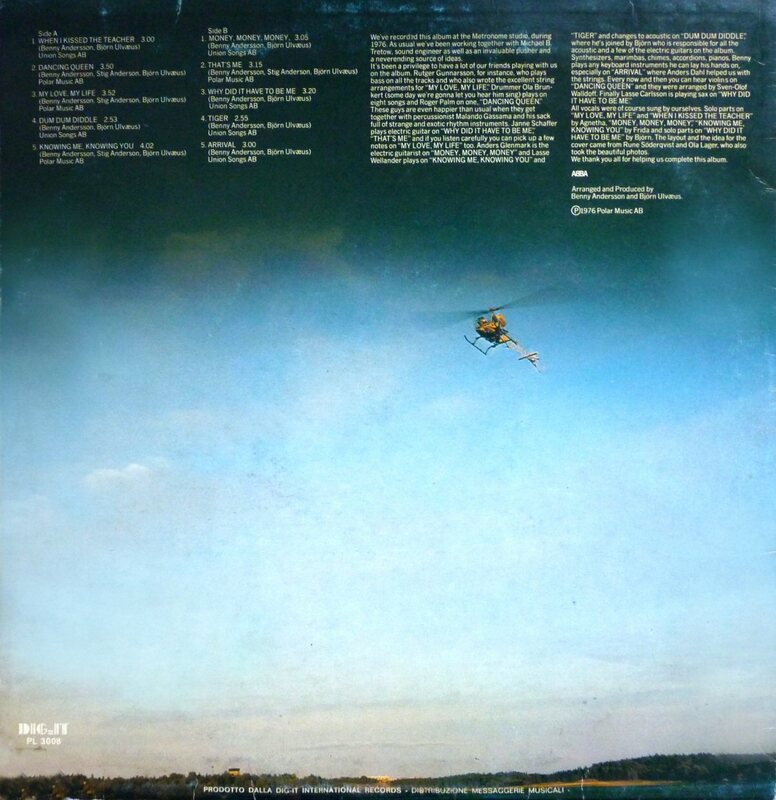 The Czechoslovakian release featured so-called note from the record company (Opus-Bratislava) on the back cover in both Slovakian and English. 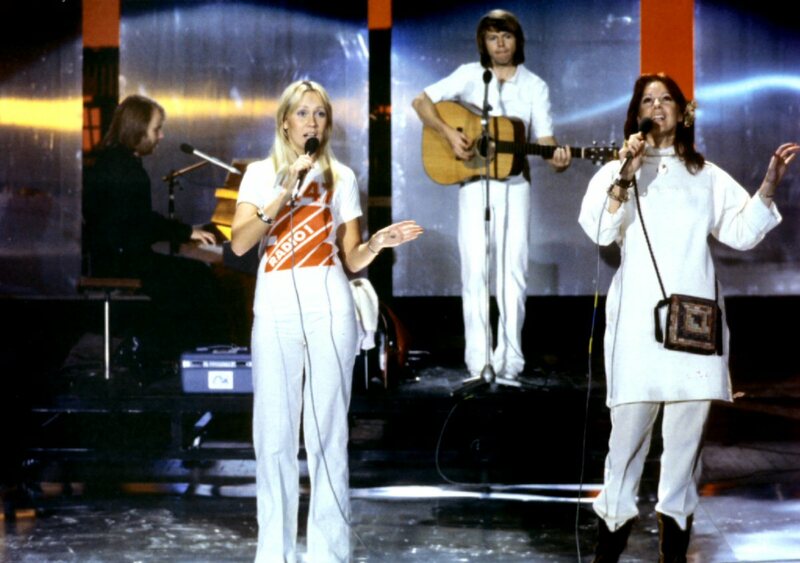 The note seemed to be partly invented as it was stated that ABBA had toured twice in Poland and in Jugoslavia. 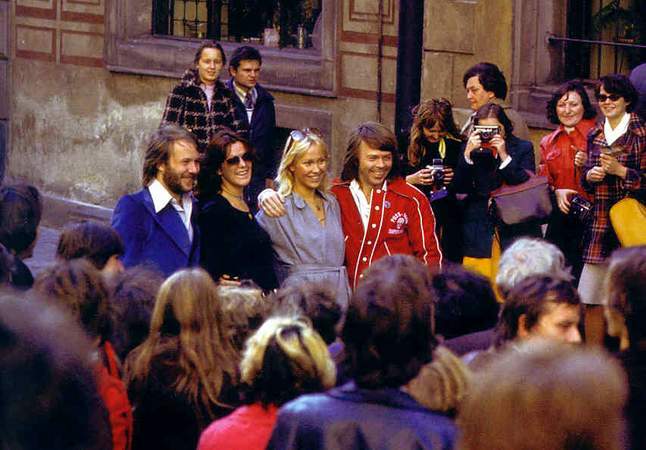 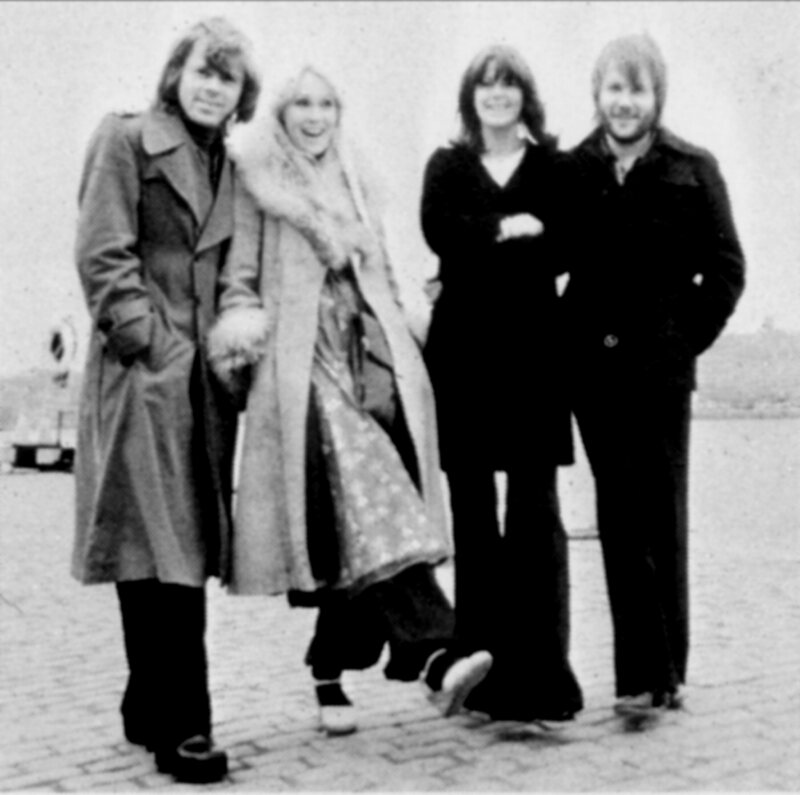 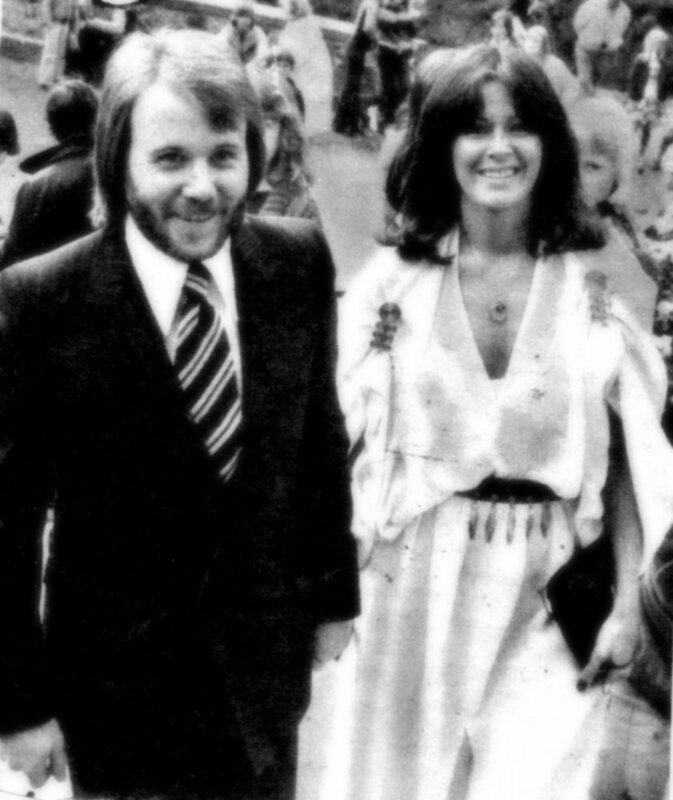 ABBA paid a short visit in Poland in October 1976 but the group had never toured there as well as they had never been in Jugoslavia. 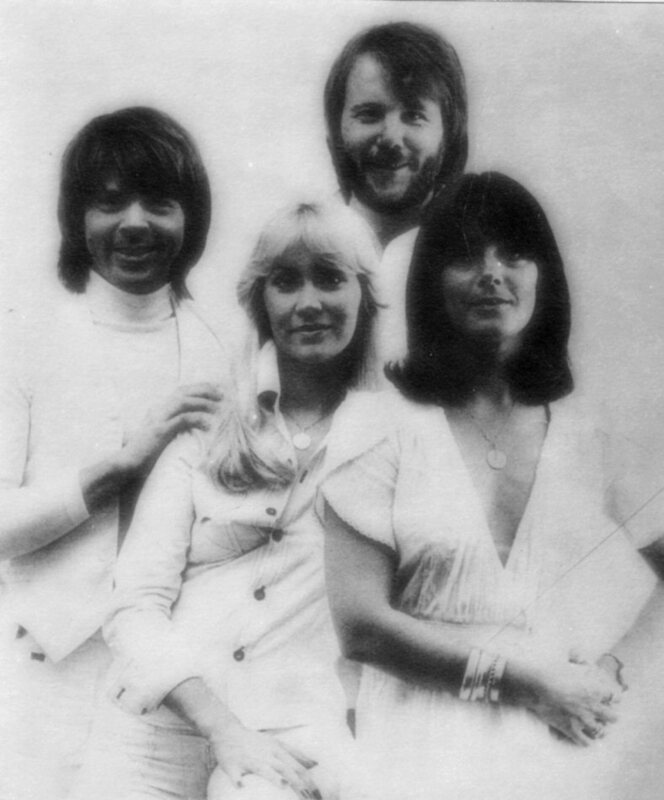 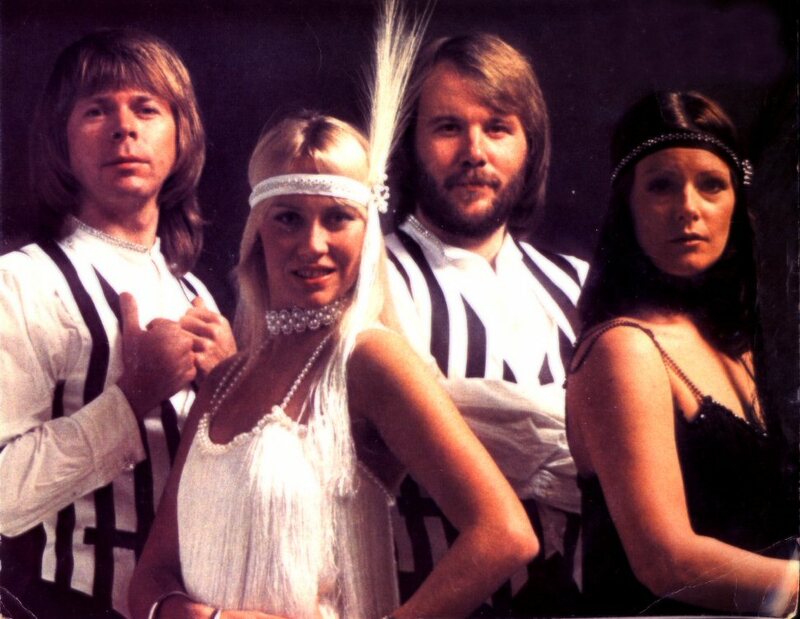 The Czechoslovakian release of the "ABBA" album featured different track listing including "Fernando" and "Dancing Queen" whilst "Intermezzo No. 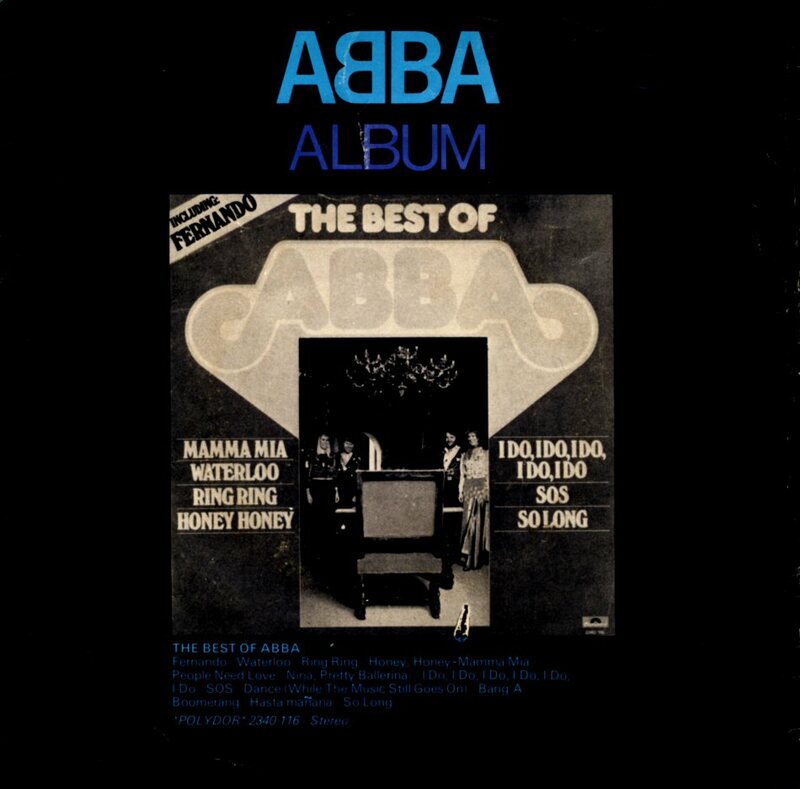 1" was omitted. 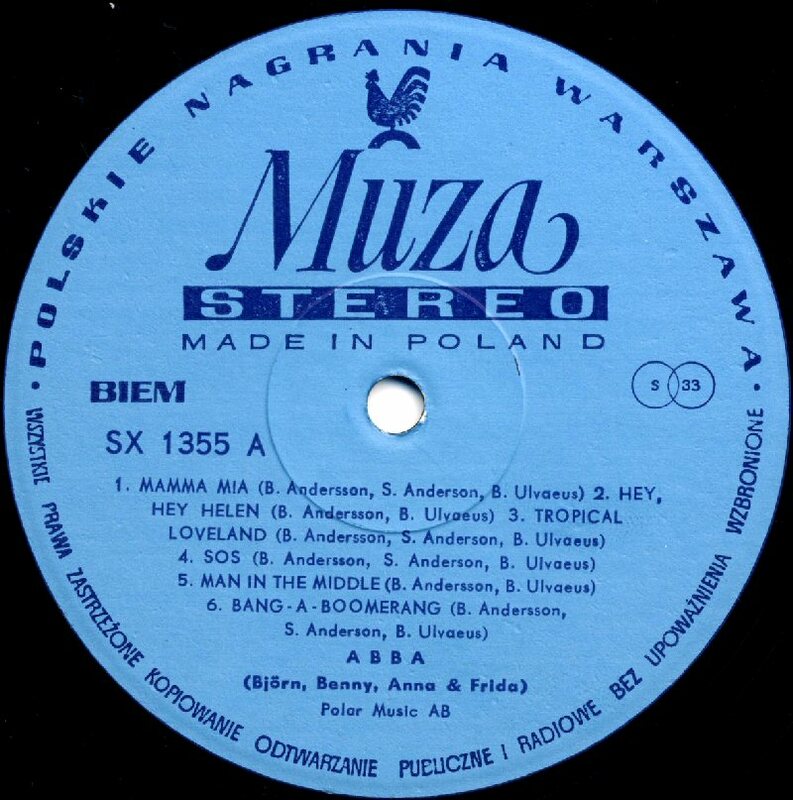 The Polish version had the original track listing but the lay-out was partially changed. 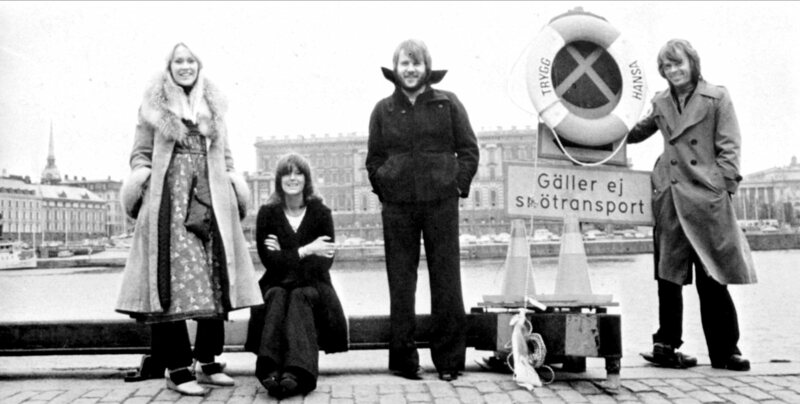 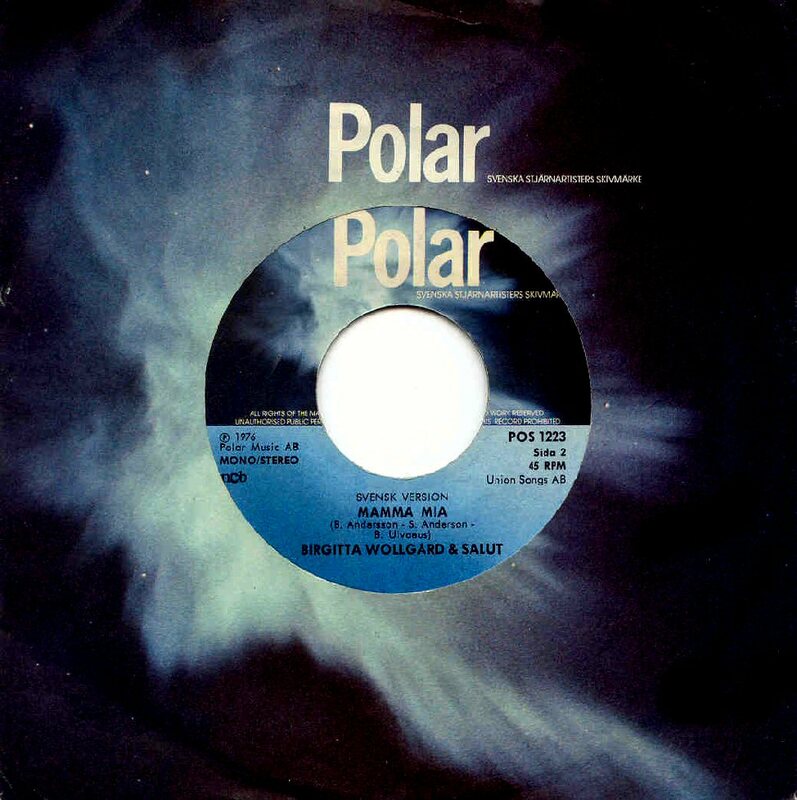 Even Polar in Sweden re-released the album "Abba" in 1976. 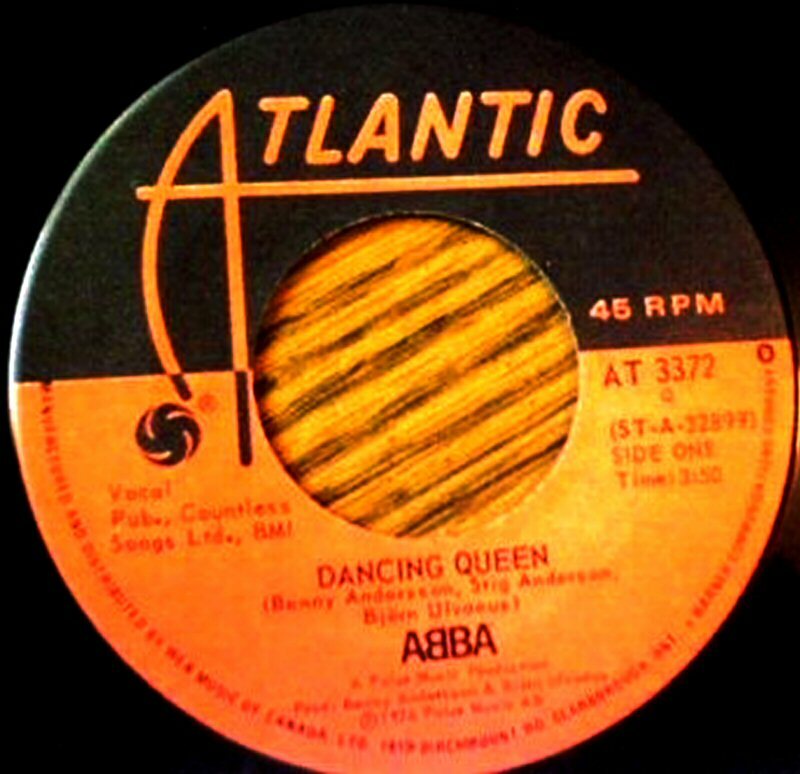 At the beginning of December 1979 the single "Dancing Queen" released by Atlantic entered the US chart where it stayed for 22 weeks reaching #1. 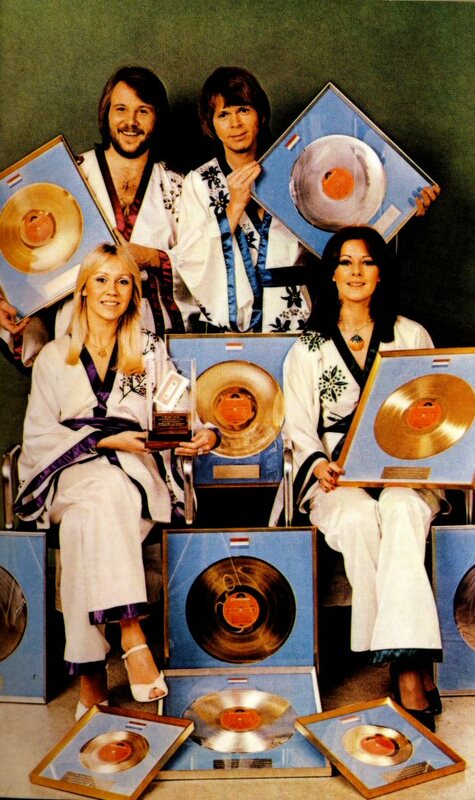 It was the only number 1 ABBA single in USA ever. 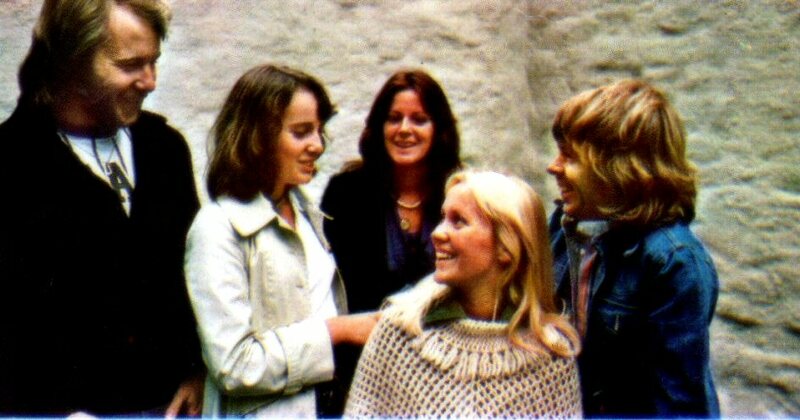 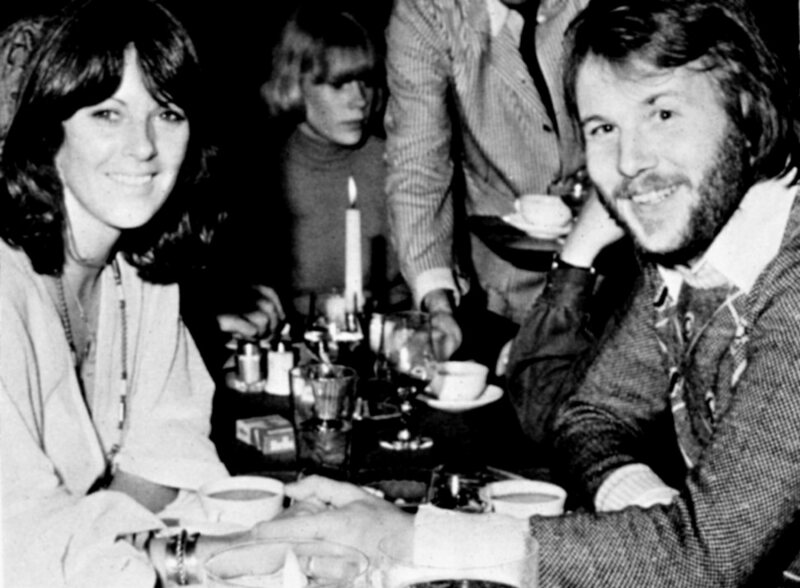 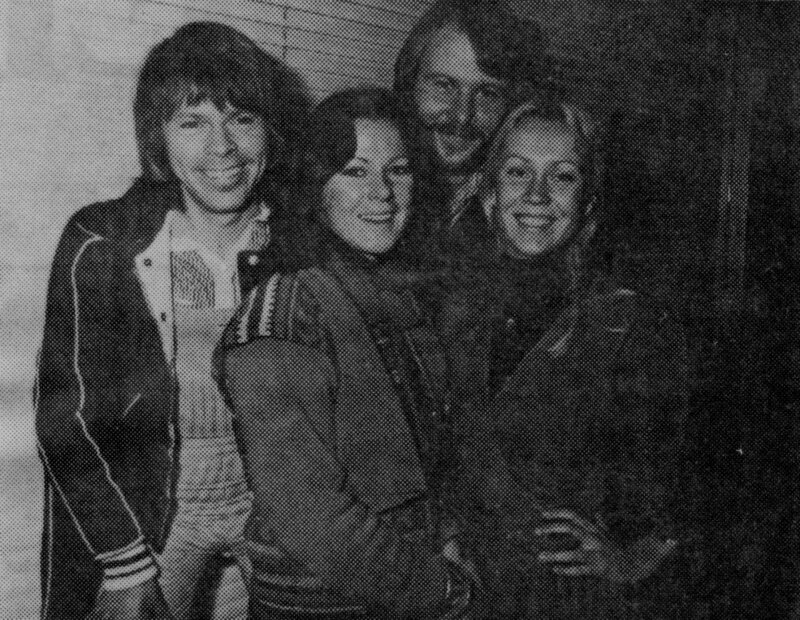 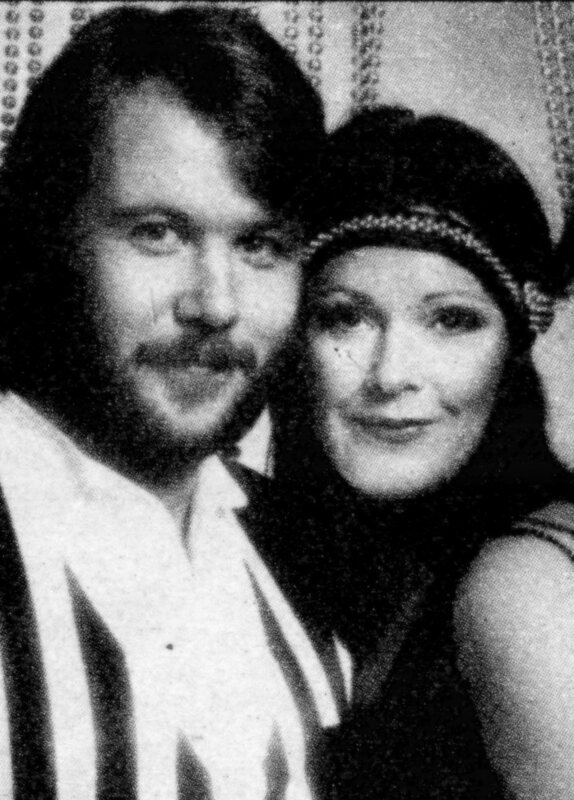 Just before Christmas 1976 ABBA and Stikkan gave several interviews for journalists from Sweden and all over the world. 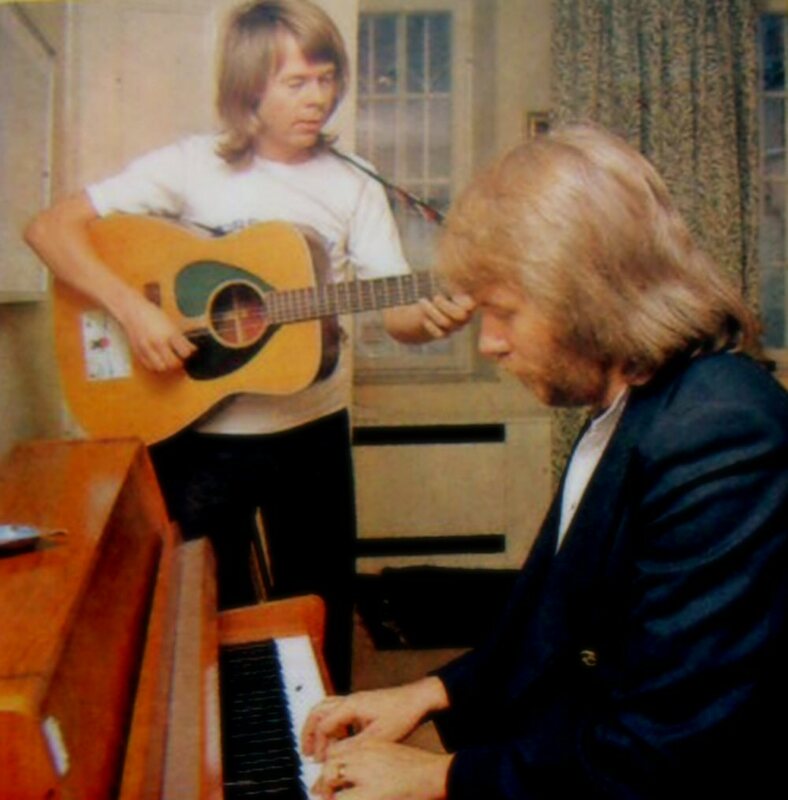 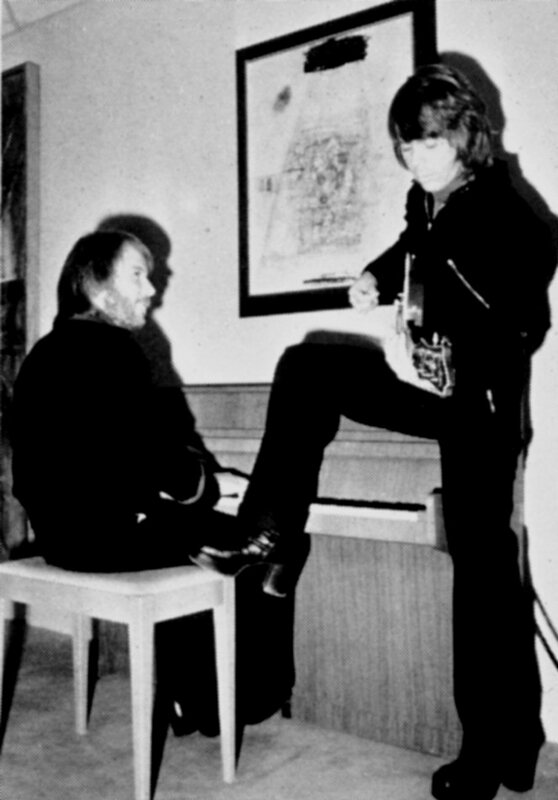 Björn and Benny performed for the very first time in public "Thank You For The Music" on piano and guitar. 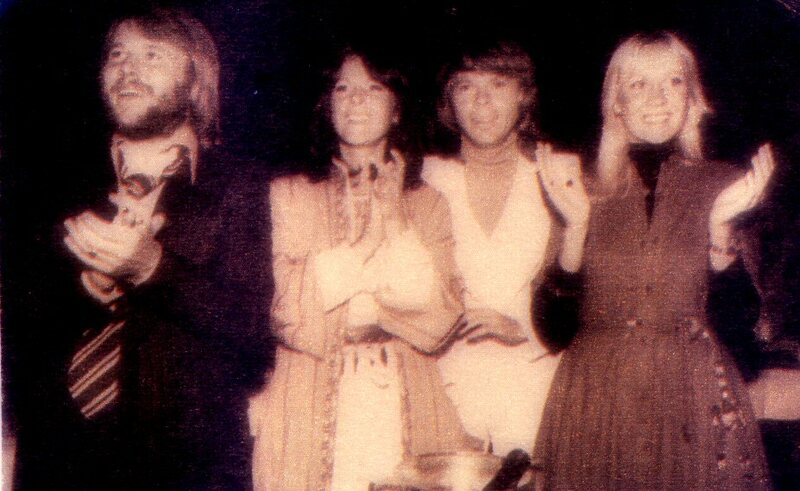 The group posed for pictures. 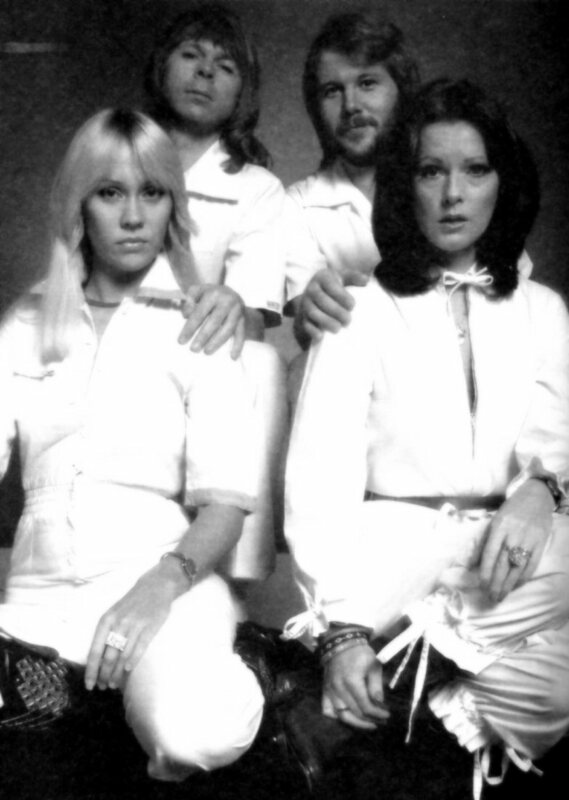 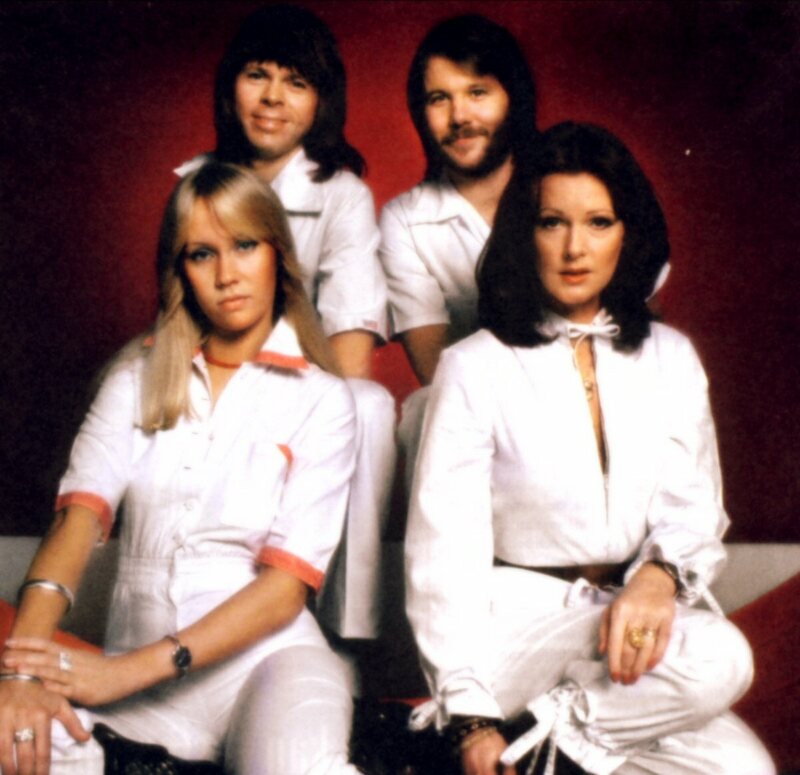 ABBA became the group of the year 1976 according to the verdict of the "Stable-companions society". 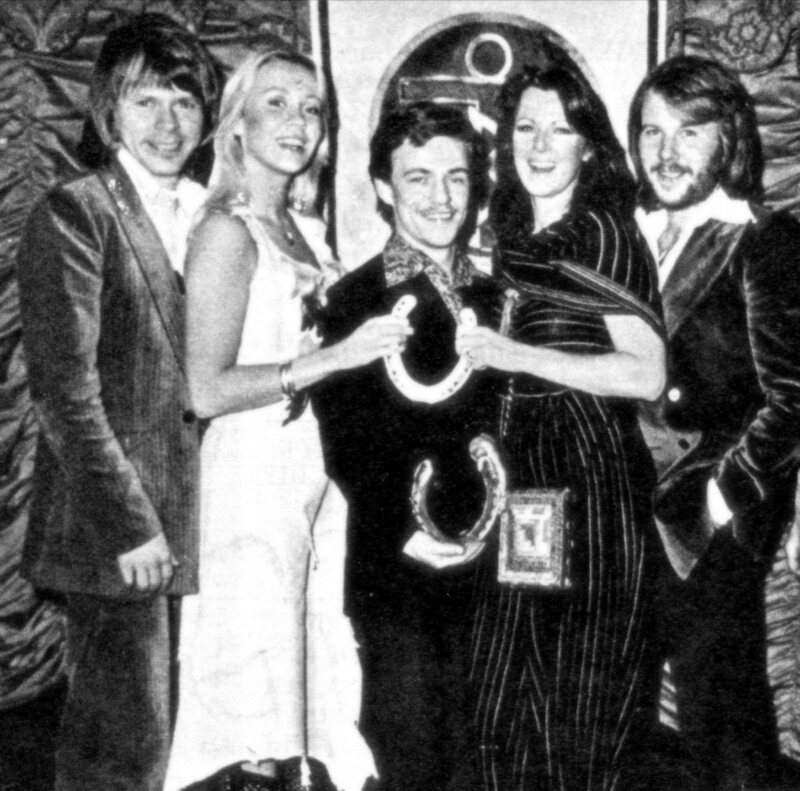 The group was awarded with a silver horseshoe on a special ceremony at Berzelliterrassen in Stockholm in December 1976.